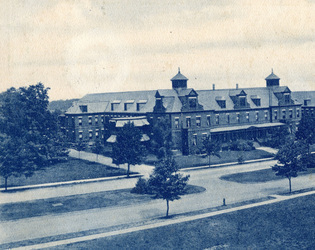 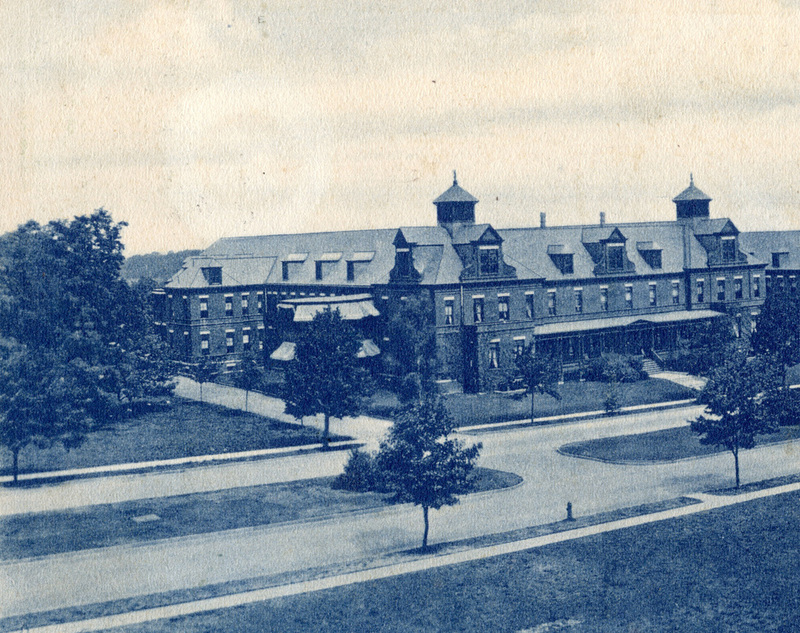 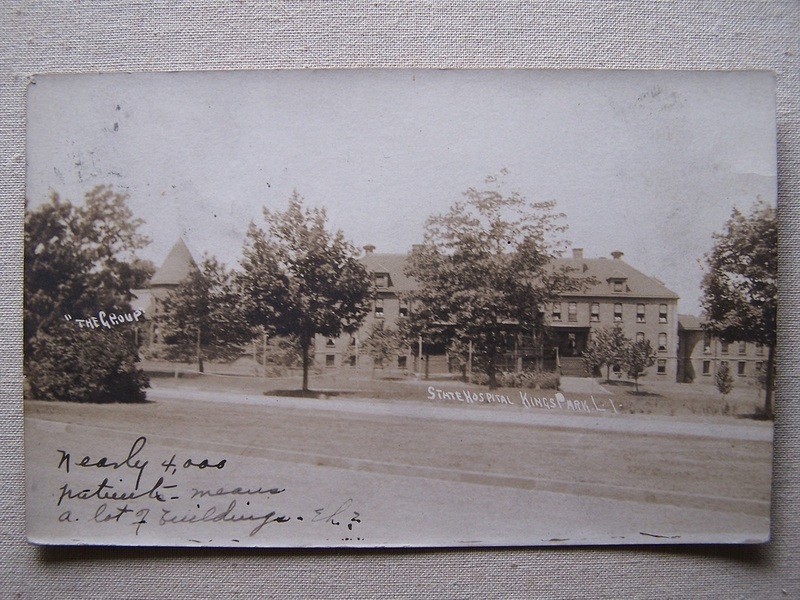 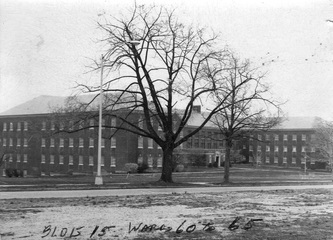 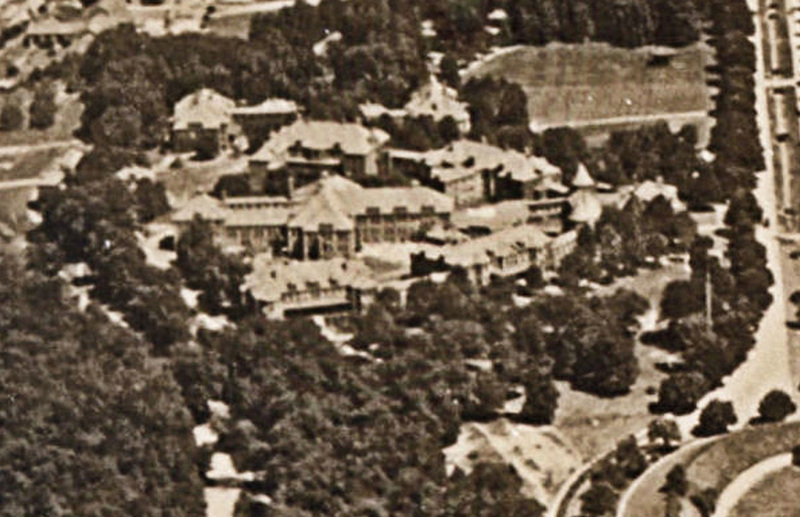 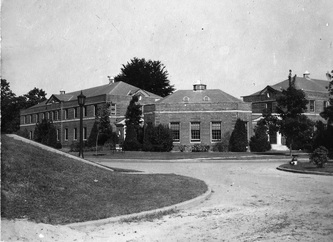 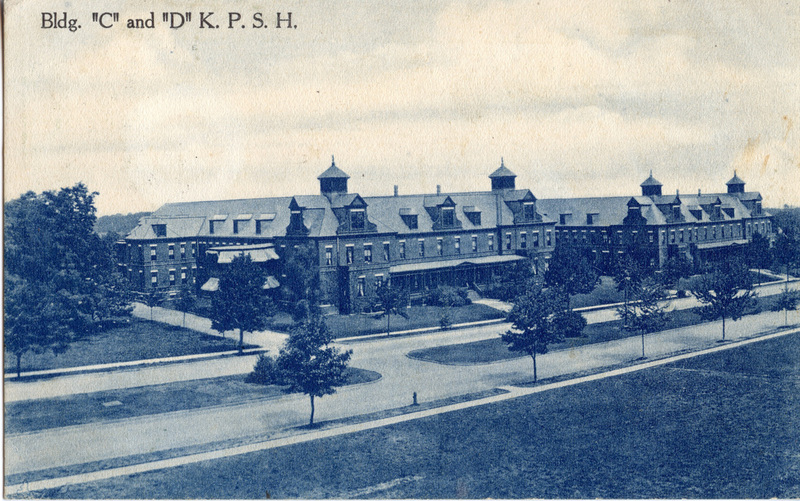 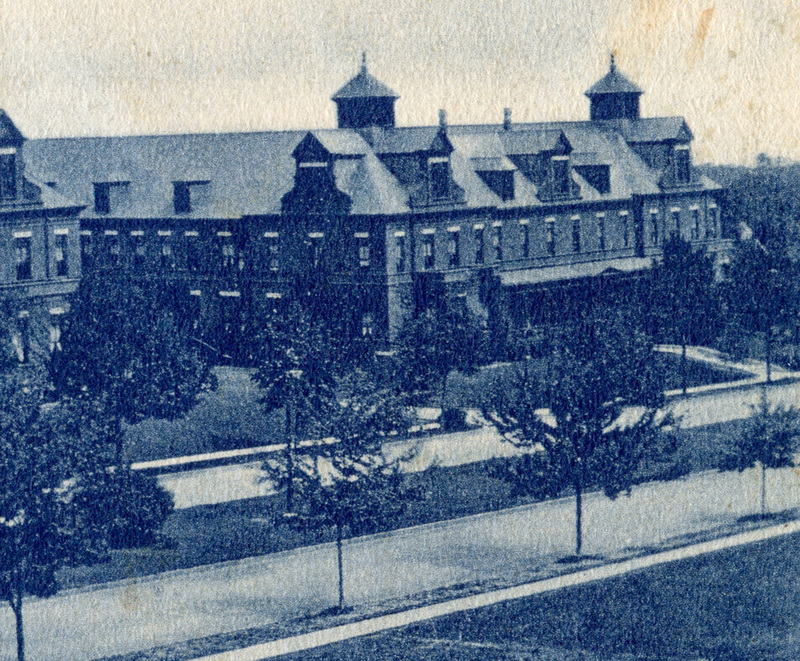 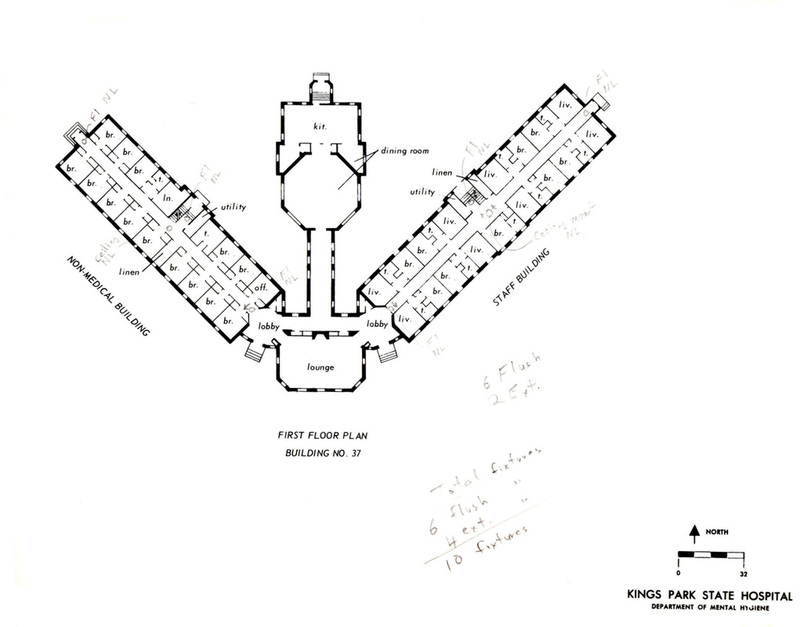 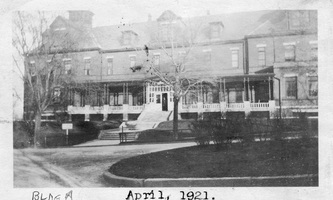 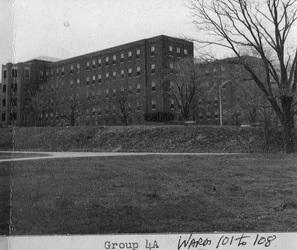 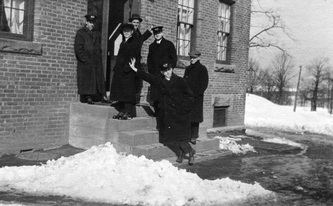 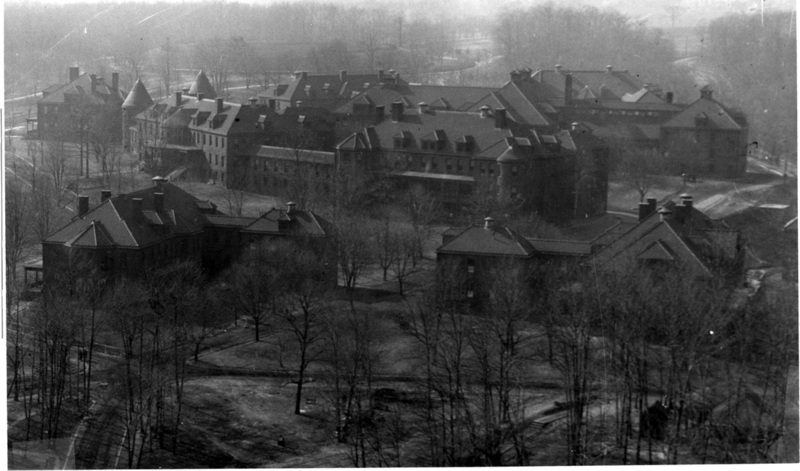 The buildings of Group 1 were the first large patient buildings added to the hospital, built in the Kirkbride tradition during the late 1890s. 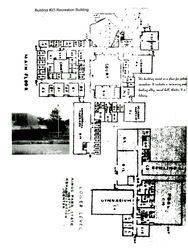 Together they represented the building number designations of 4A-4J. 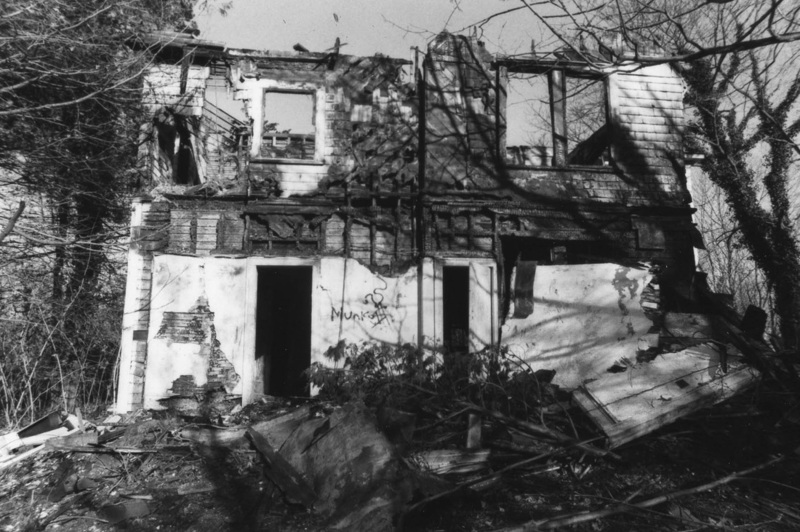 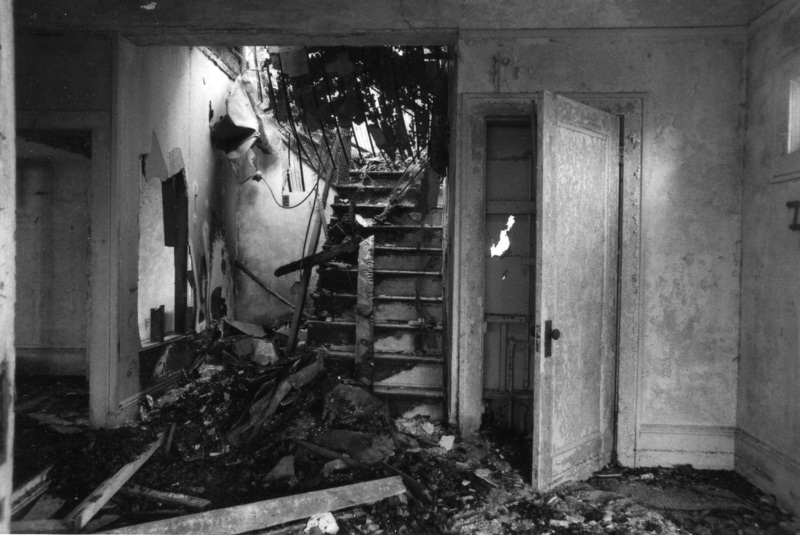 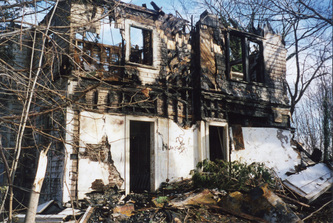 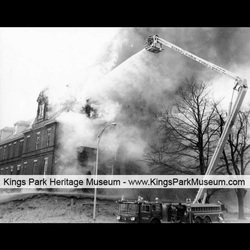 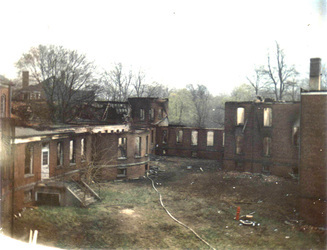 After being abandoned they were destroyed by arson & demolished during the mid-1970s. The oldest 3 buildings of this group were built between 1912-1915, while Building 40 was later added in the 1930s. 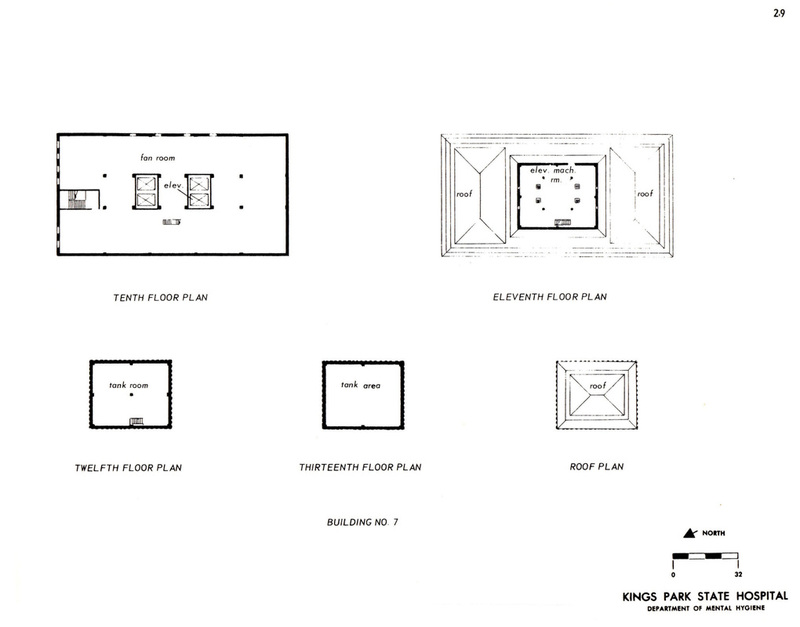 In the beginning they represented Buildings 54A-54C. 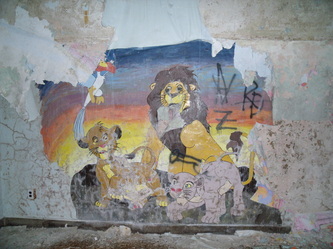 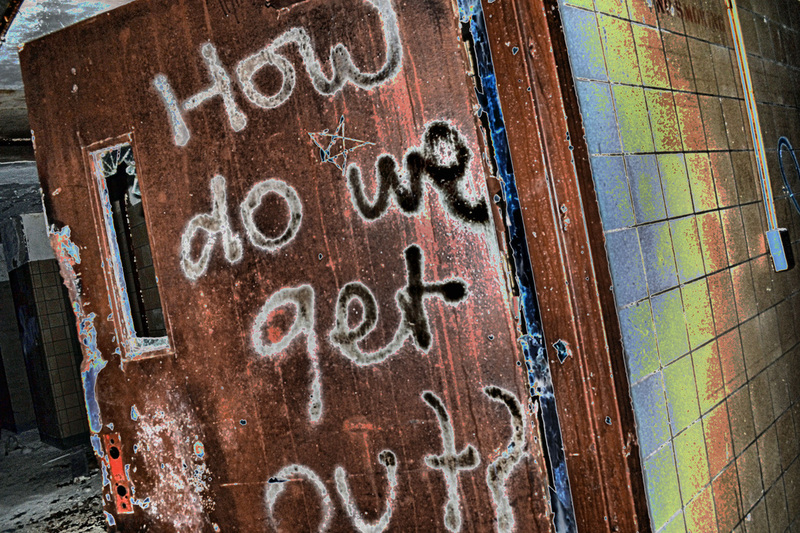 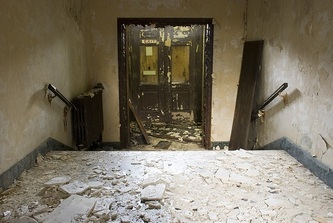 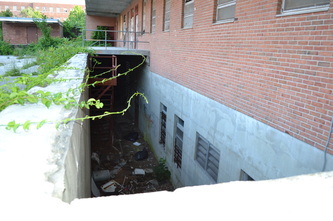 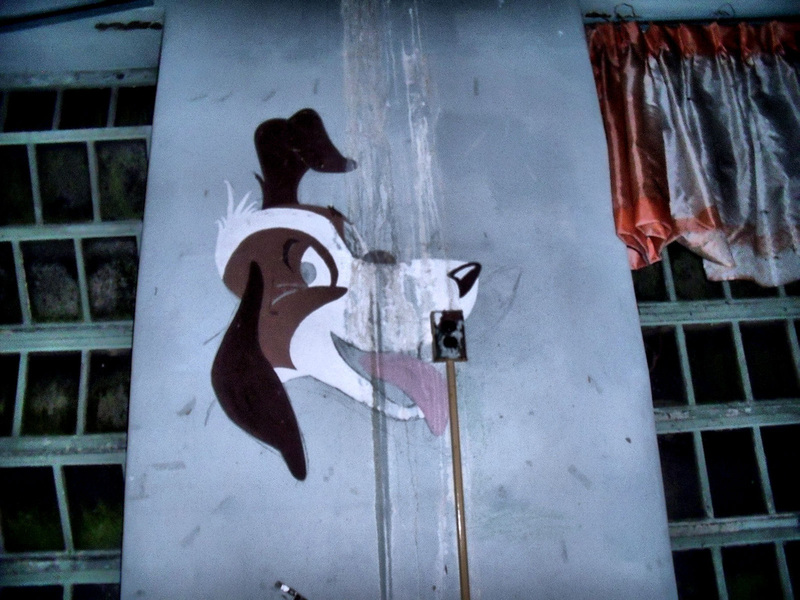 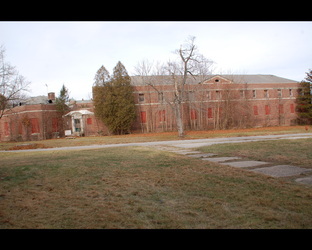 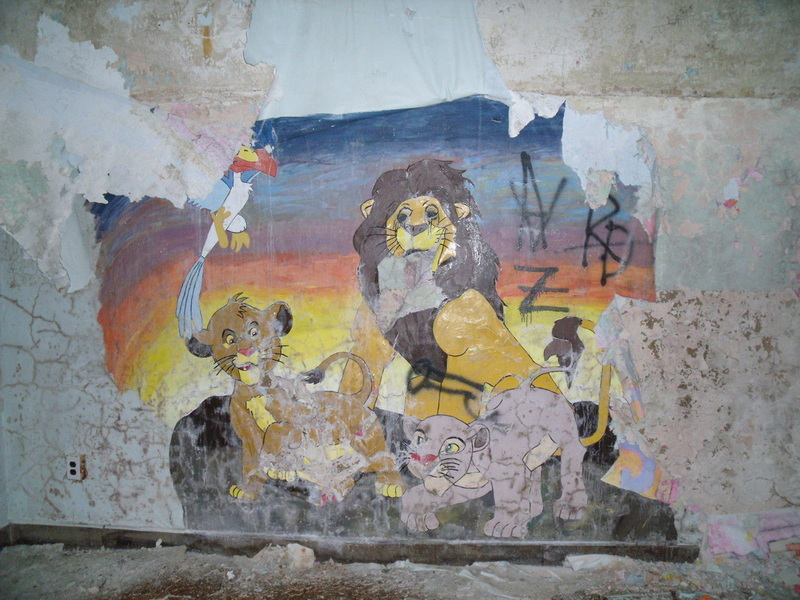 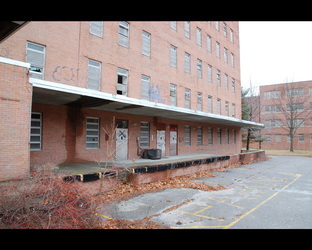 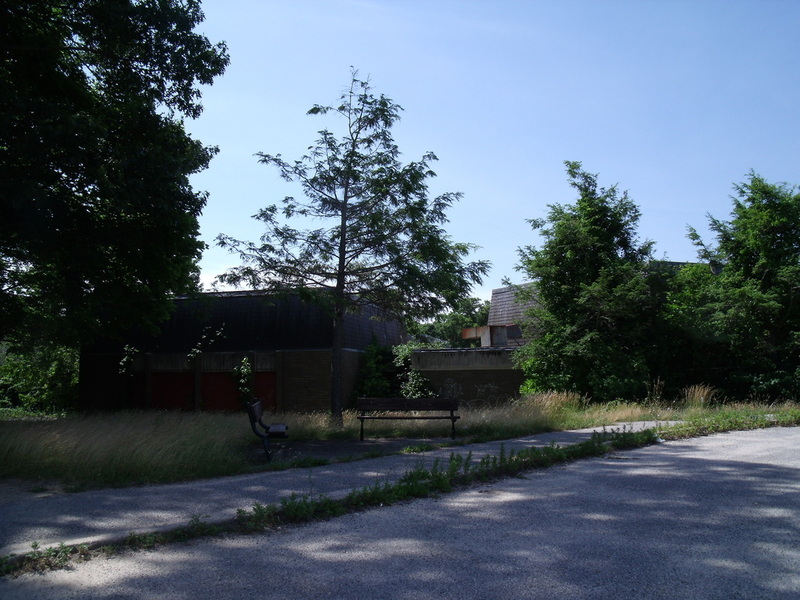 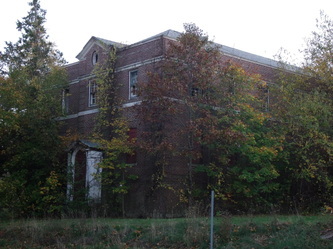 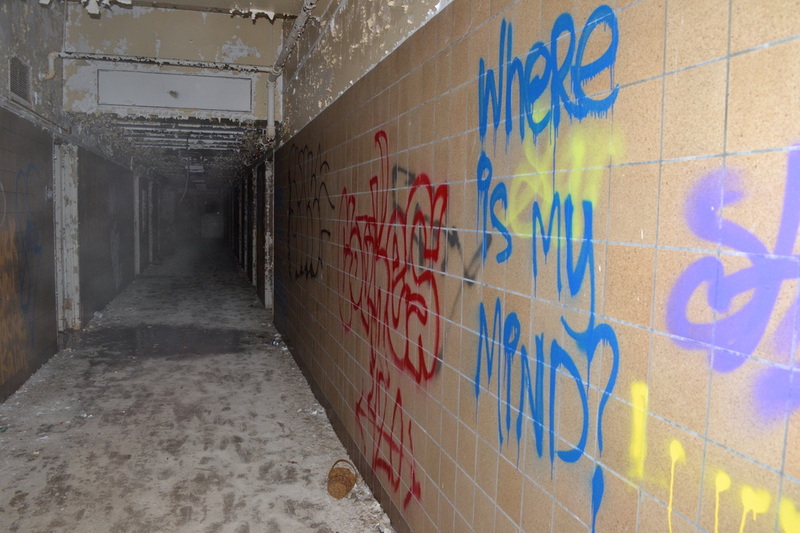 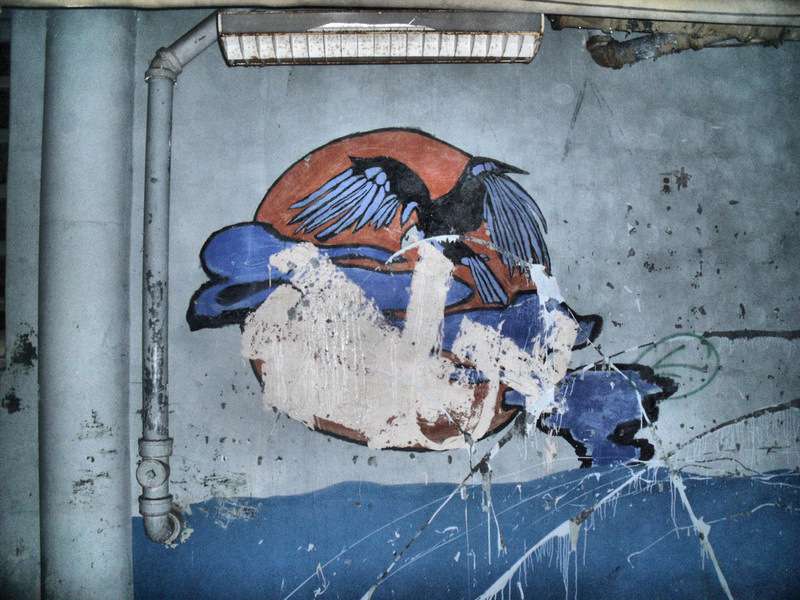 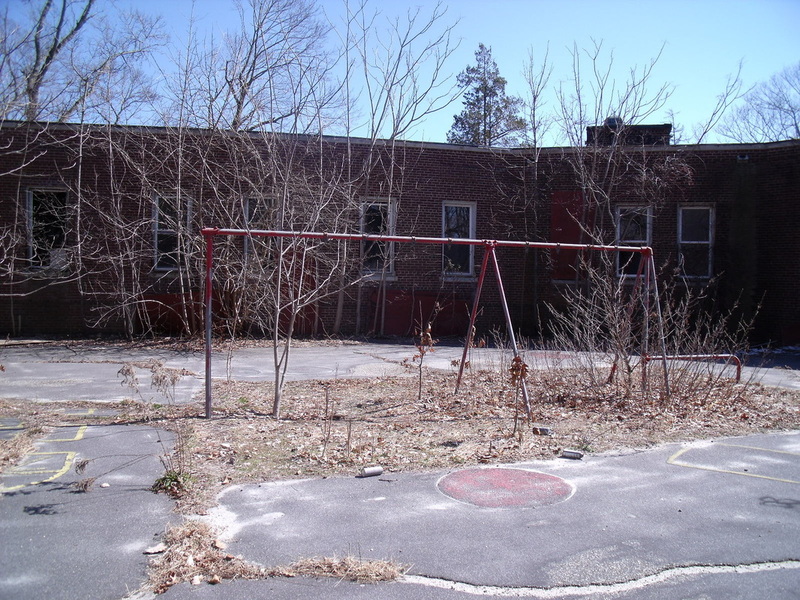 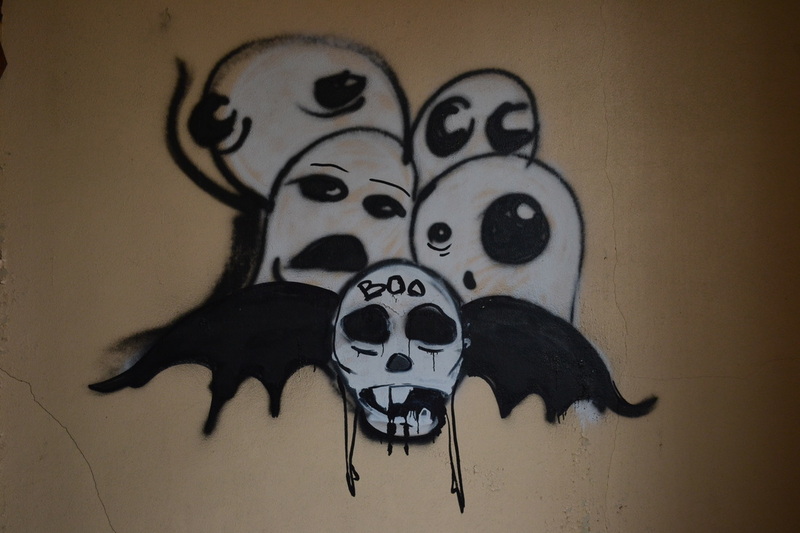 Originally used for adolescents, it later became the Mental Retardation Unit before being abandoned. 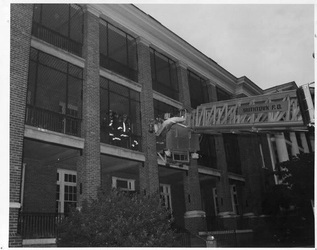 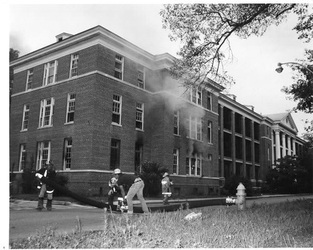 Building 124 was demolished in the mid-1990s after being destroyed by a fire. The majority of this group was built between 1910-1912. 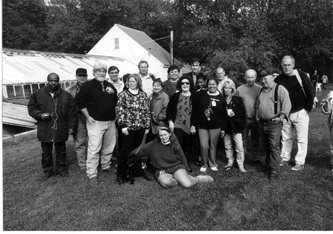 Only half of this group remains now. 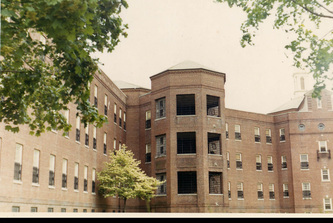 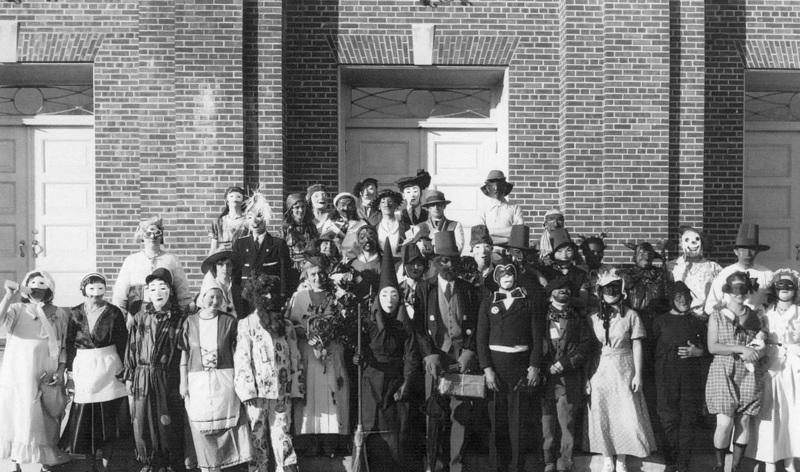 The group was incorporated into the veterans' group once that group was established during the mid-1920s & Building 136 was added. 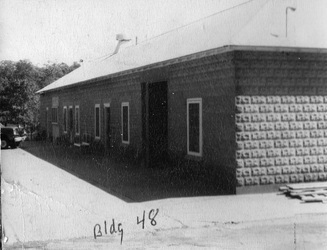 The original Group 4 was actually a series of long cottages used as tuberculosis wards located almost in the same spot as the current Group 4. 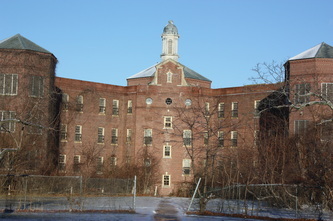 It housed wards 60-62. 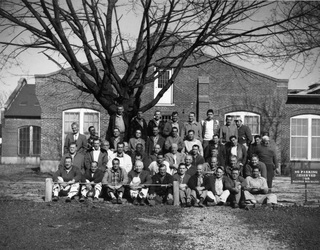 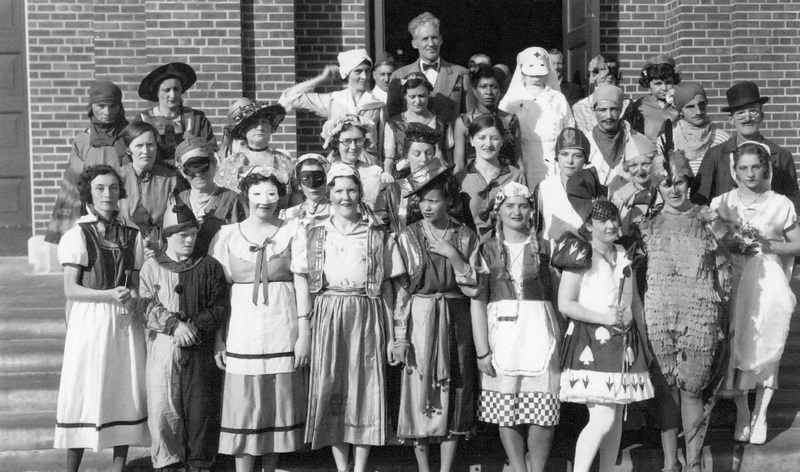 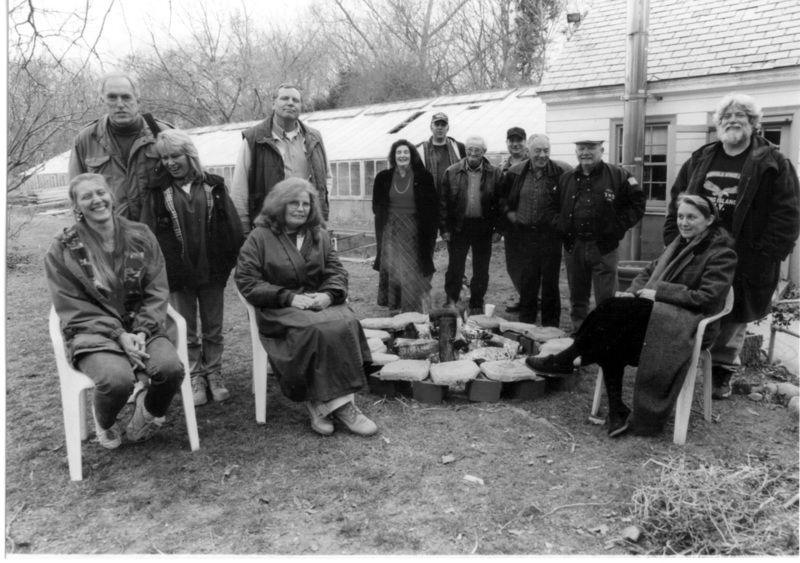 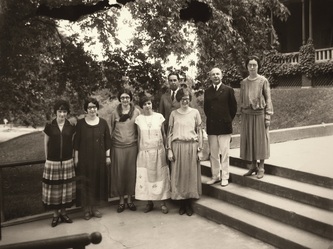 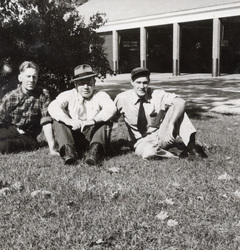 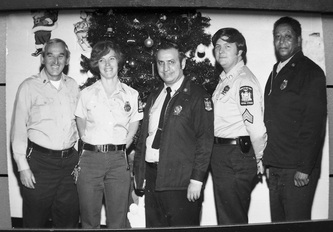 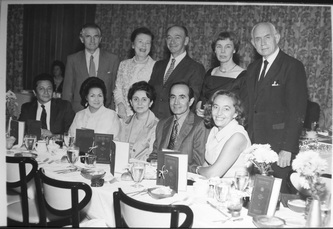 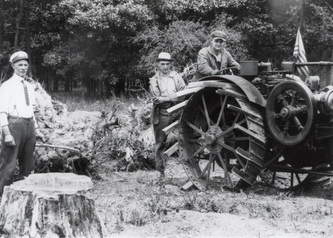 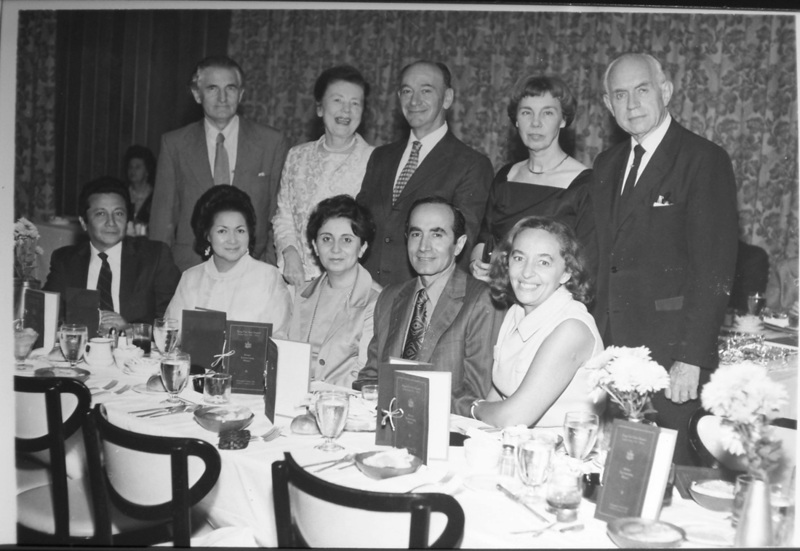 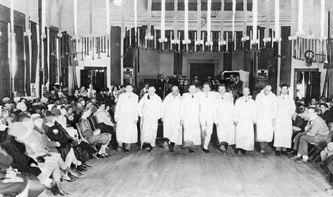 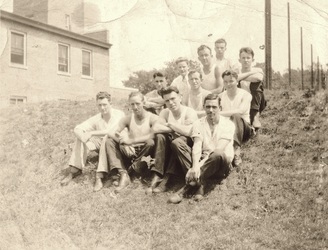 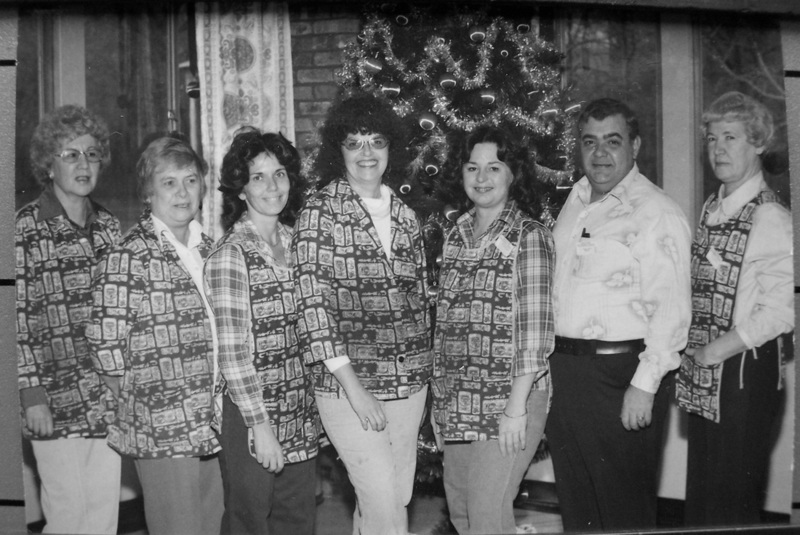 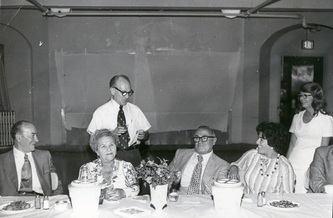 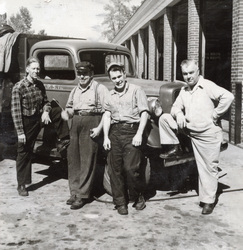 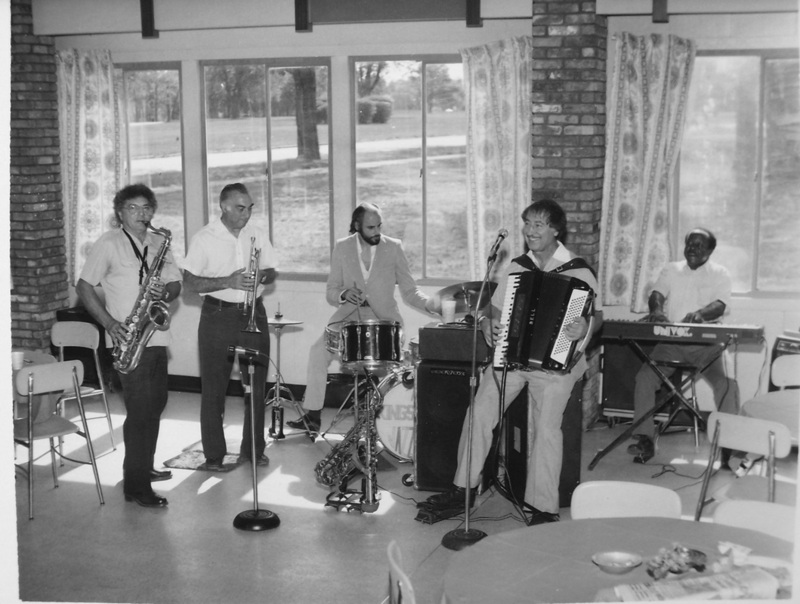 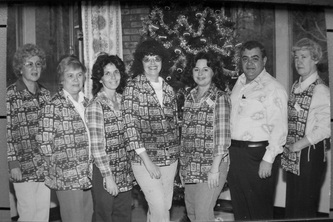 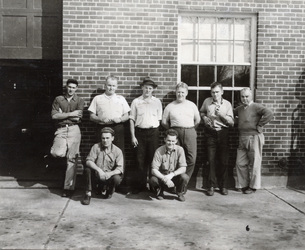 This group replaced the original Group 4 during the late 1930s. 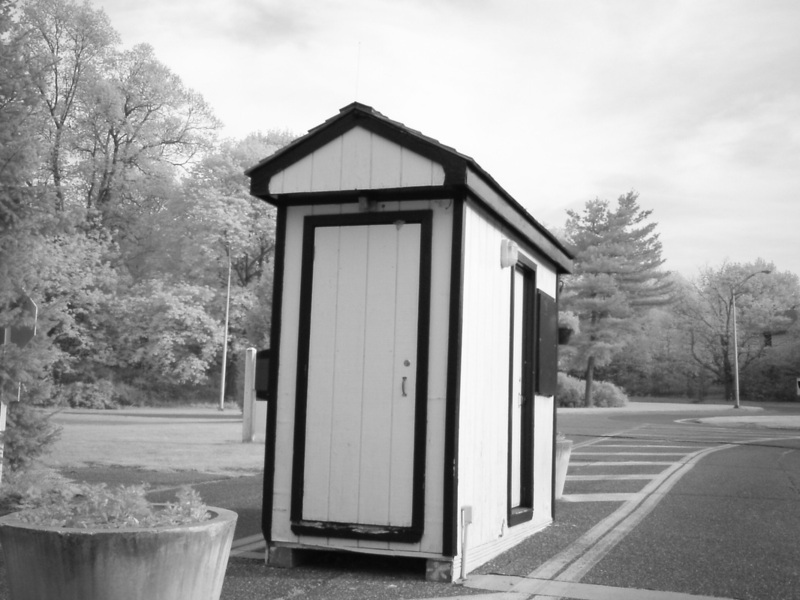 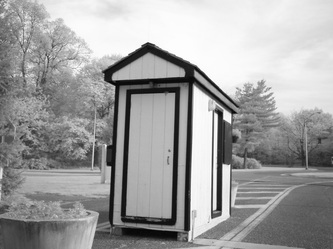 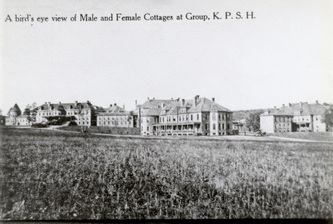 Used to house female patients it has become more commonly known as "The Quad." 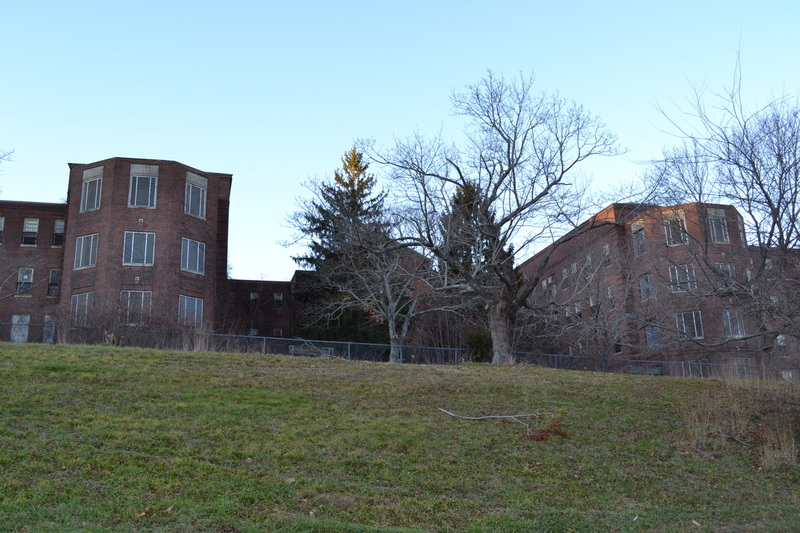 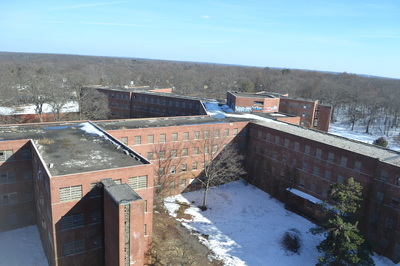 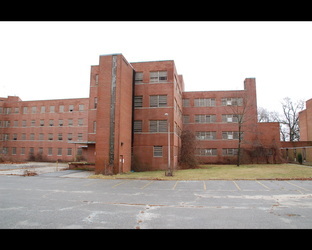 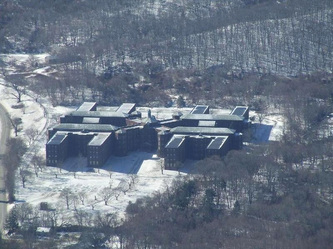 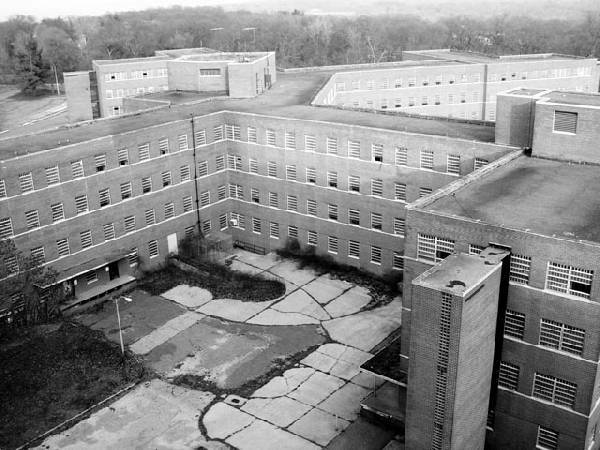 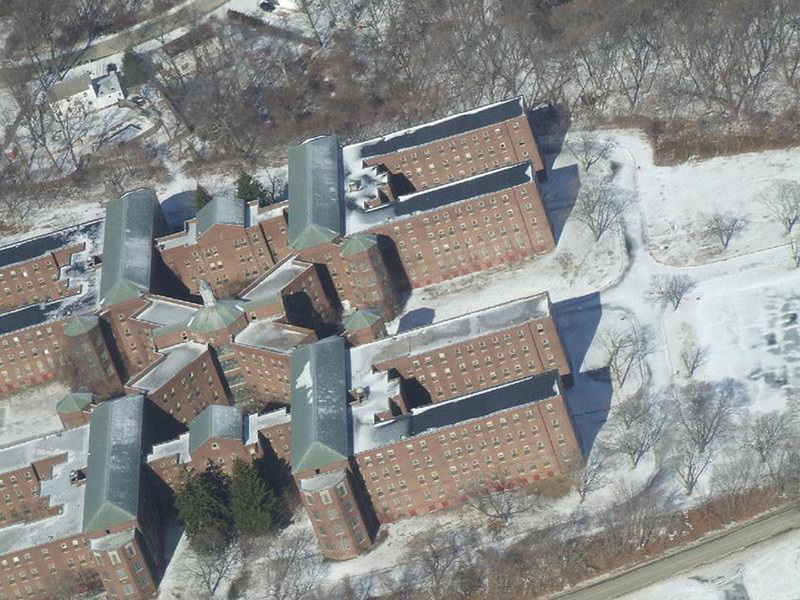 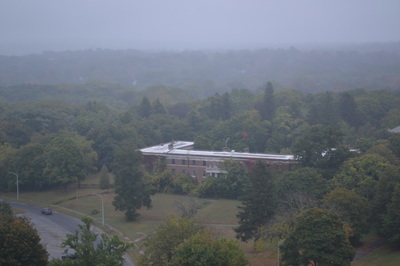 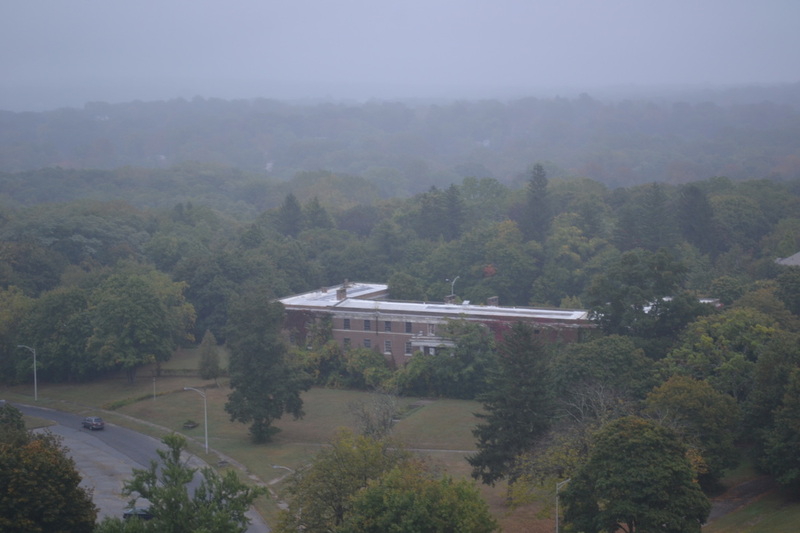 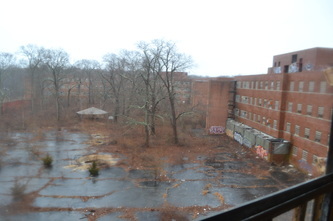 Building 1 of this group was the only building still used to house mental patients until late 2012, while Building 2 was demolished in the mid-1980s & Building 3 stands abandoned. This group of 4-story cottages was added to ease the population problem during the late 1890s. 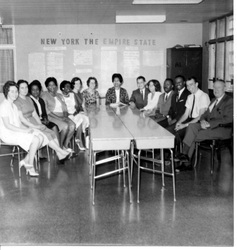 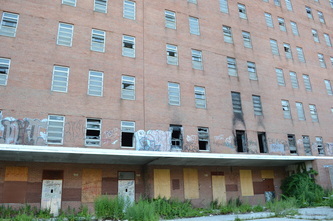 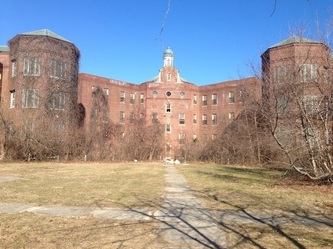 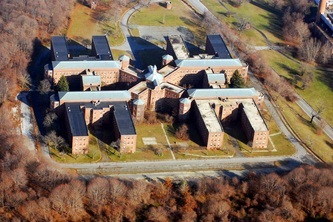 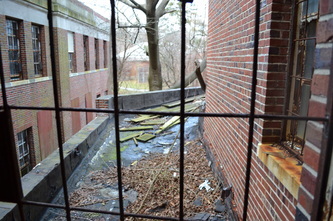 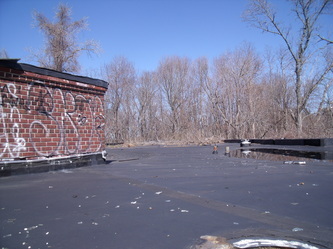 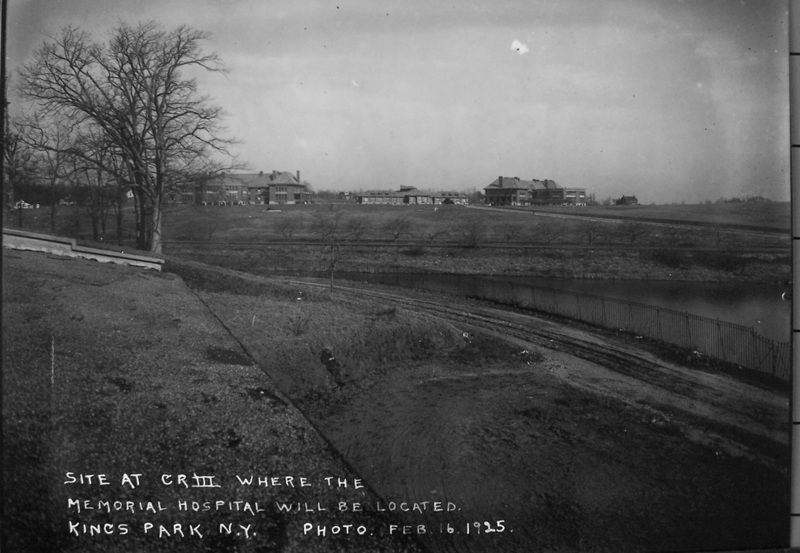 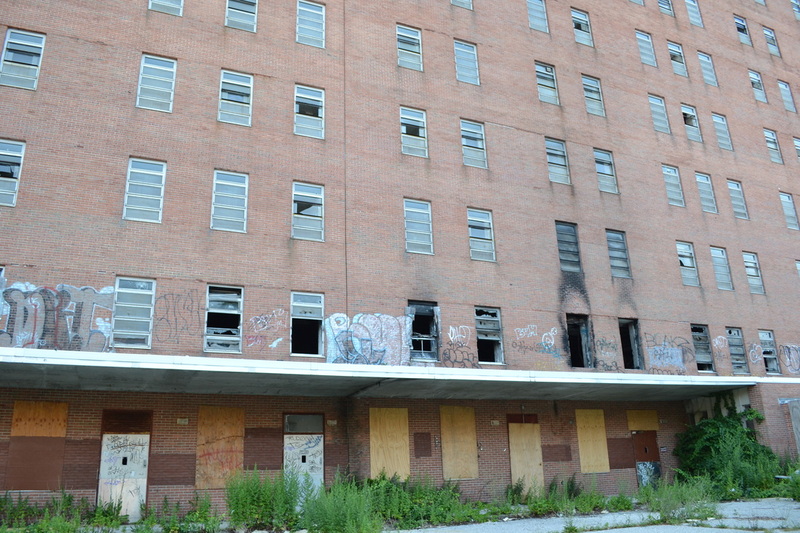 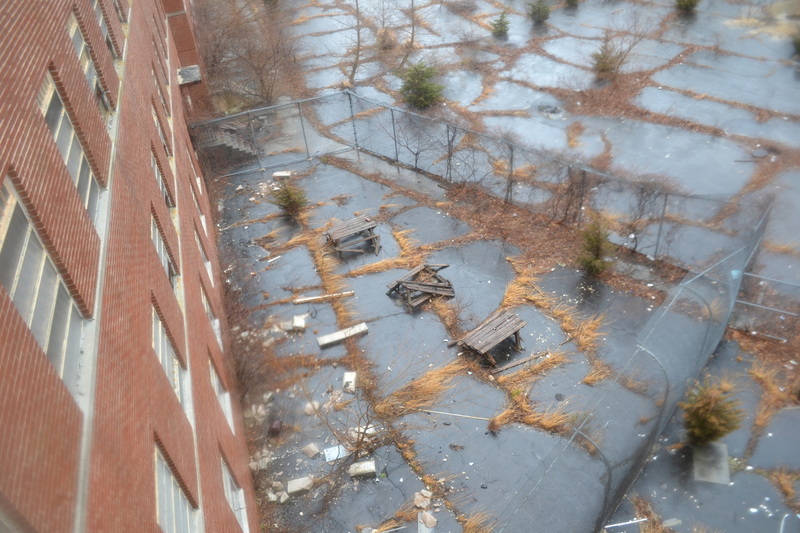 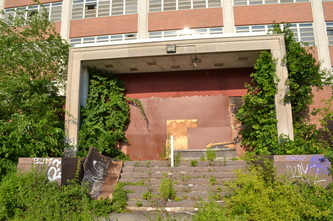 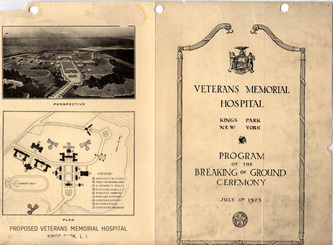 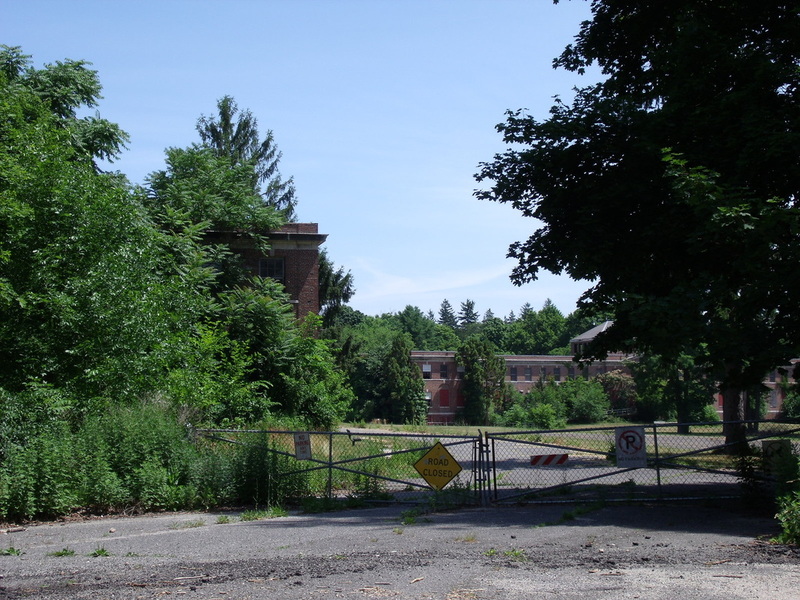 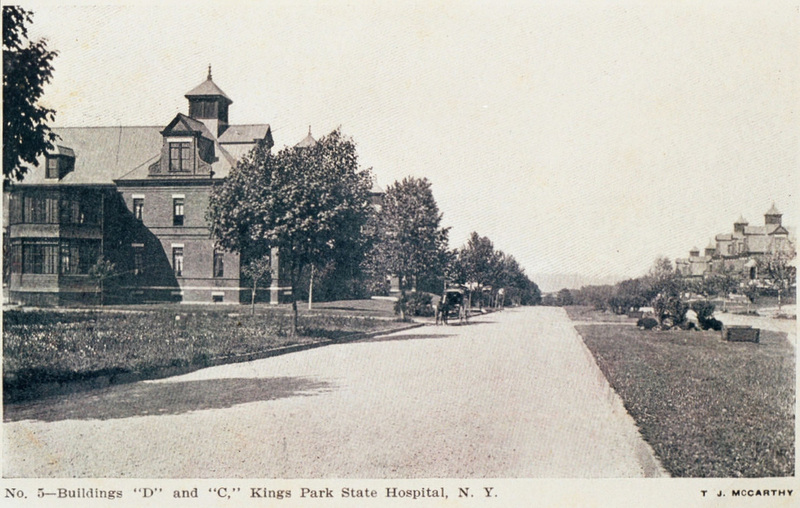 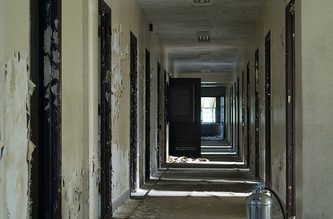 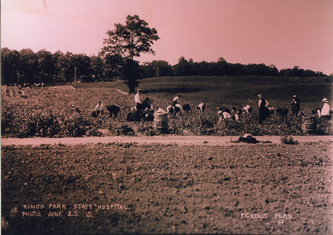 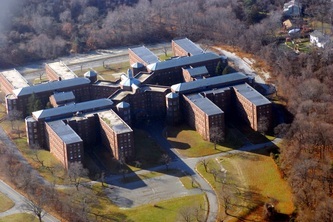 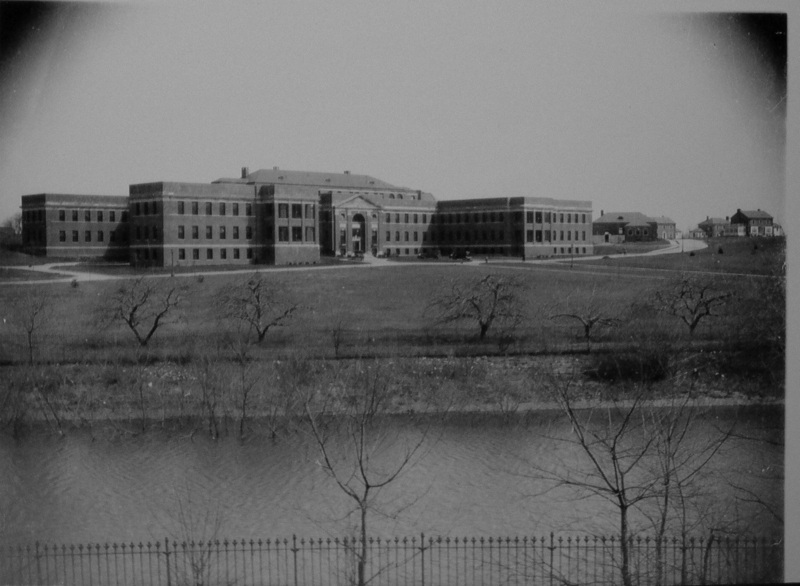 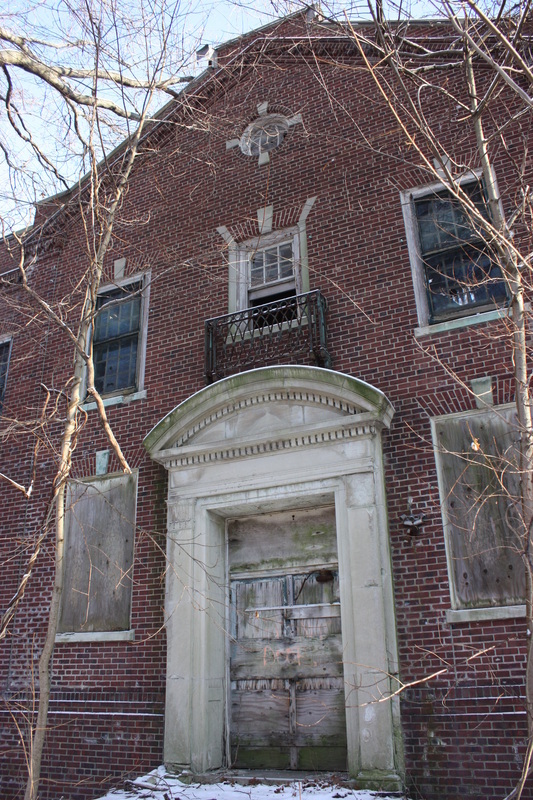 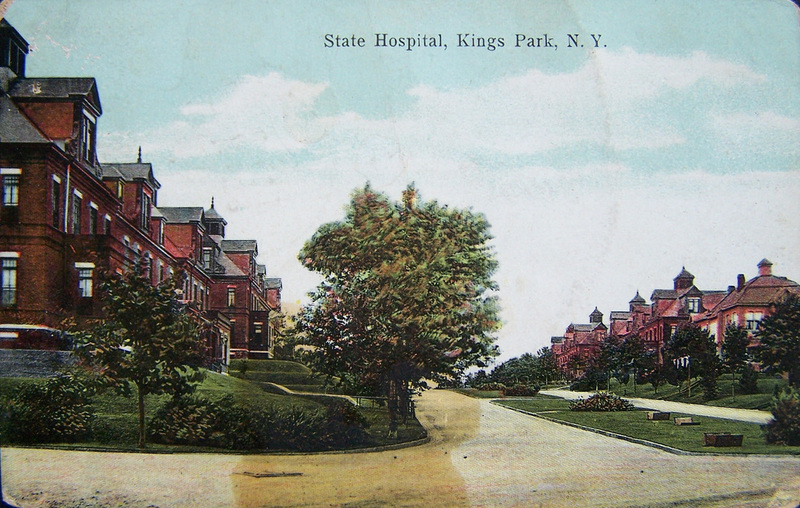 Construction was started by Kings County, but completed by the State of New York after the hospital was taken over by the state. 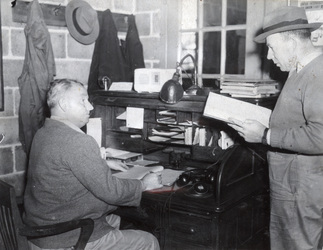 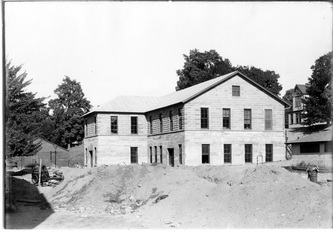 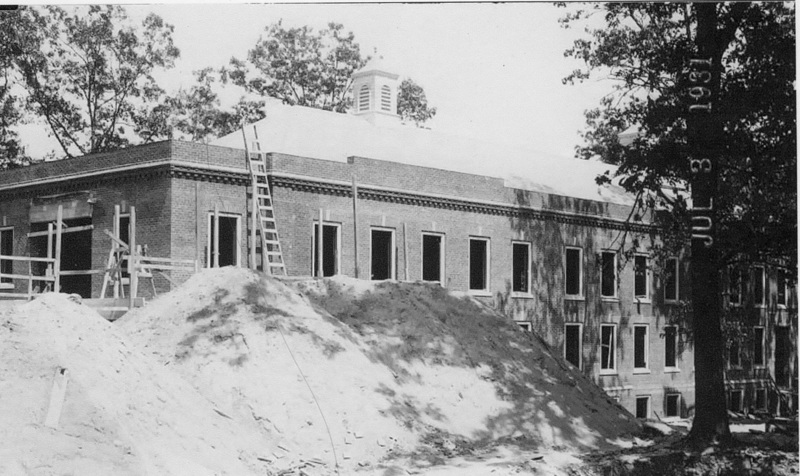 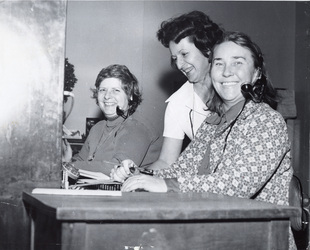 Building A became the administration and admissions building, where telephone operators were located. Building B was the medical and surgical building. 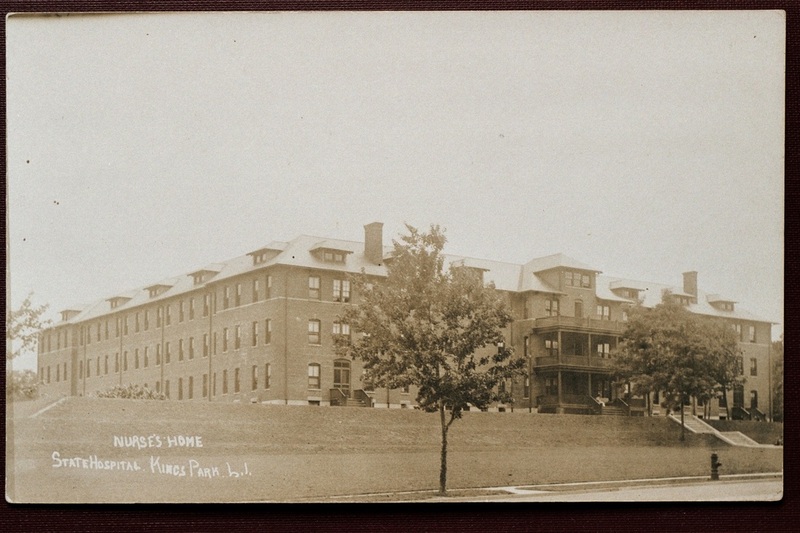 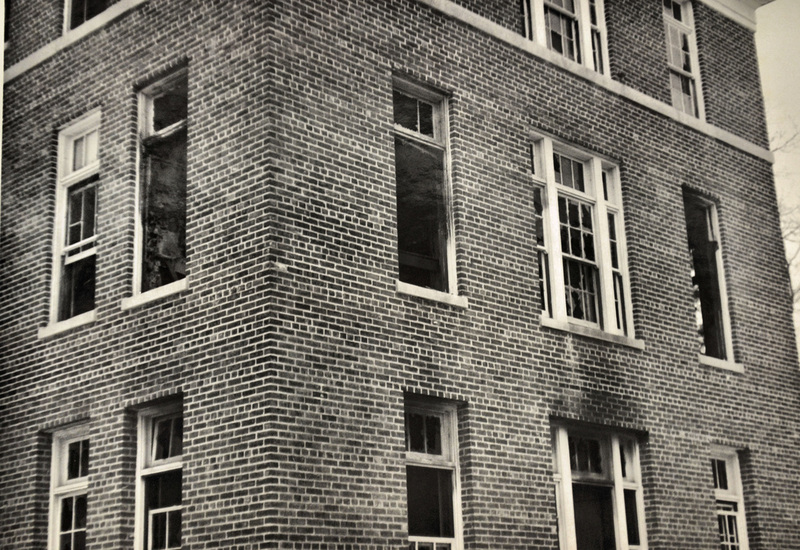 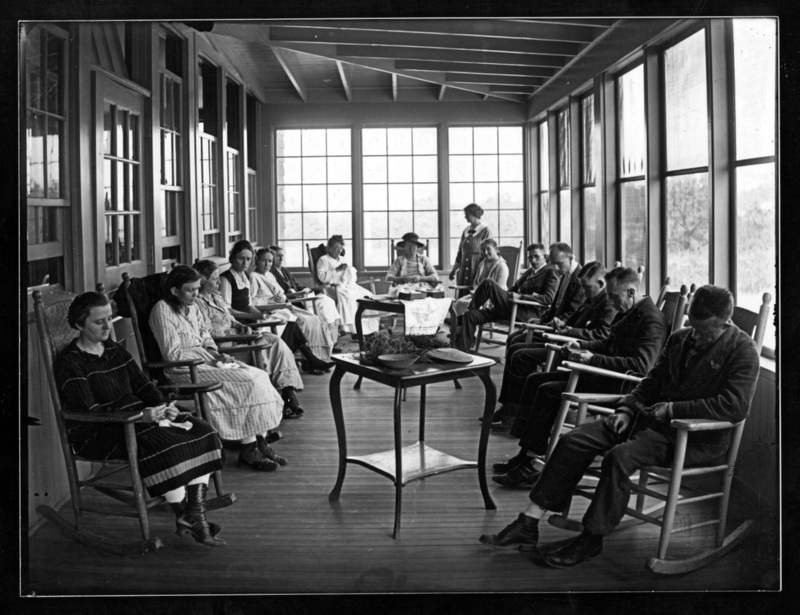 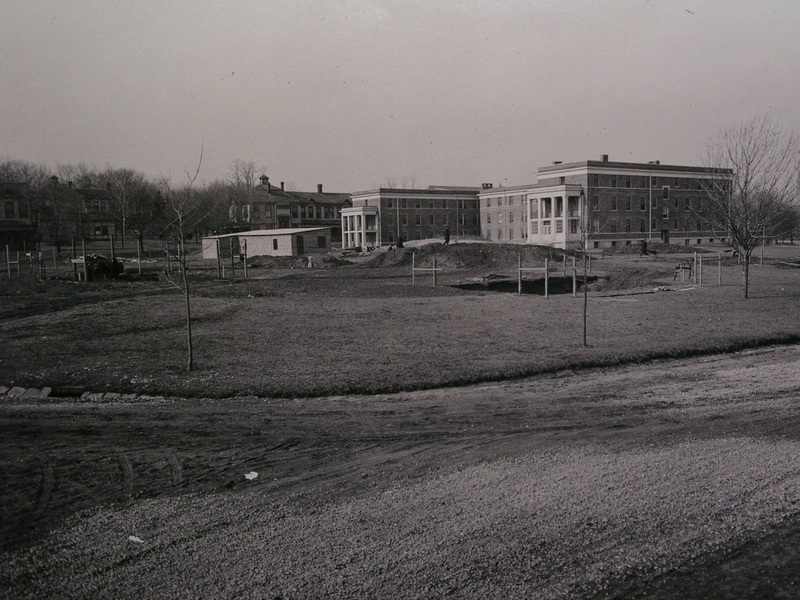 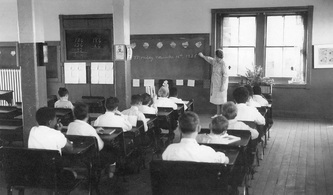 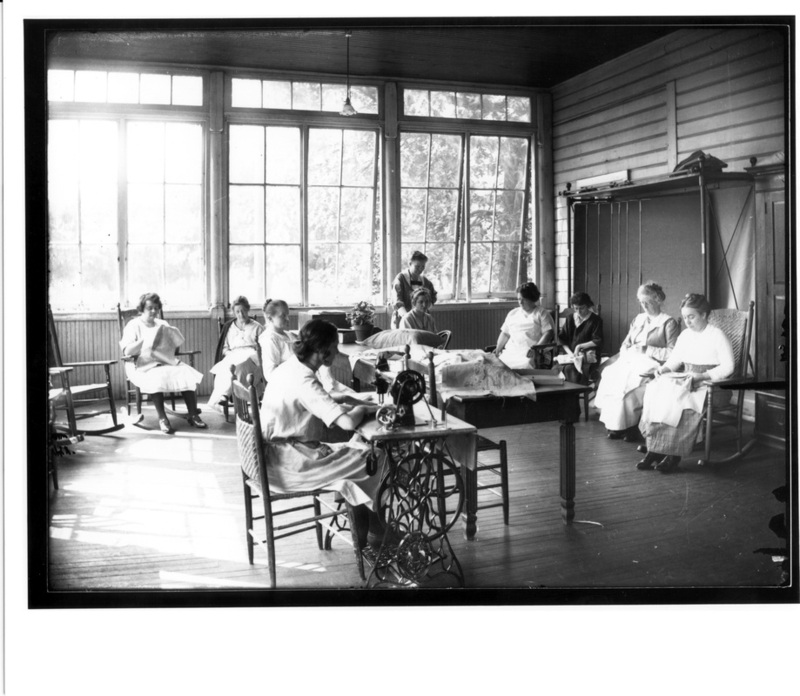 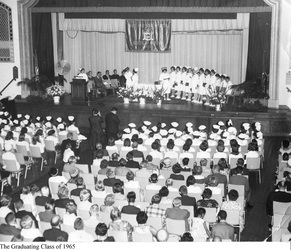 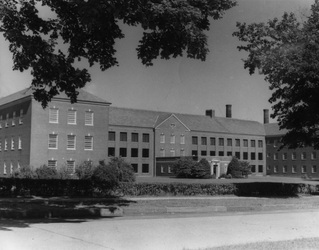 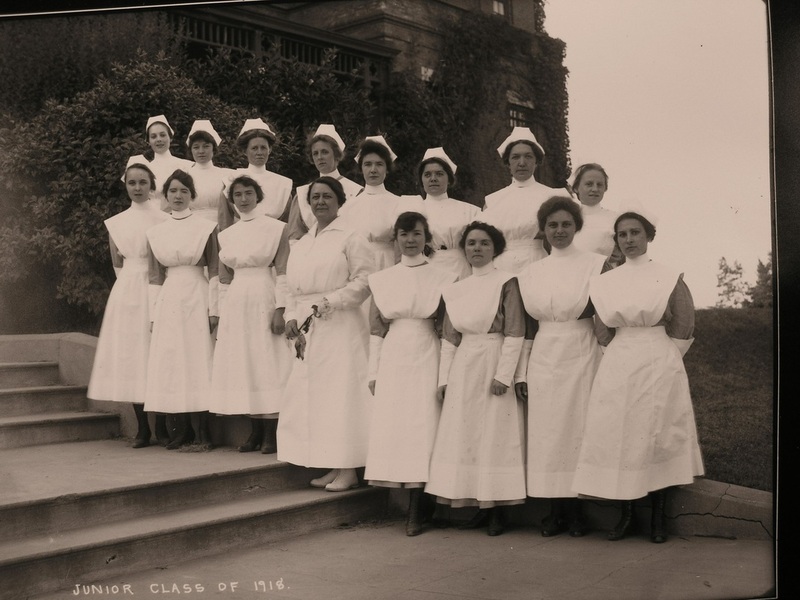 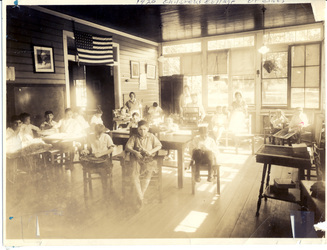 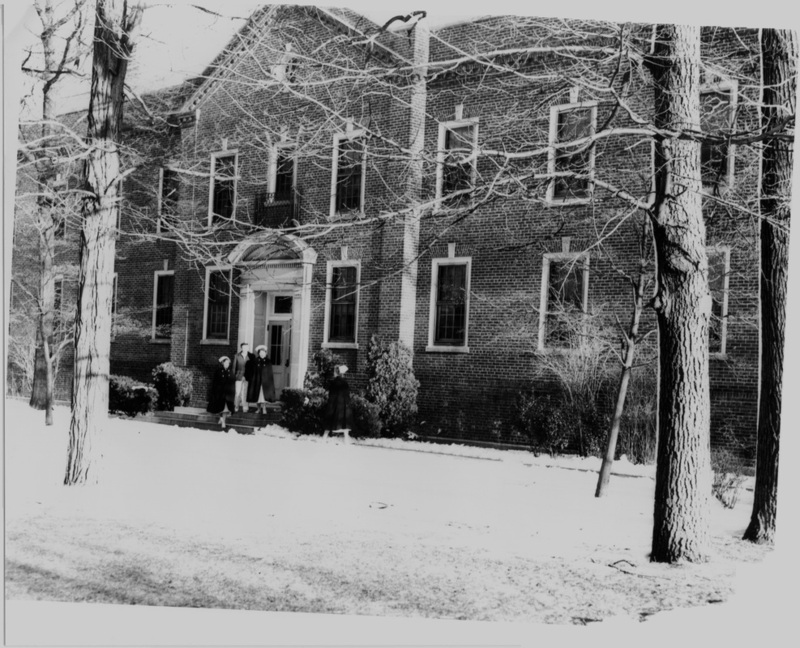 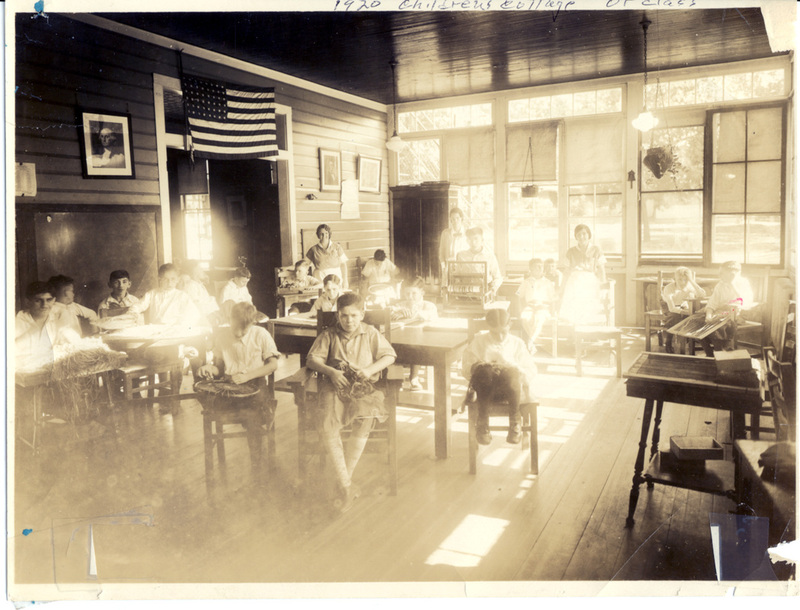 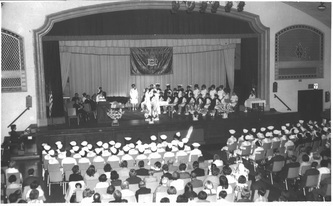 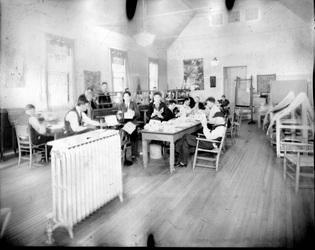 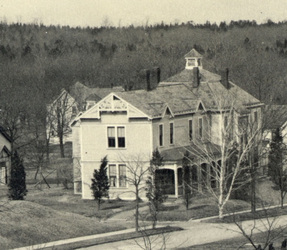 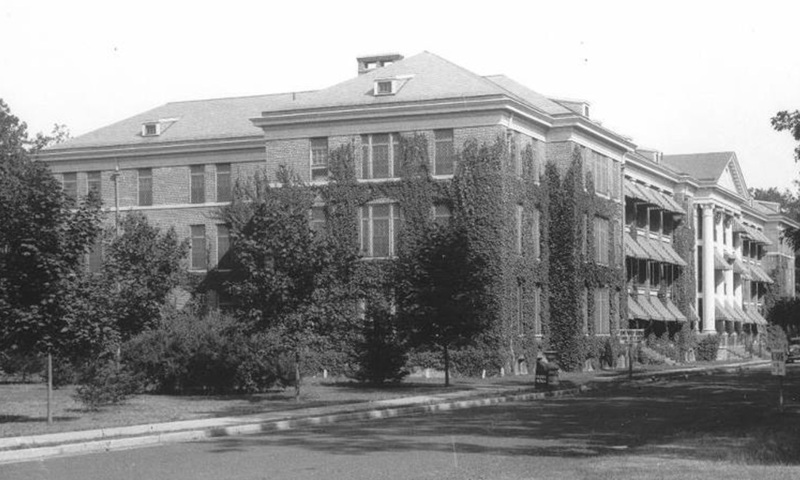 The hospital's first nursing school was located in Building C. All 4 buildings had single room dormitories for patients. 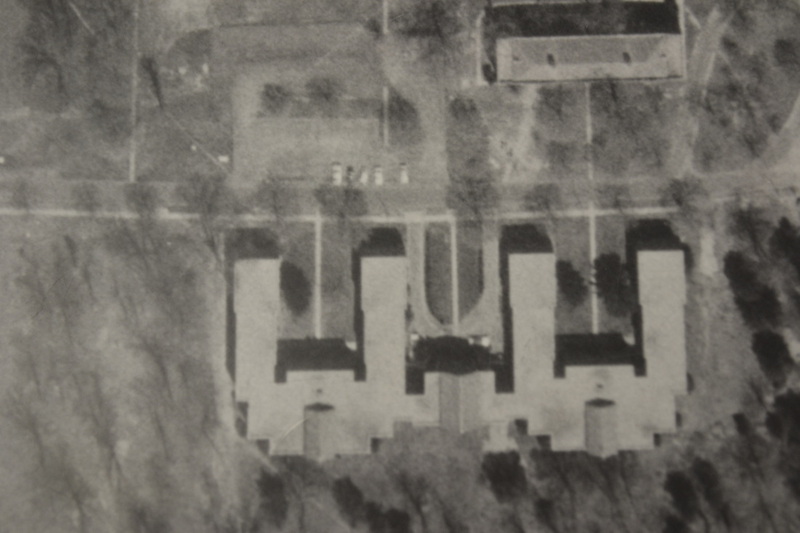 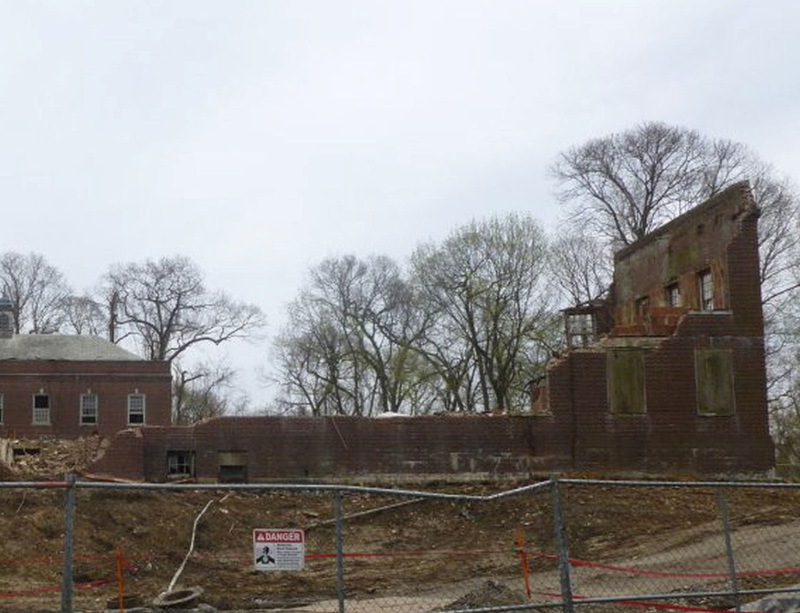 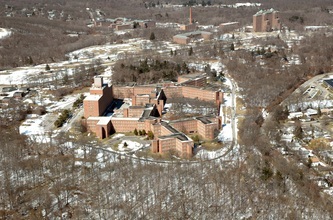 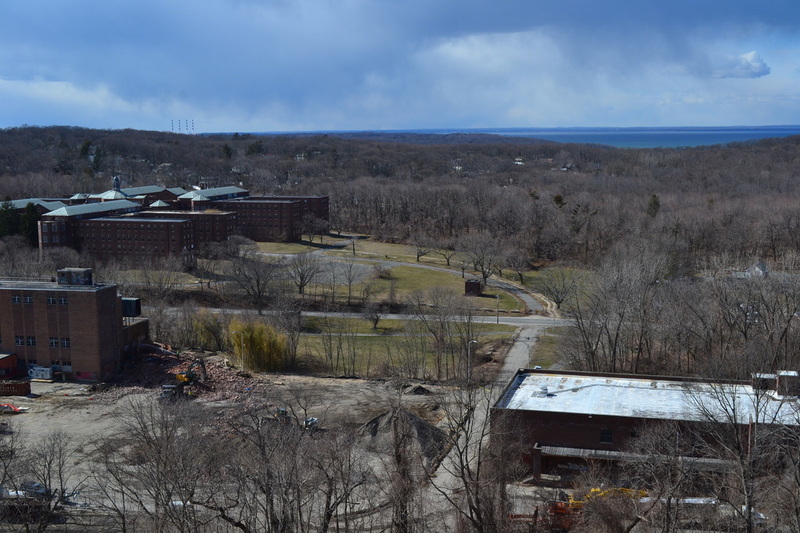 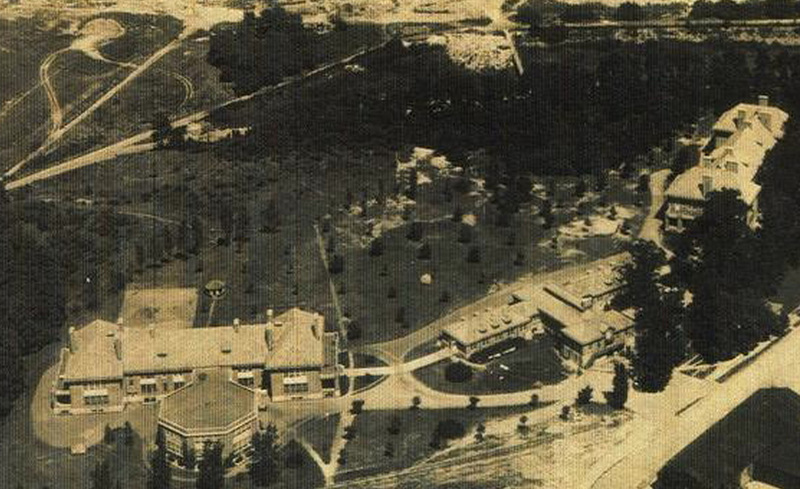 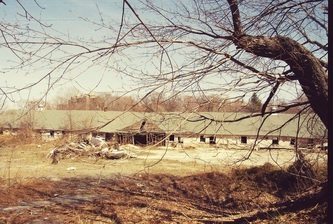 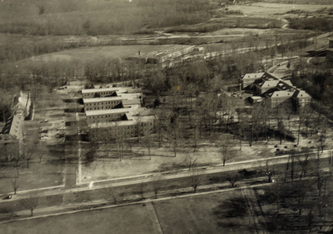 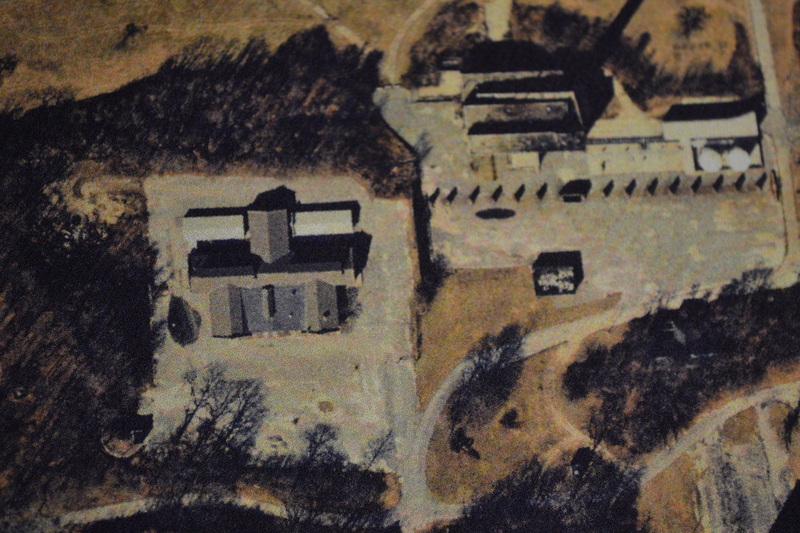 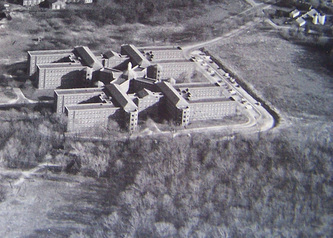 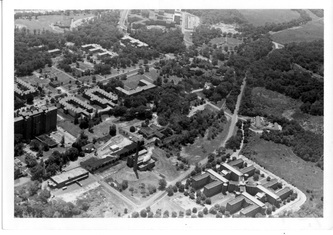 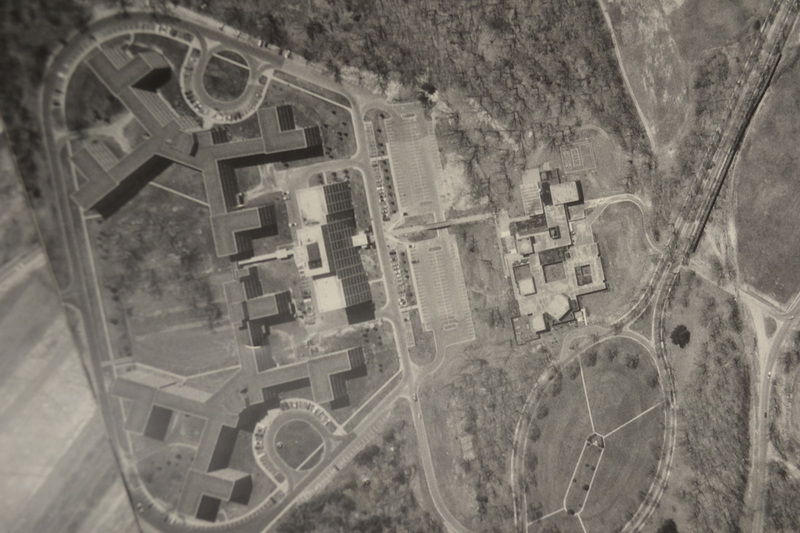 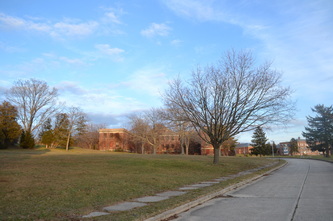 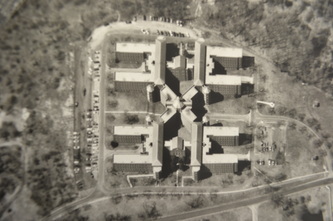 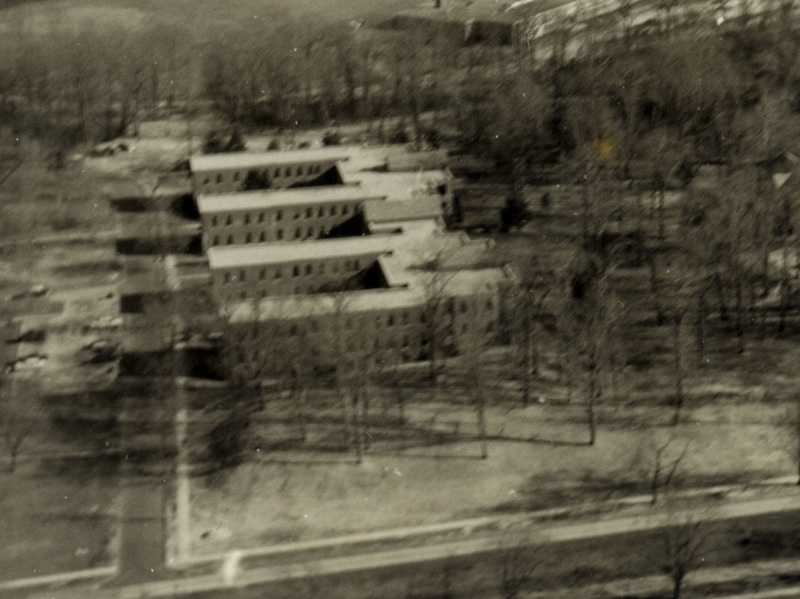 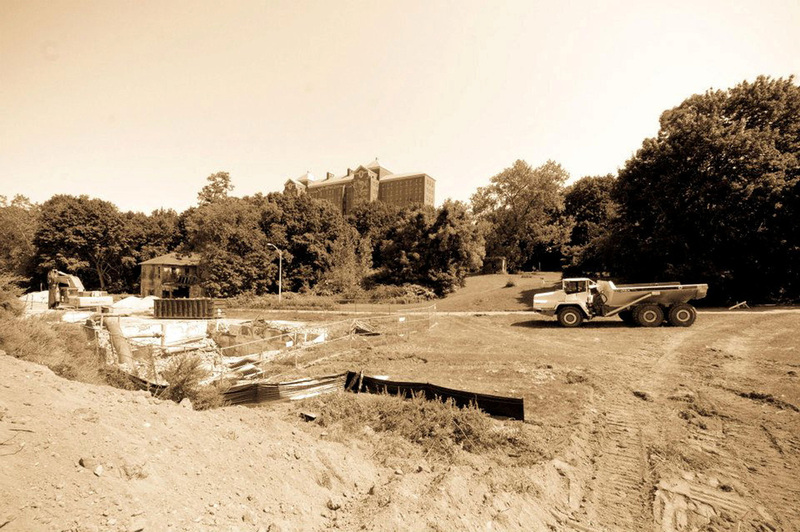 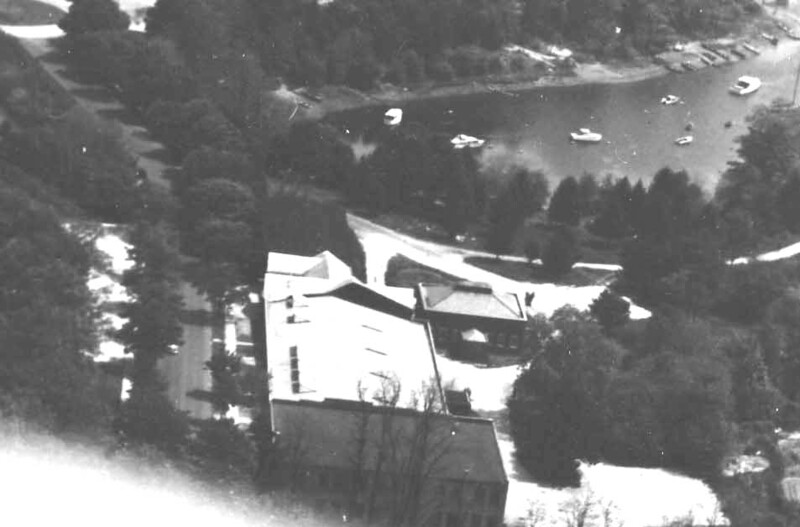 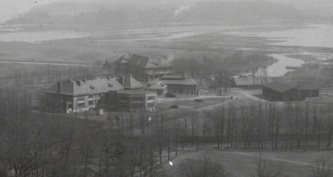 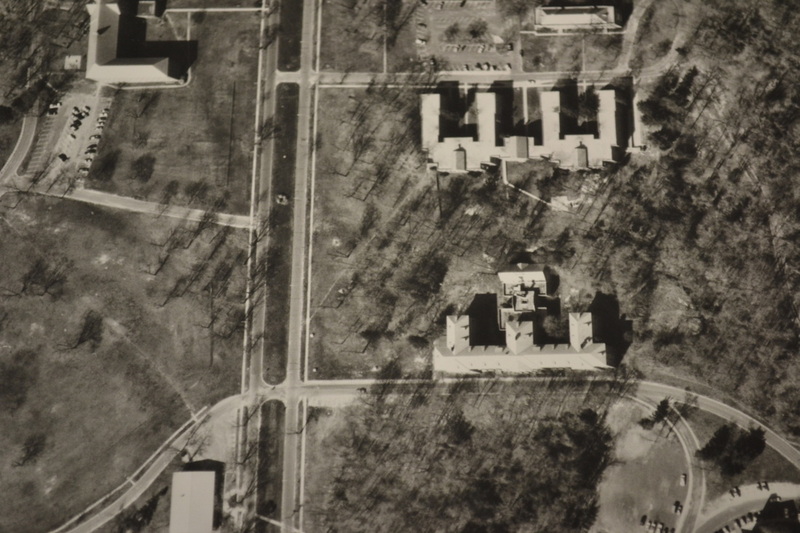 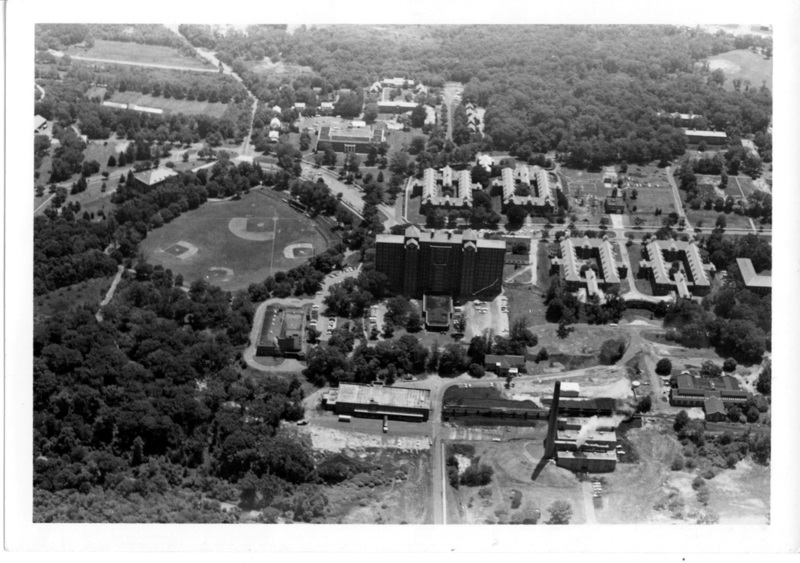 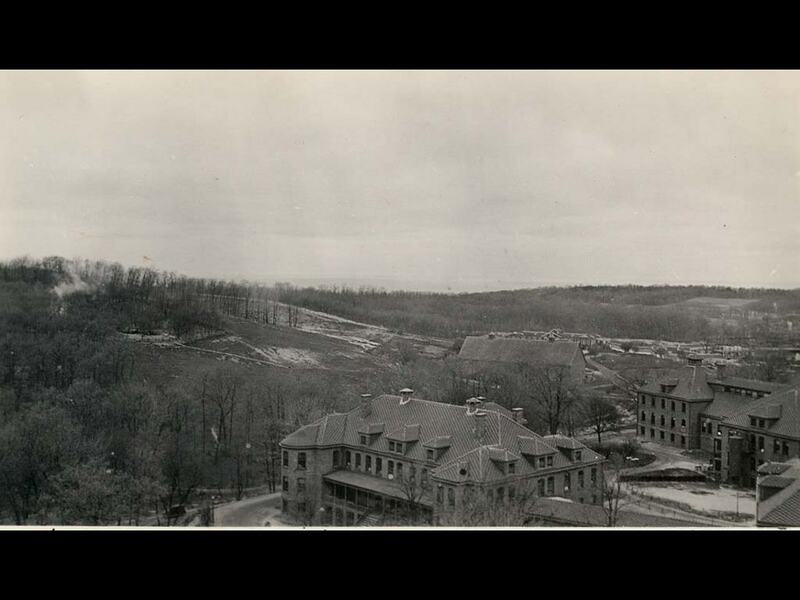 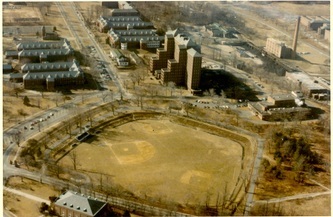 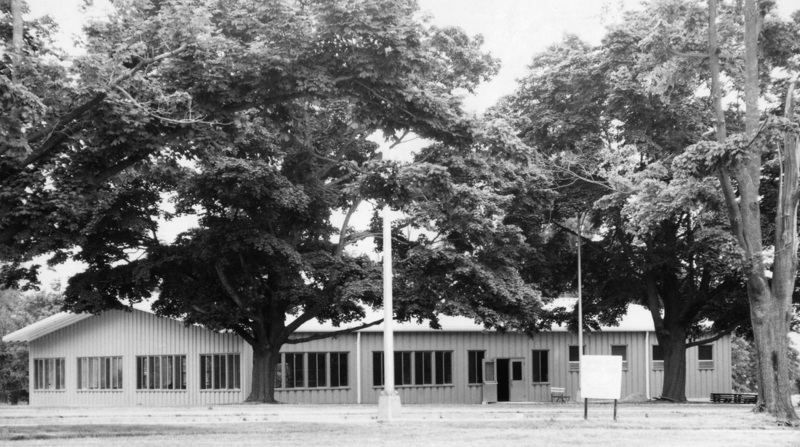 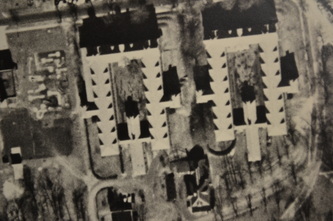 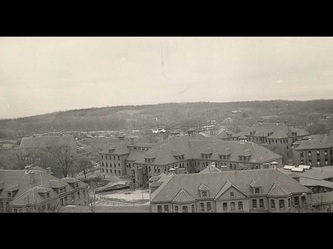 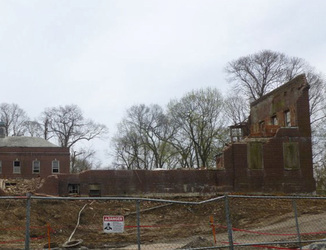 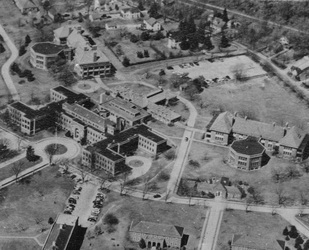 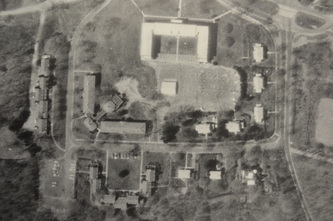 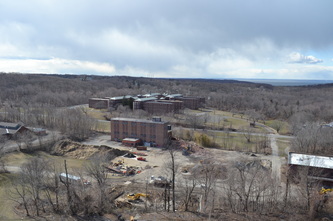 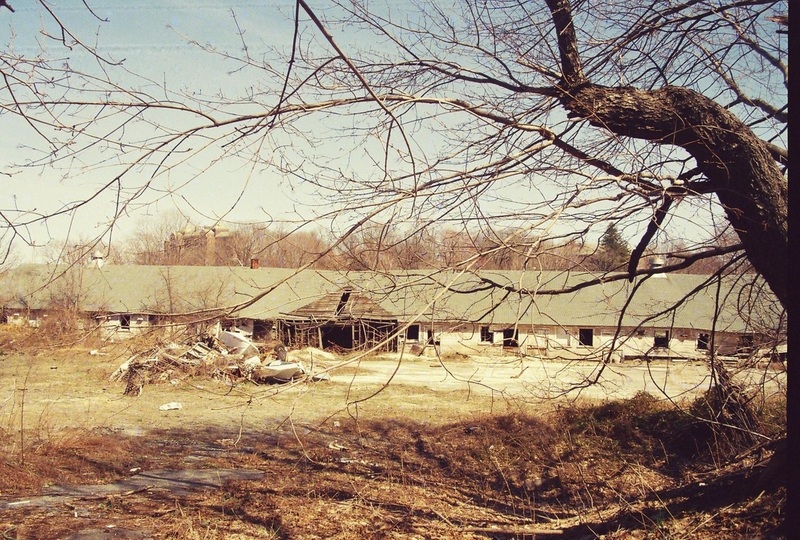 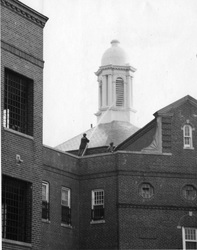 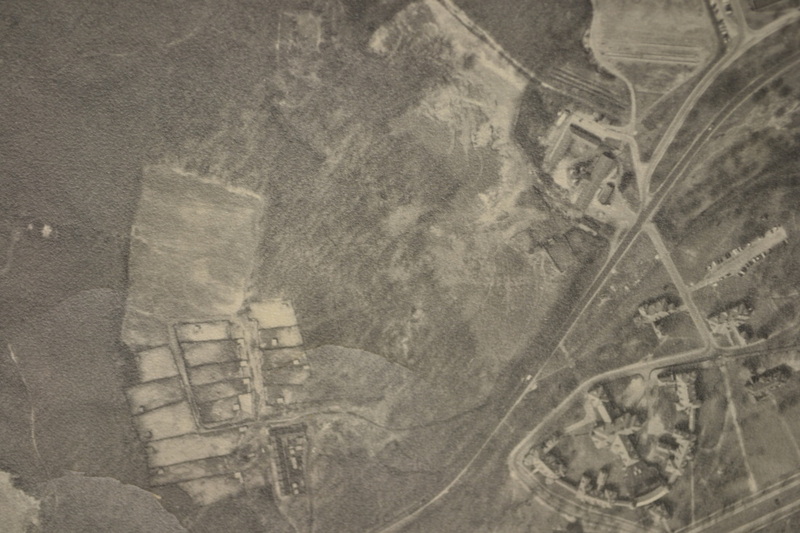 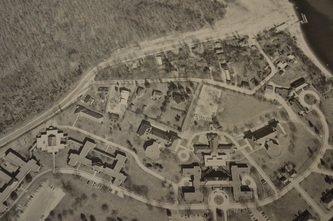 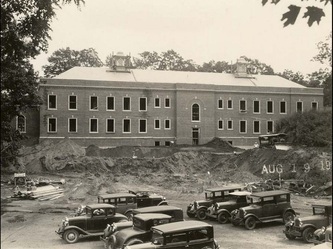 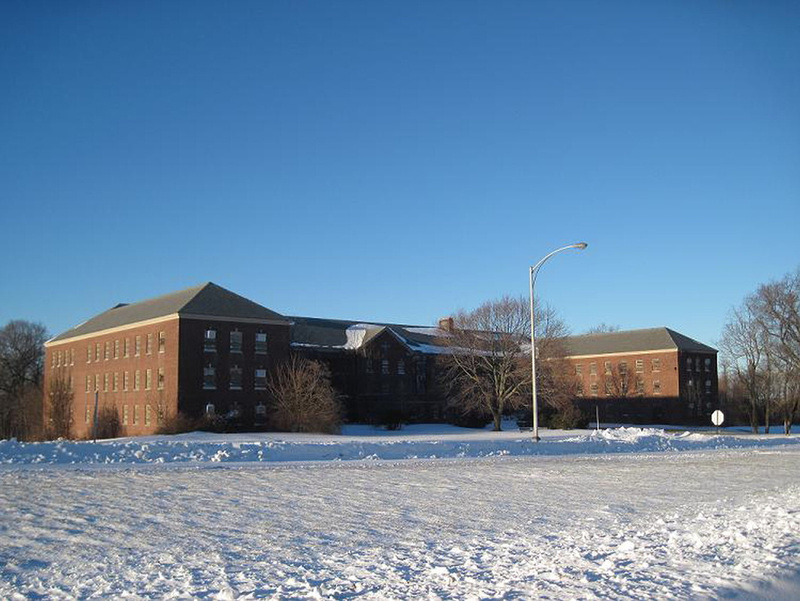 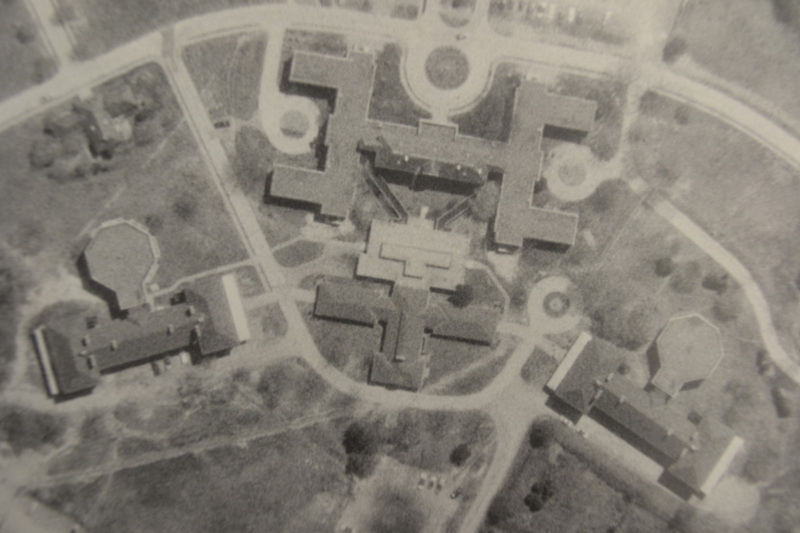 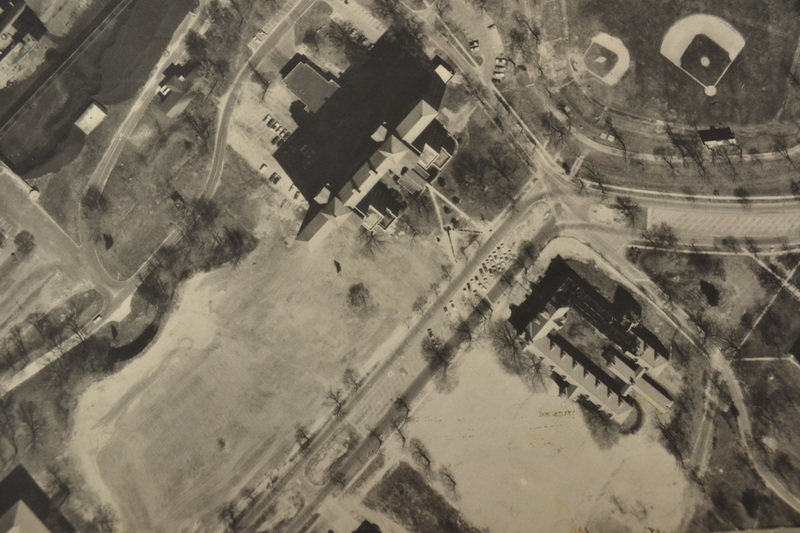 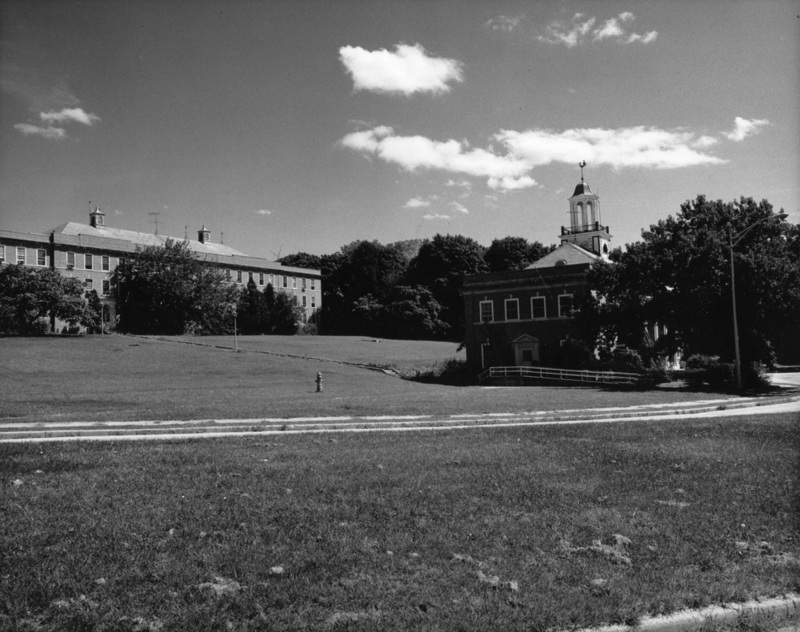 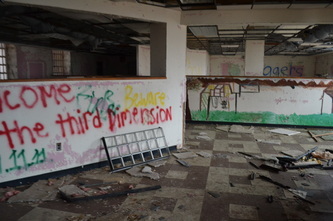 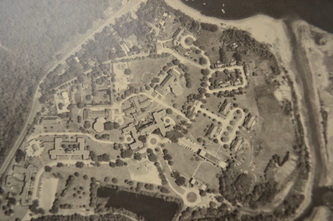 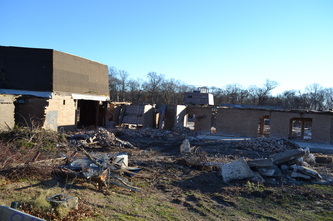 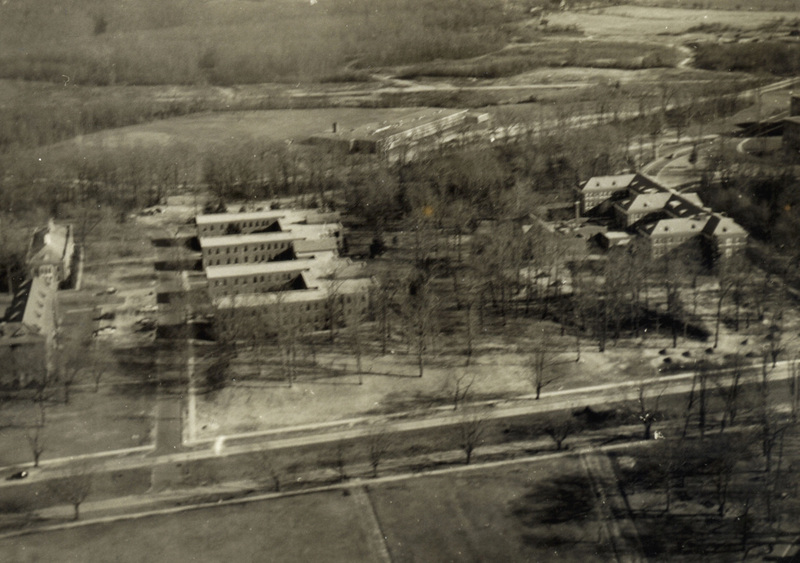 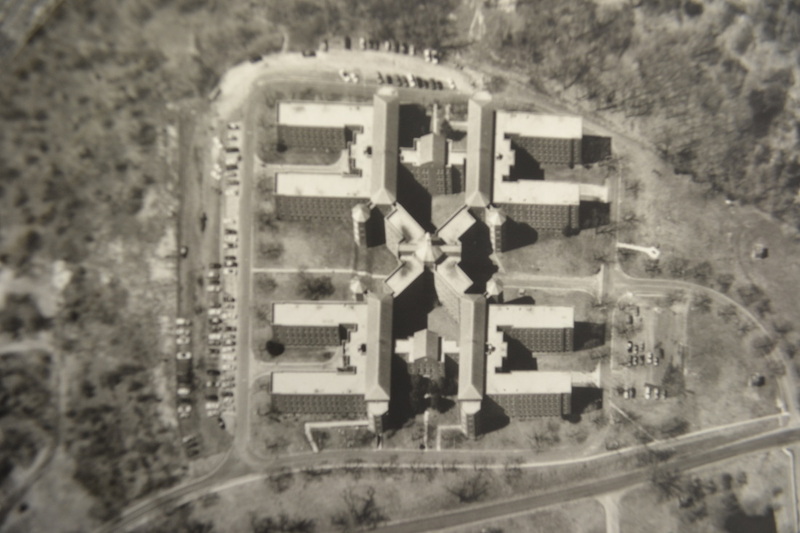 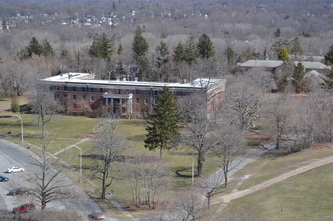 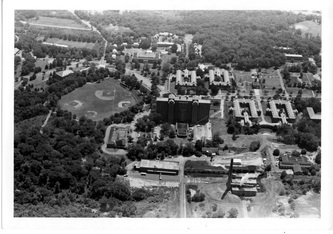 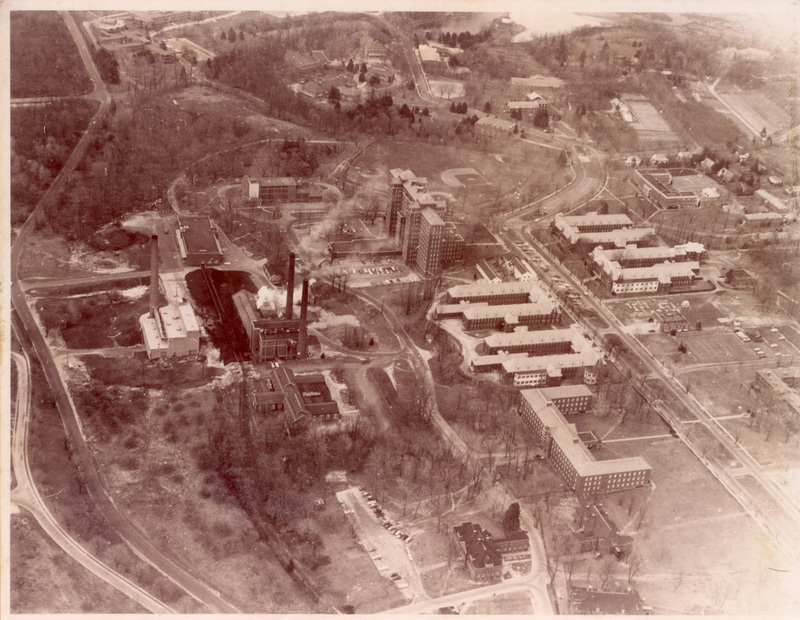 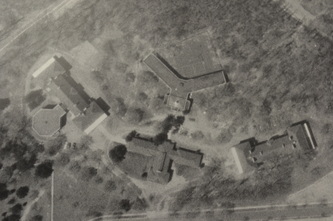 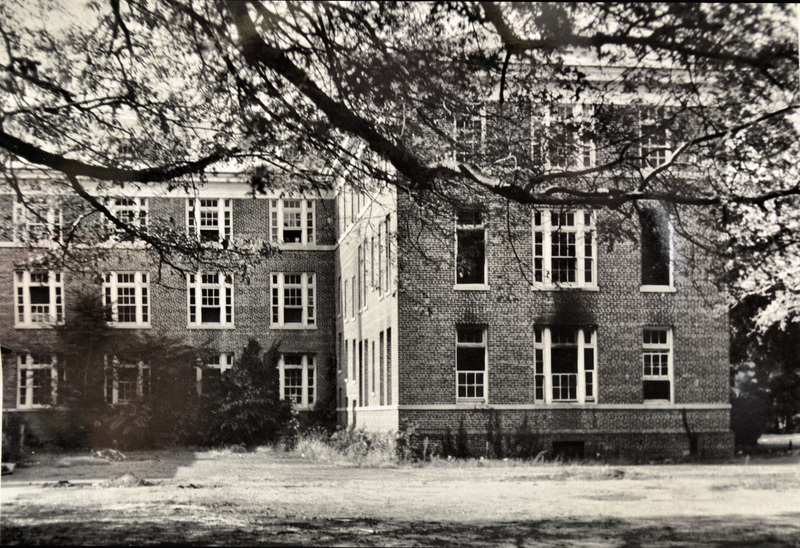 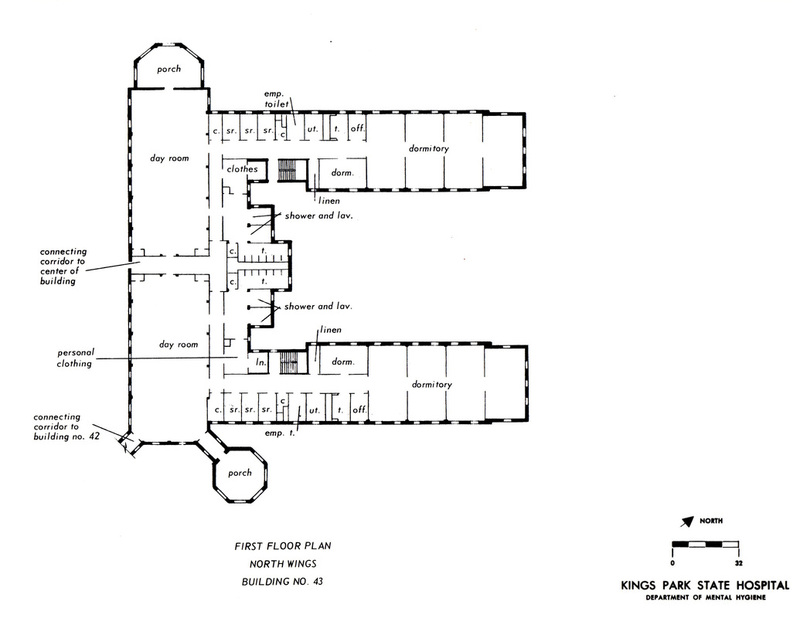 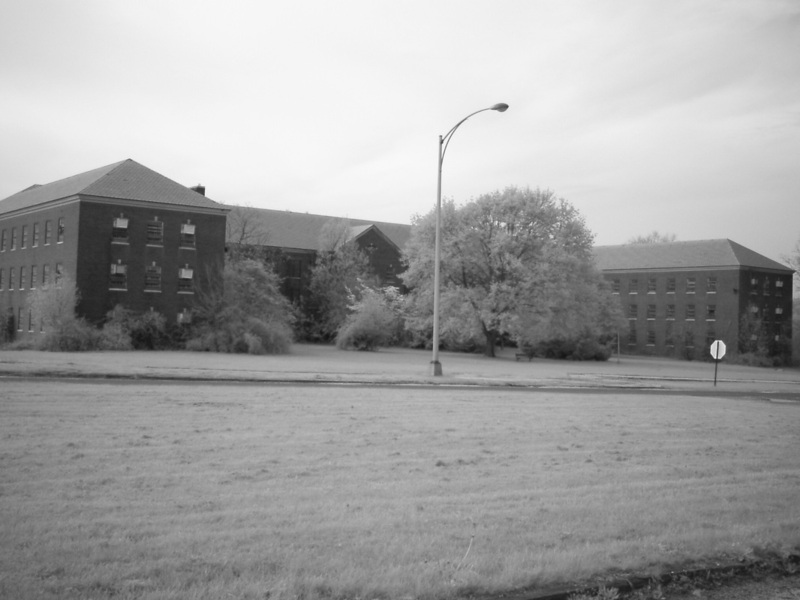 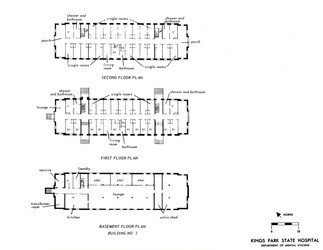 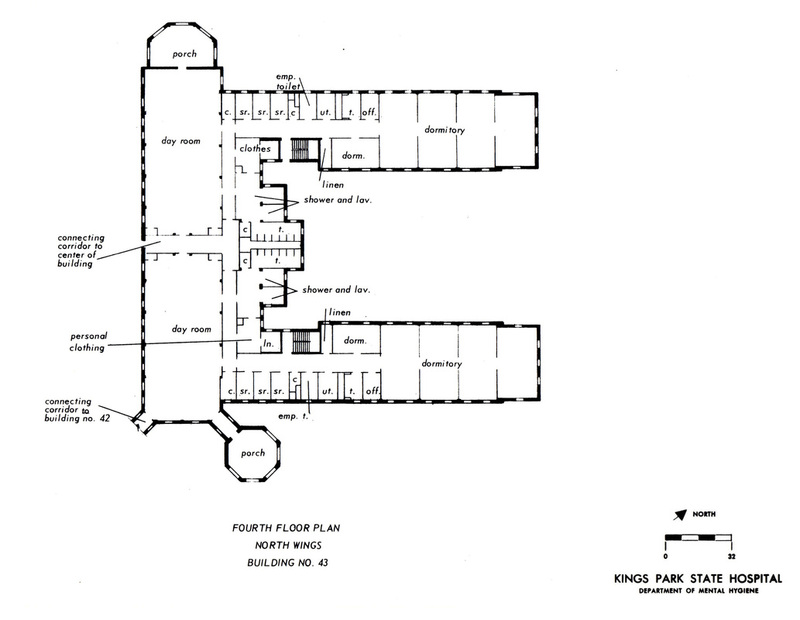 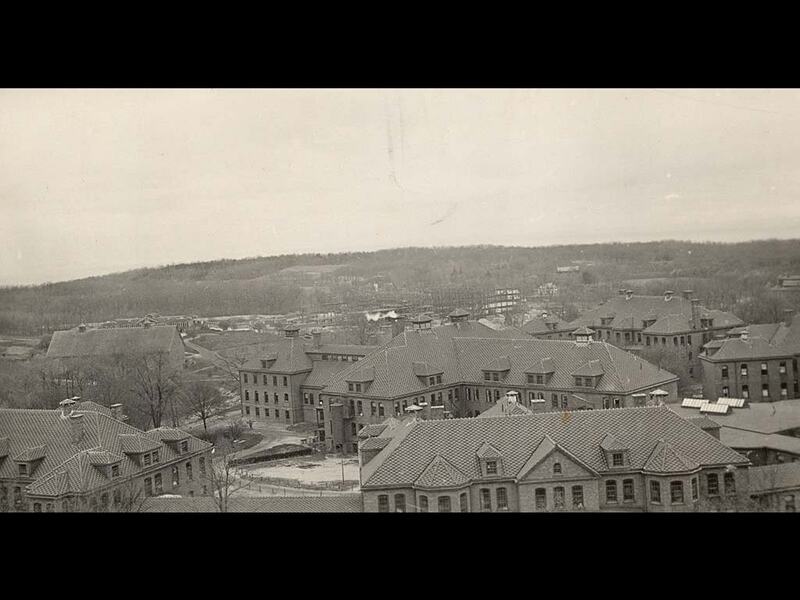 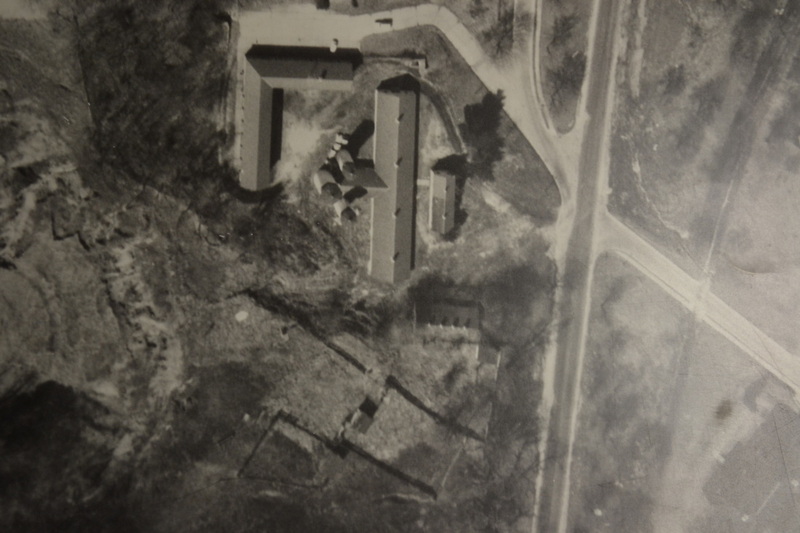 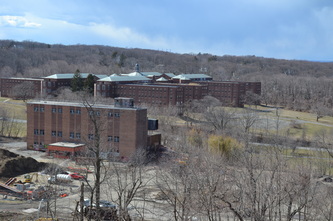 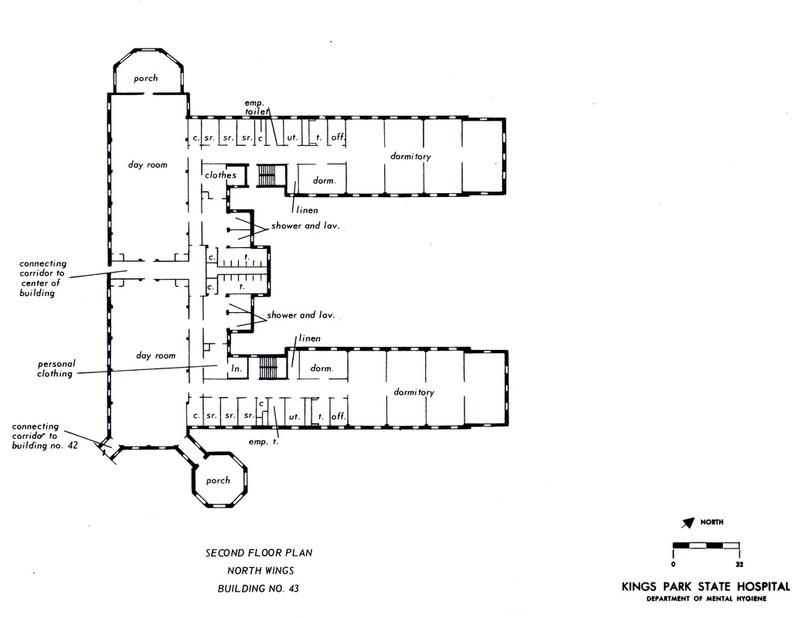 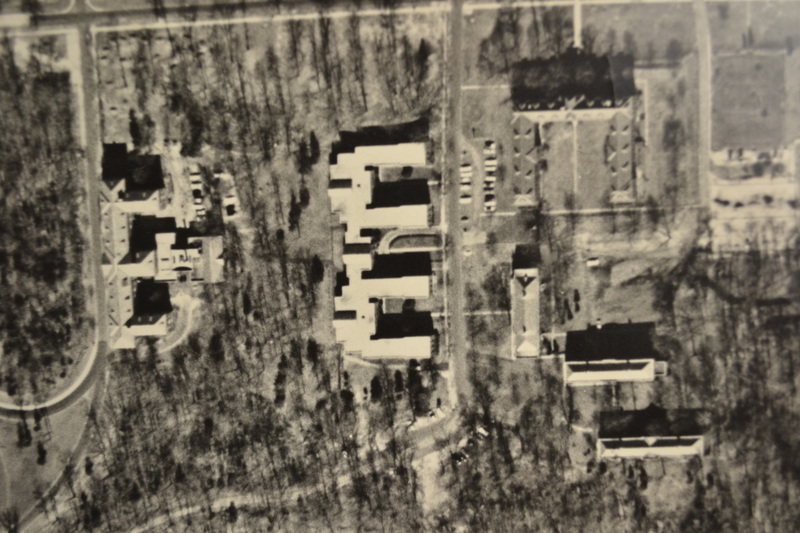 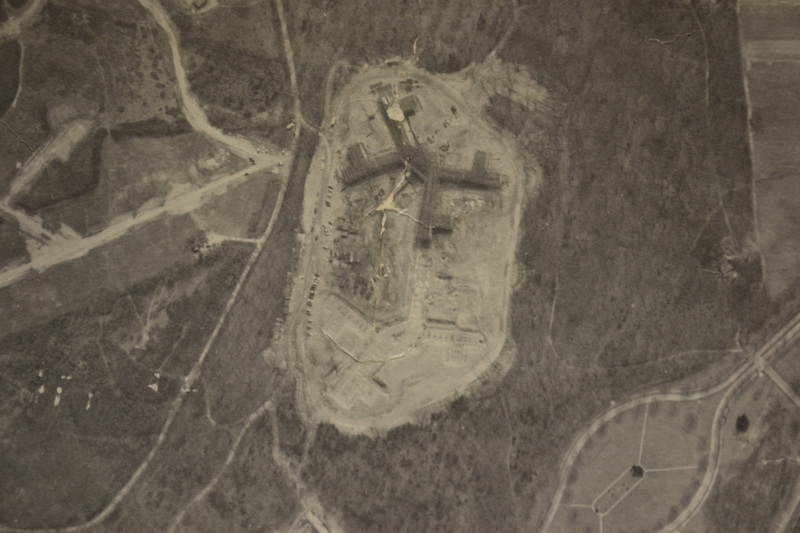 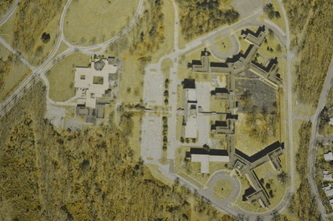 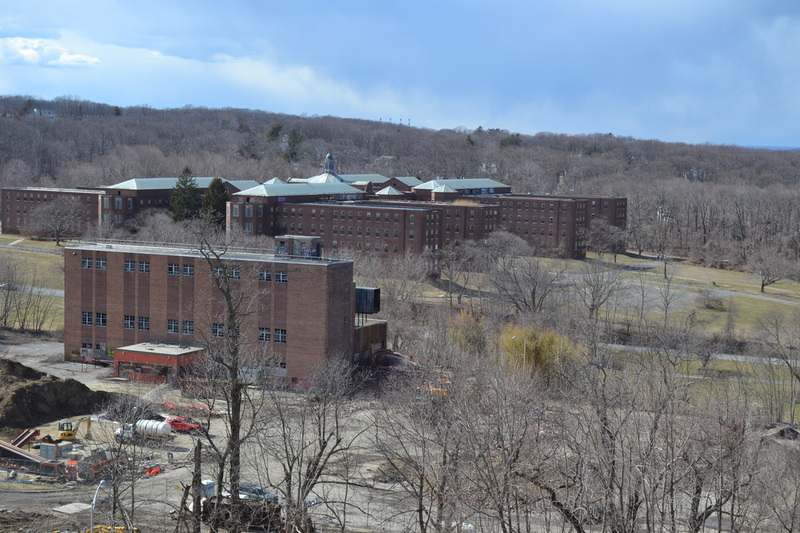 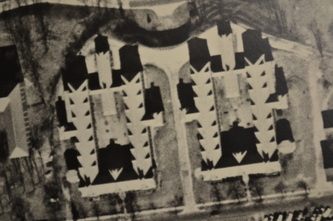 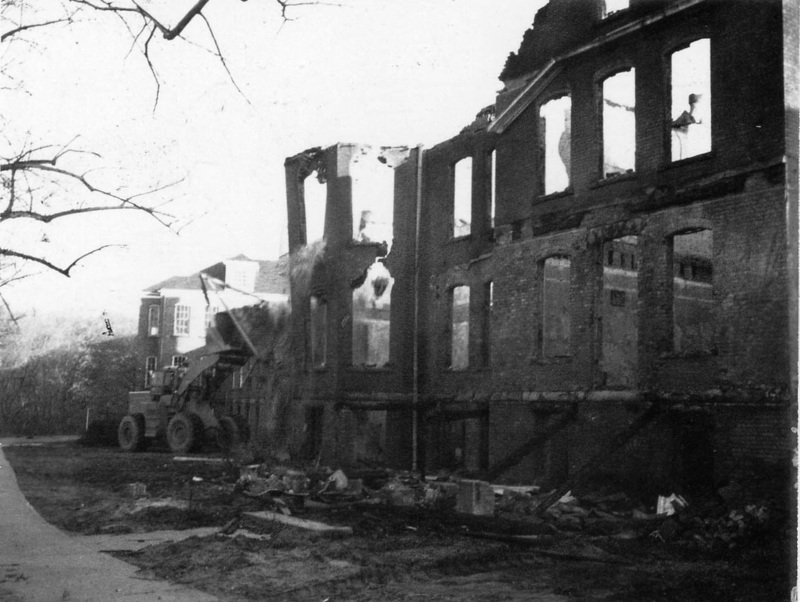 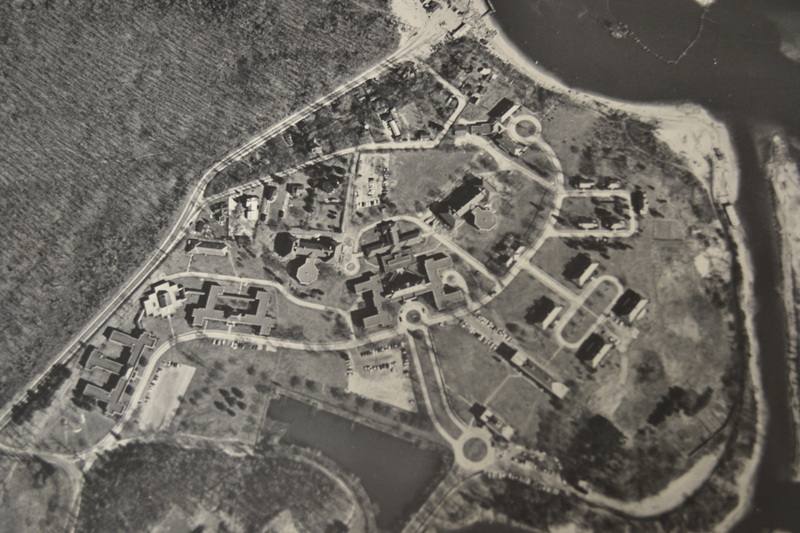 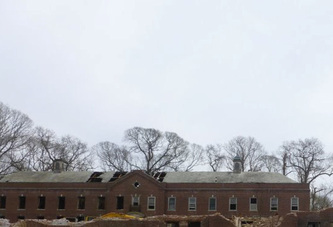 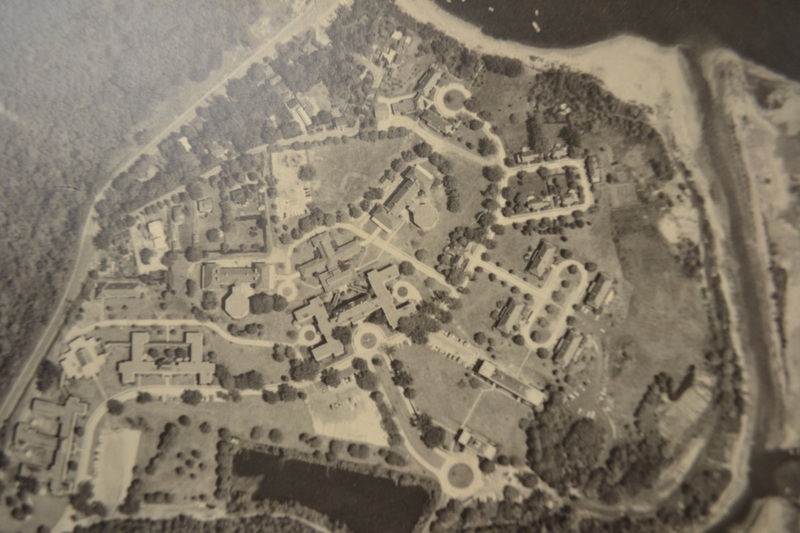 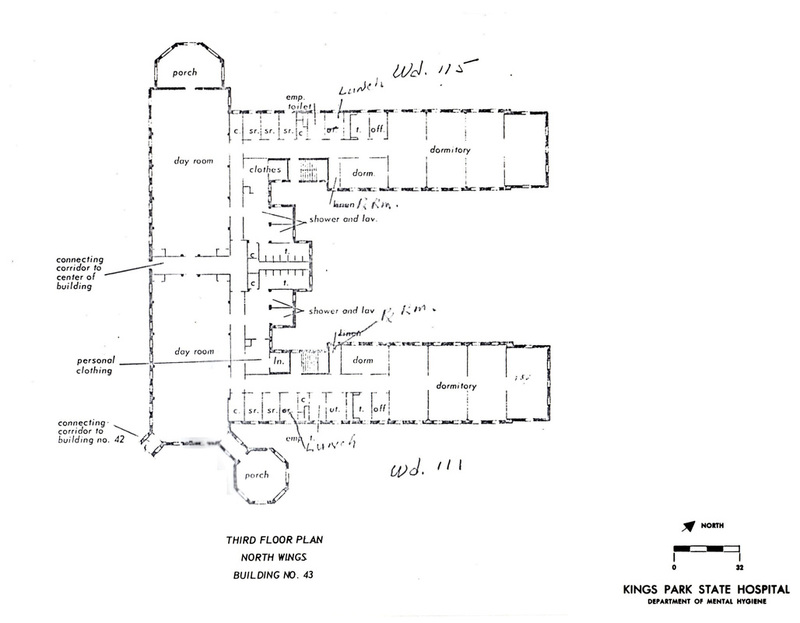 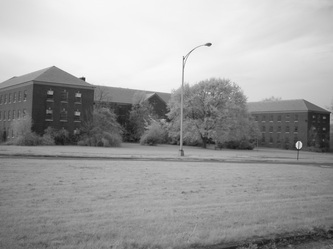 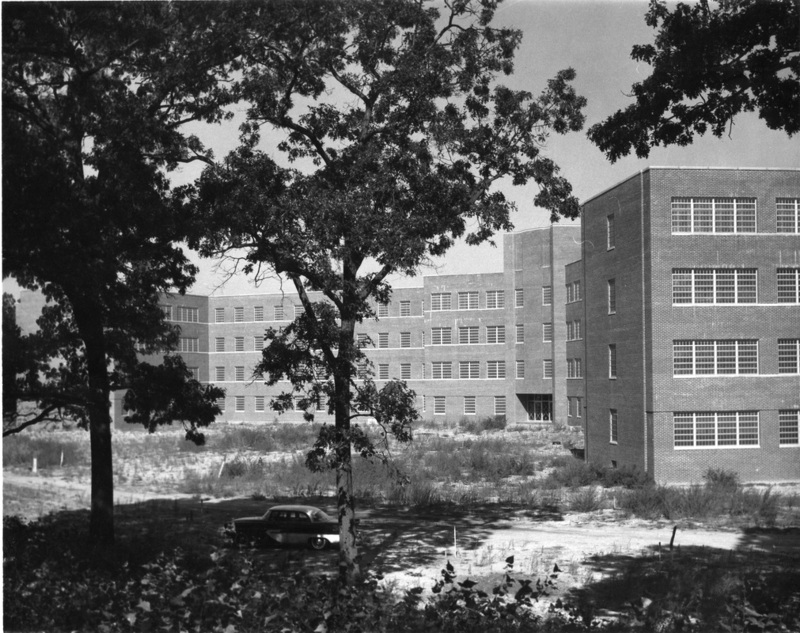 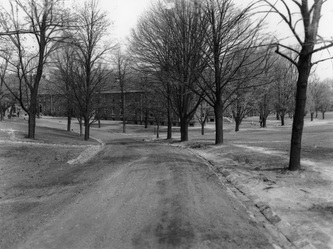 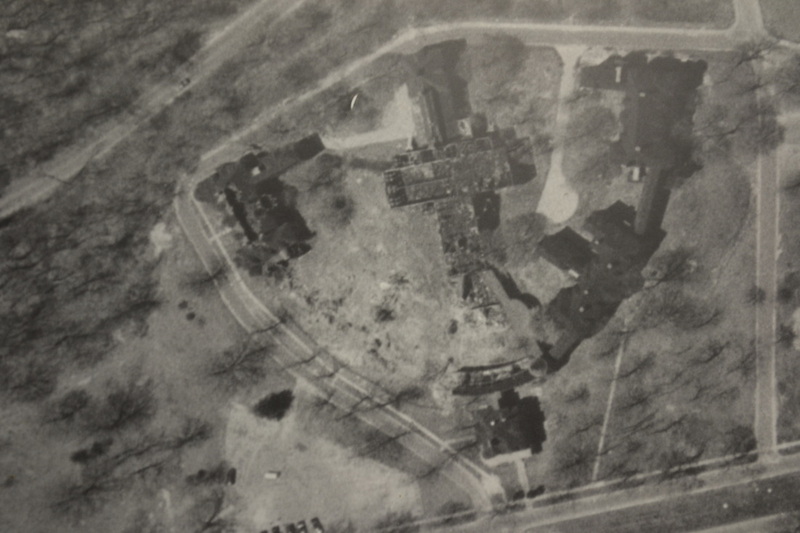 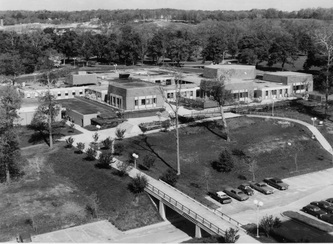 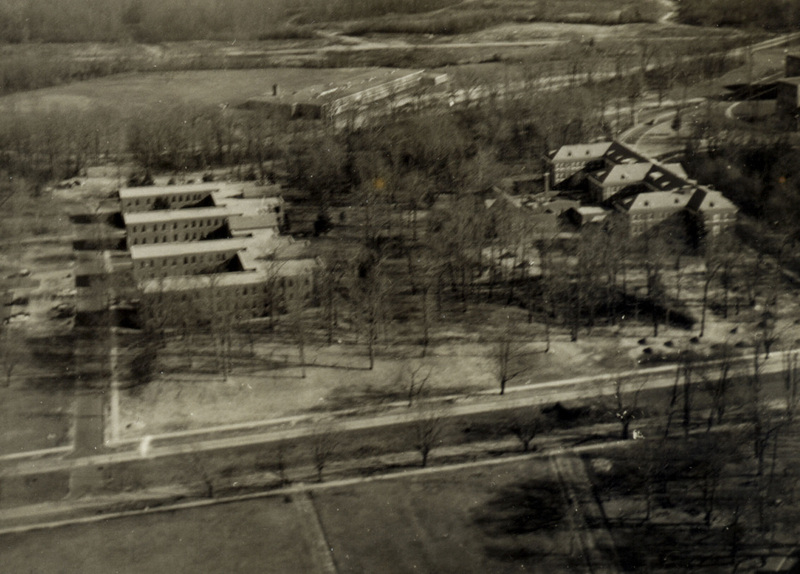 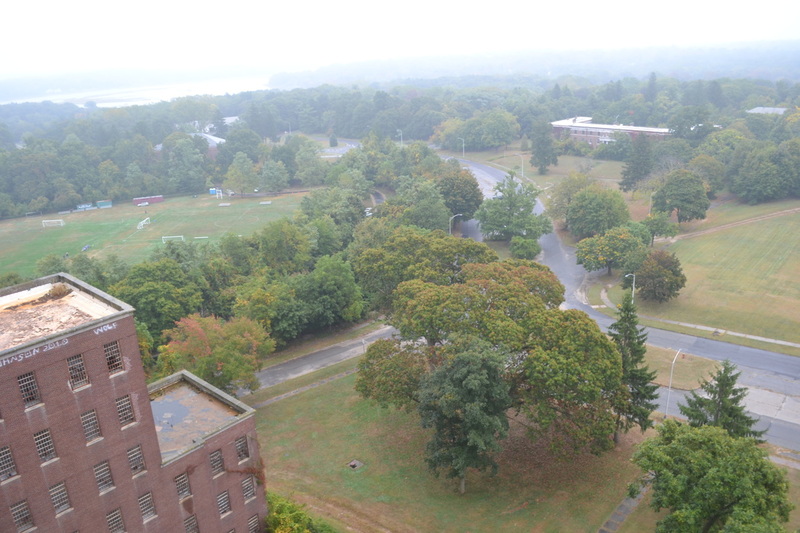 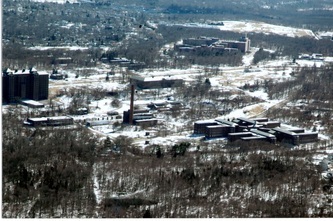 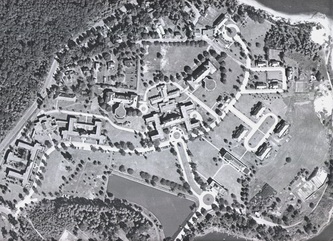 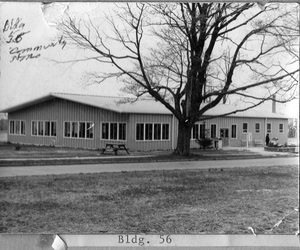 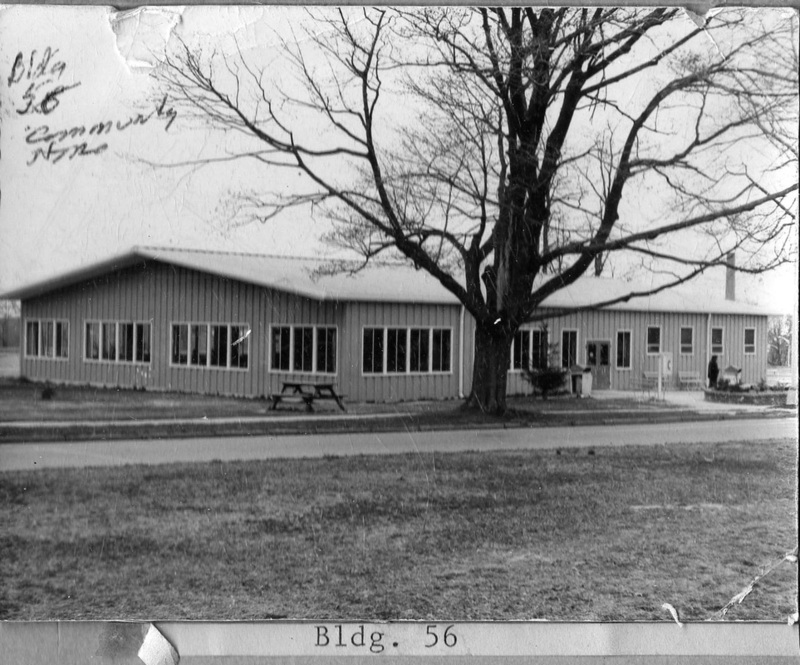 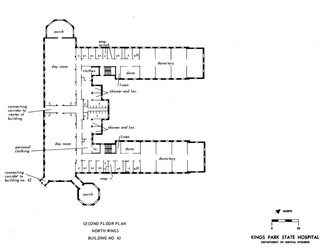 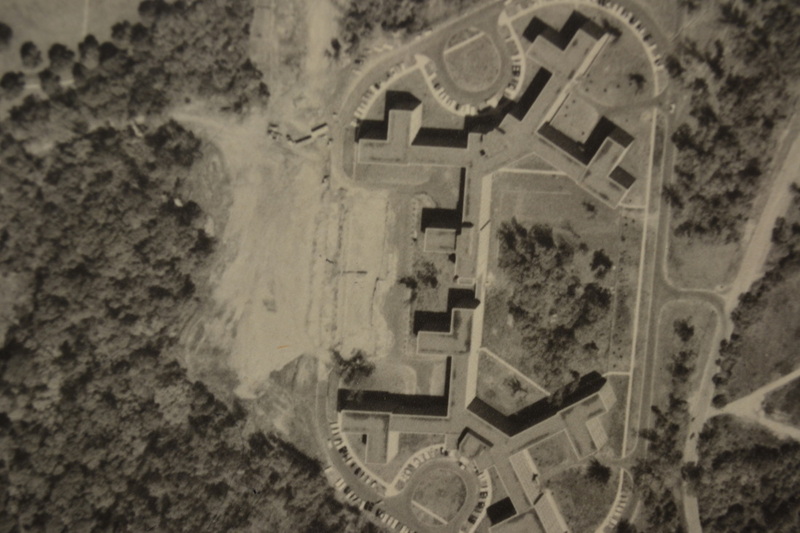 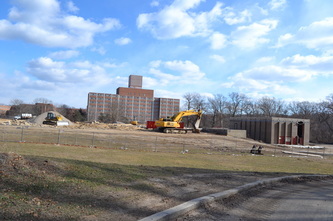 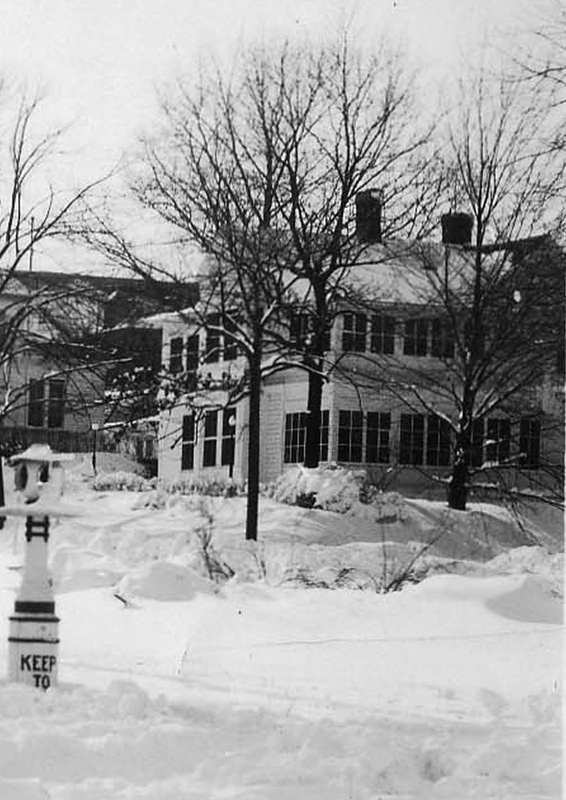 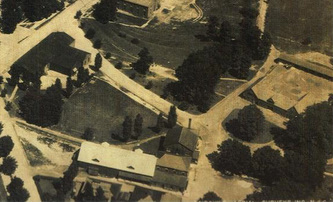 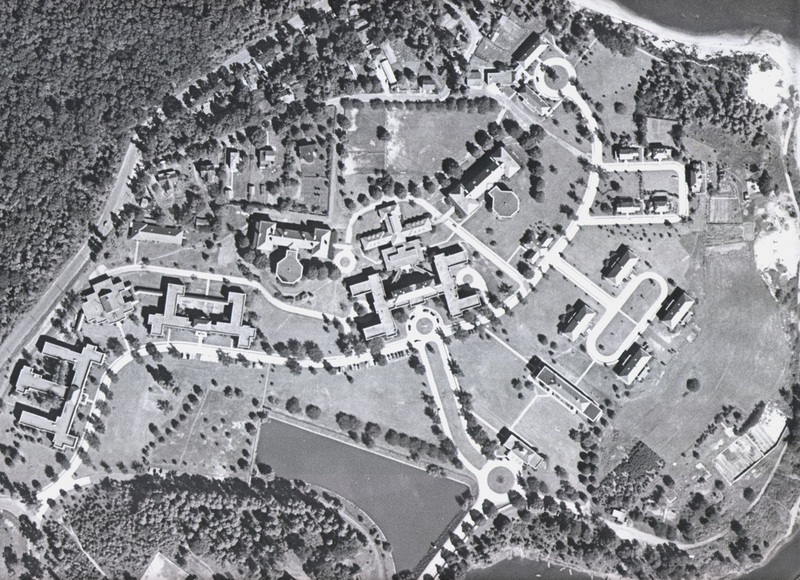 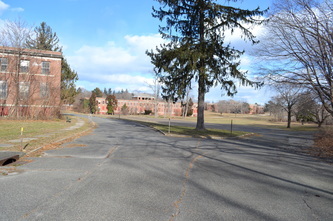 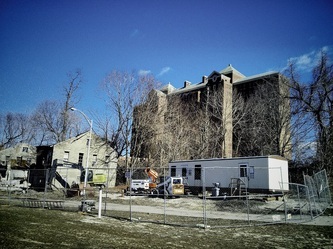 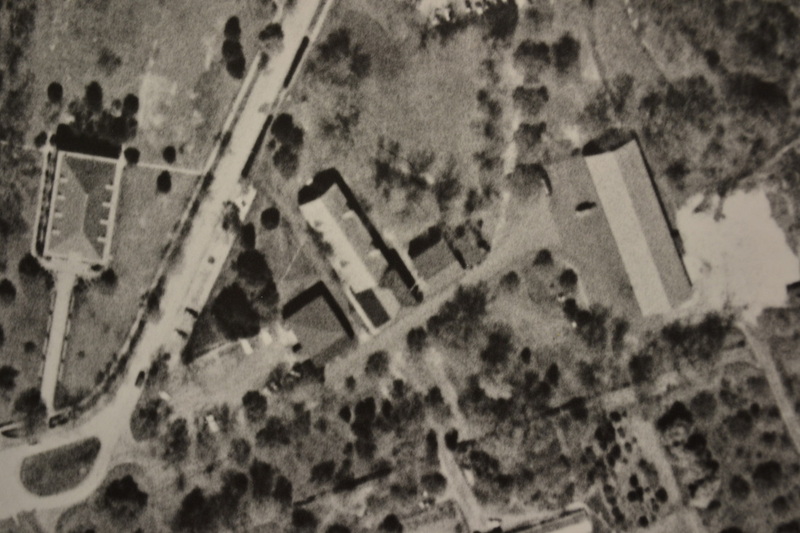 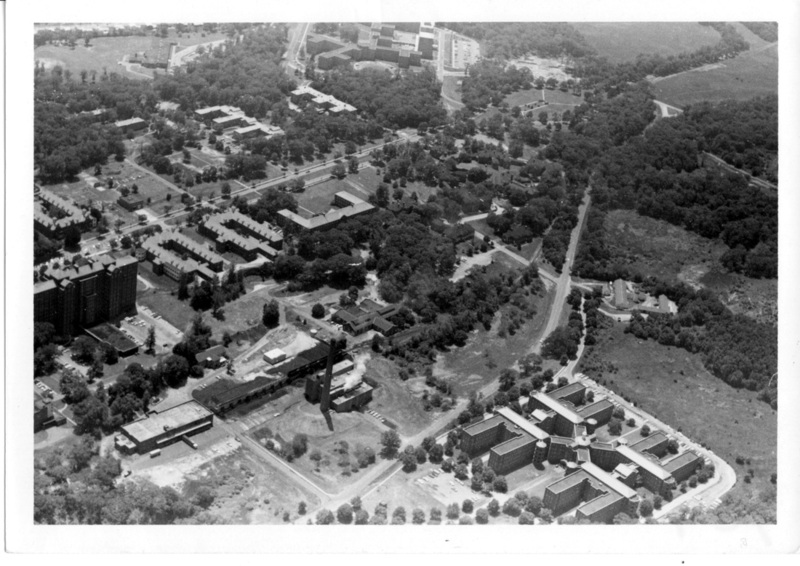 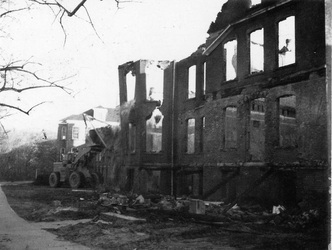 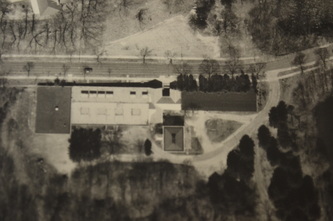 Building 38 was the kitchen and dining hall for Buildings A and B, while Building 12 served as the kitchen and dining hall for Buildings C and D. The buildings were all removed by the 1970s. 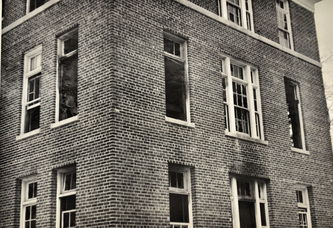 Building 90, also known as Macy Home, was used as the Nursing School. 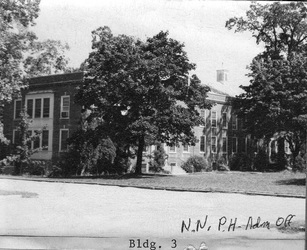 The school, originally located in Building C, was one of the more prominent nursing schools in the country. 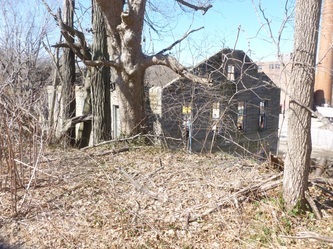 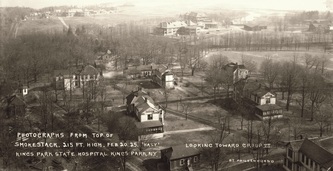 Behind Macy Home were cottages used by doctors and staff as residential buildings. 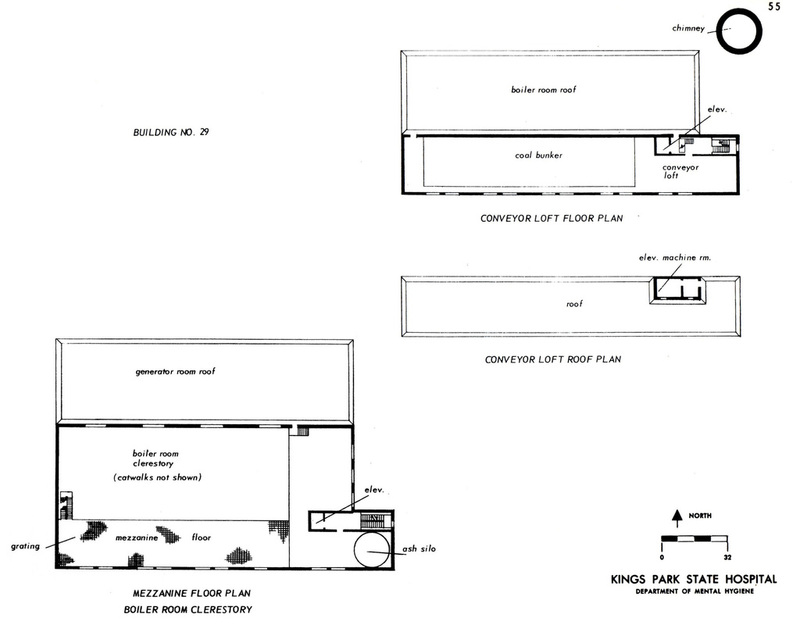 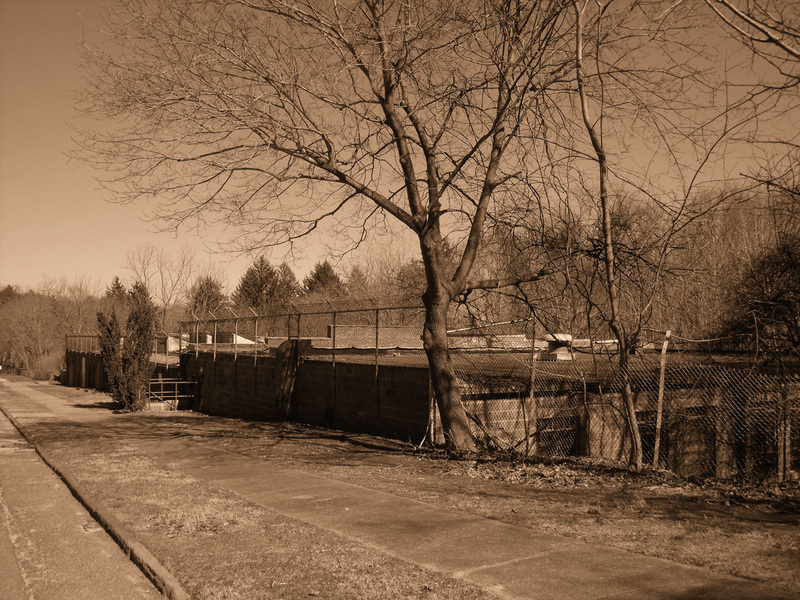 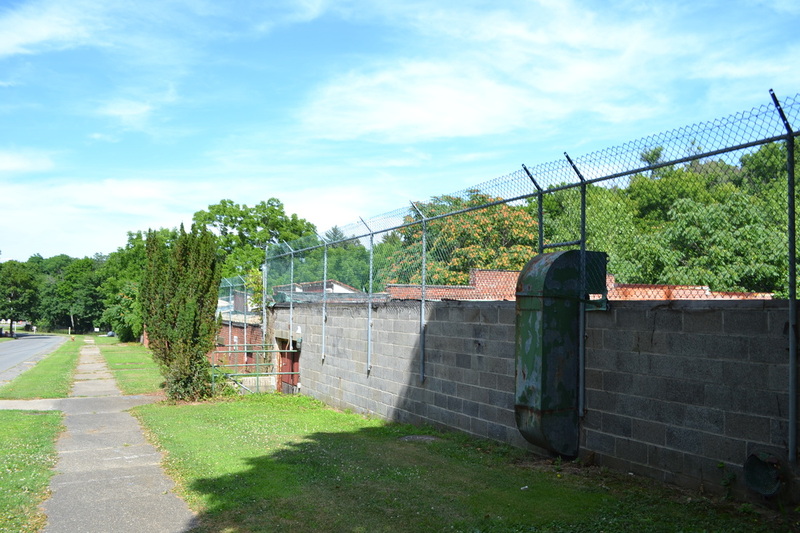 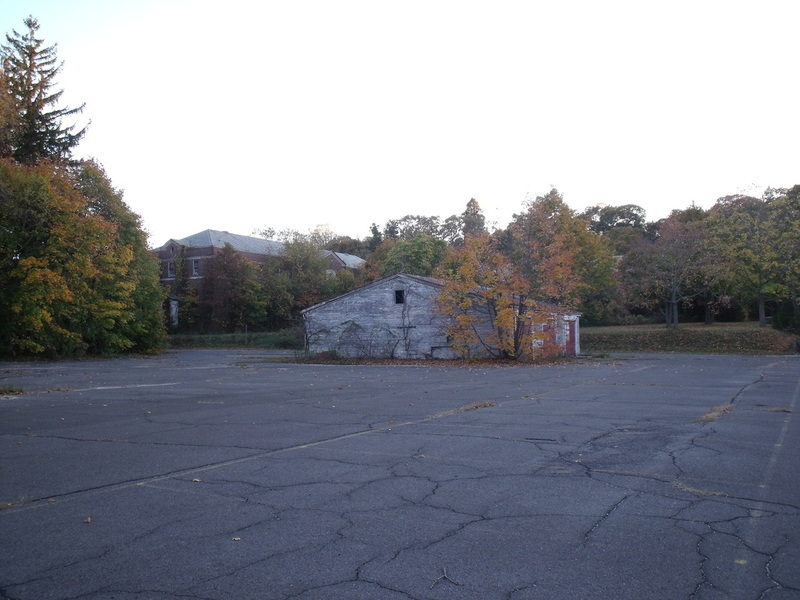 There was also a staff garage and a small area for tennis courts. 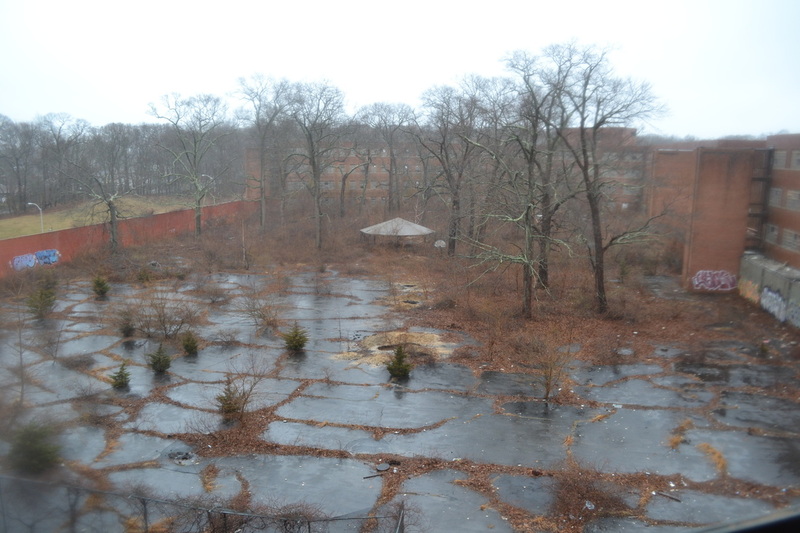 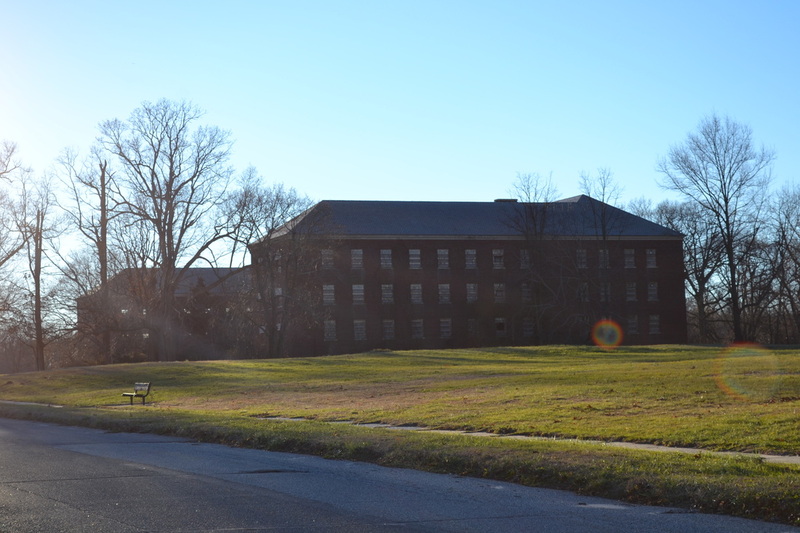 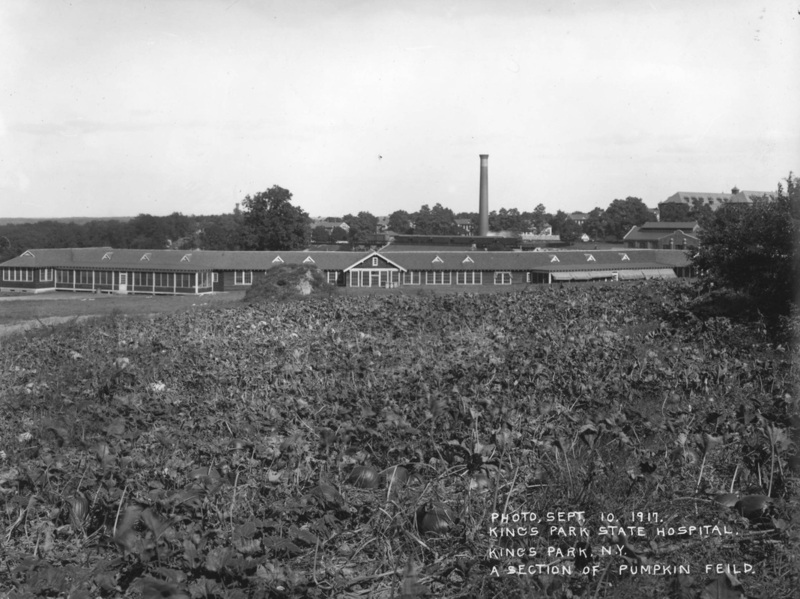 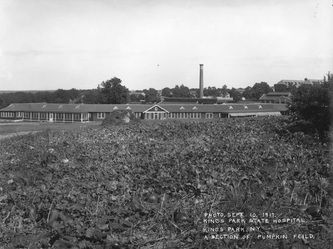 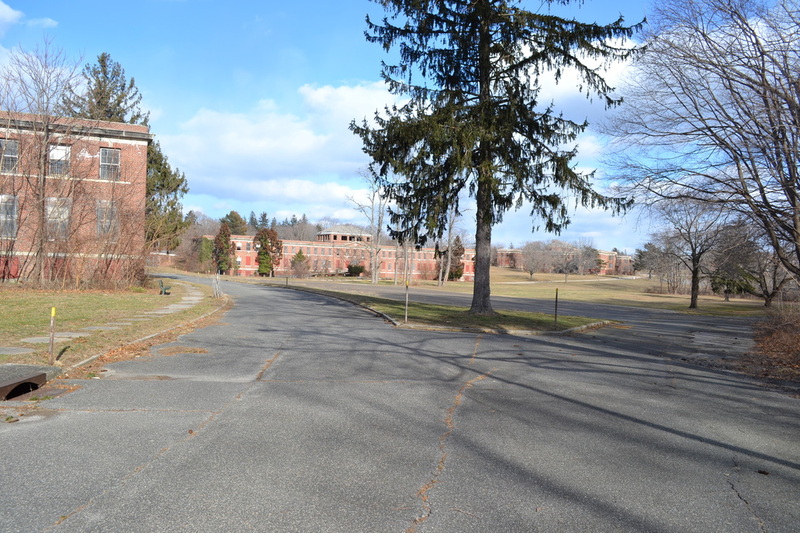 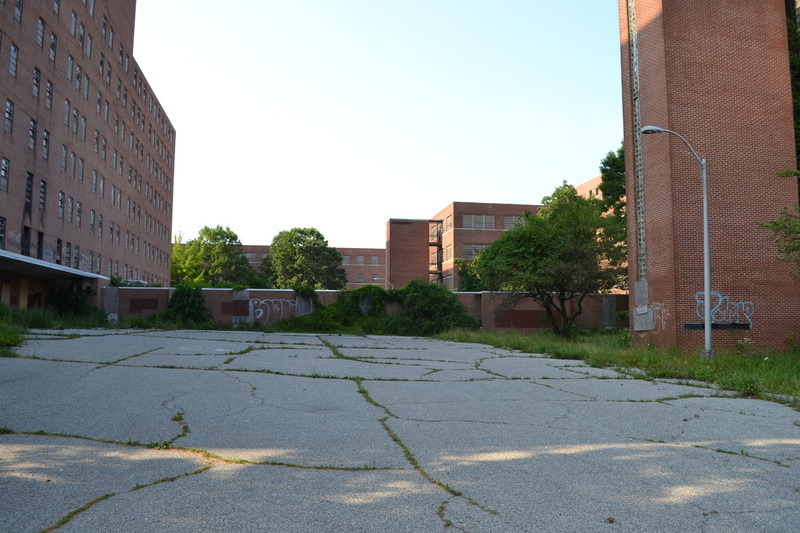 At one time this group of buildings was the most productive & useful group of buildings on the hospital grounds. 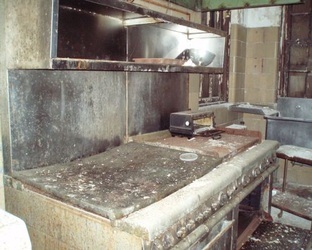 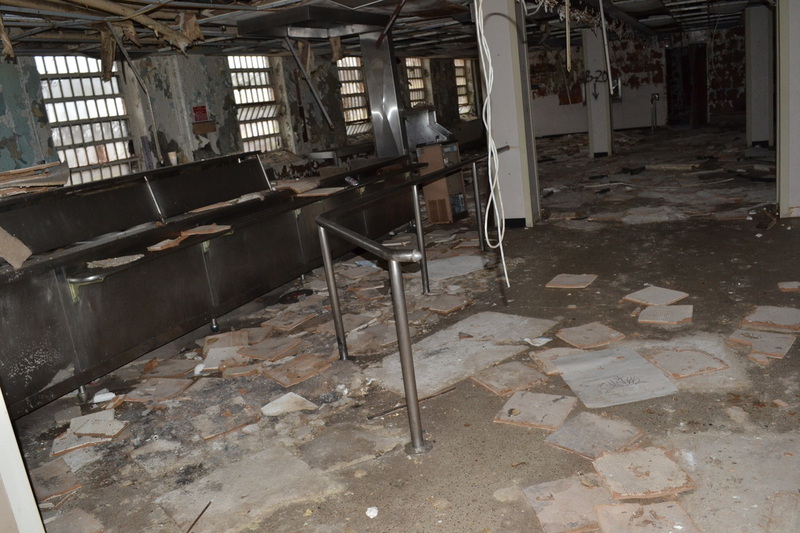 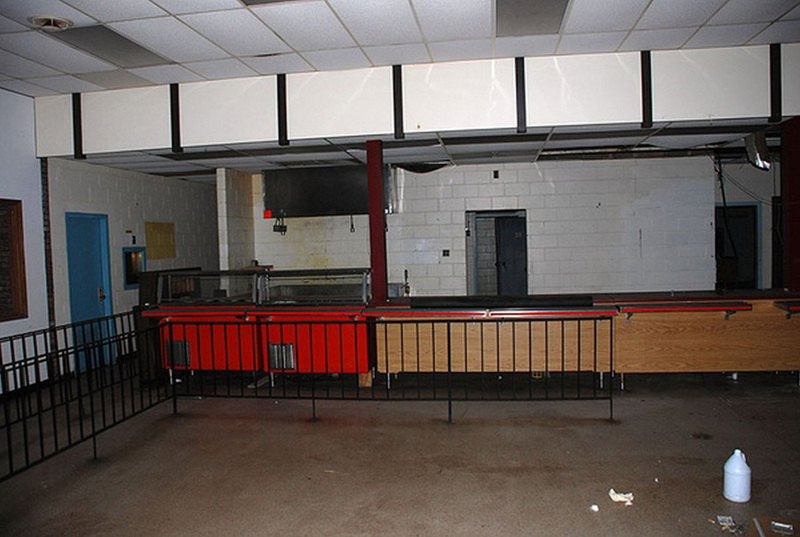 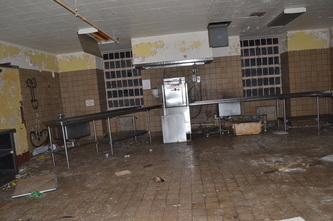 This is where most of the food came from that fed the thousands of patients & hundreds of employees. 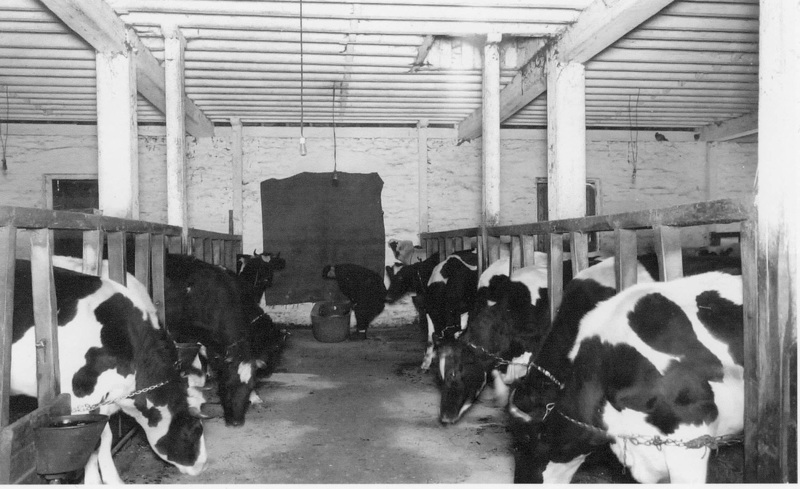 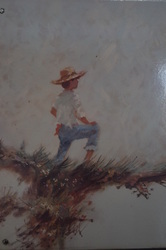 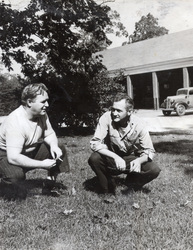 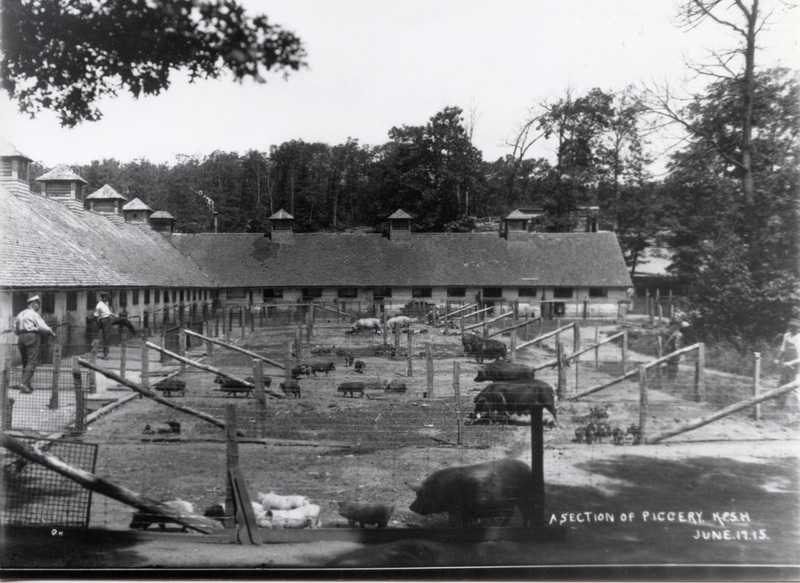 At one time you could find chickens, cows, horses, & pigs filling the stables & barns. 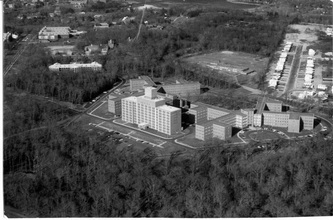 Phased out during the late 1950s none of these buildings exist anymore. 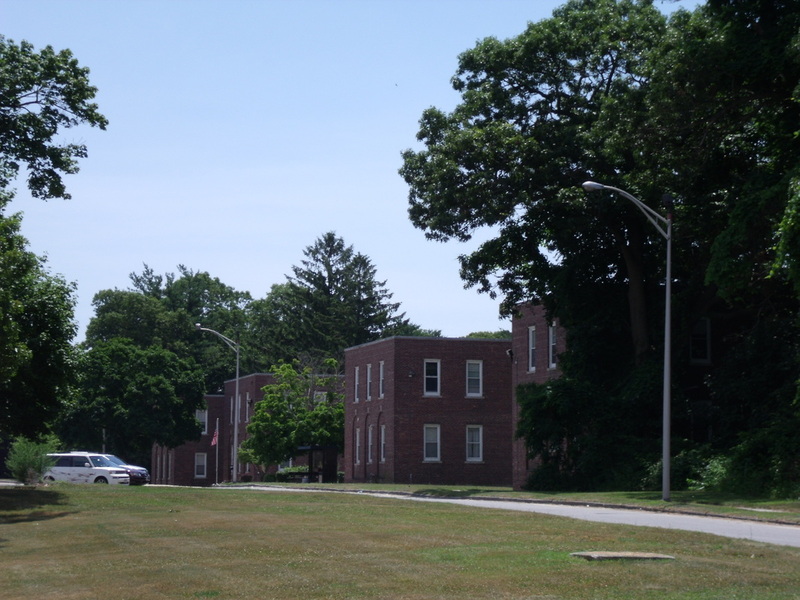 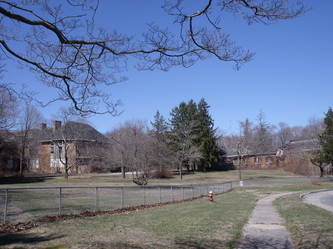 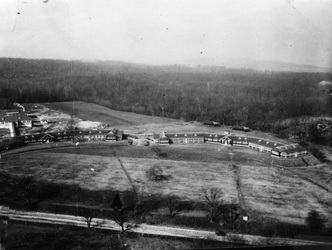 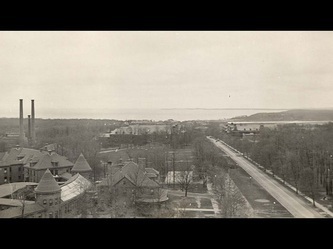 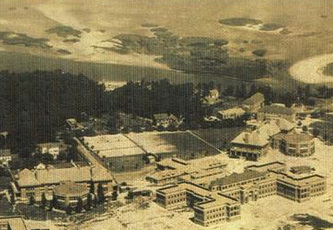 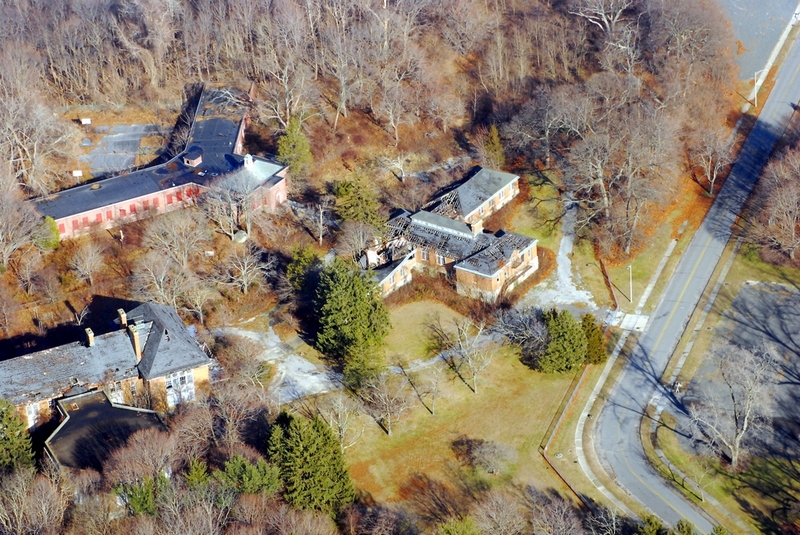 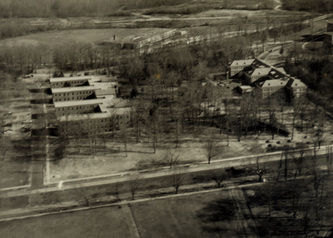 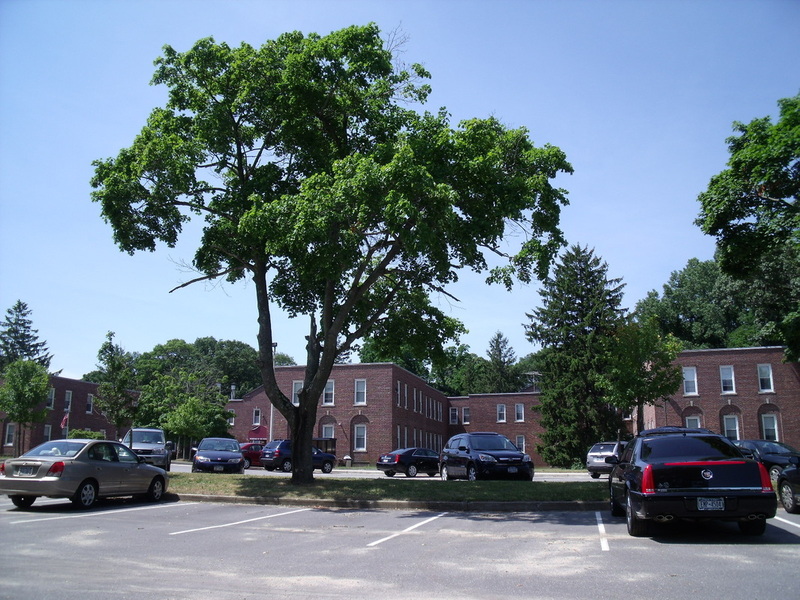 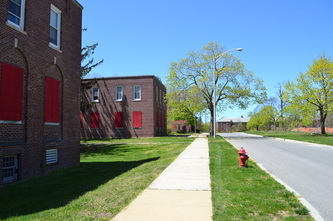 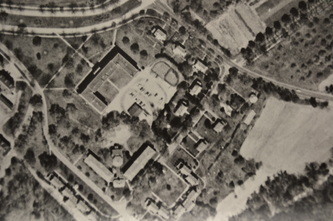 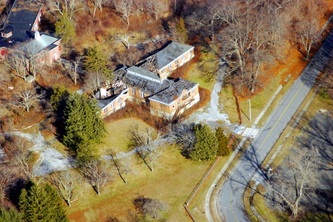 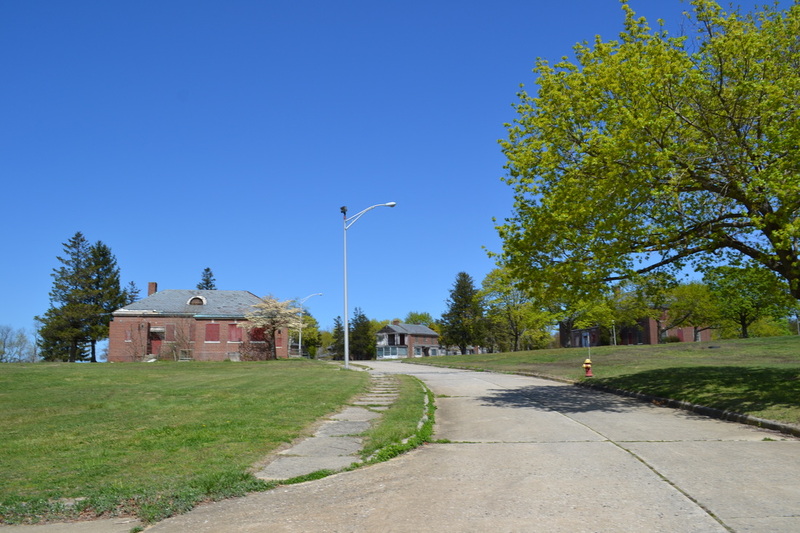 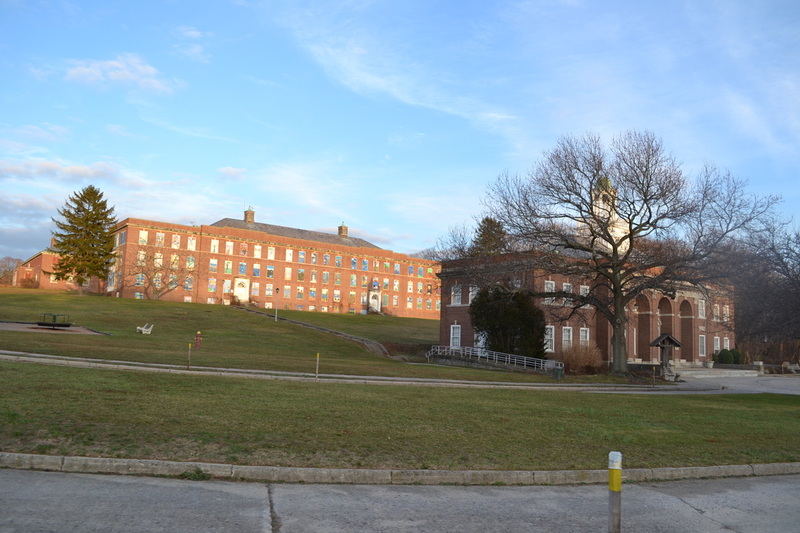 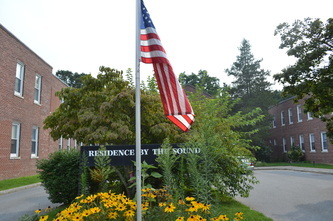 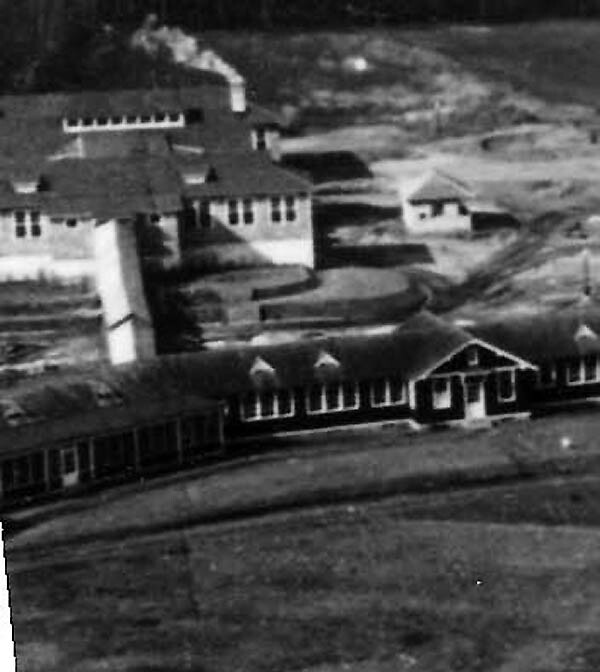 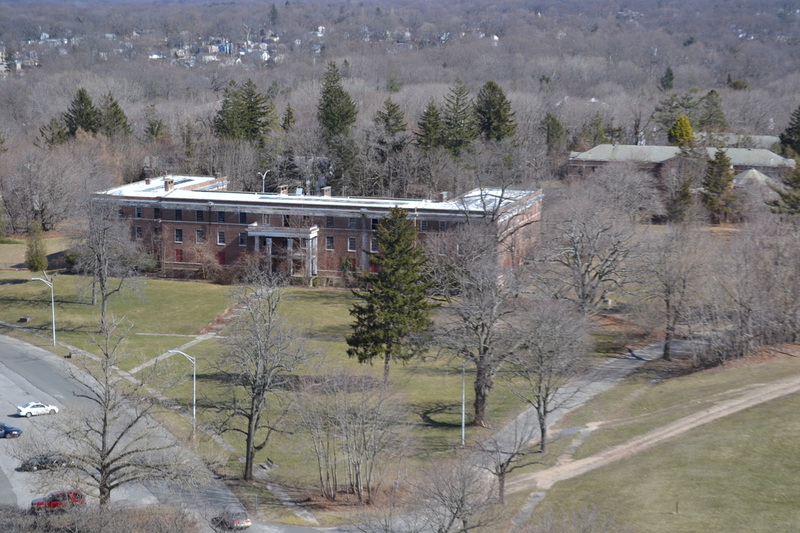 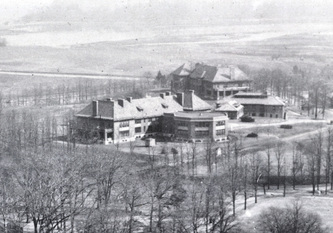 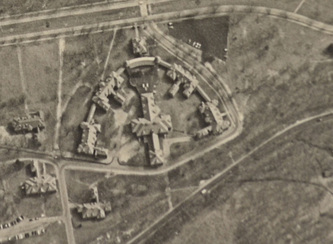 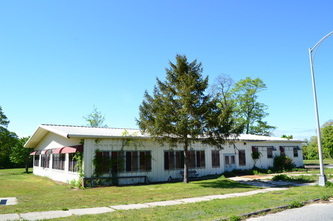 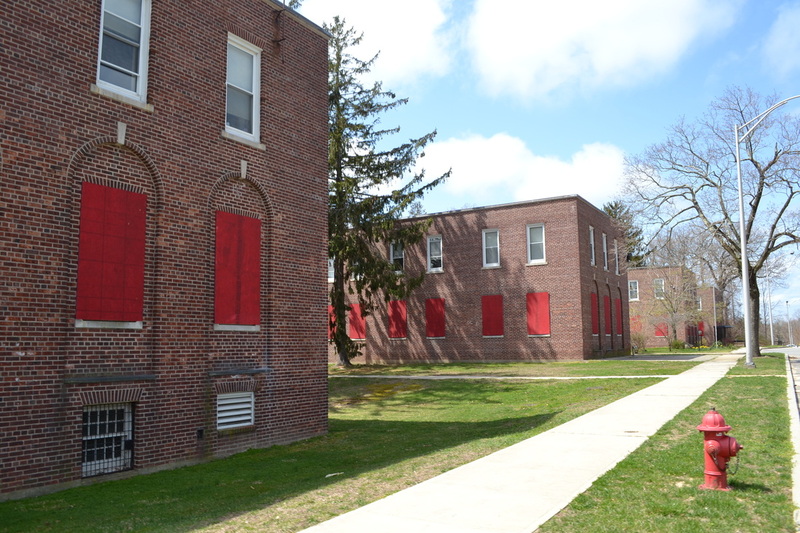 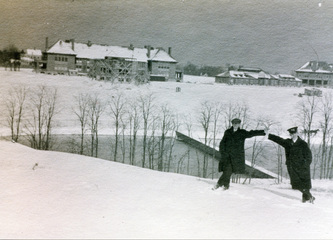 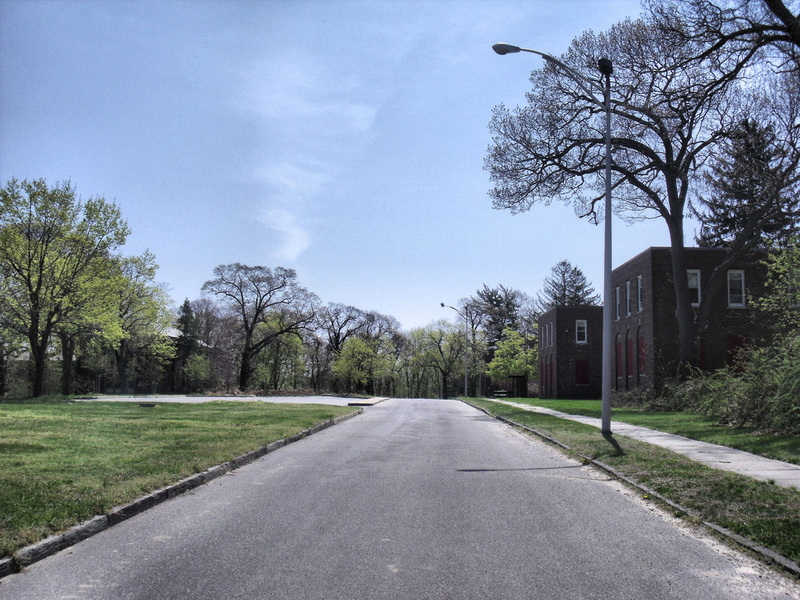 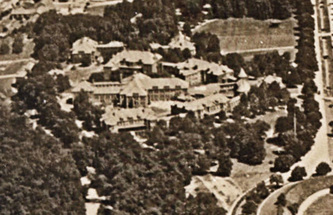 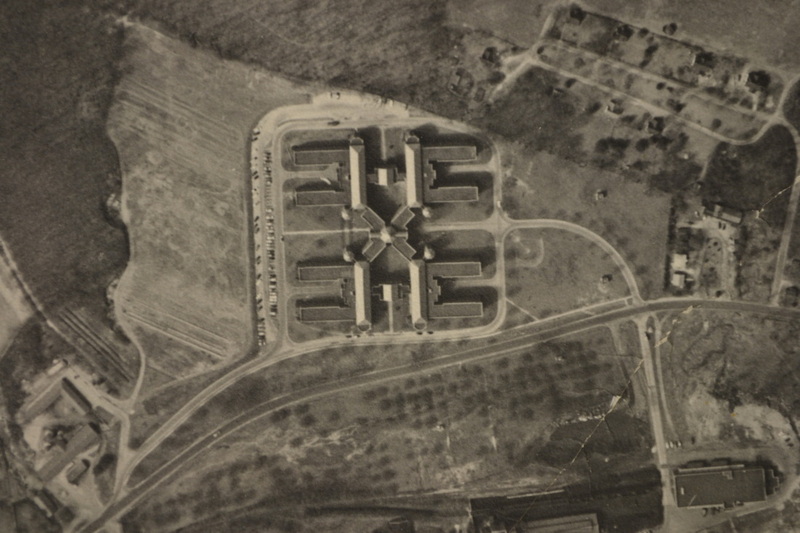 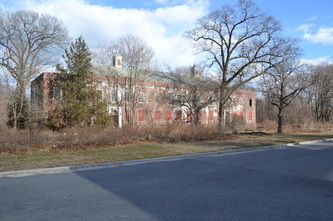 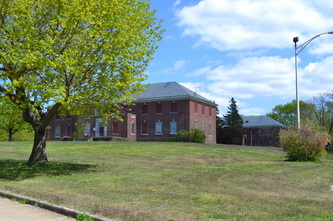 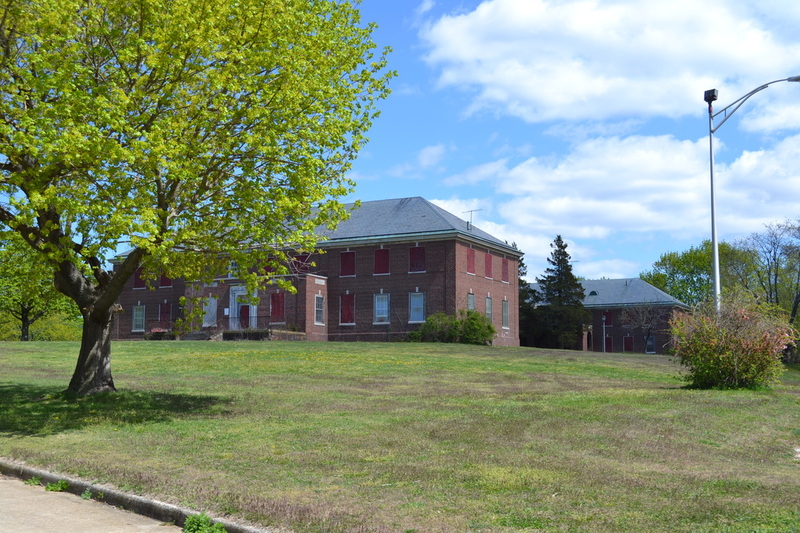 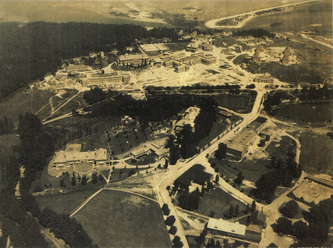 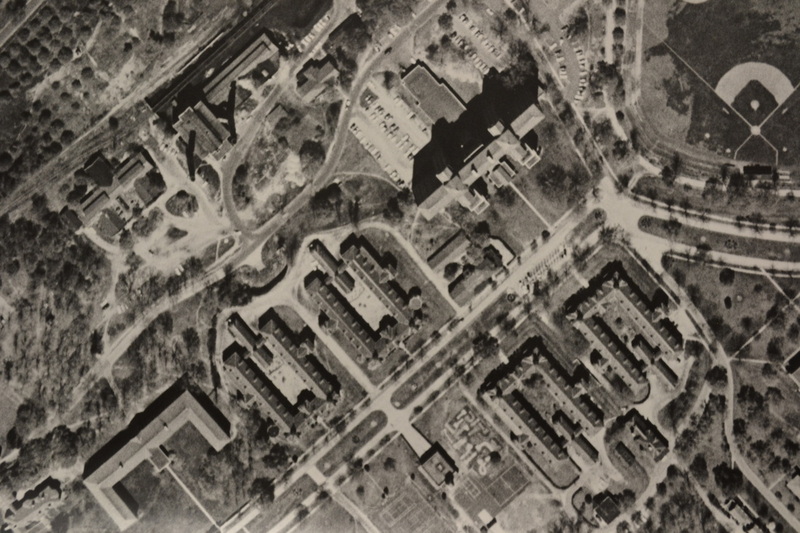 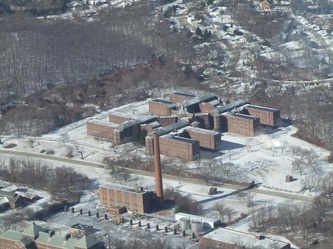 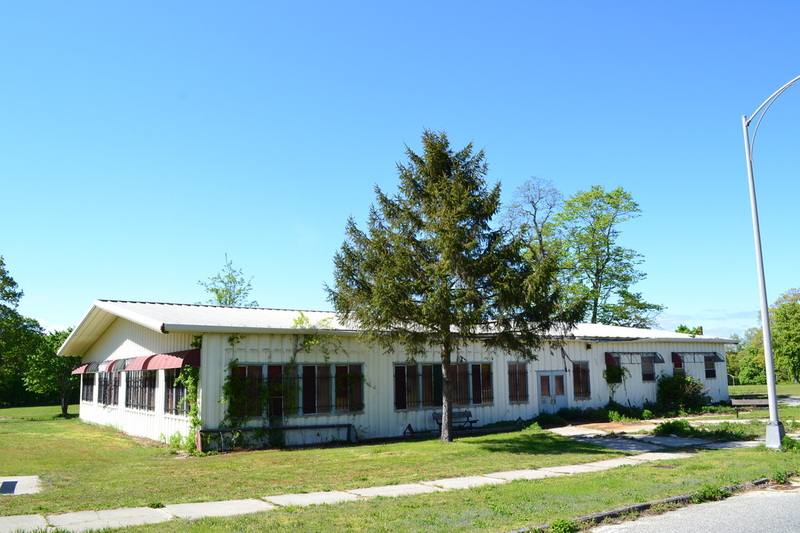 Added between the mid-1920s and early 1930s this large group of buildings was built to house veterans of the U.S. military in need of mental health care. 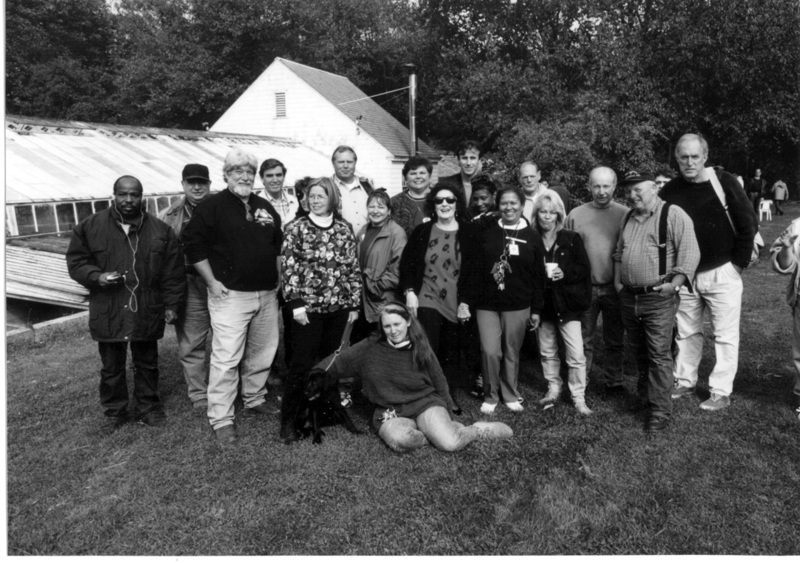 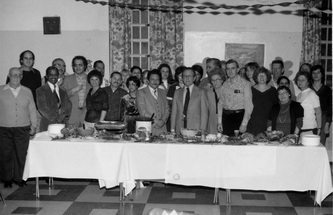 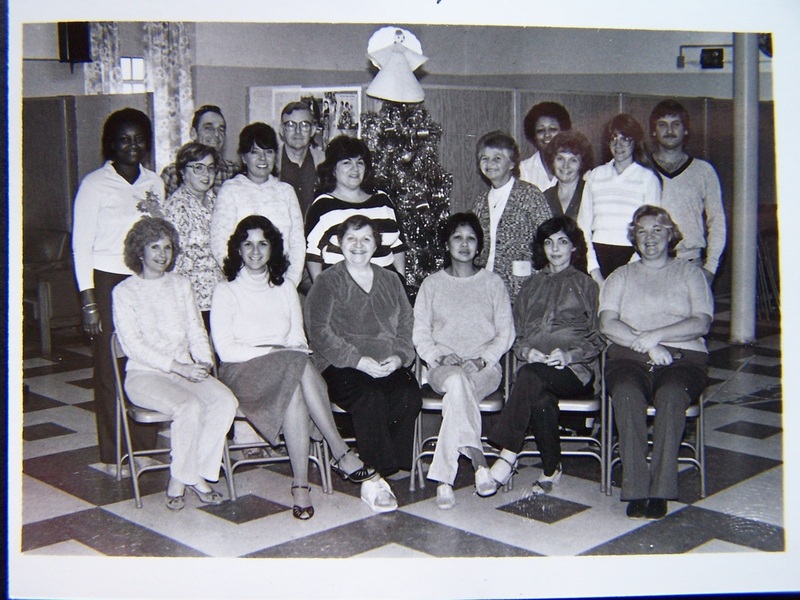 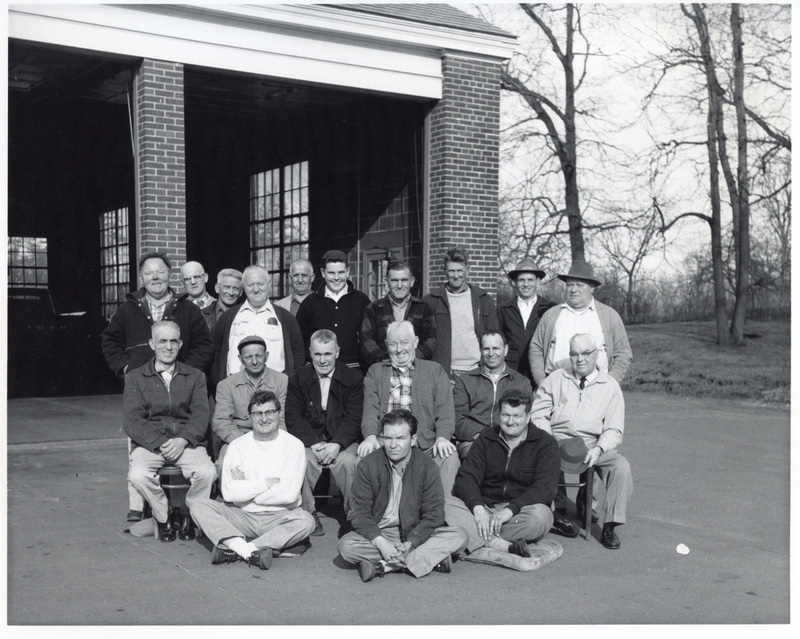 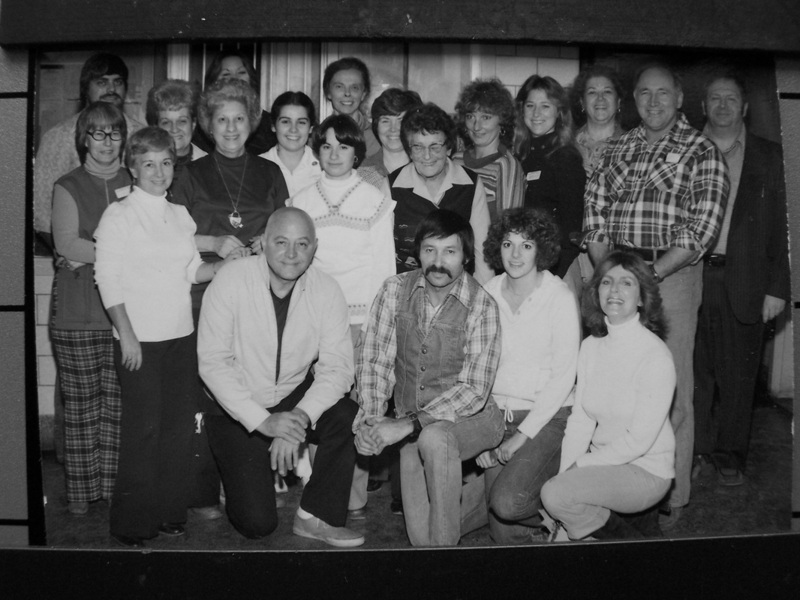 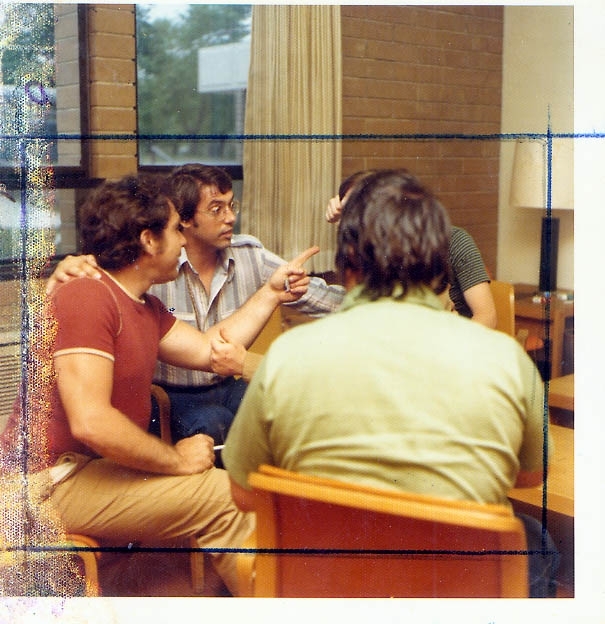 The buildings of Group 3 were incorporated into this large group when it was established. 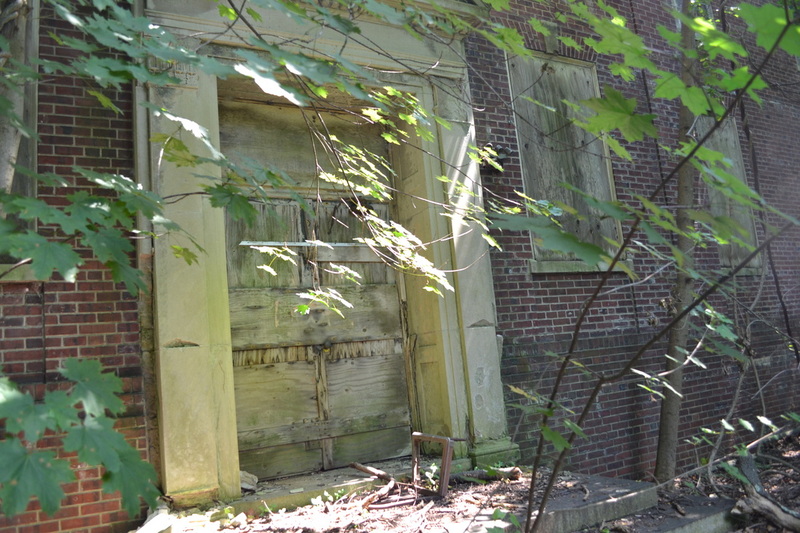 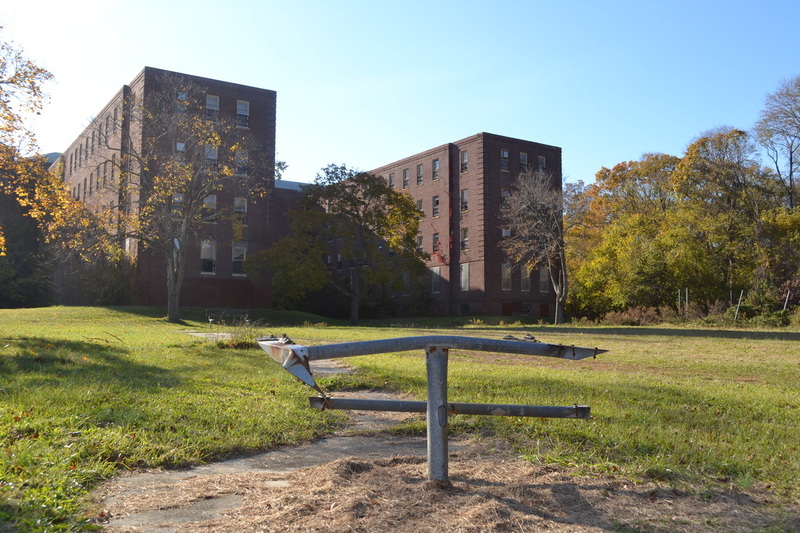 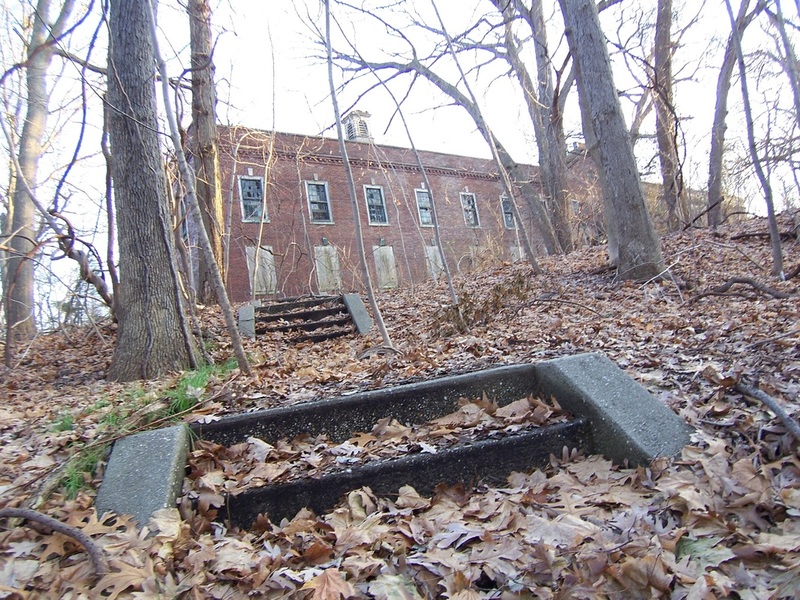 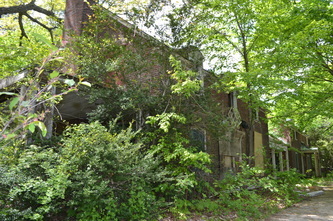 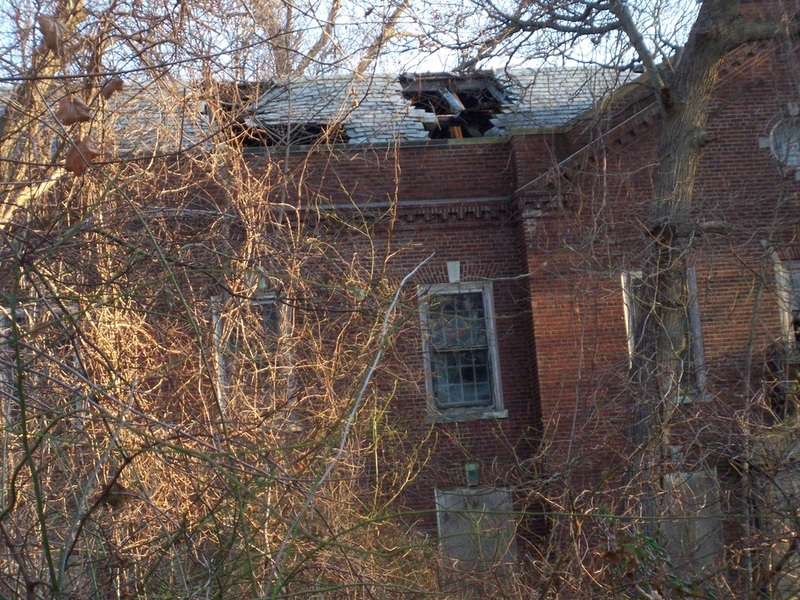 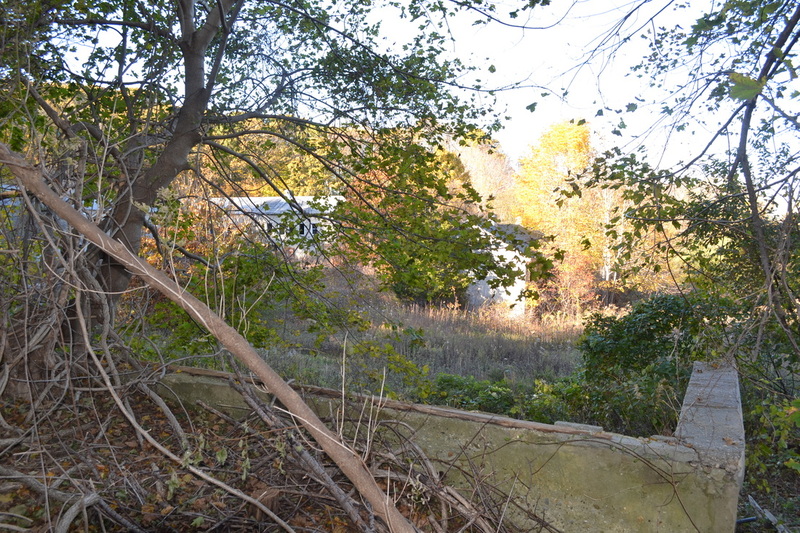 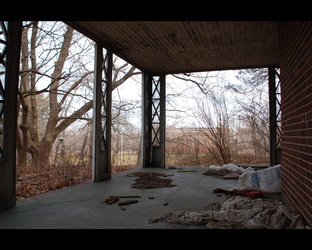 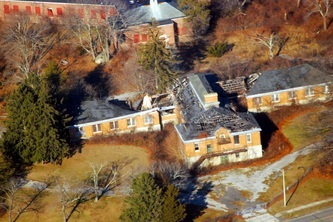 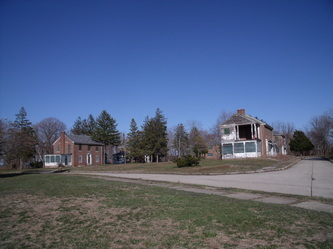 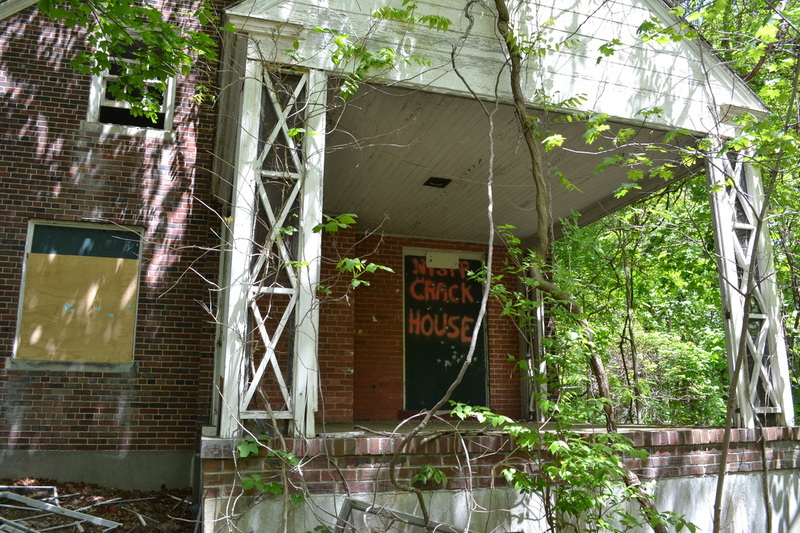 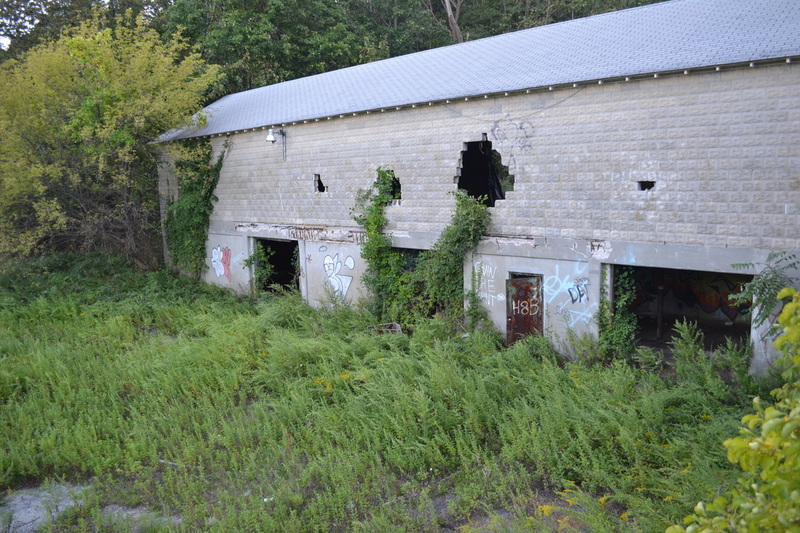 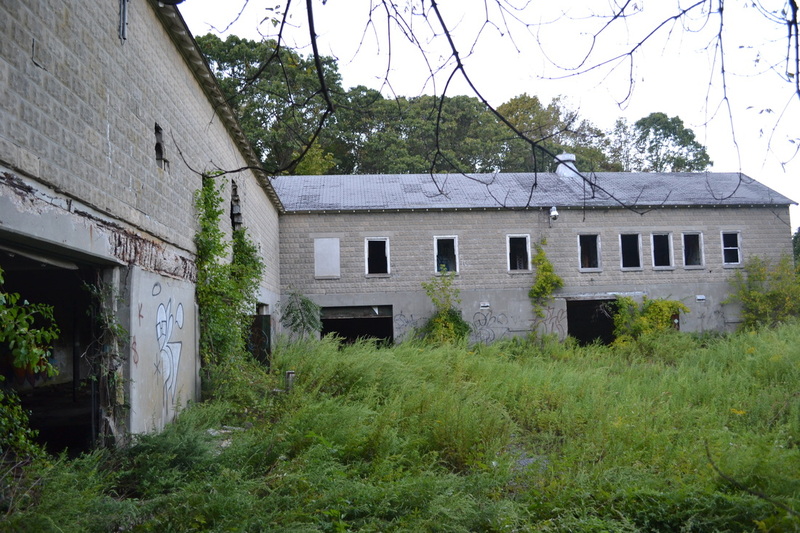 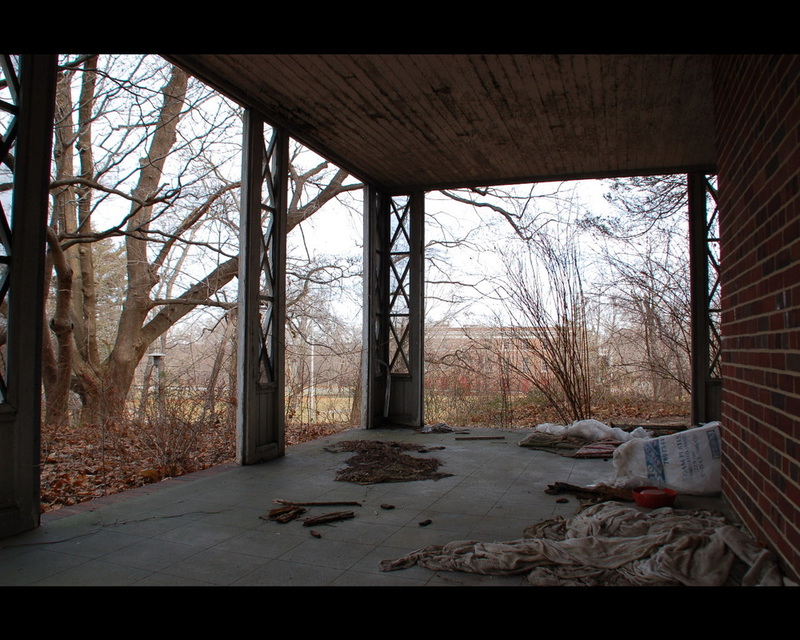 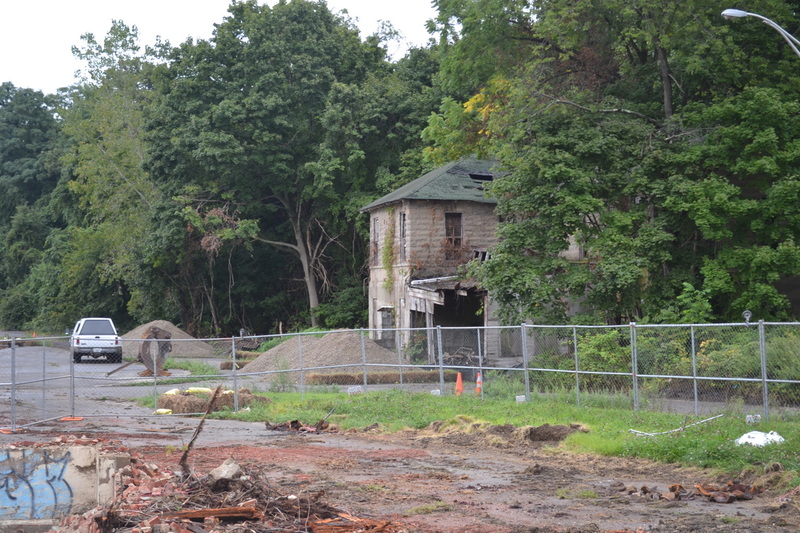 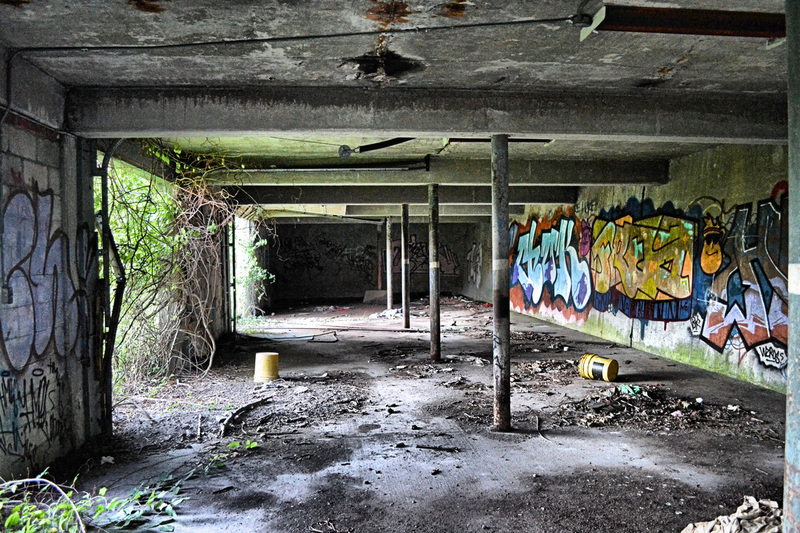 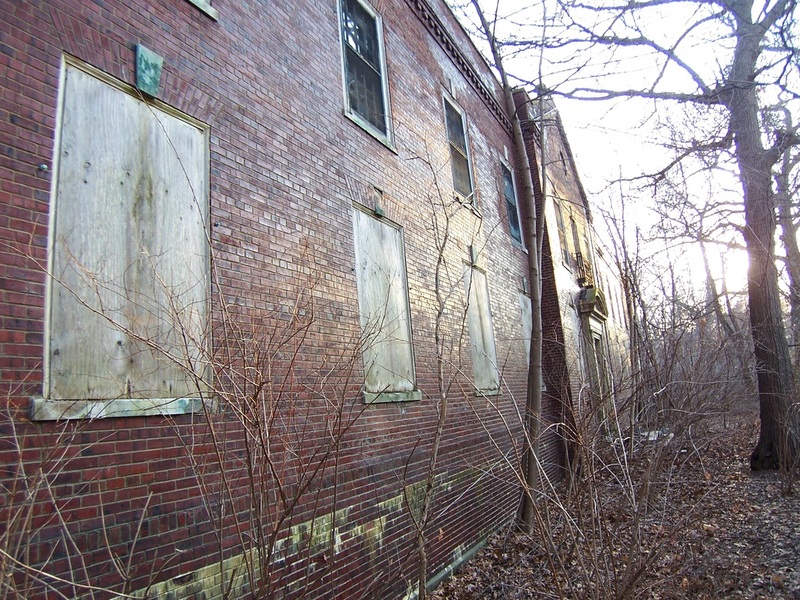 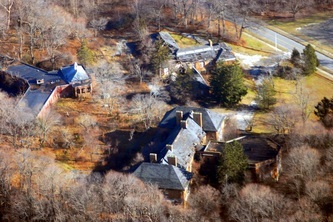 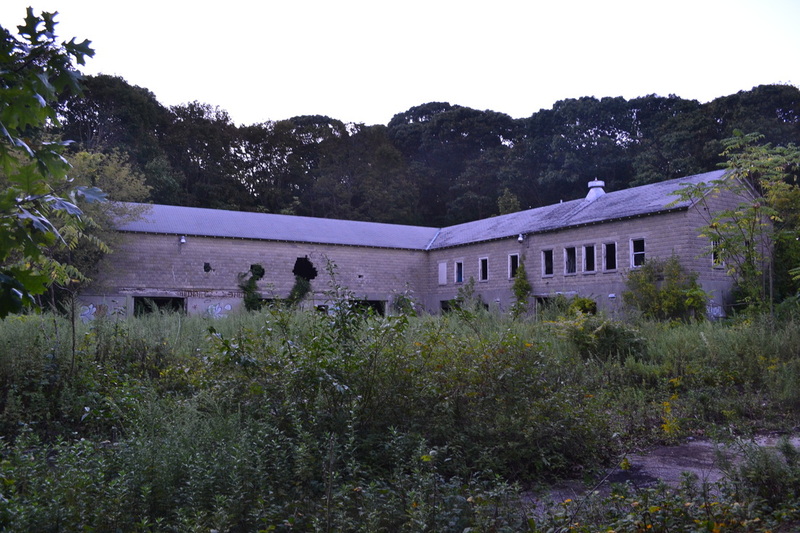 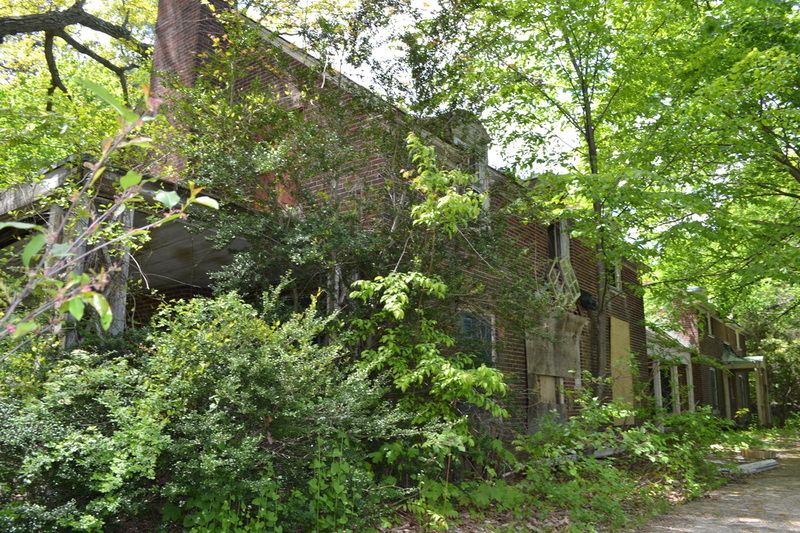 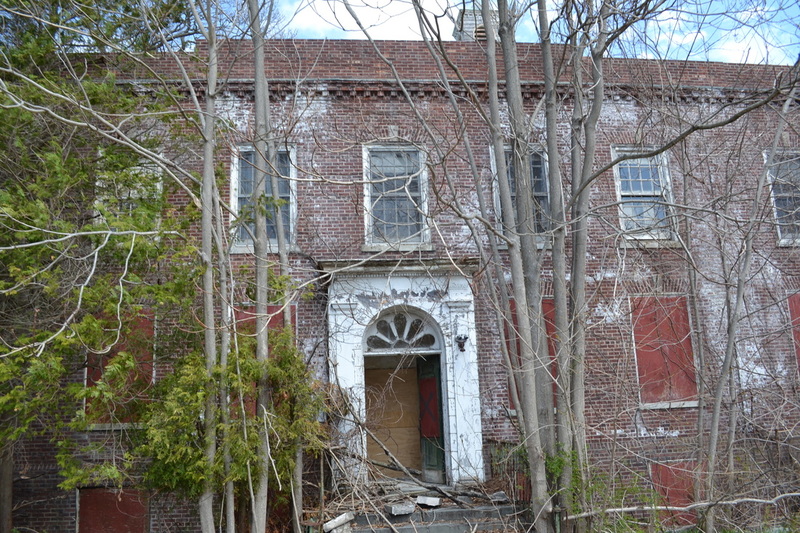 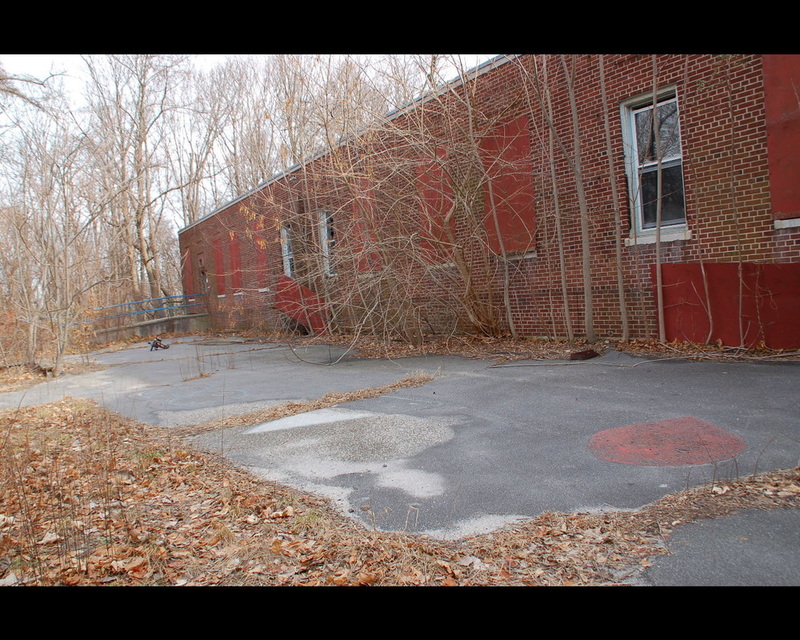 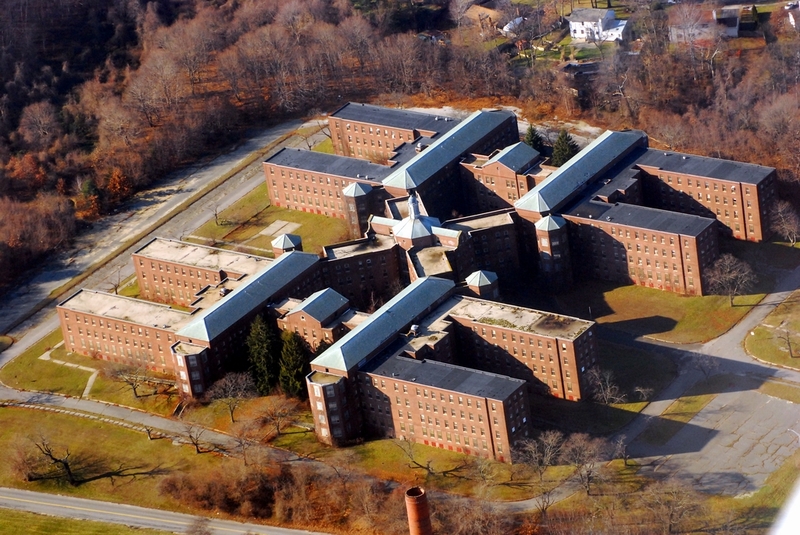 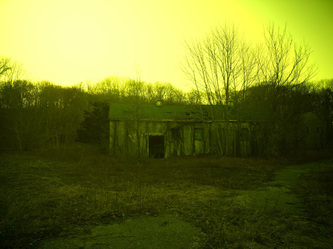 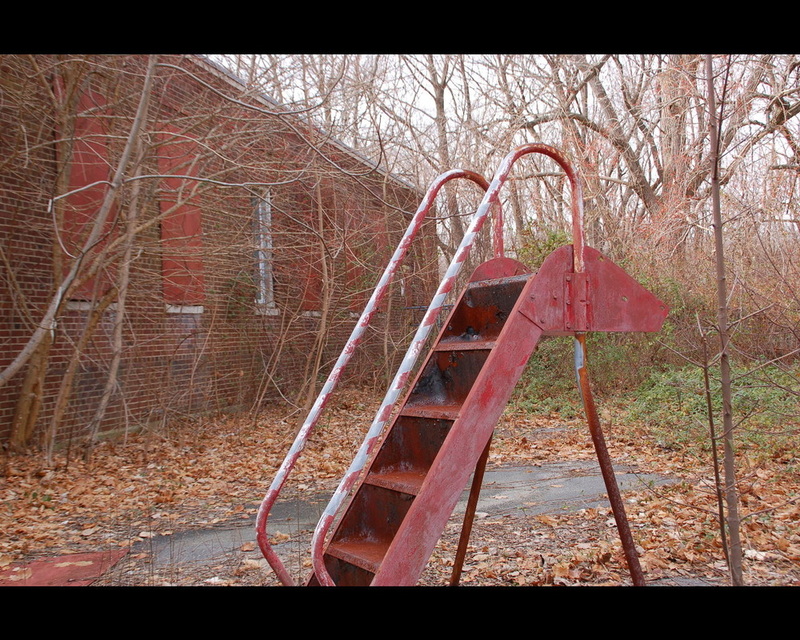 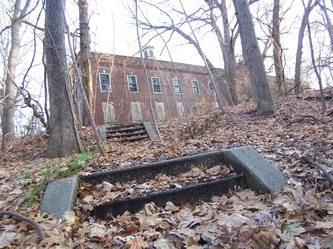 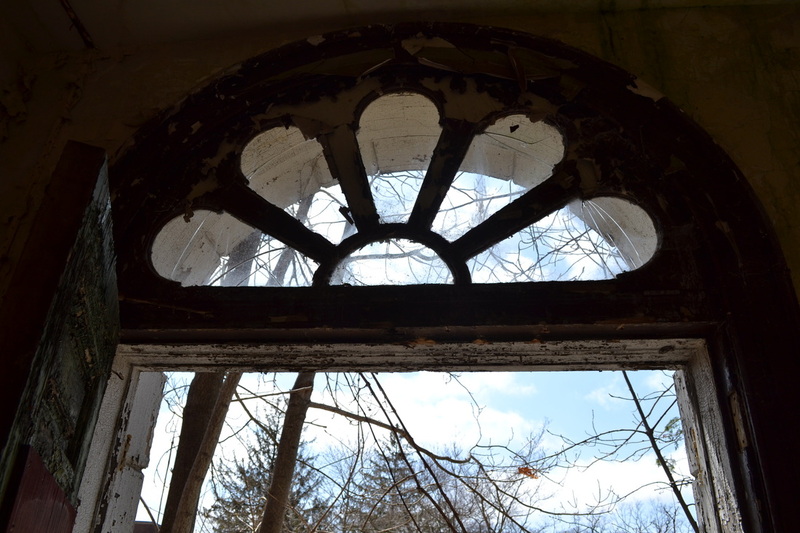 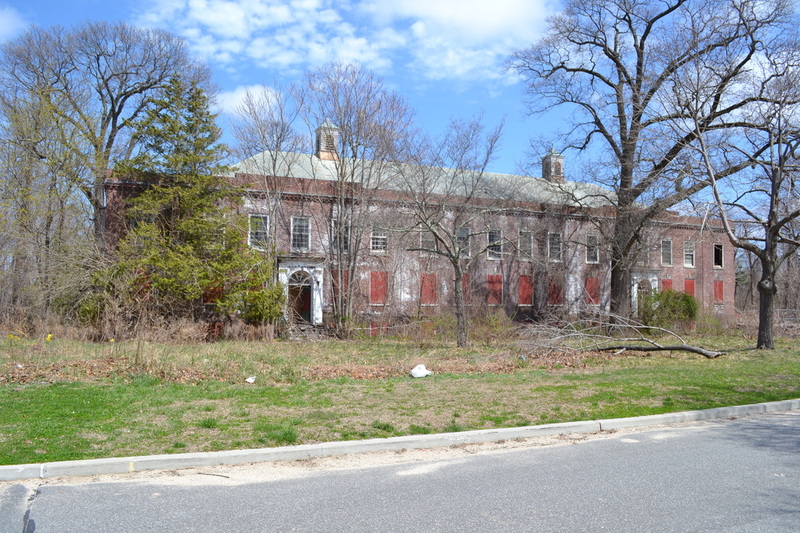 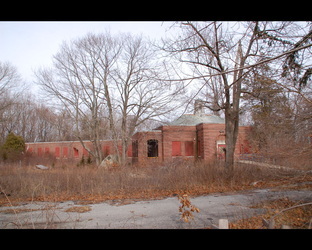 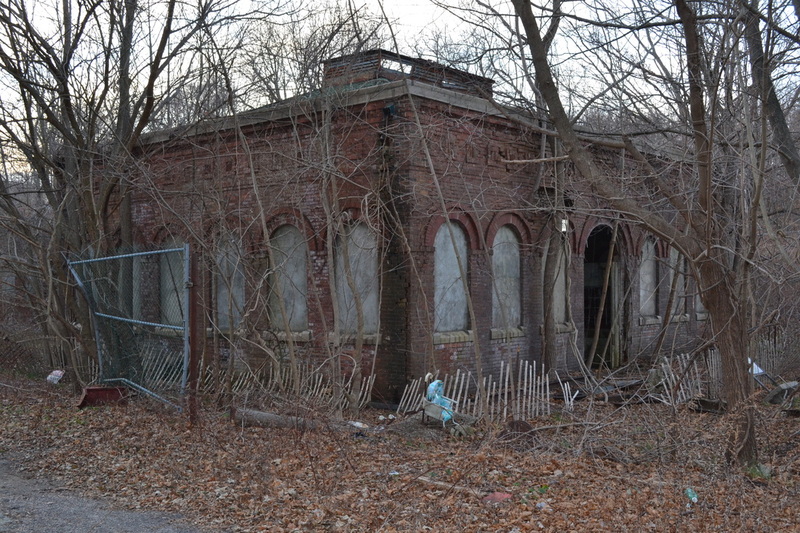 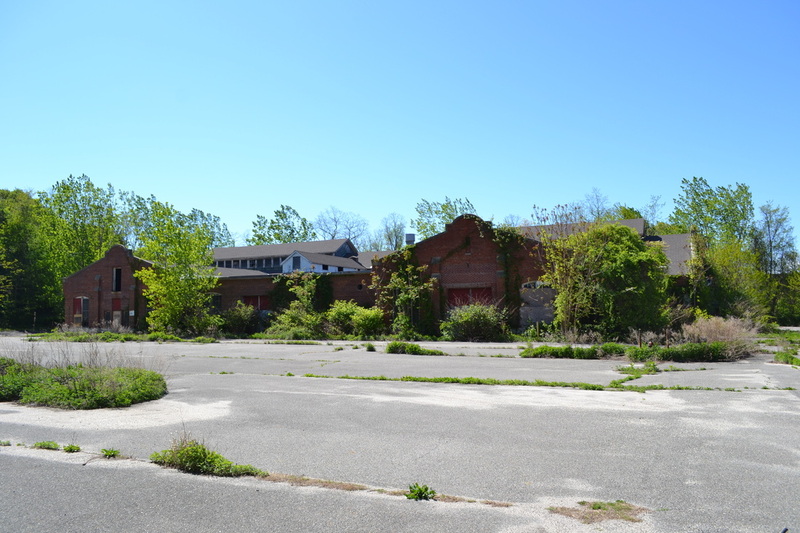 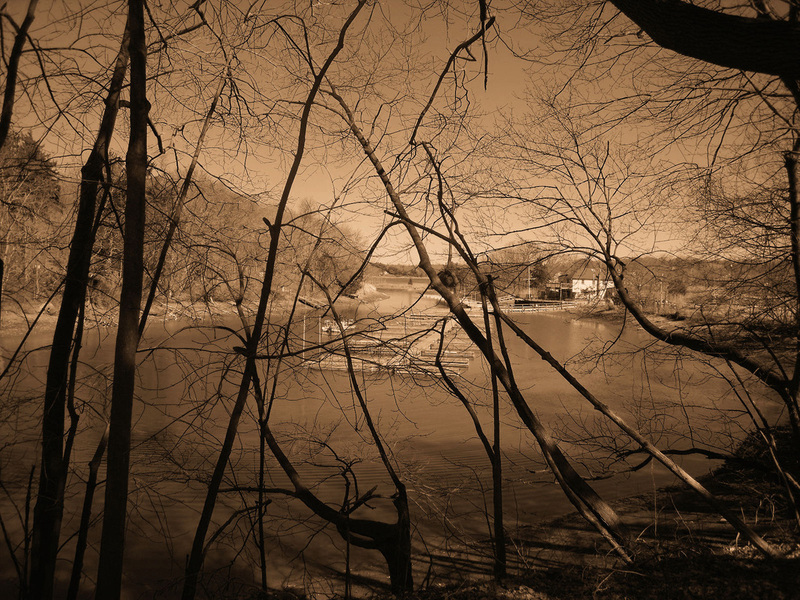 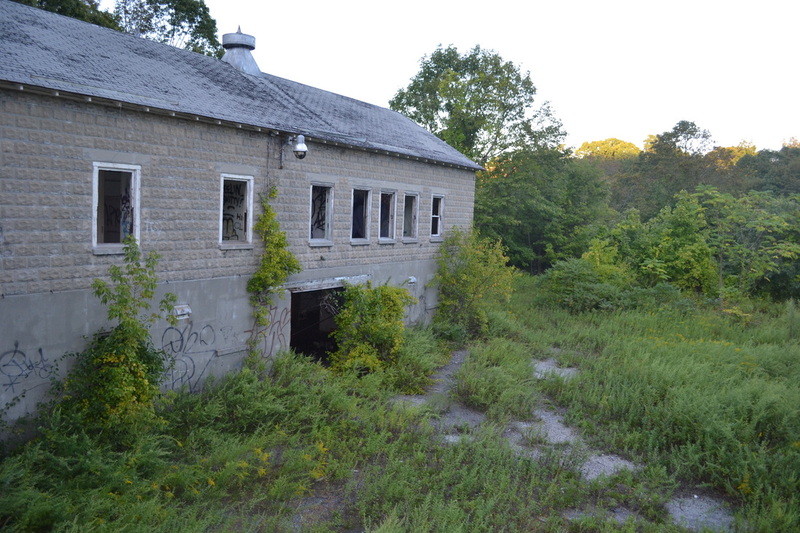 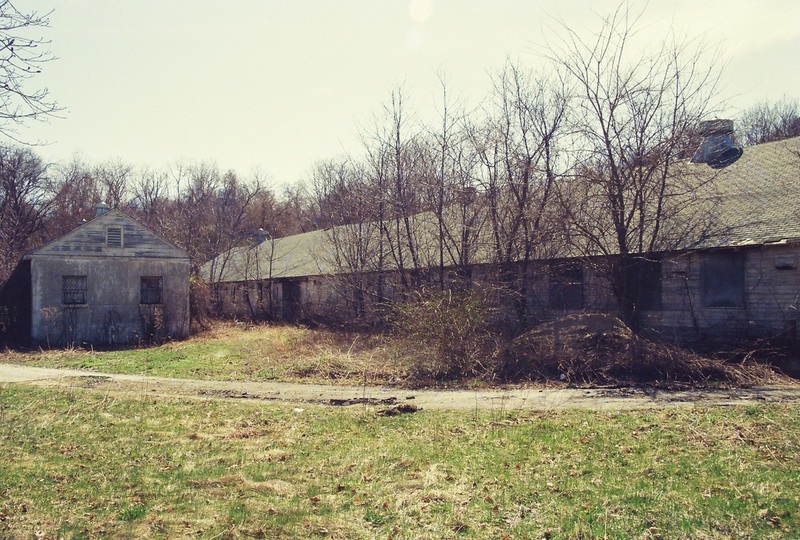 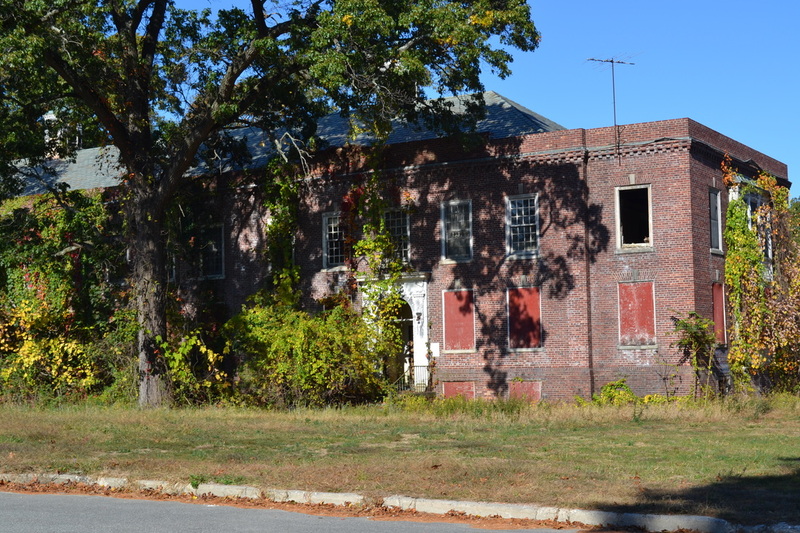 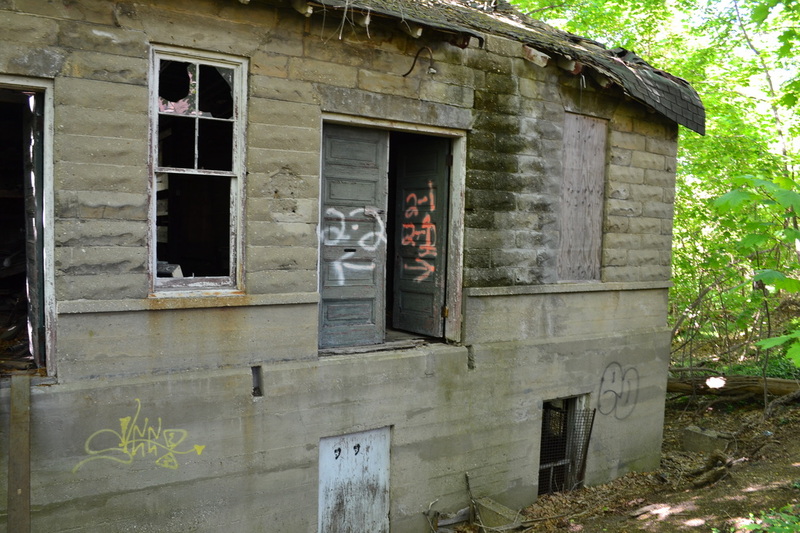 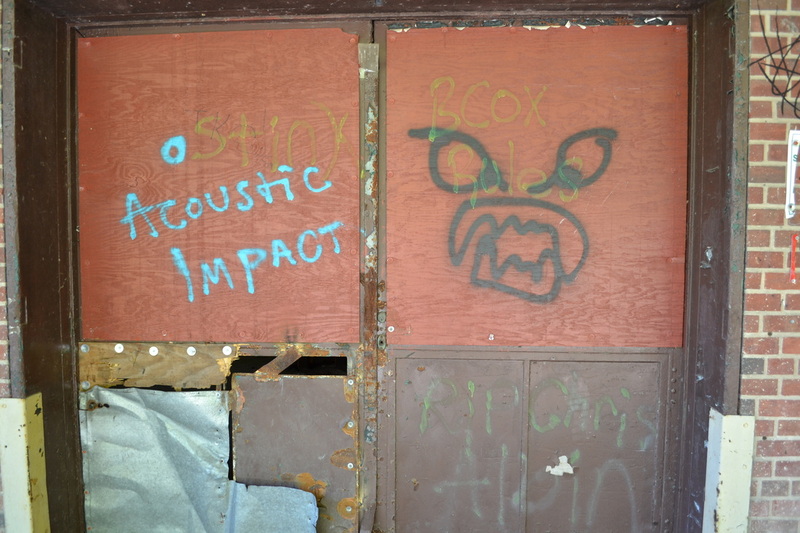 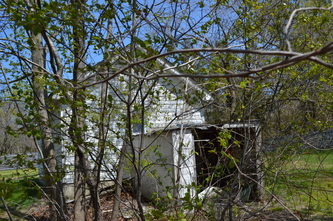 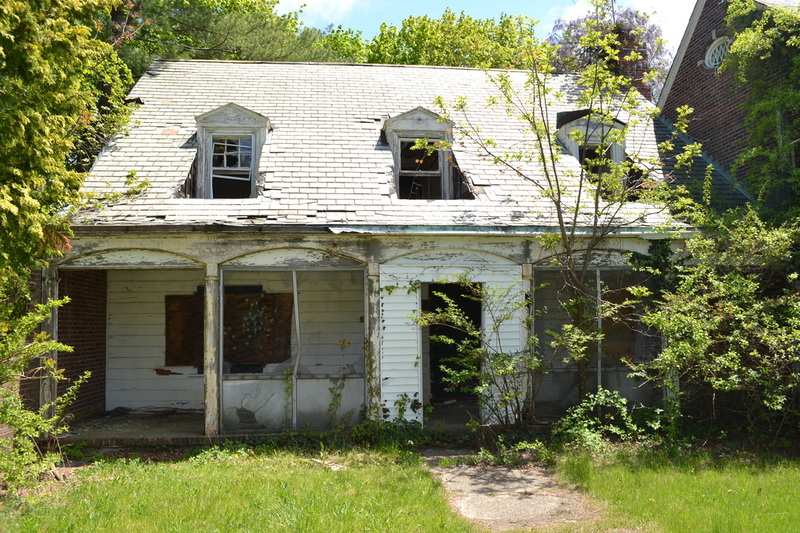 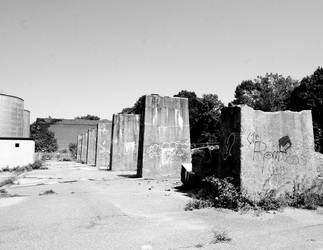 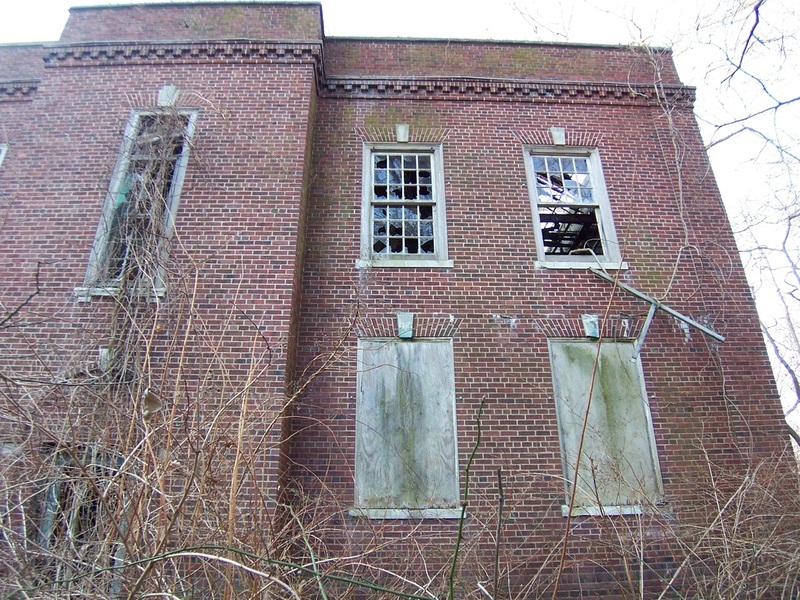 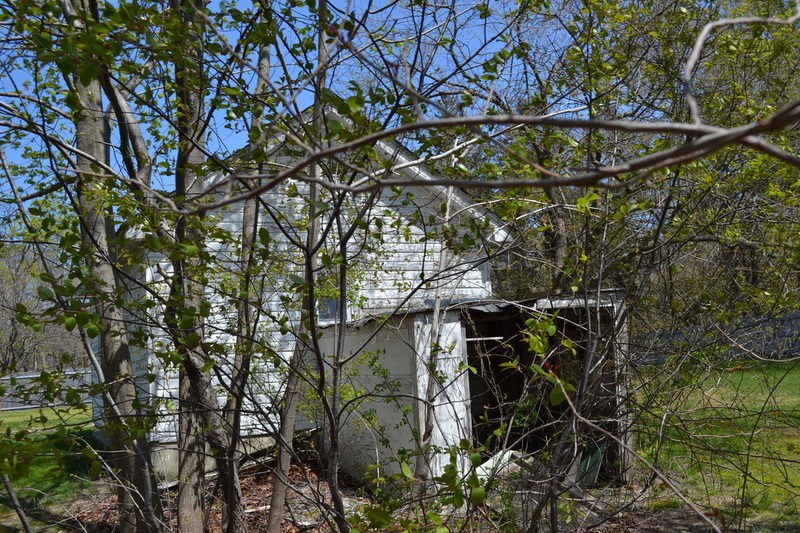 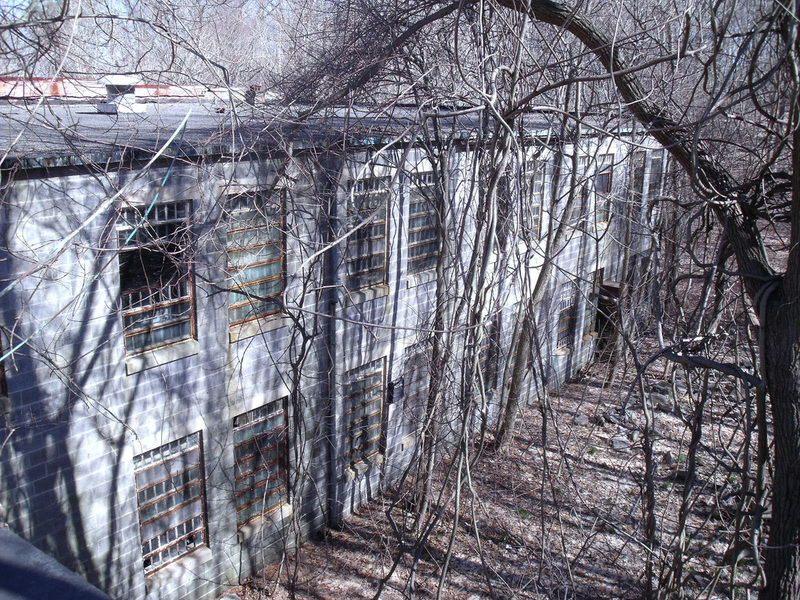 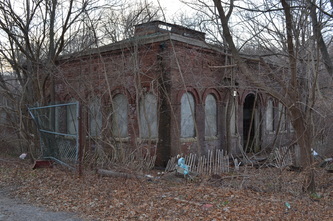 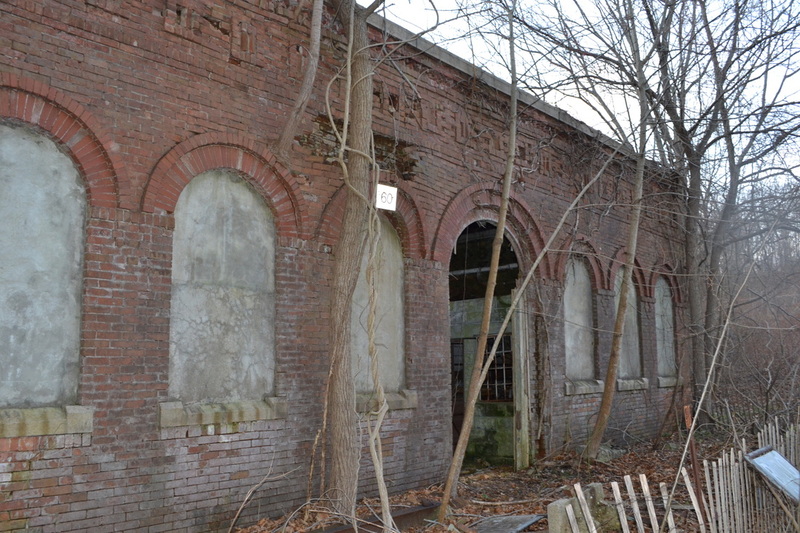 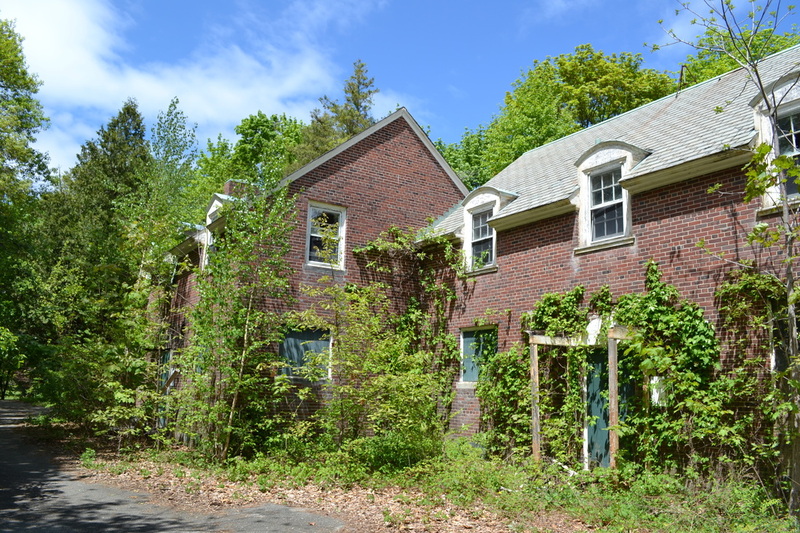 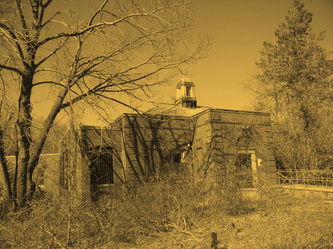 These abandoned buildings now make up the better part of the Nissequogue River State Park. 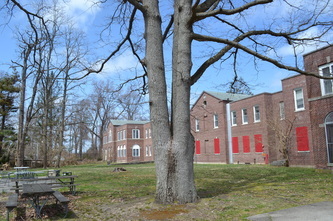 Only the former admissions center, Building 125, remains open as a park office & museum. 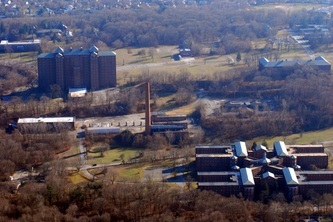 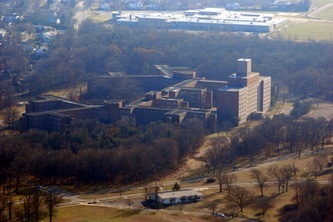 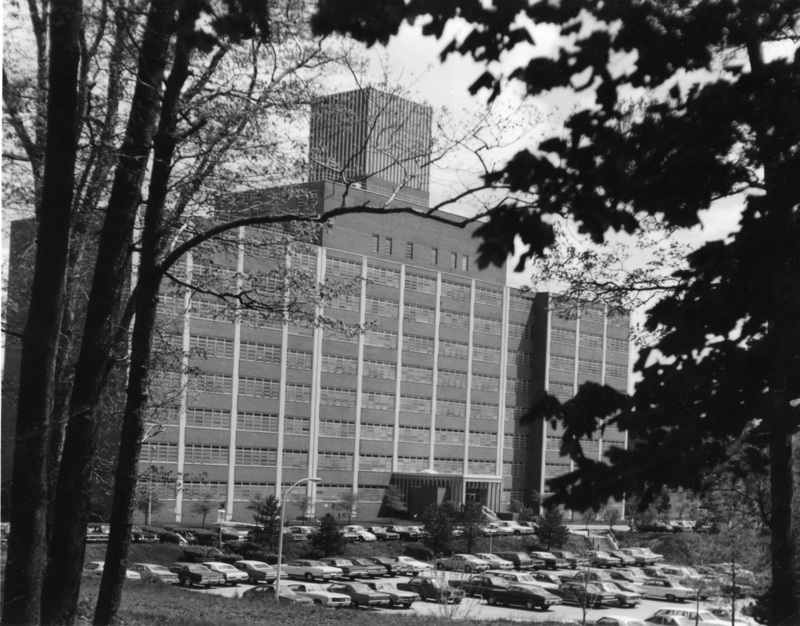 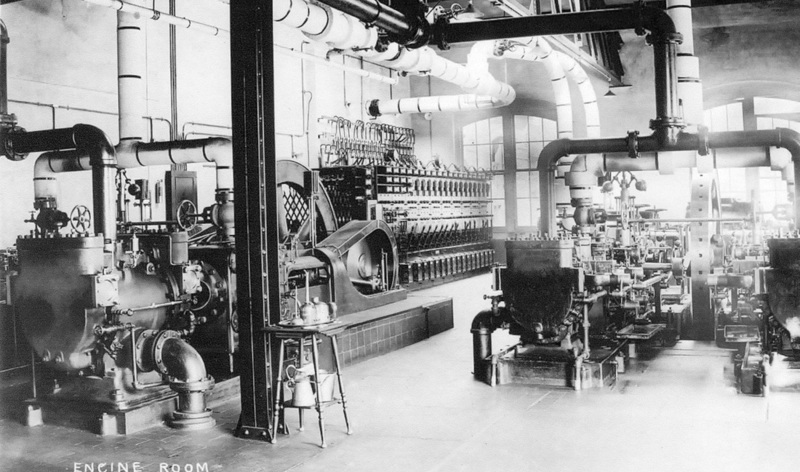 Building 6 was the second power plant to be used taking over from the original power plant at Building 59. 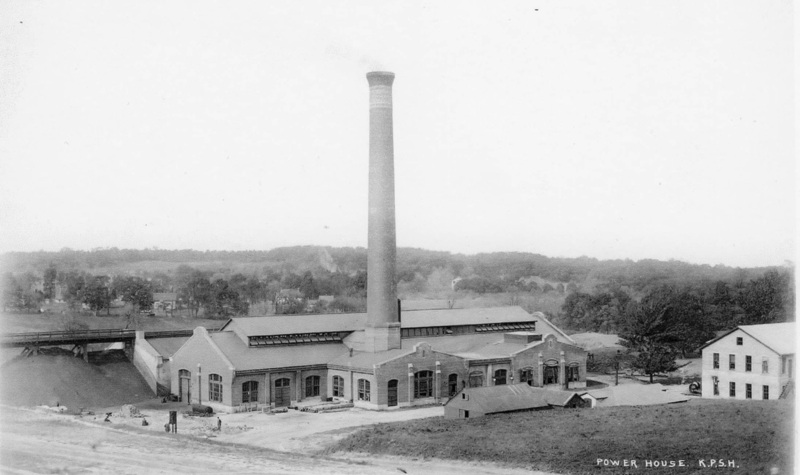 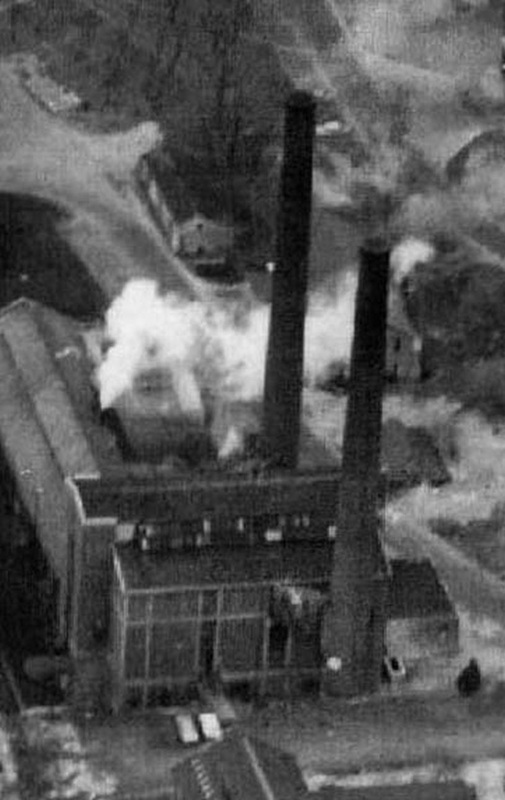 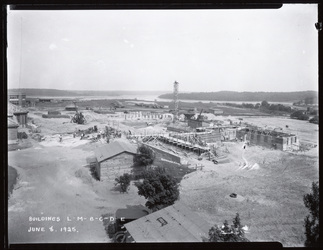 A new boiler house with twin smokestacks was added to Building 6 as Building 84. 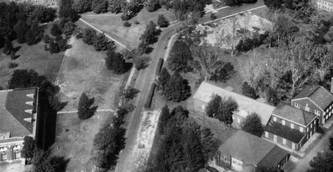 Both stood near the railroad spur. 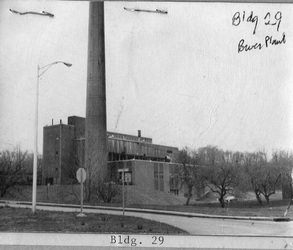 On the other side of the spur a new power plant was built as Building 29 to replace Buildings 6 and 84, which were then removed. 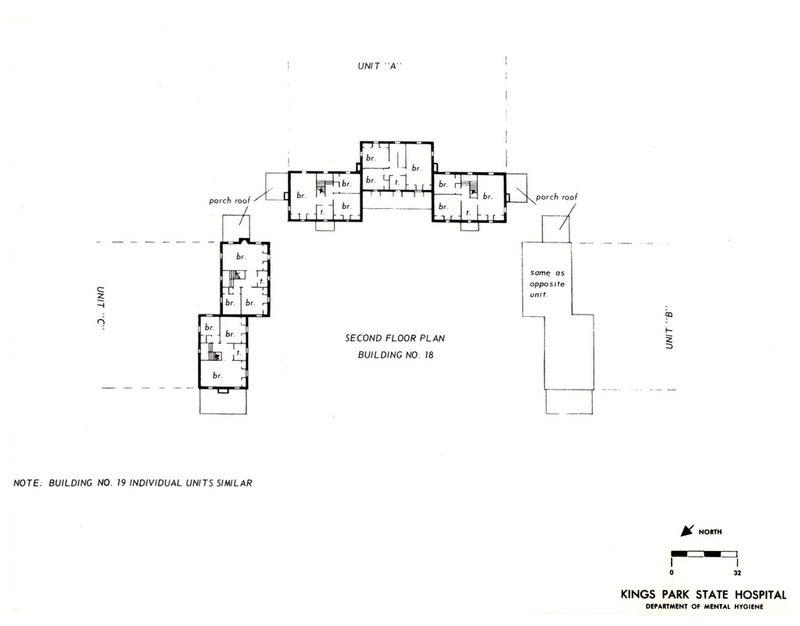 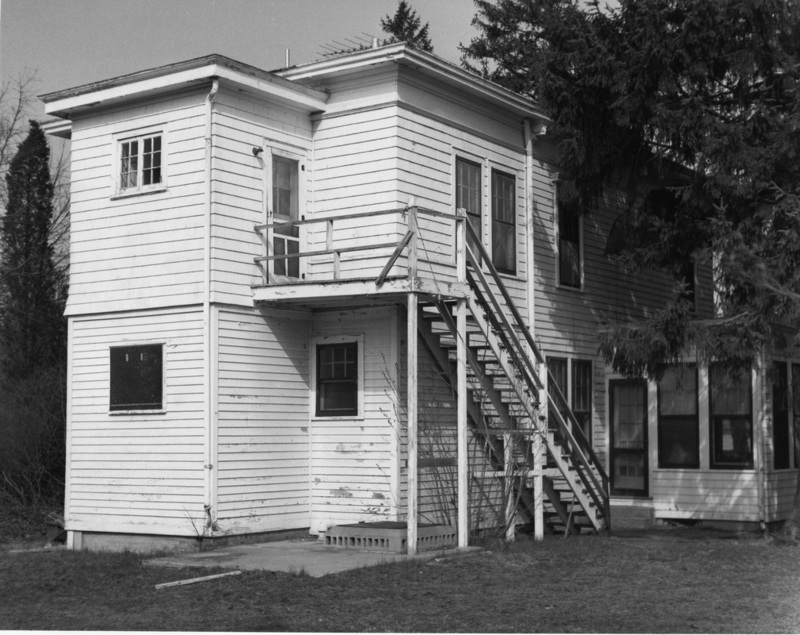 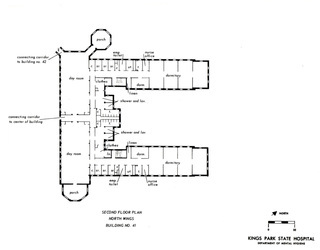 Building 85, a small steam pipe junction house, was renumbered as Building 6. 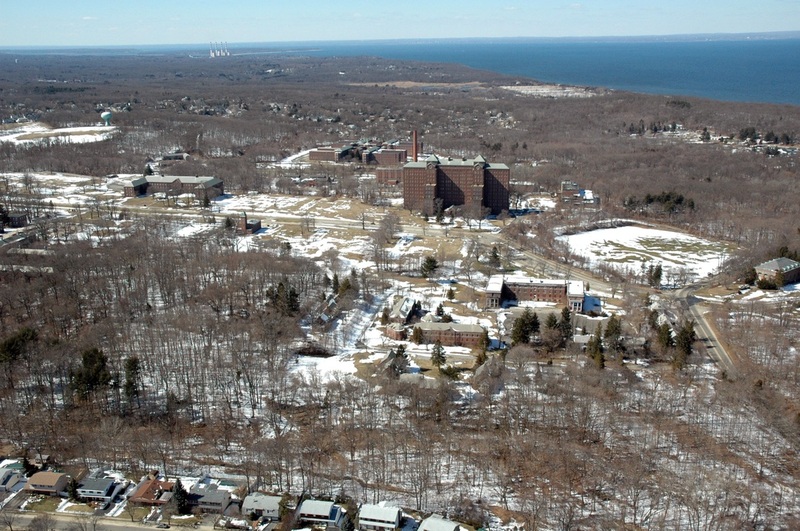 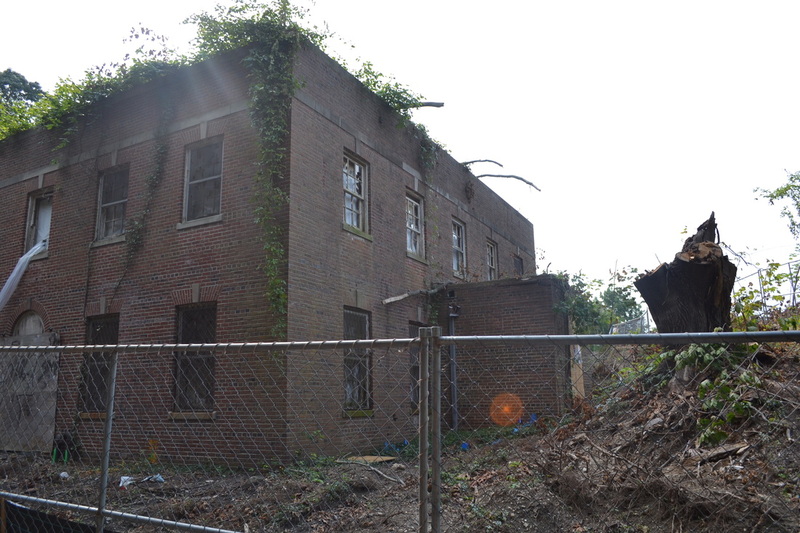 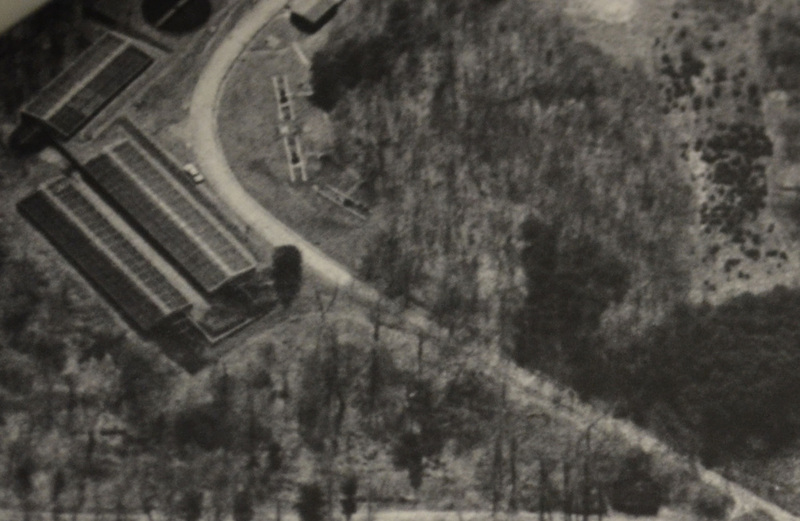 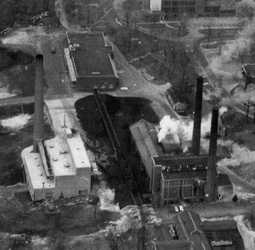 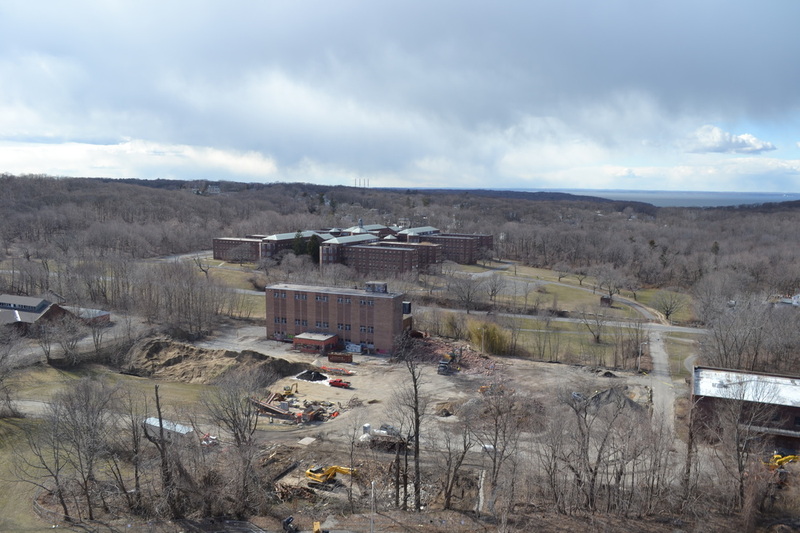 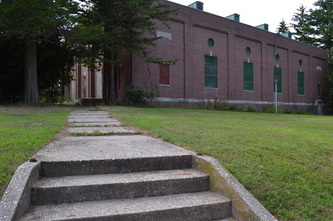 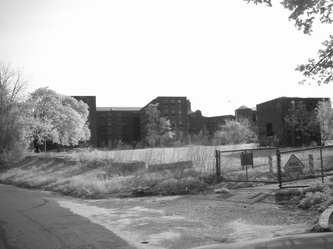 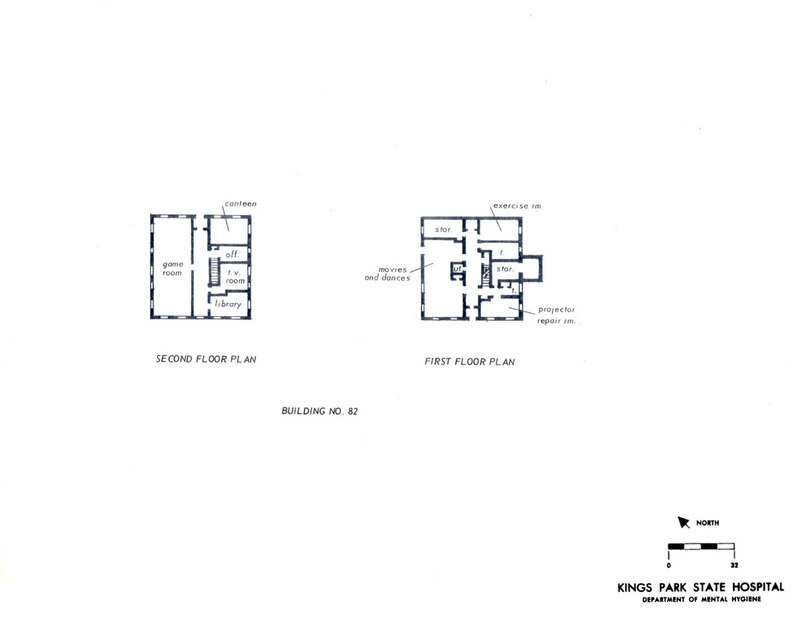 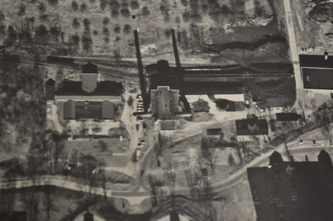 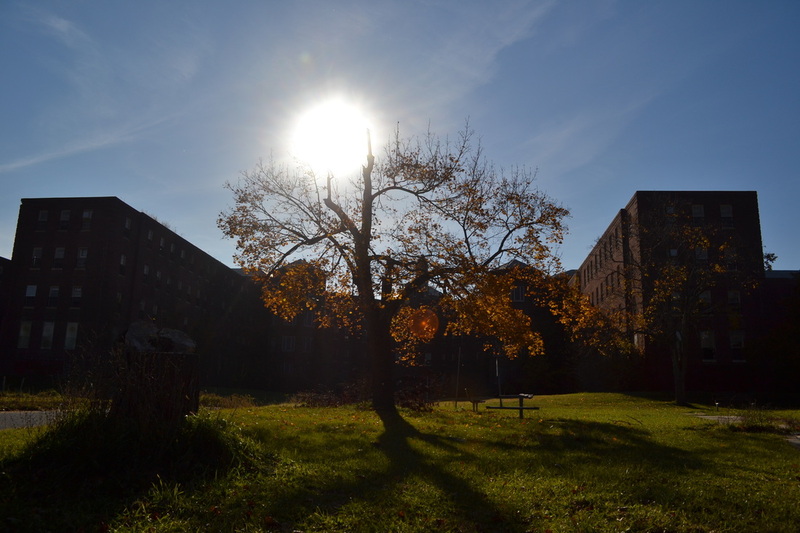 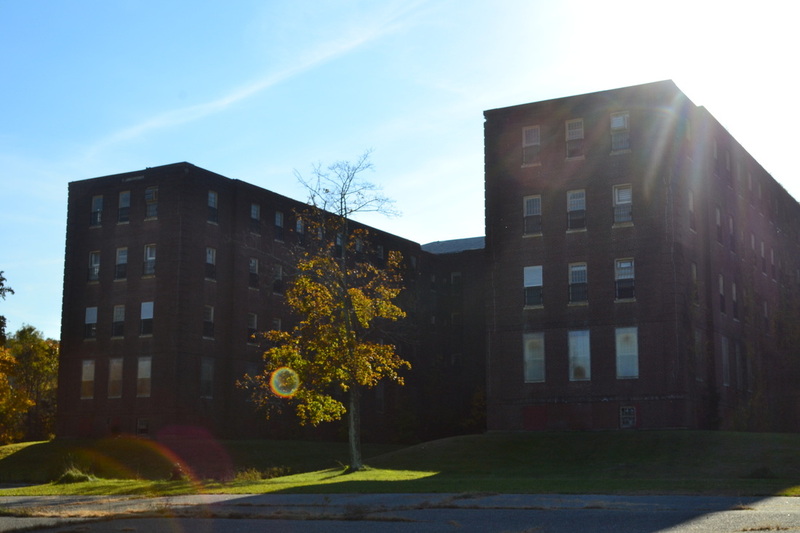 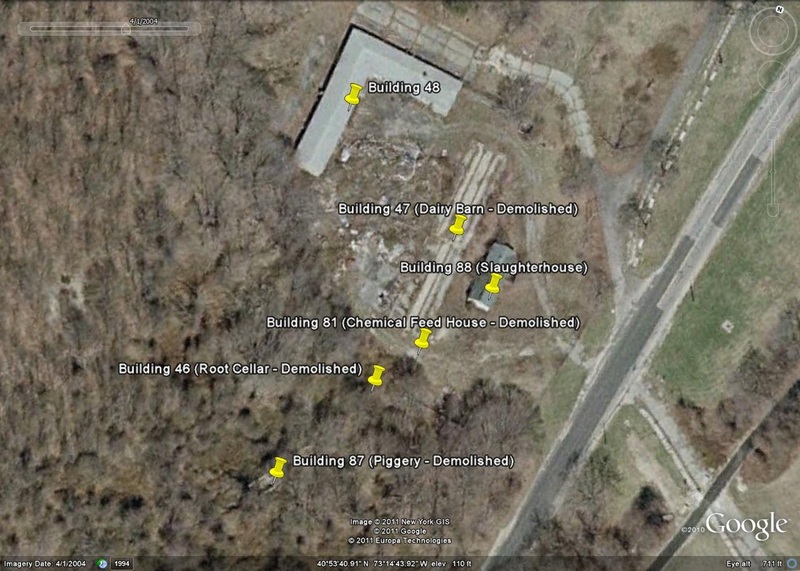 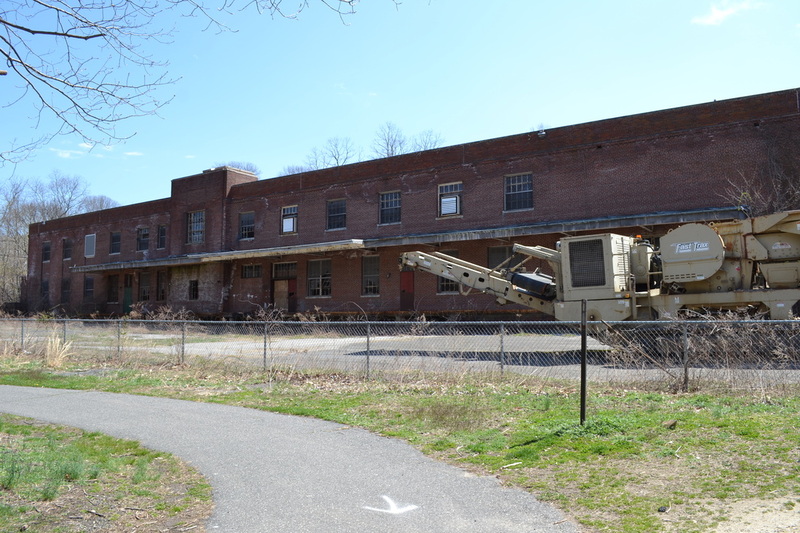 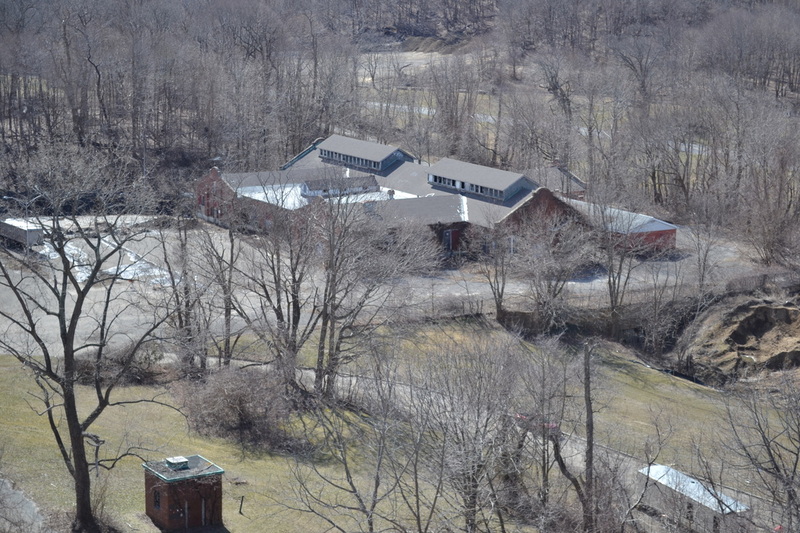 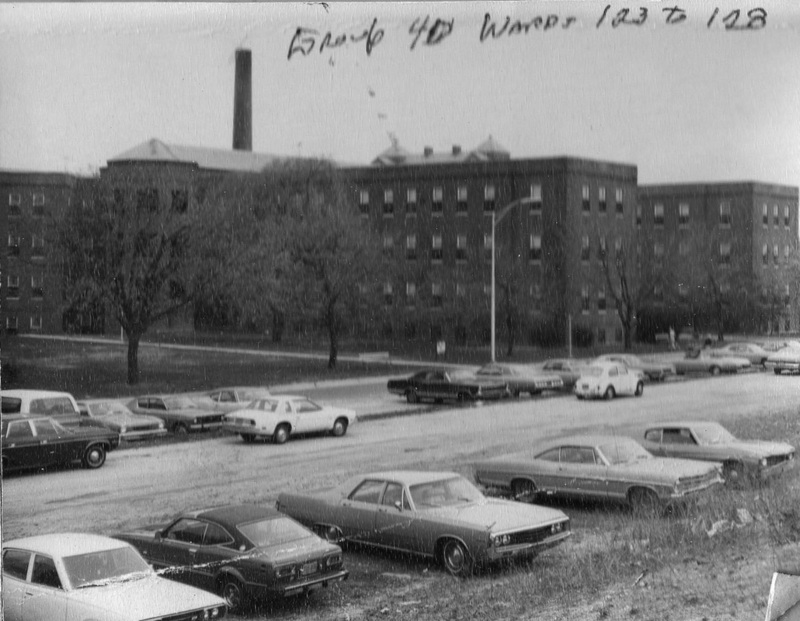 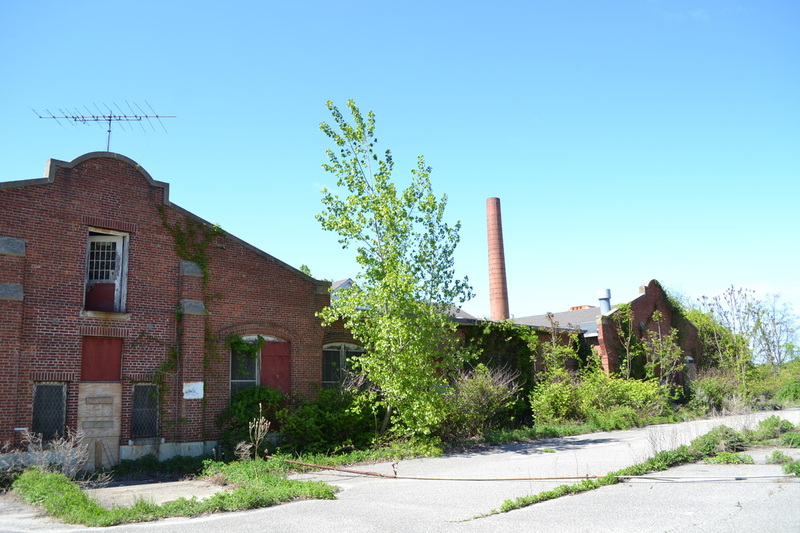 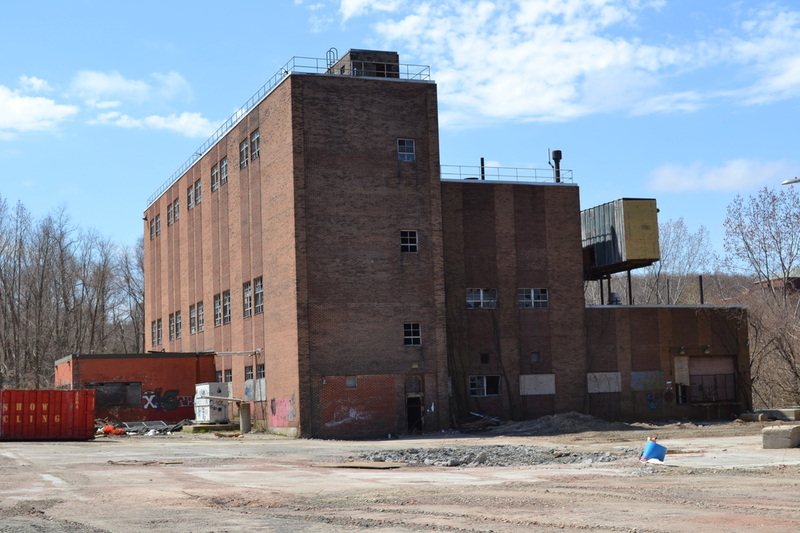 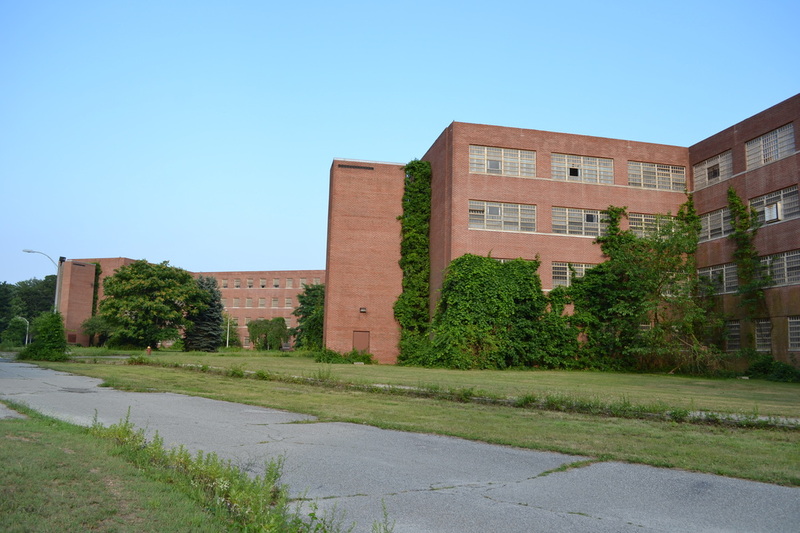 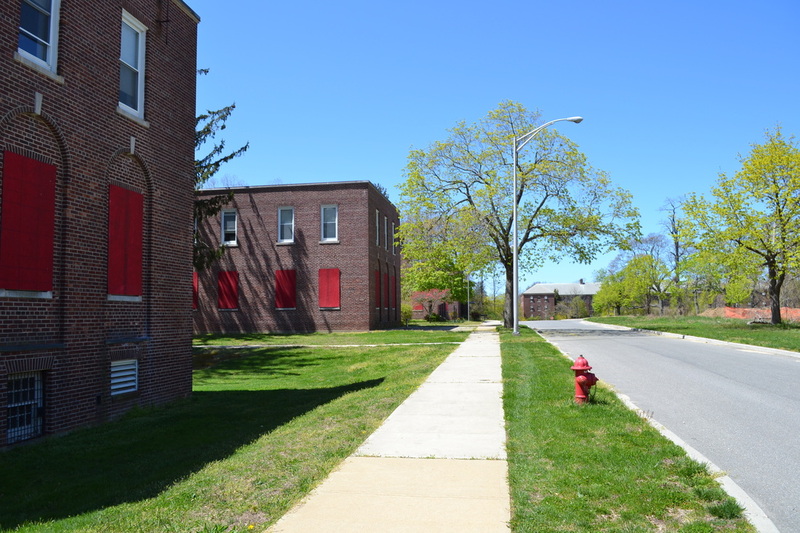 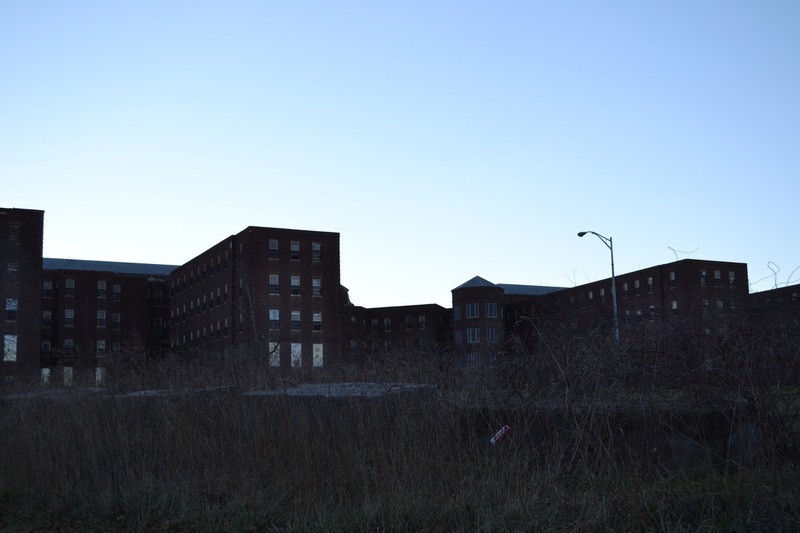 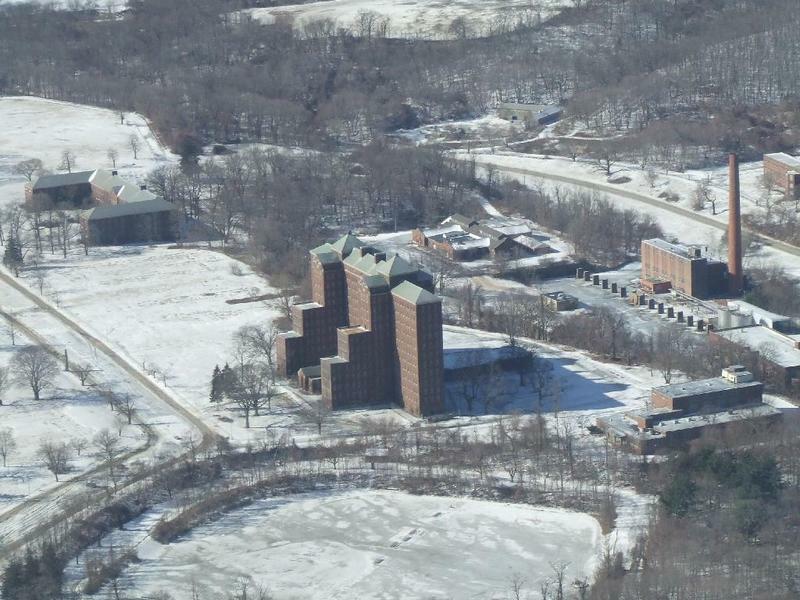 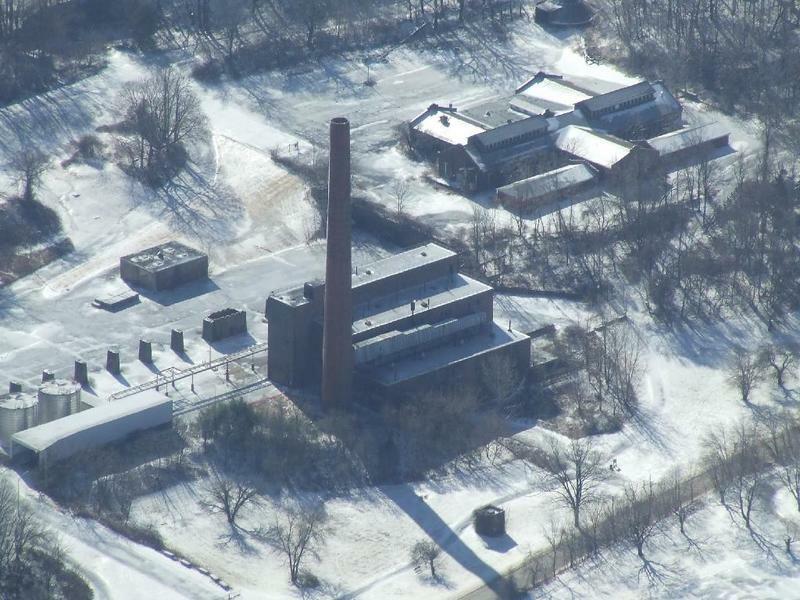 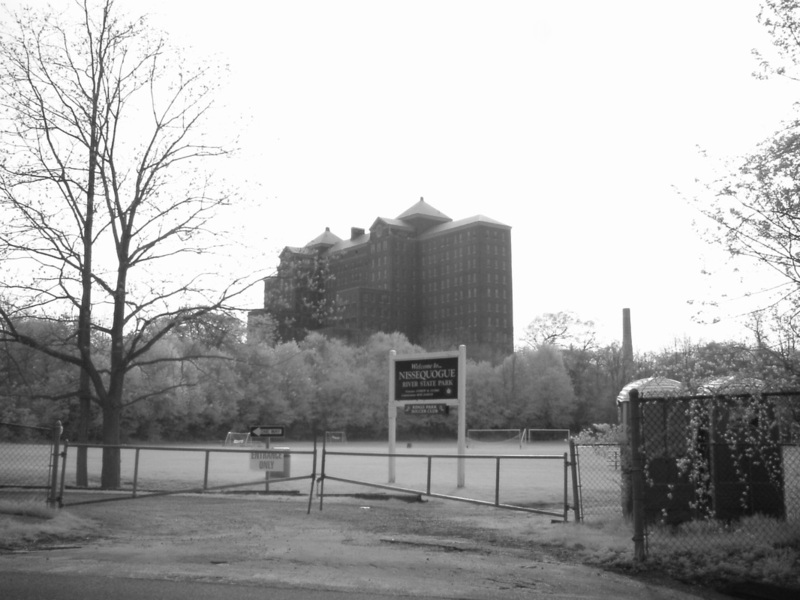 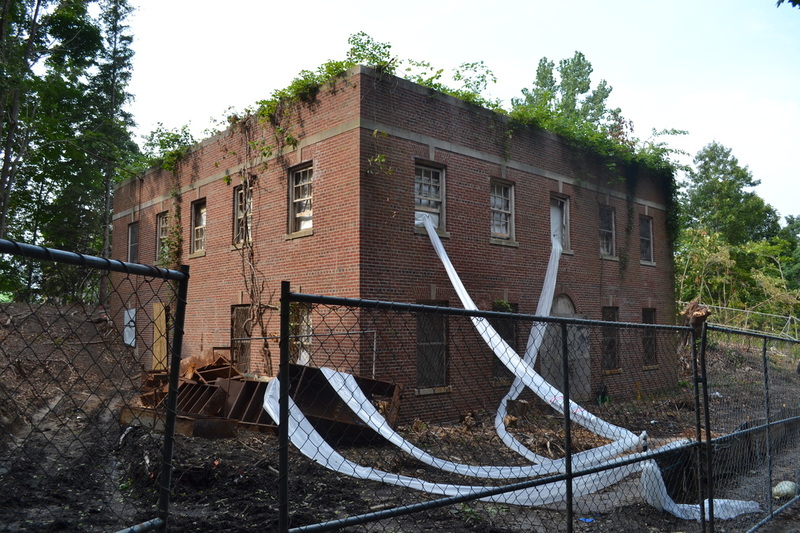 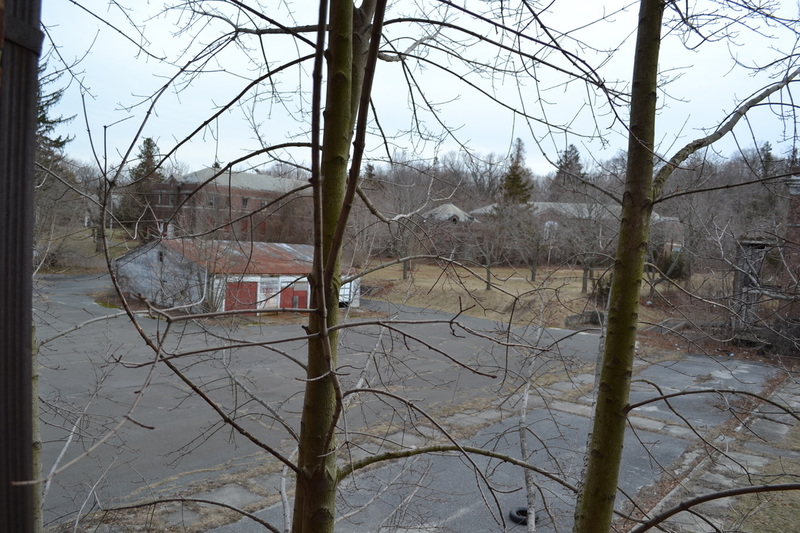 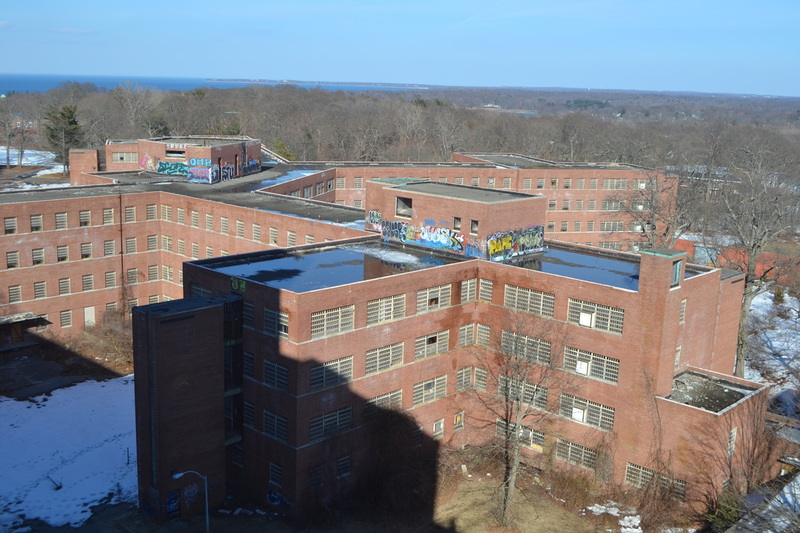 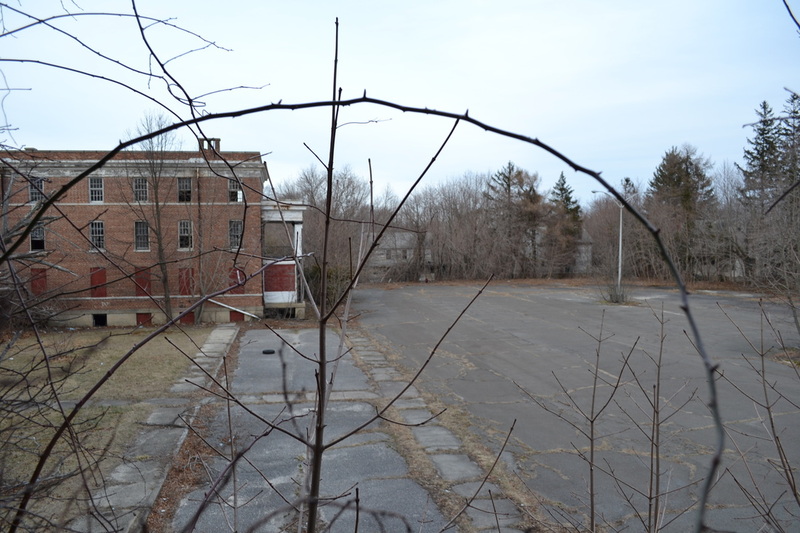 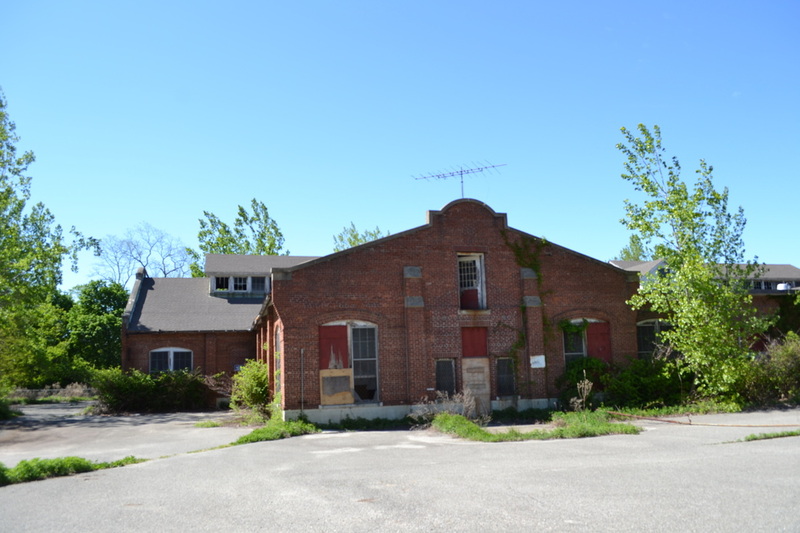 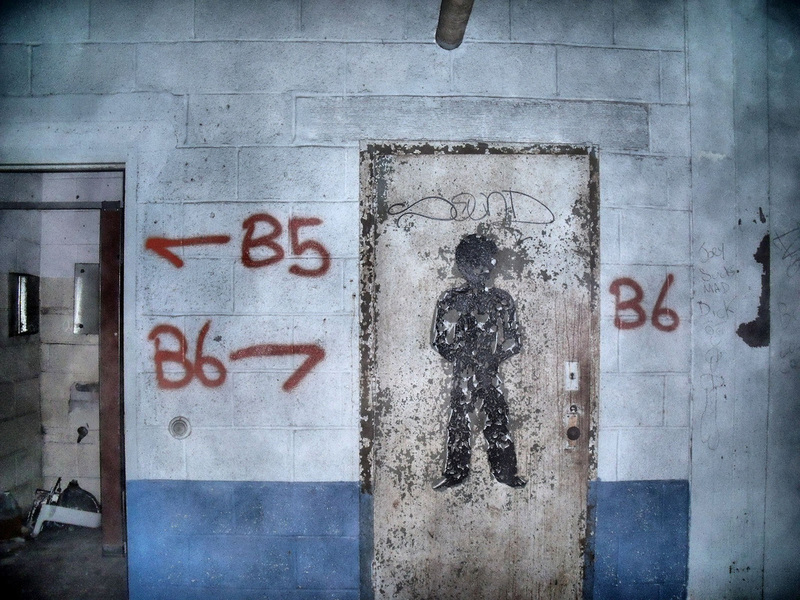 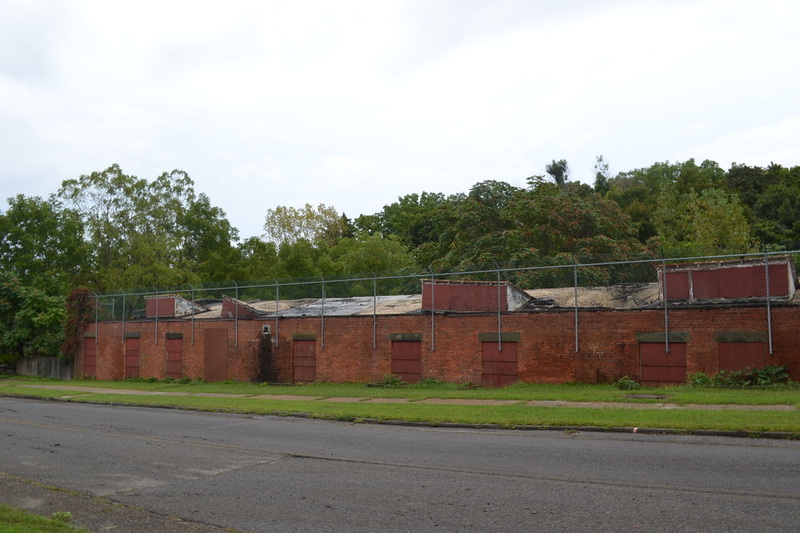 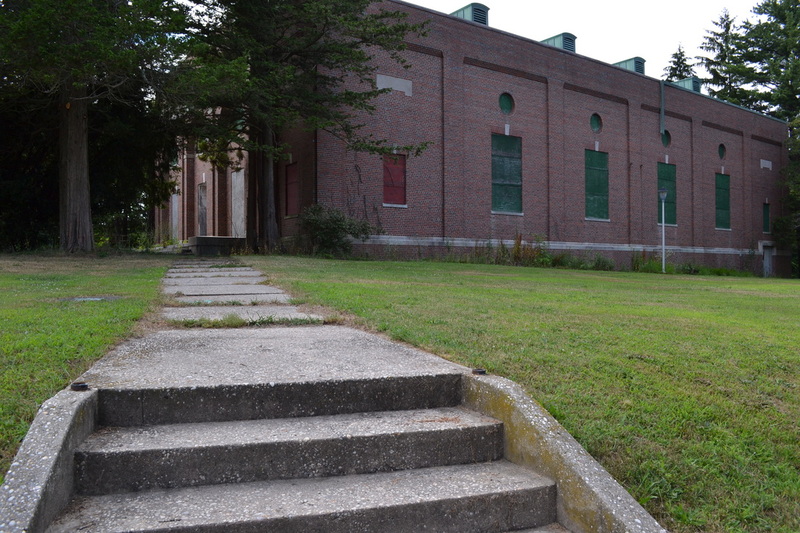 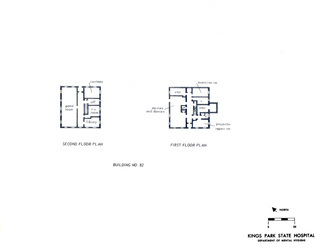 The number designation for Building 84 was reassigned to the 6 well houses in the area surrounding the power plant. 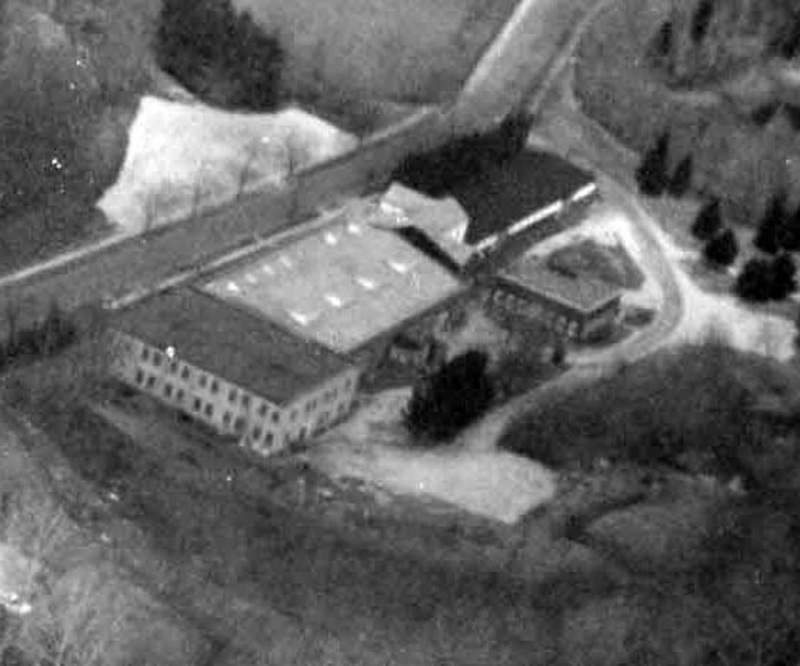 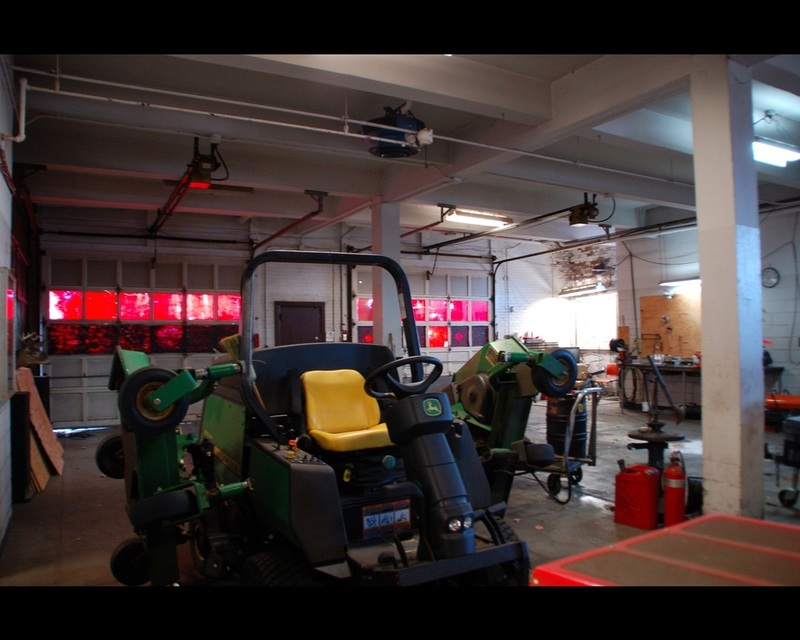 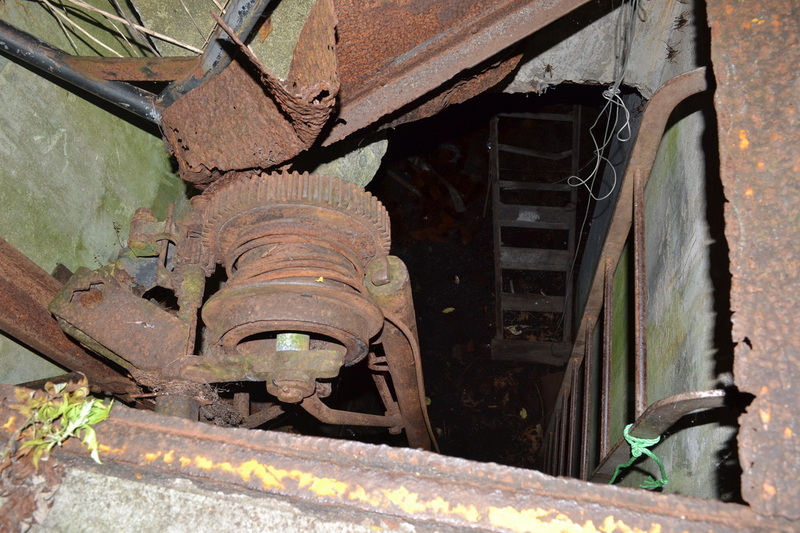 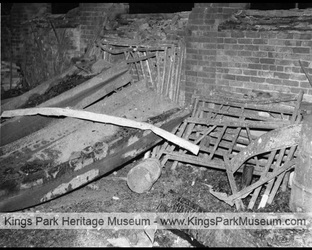 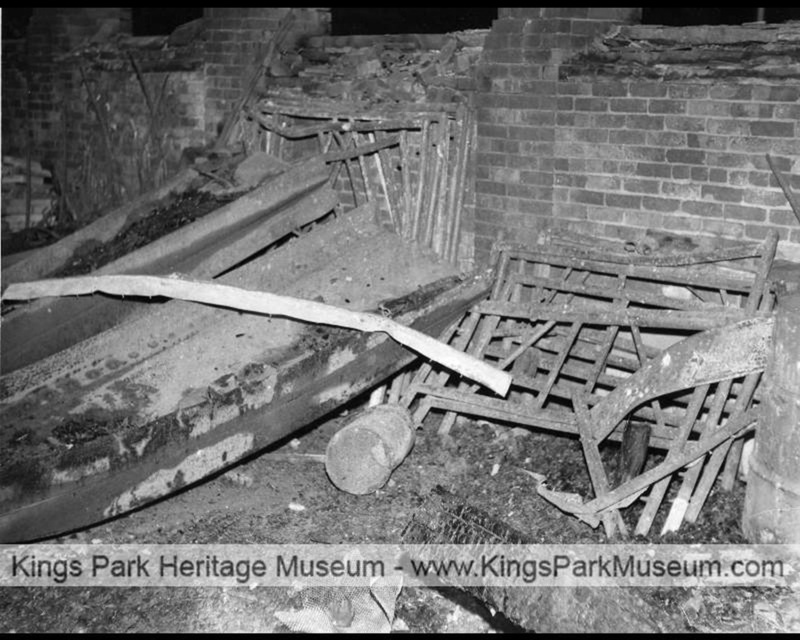 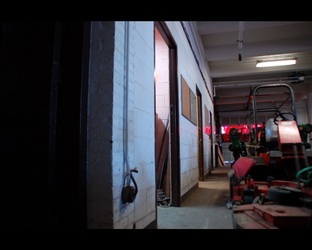 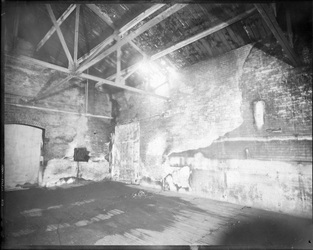 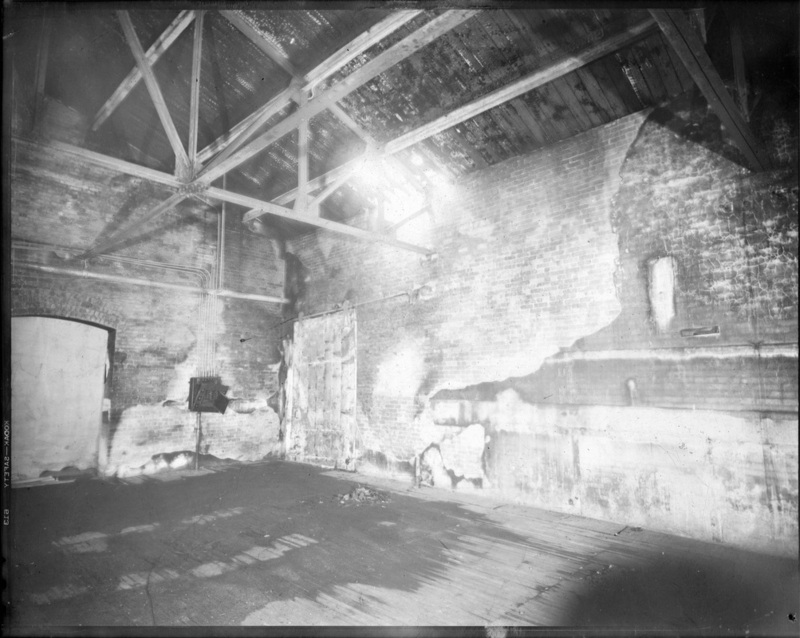 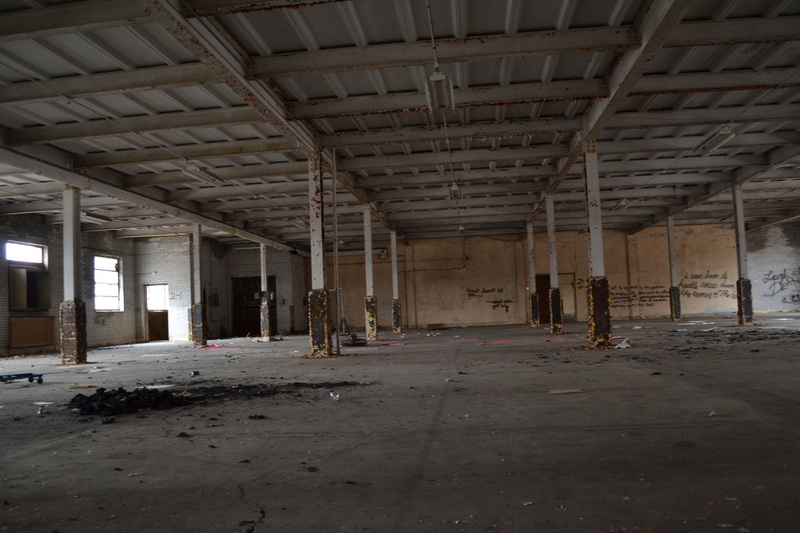 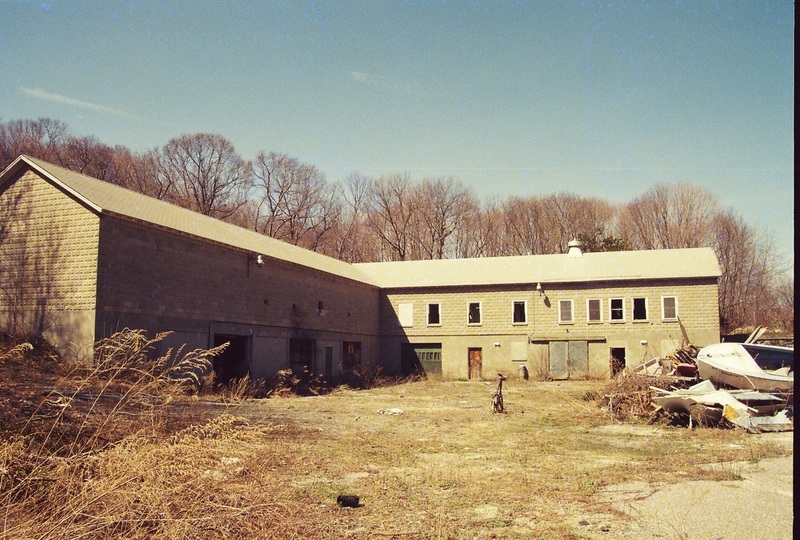 Buildings 5 & 57 were filled with various workshops and Building 44 was the main storage warehouse and kitchen. 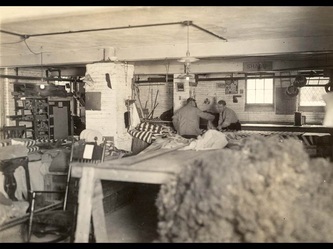 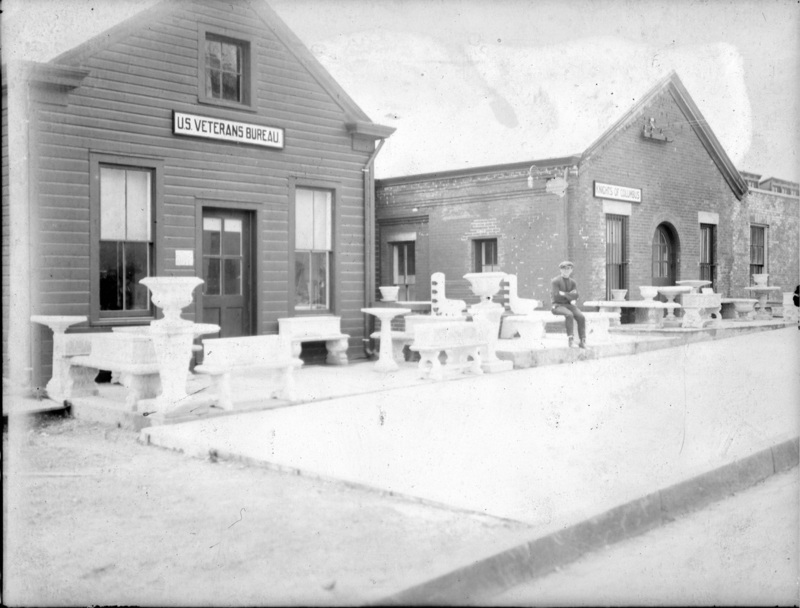 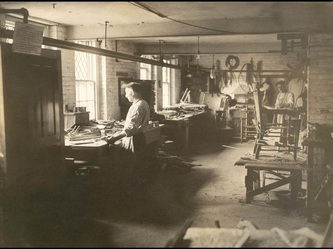 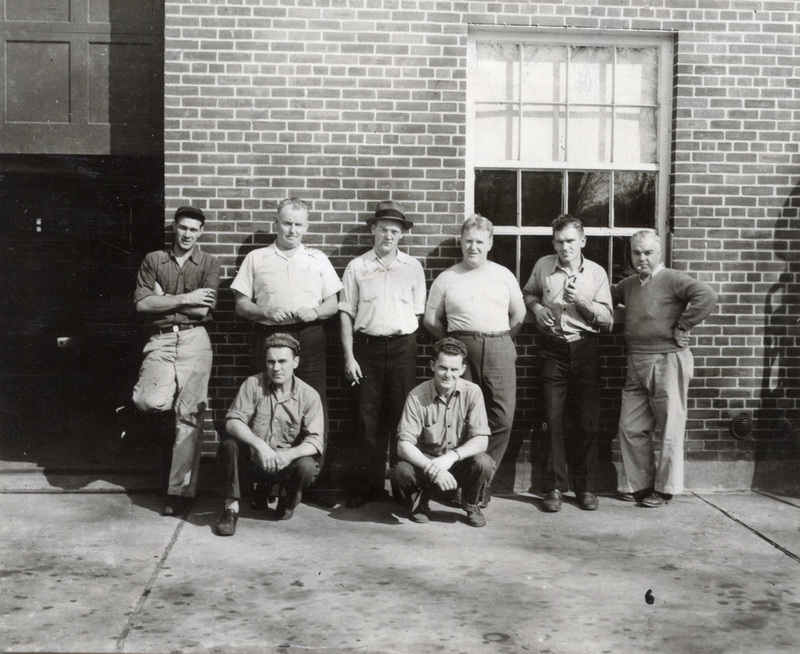 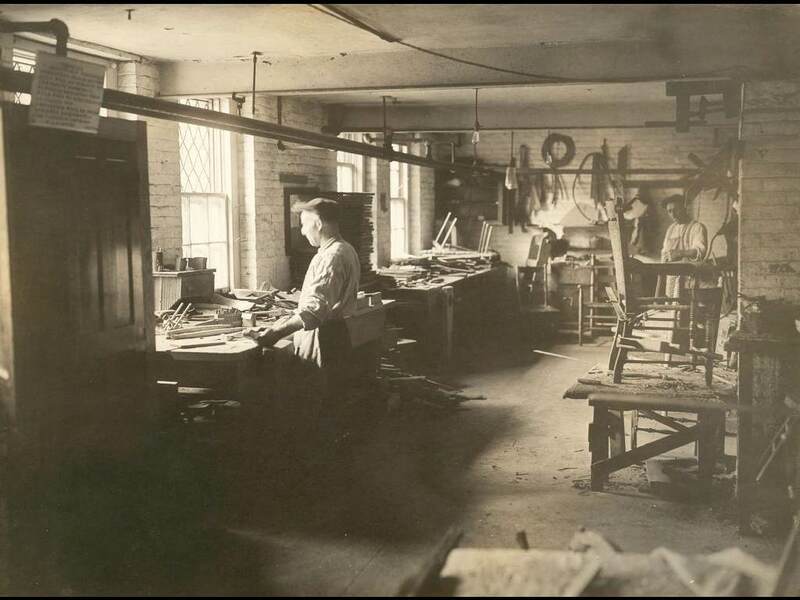 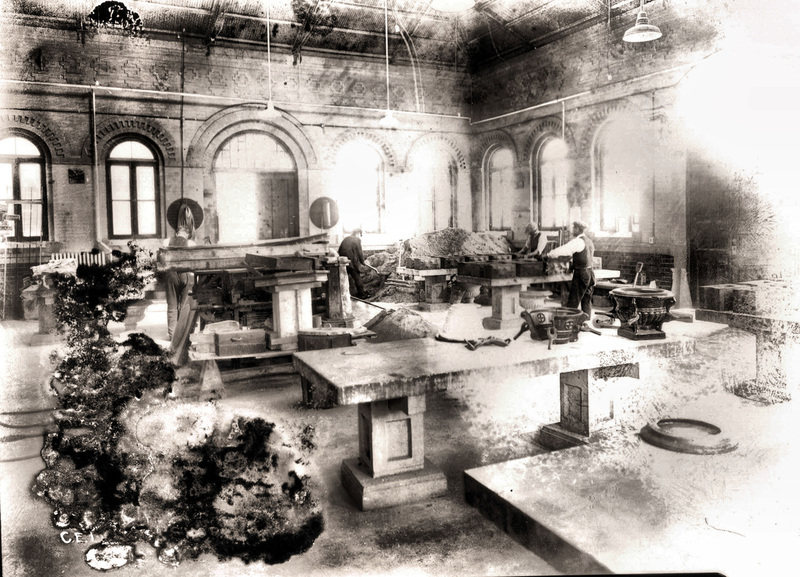 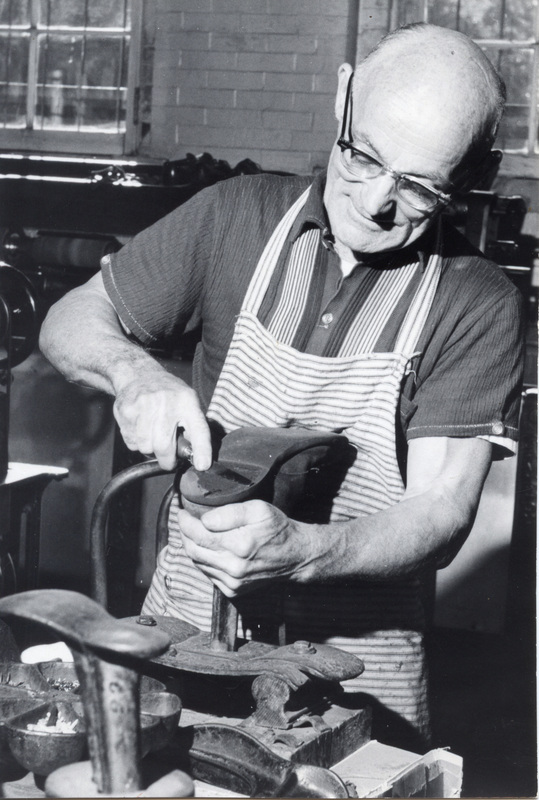 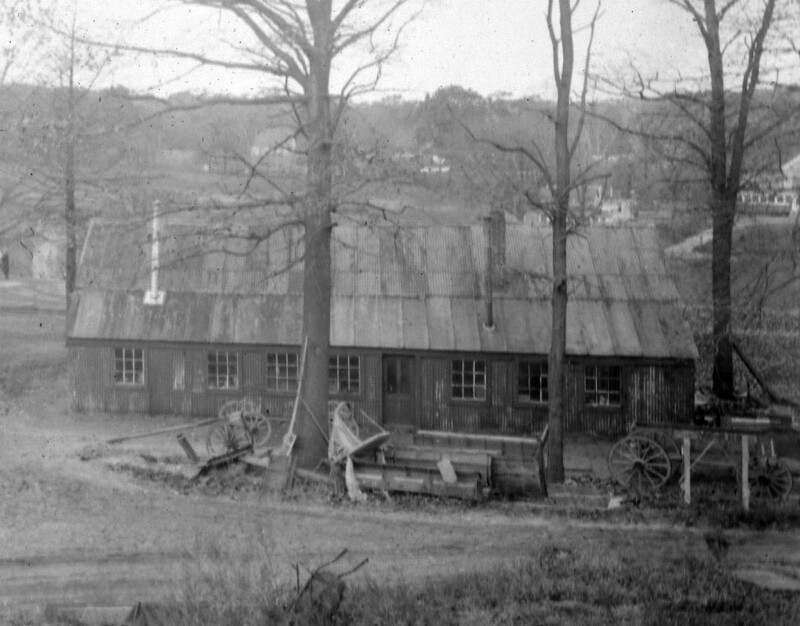 Building 20 was the original tinsmith shop, while Building 86 was the original Blacksmith shop. 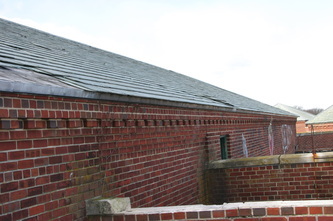 The sand pyramid was added during the early 1990s for storing sand and salt during the winter. 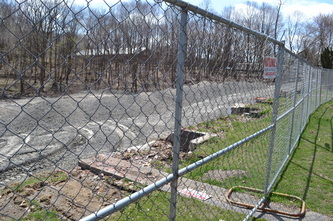 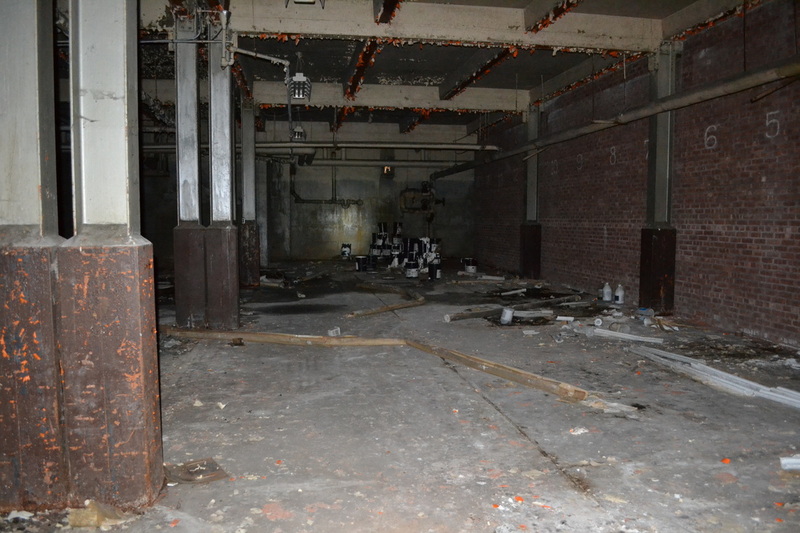 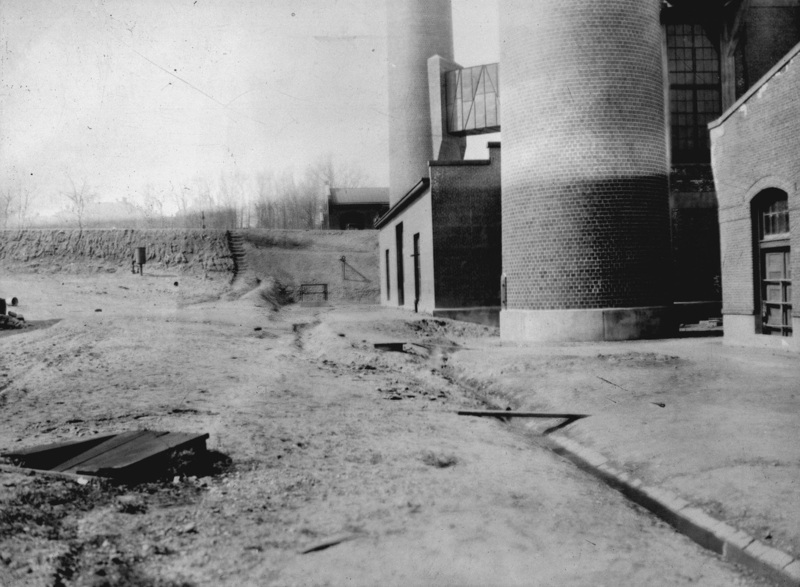 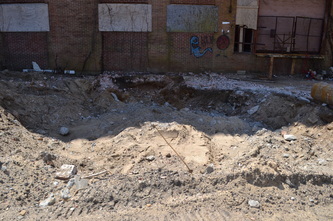 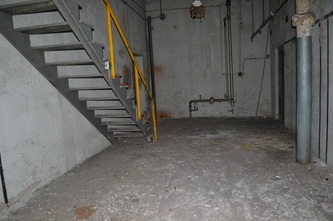 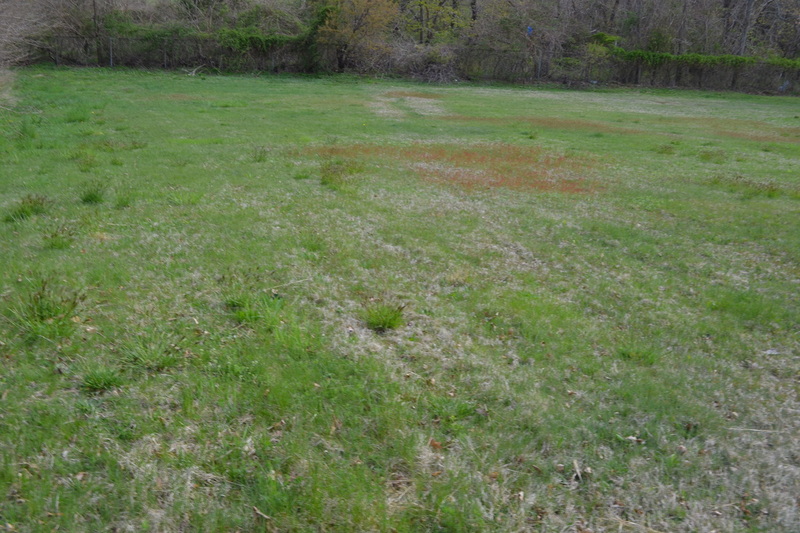 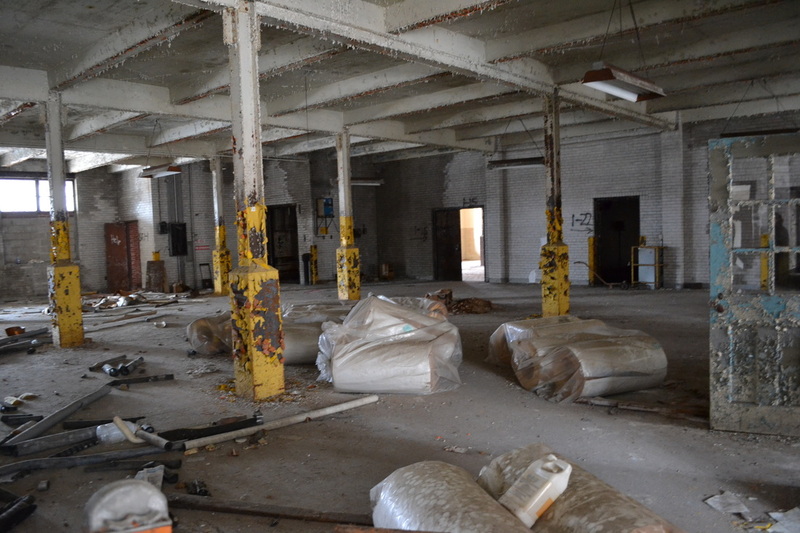 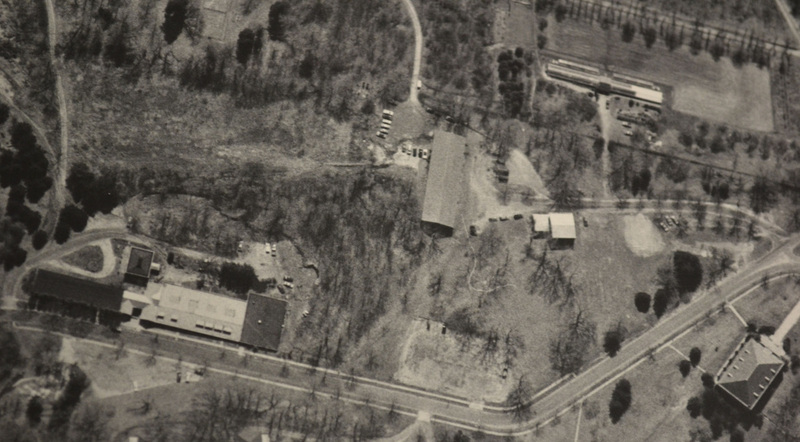 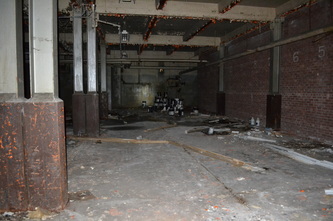 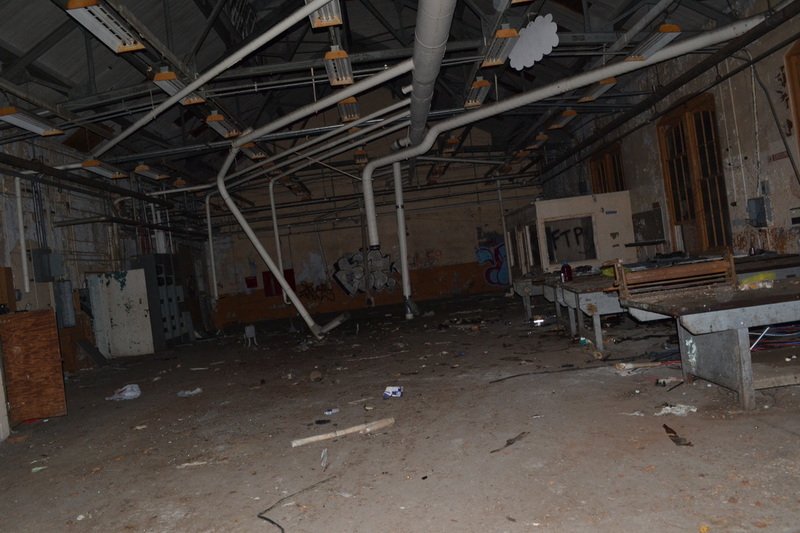 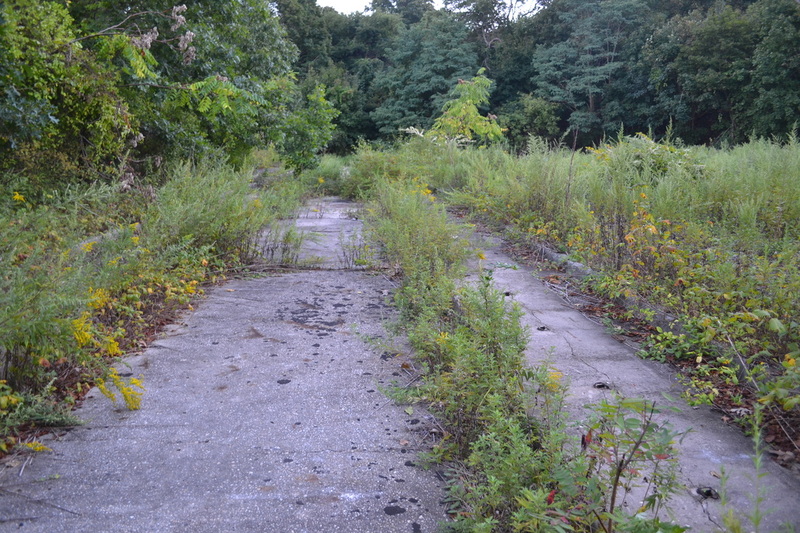 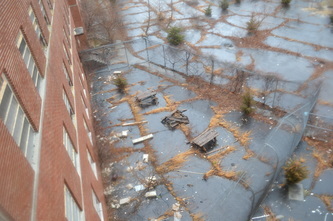 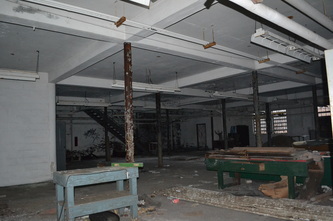 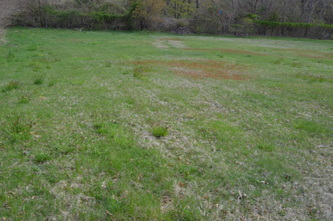 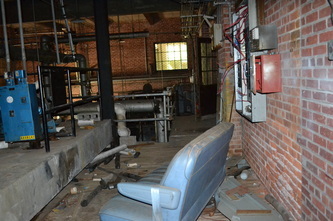 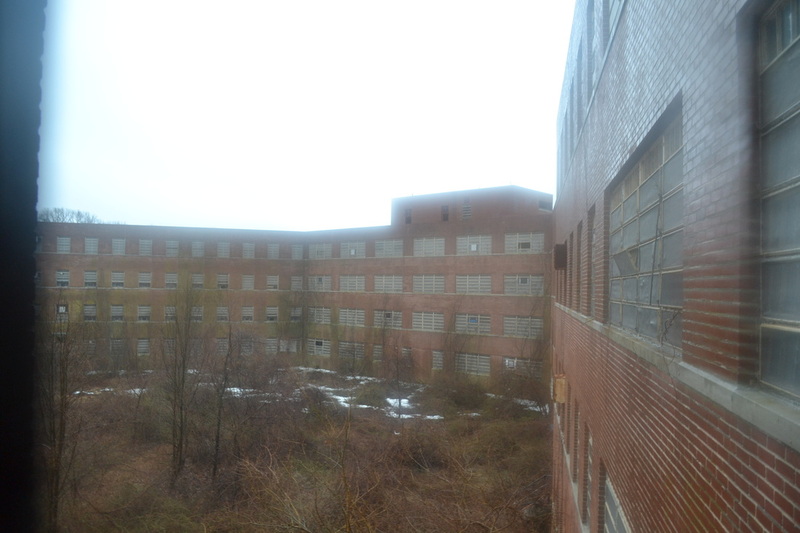 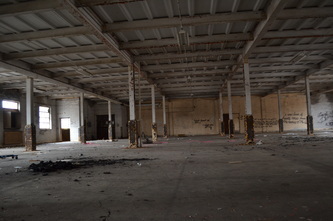 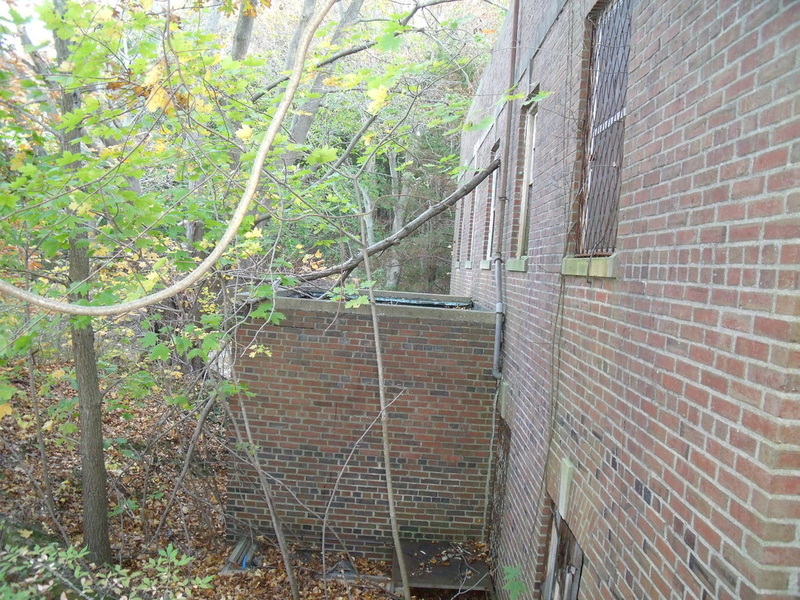 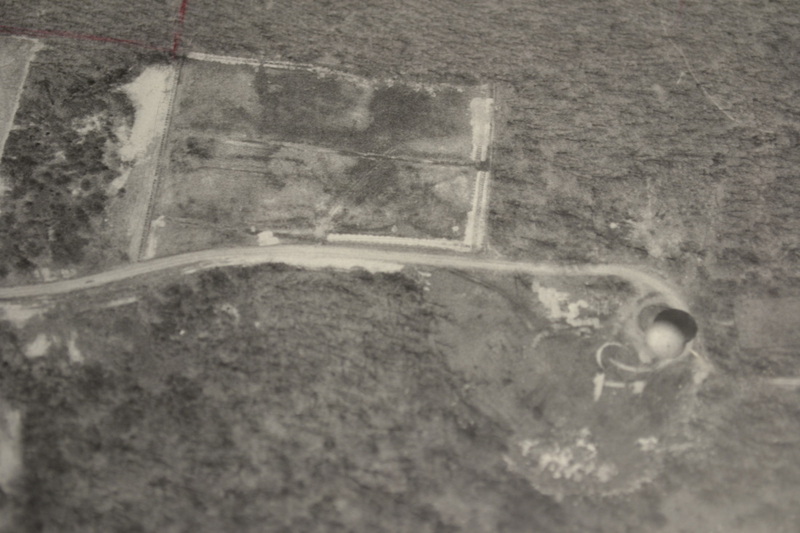 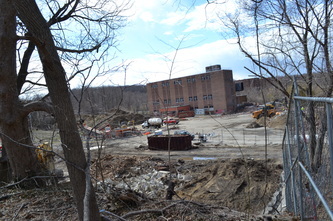 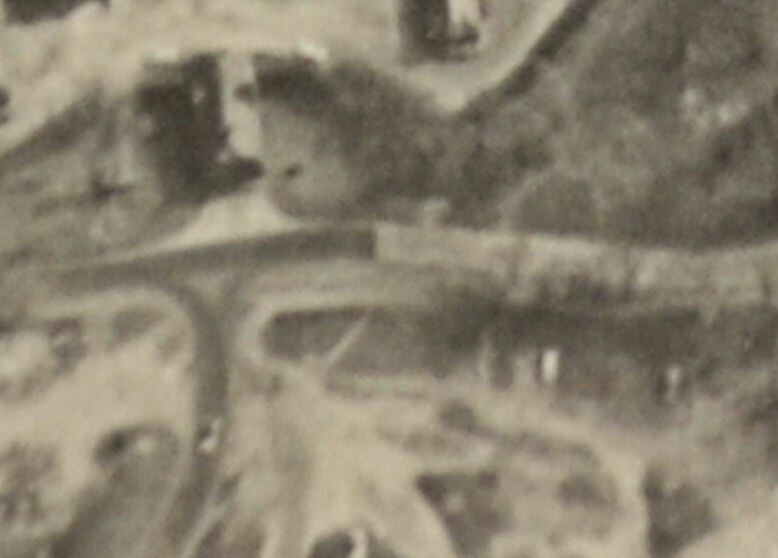 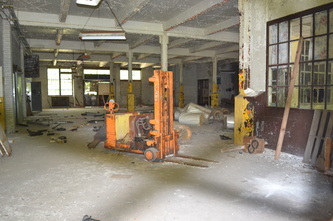 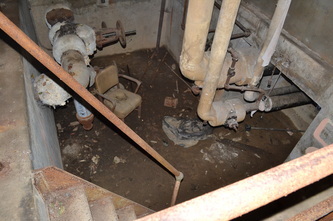 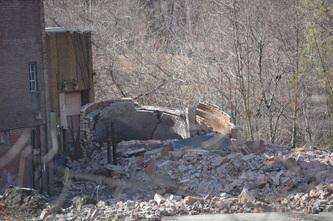 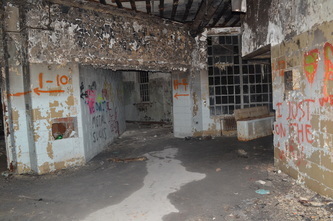 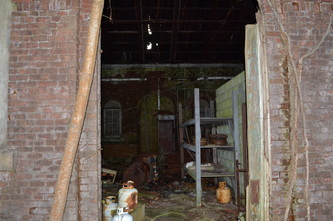 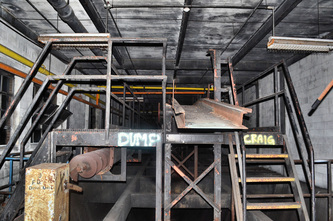 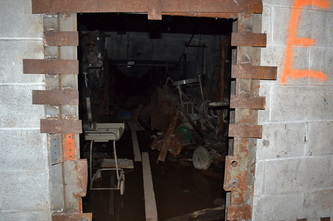 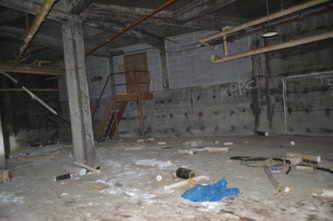 This was the area of the original power plant, Building 59. 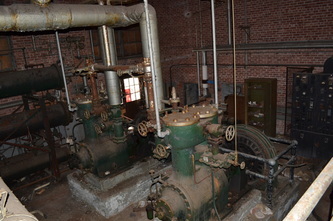 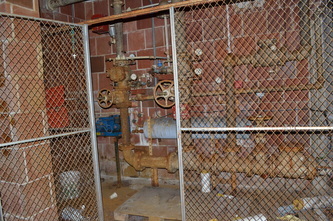 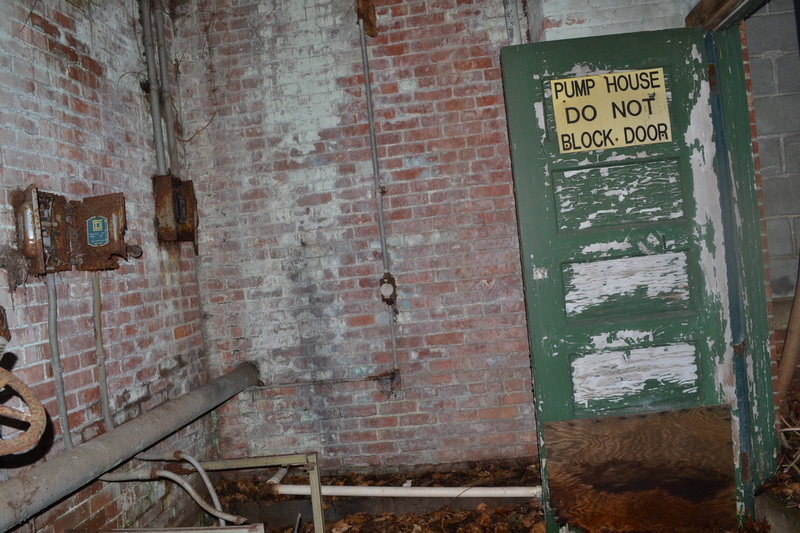 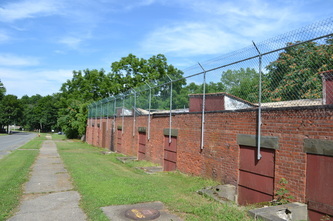 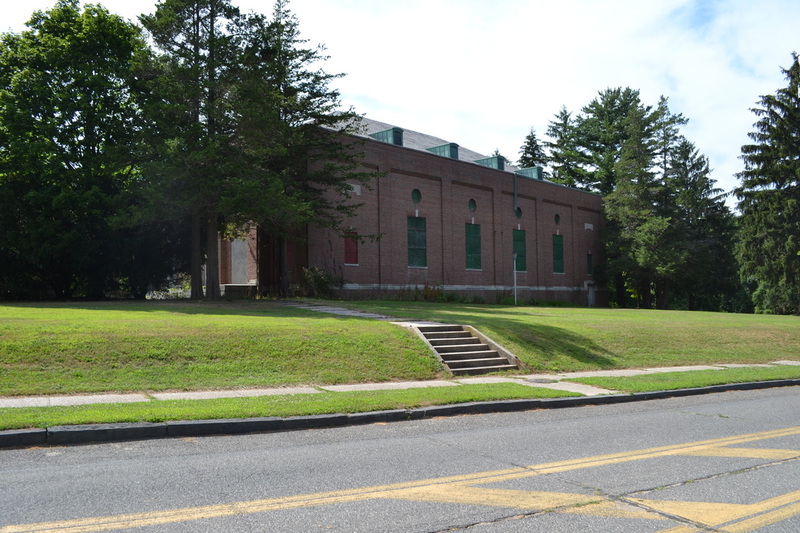 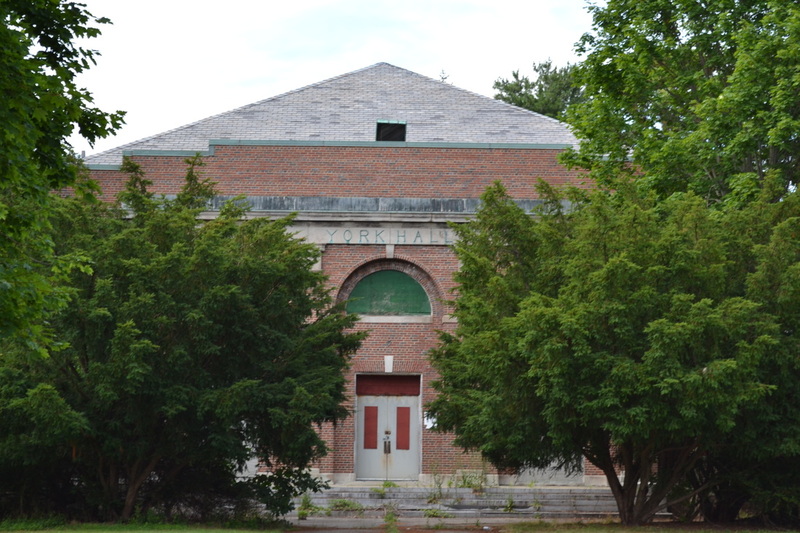 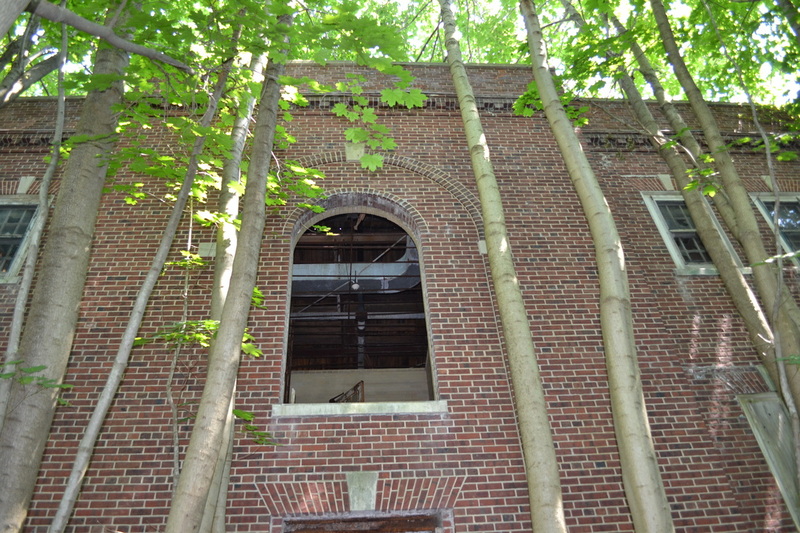 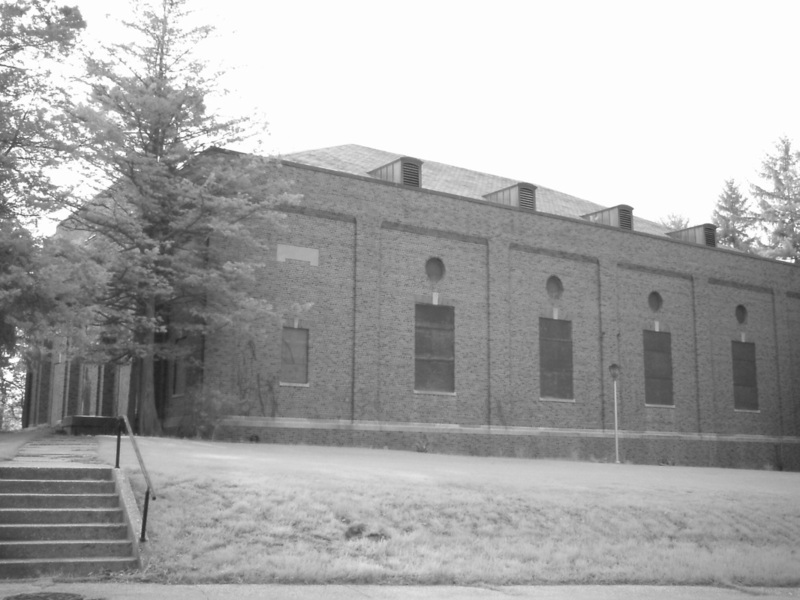 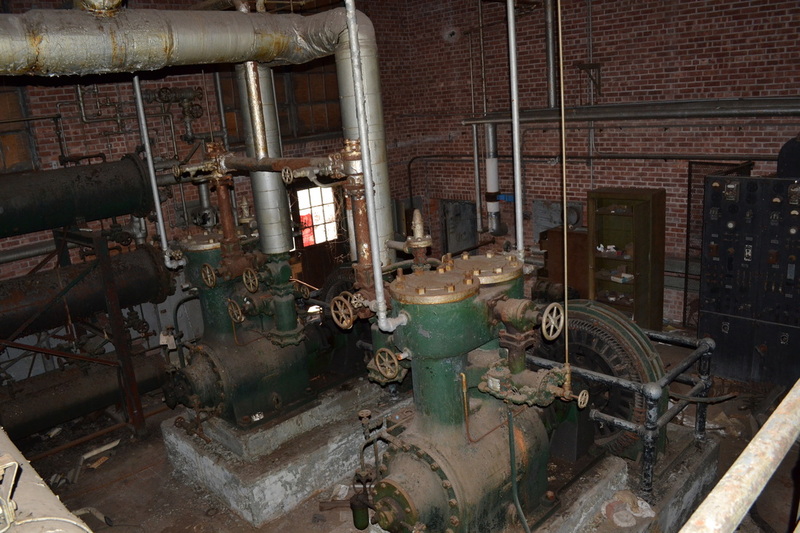 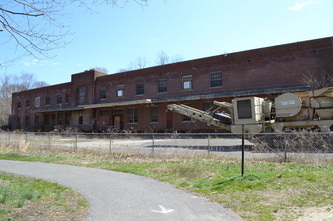 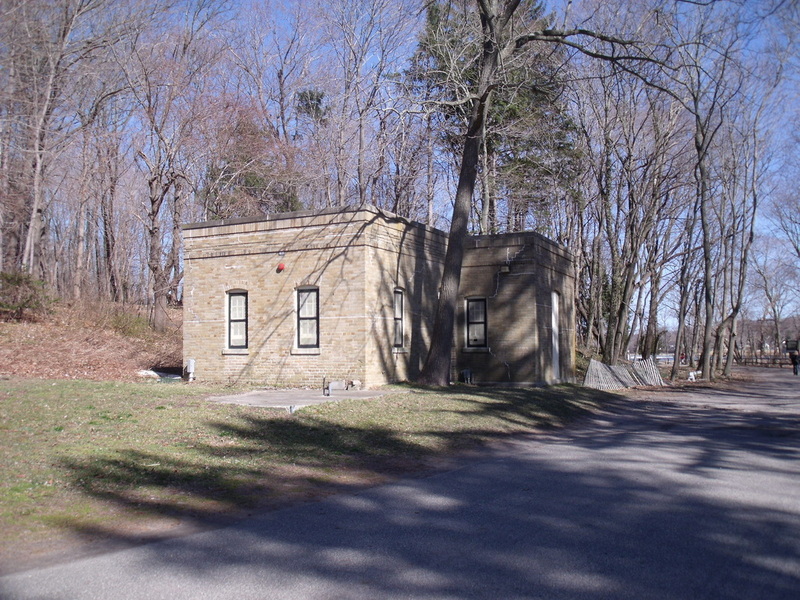 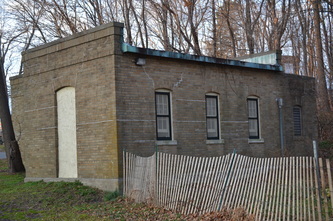 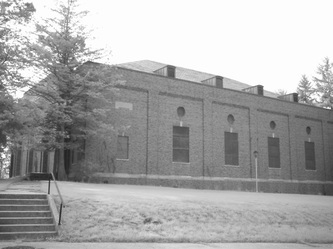 Building 60 was its water pumping station. 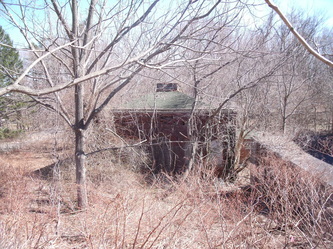 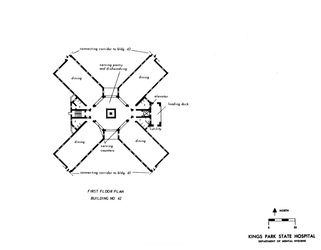 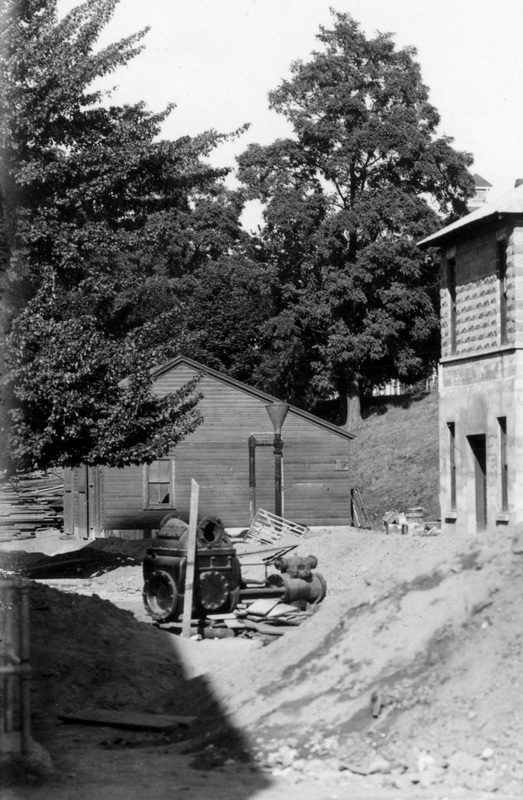 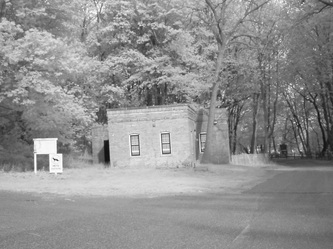 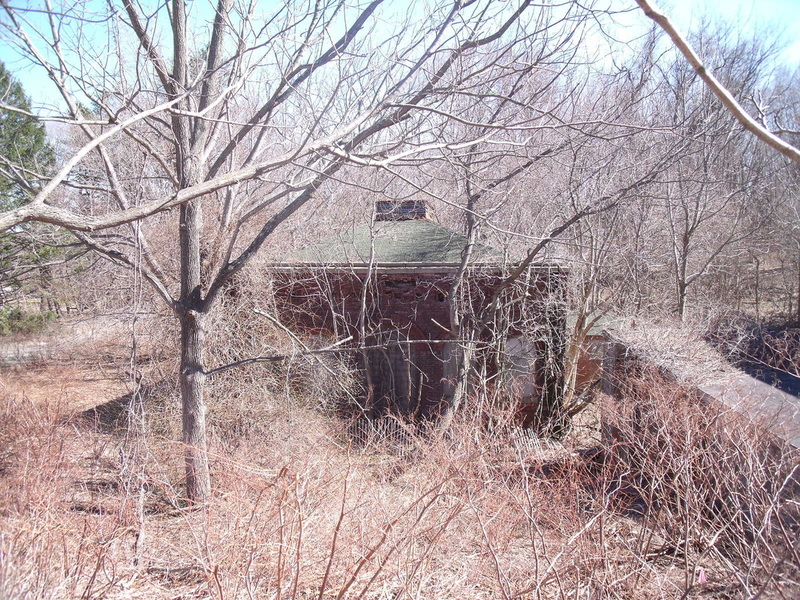 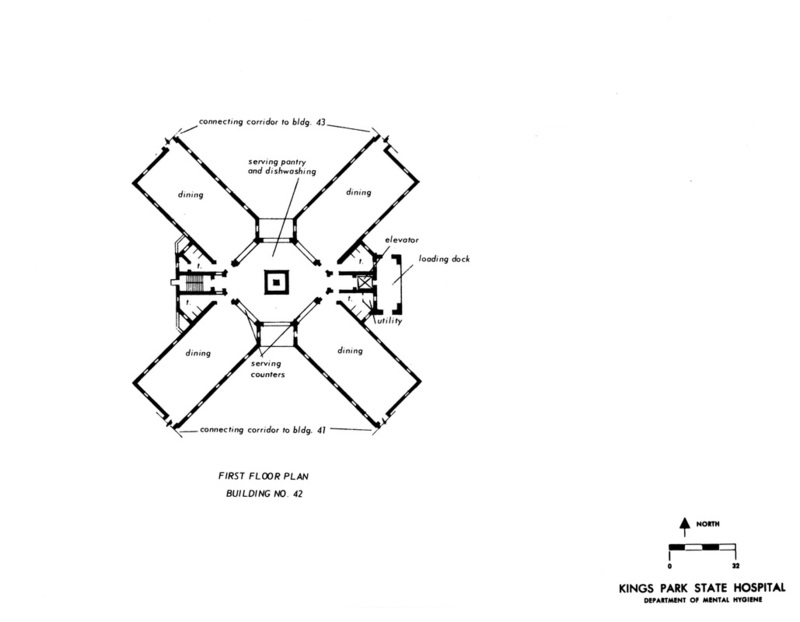 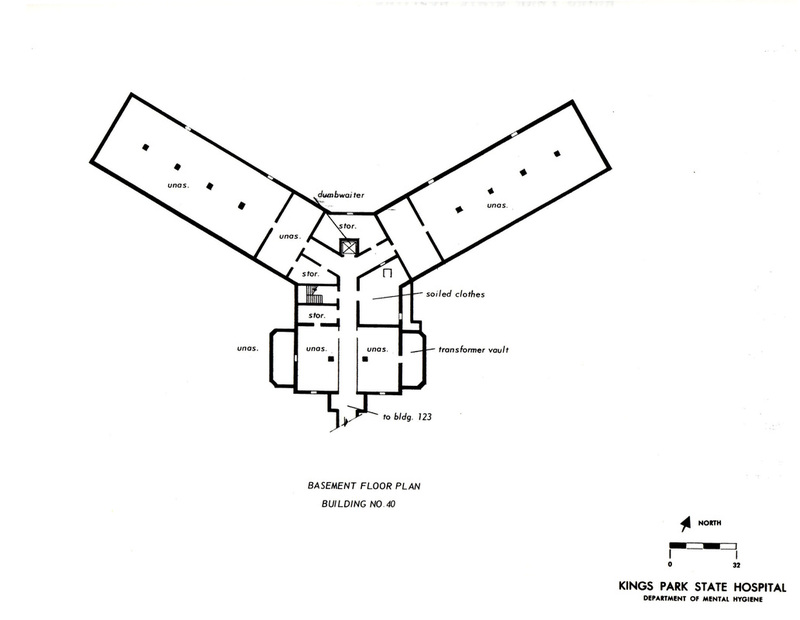 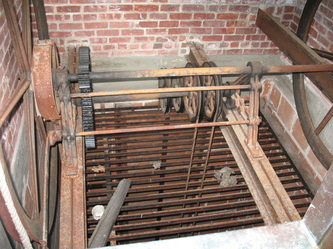 Building 61 was a wagon stable and Building 53 was a sewage pump house. 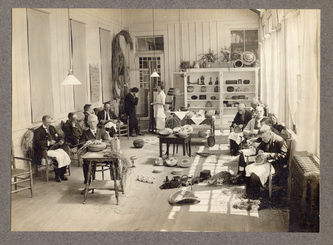 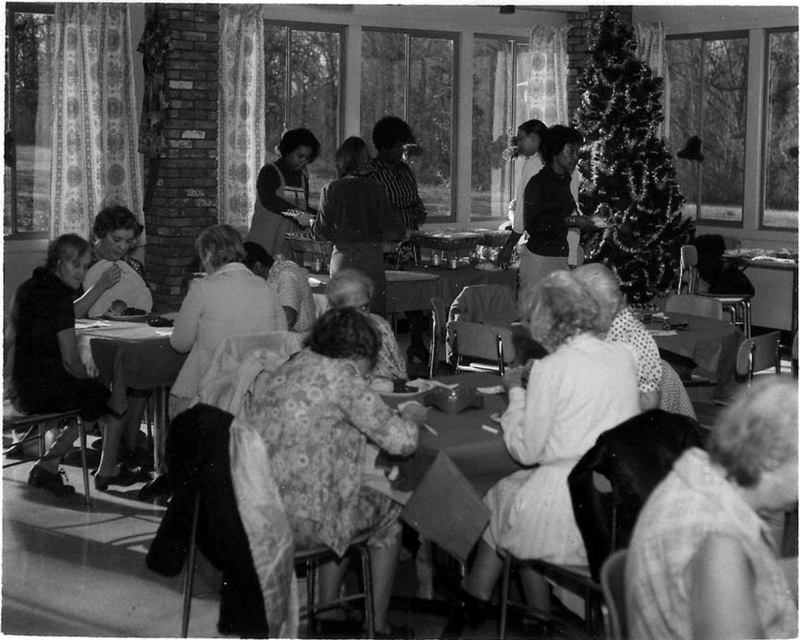 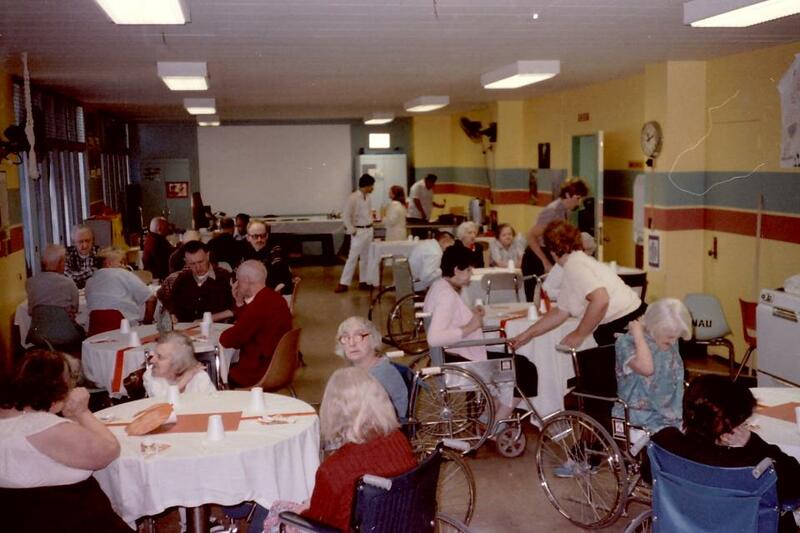 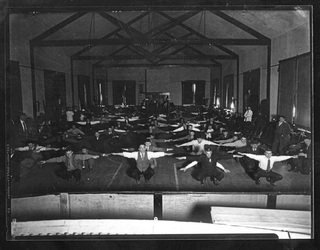 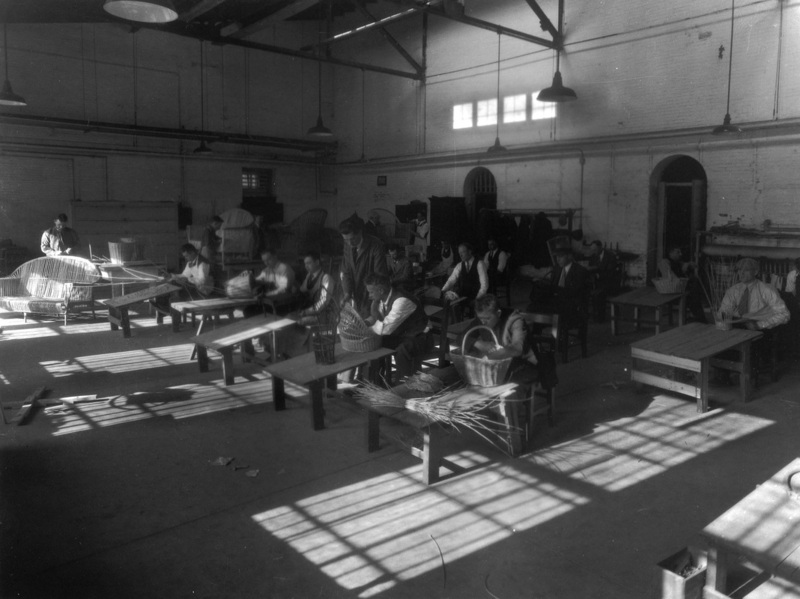 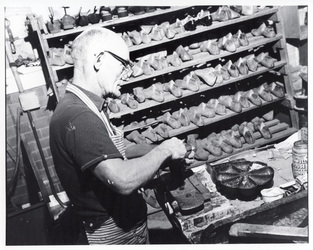 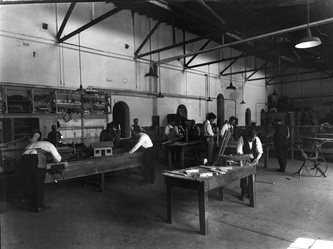 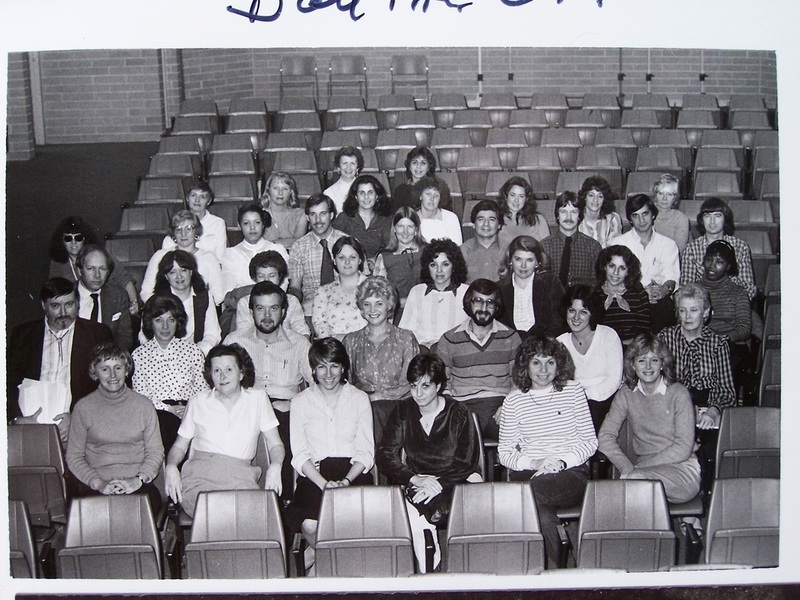 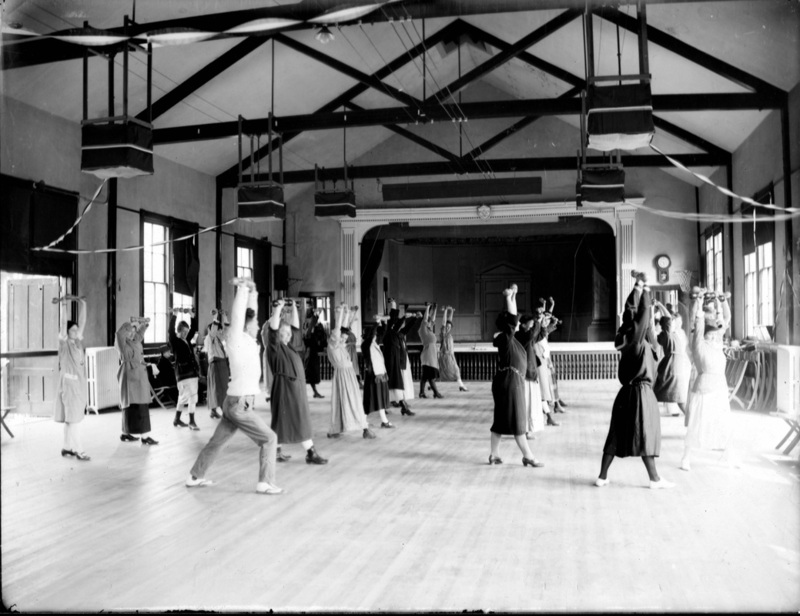 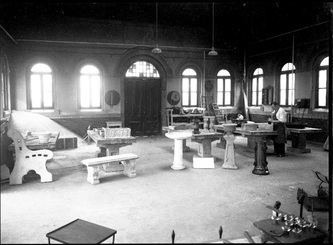 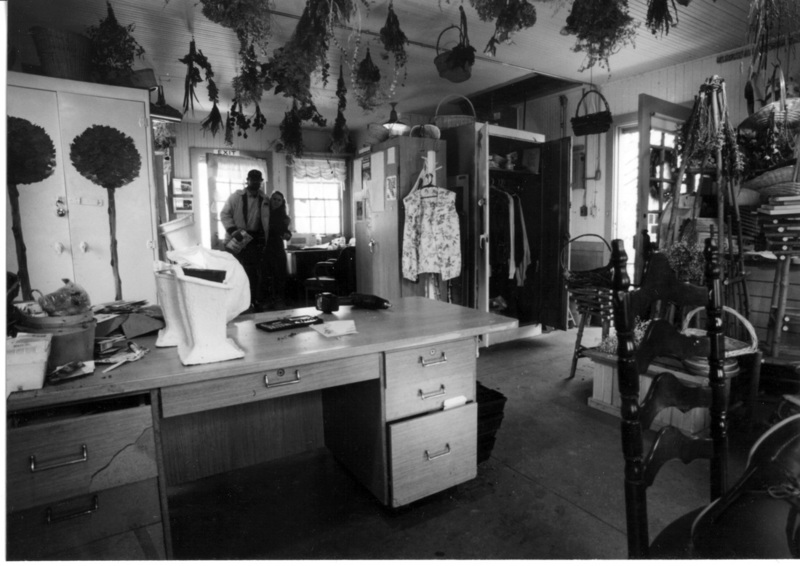 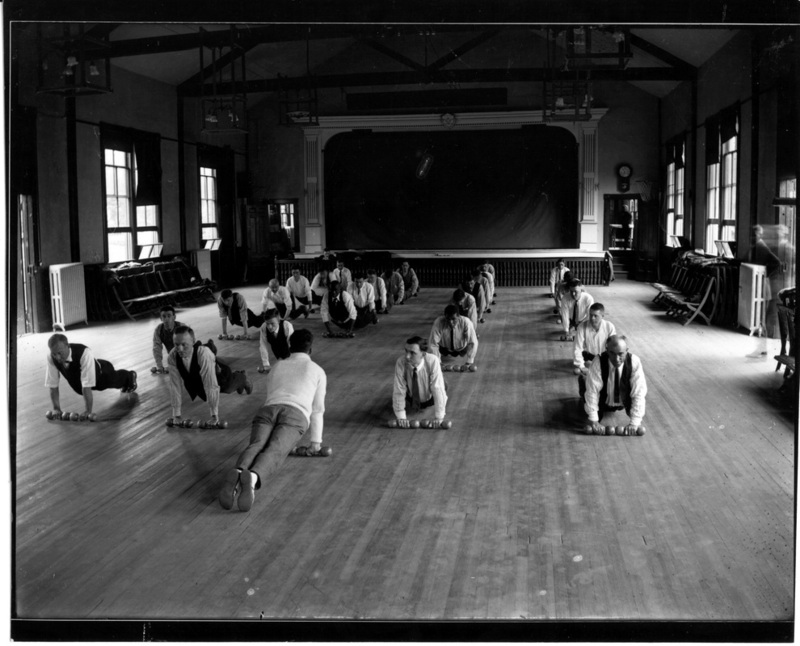 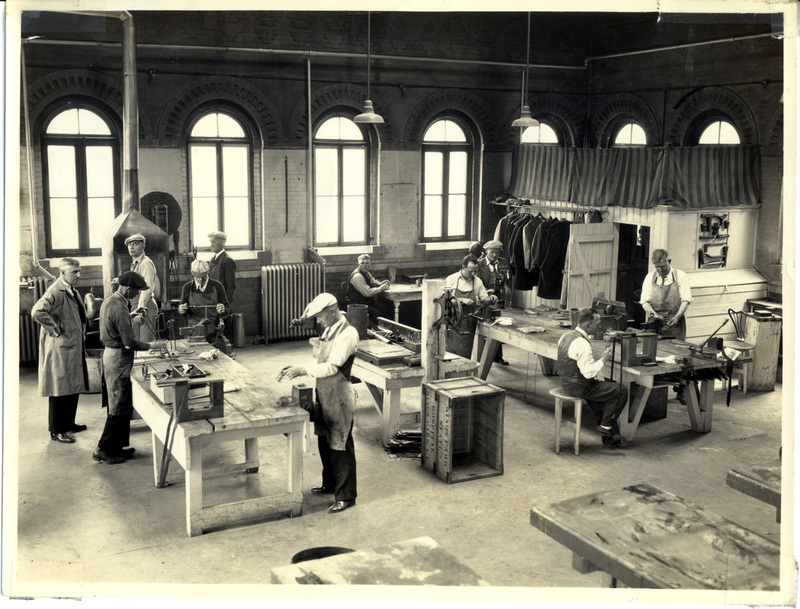 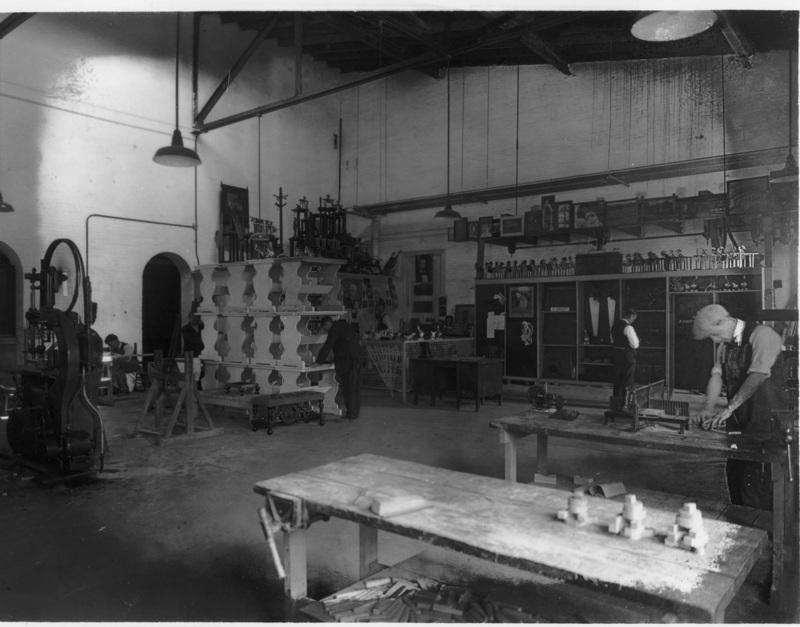 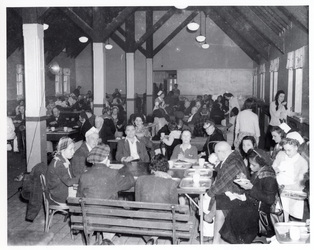 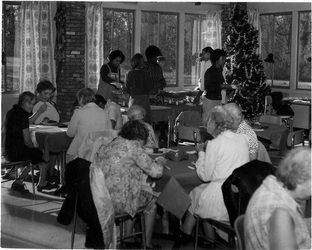 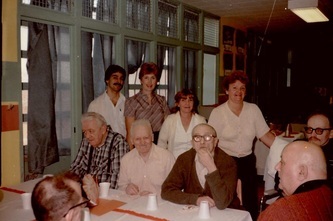 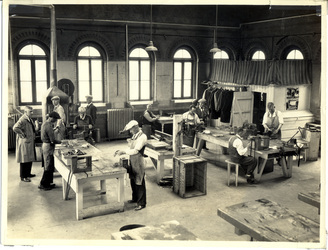 In later years Buildings 59-61 all became workshops for occupational therapy. 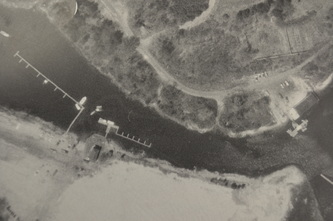 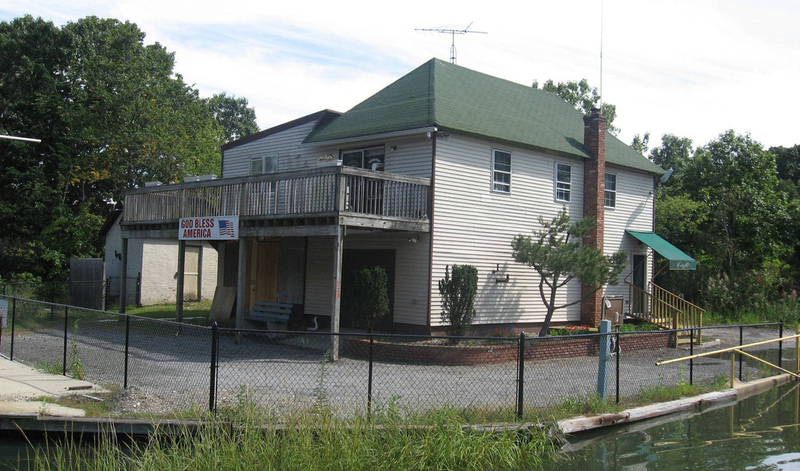 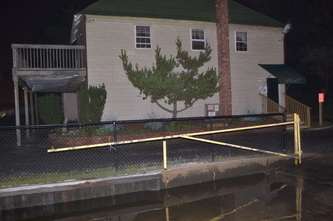 Building 55 was the boathouse, which sat overlooking the canal with the barge landlocked across from it. 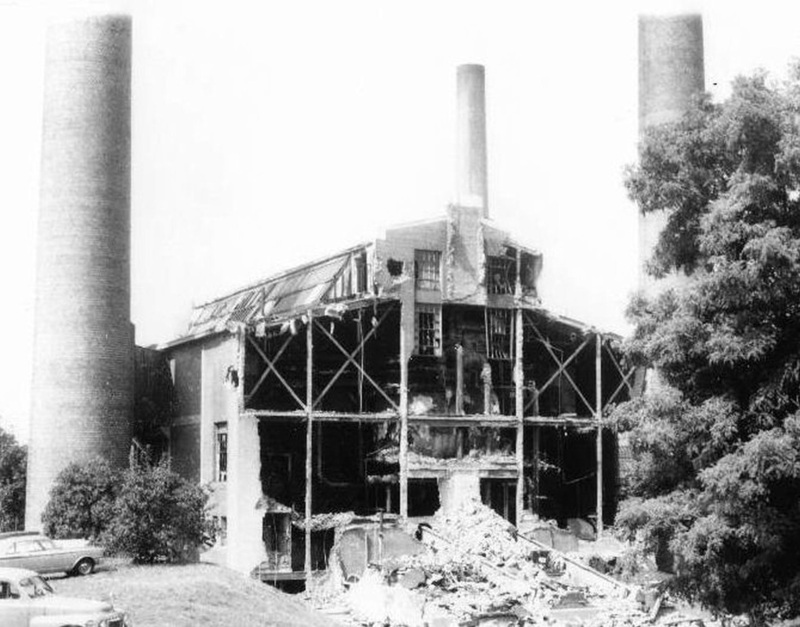 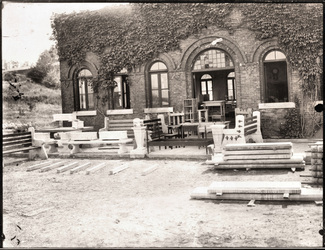 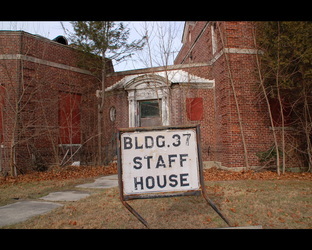 The assistant steward's residence was the original Building 56, which was located across from the first power plant. 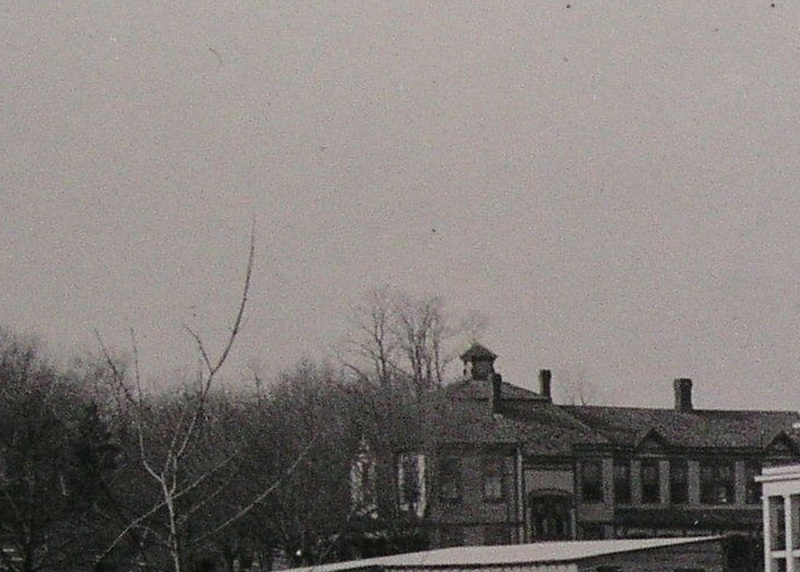 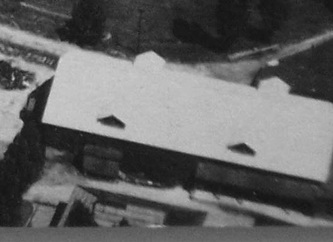 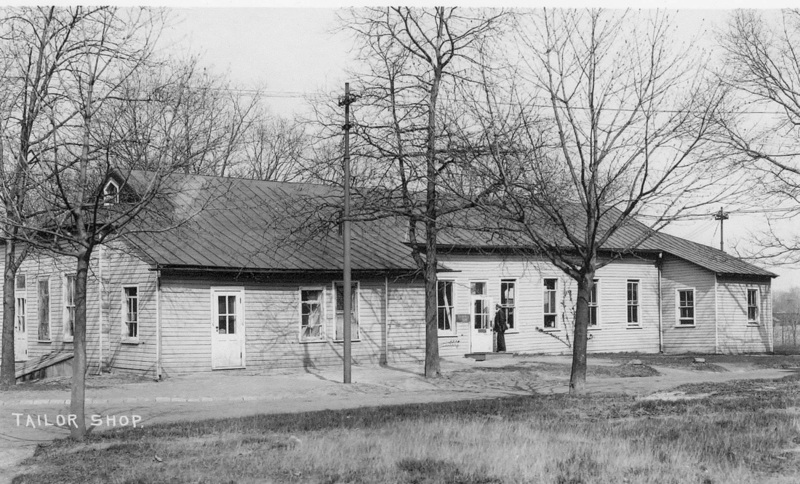 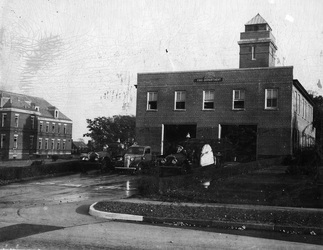 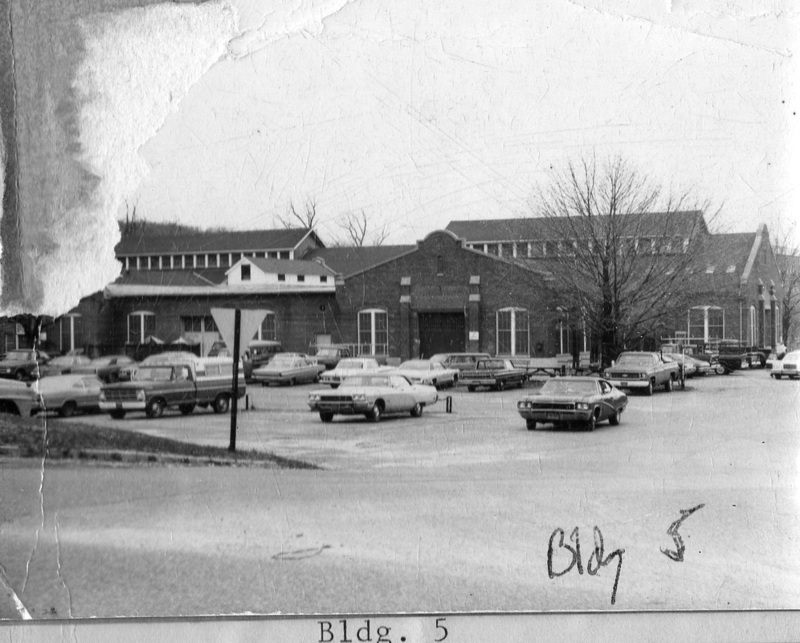 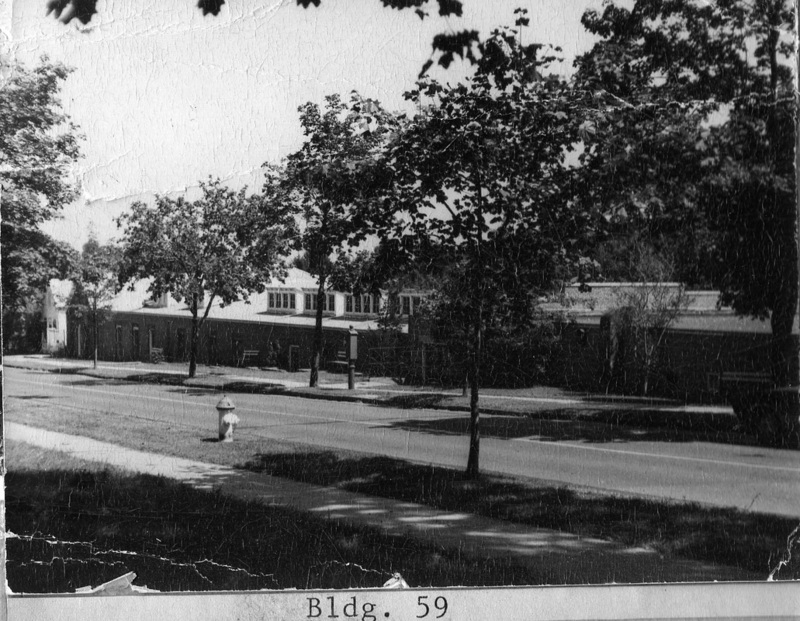 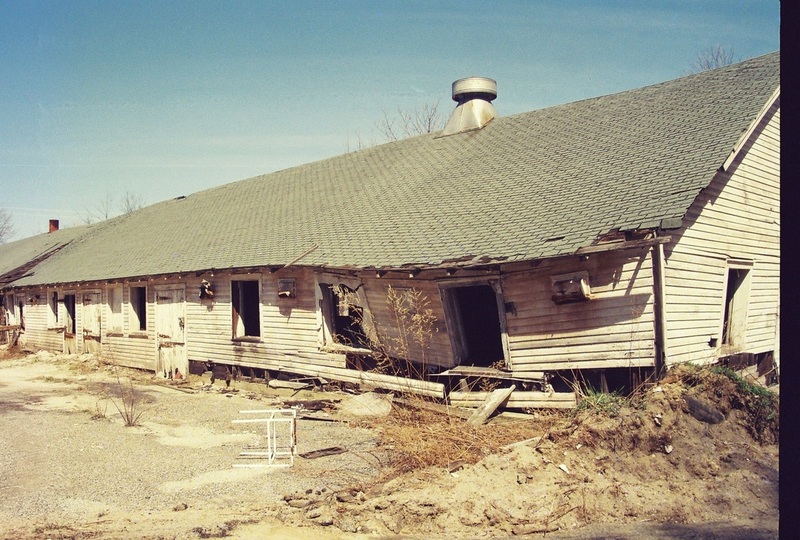 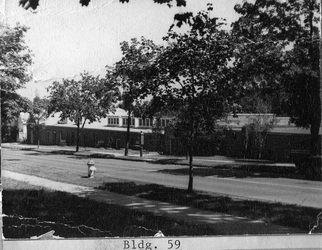 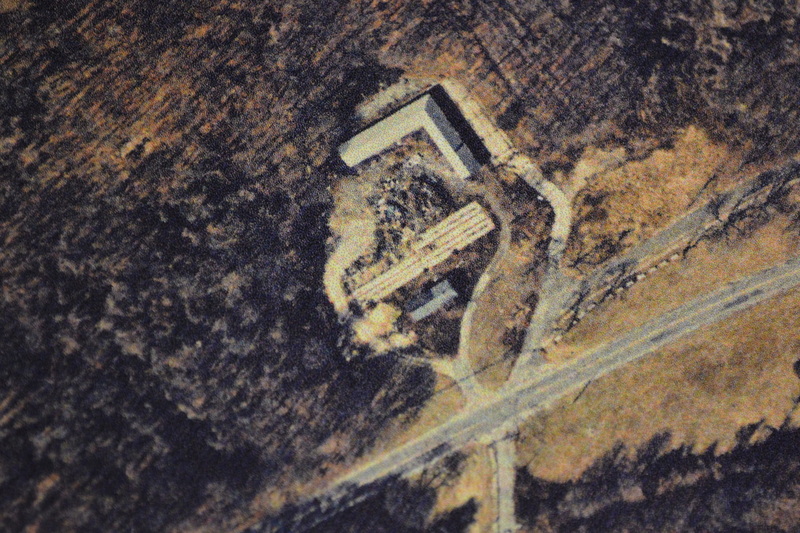 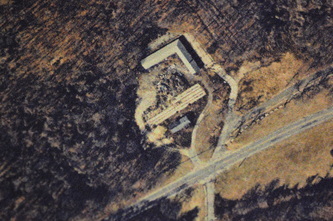 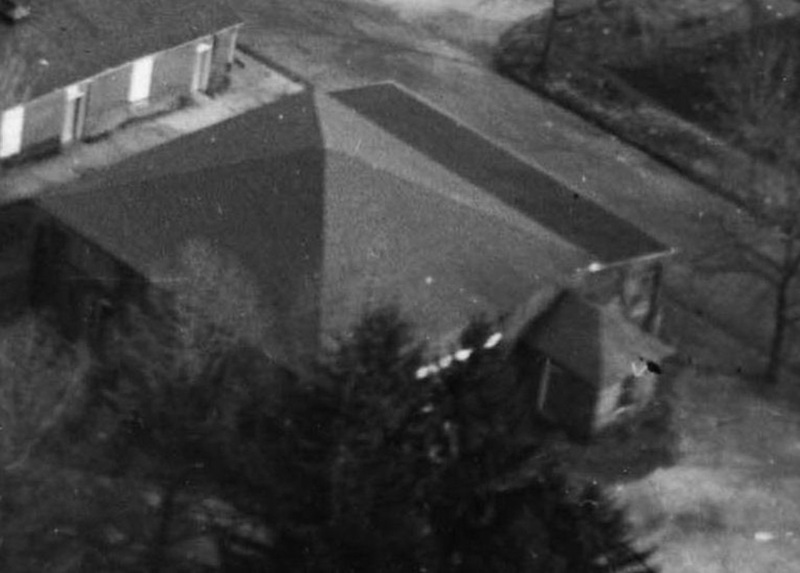 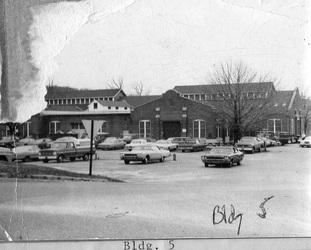 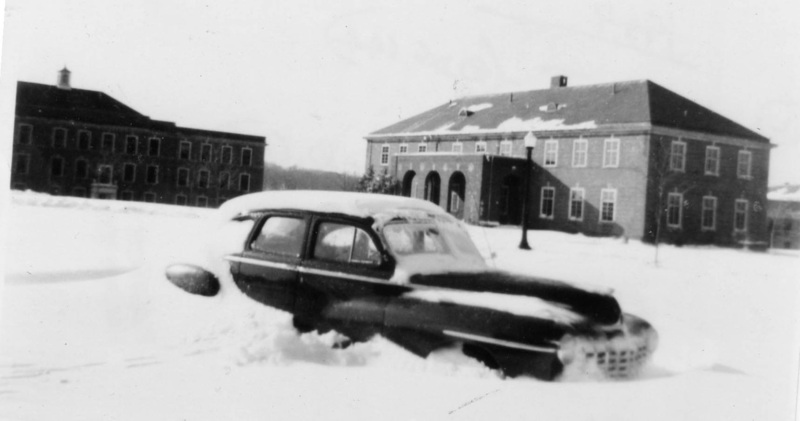 Building 58 was first used as an ice house using water from the reservoir, but later became the Pickle House, and then the Sauerkraut House until it was demolished. Building 33 was the laundry building before Building 5 was built to replace it, which was replaced by Building 94. 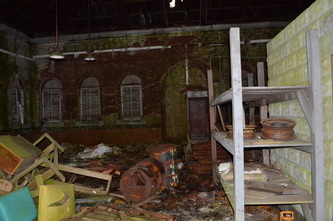 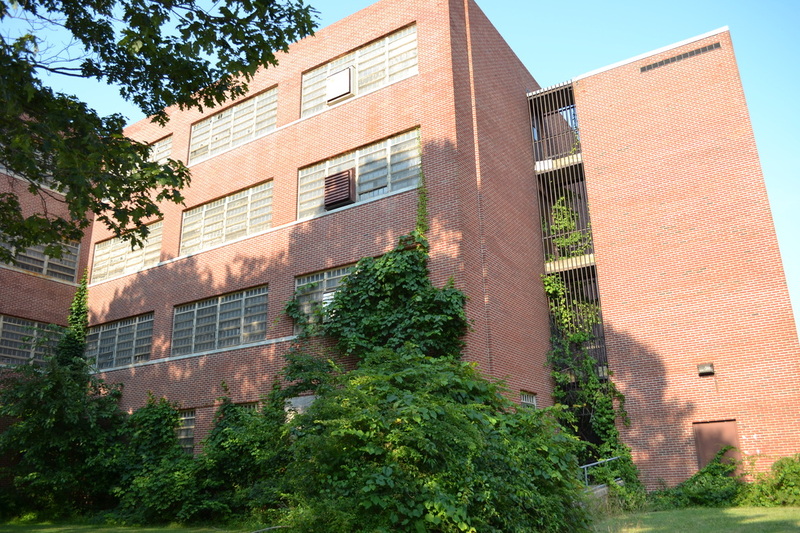 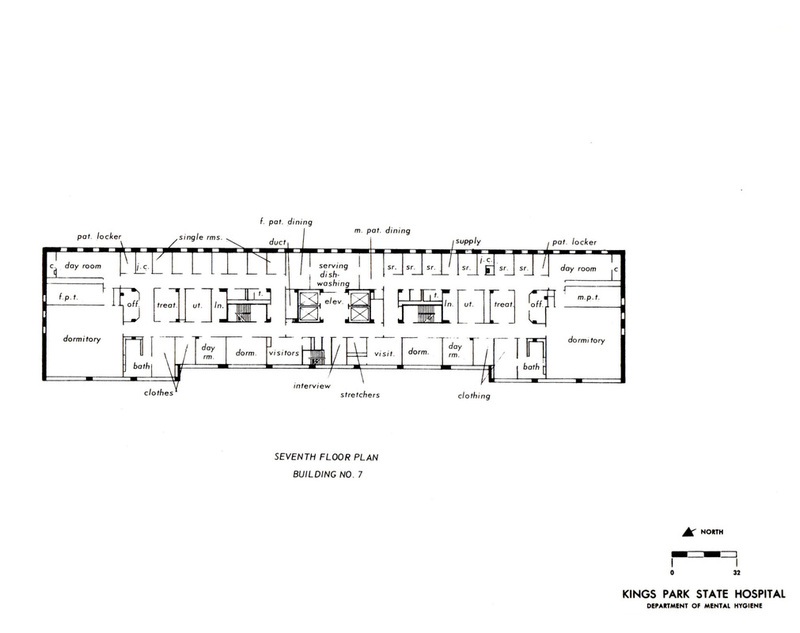 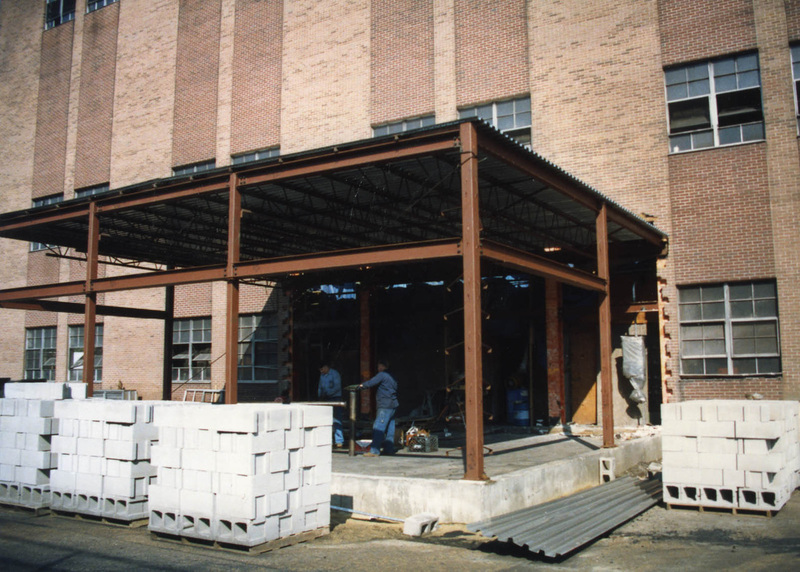 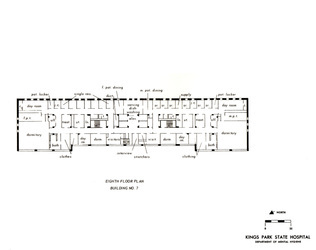 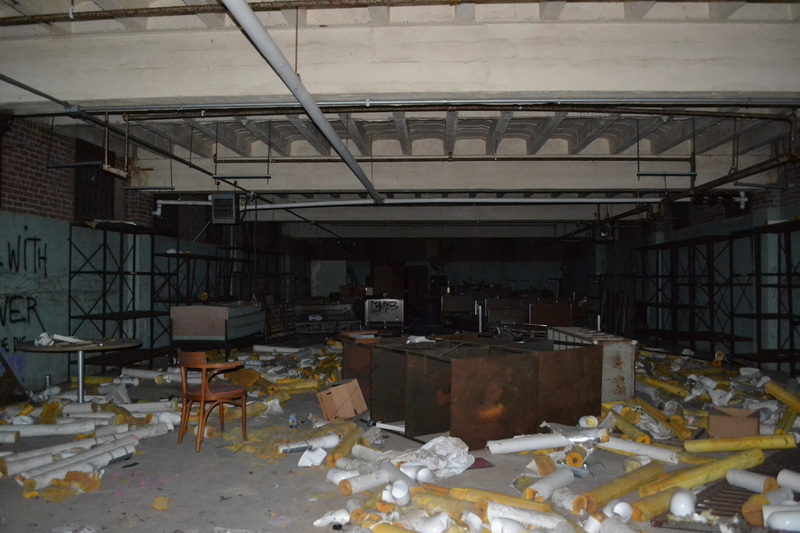 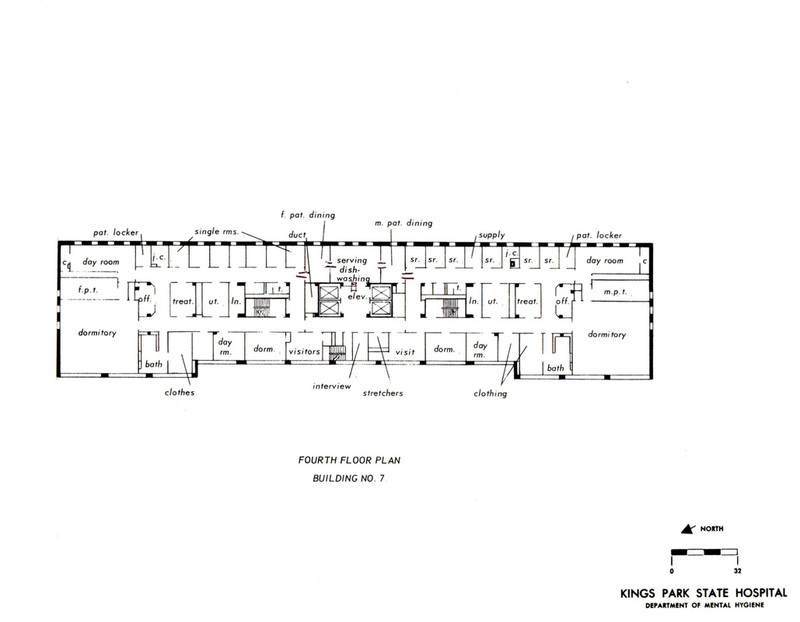 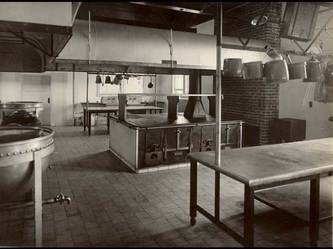 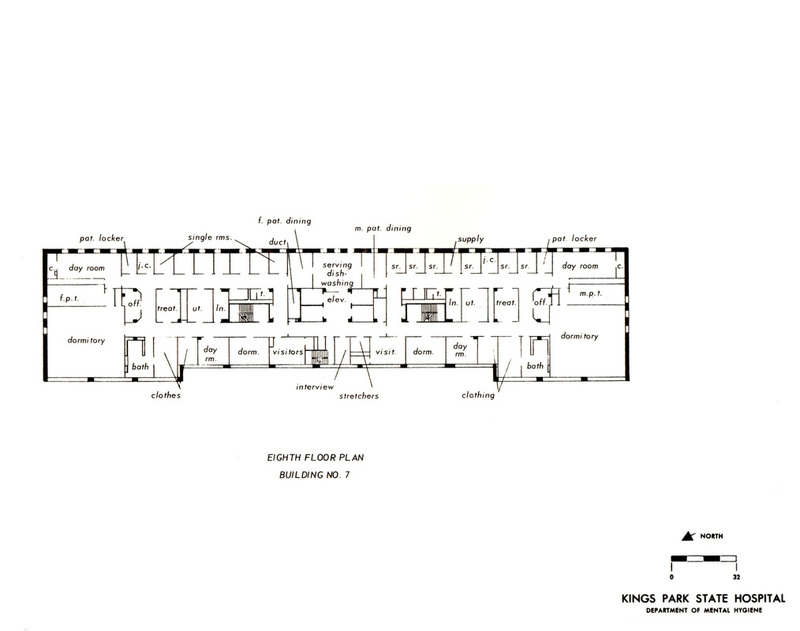 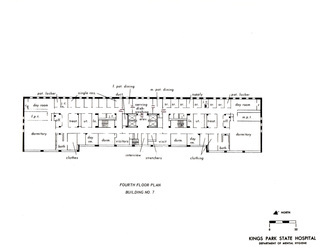 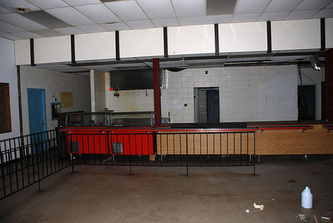 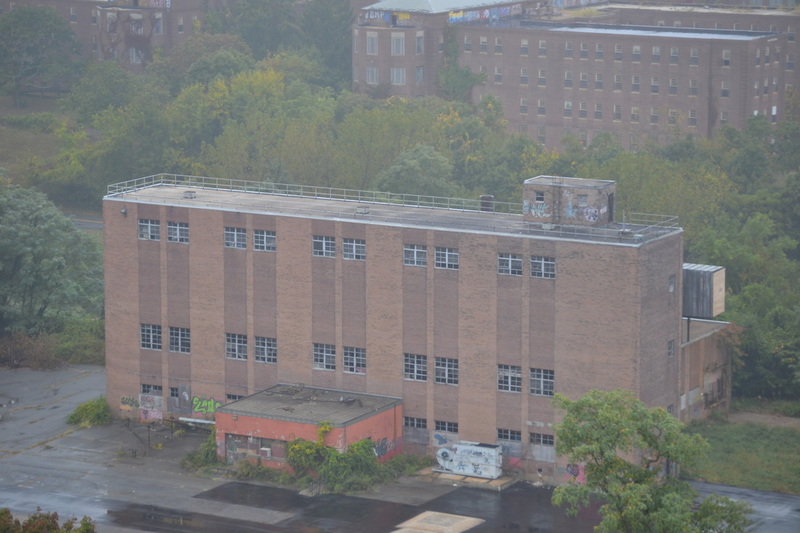 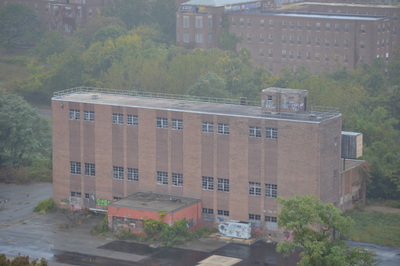 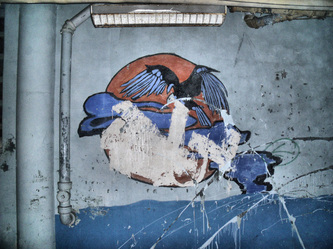 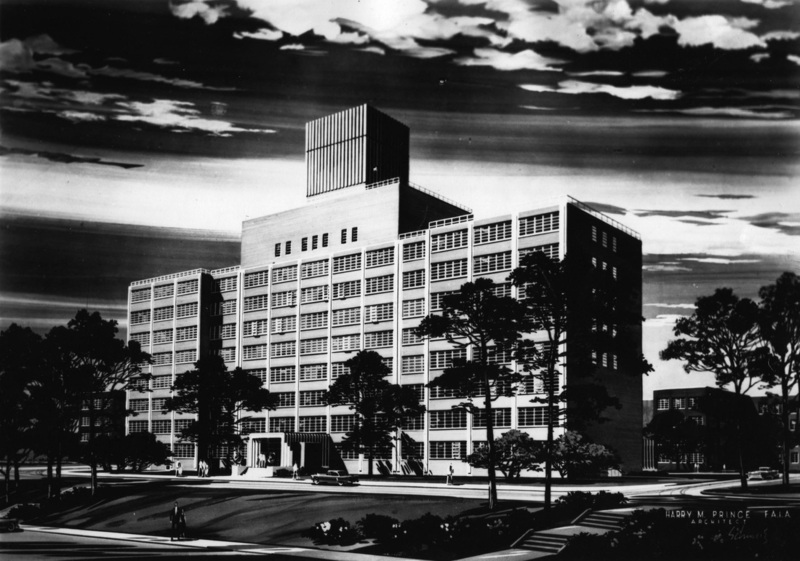 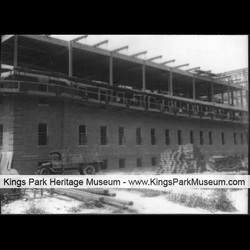 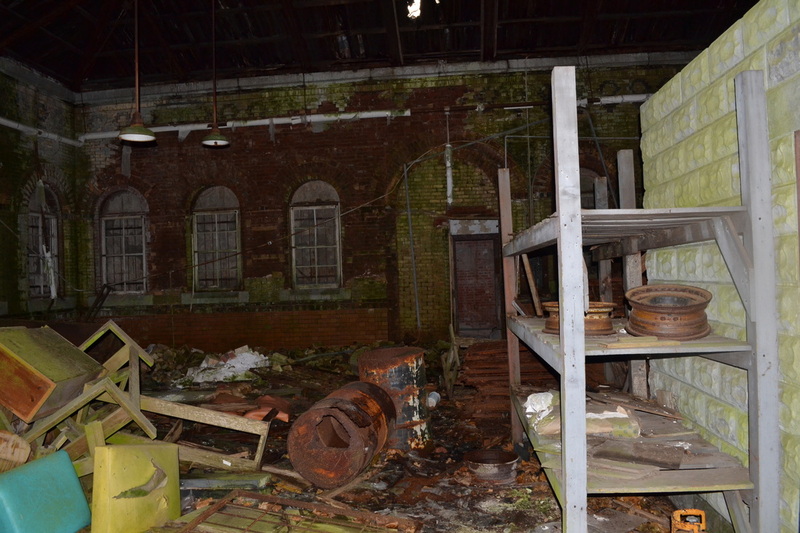 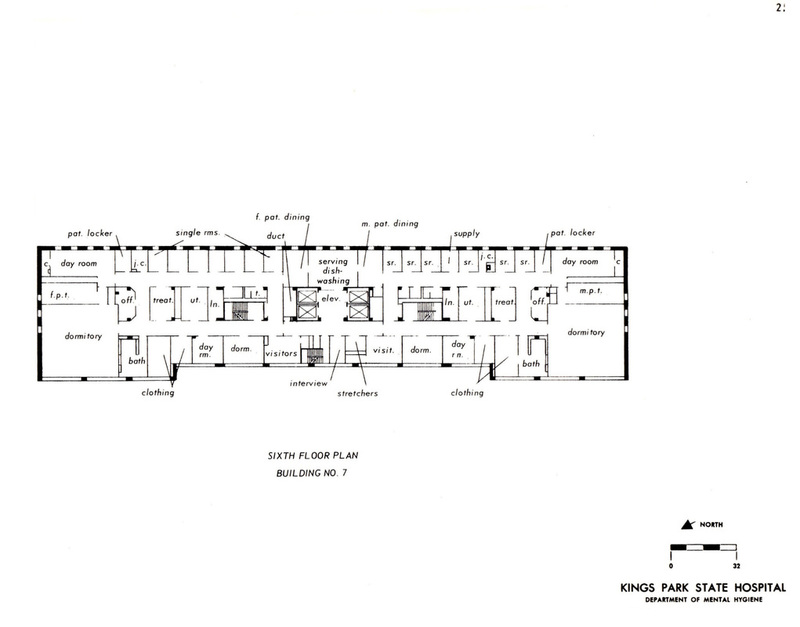 Building 50 was a kitchen and dining hall known as Kitchen T. Building 51 was a storage warehouse used as an ice plant. 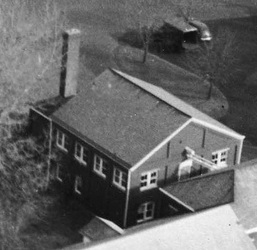 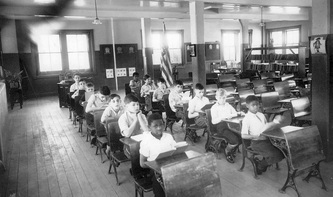 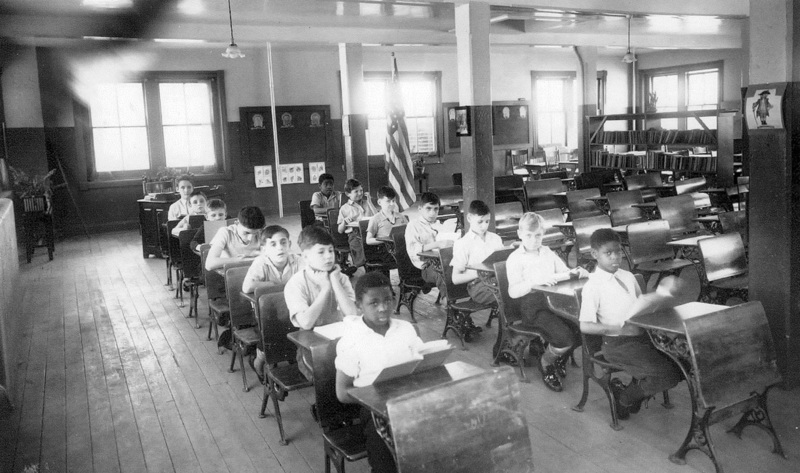 Building 52 was originally a bakery until it was converted into a school house. All of these buildings were demolished many decades ago. 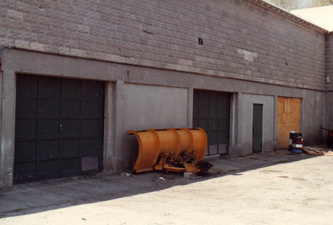 Building 62 is a garage used for trucks. 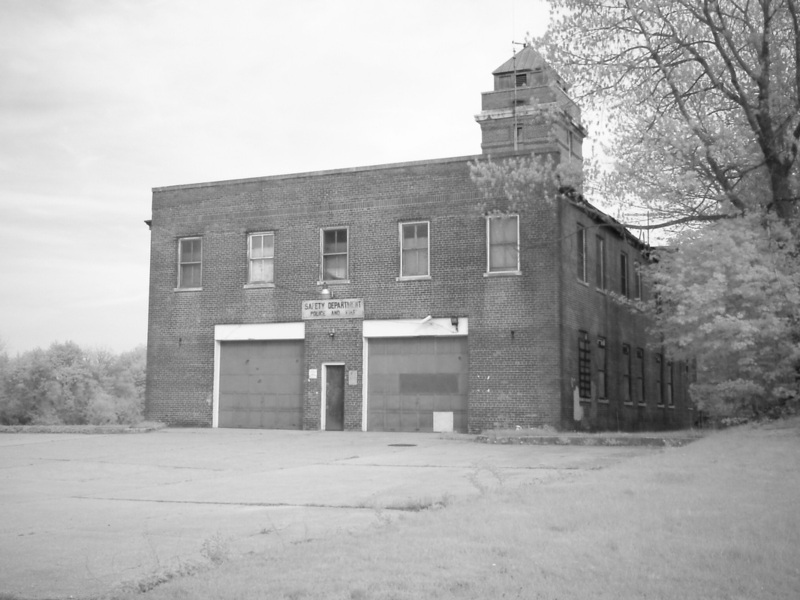 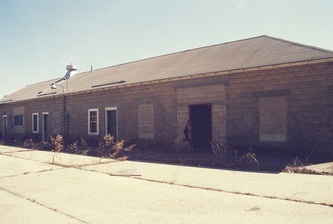 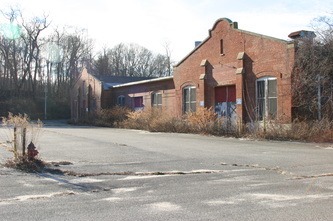 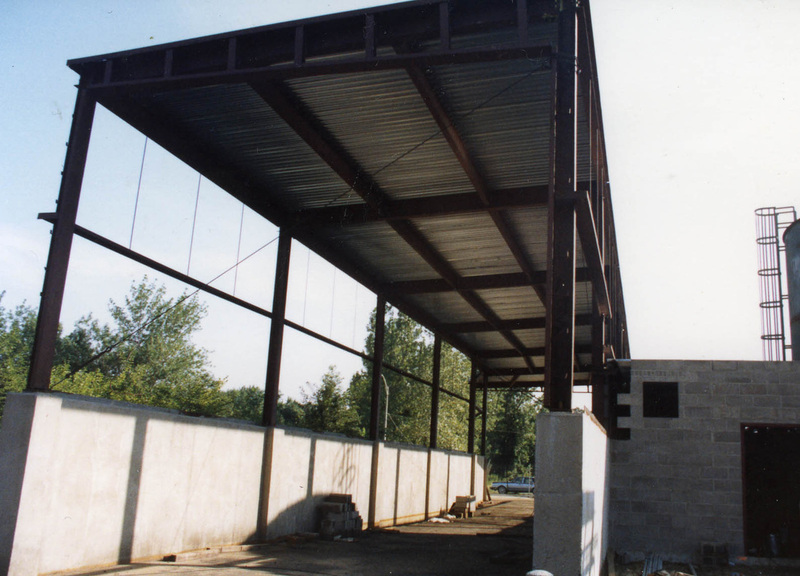 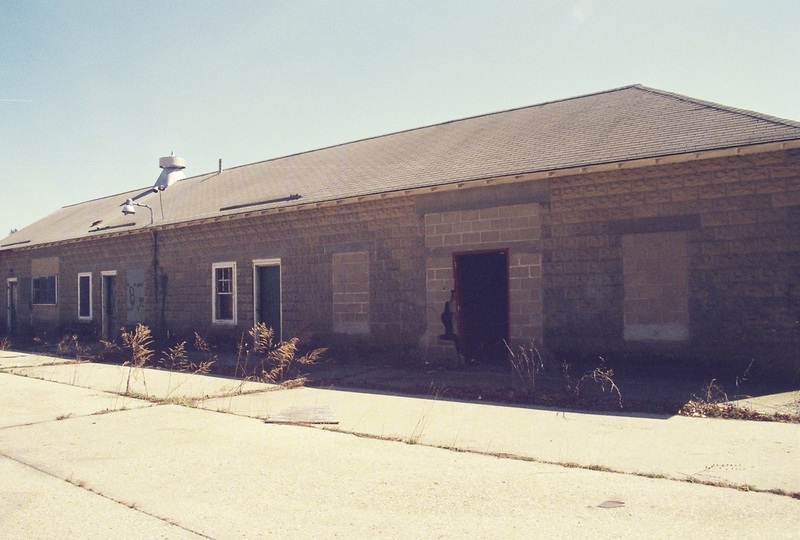 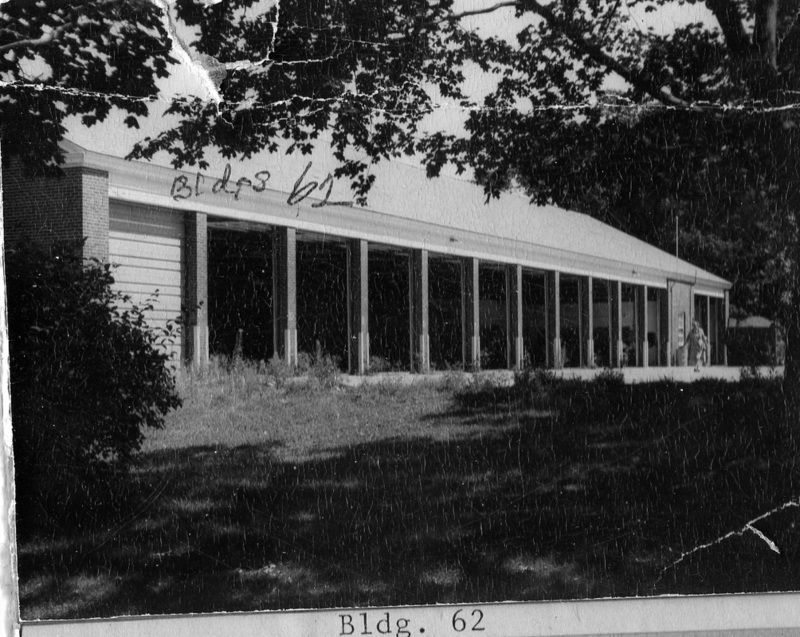 Building 63 was also used as a garage before being demolished and rebuilt as the current Building 62. 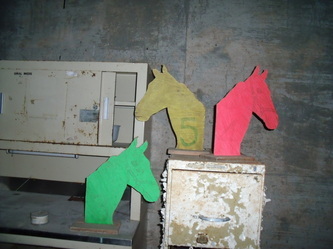 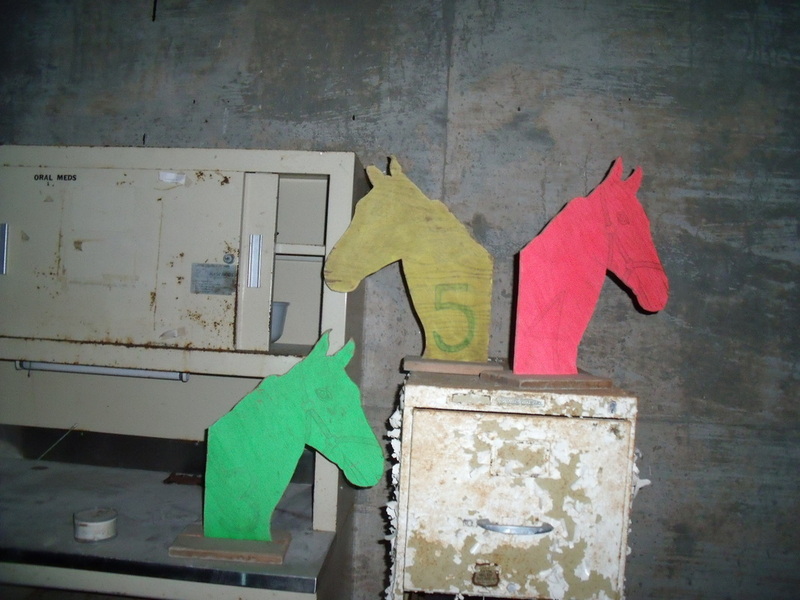 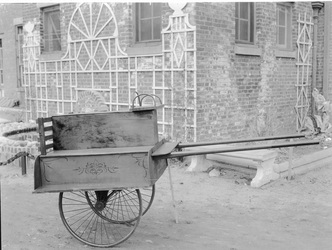 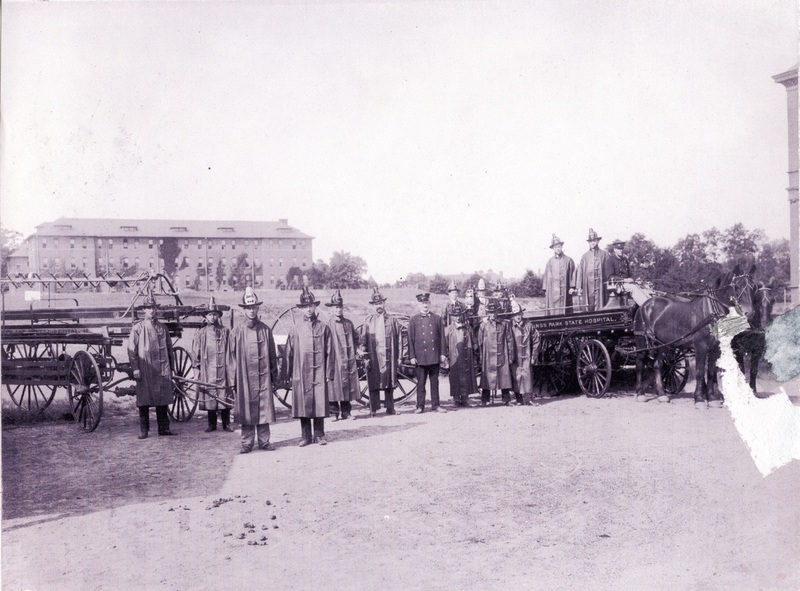 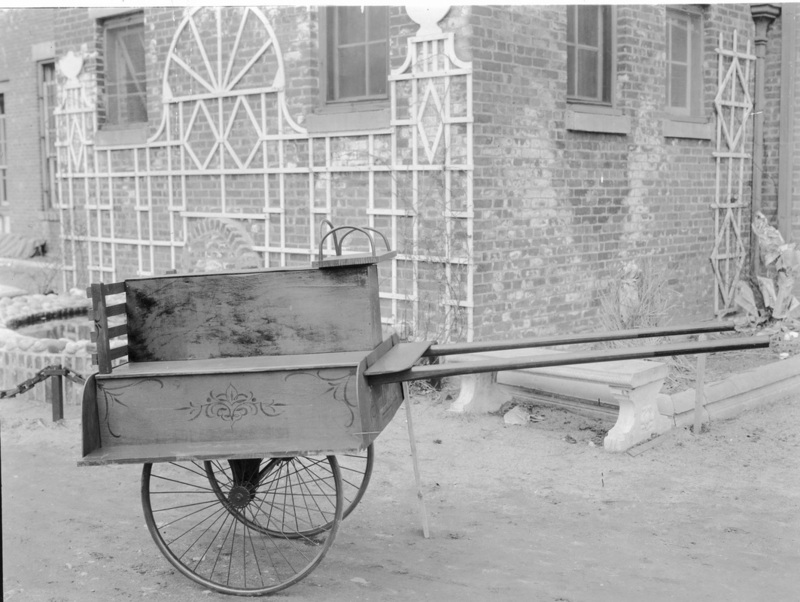 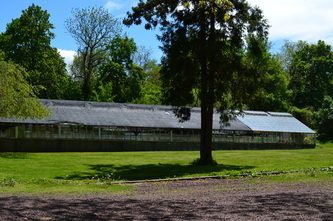 The original 62 was a stable house for horses and carriages. 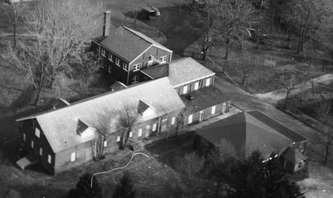 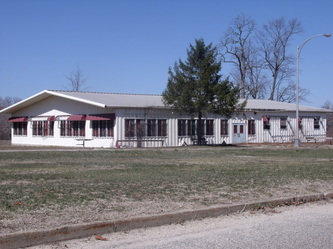 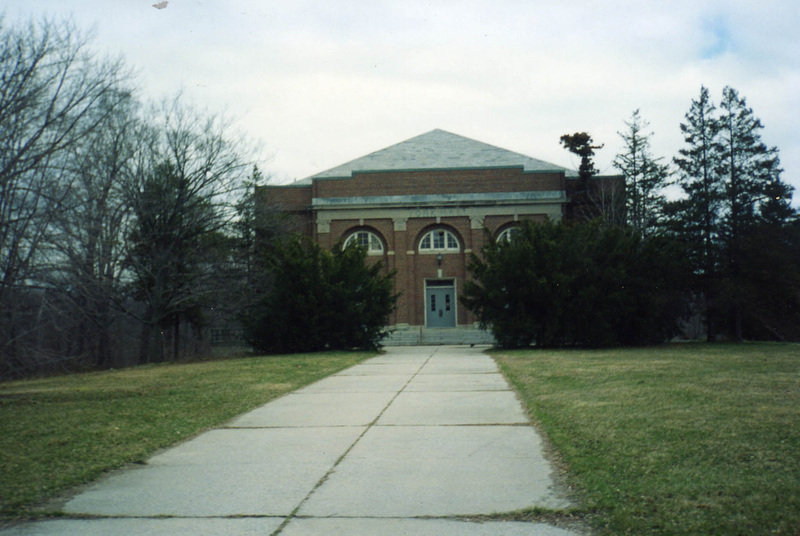 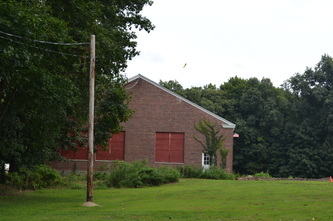 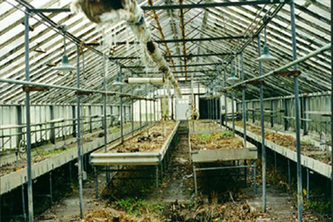 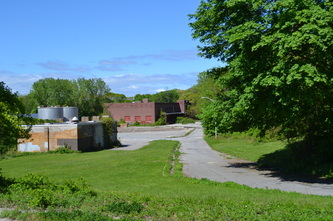 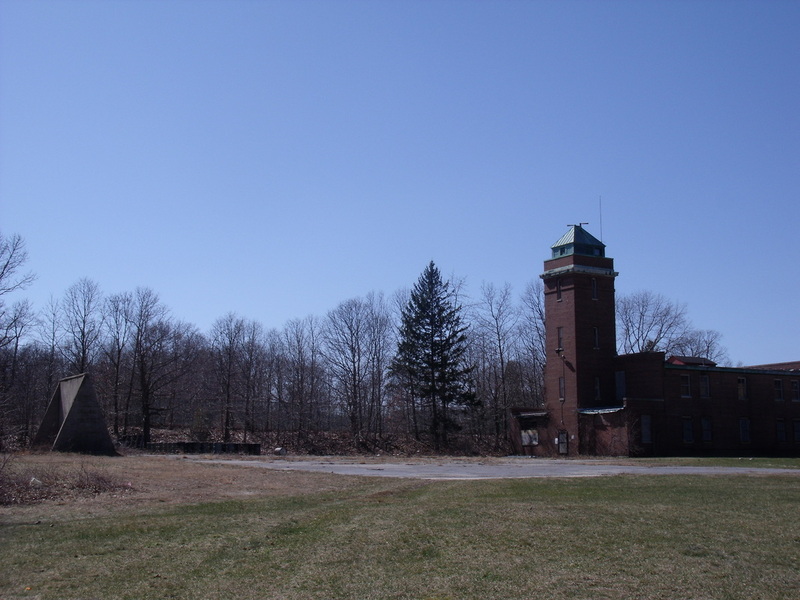 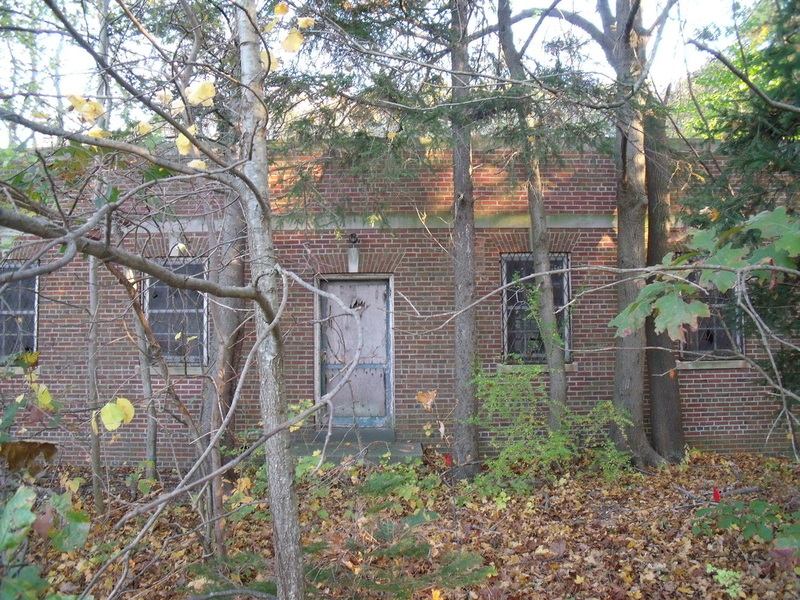 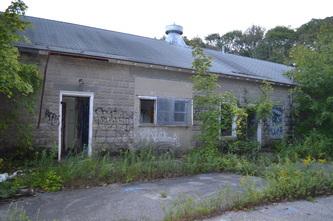 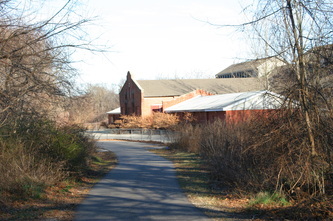 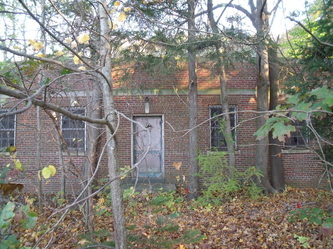 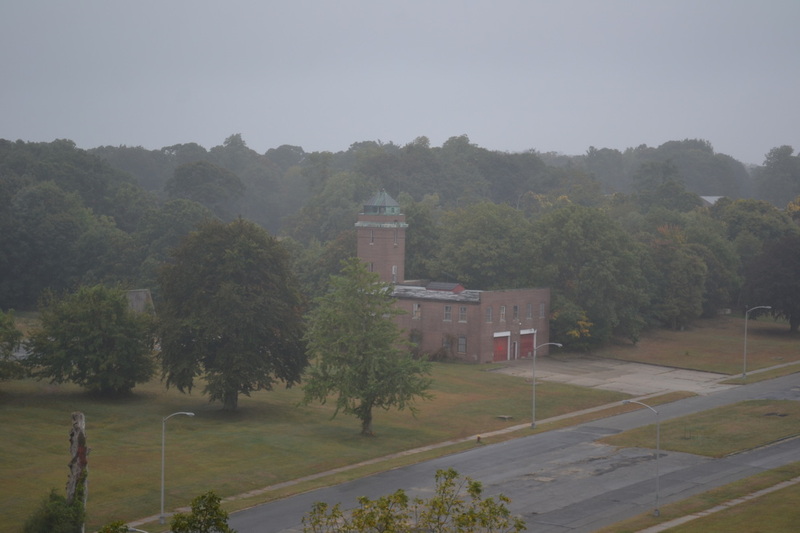 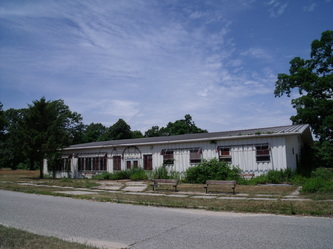 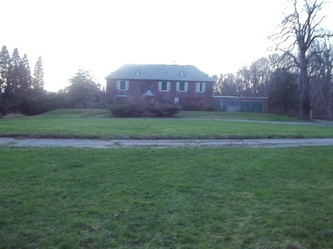 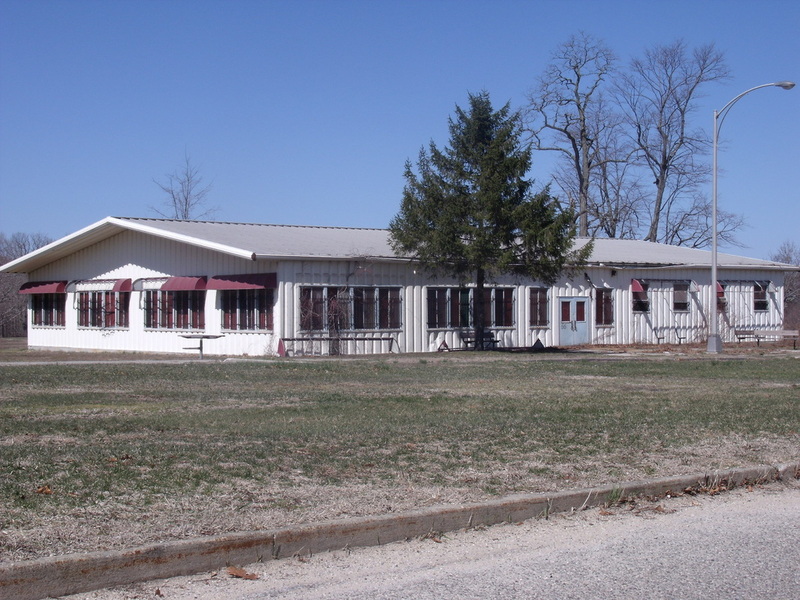 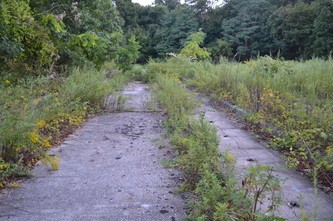 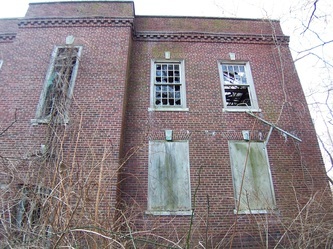 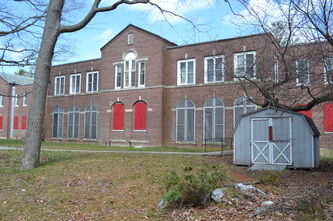 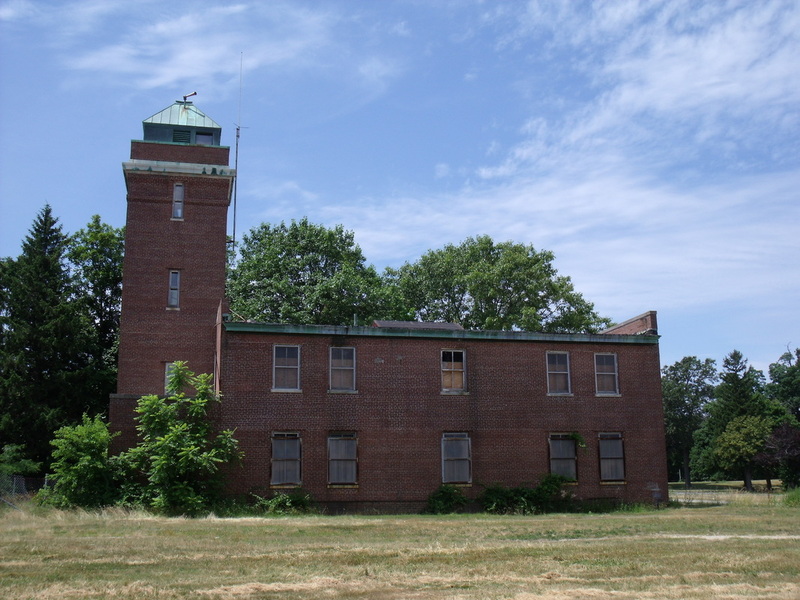 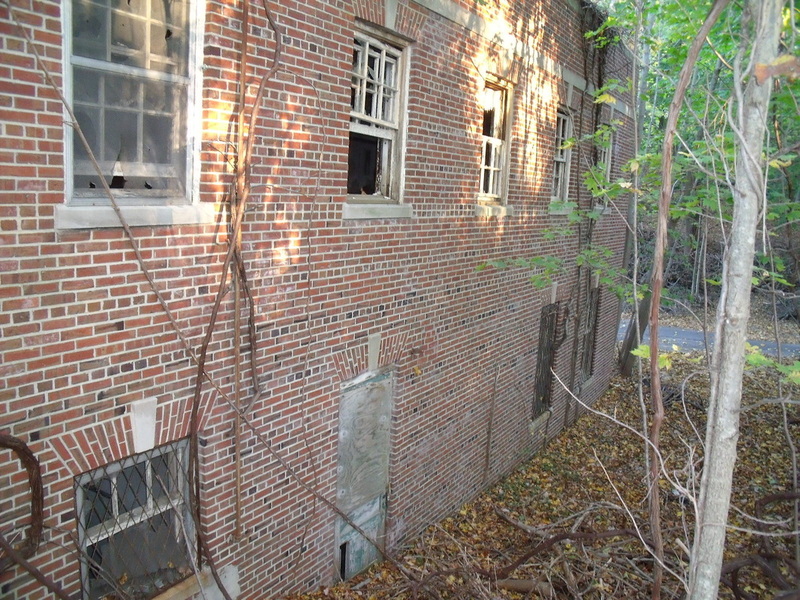 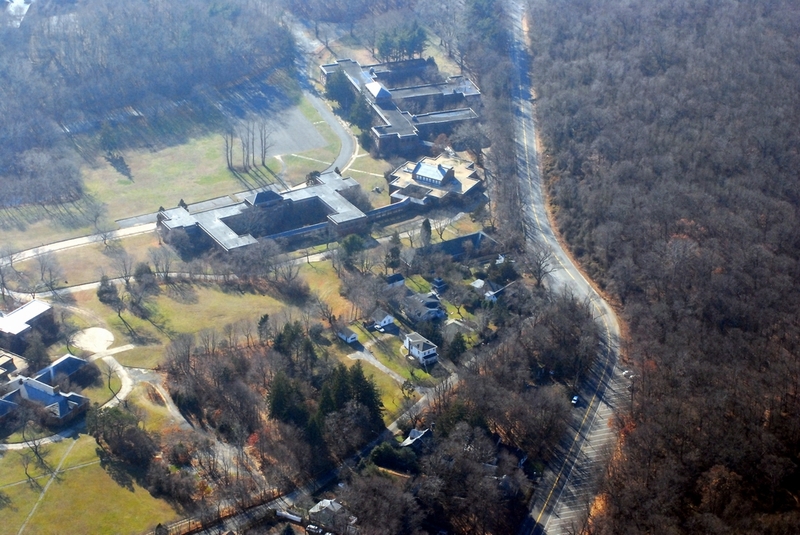 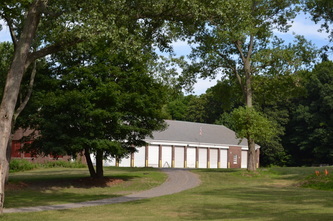 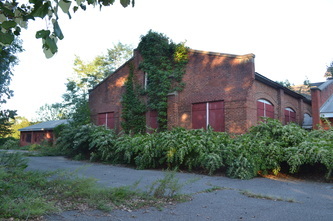 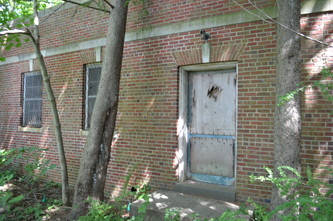 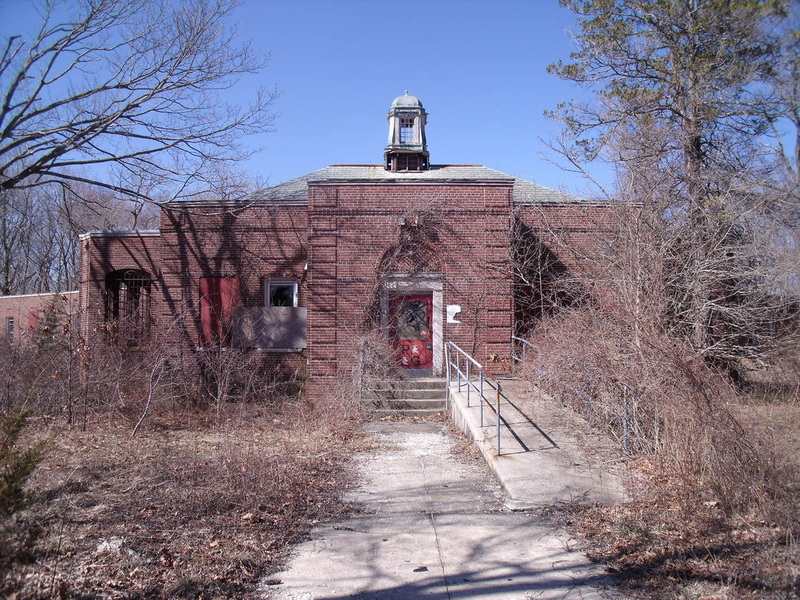 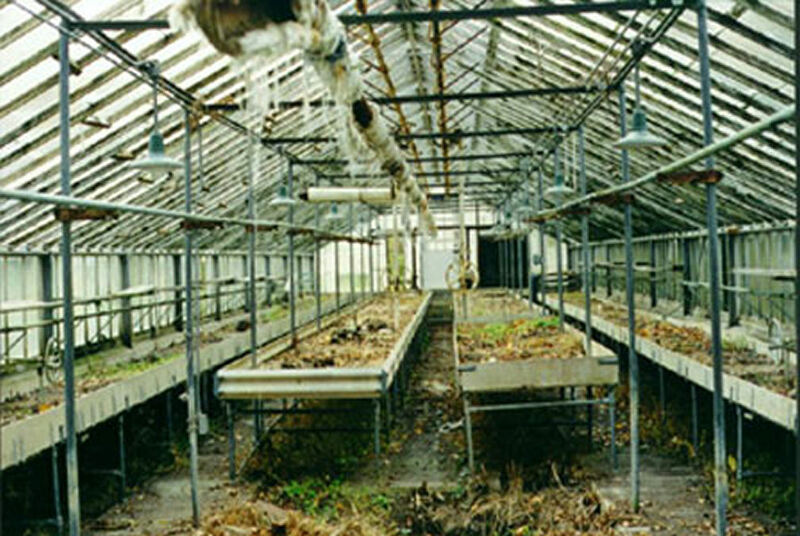 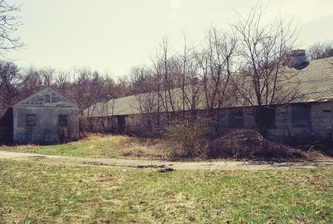 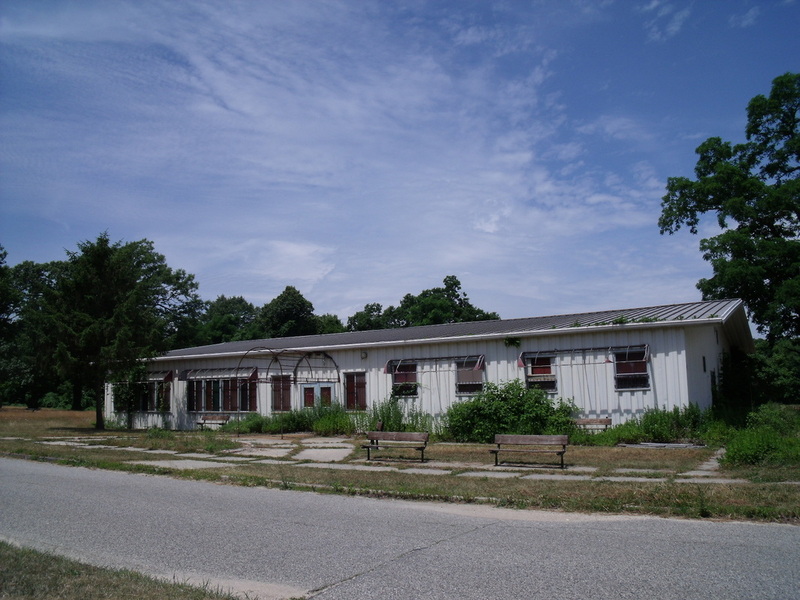 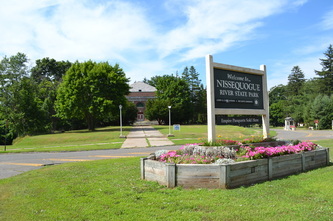 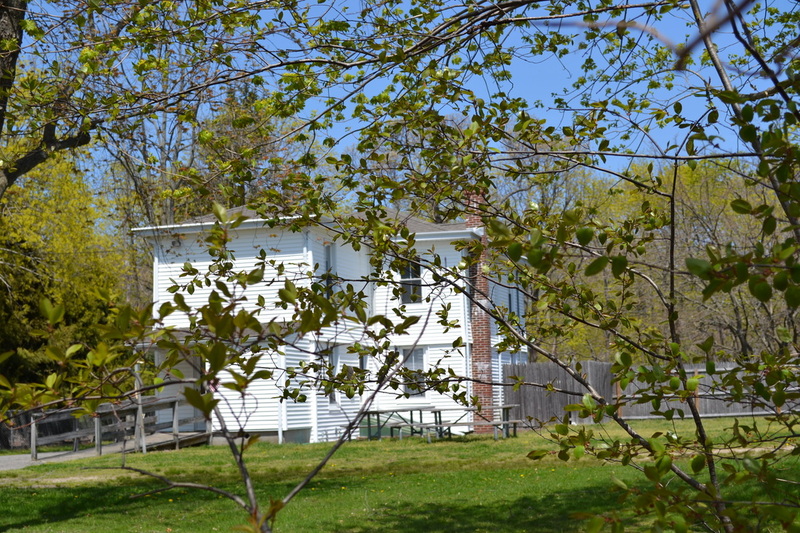 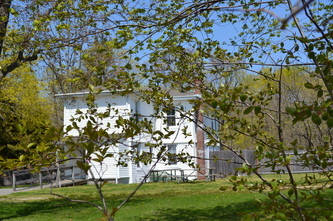 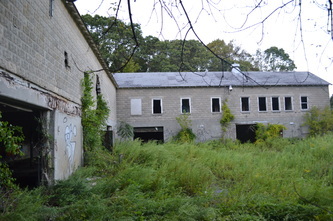 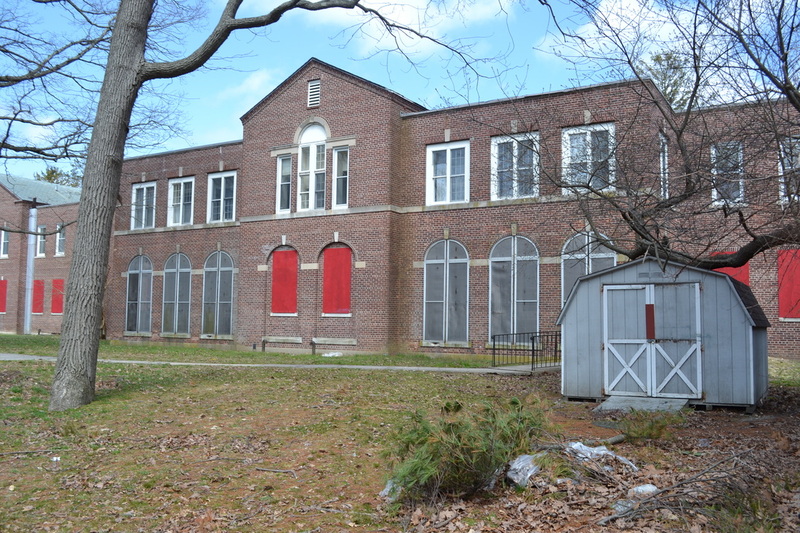 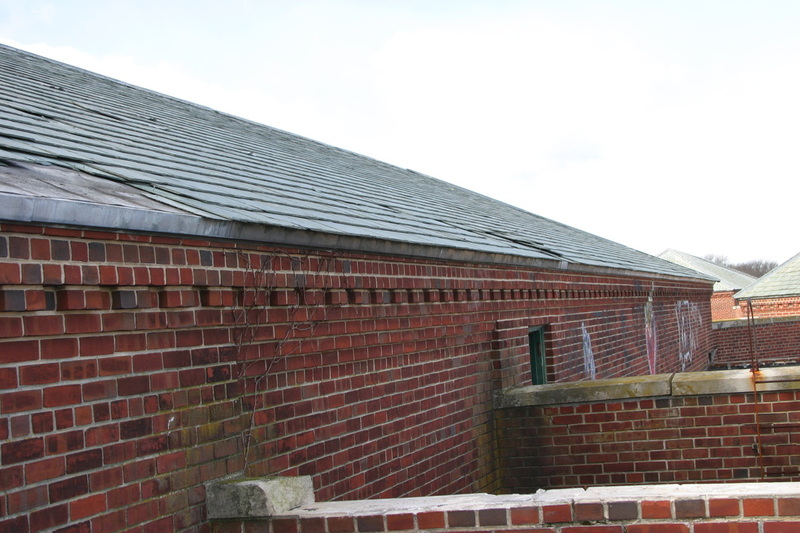 Building 65 is the greenhouse, which is still being used today by the Nissequogue River State Park. 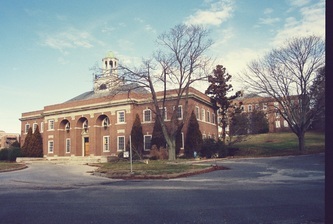 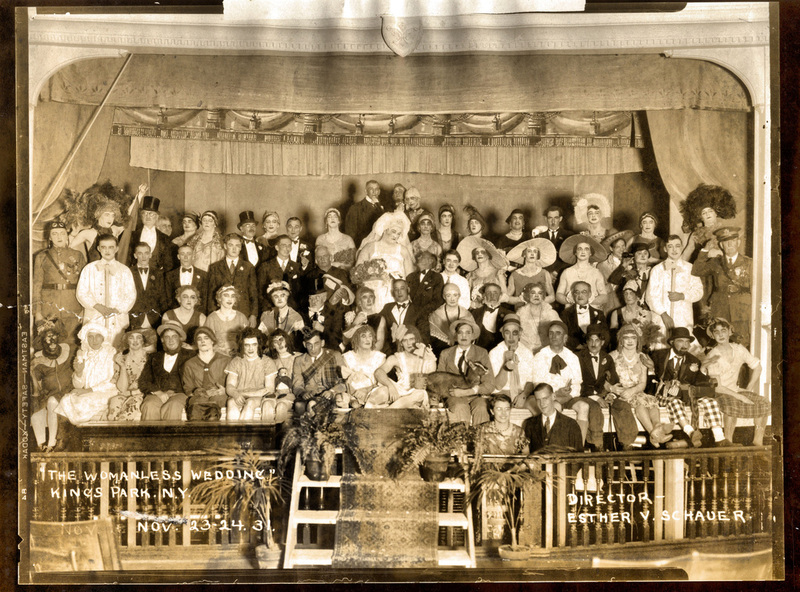 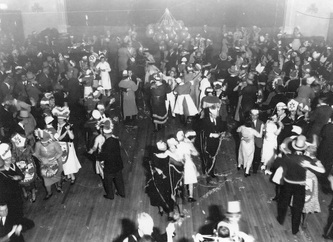 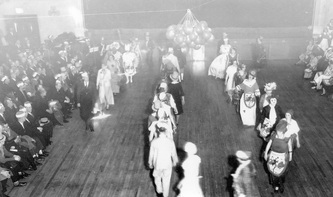 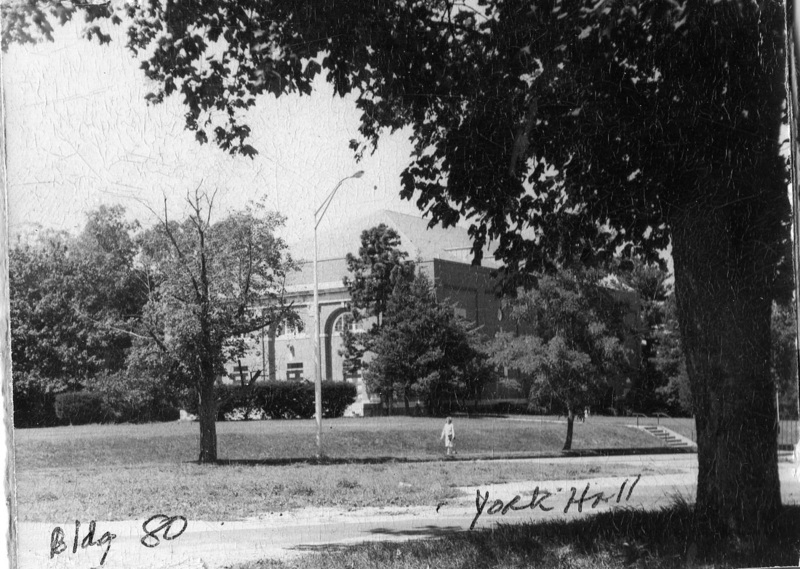 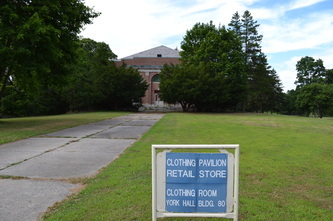 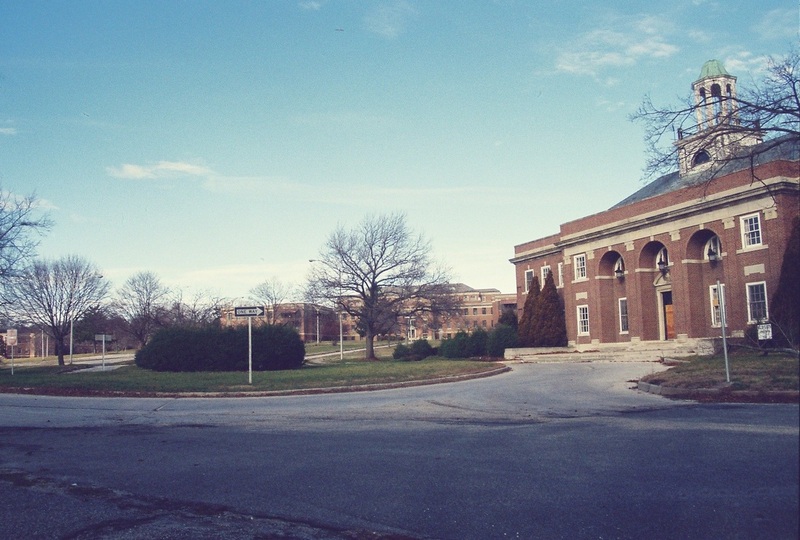 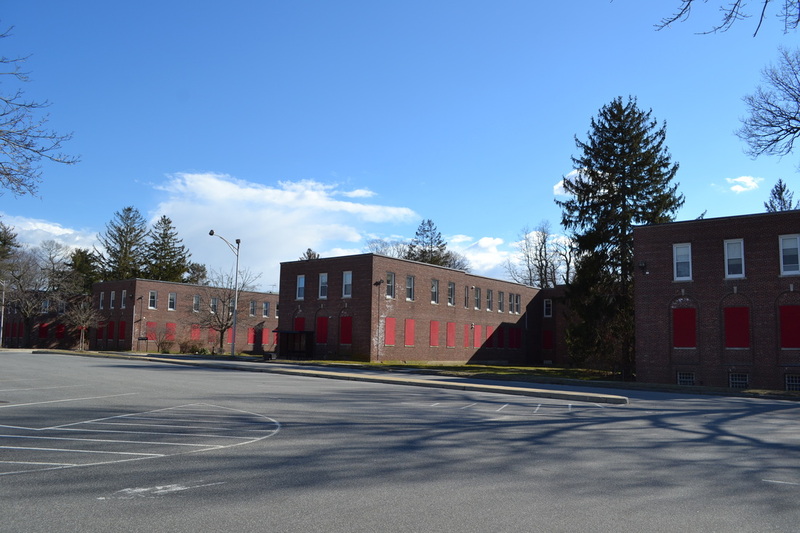 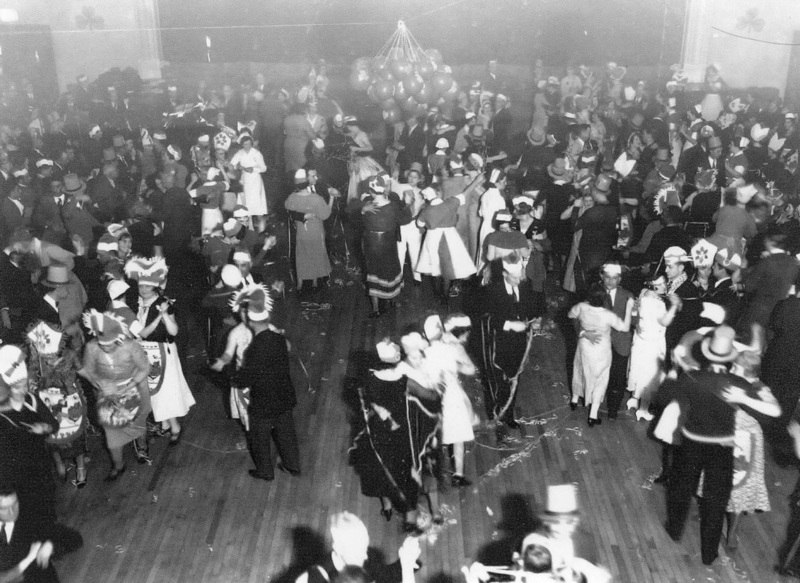 Building 80 was known as York Hall and it is where assemblies, parties, plays, and concerts were held. 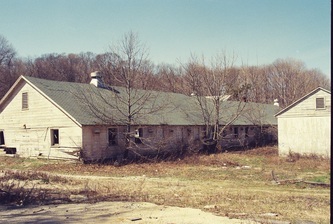 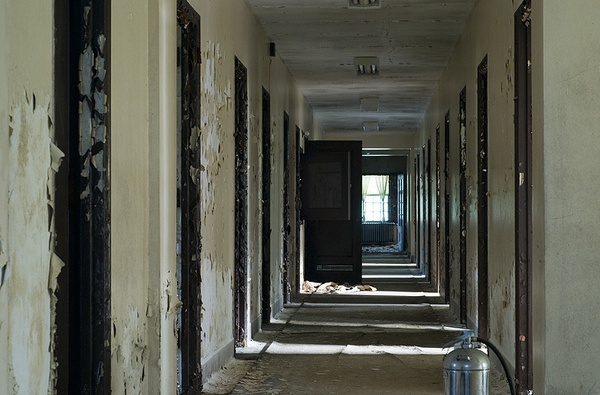 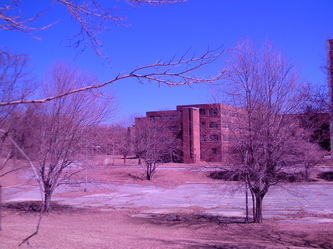 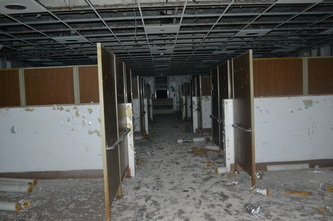 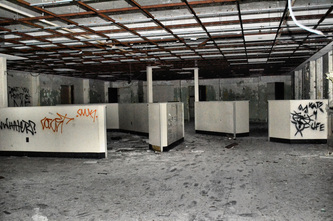 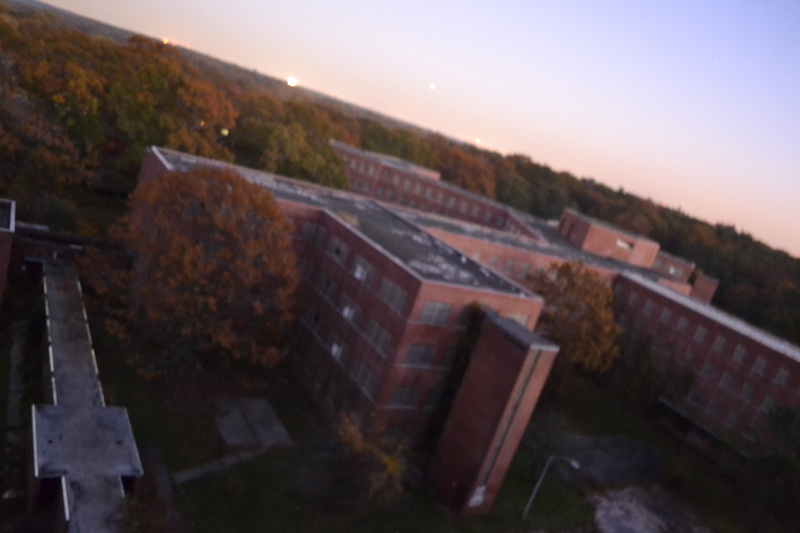 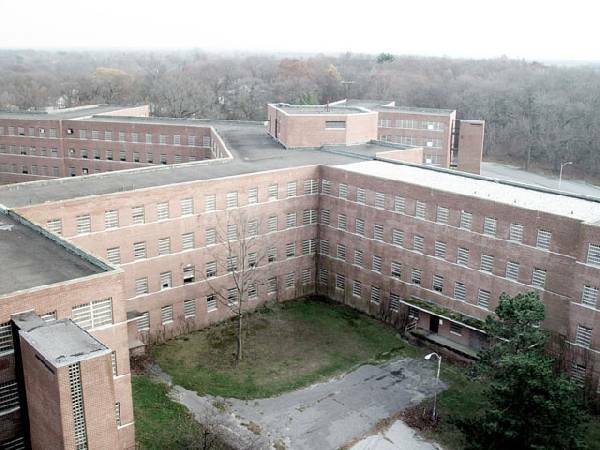 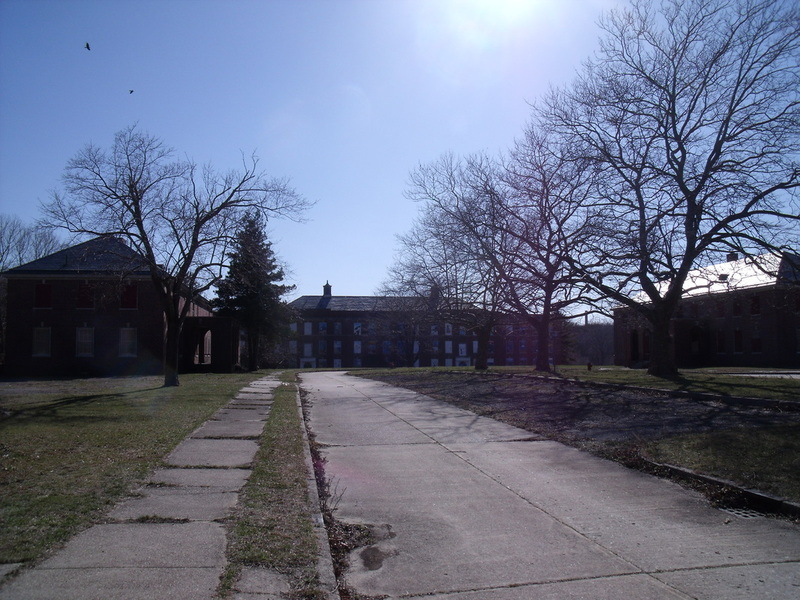 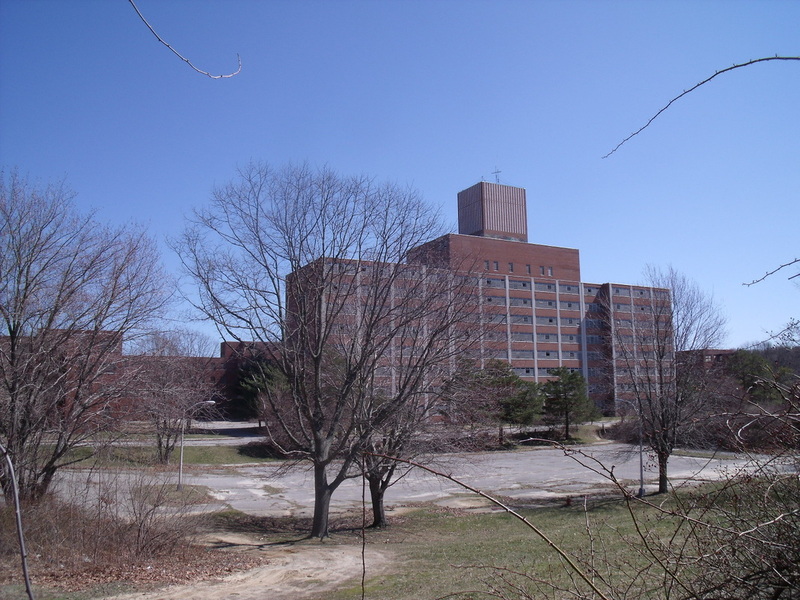 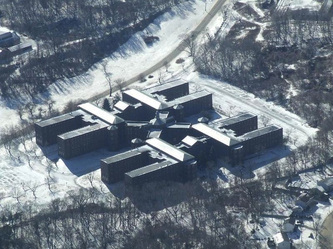 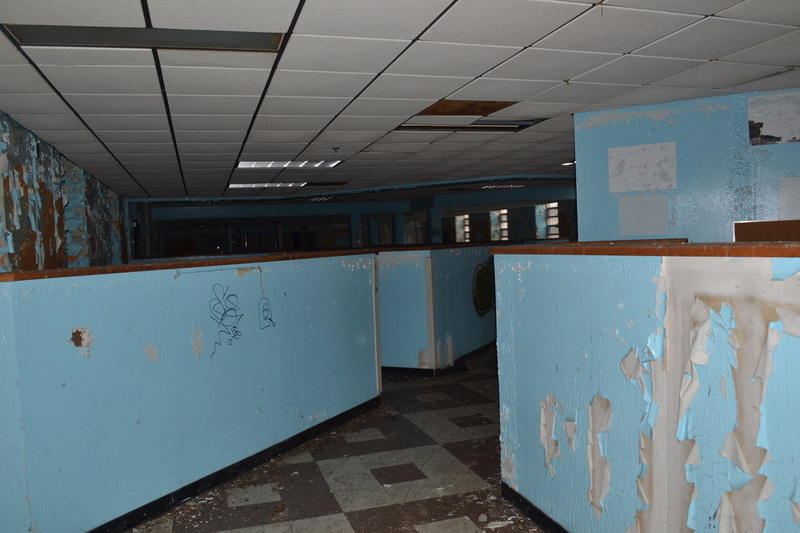 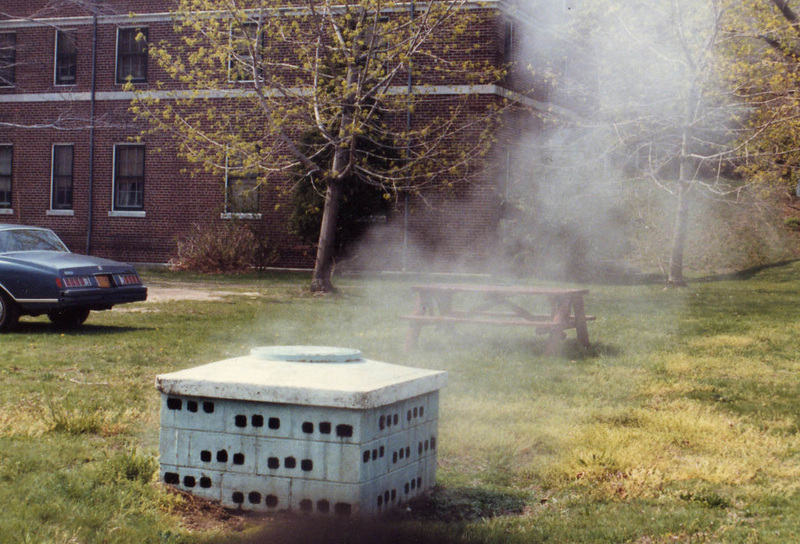 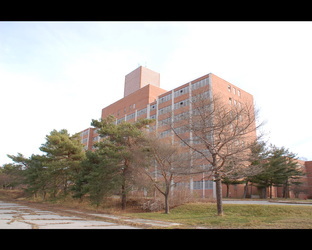 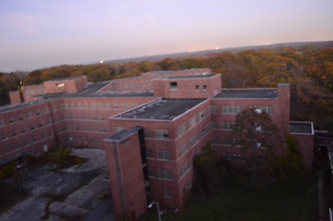 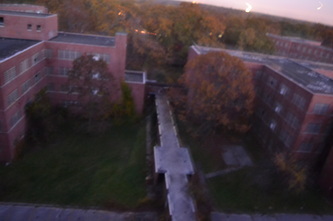 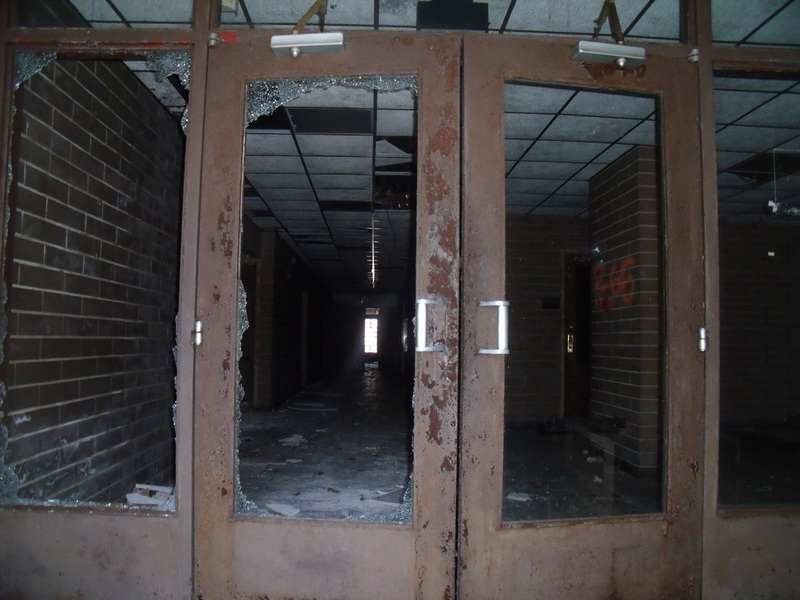 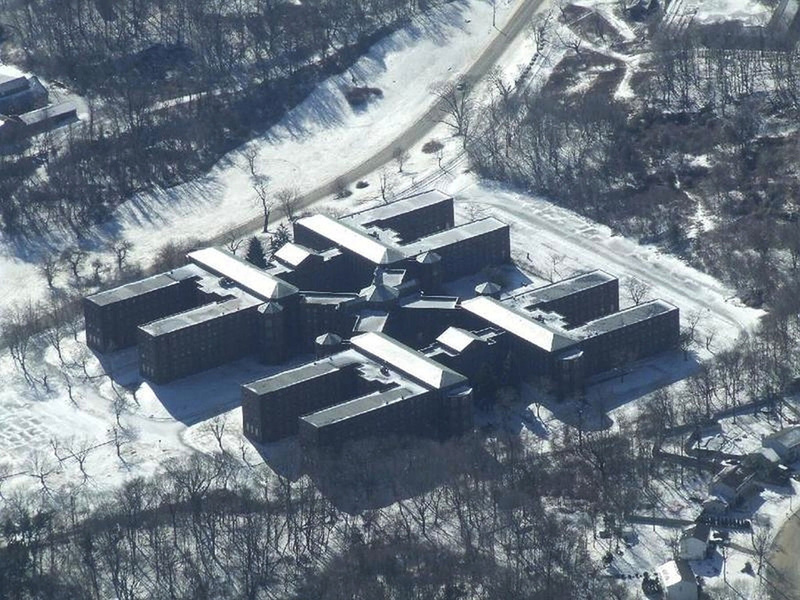 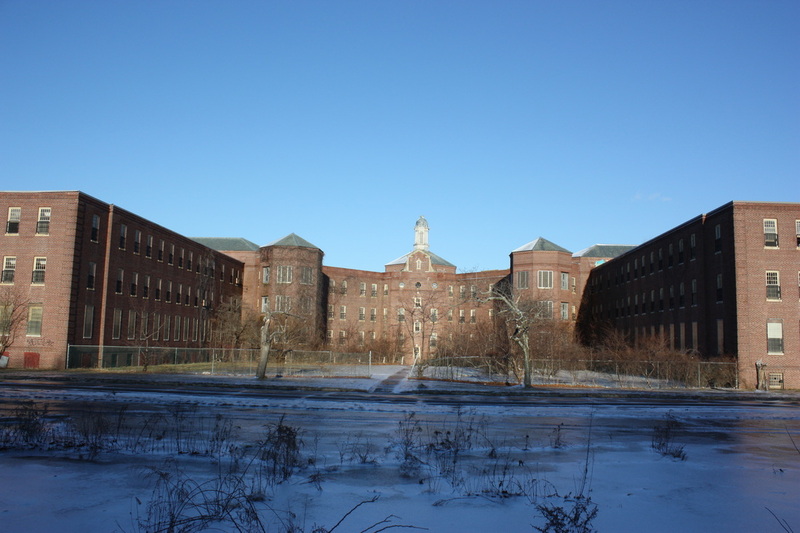 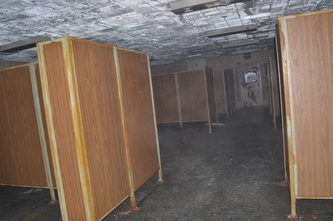 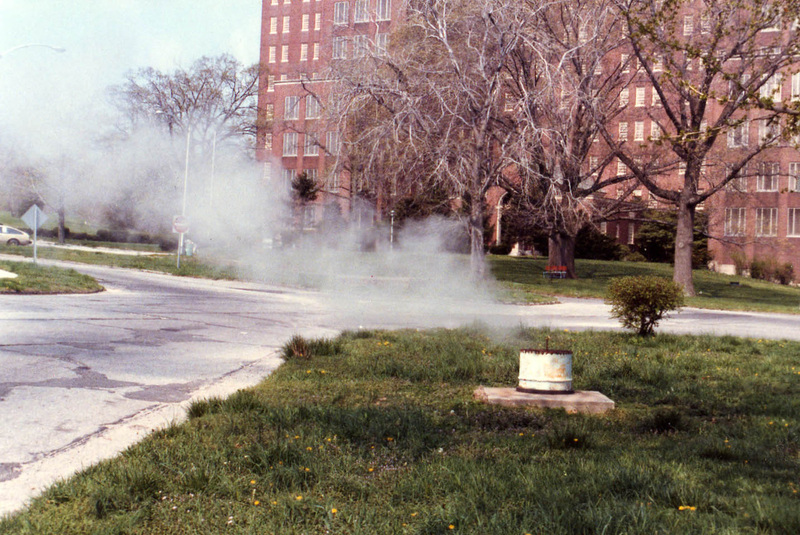 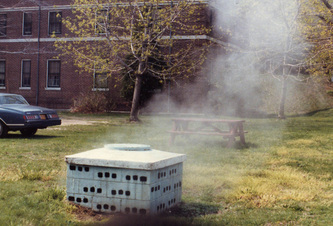 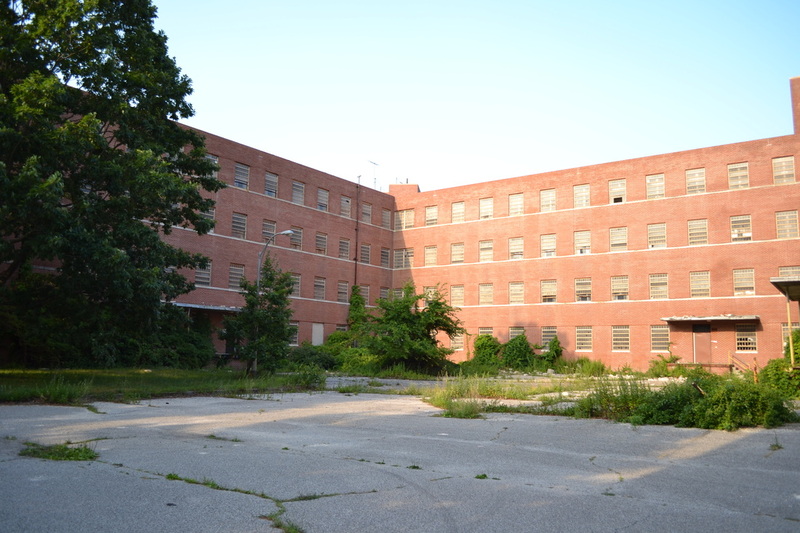 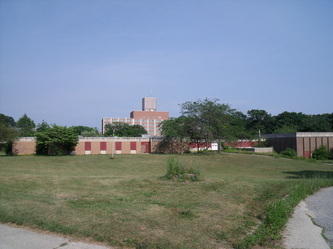 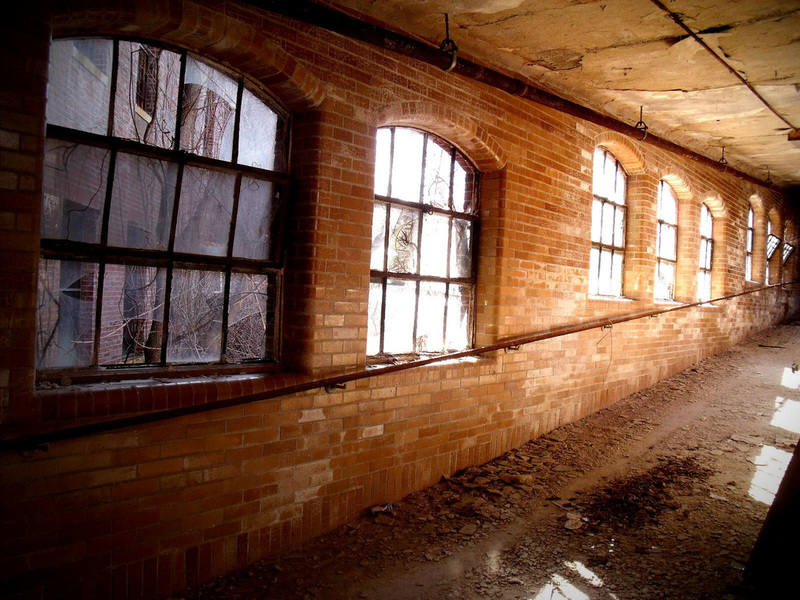 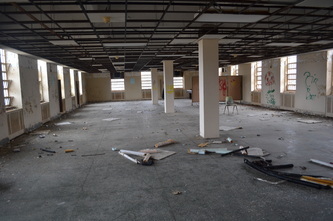 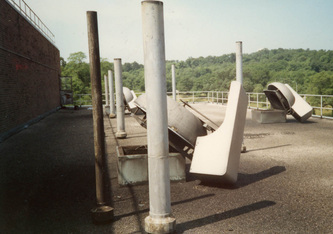 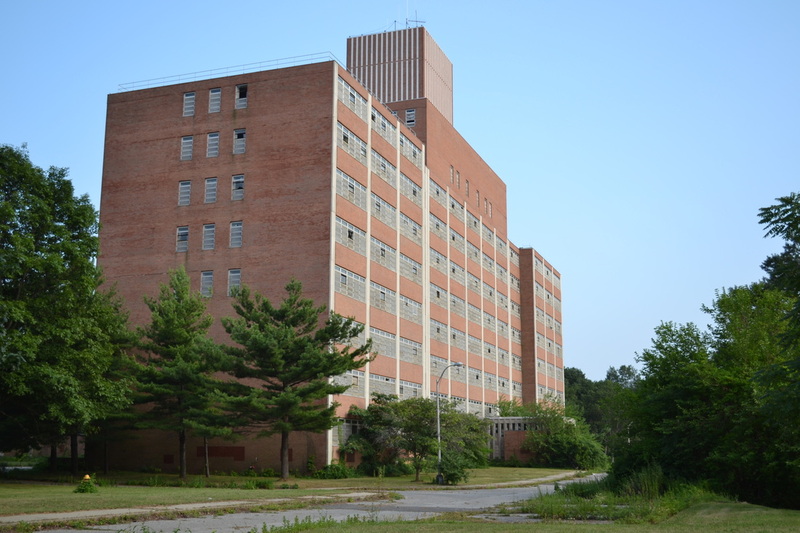 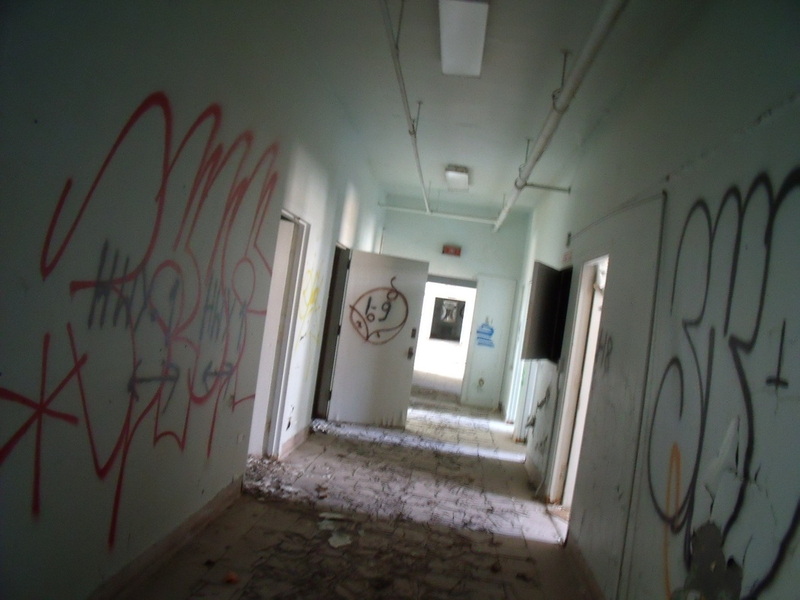 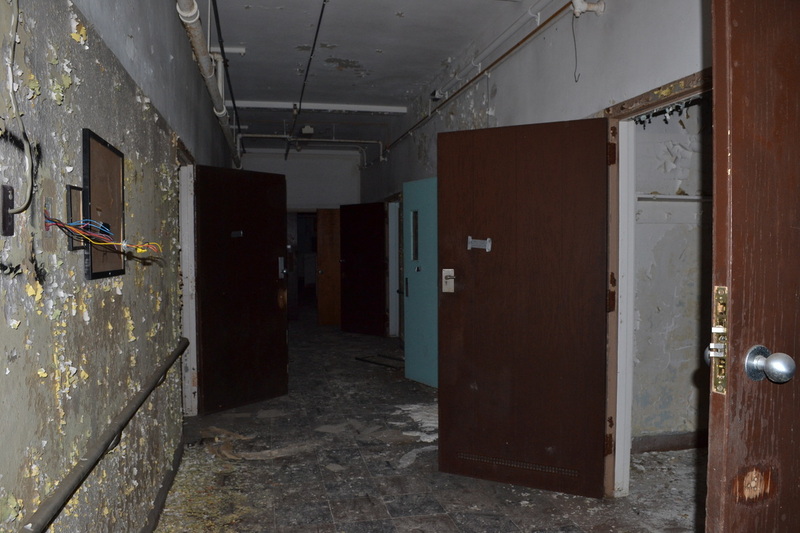 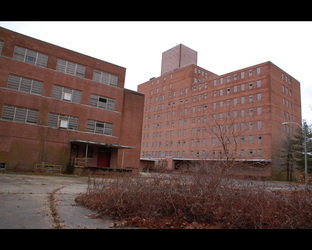 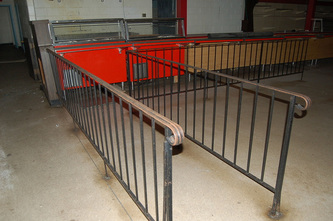 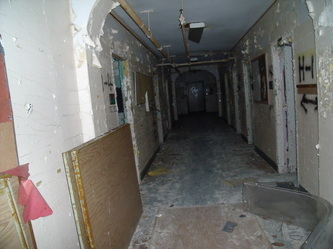 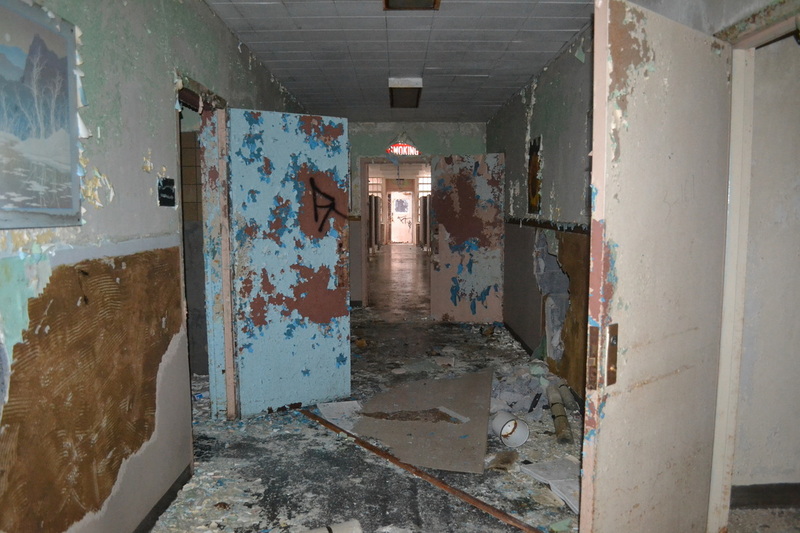 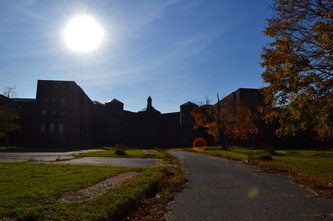 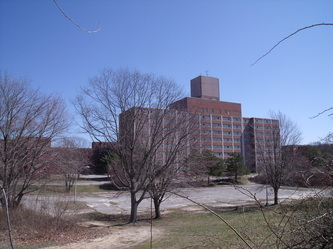 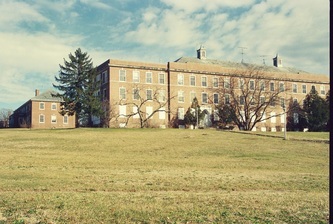 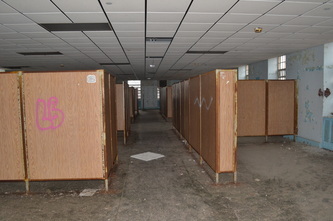 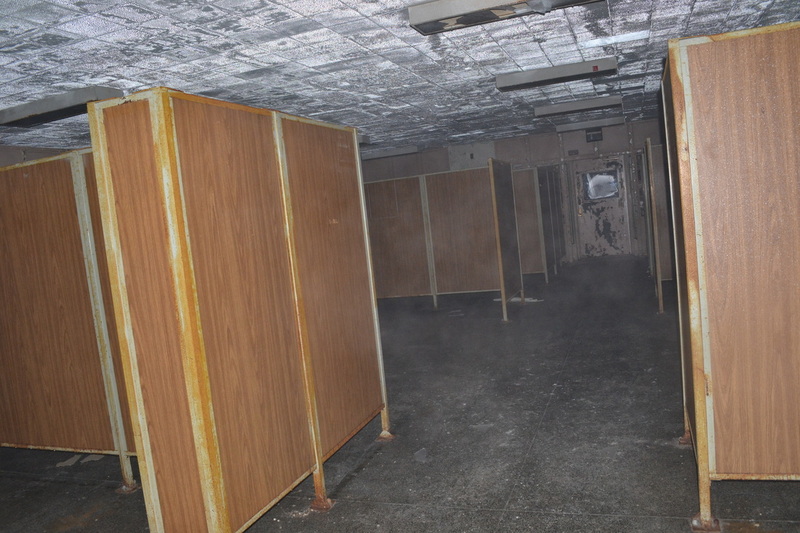 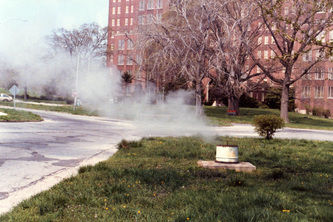 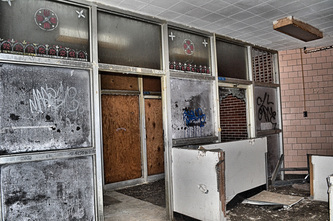 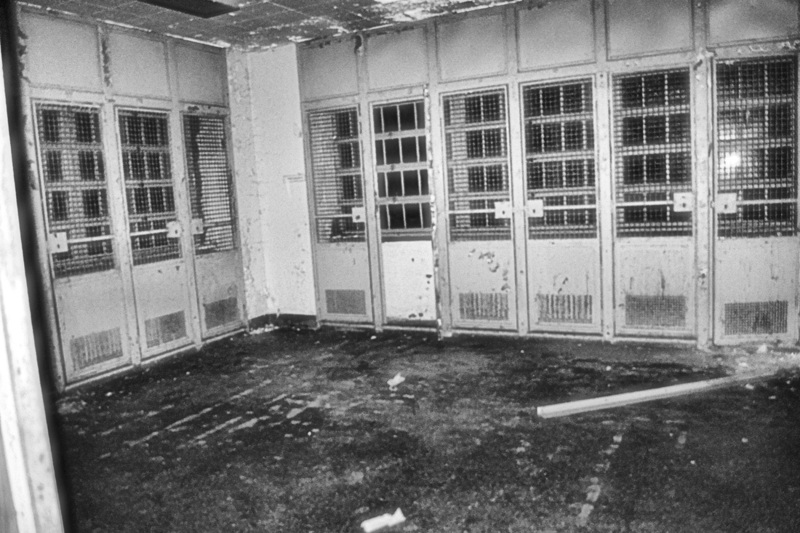 These were the last active buildings to be used before the hospital closed in 1996. 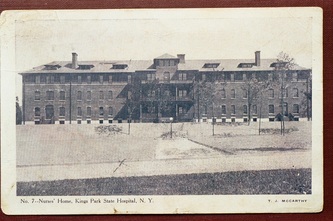 Building 7 was the last medical and surgical center used by the hospital. 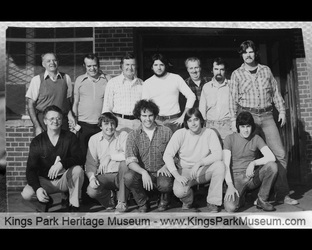 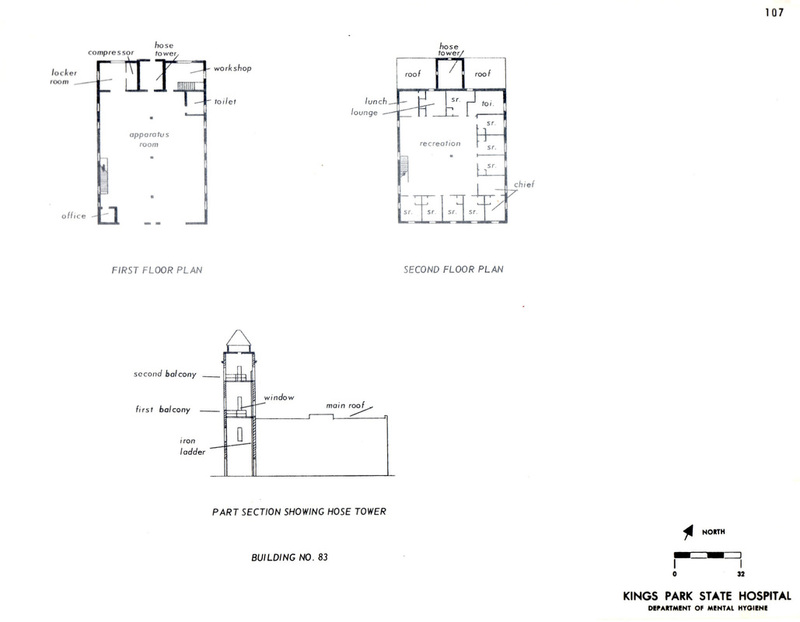 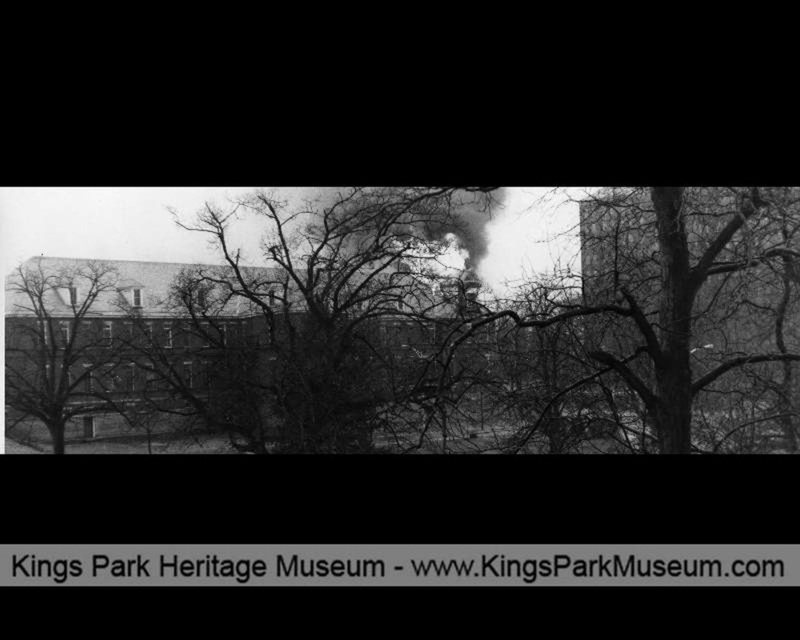 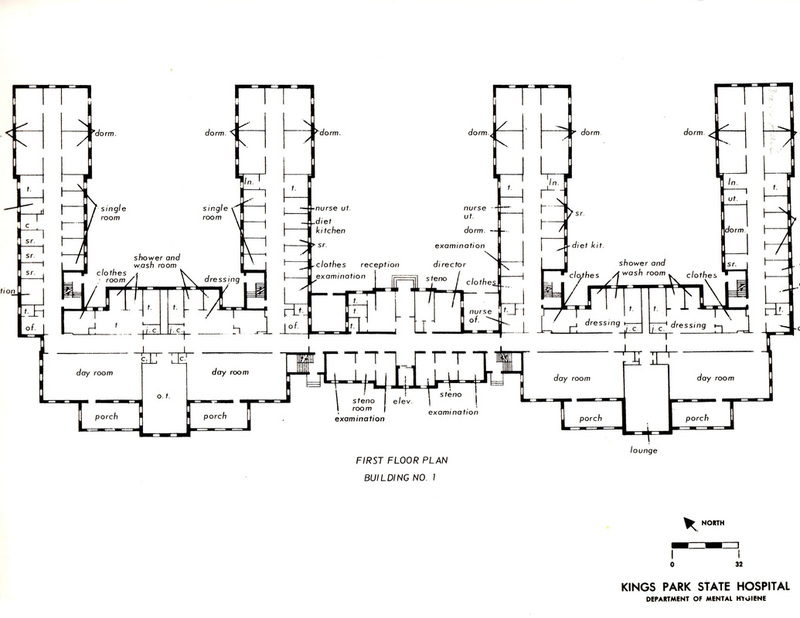 It was one of the 2 tallest buildings at Kings Park, the other being Building 93. 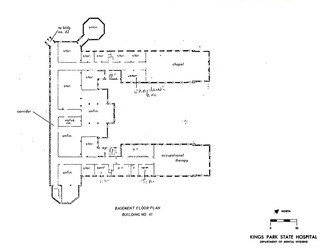 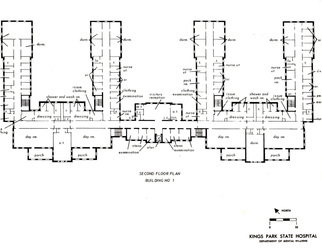 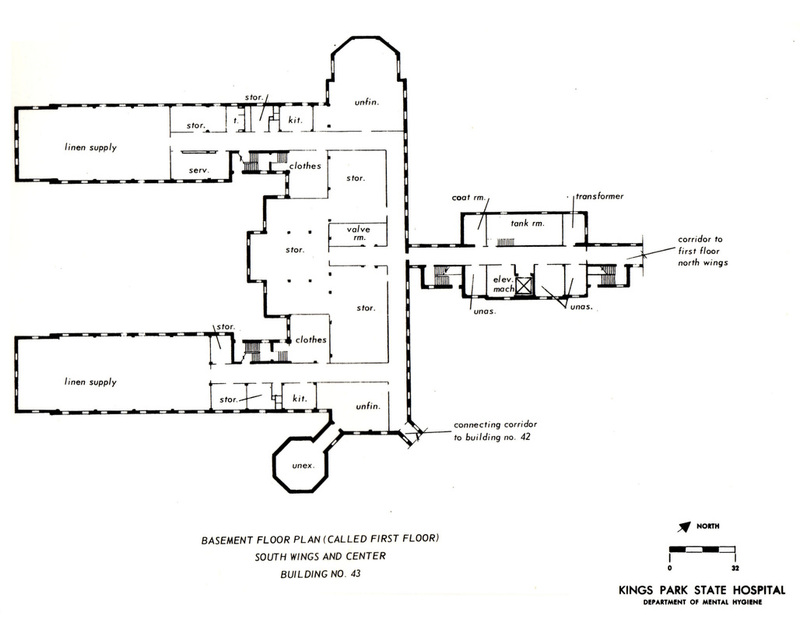 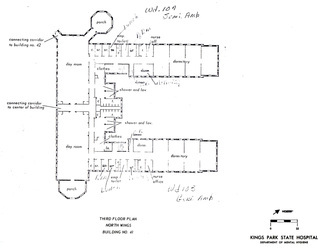 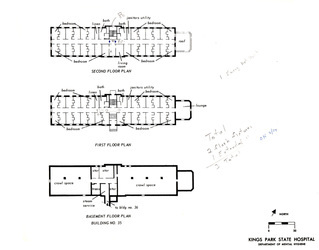 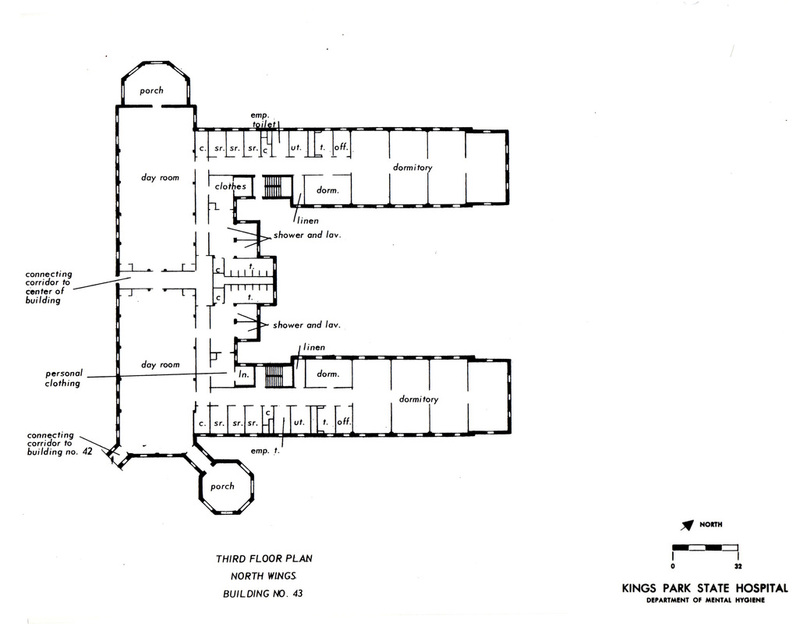 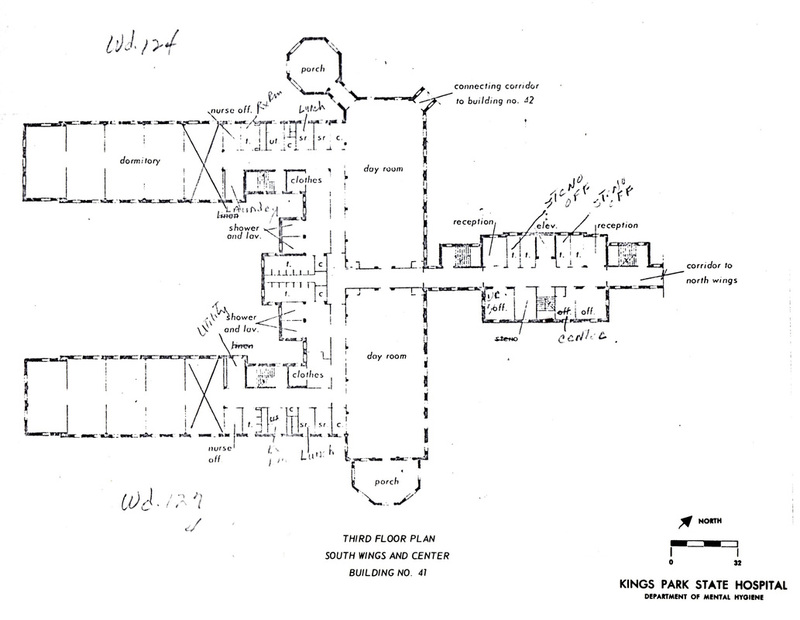 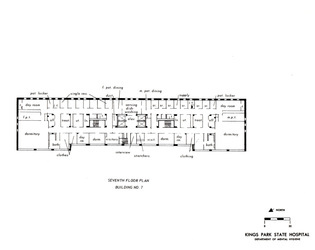 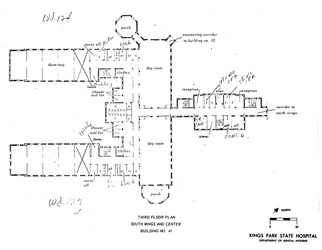 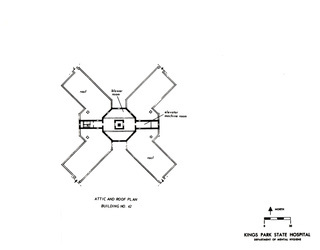 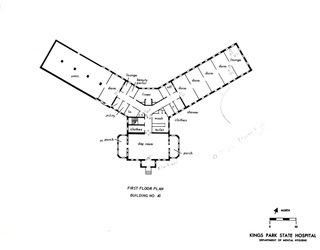 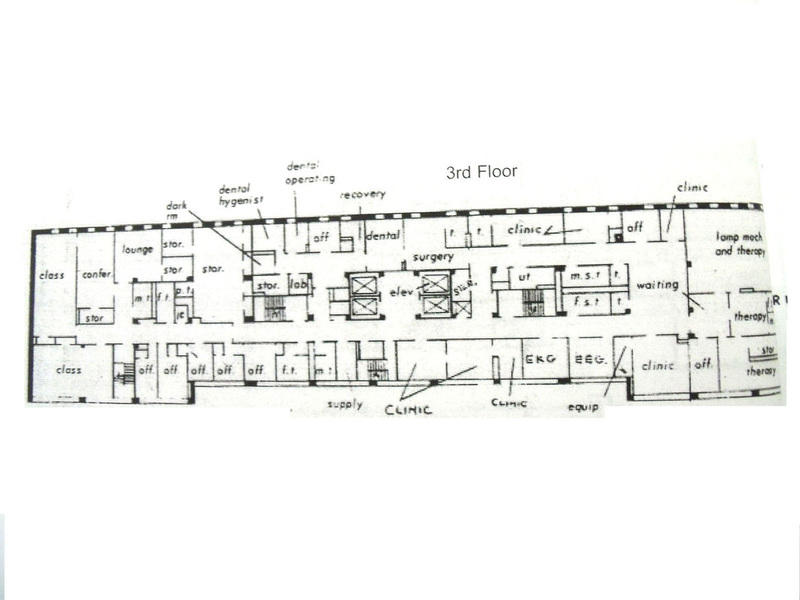 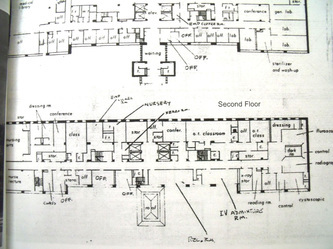 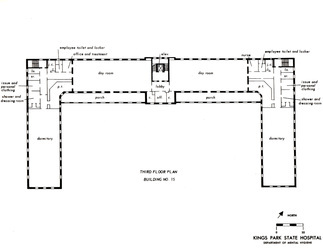 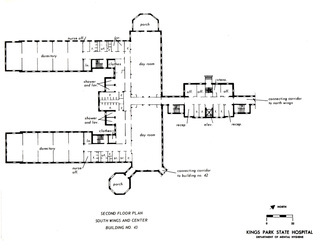 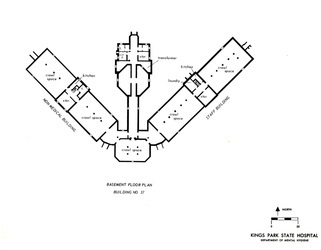 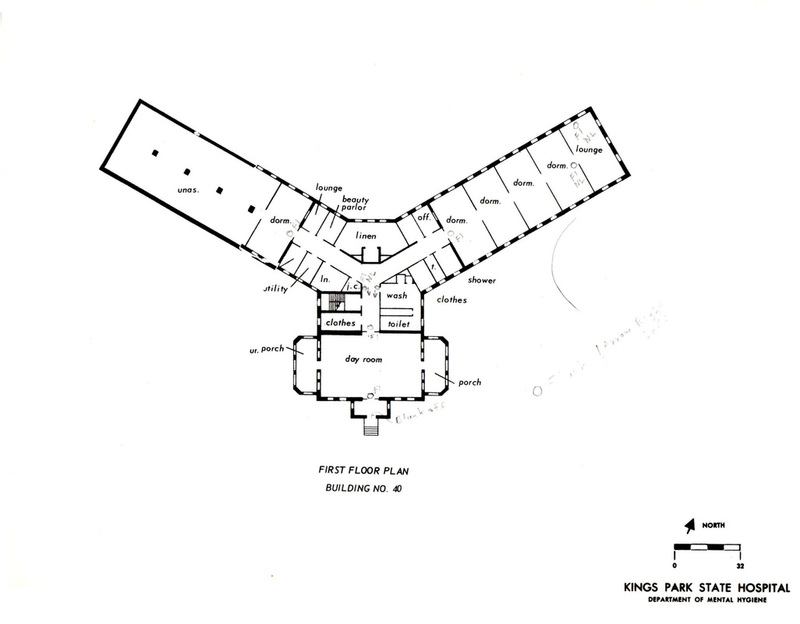 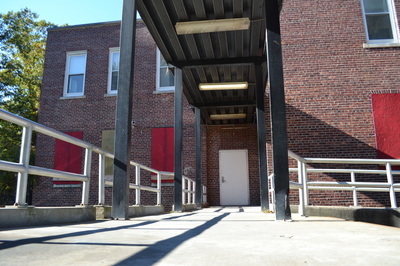 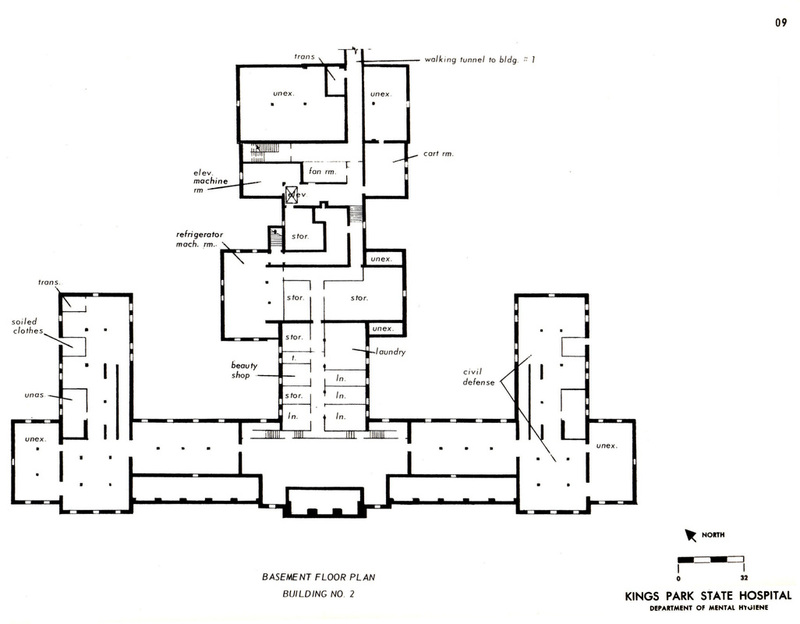 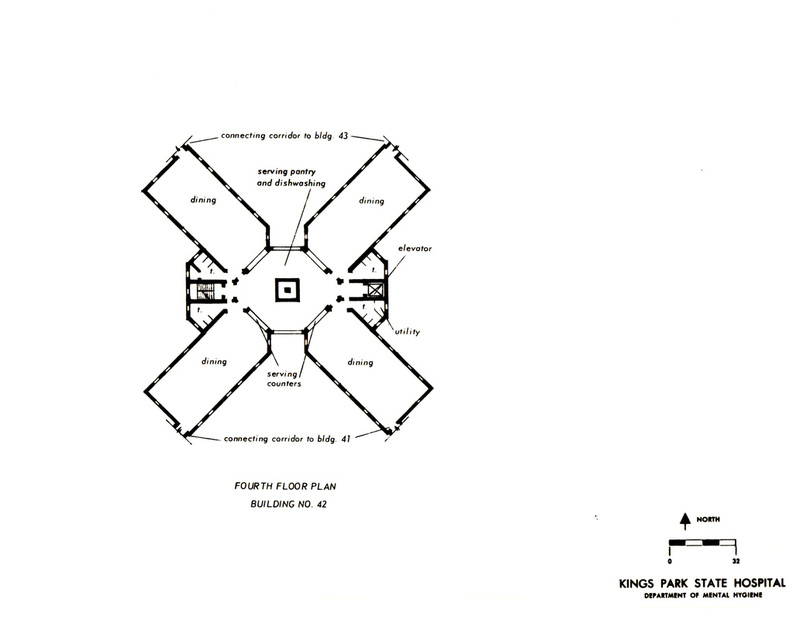 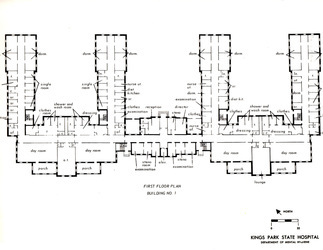 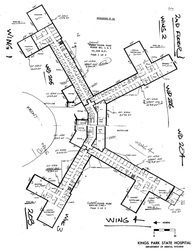 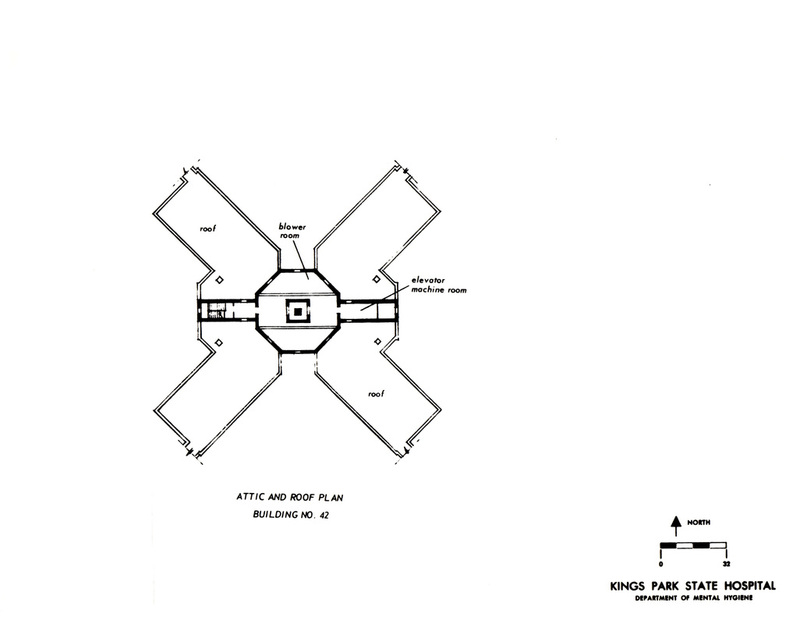 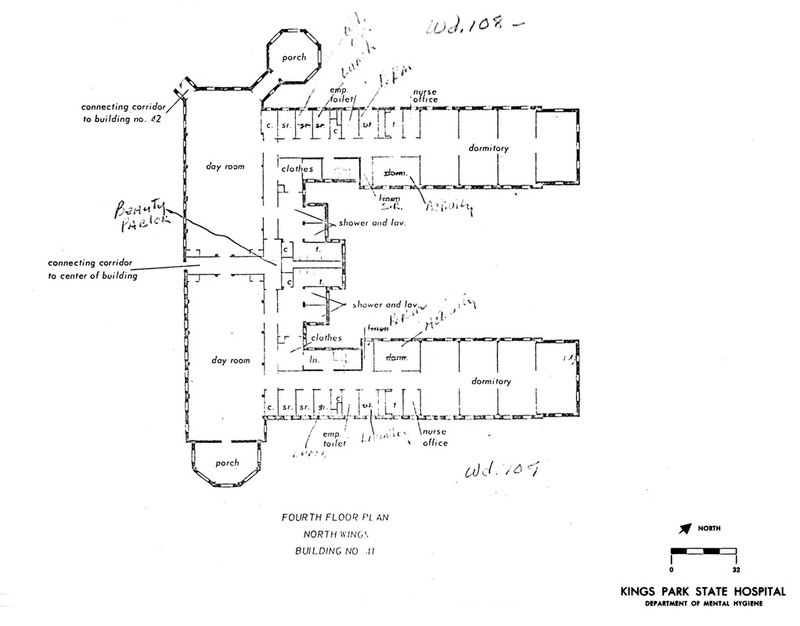 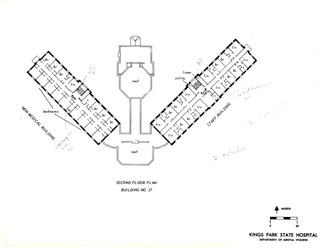 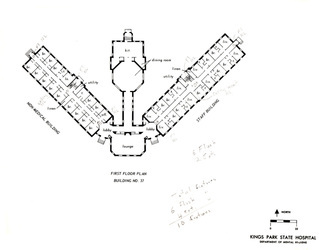 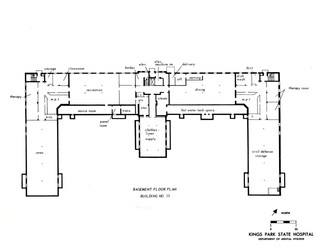 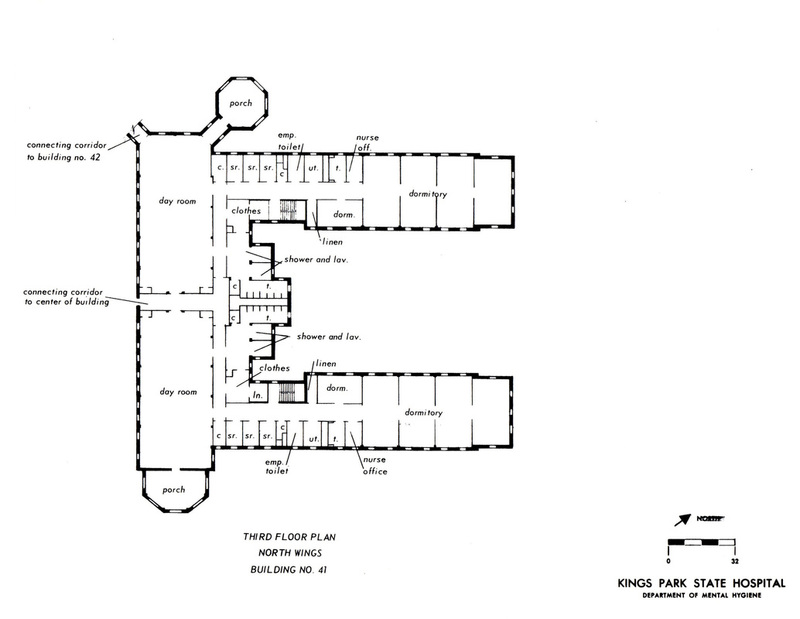 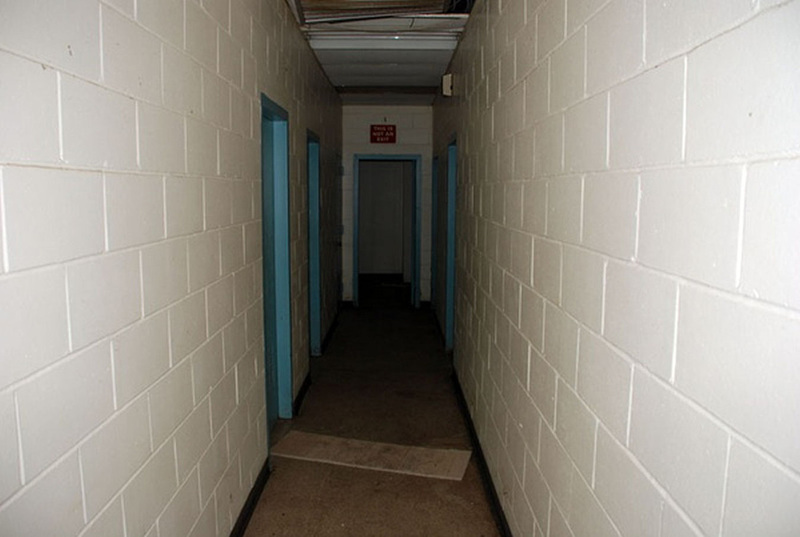 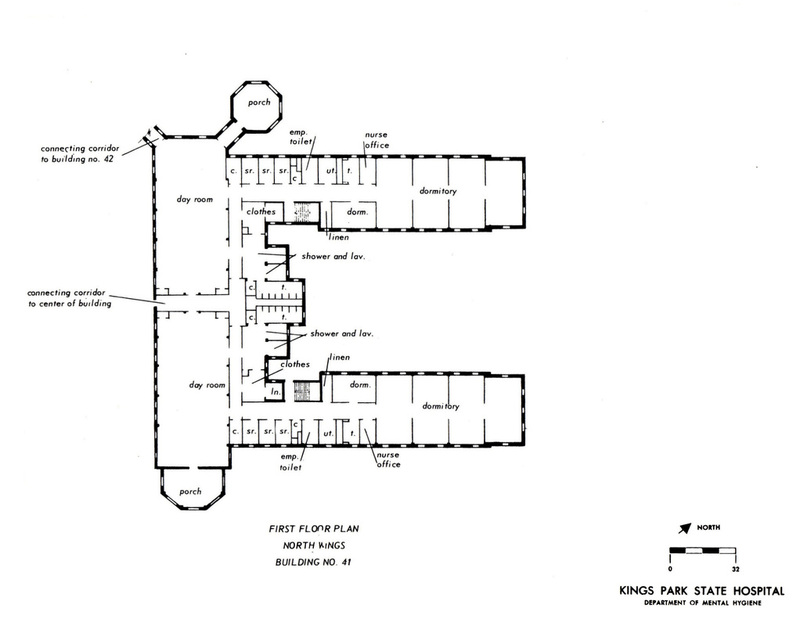 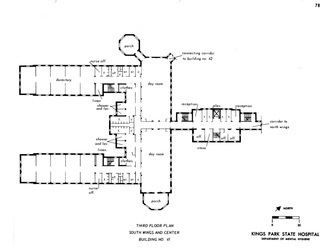 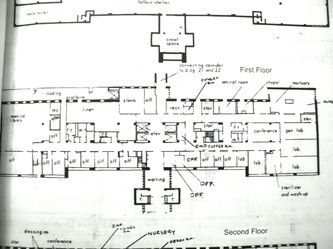 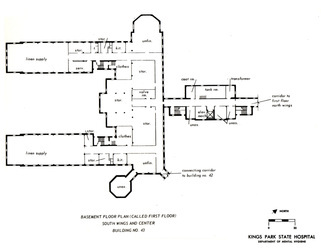 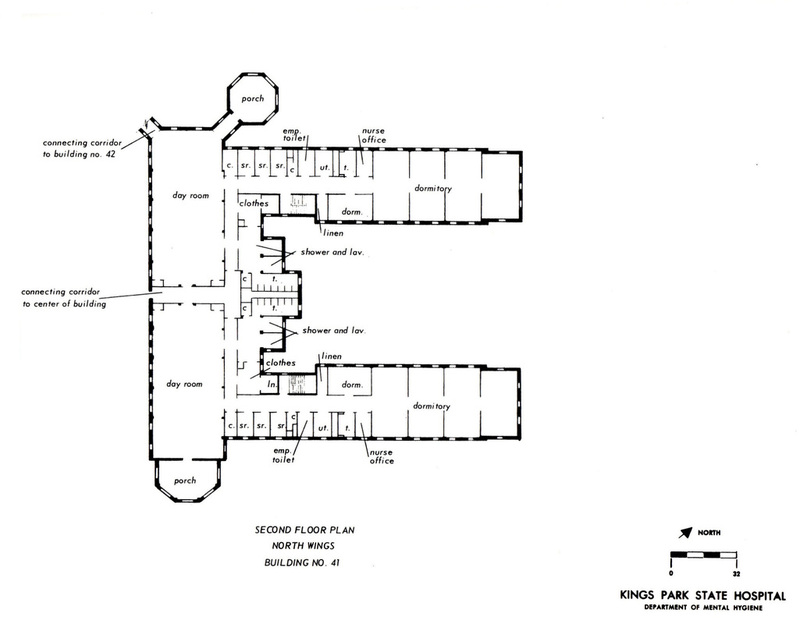 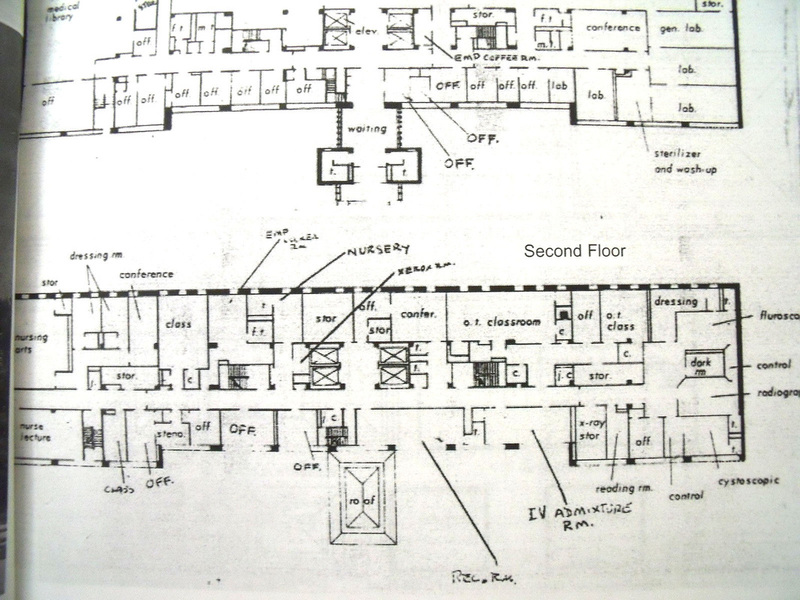 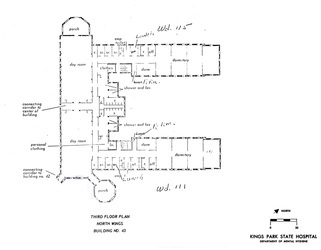 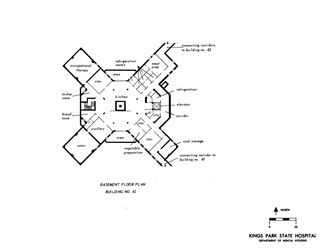 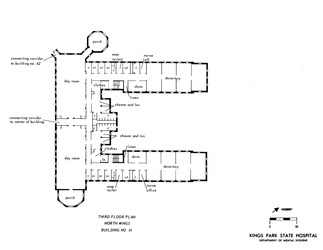 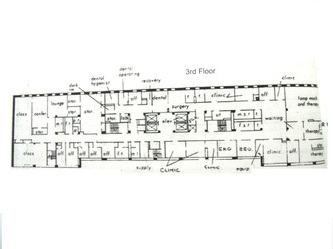 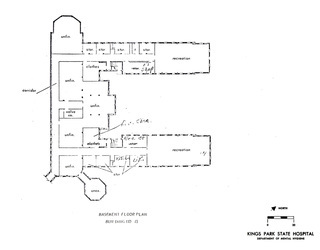 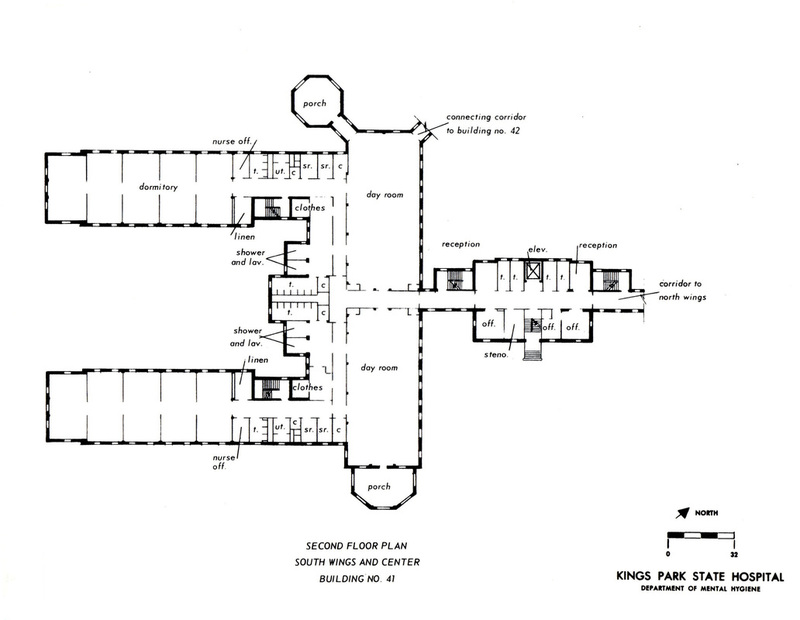 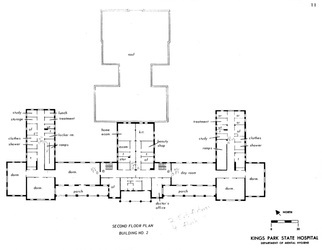 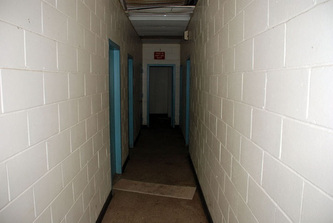 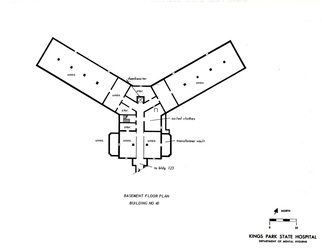 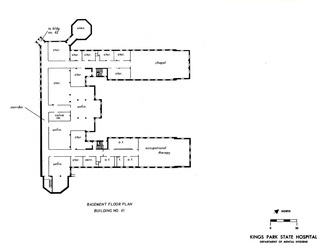 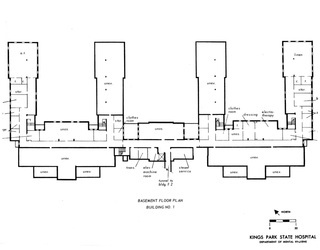 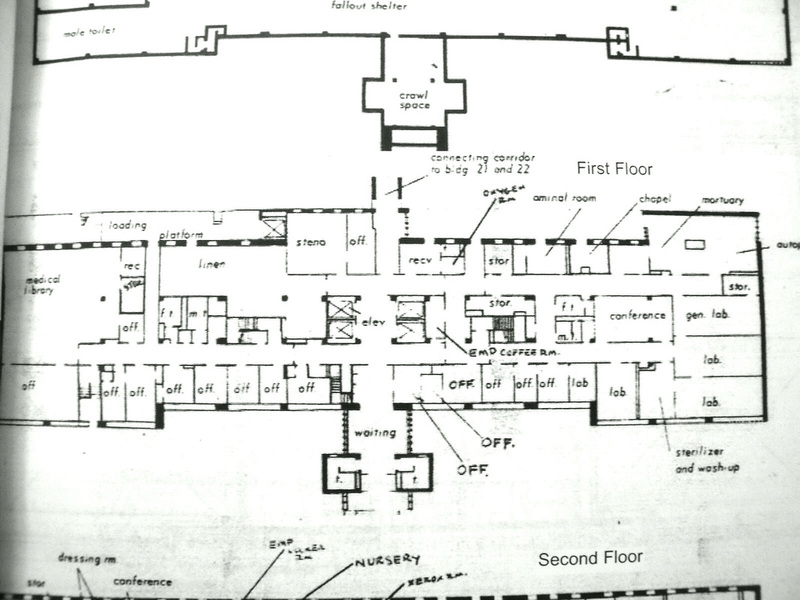 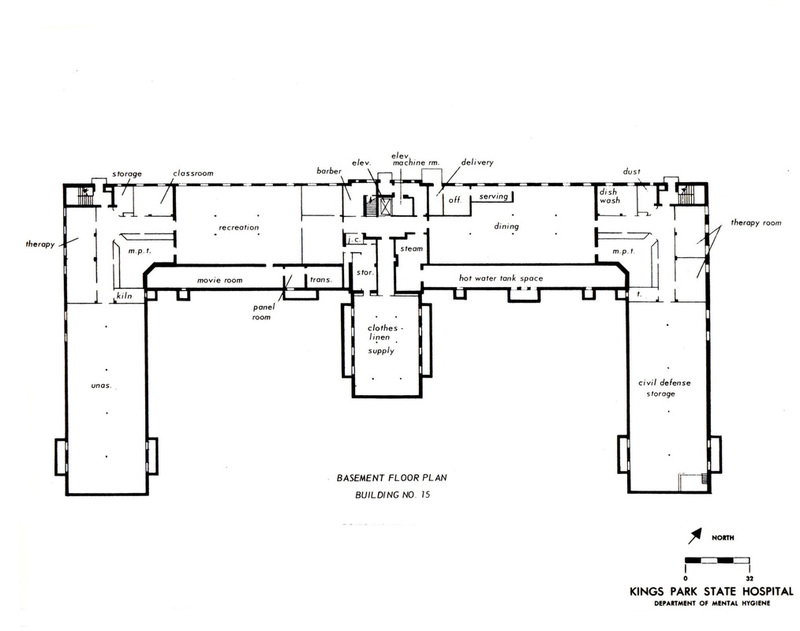 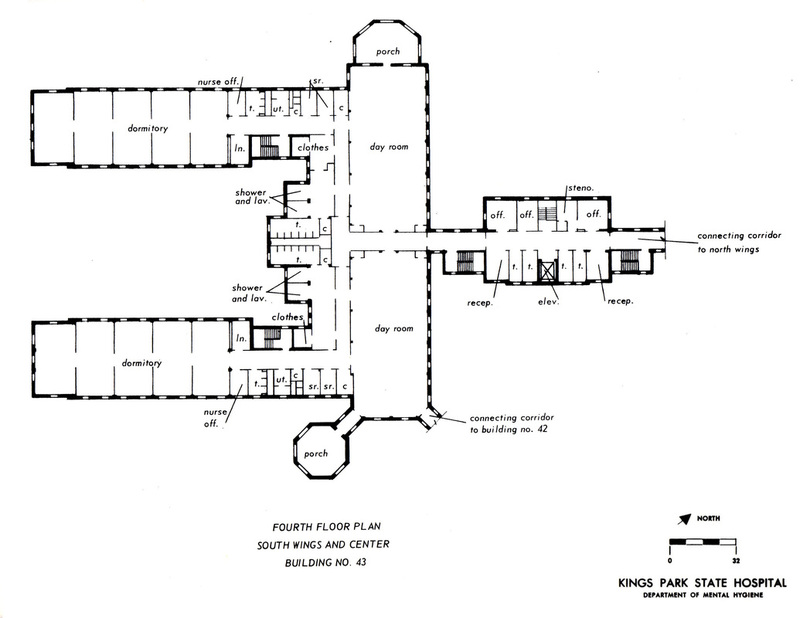 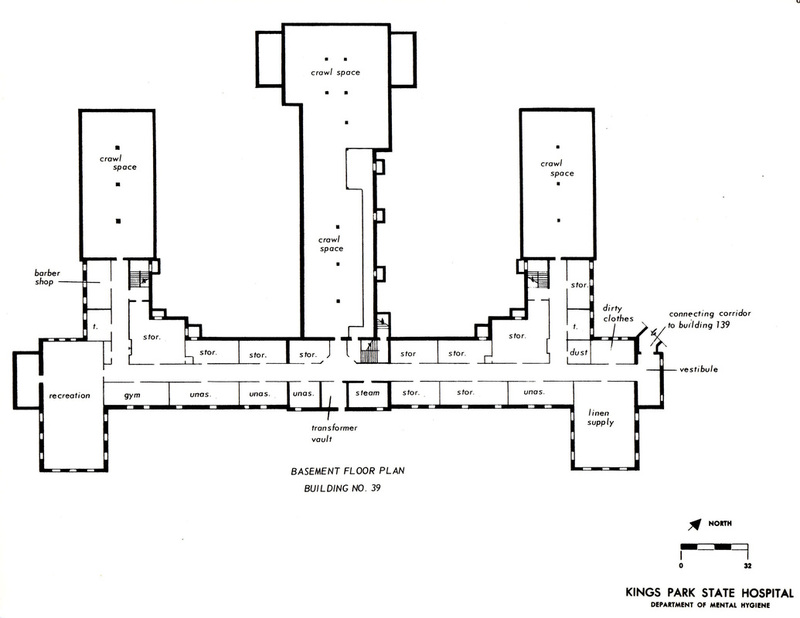 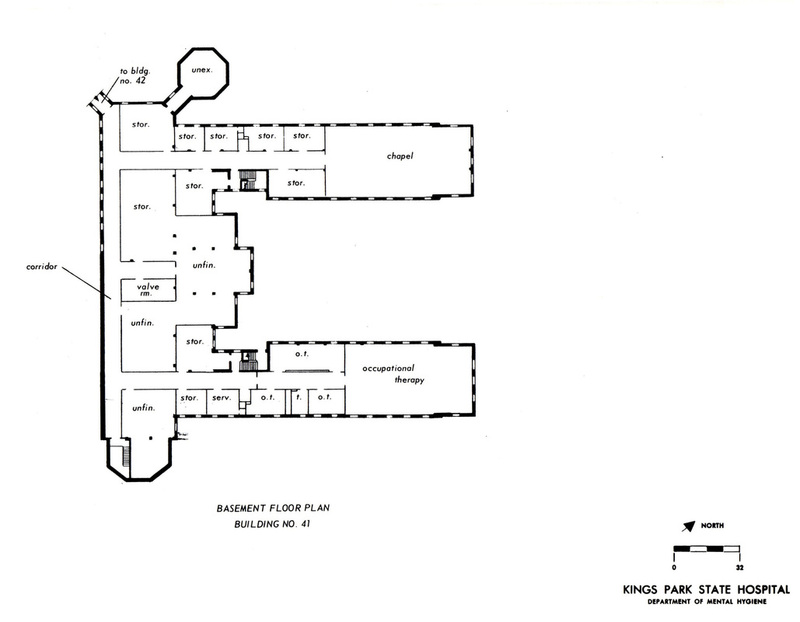 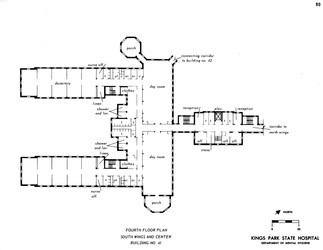 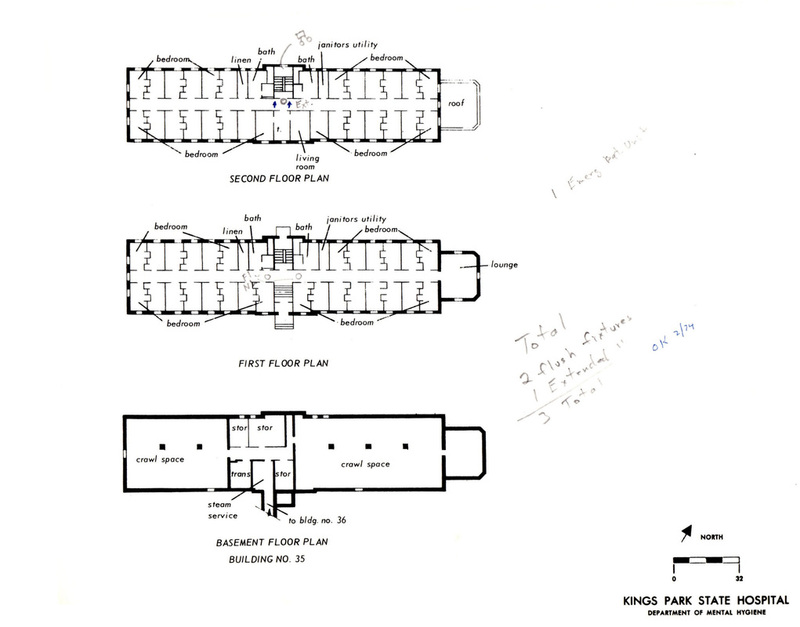 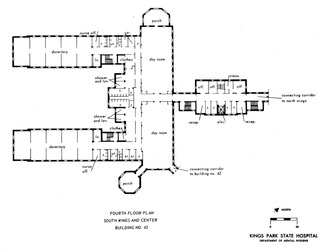 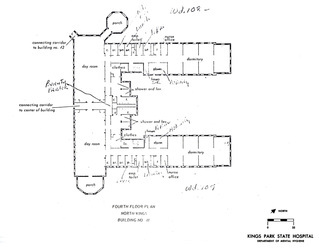 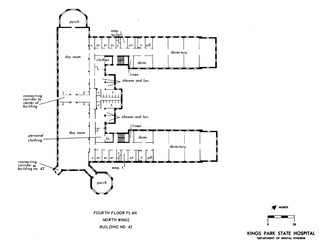 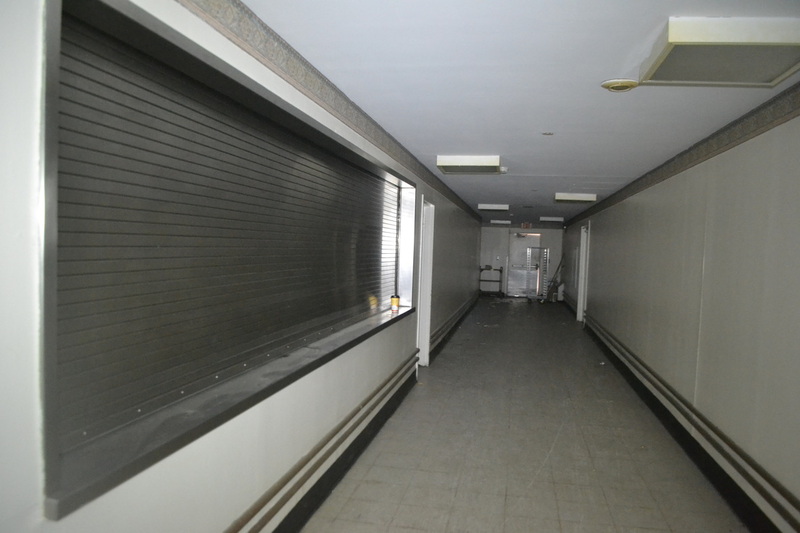 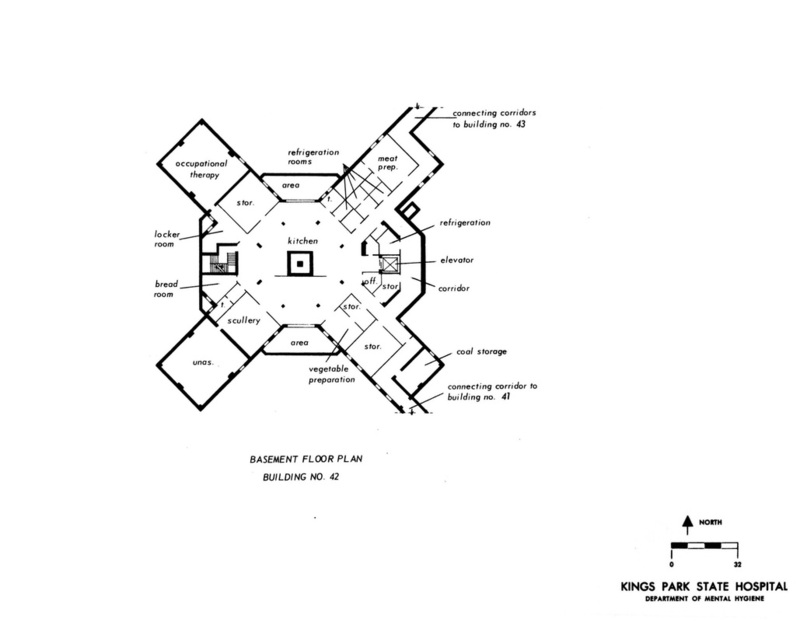 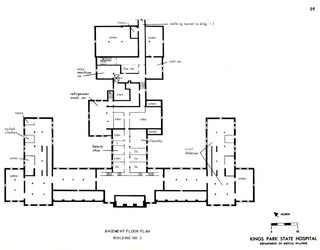 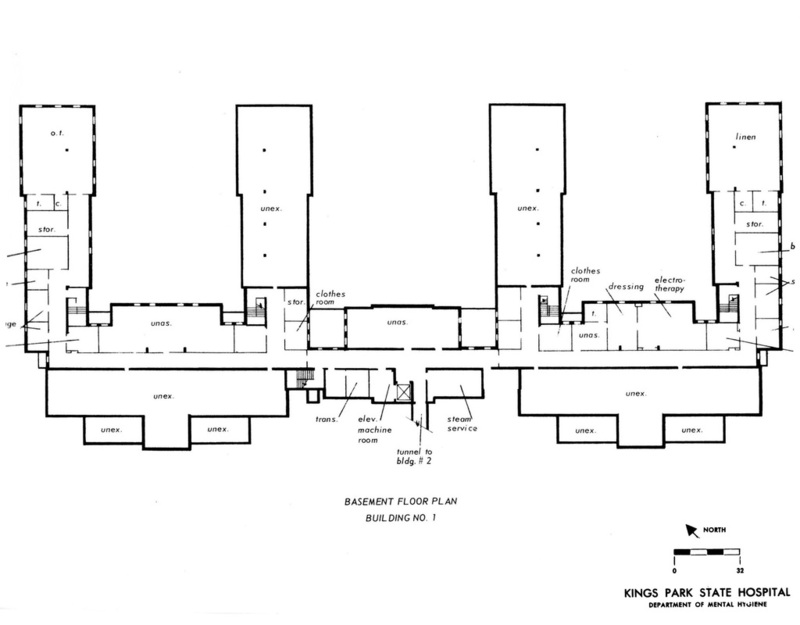 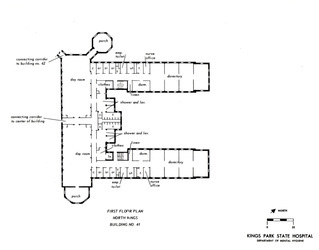 Building 7 was connected to Buildings 21 and 22 via a corridor known as a breezeway located on the ground floor. 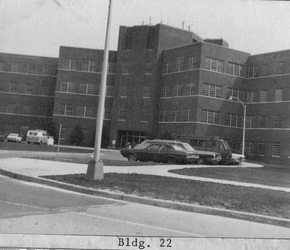 Buildings 21 and 22 were 4-story patient ward buildings. 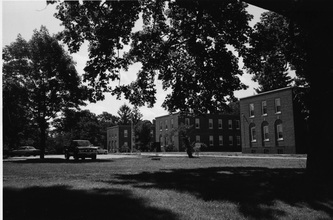 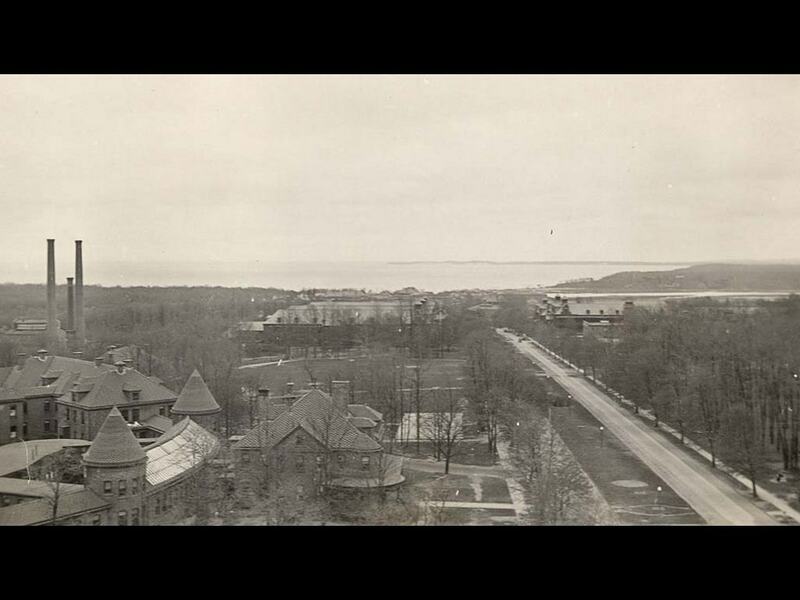 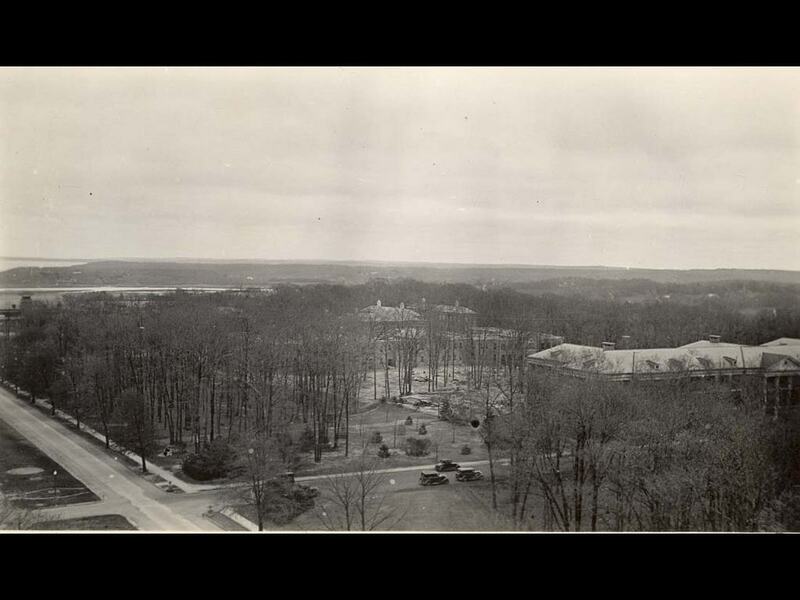 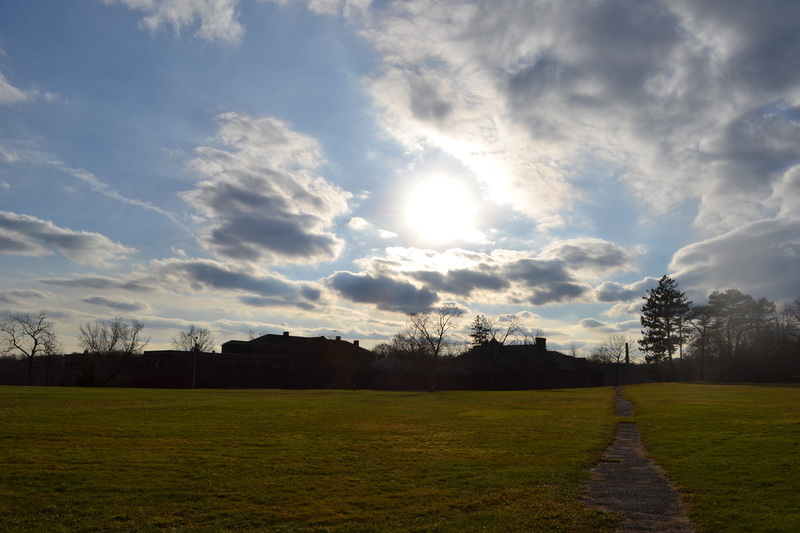 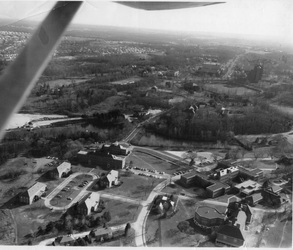 Across from these buildings was the recreation center known as Buckman Hall, or Building 23. 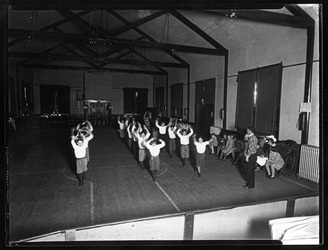 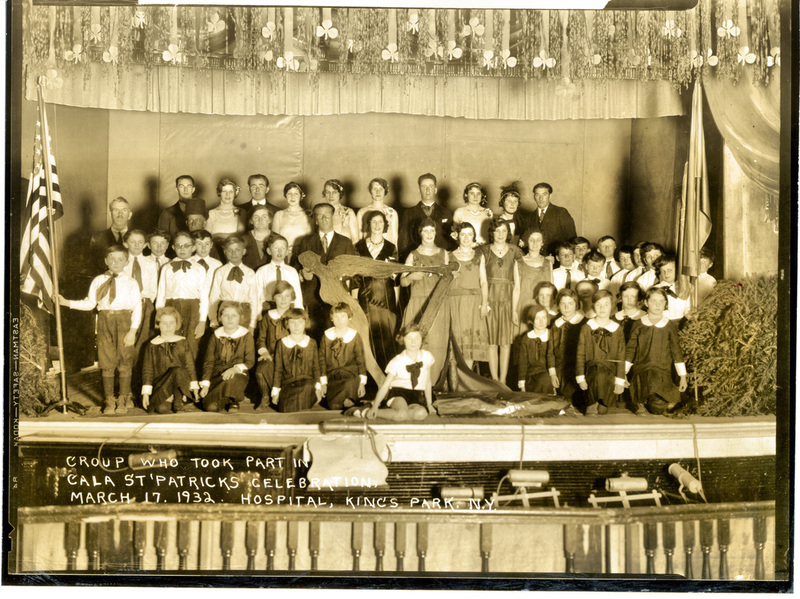 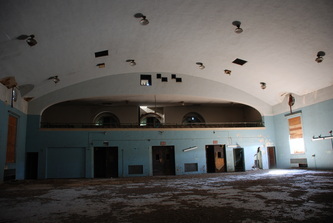 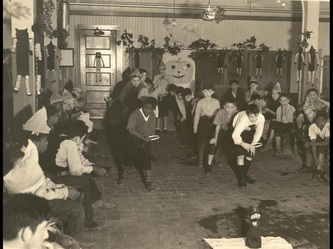 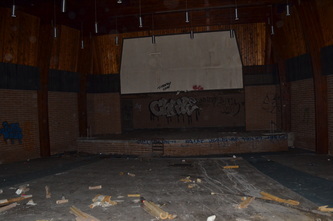 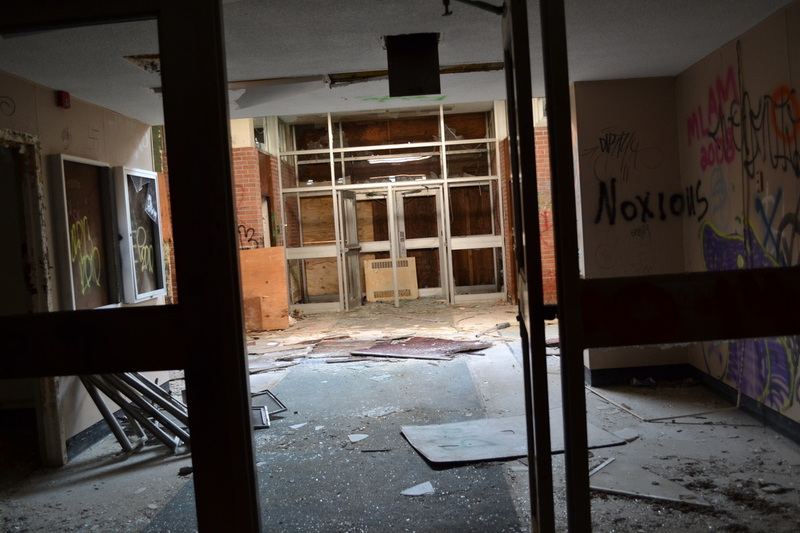 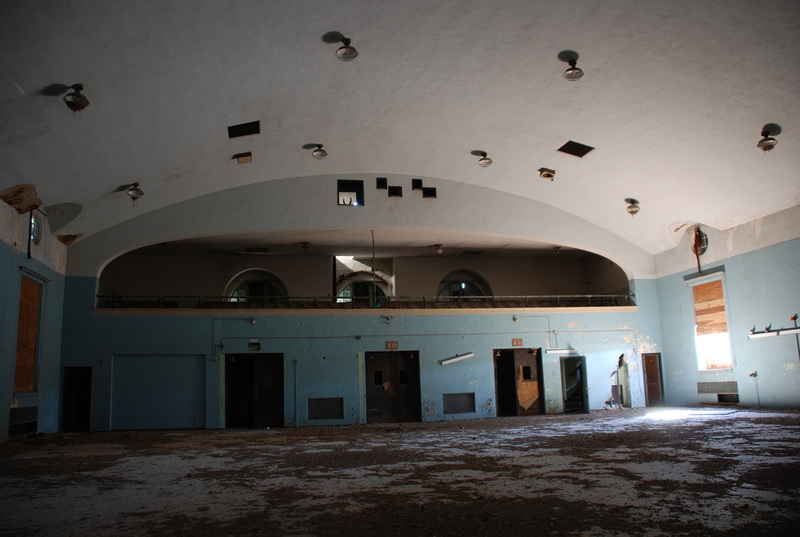 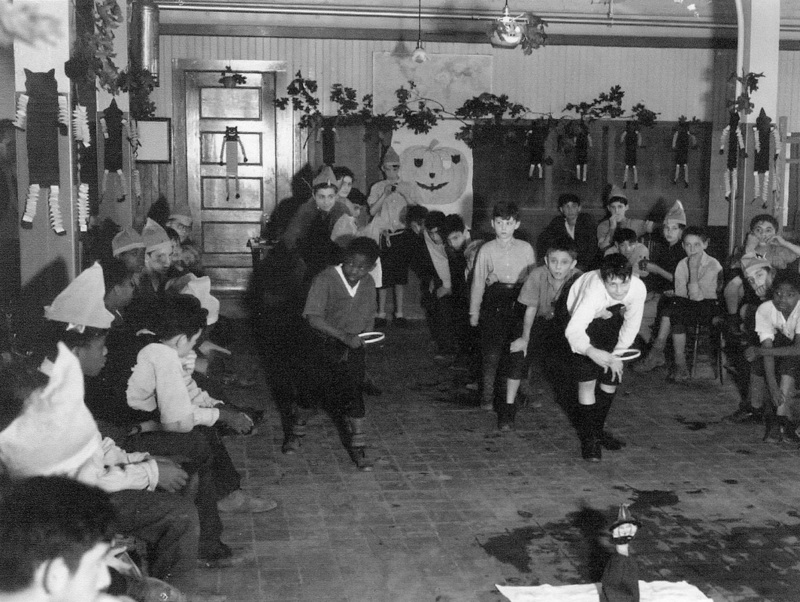 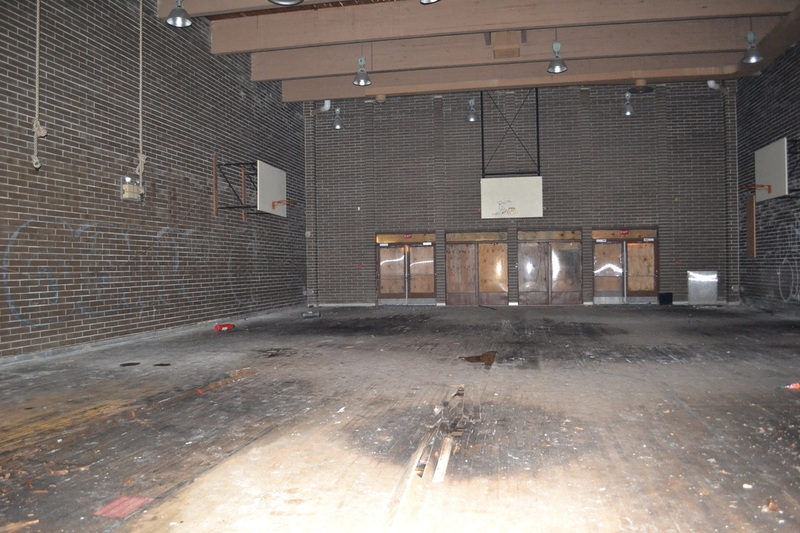 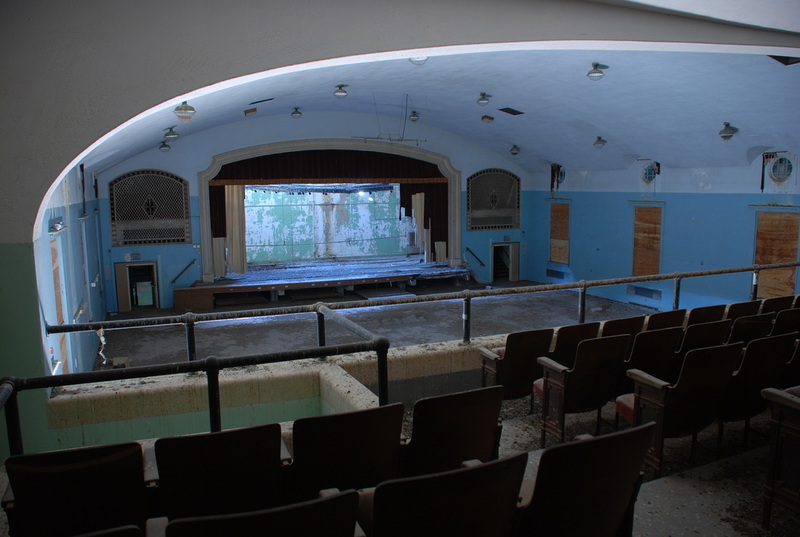 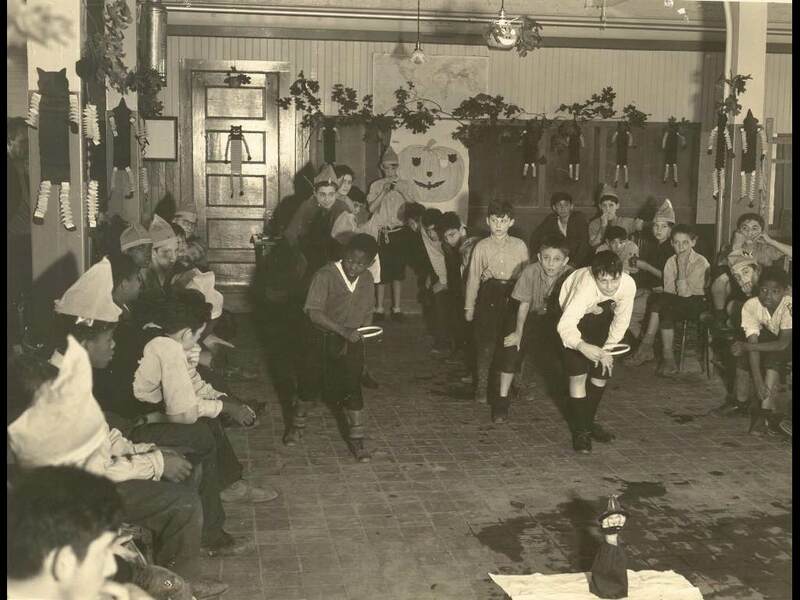 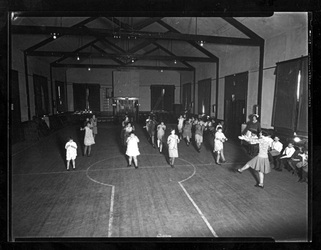 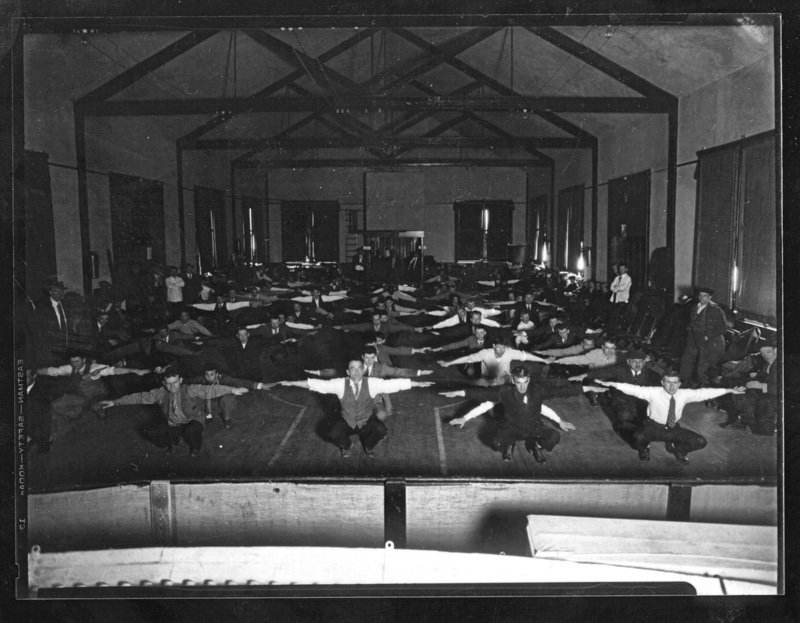 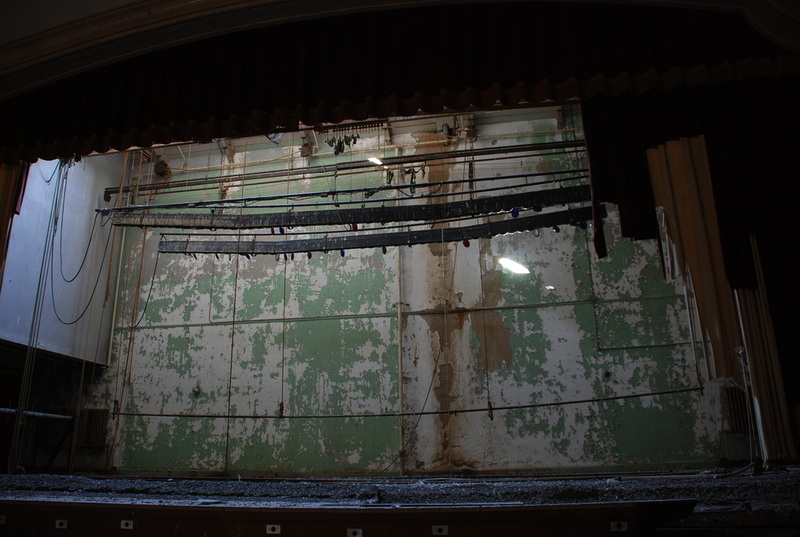 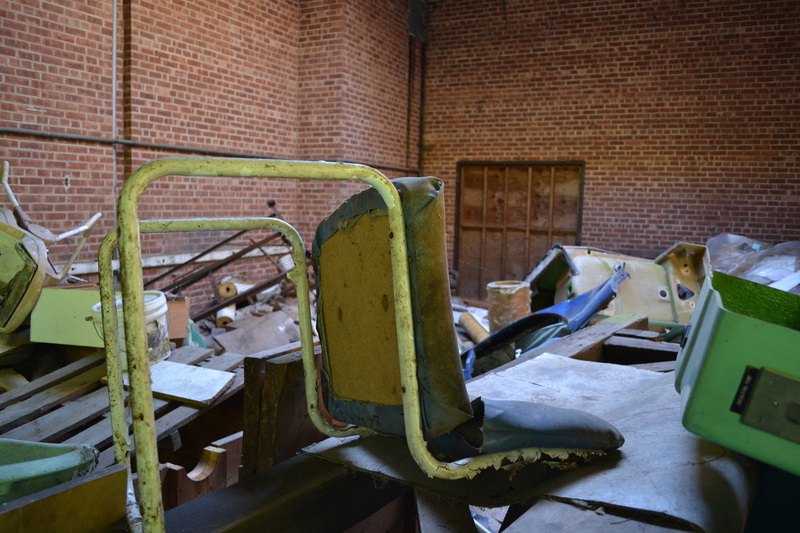 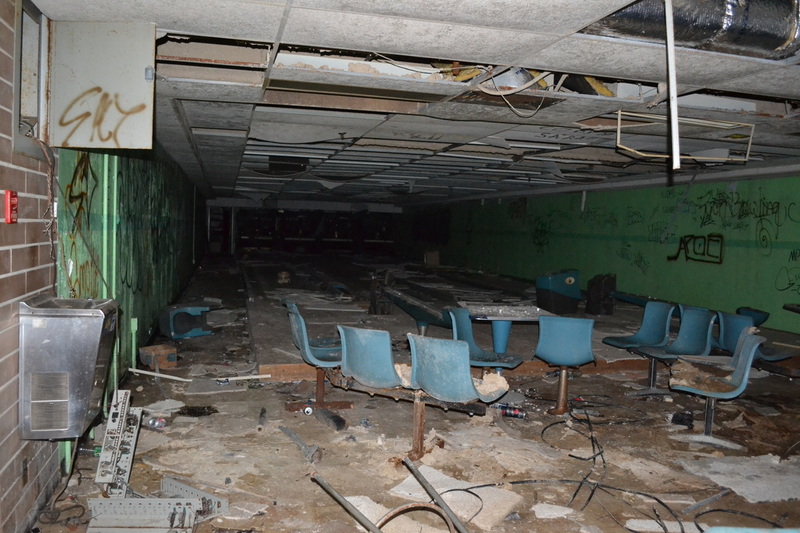 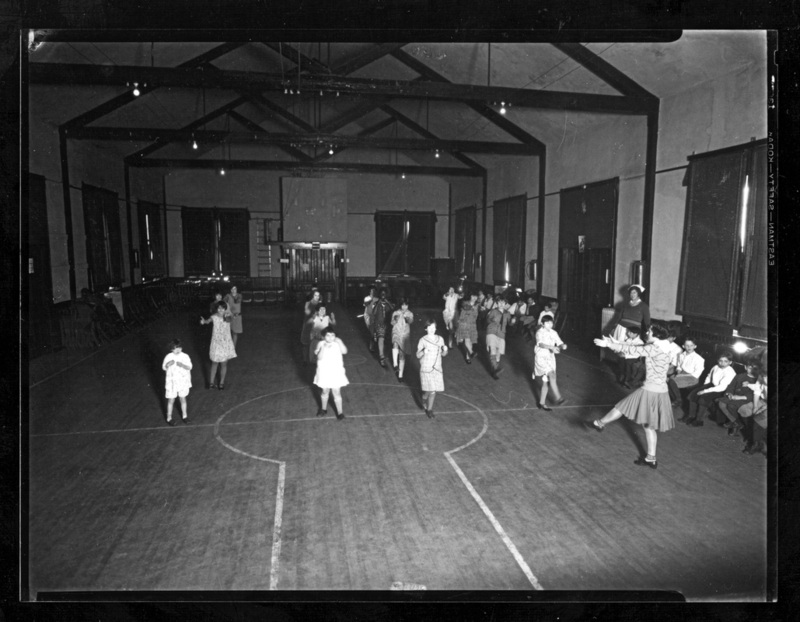 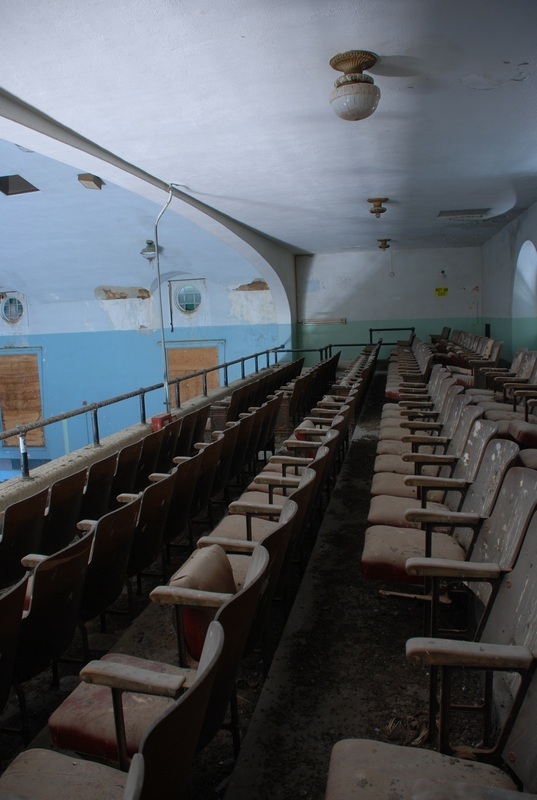 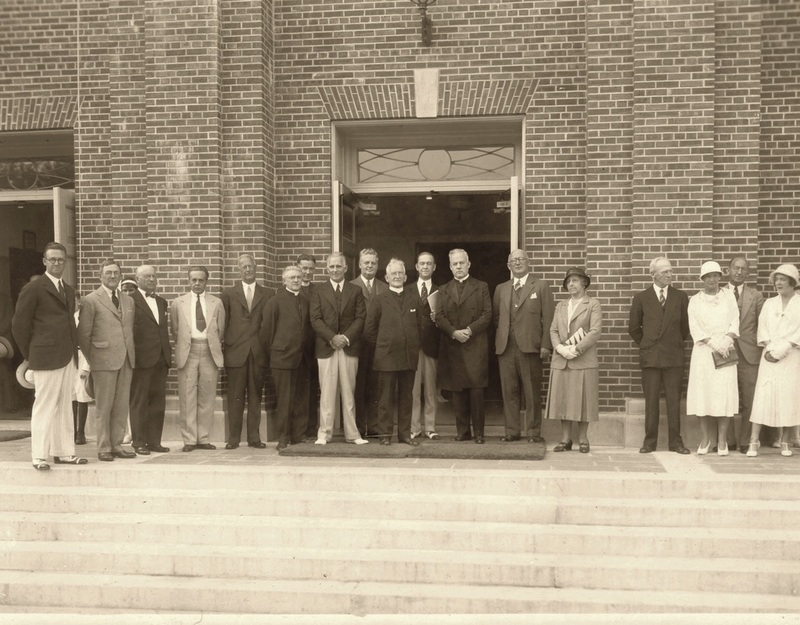 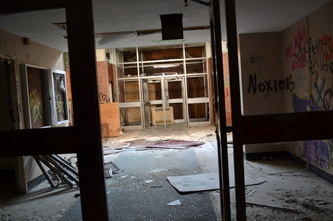 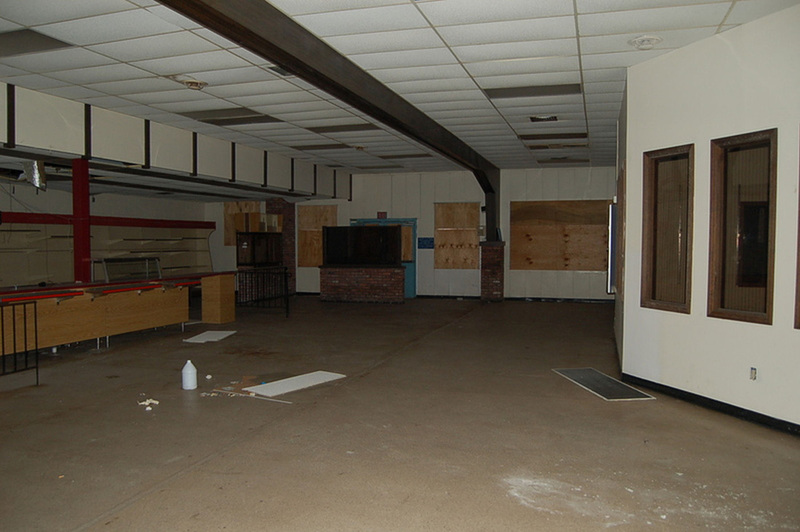 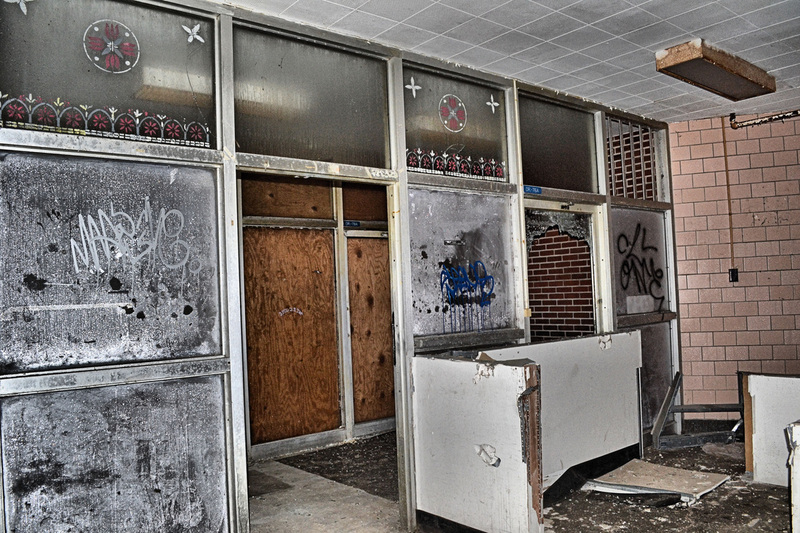 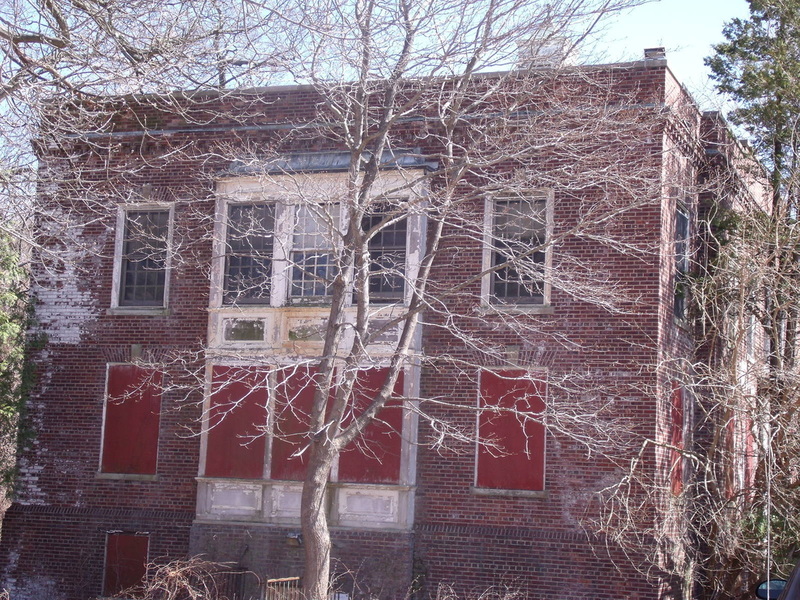 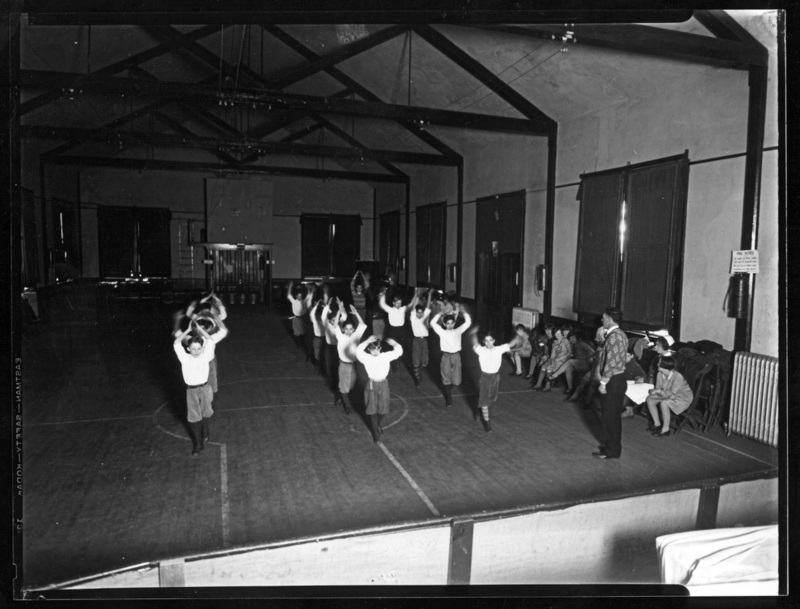 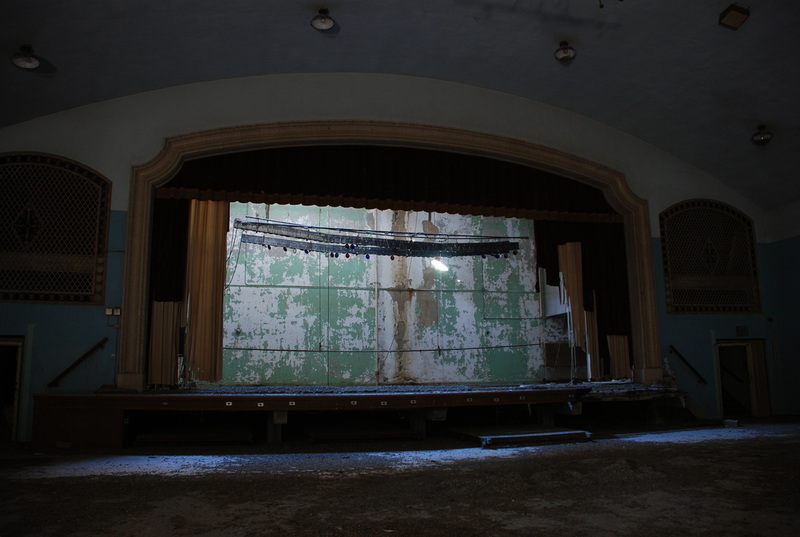 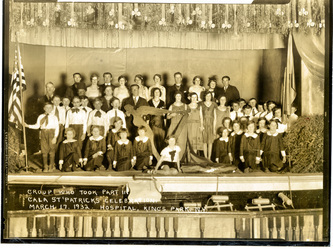 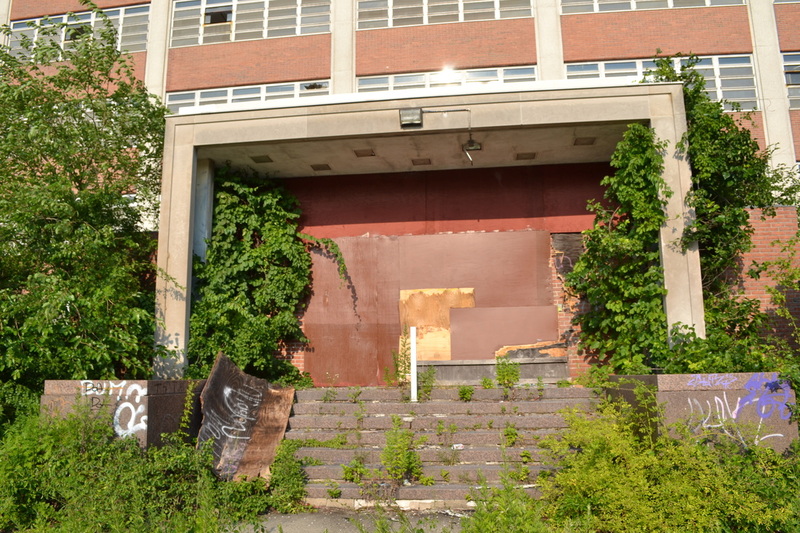 At this building patients and staff would pass the time reading, bowling, swimming, playing ball in the gym, or enjoying shows at the auditorium. 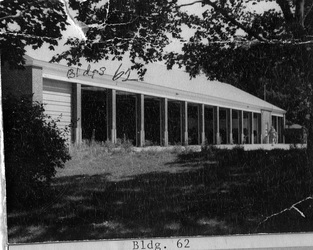 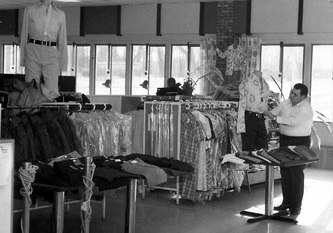 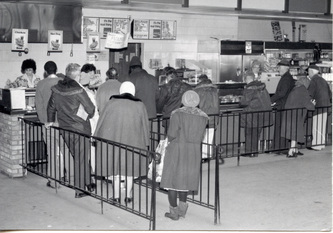 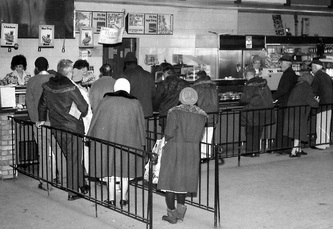 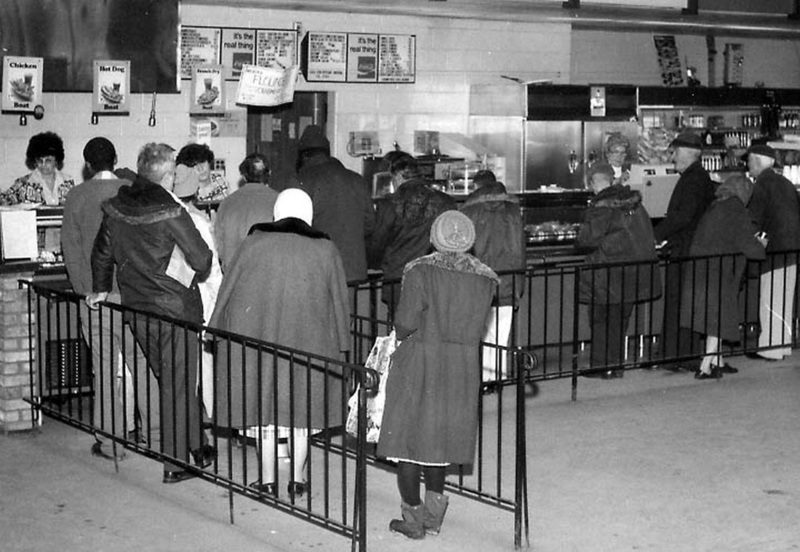 Building 56 was a cafeteria and store known as Cafe 56. 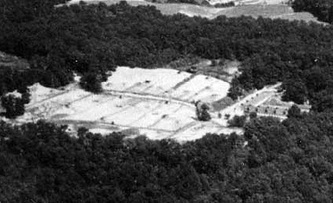 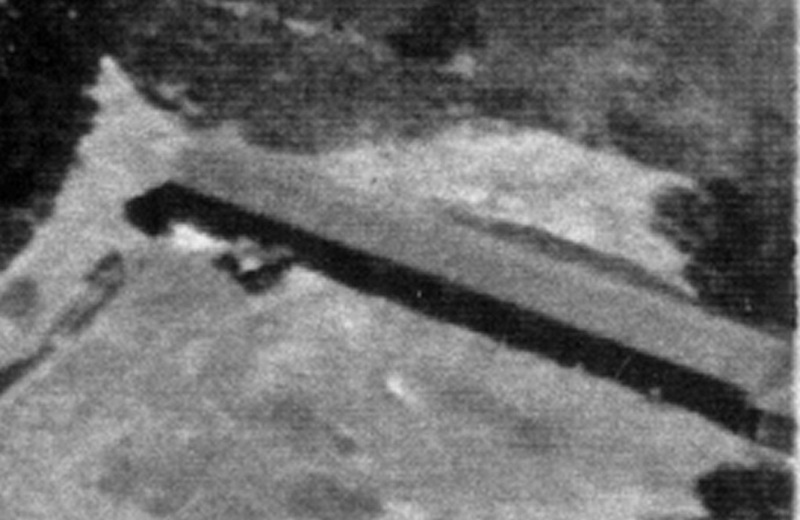 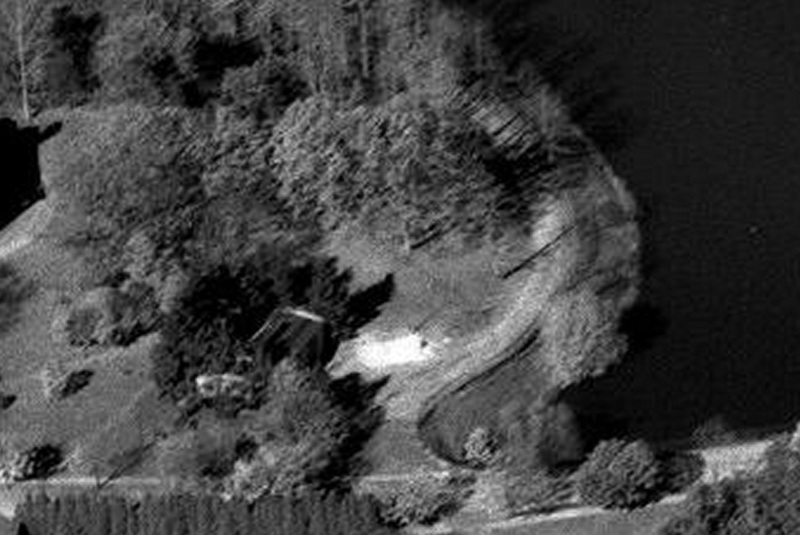 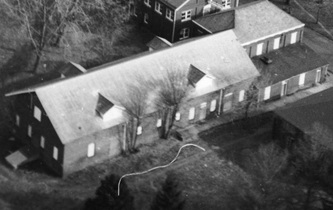 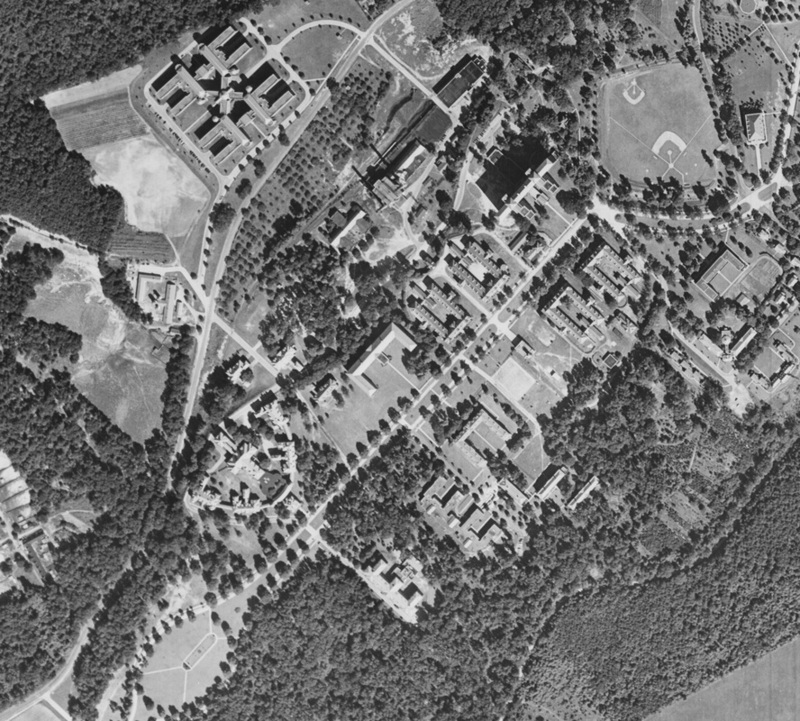 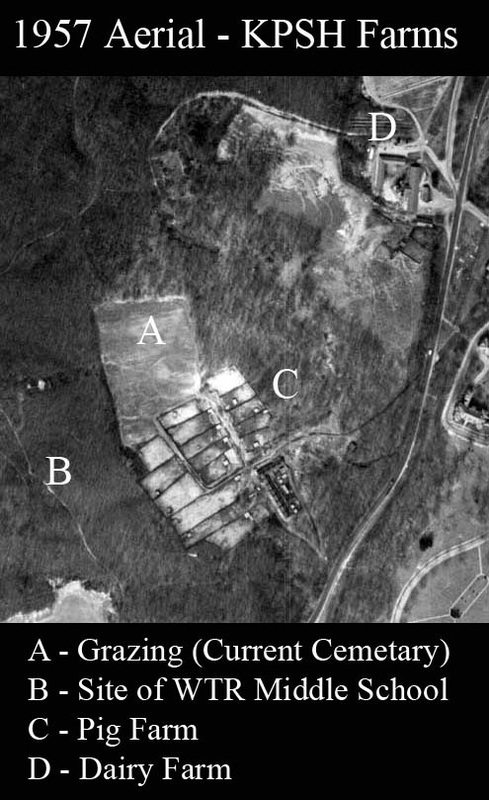 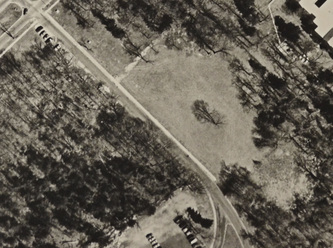 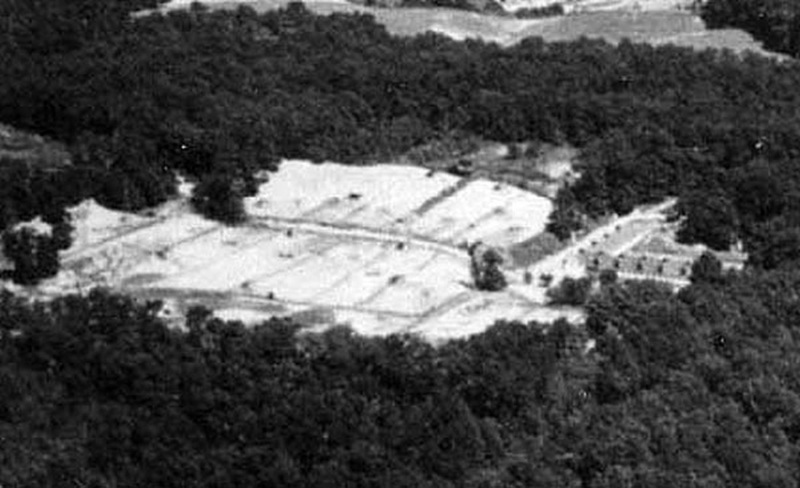 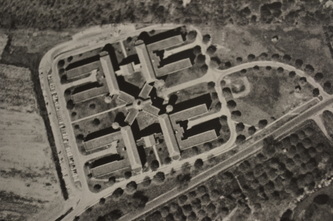 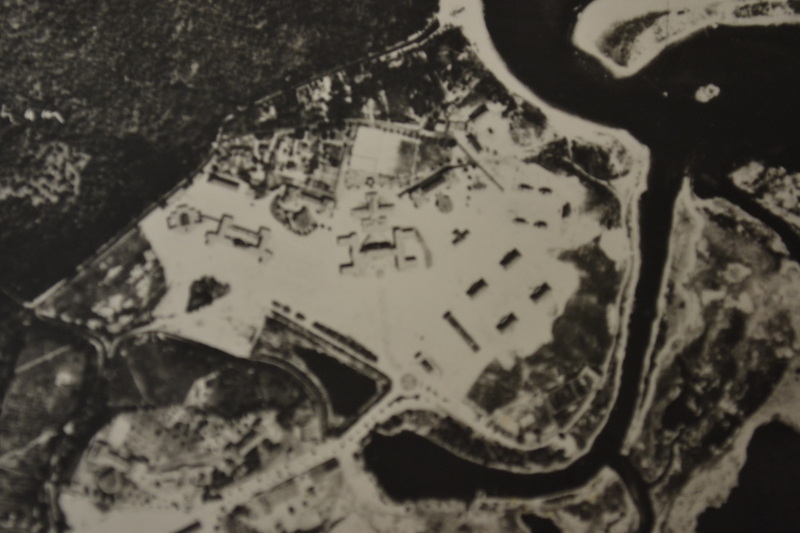 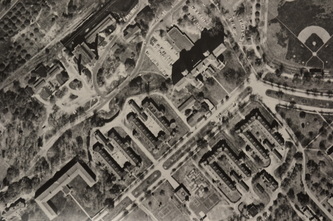 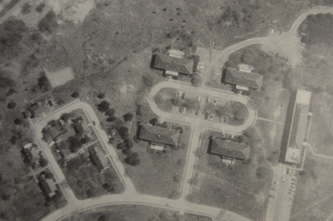 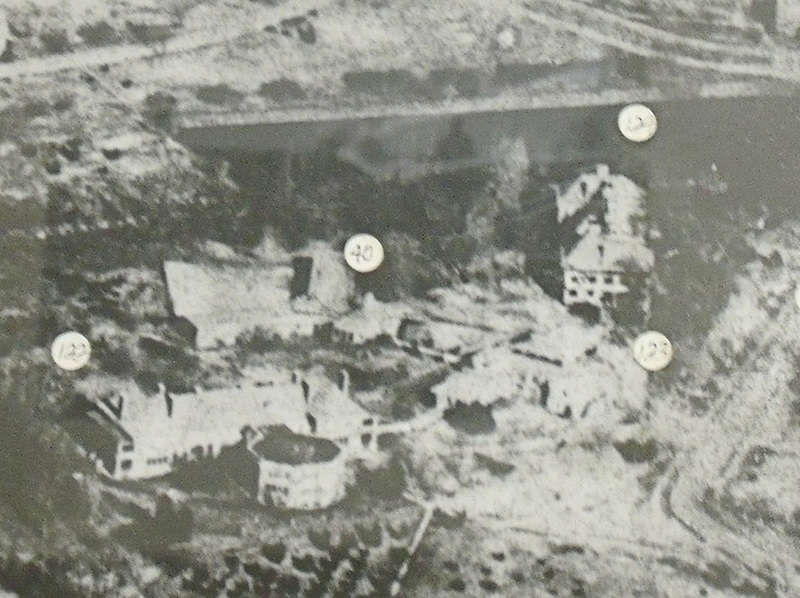 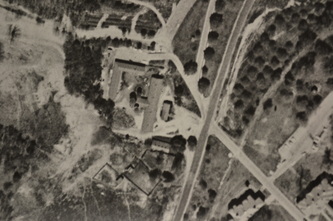 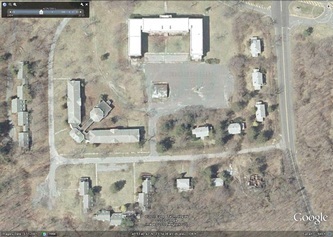 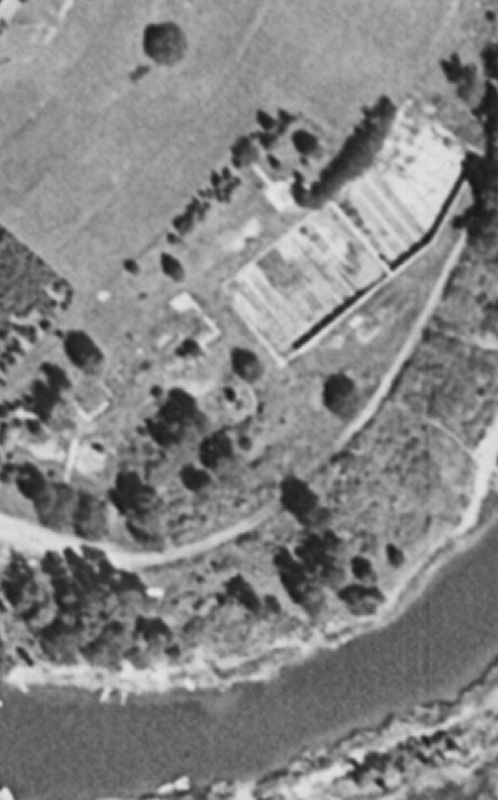 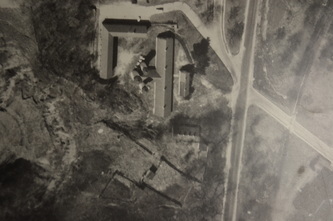 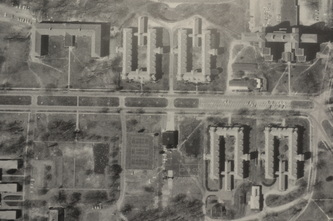 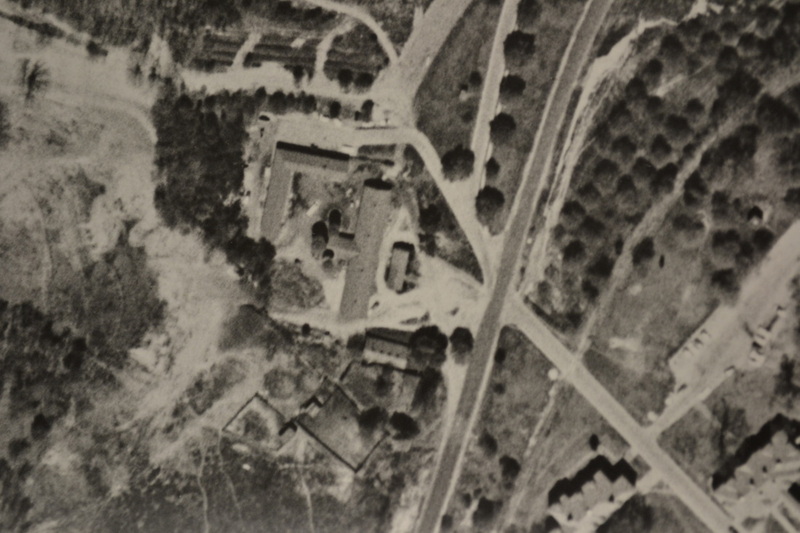 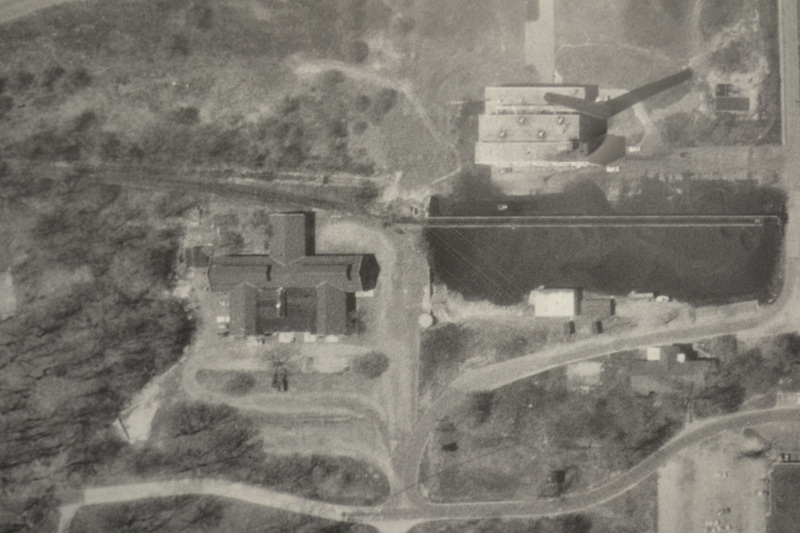 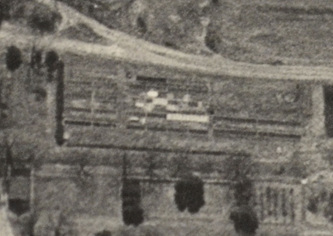 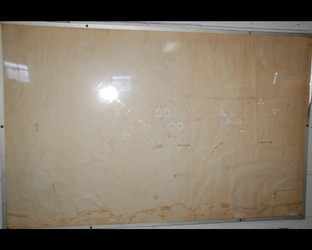 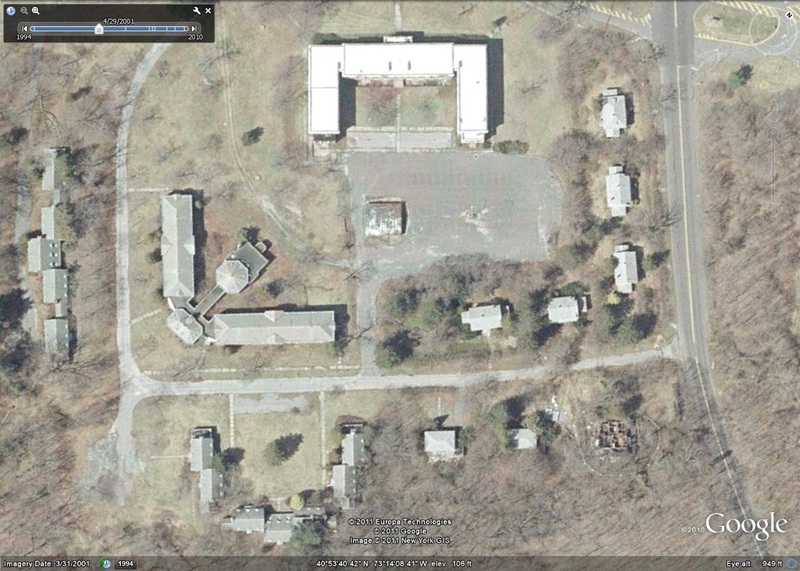 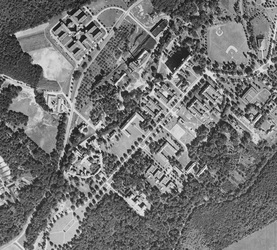 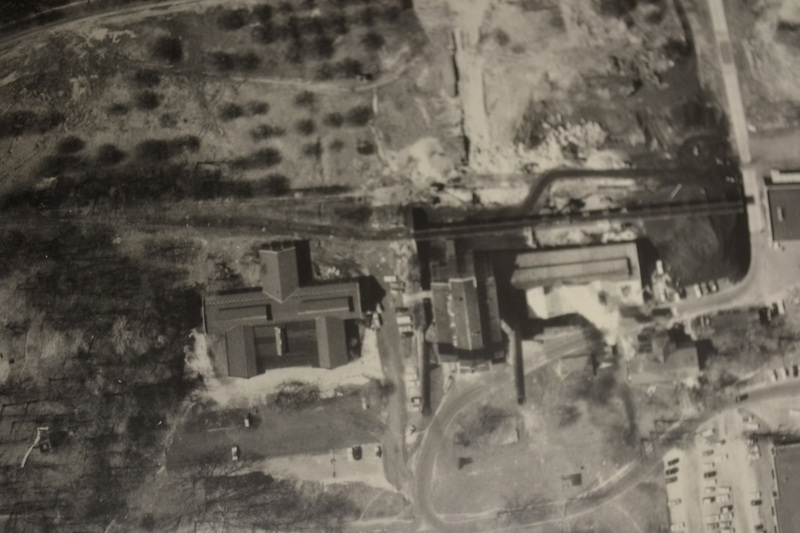 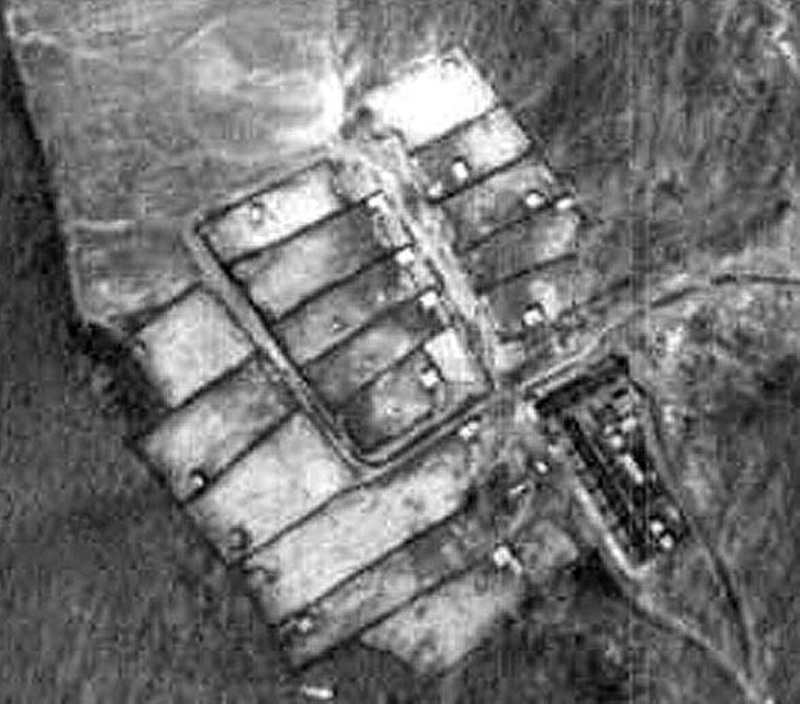 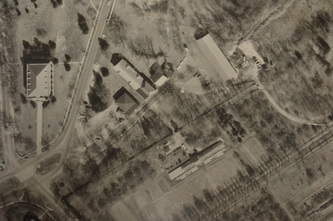 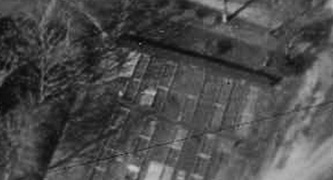 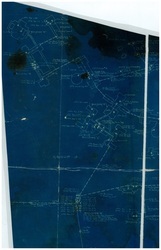 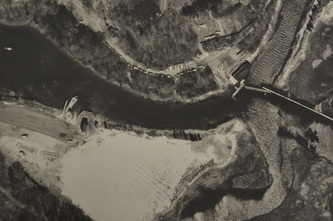 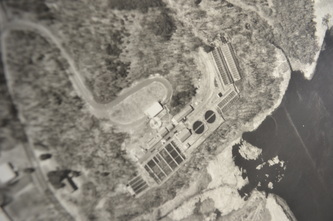 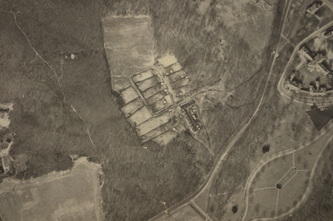 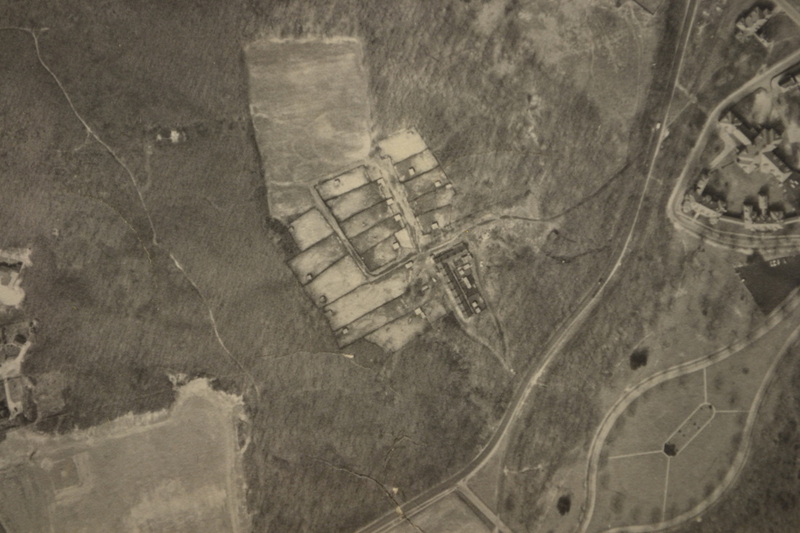 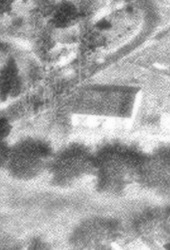 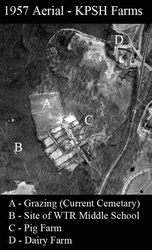 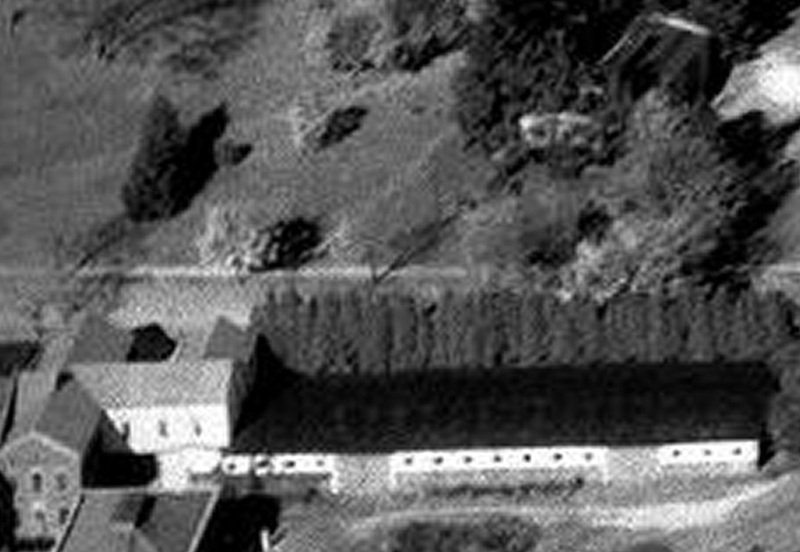 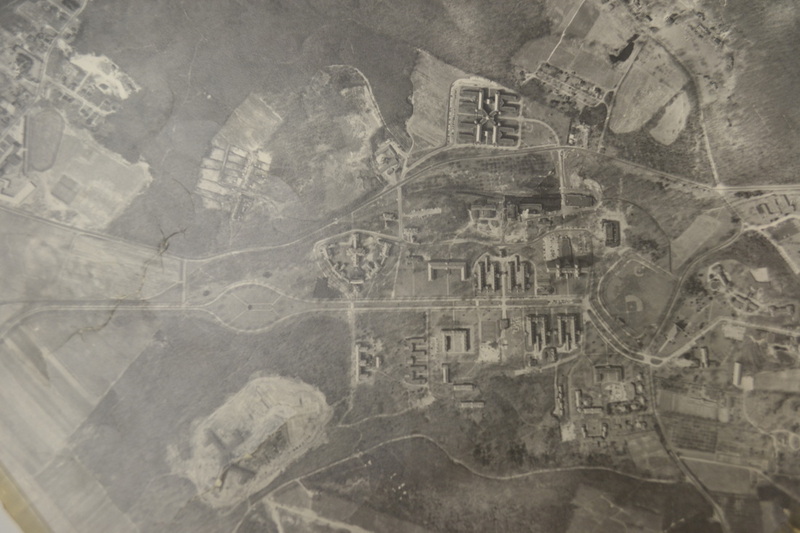 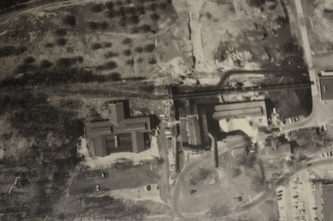 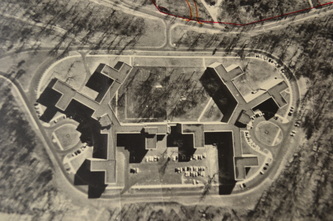 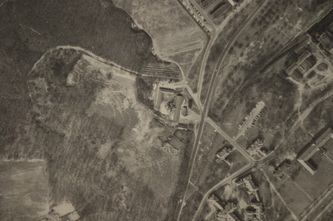 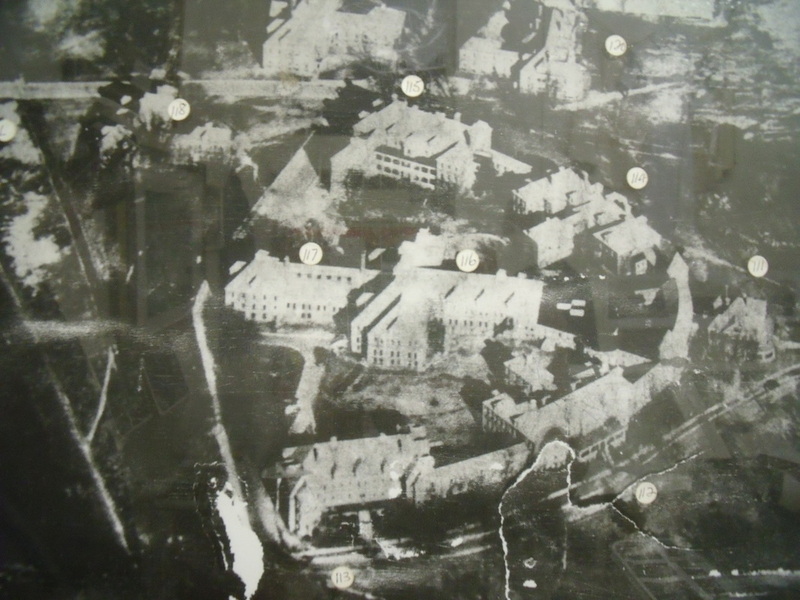 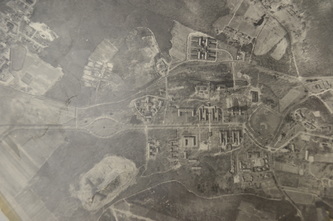 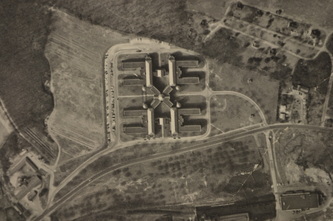 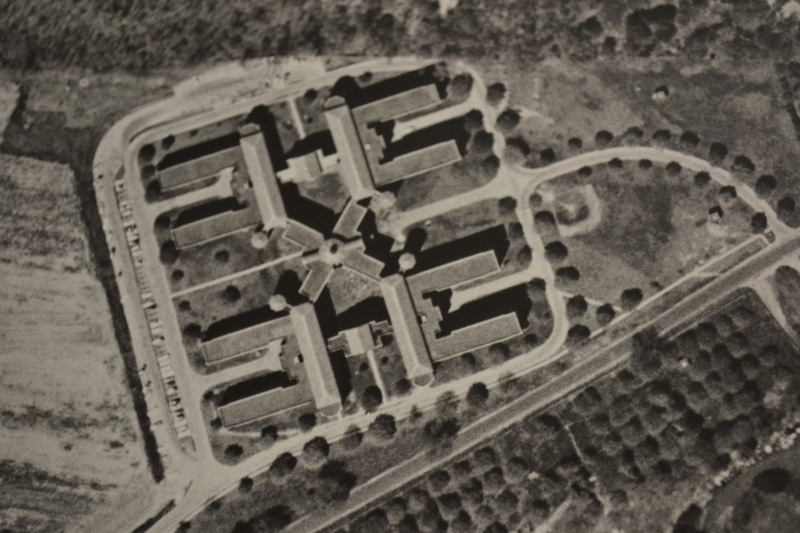 These are aerial photographs of either the entire hospital or of portions that were not part of any one particular group. 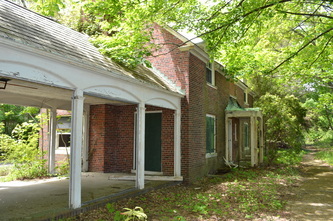 The early cottages are included in this category. 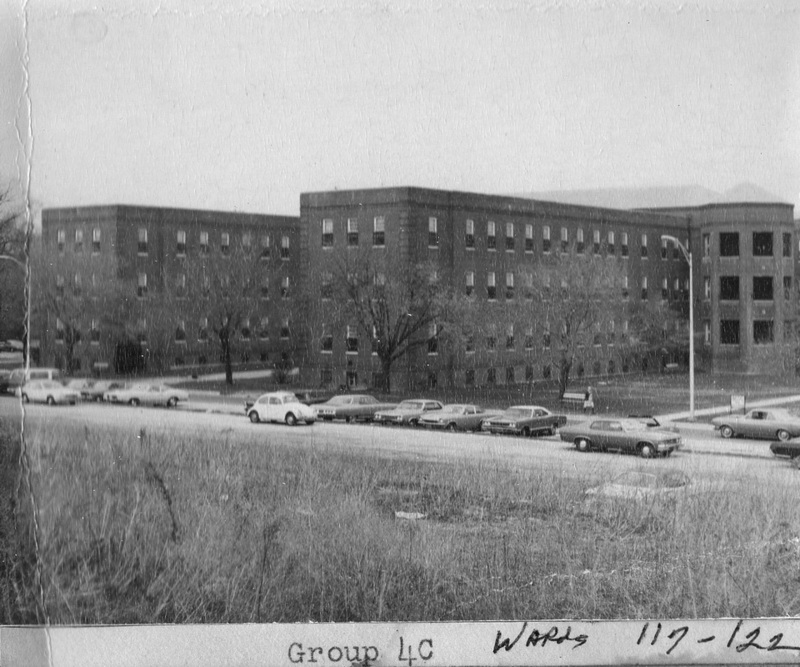 Buildings 15, 31, 32, 34, 45, 64-69, 82, 89, 92, 150, & 151 did not belong to any of the building groups, but they were a significant part of the hospital nonetheless. 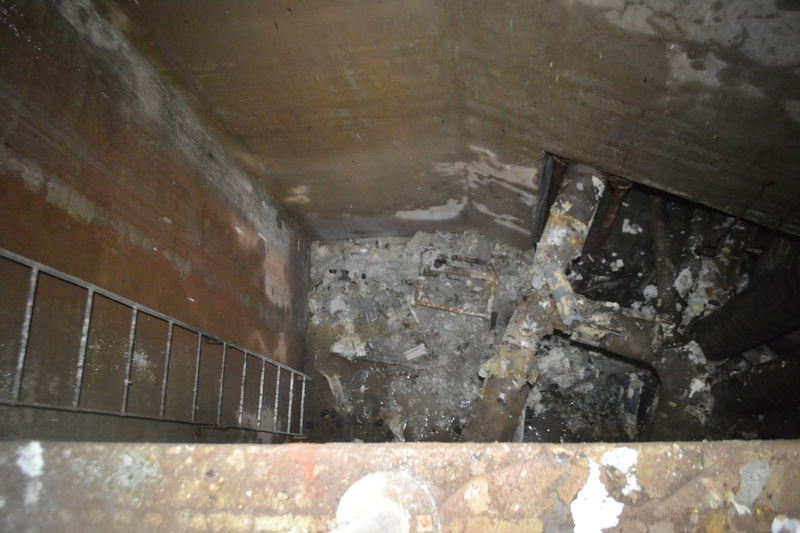 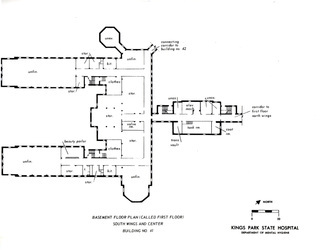 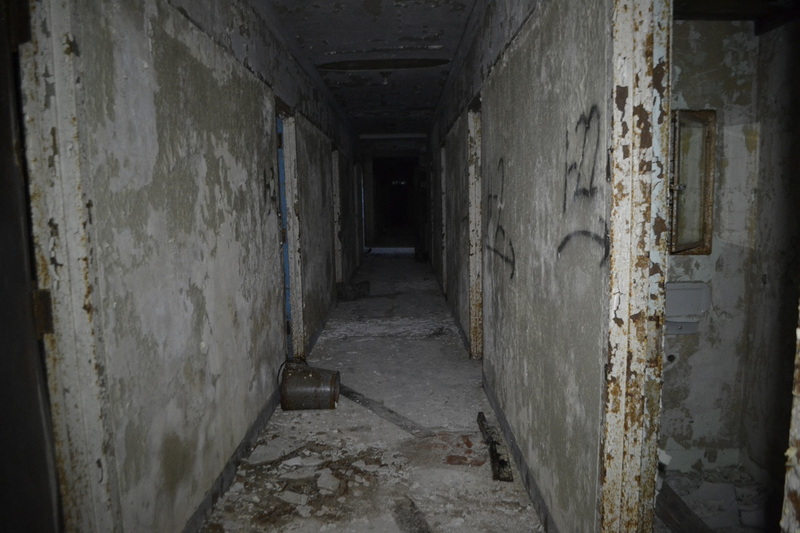 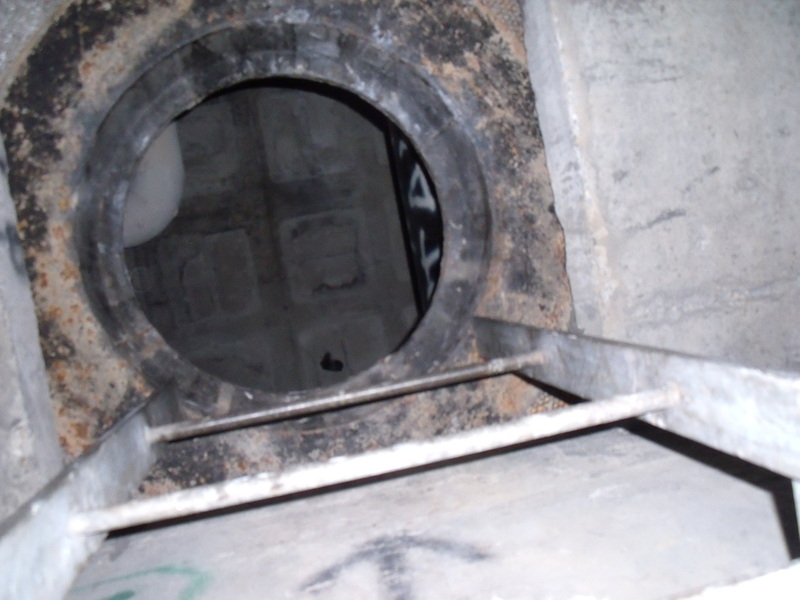 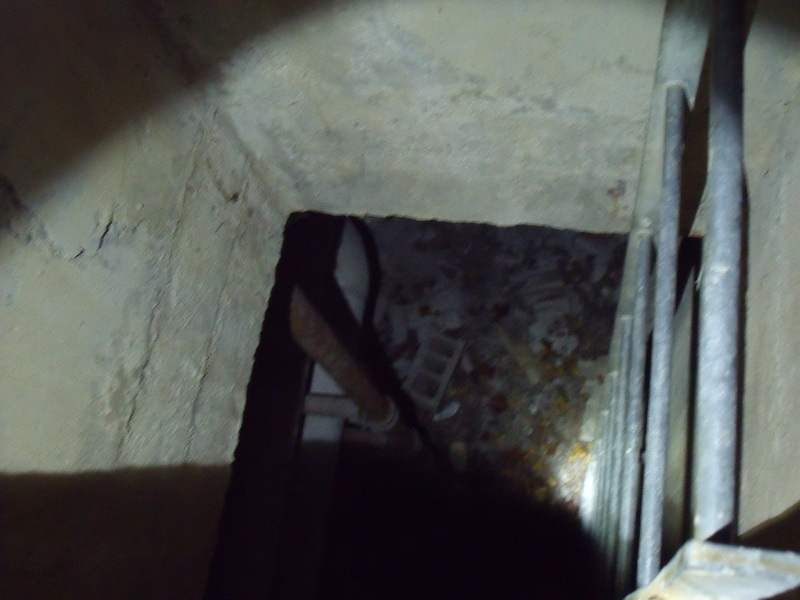 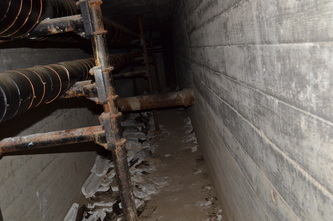 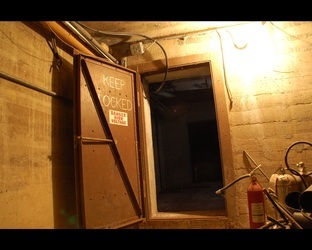 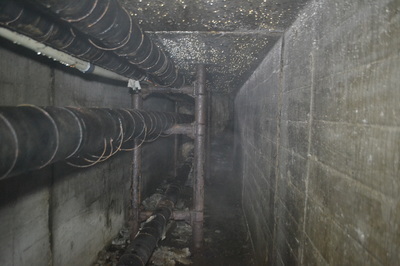 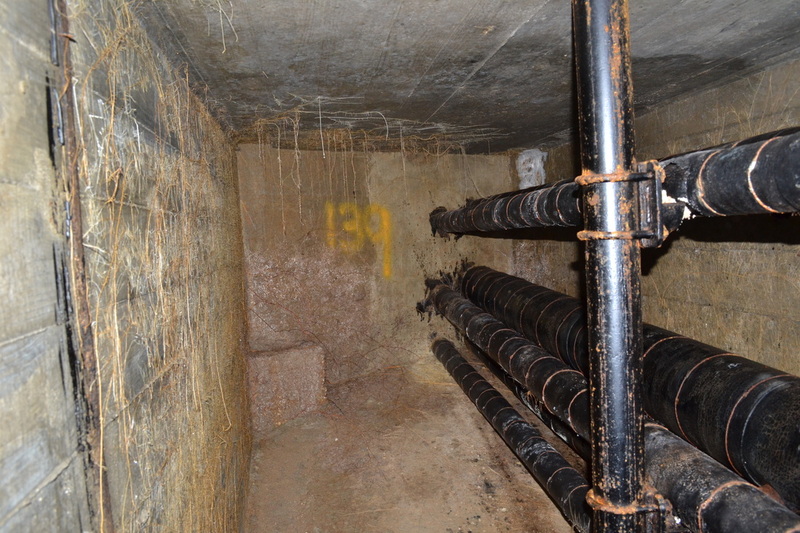 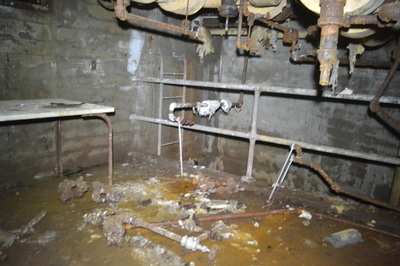 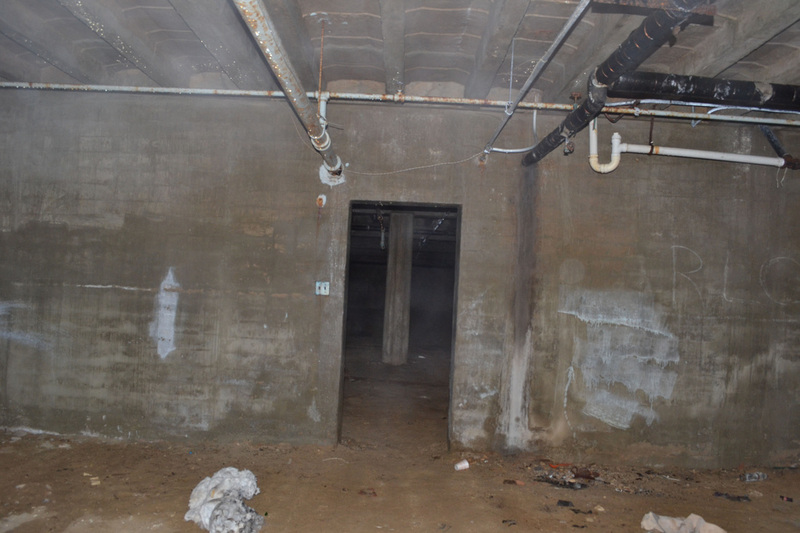 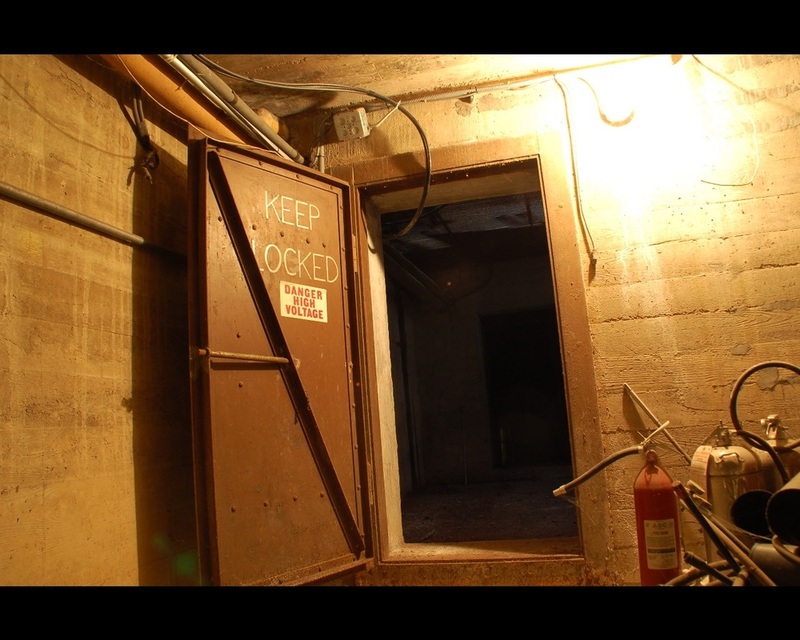 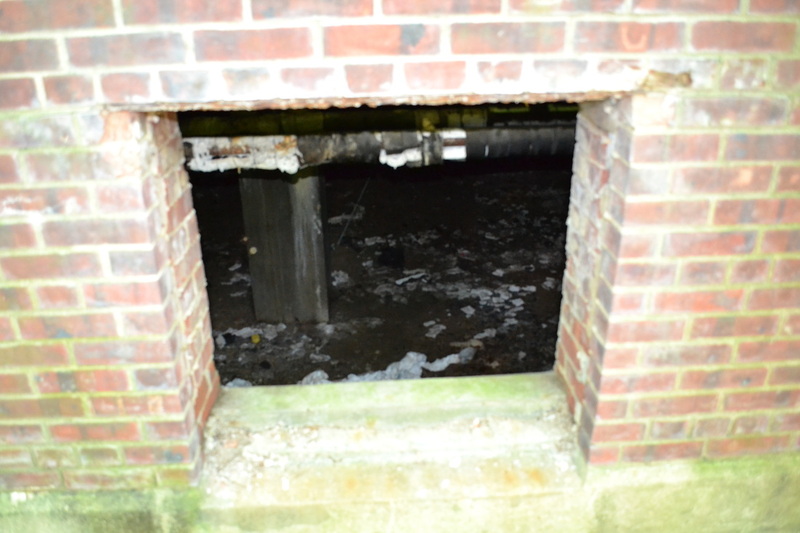 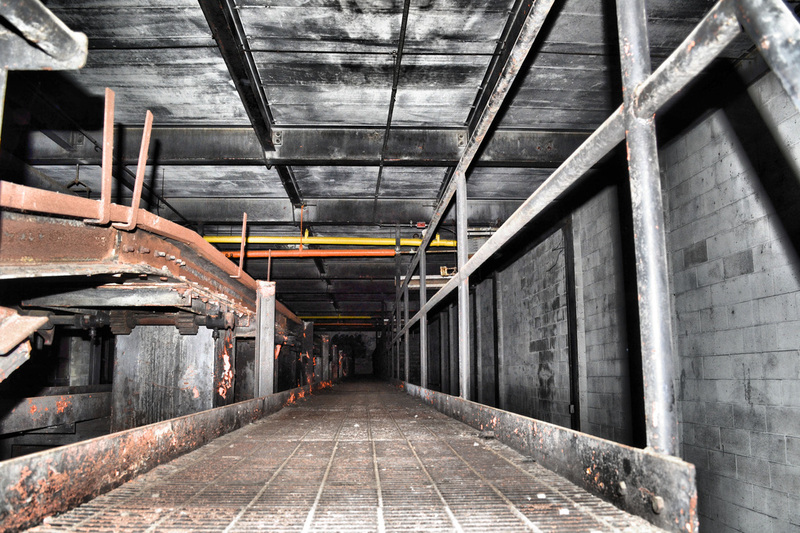 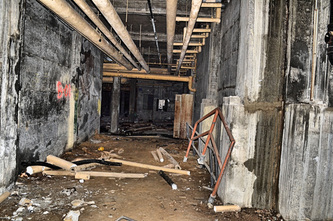 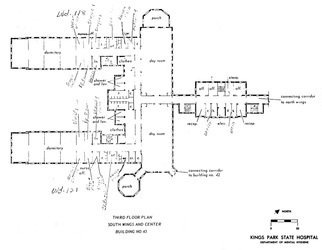 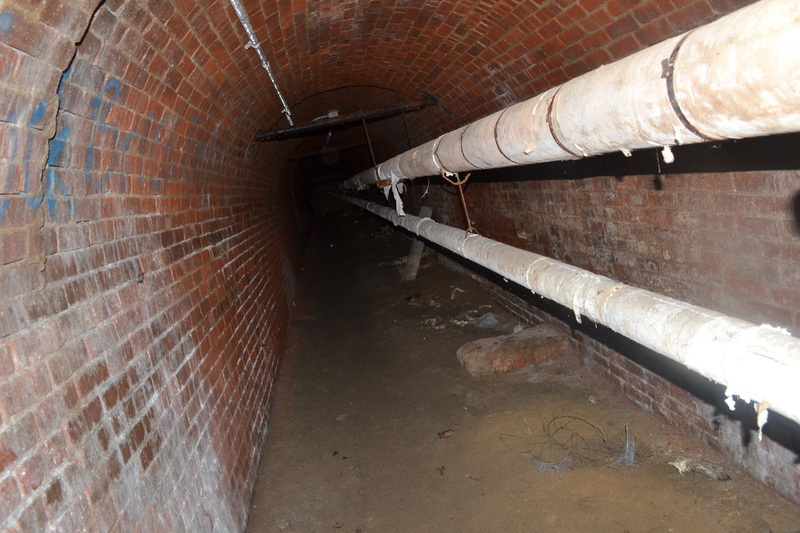 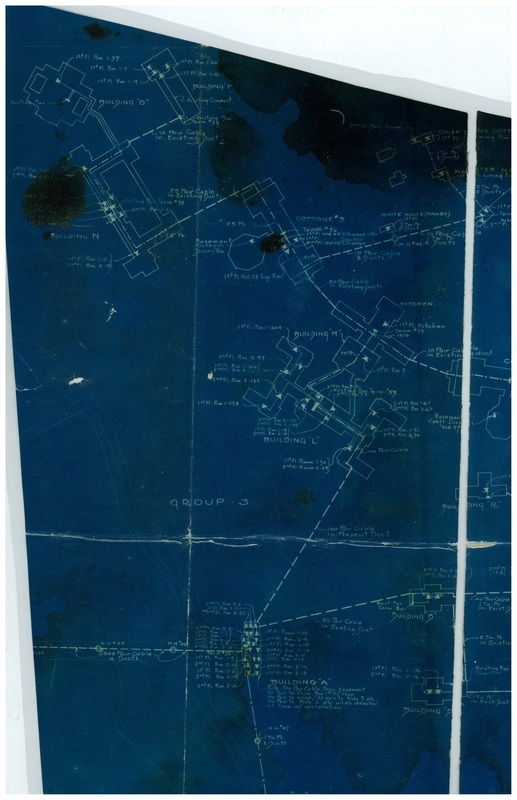 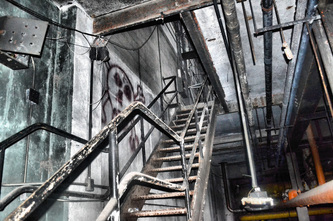 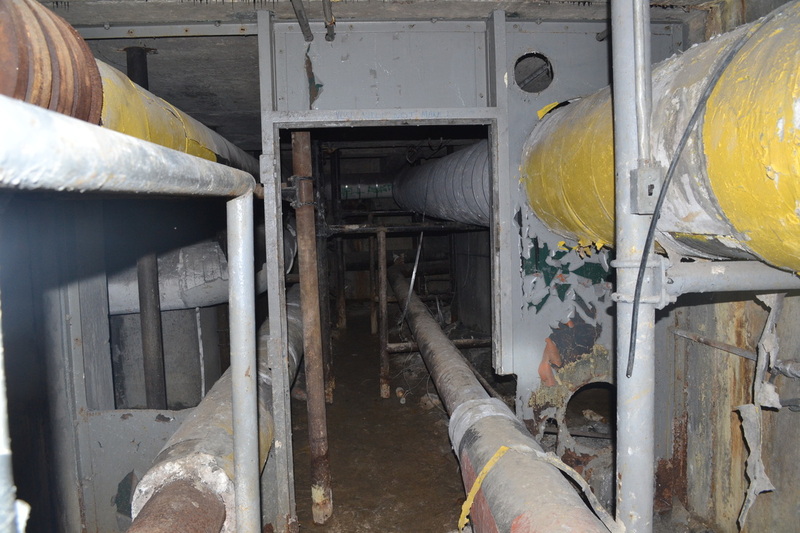 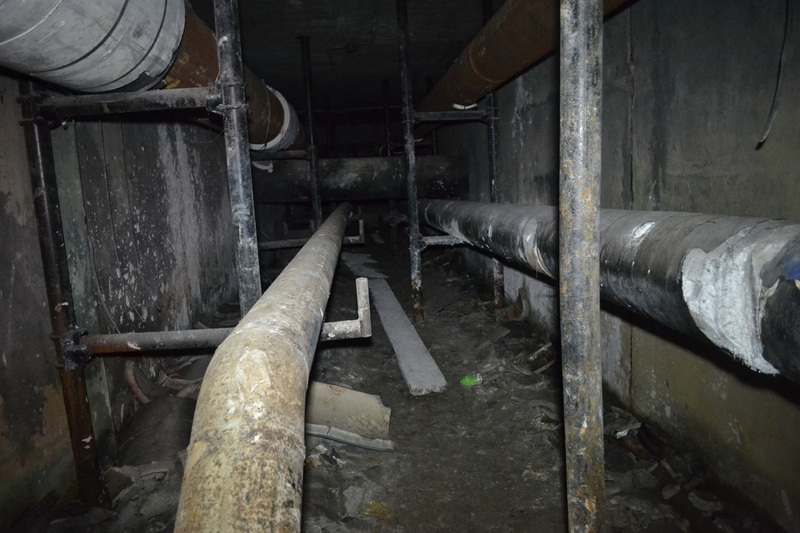 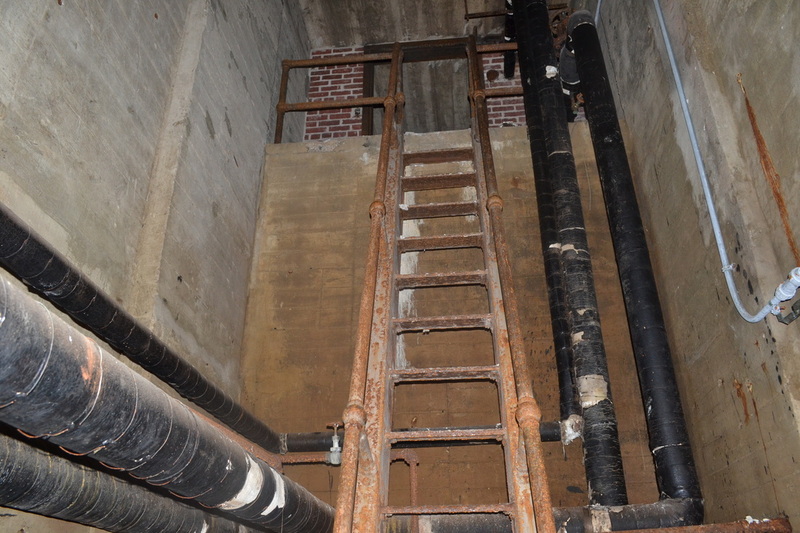 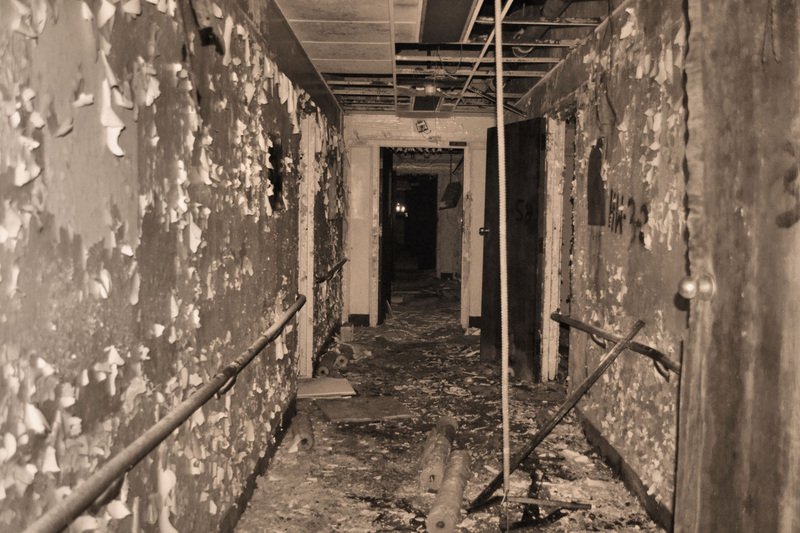 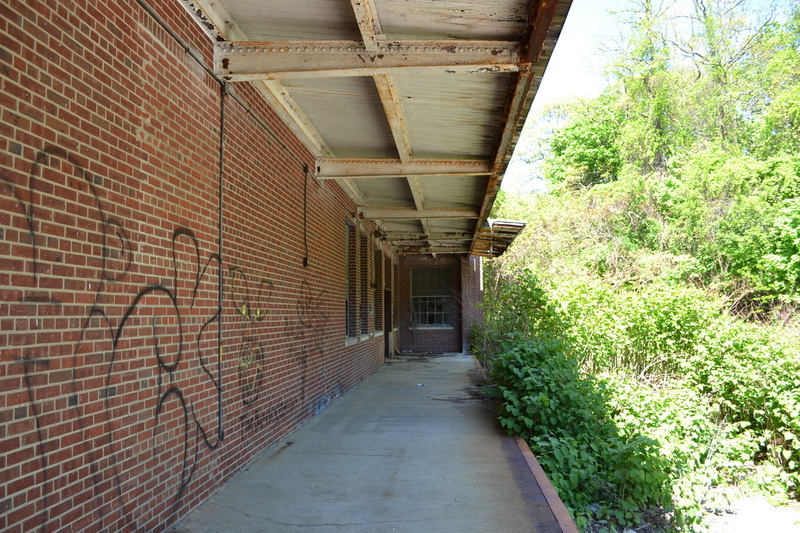 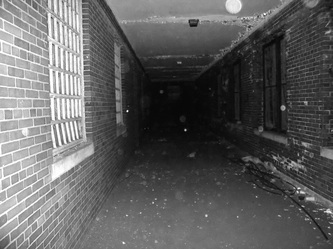 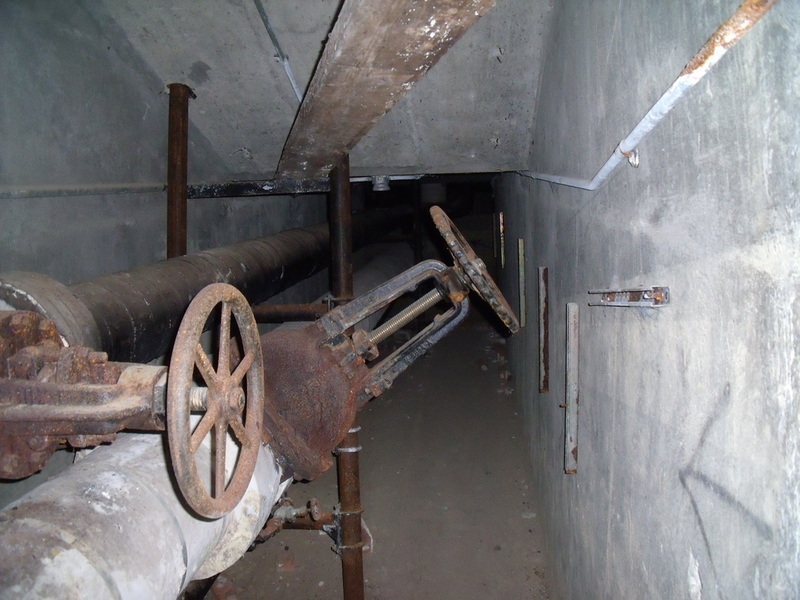 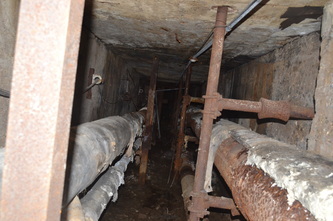 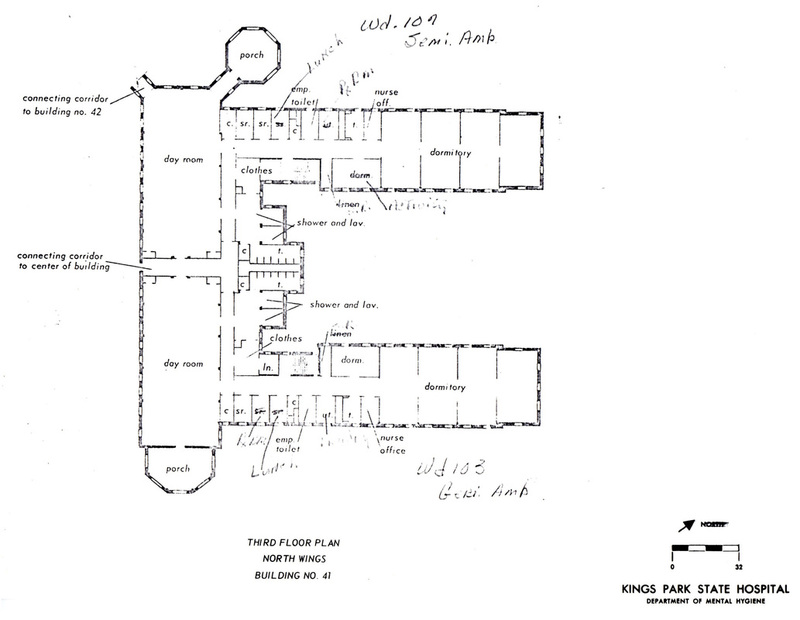 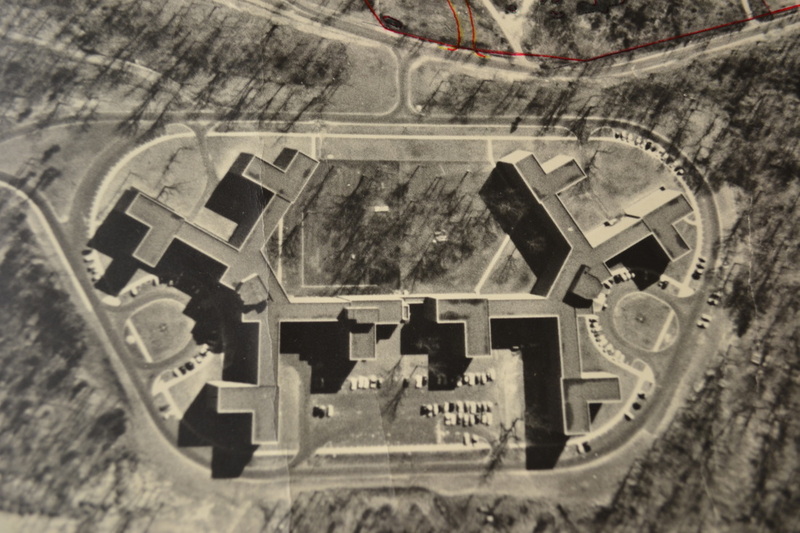 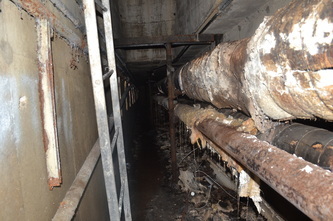 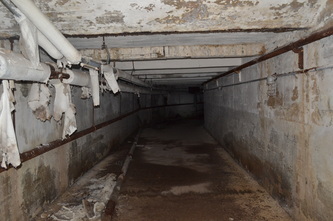 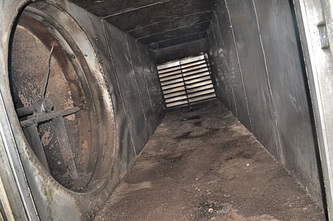 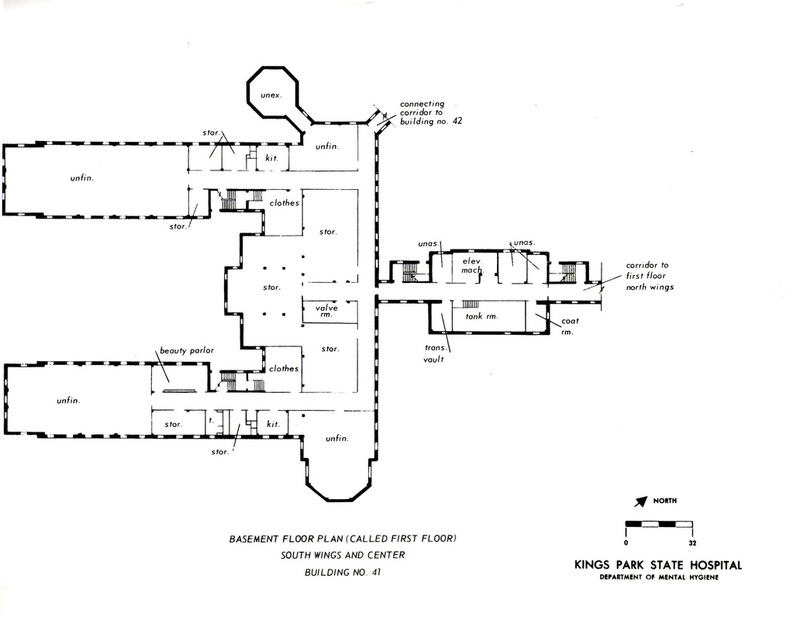 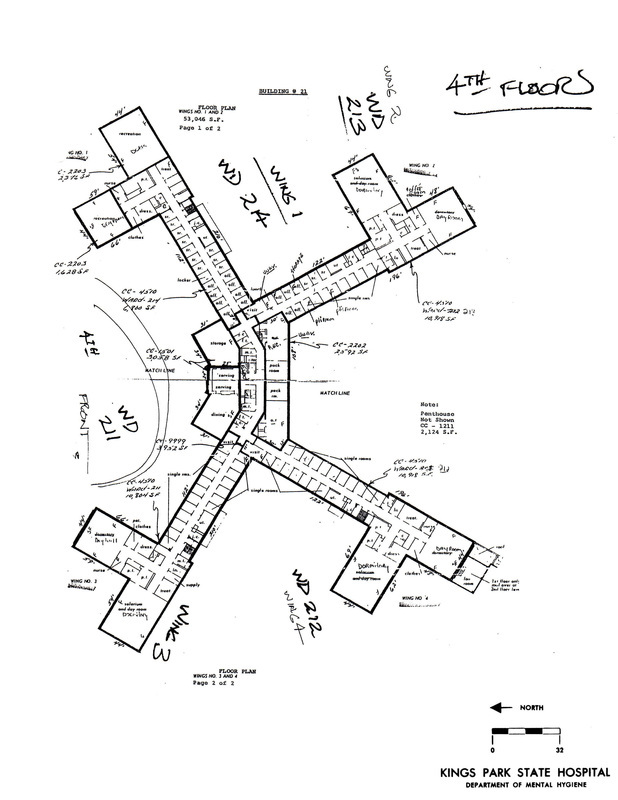 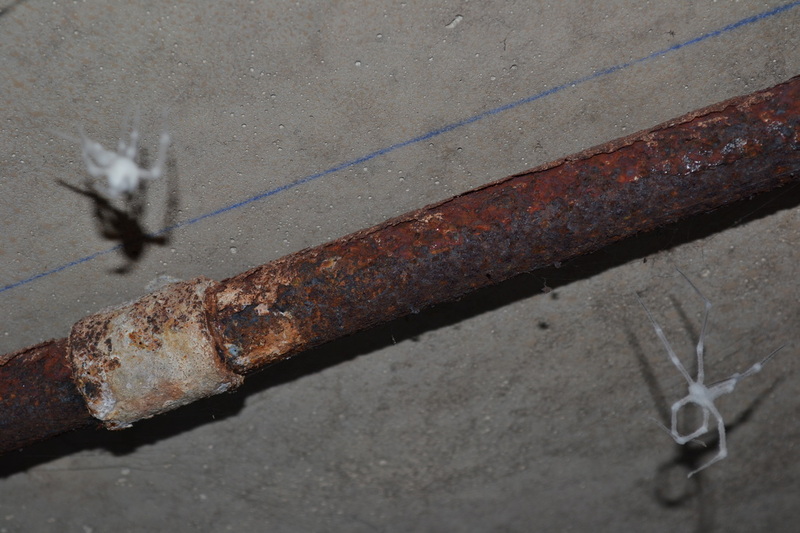 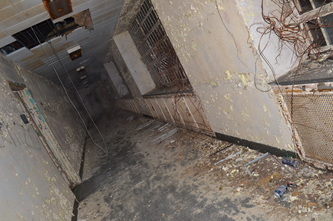 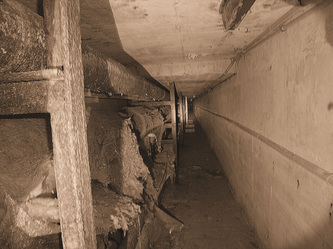 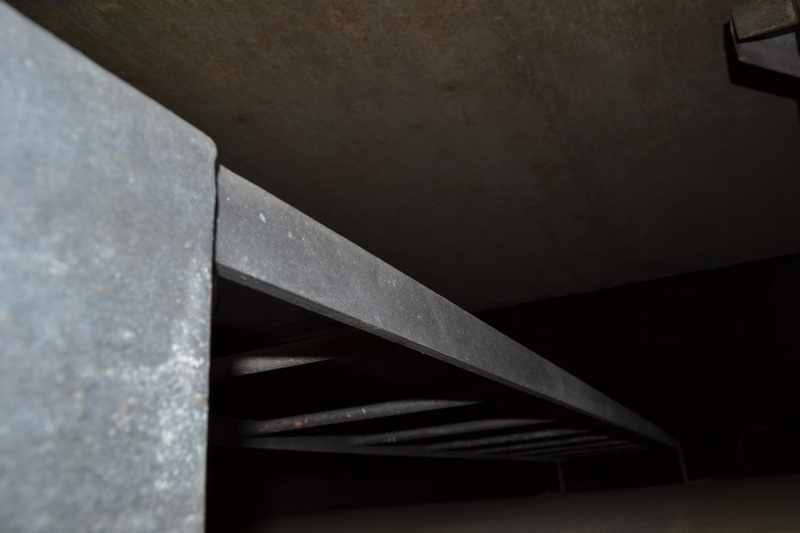 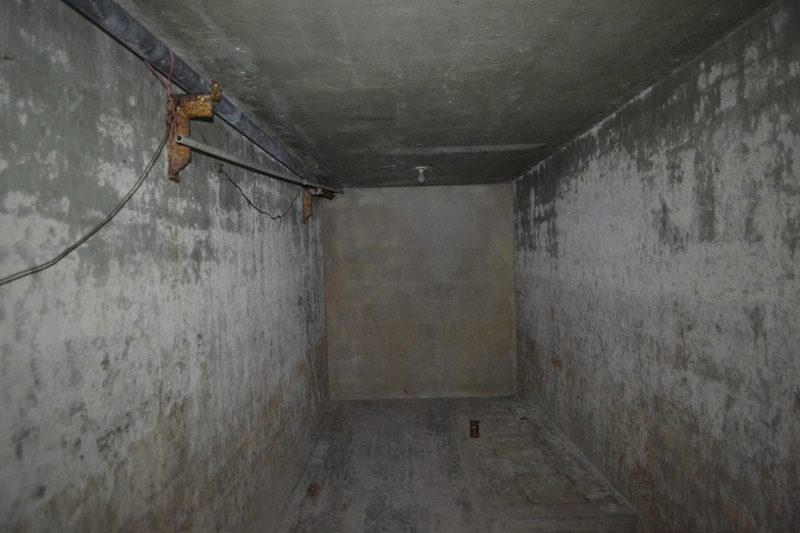 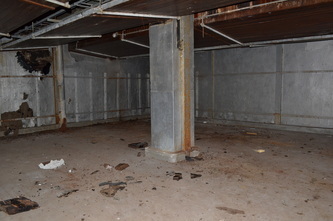 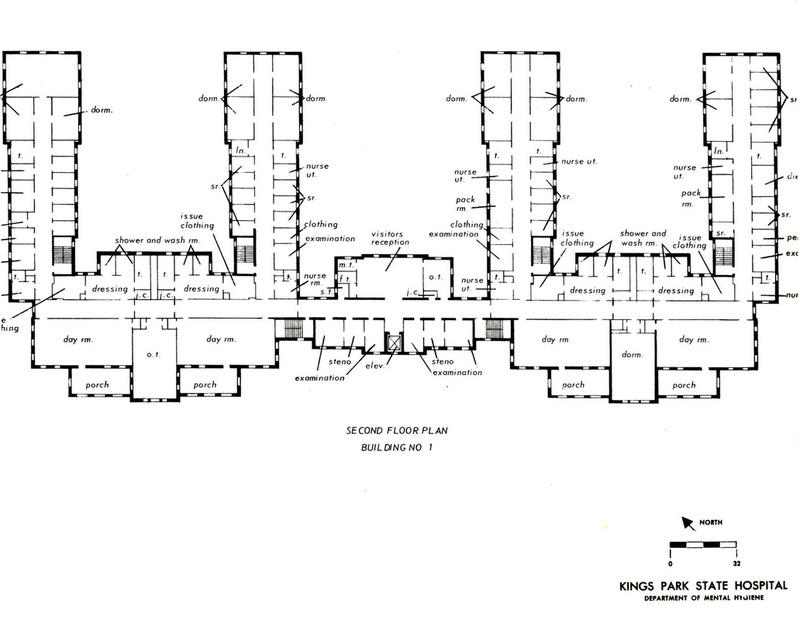 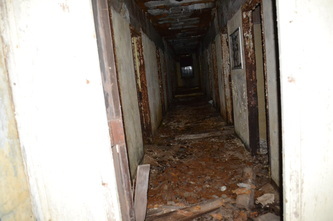 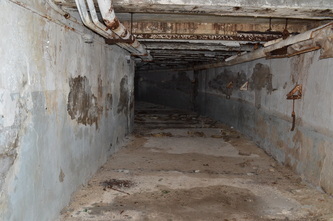 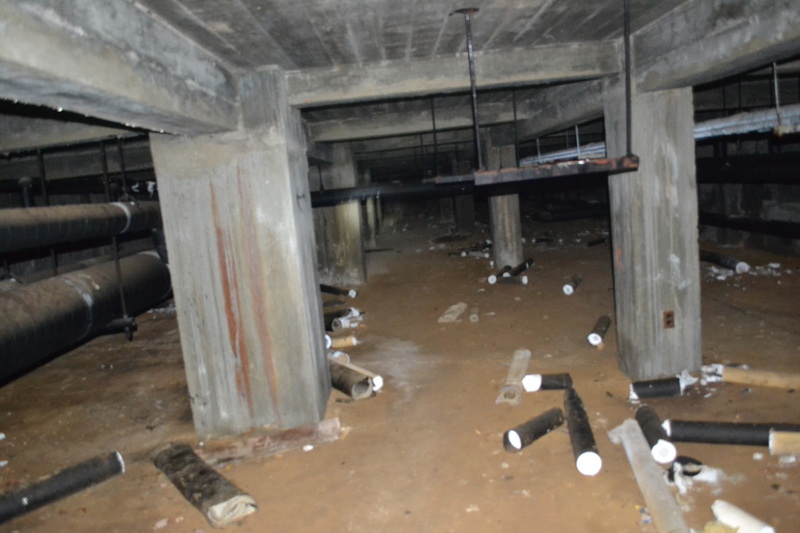 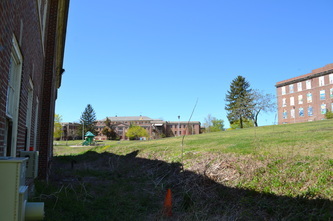 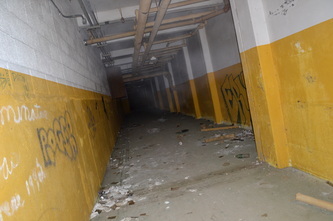 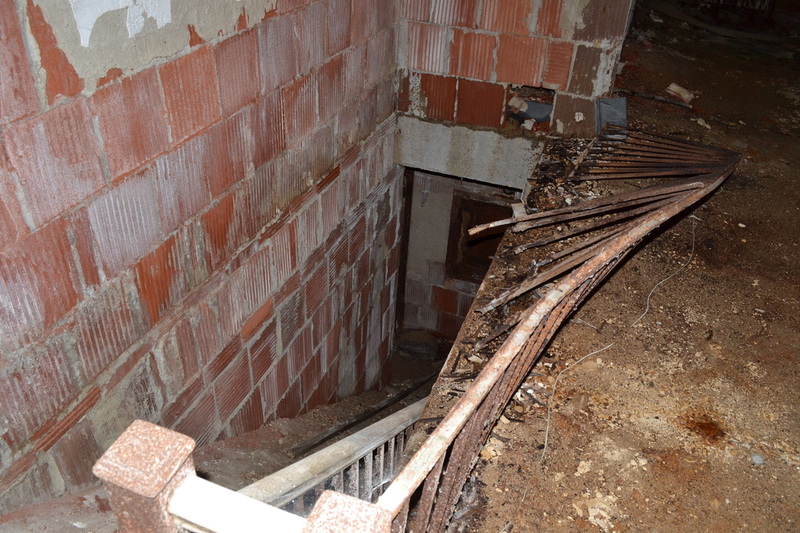 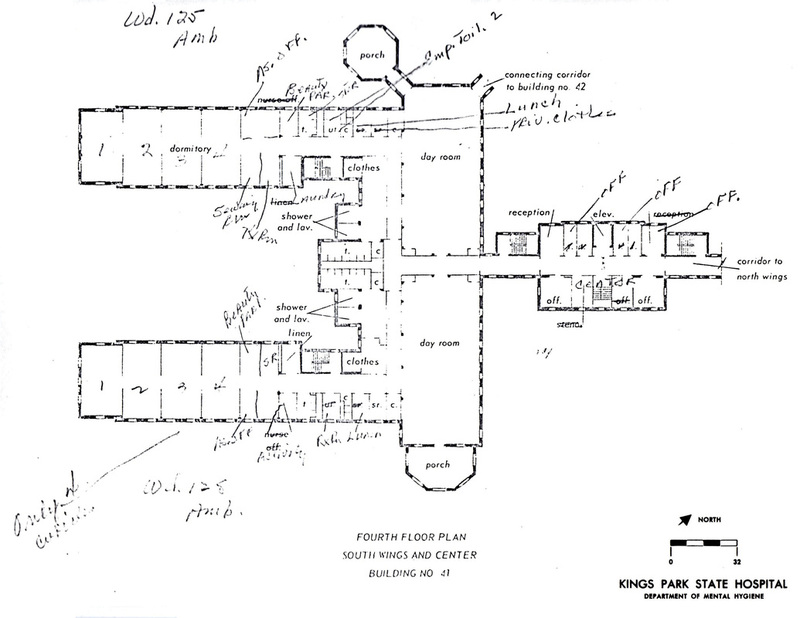 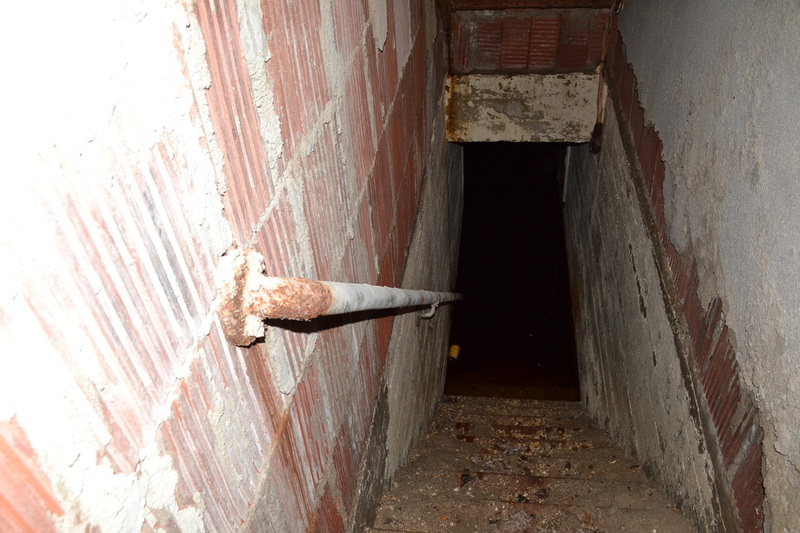 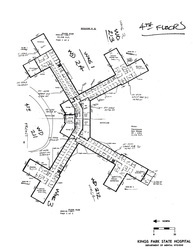 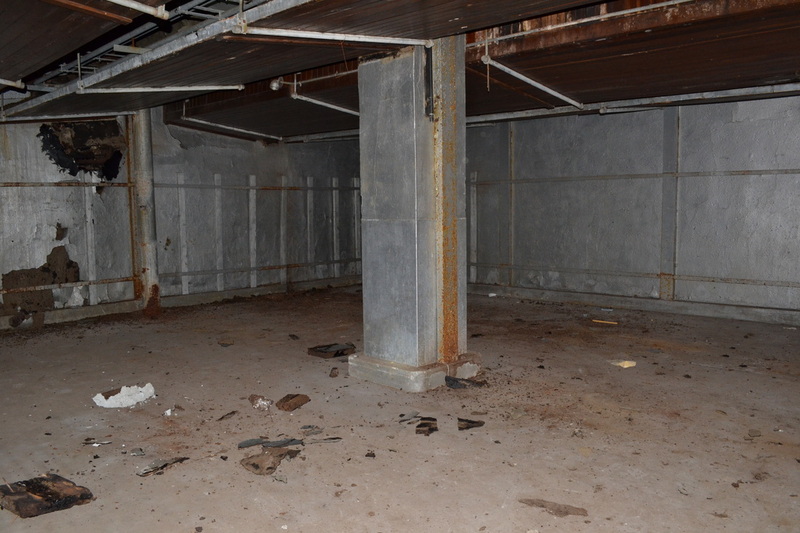 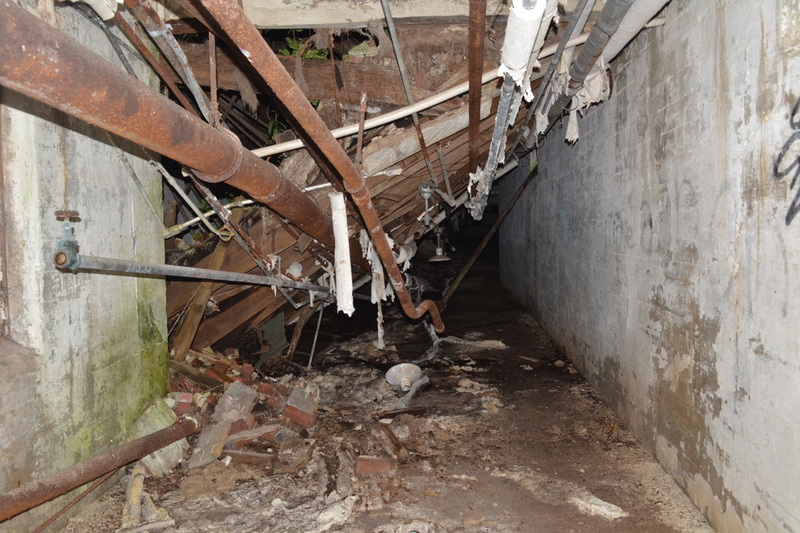 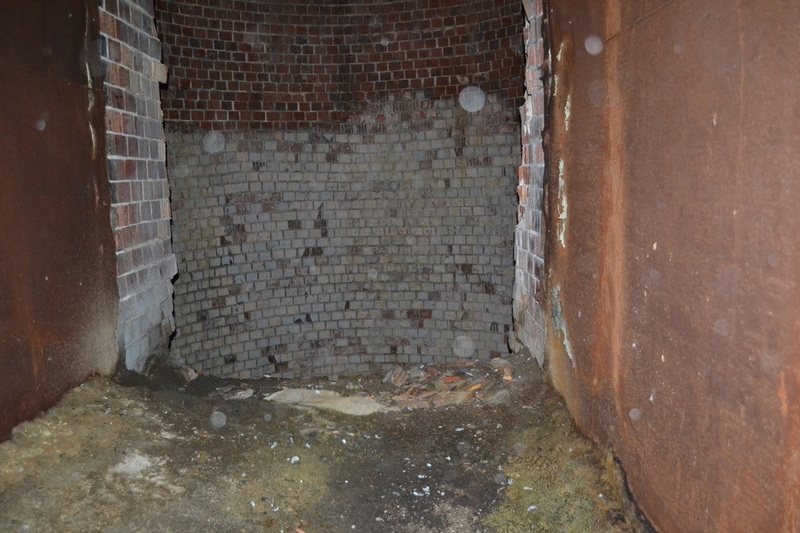 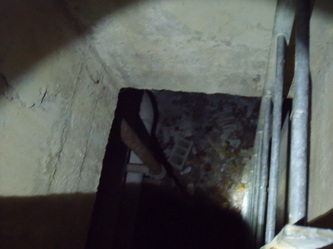 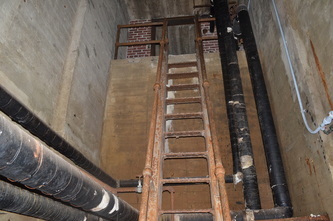 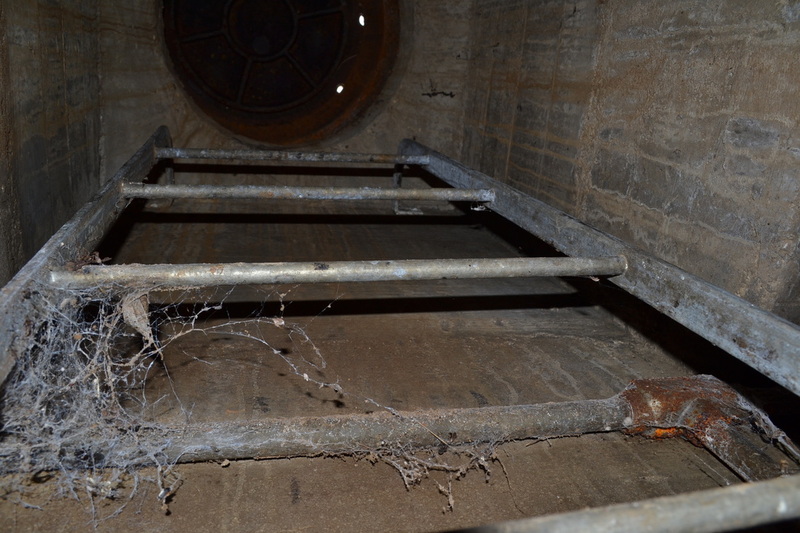 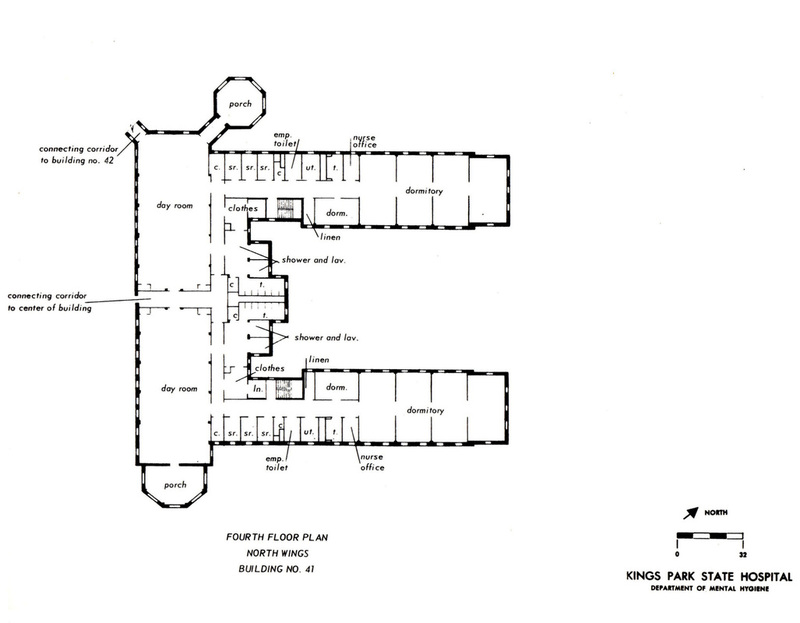 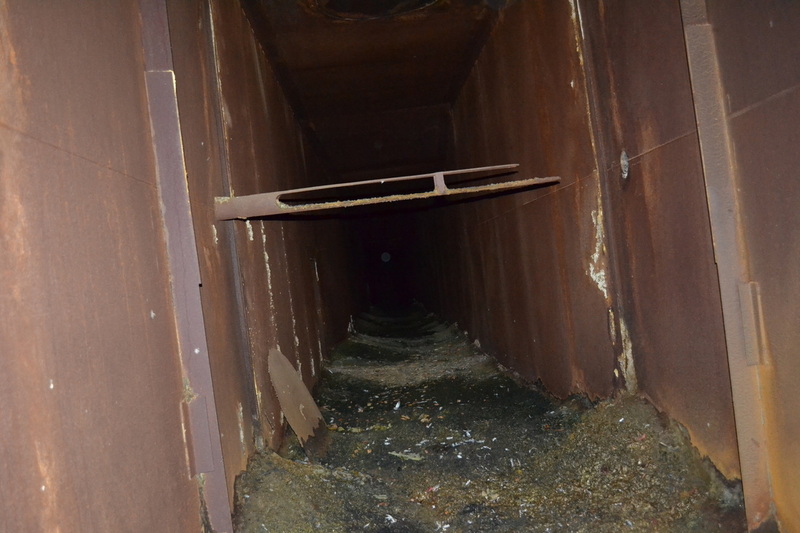 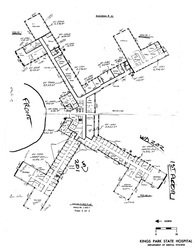 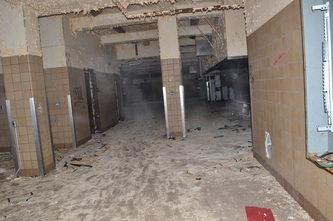 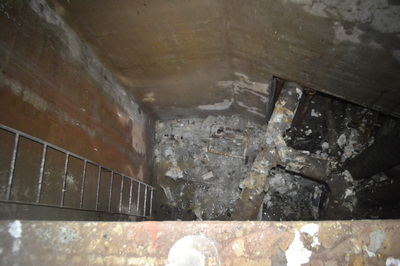 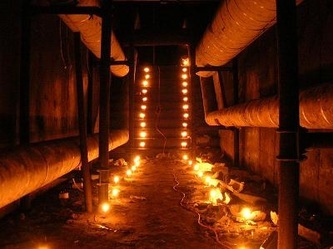 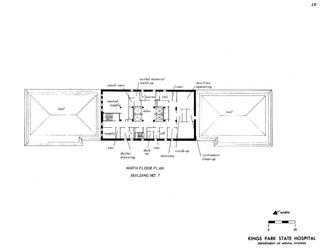 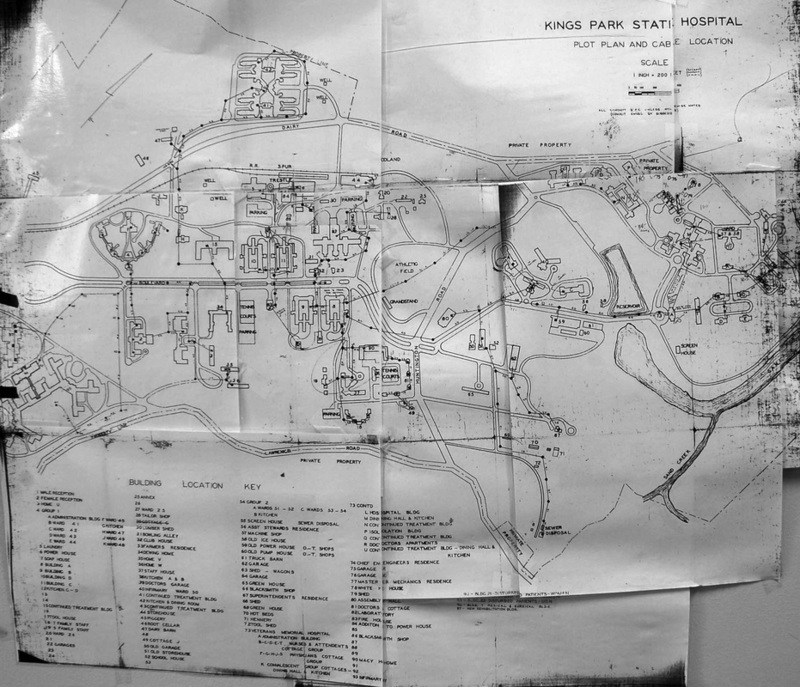 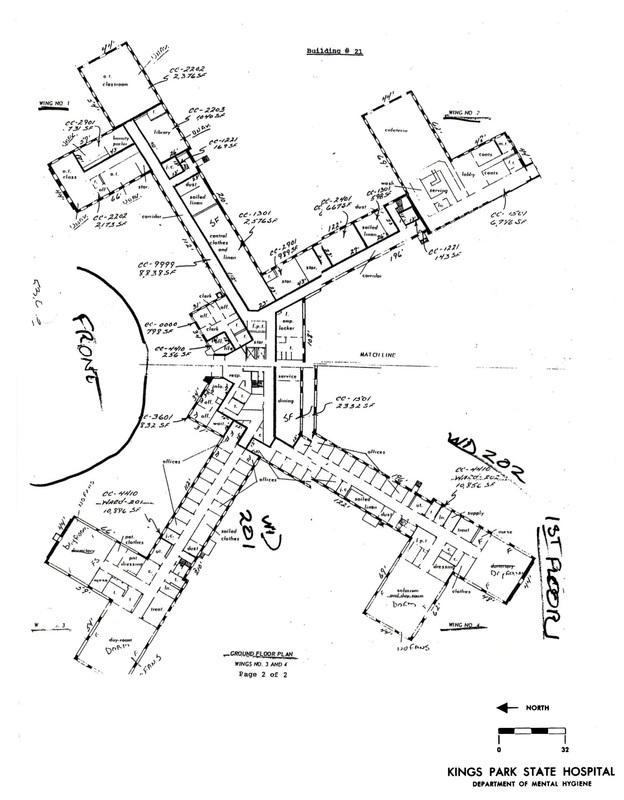 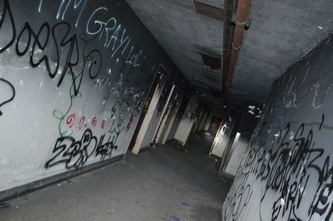 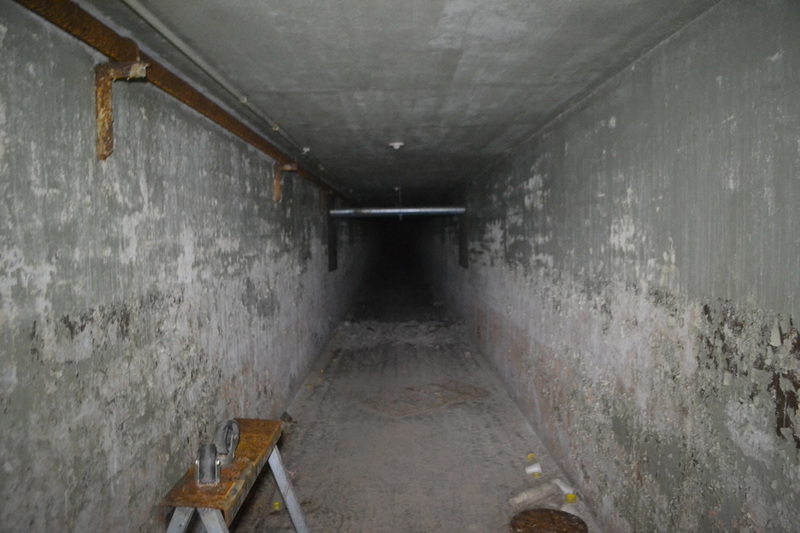 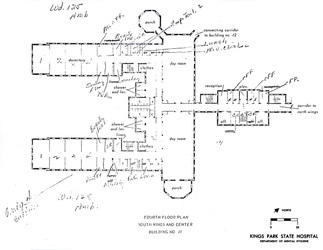 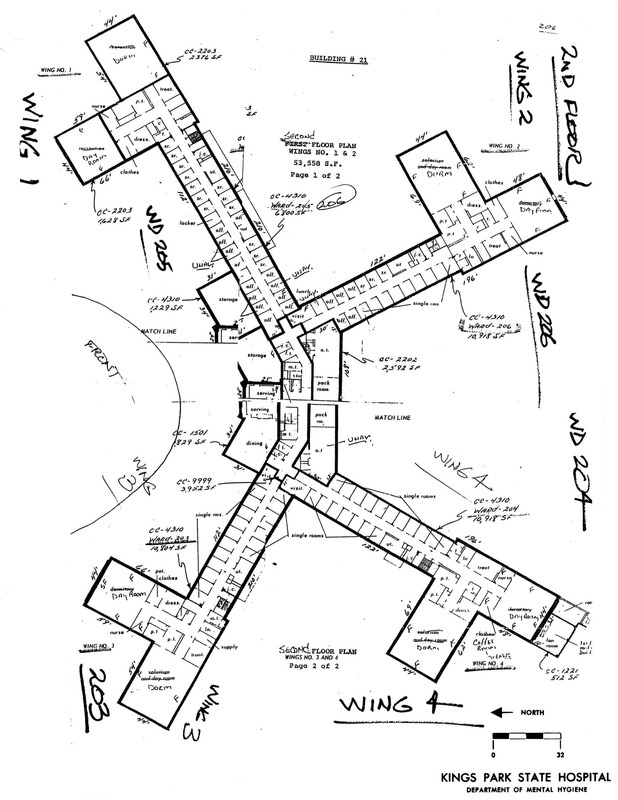 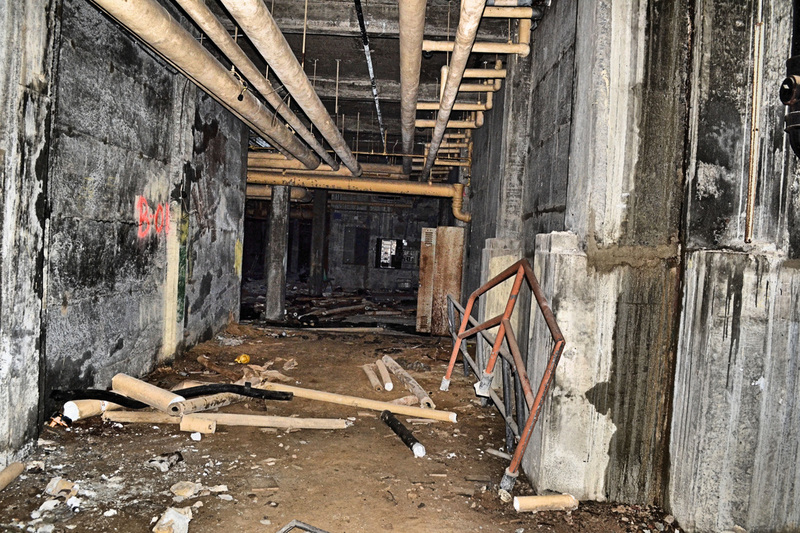 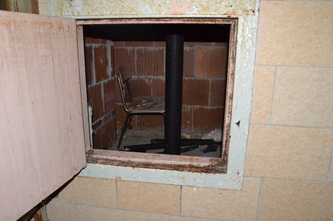 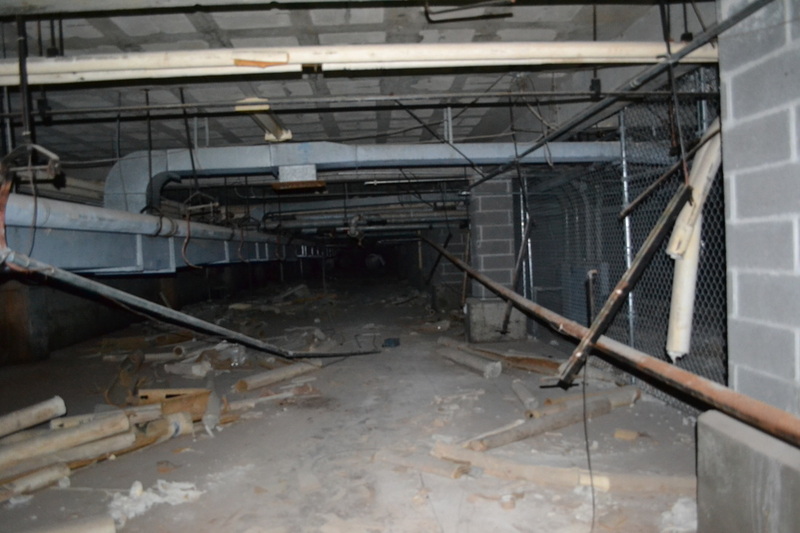 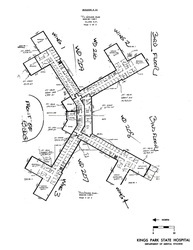 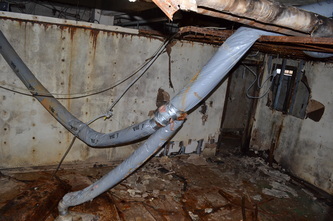 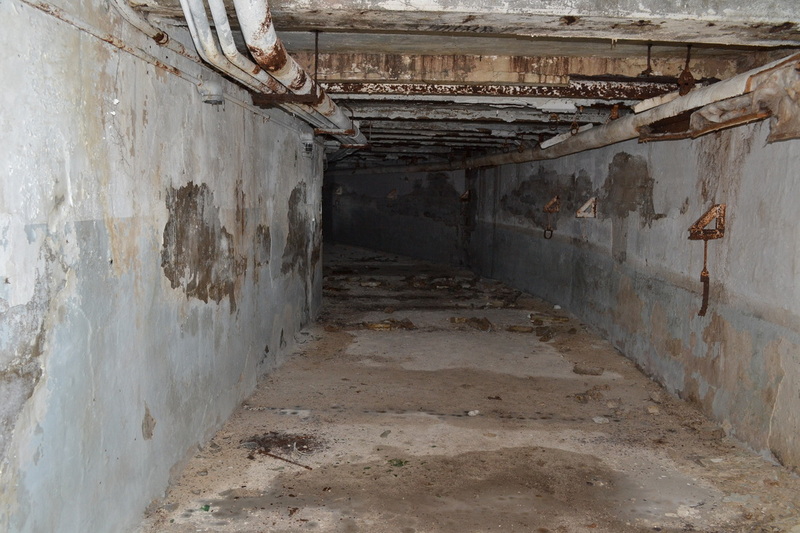 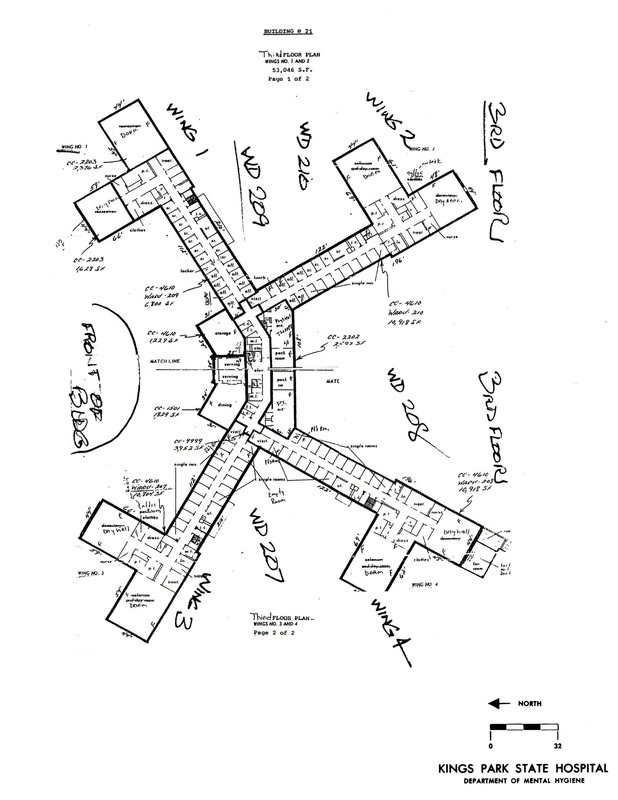 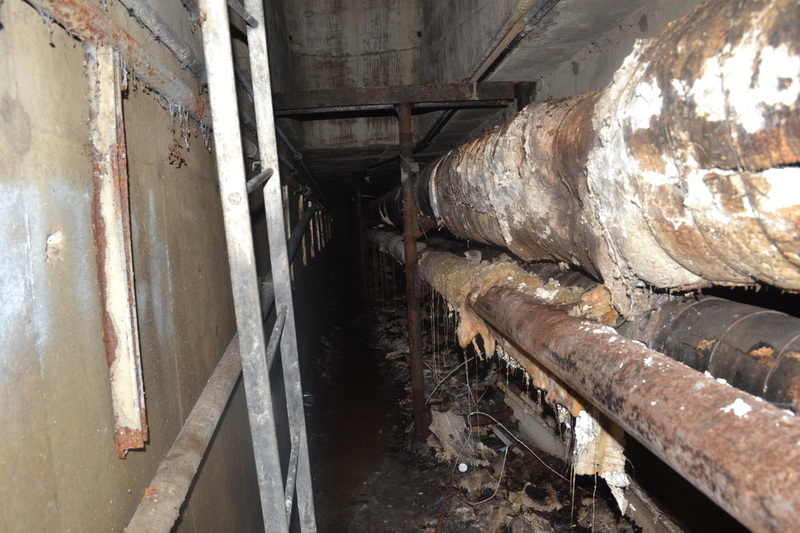 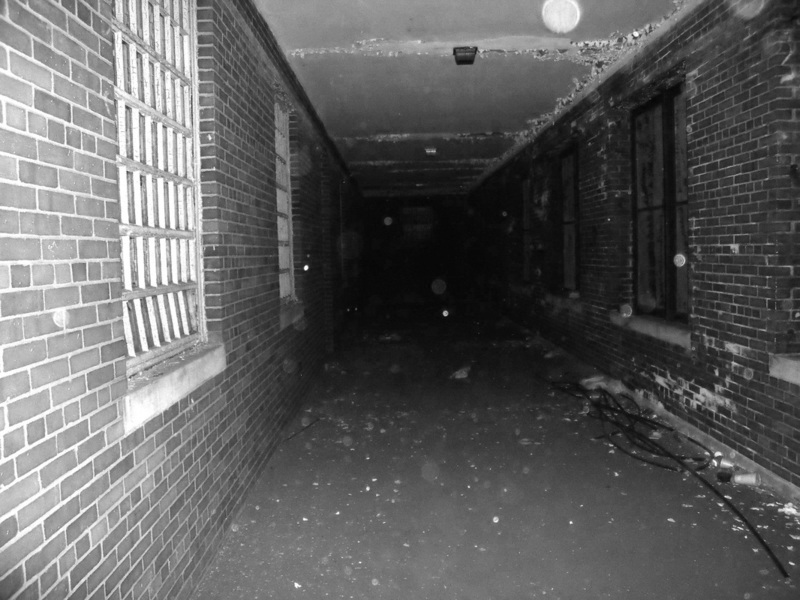 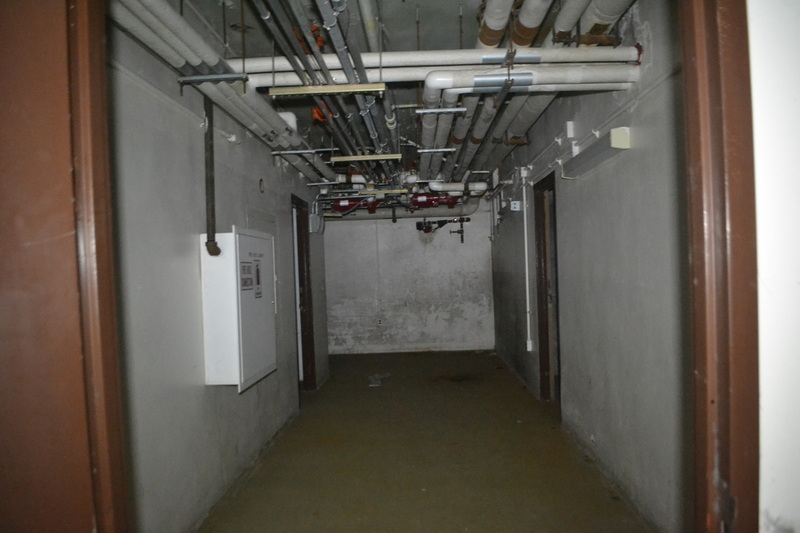 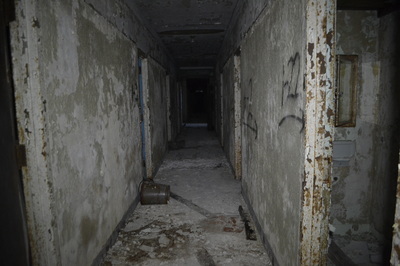 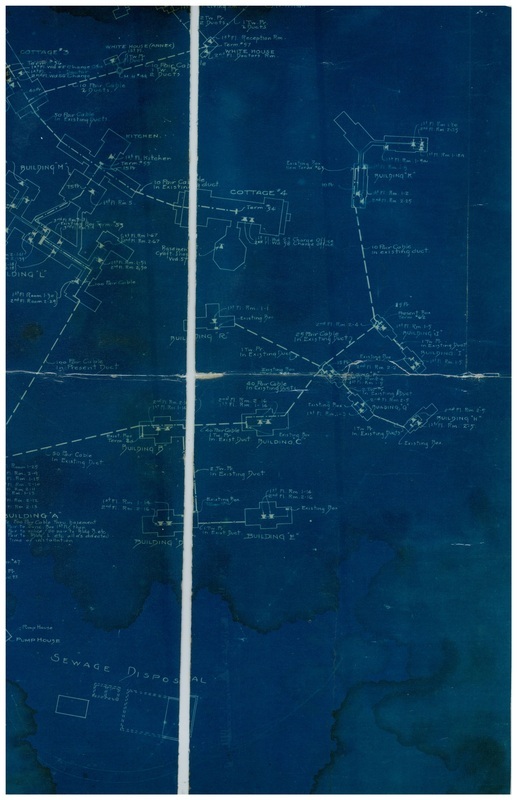 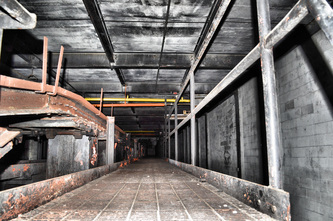 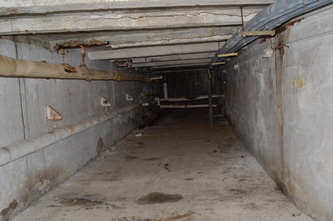 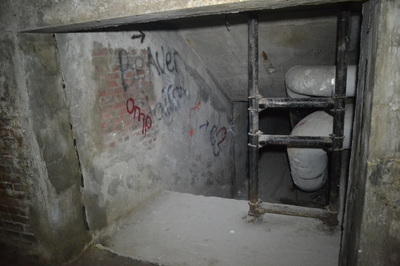 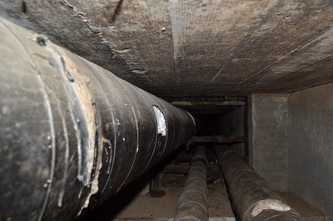 There are nearly 7 miles of underground tunnels beneath the hospital, which connect mostly every building to each other. 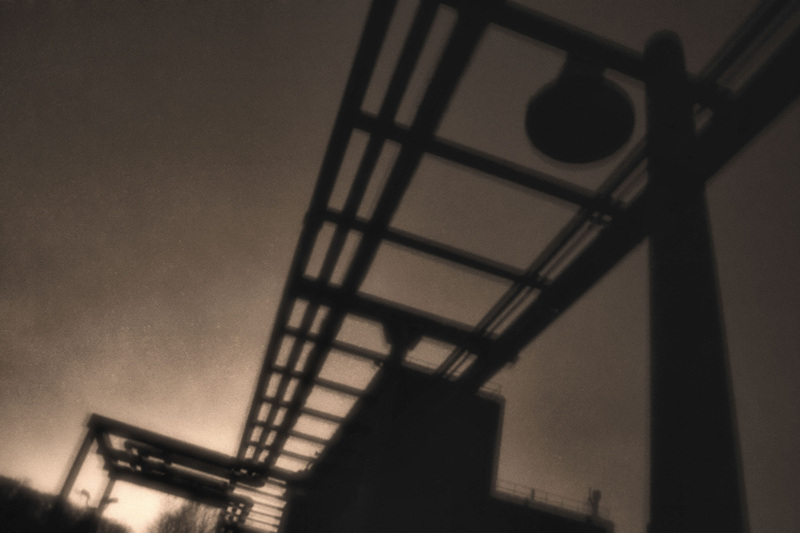 Darkness and danger awaits the person brave enough to venture into these health hazards. 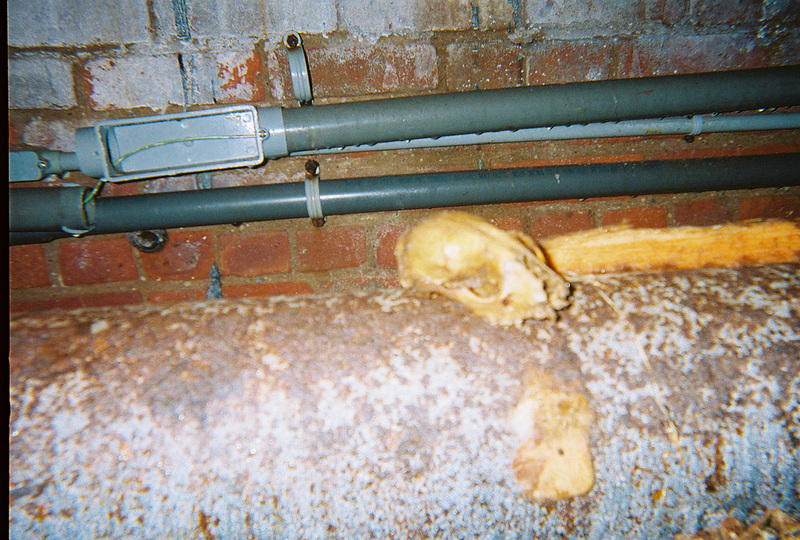 Many now lead to dead ends, where long since demolished buildings no longer exist, or are cluttered with pipes covered in asbestos. 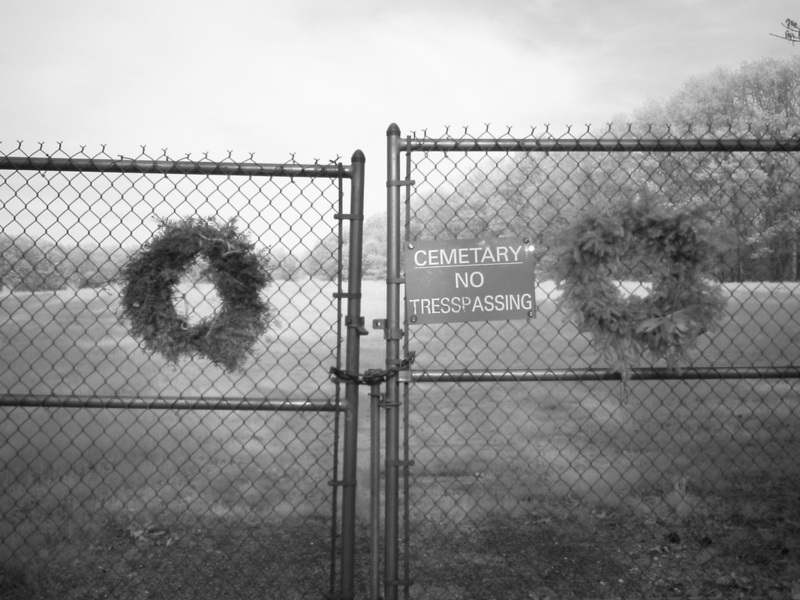 This was the last cemetery used by the hospital from around 1970 until it closed in 1996. 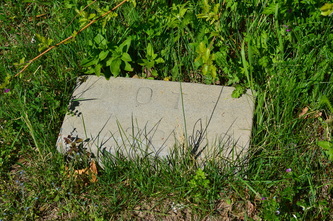 Most of the few headstones are numbered with no names on them. 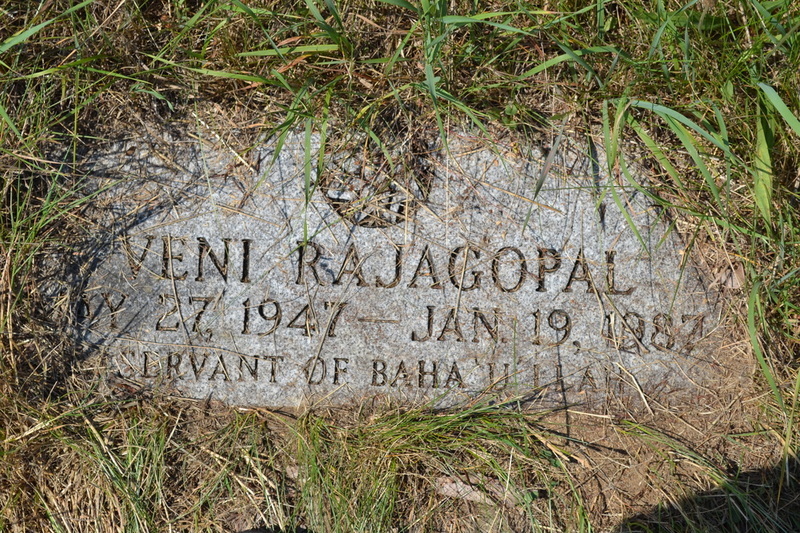 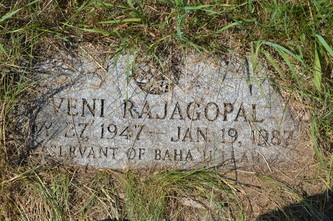 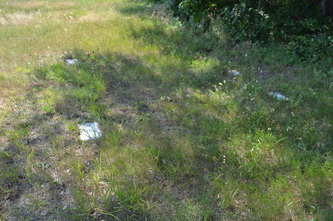 A memorial stone was placed in memory of the hundreds buried here. 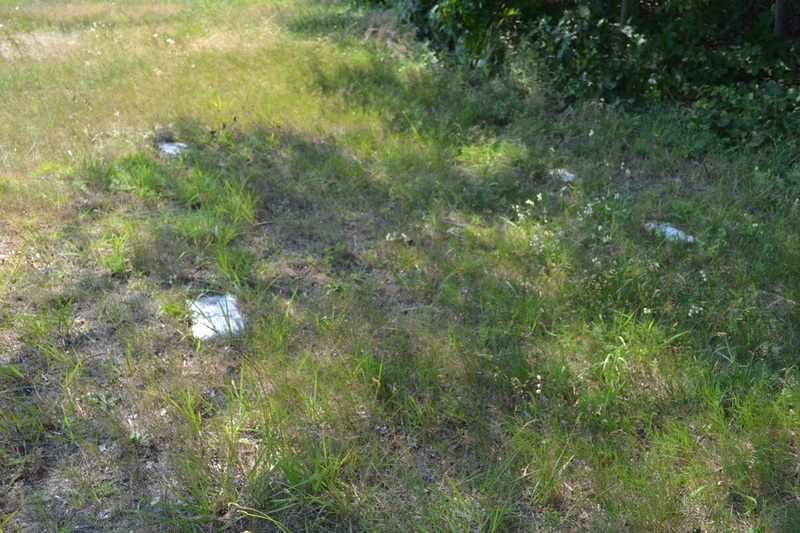 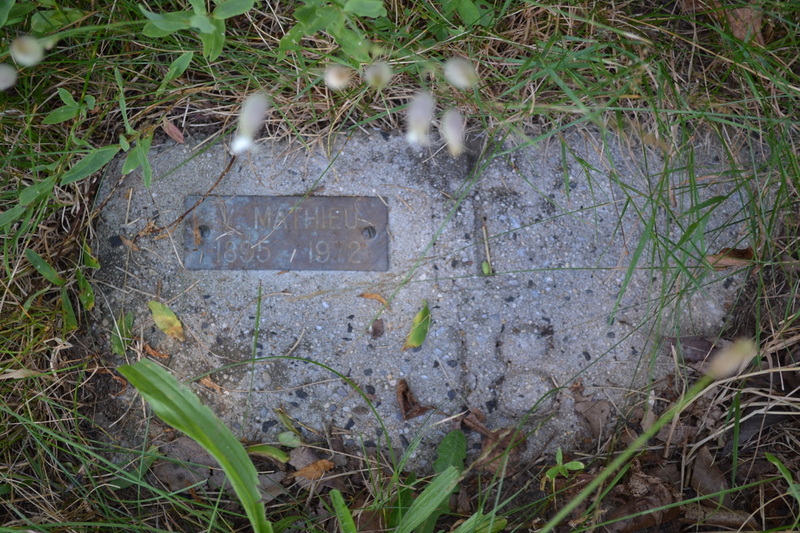 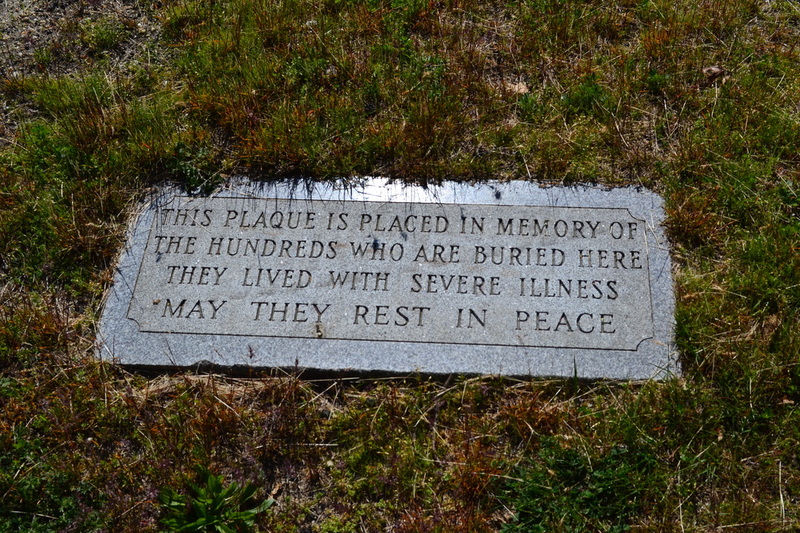 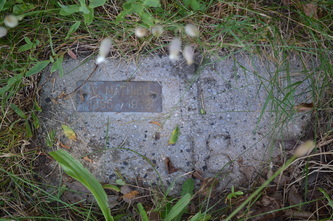 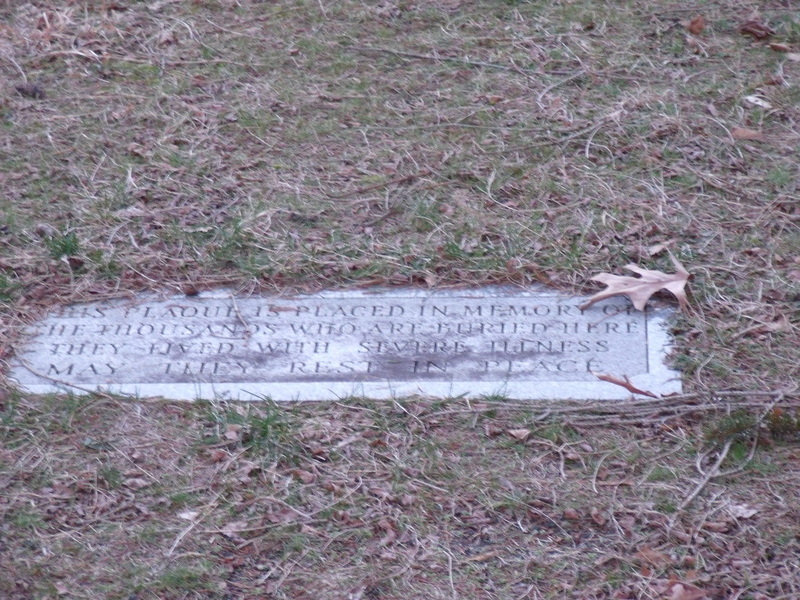 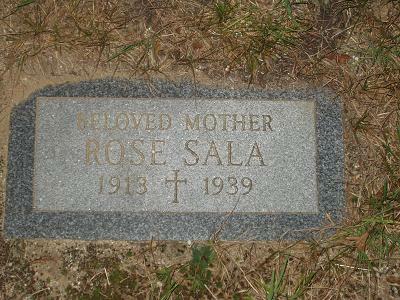 There are practically no headstones in this cemetery that was used during the hospital's early years. 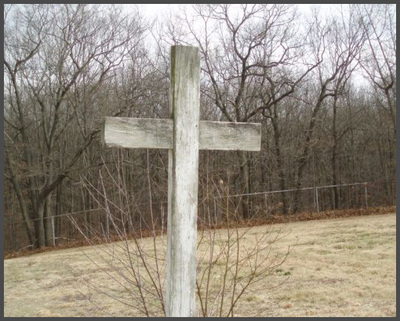 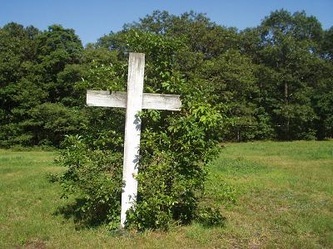 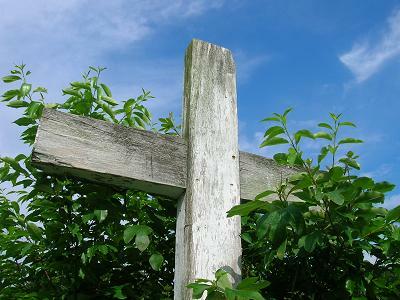 At one time only a white wooden cross stood as a monument for the thousands of dead buried here. 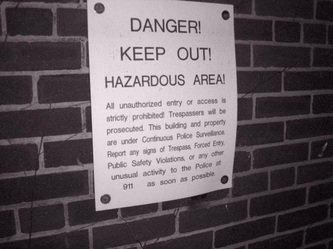 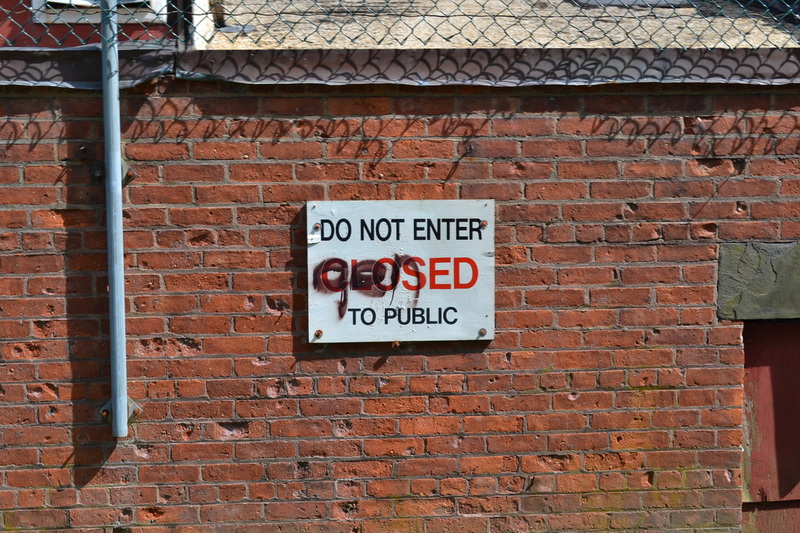 It was later removed, so curious passersby would not attempt trespassing for a closer look. 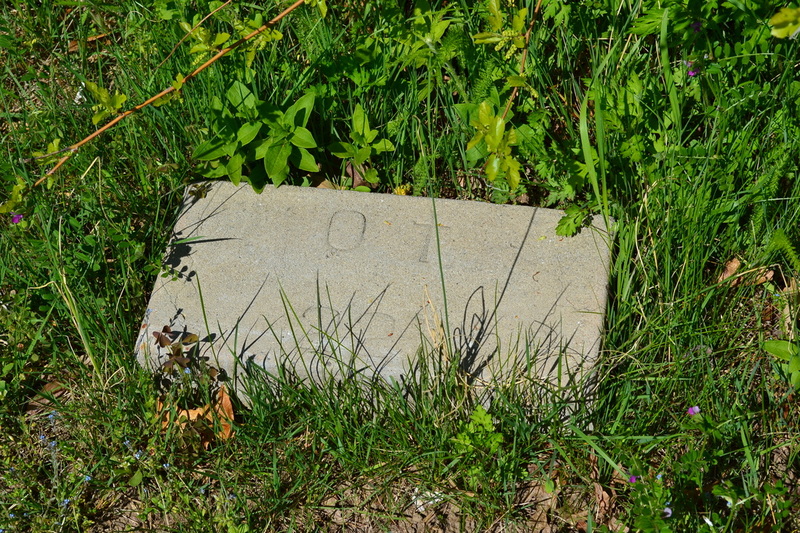 Now a less conspicuous memorial stone has taken its place. 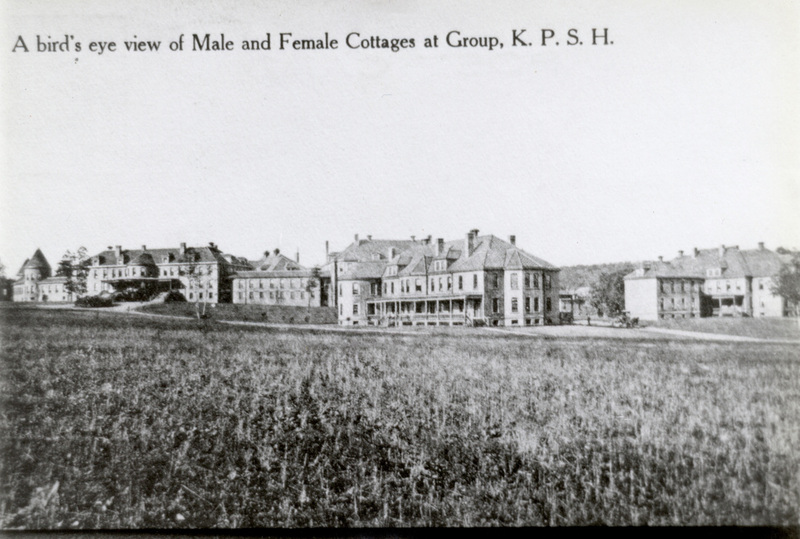 The male patients were originally housed in cottages that were built between 1887-1889 & located in the area of where Buildings 93 & 94 now stand. A few of them received new number designations, while the ones below did not. 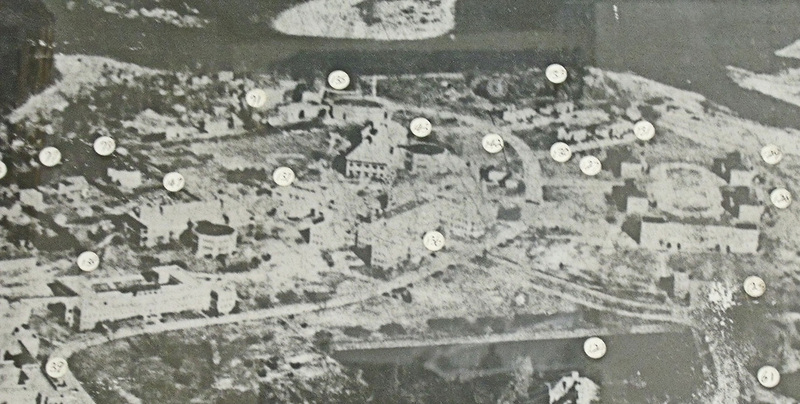 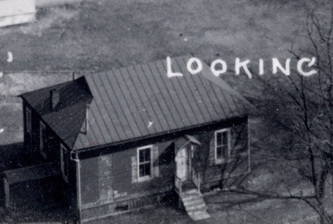 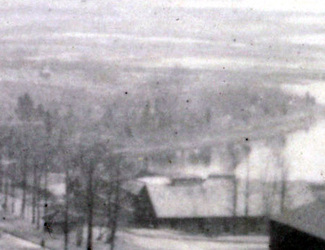 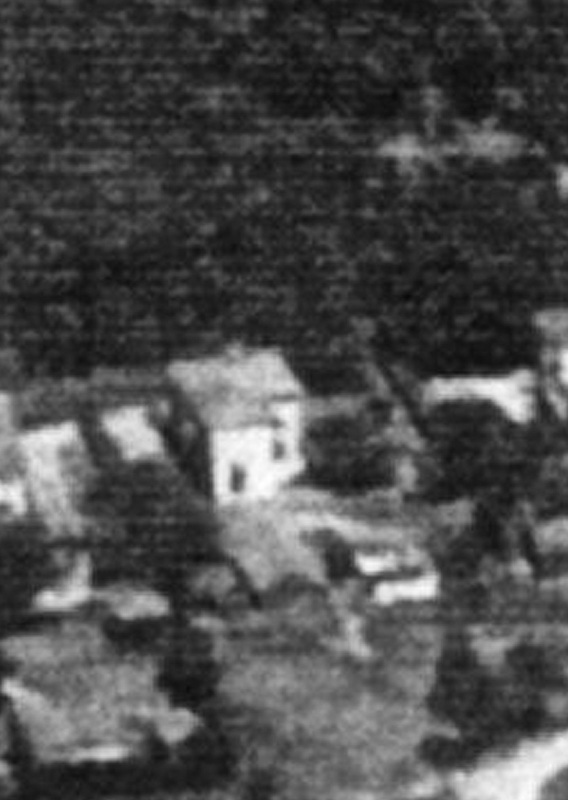 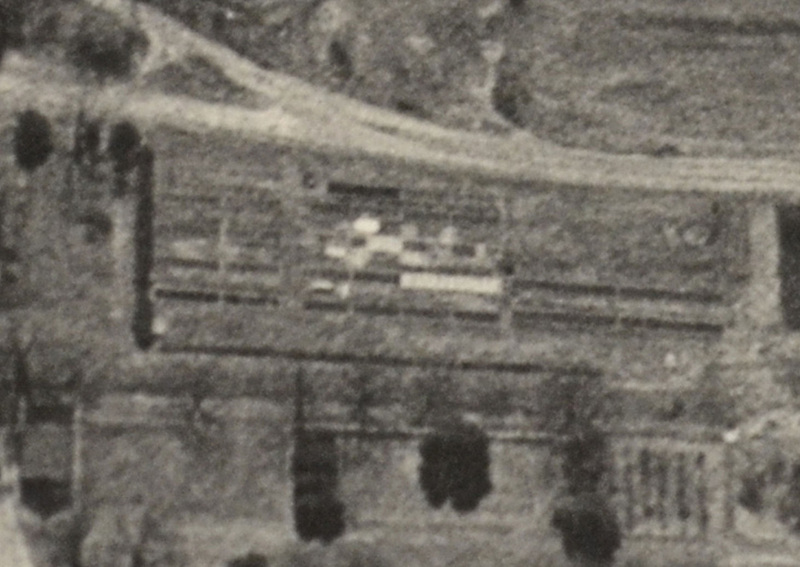 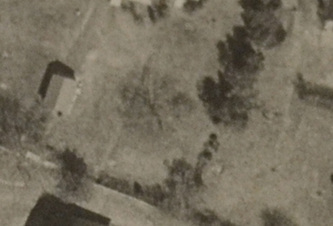 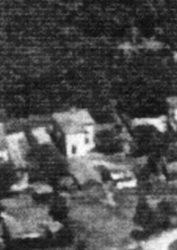 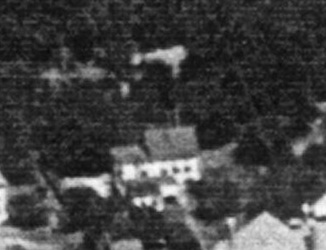 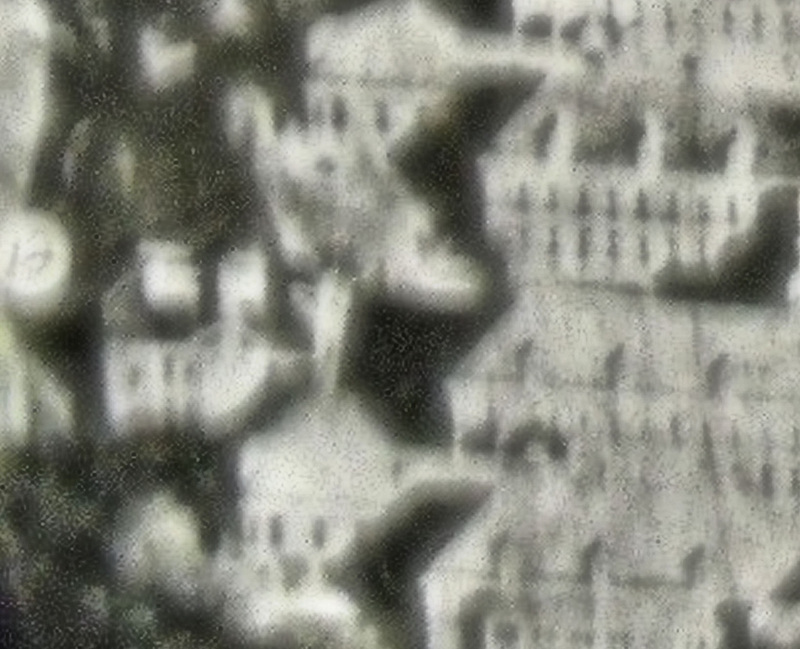 There were other structures in that area that did not have specific building numbers, which are shown below the cottages. 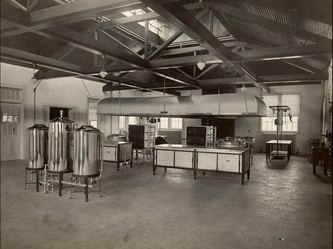 They were the original lab/morgue & the oil house. 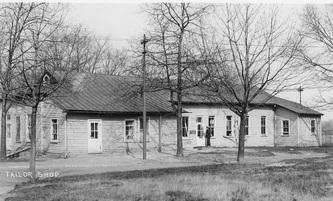 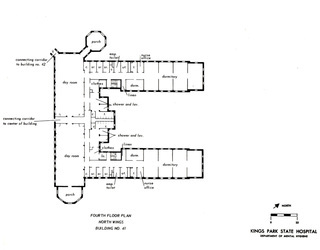 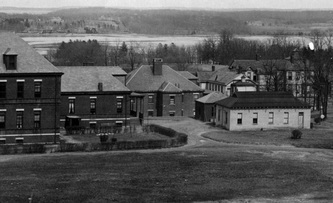 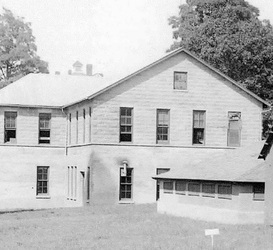 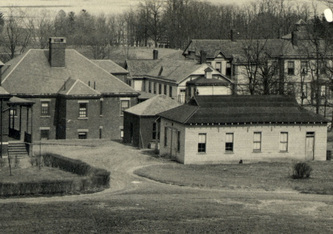 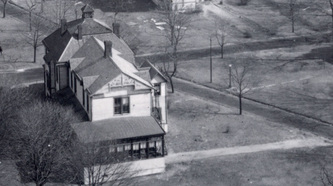 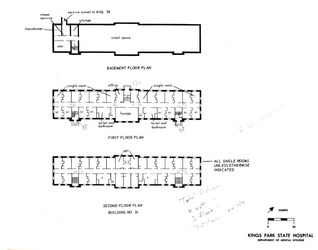 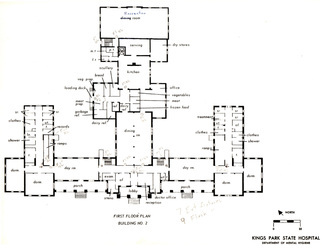 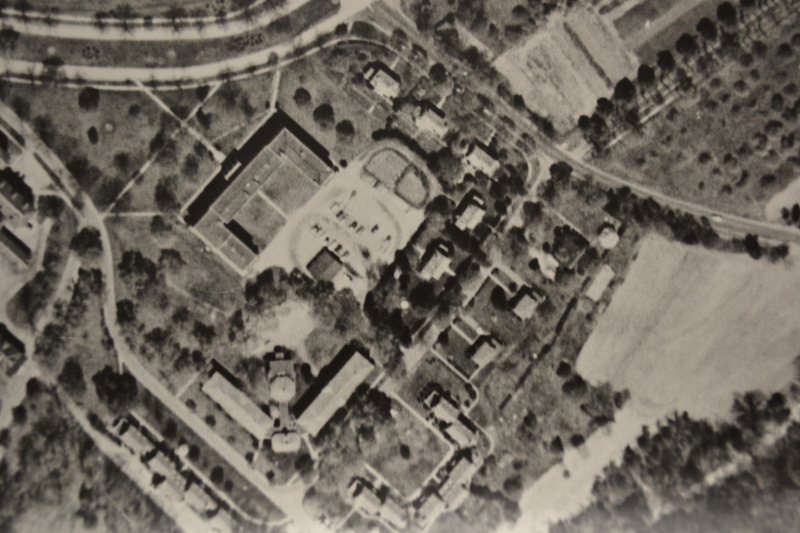 Female patients were kept in cottages located, where the doctors' cottages behind Macy Hall (Building 90) are located. 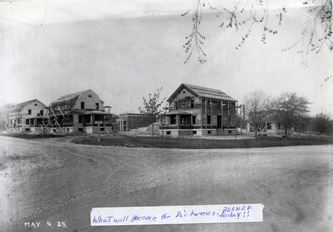 Below are some of those houses that were built from 1887-1889 that did not receive new number designations. 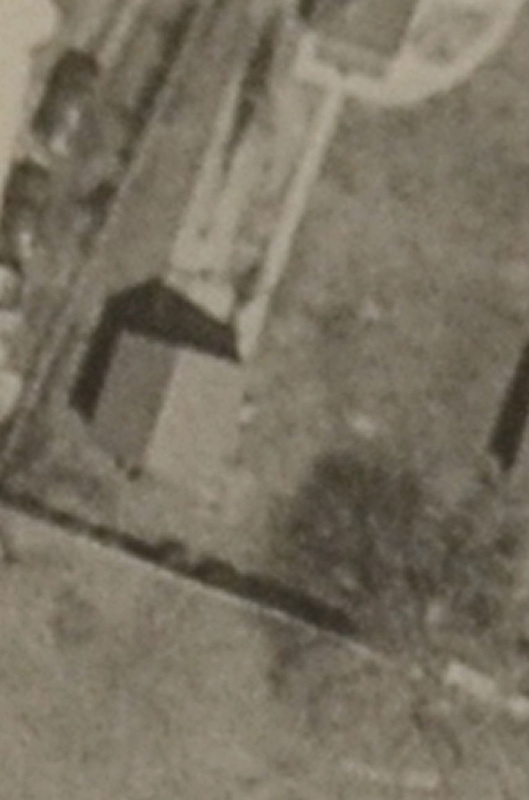 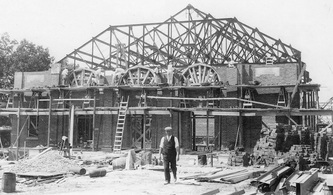 Also shown below was the assembly hall, which was on the side of the female cottages. This was one of the original cottages built between 1887-1889. 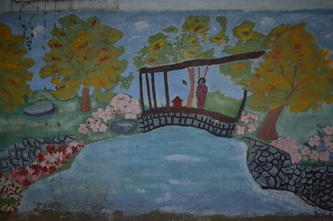 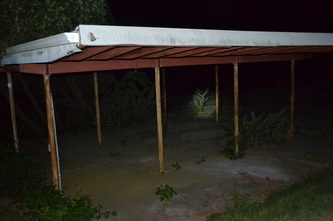 It was located near the female cottages. 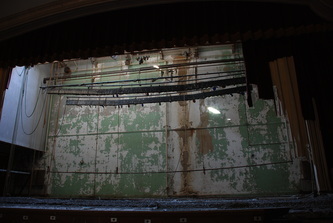 During the time of its existence it was used for shows, concerts, & as a gym. One of the original female cottages built between 1887-1889 was converted into the hospital's first Children's Ward, but it is unknown which cottage was used. 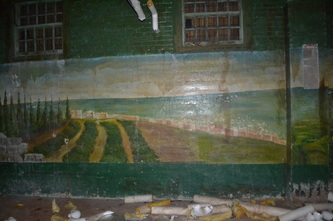 This was done in the early 1900s, after Buildings A-D were built. 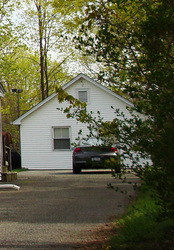 This cottage was built between 1887-1889 near the male cottages. 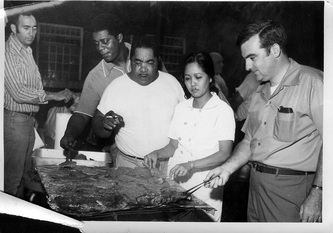 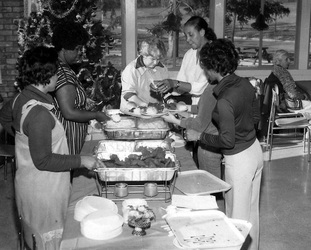 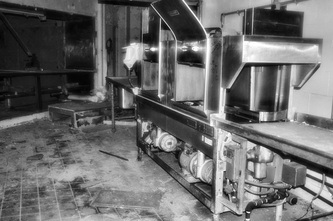 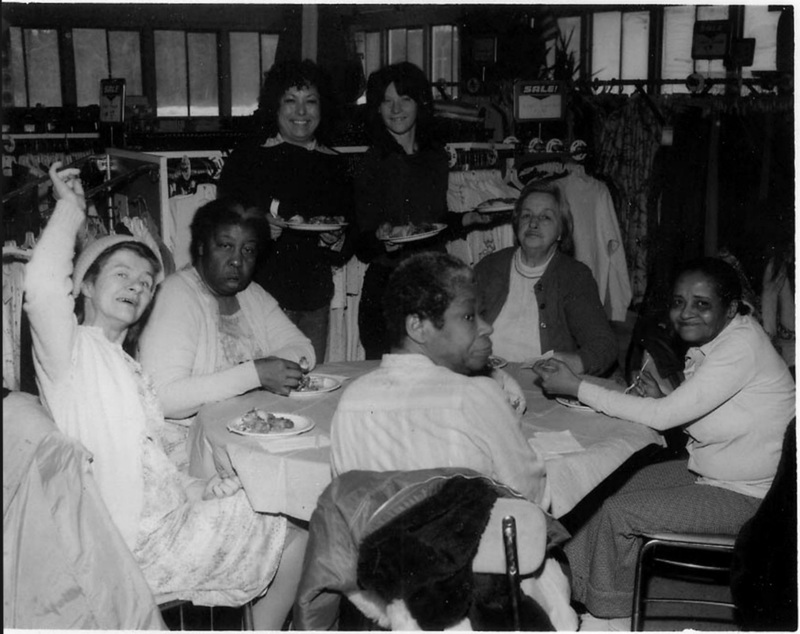 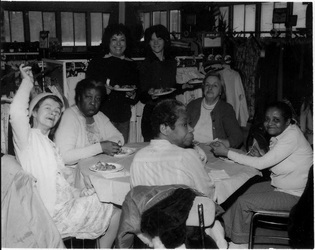 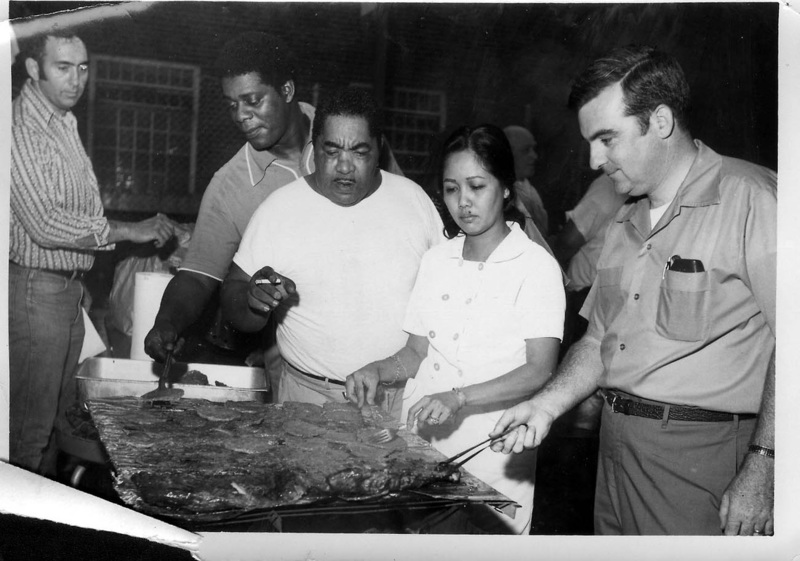 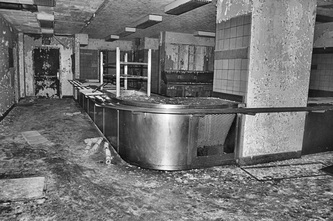 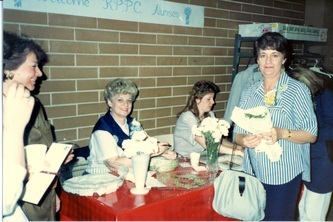 Food was cooked & served here in the early days of the hospital. 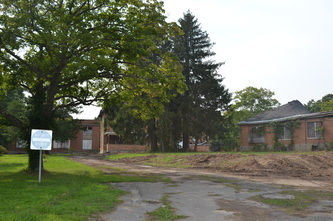 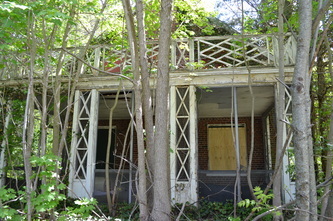 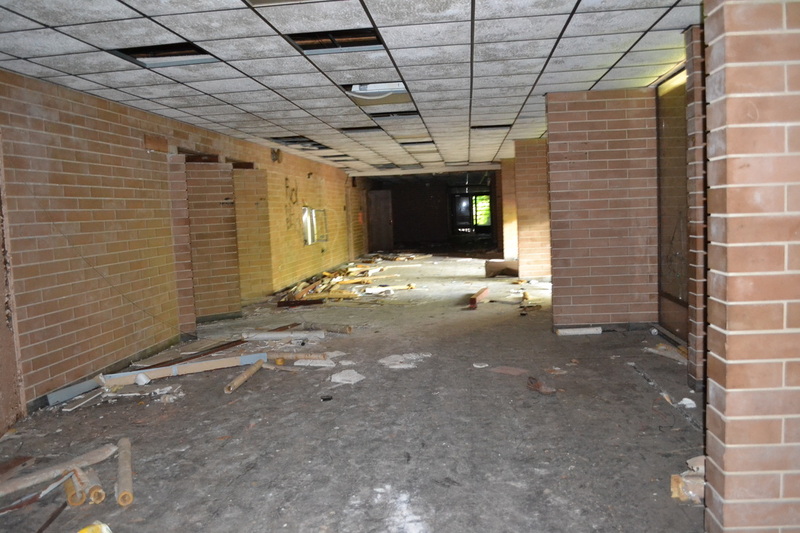 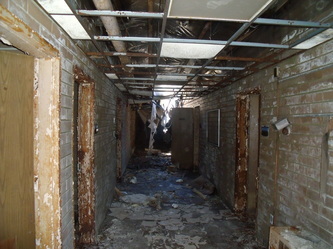 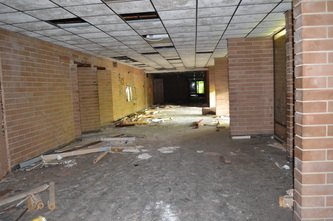 This was the male intake building and the very last active building to house patients. 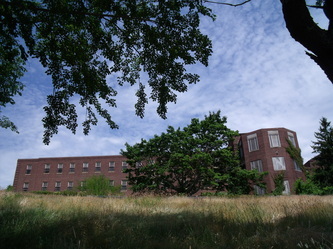 Built on the main boulevard between 1931-1934, it was the last active building to remain of Group 5. 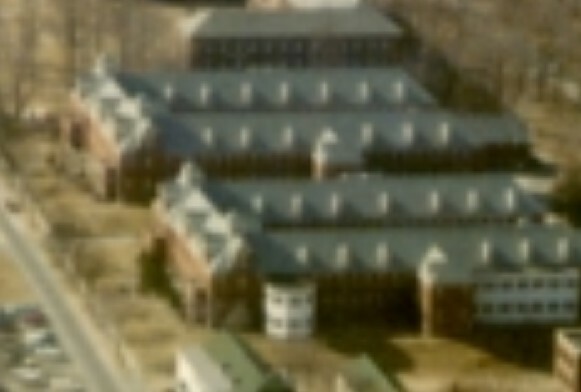 Wards 93-100 were located here. 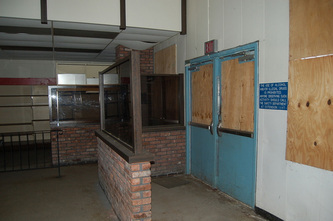 It finally closed down in November of 2012. 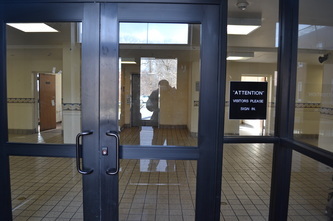 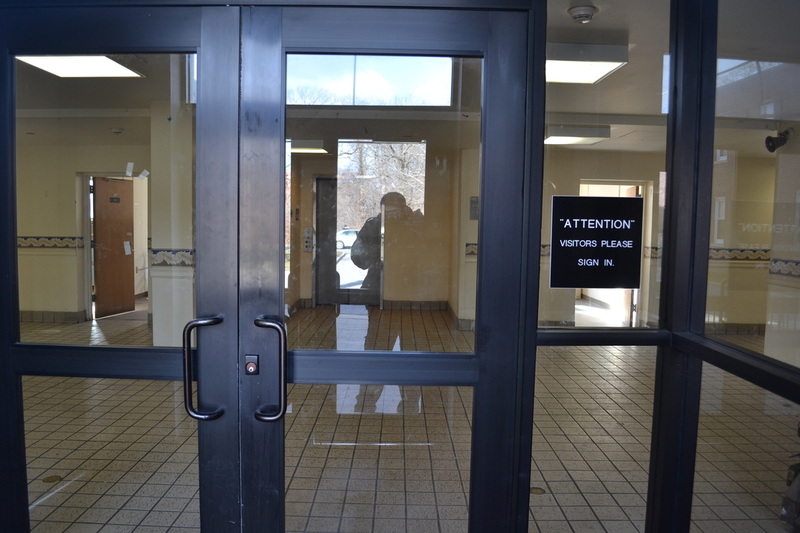 There are close circuit security cameras located inside & outside of the building. 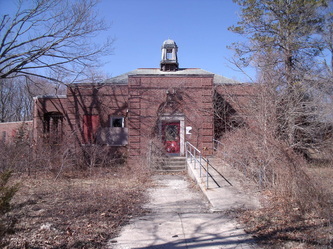 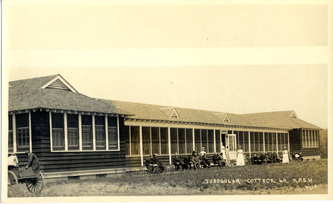 This was the female intake building, which was built in 1919. 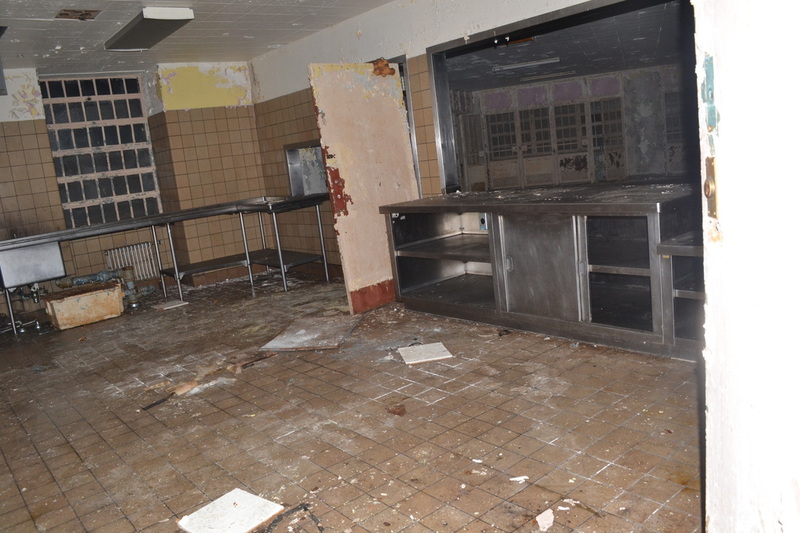 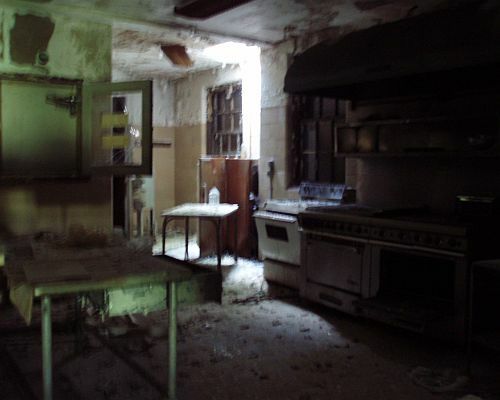 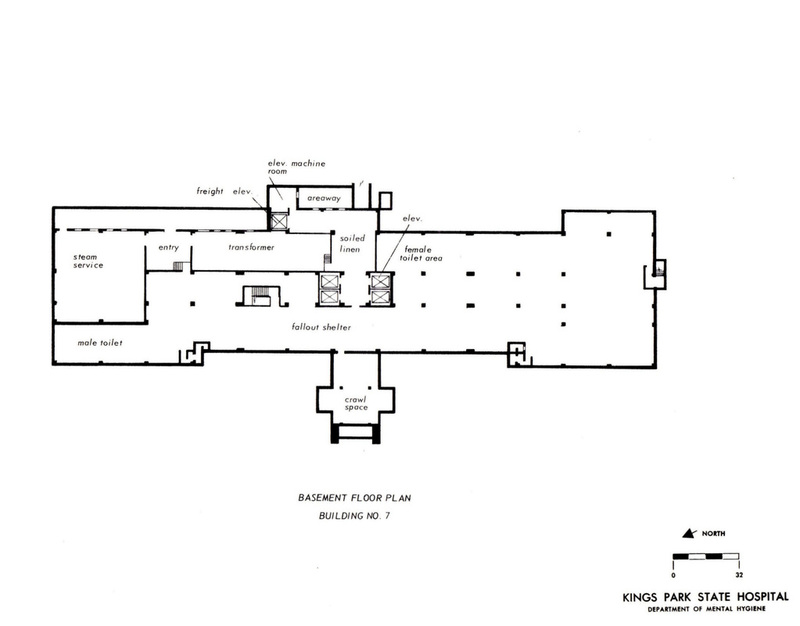 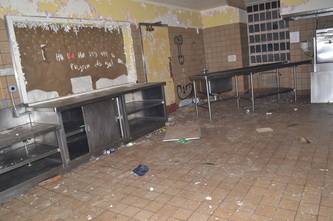 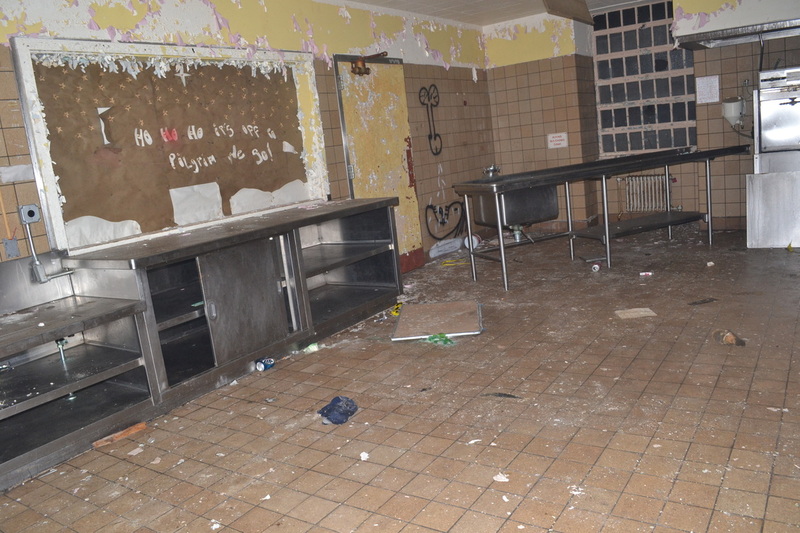 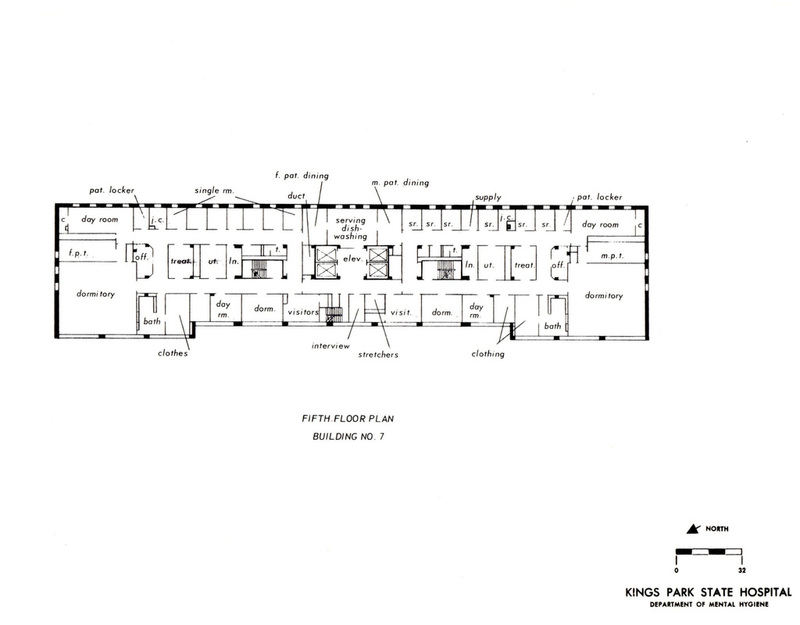 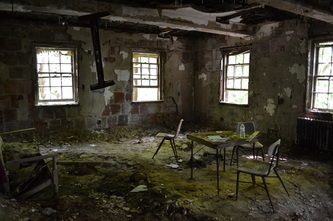 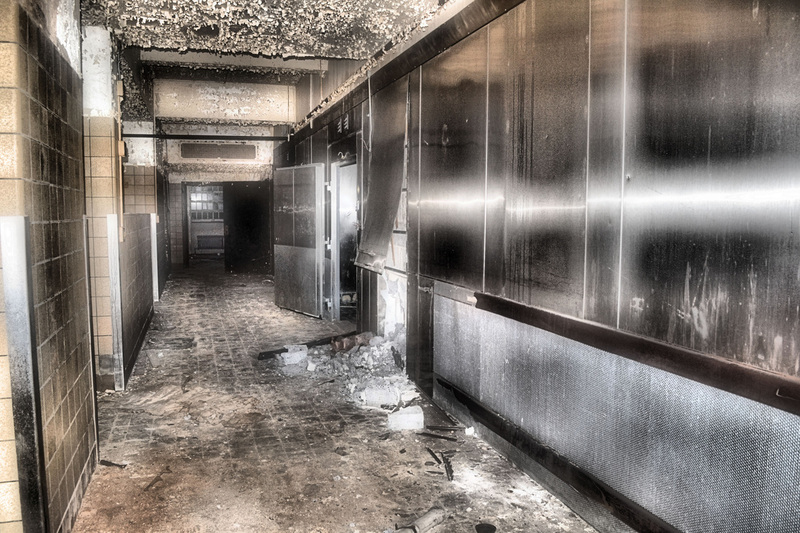 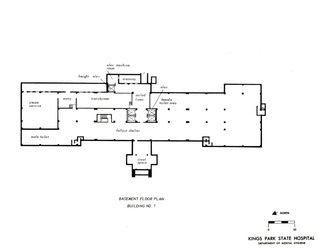 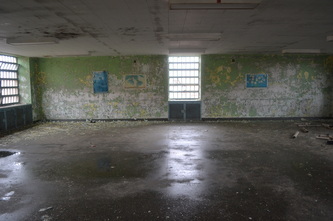 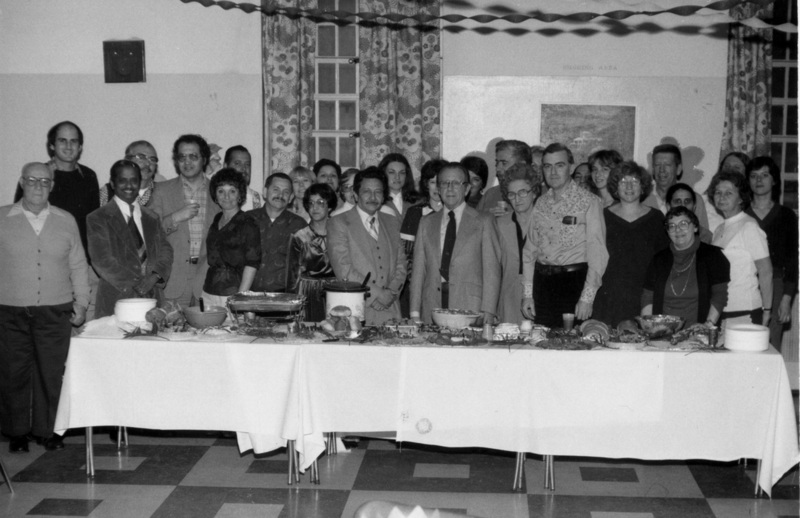 It housed wards 66-71 & was also the kitchen & dining hall for Group 5. 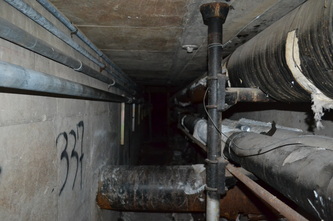 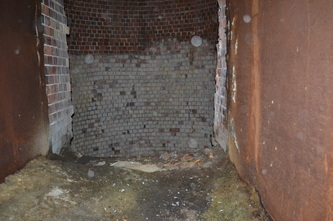 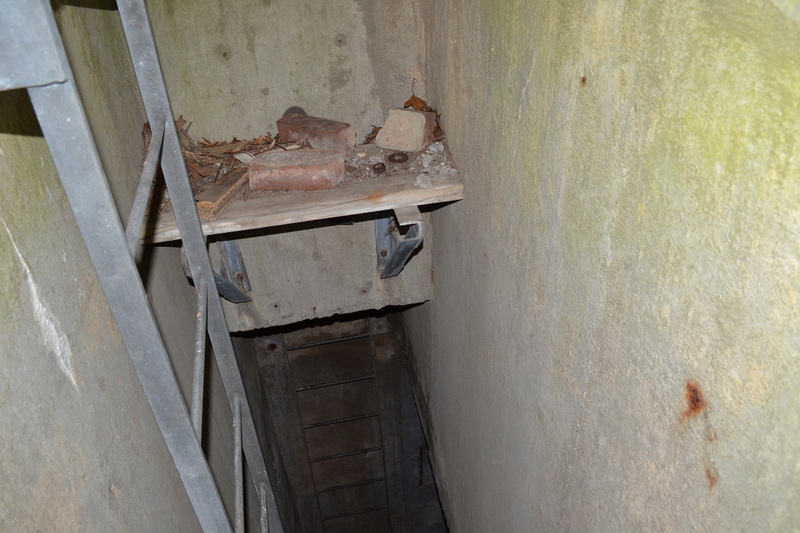 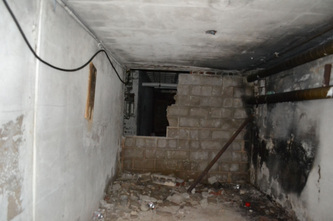 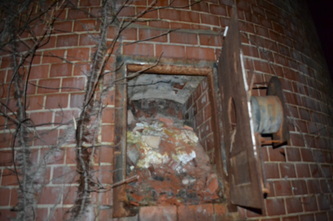 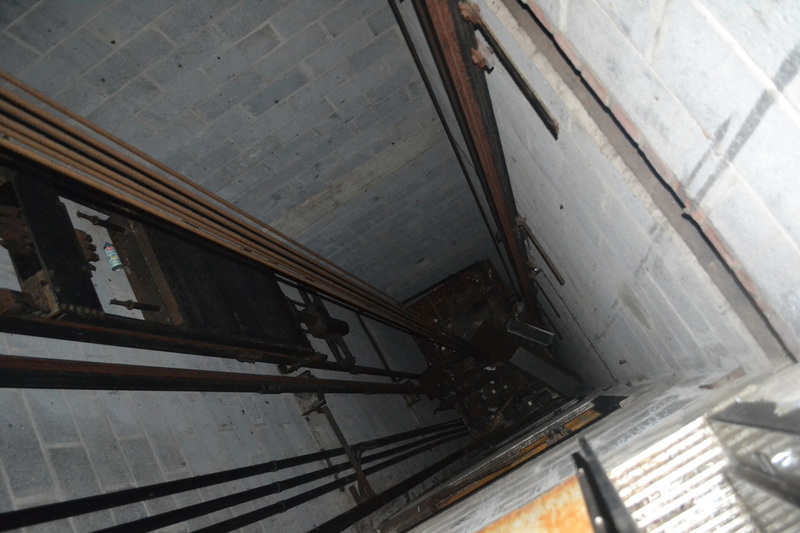 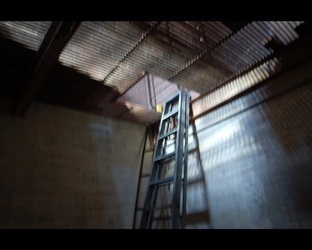 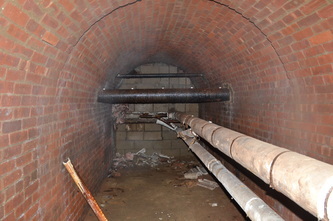 It was located behind Building 1 & connected to it via a tunnel that ran underground. After it was abandoned it was used for fire practice, as seen in the photos below. 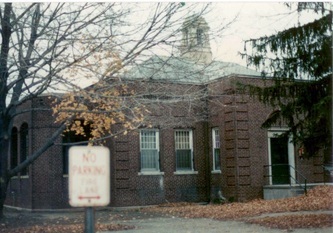 It was demolished between 1984-1986. 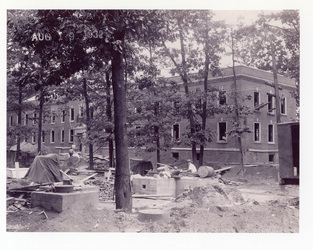 Home to student nurses, this building was built between 1931-1934 to be an administration building for Group 5. 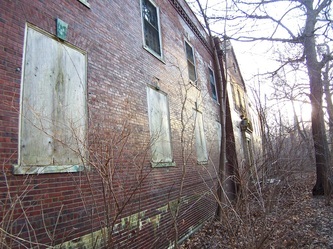 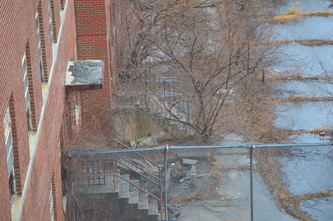 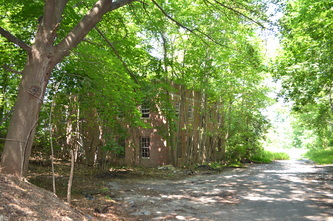 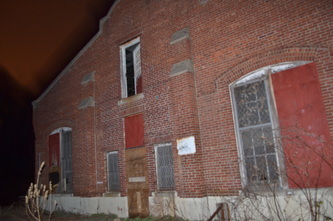 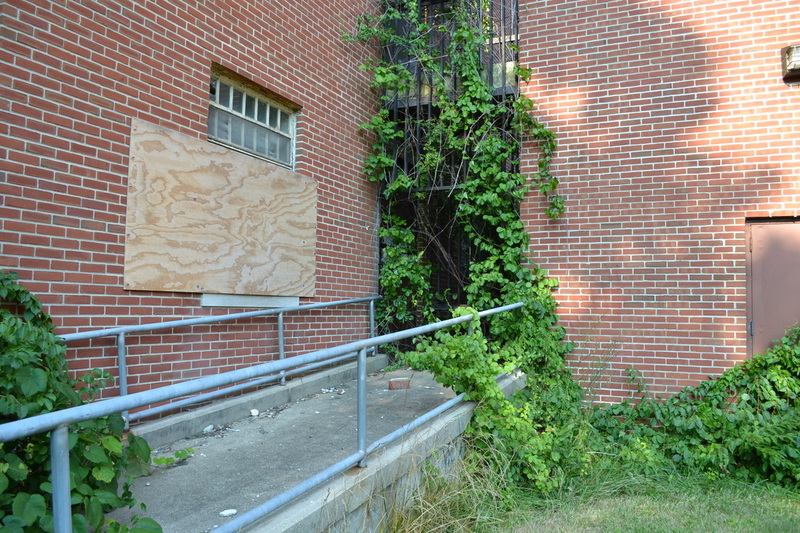 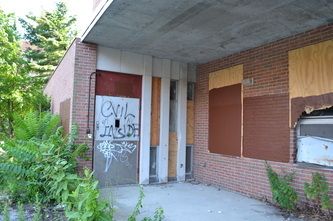 Located across from Building 1, it is now abandoned. 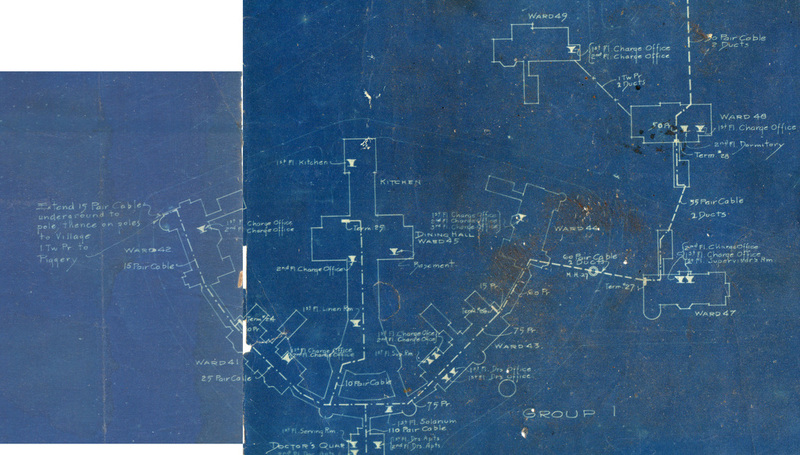 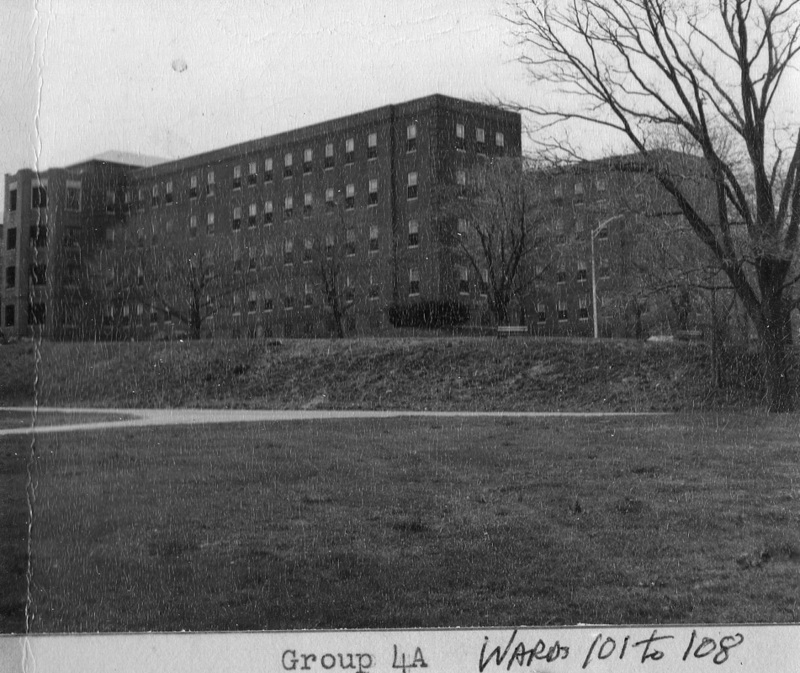 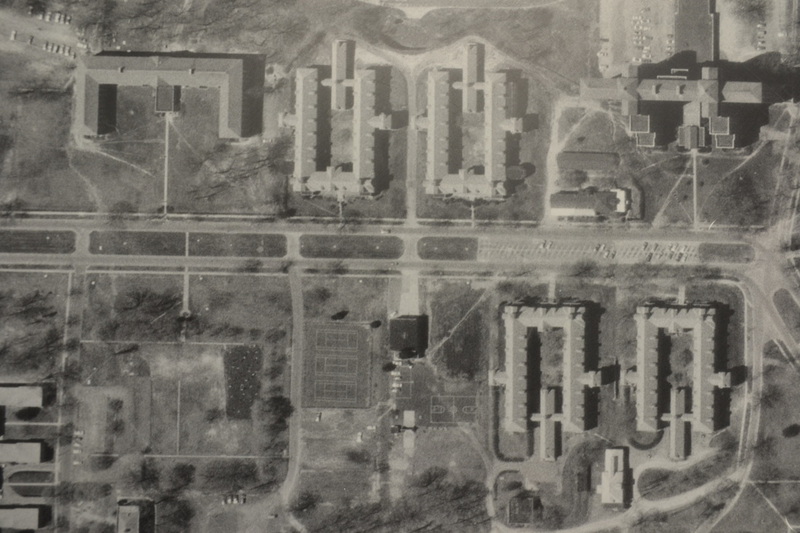 Building 4 was actually the 10 buildings of Group 1, which were home to wards 41-49. 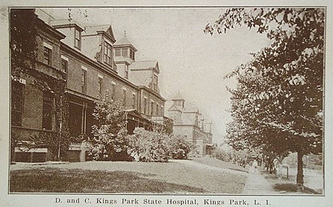 They were built along the main boulevard in 1898 & abandoned by the 1960s. Most of the buildings were connected to each other with the exception of three buildings. 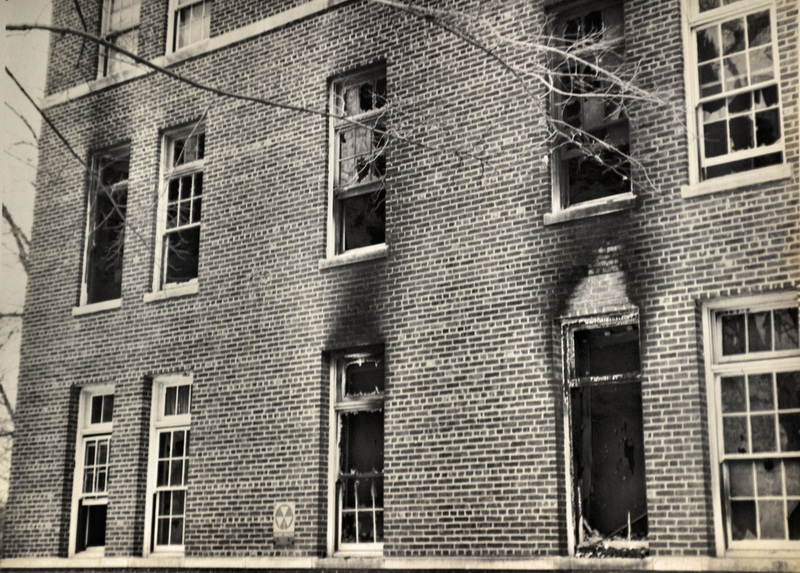 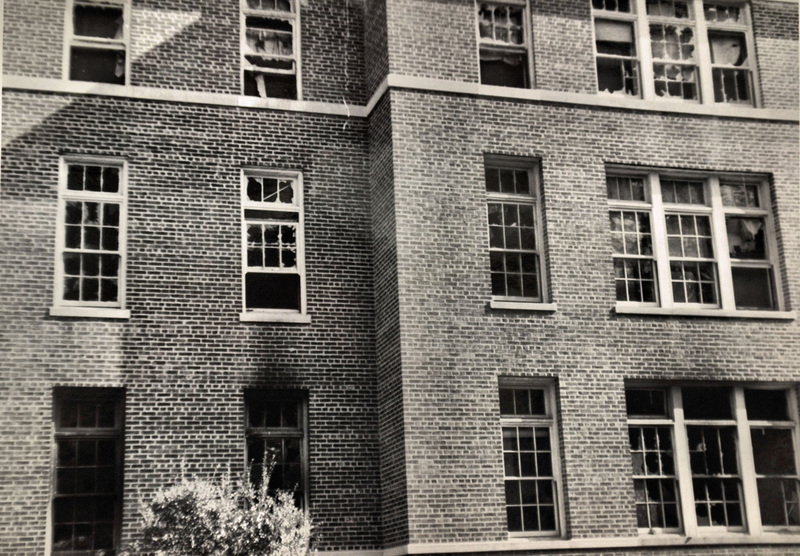 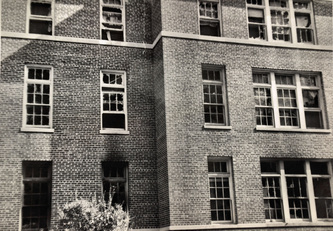 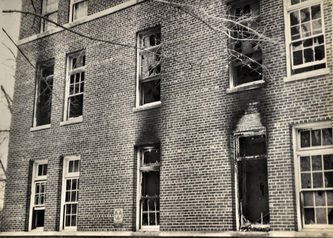 The group was demolished during the 1970s, after already being badly damaged by fire in 1972. 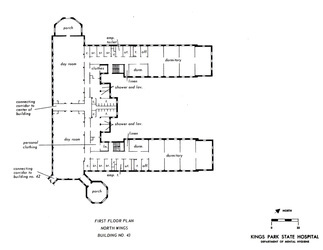 Also see Buildings 111-120. 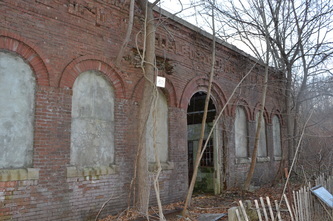 This was originally the laundry building & it was built between 1909-1910. 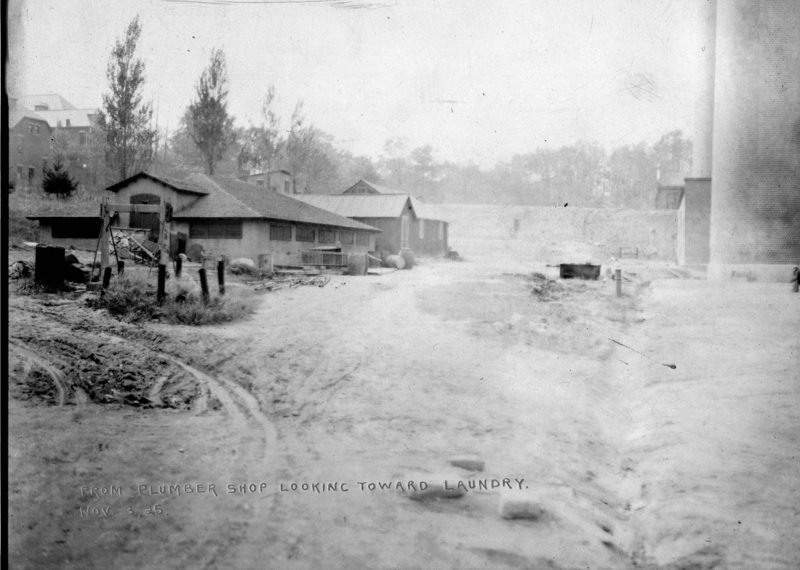 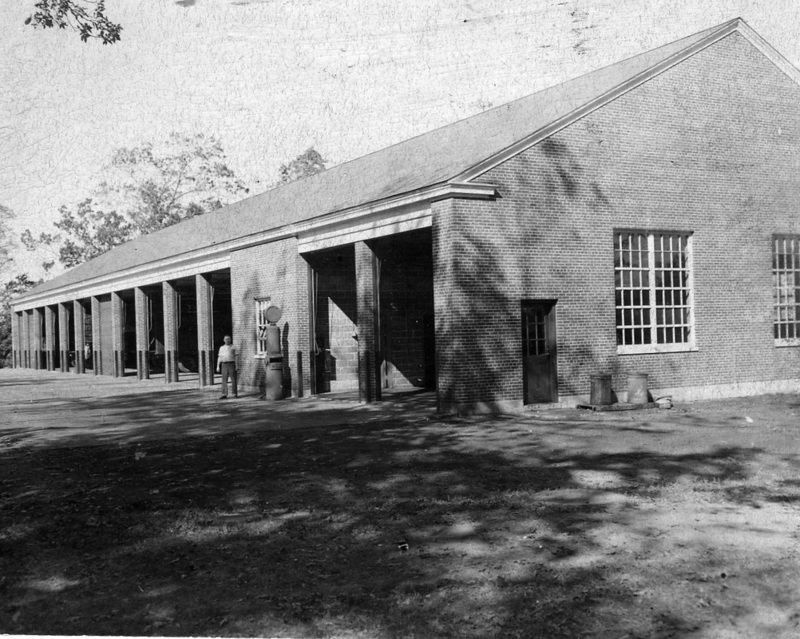 It was eventually replaced by a larger laundry building & later became the lock shop. 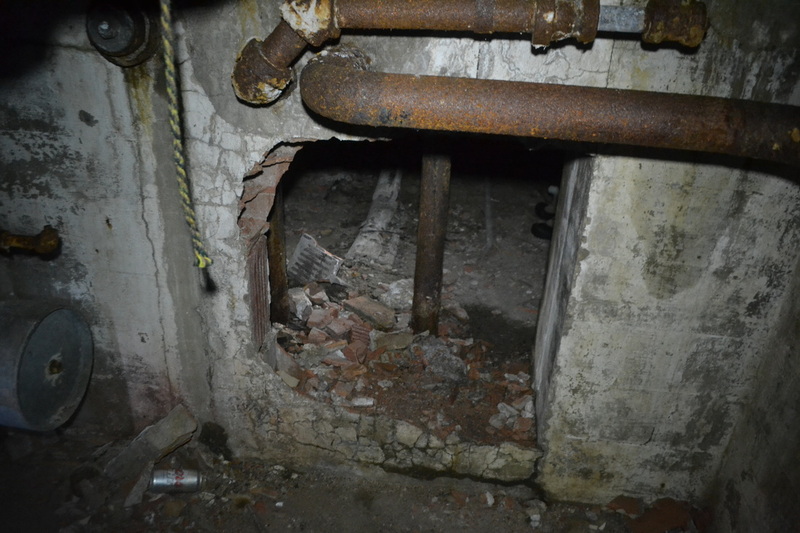 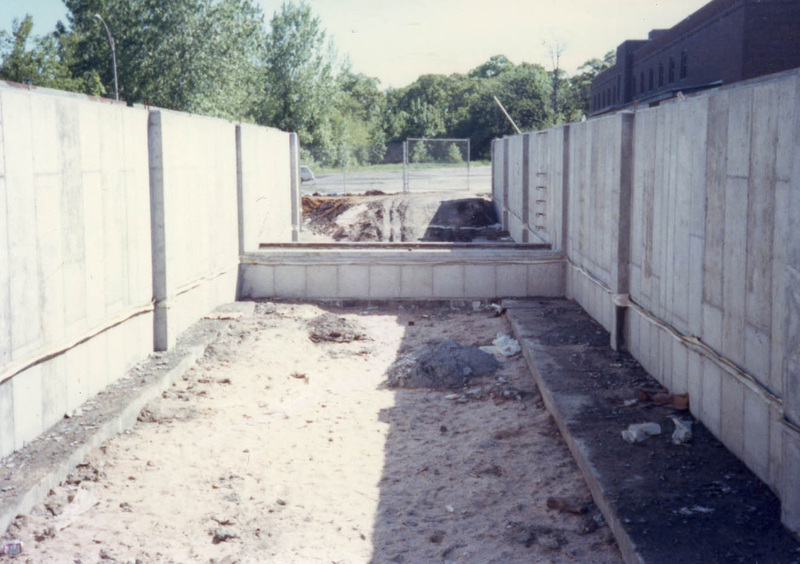 An underground tunnel once linked it to the former site of Building 6, which was the steam pipe junction house. 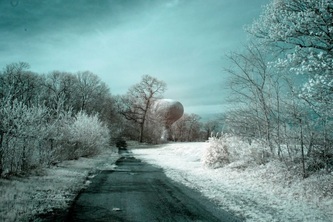 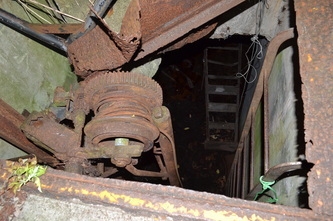 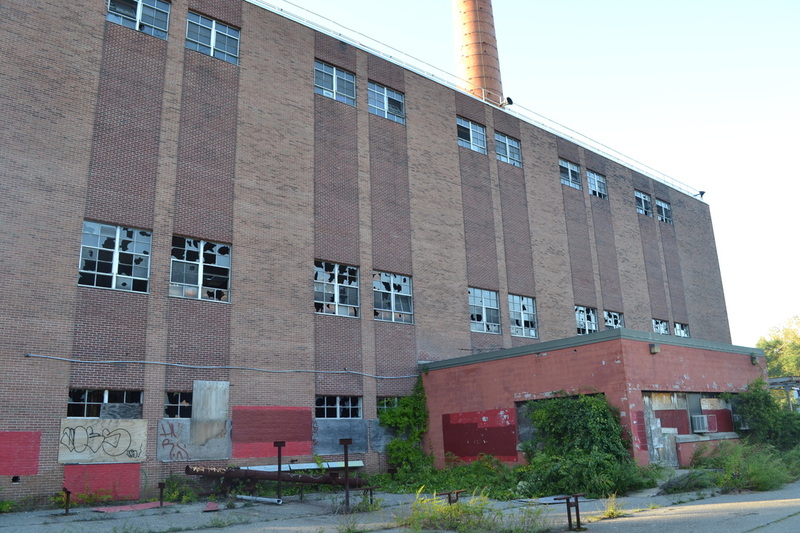 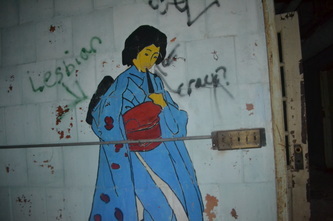 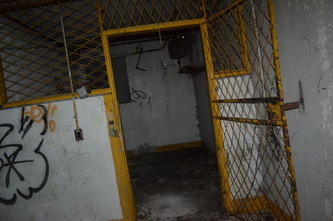 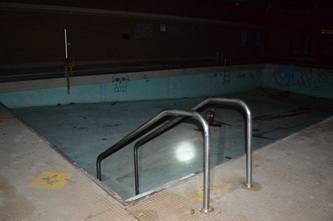 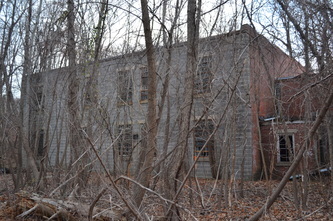 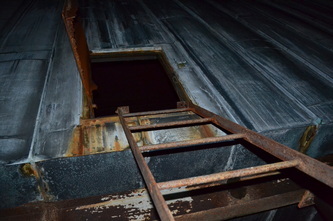 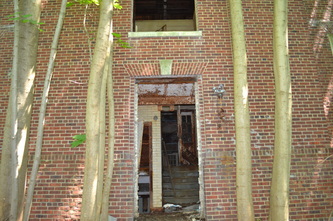 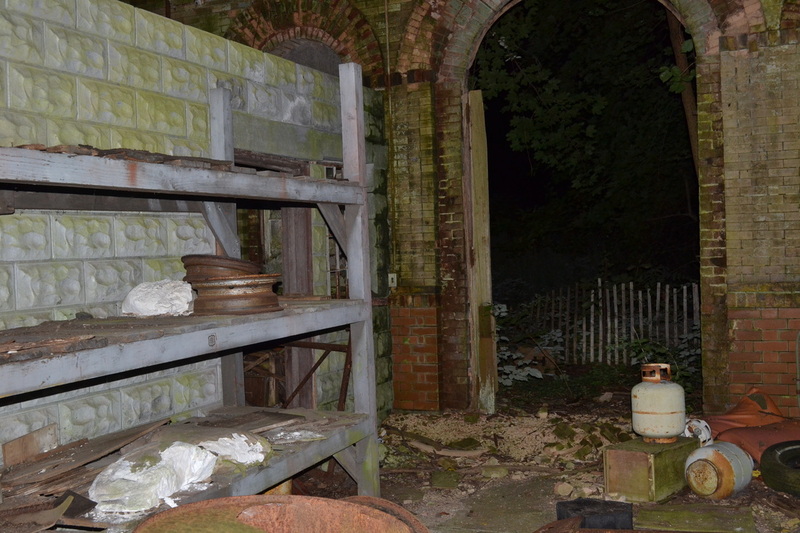 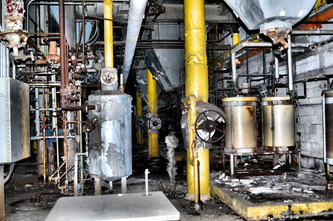 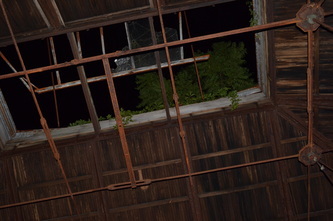 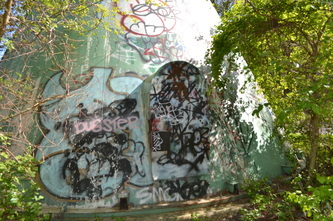 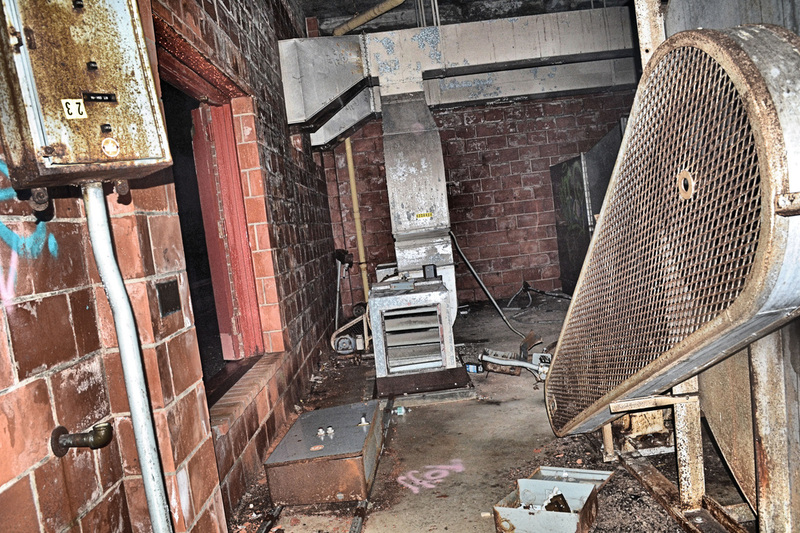 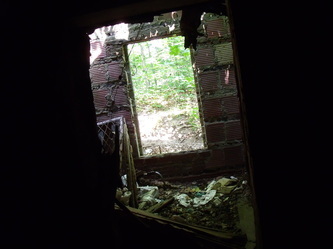 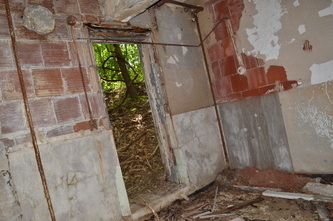 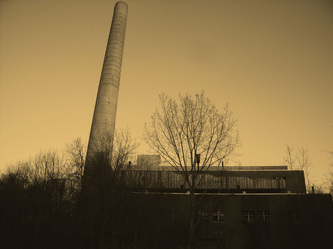 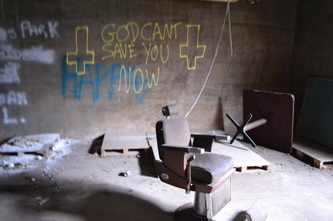 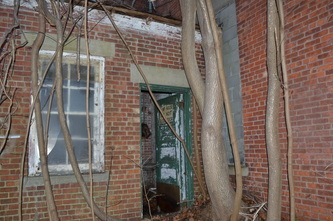 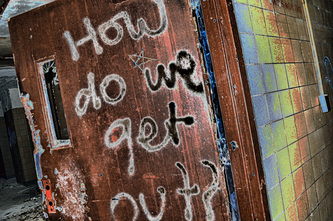 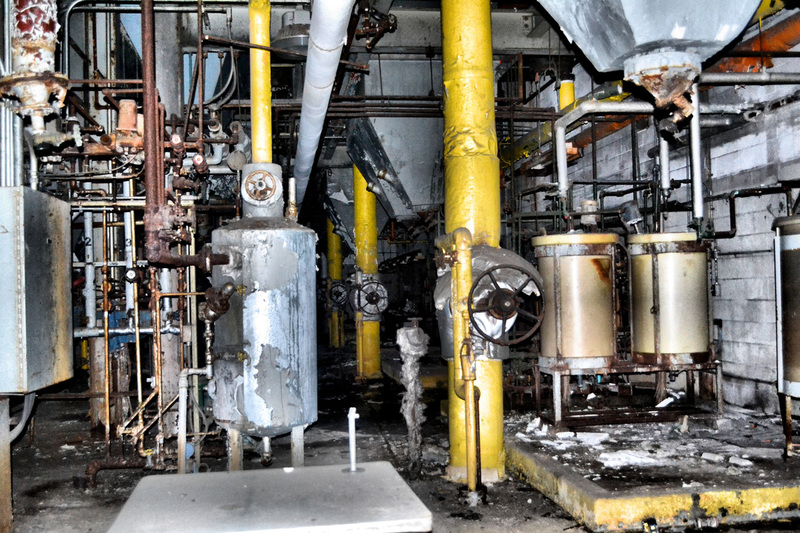 It is located next to the power plant & is currently abandoned. The second power plant was built between 1908-1910 right next to where the current abandoned power plant stands. 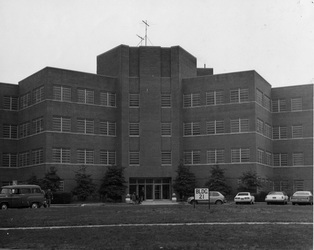 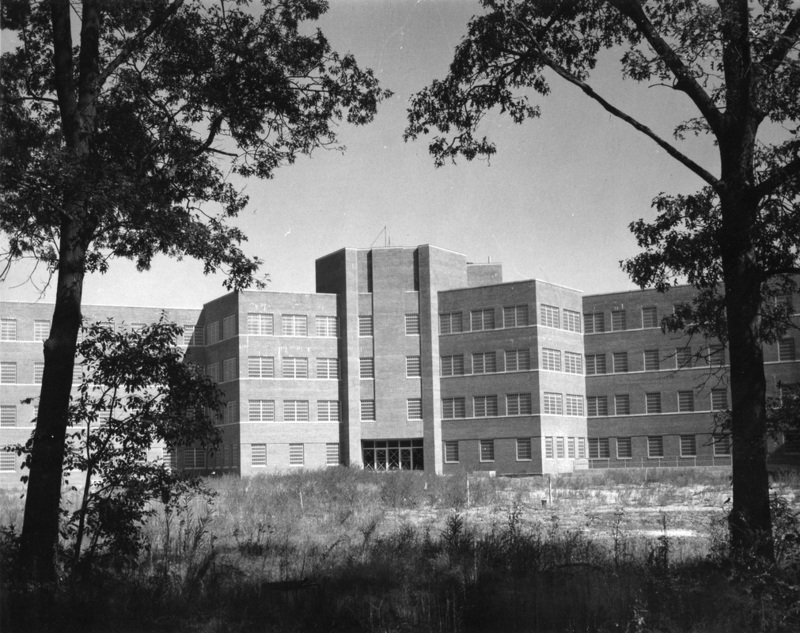 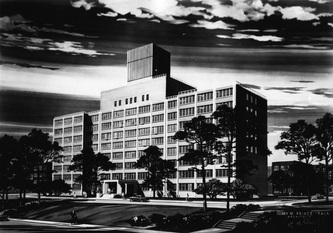 It had replaced Building 59, until it was demolished in 1968. 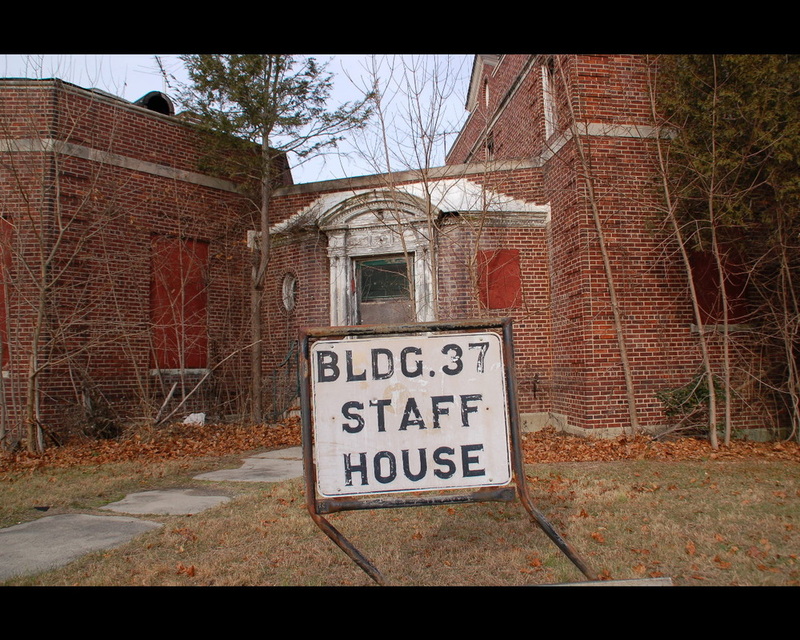 This building number was later assigned to this small steam pipe junction house in the power plant area. 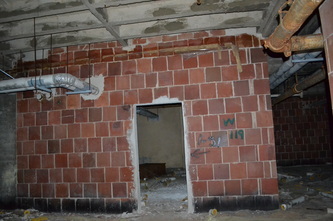 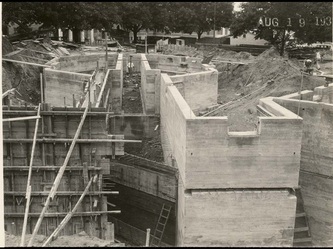 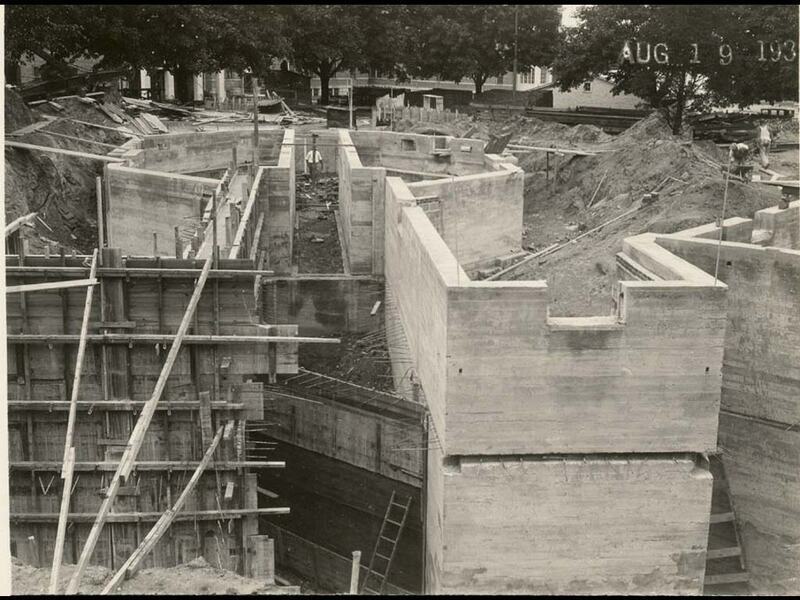 This basement structure was built in 1939 & originally known as Building 85. 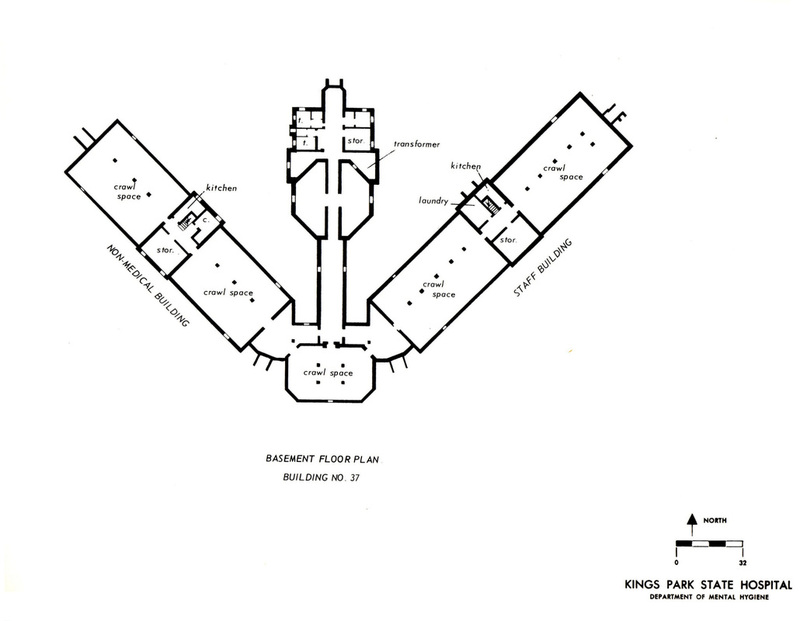 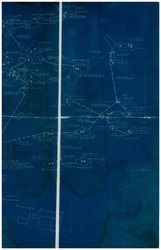 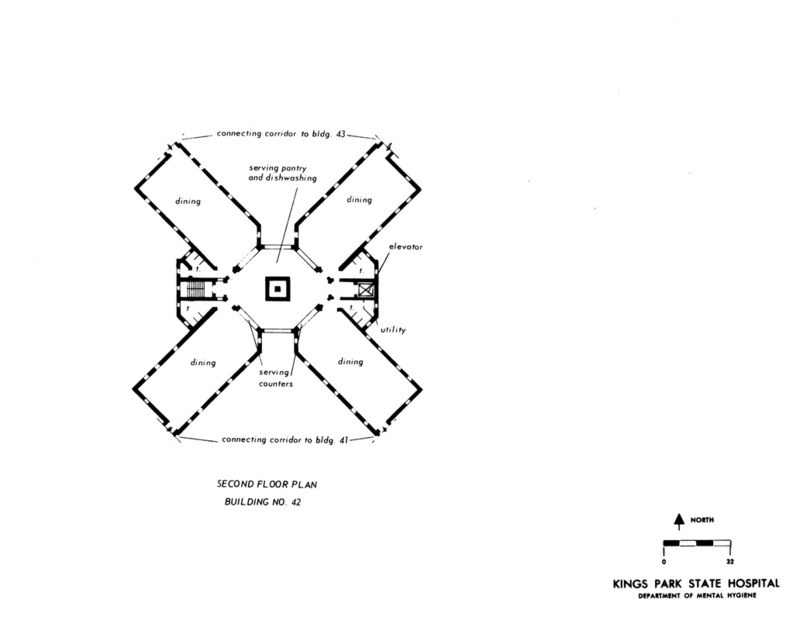 It was connected underground to Buildings 29, 5, & 93. 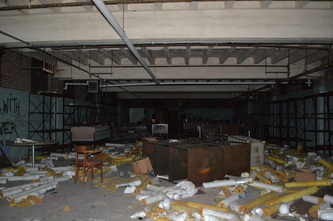 See Building 85 for additional photos. 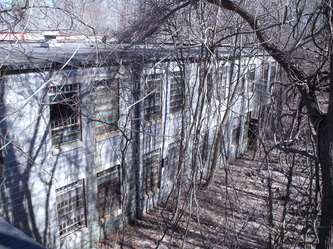 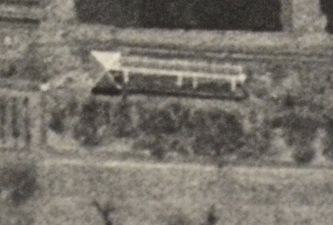 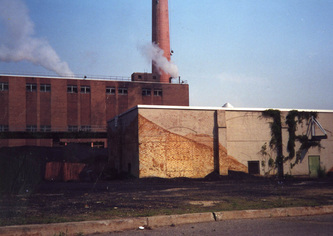 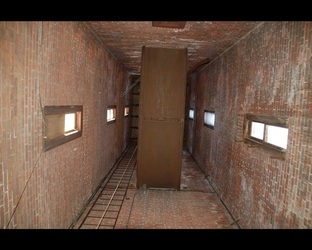 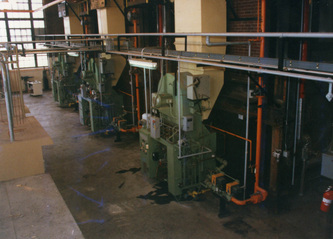 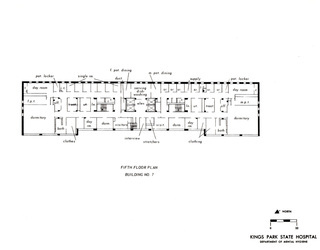 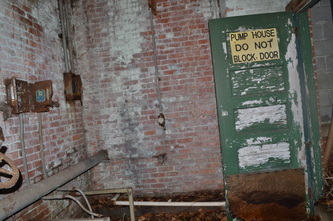 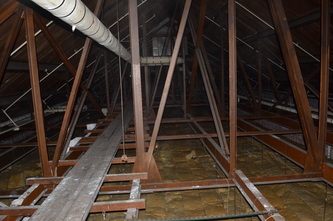 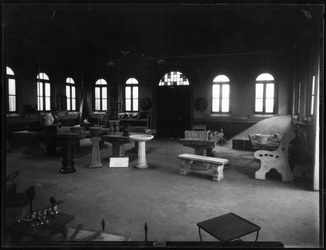 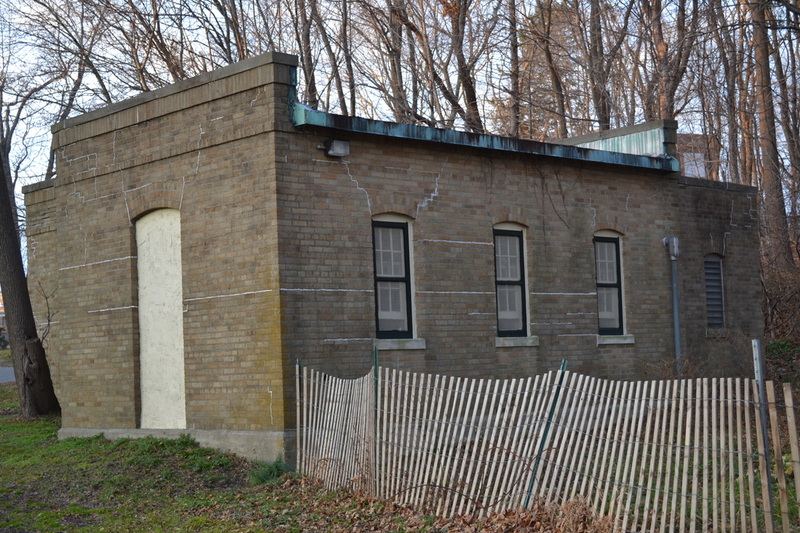 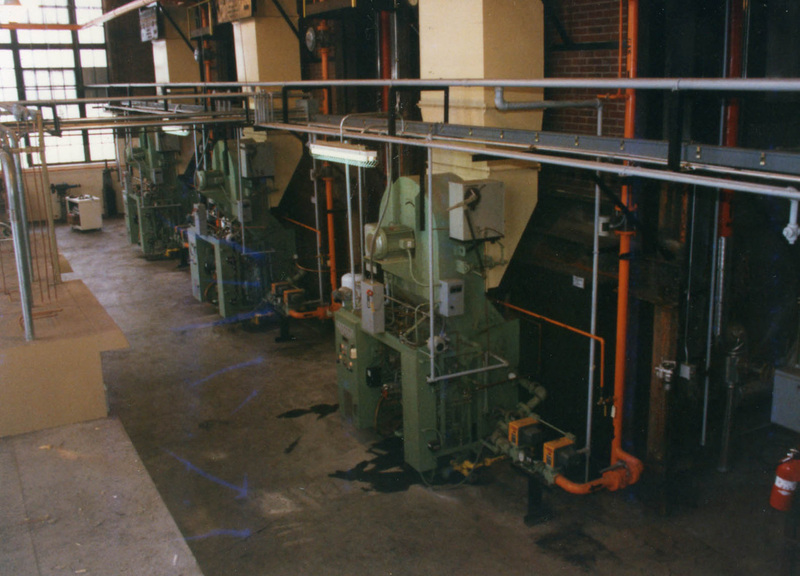 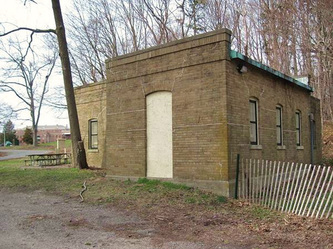 The original Building 7 was a small wooden soap house, which was located in the power plant area. 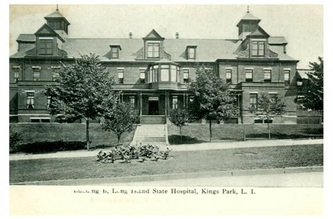 It was built in the 1890s & demolished in the 1960s. 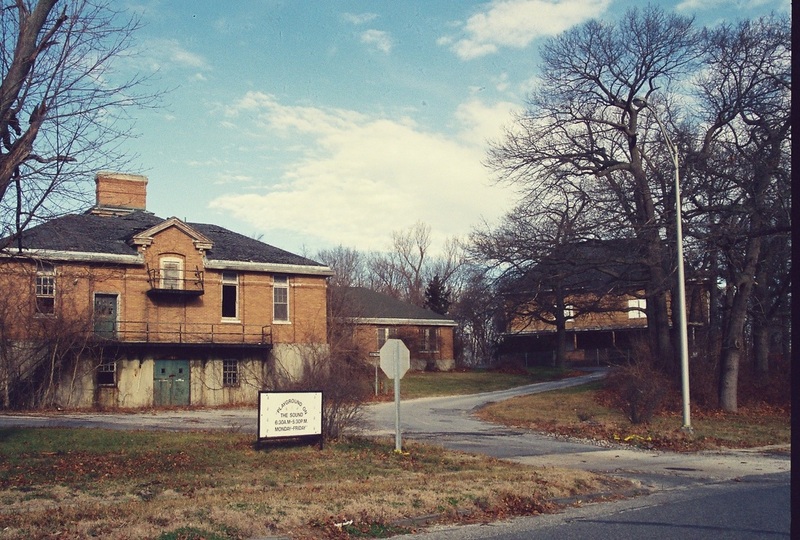 This became the last medical & surgical building to be used at the hospital. It replaced Building 136 in that capacity. 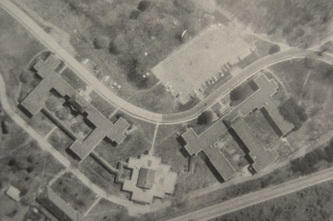 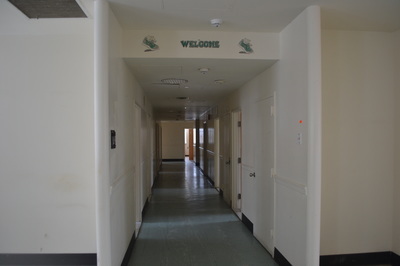 Located near the main boulevard, it was built between 1966-1967 & housed wards 229-238. 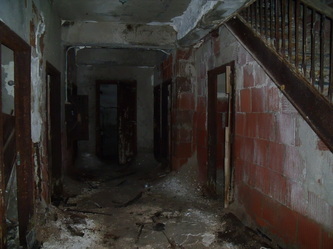 The morgue was also located here on the first floor. 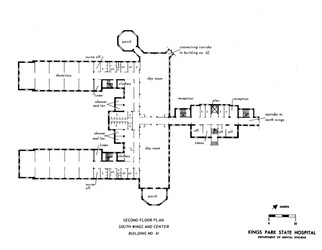 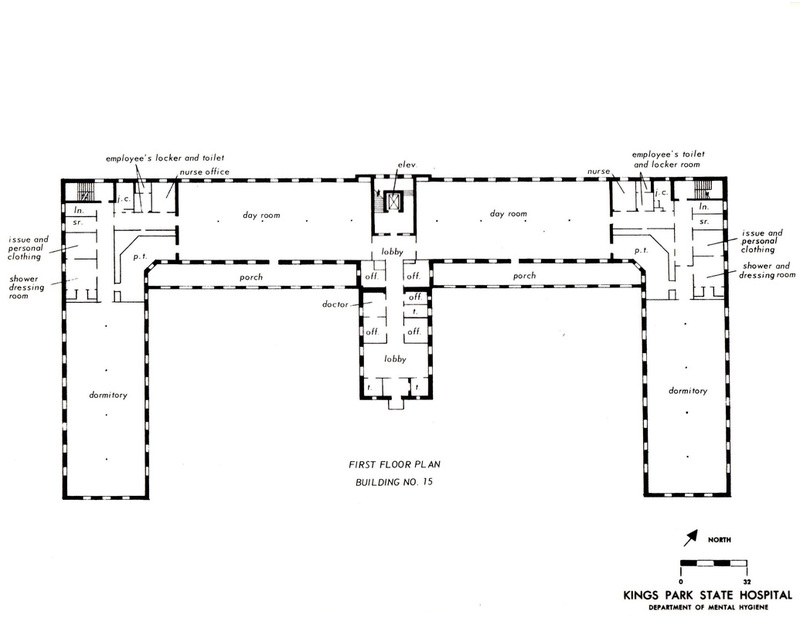 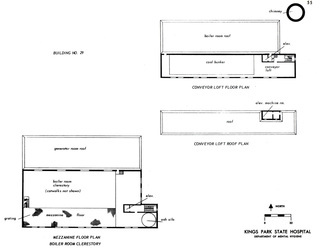 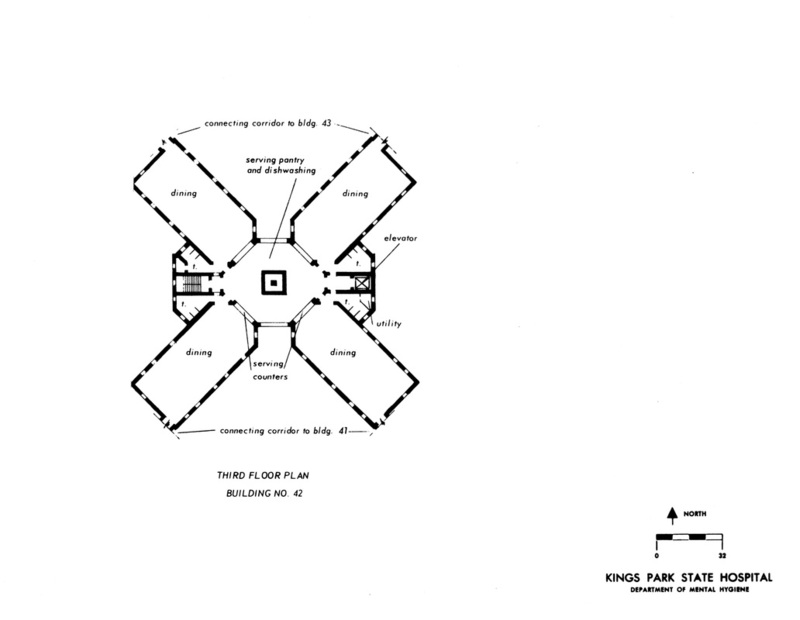 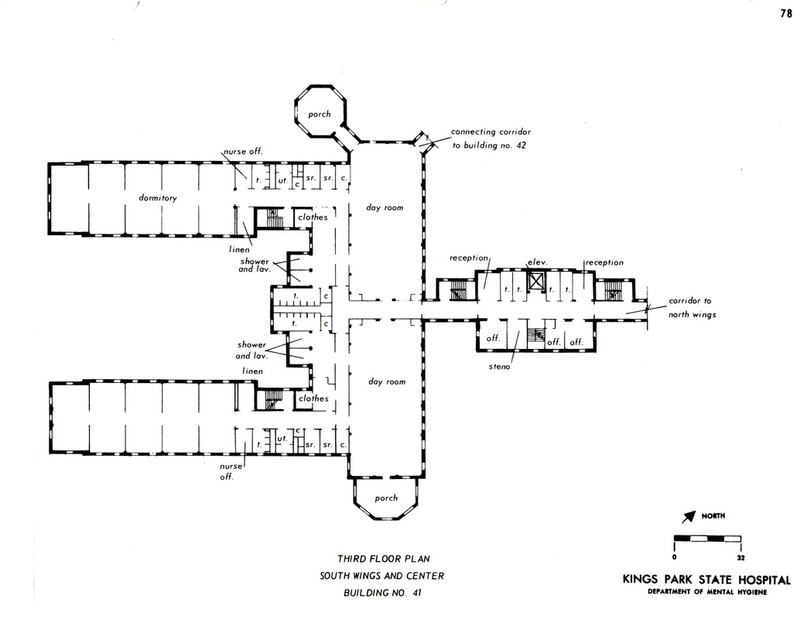 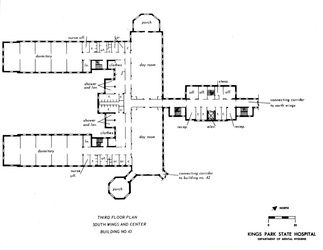 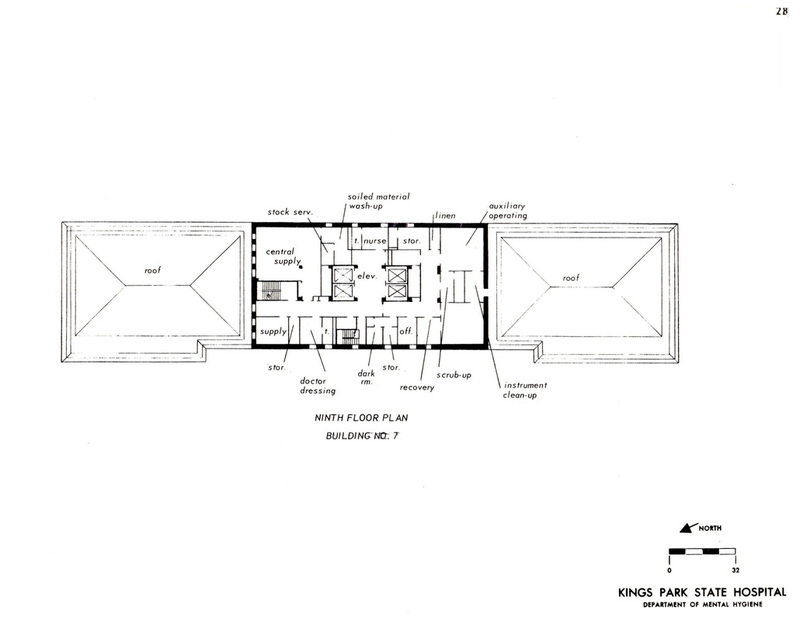 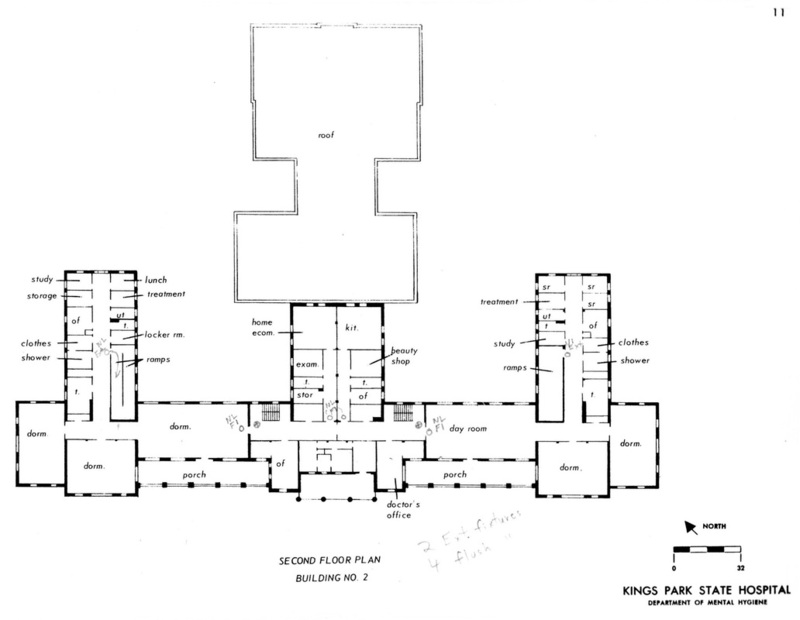 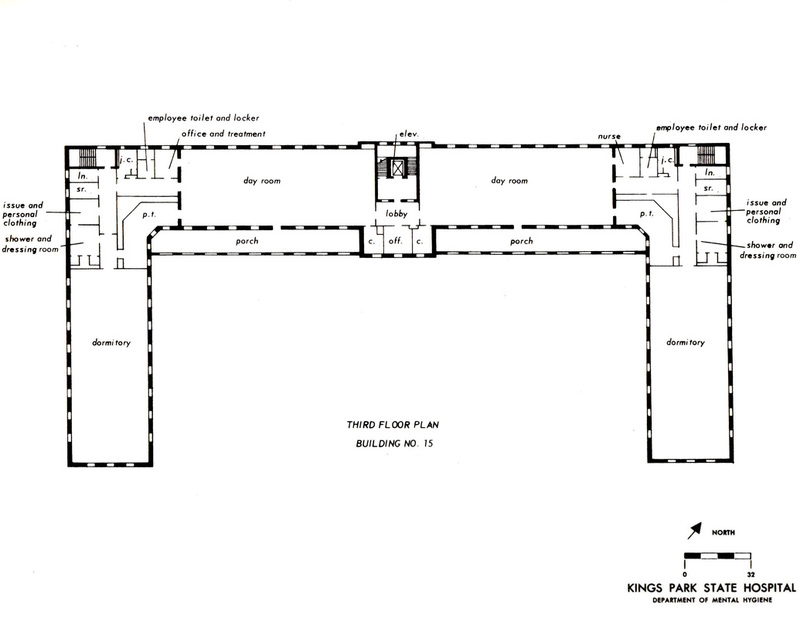 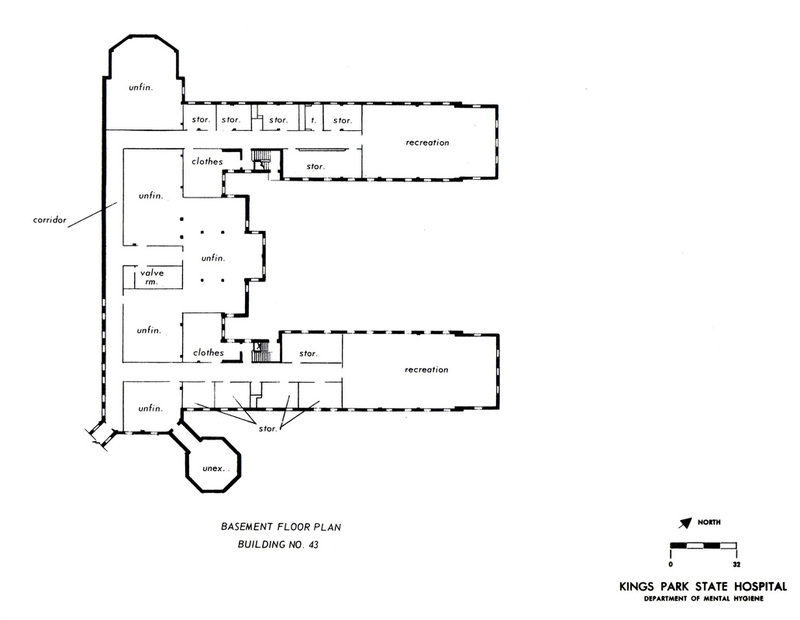 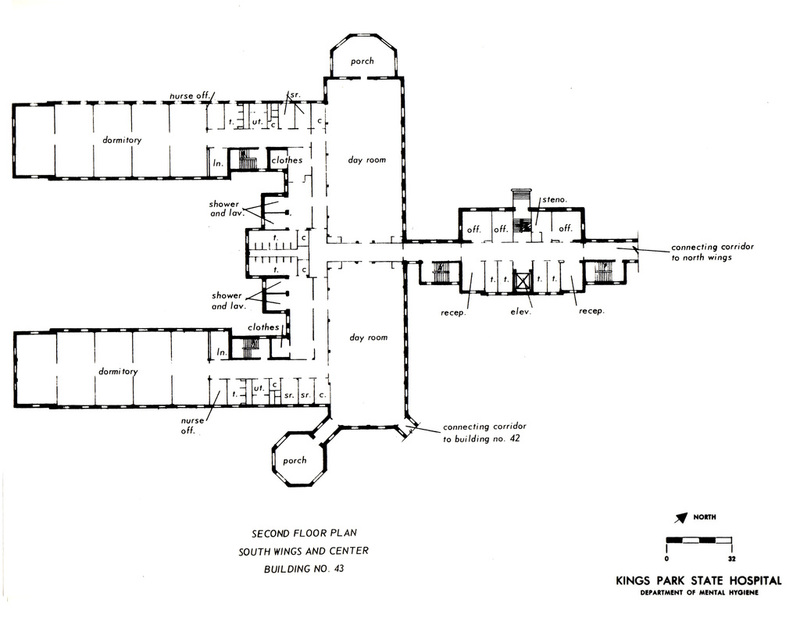 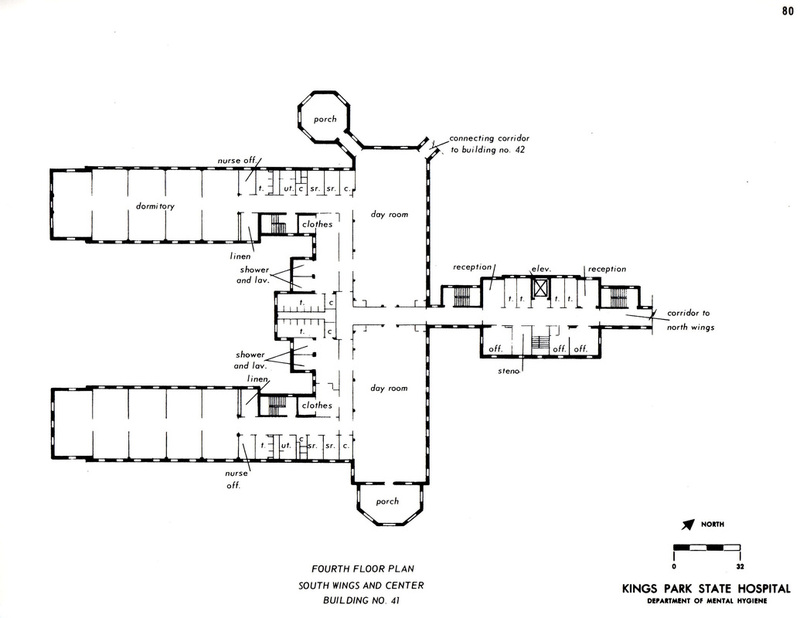 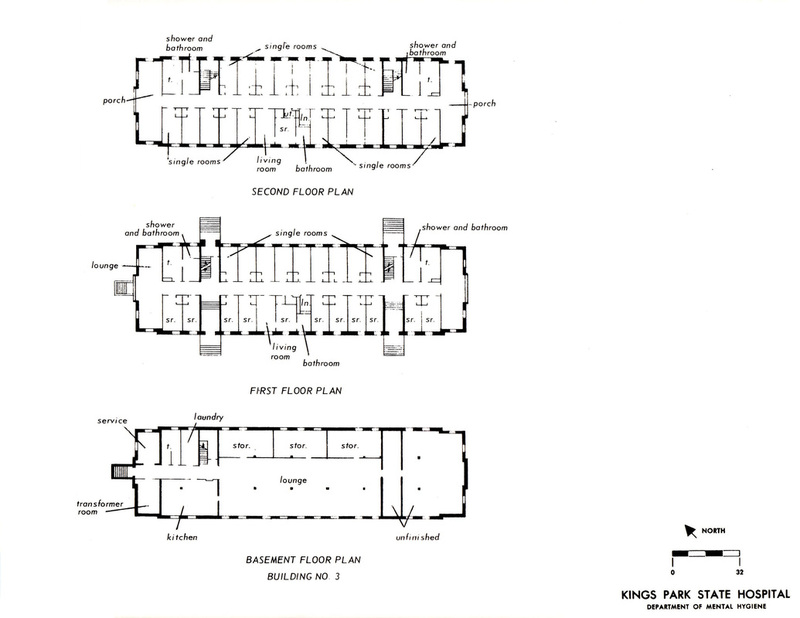 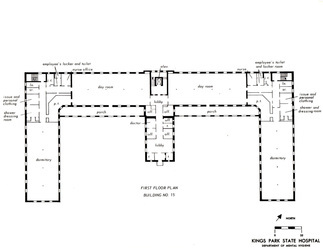 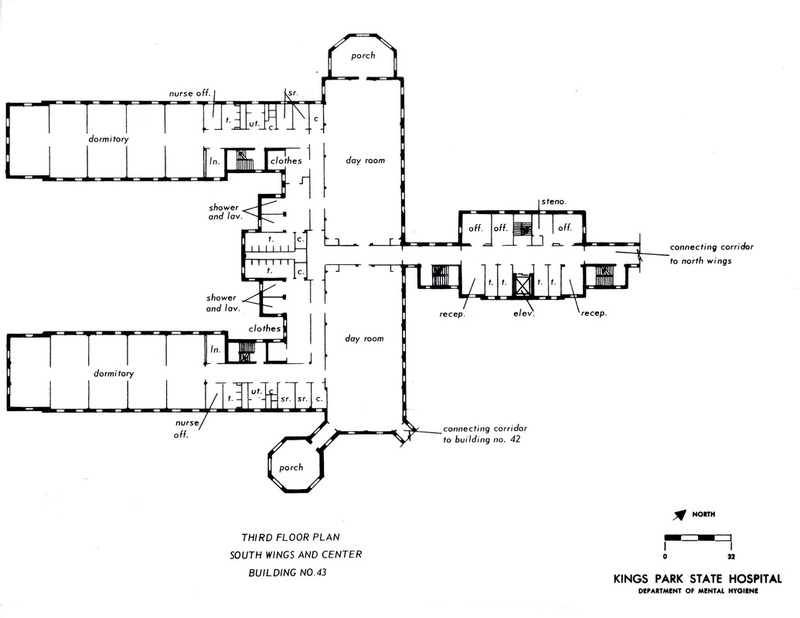 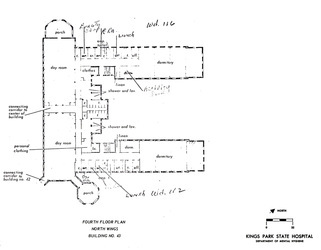 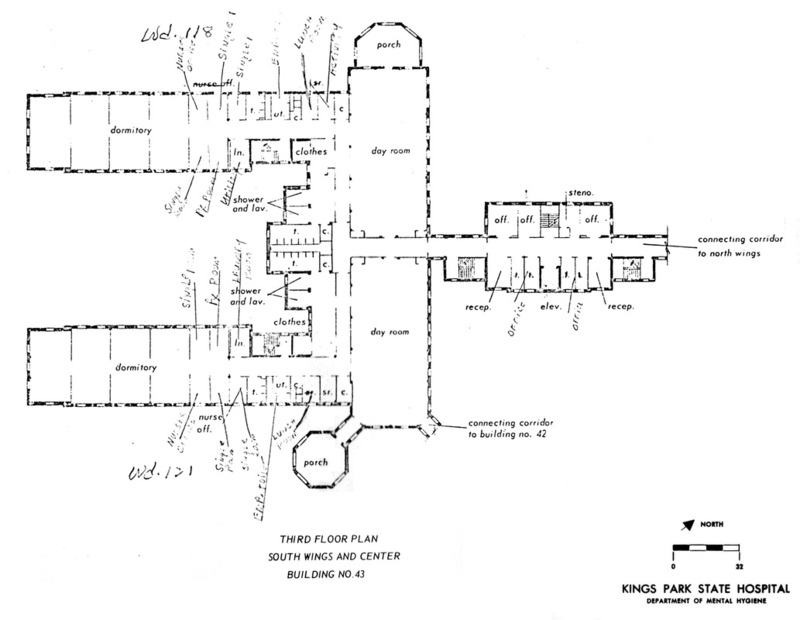 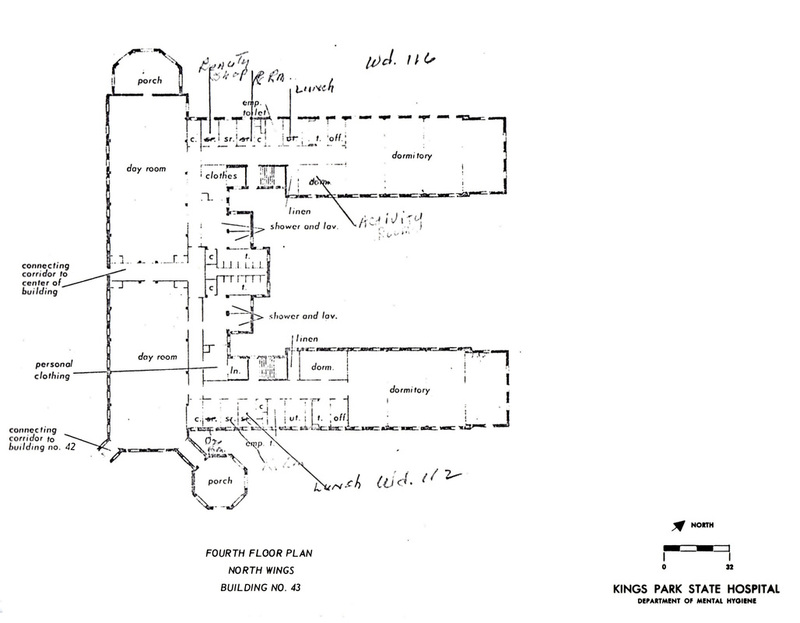 It was linked to the underground tunnel system below ground, while a breezeway corridor at the ground level linked it to both Buildings 21 & 22. 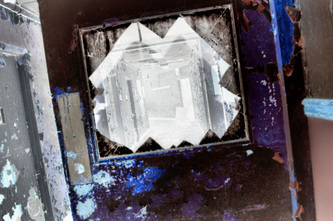 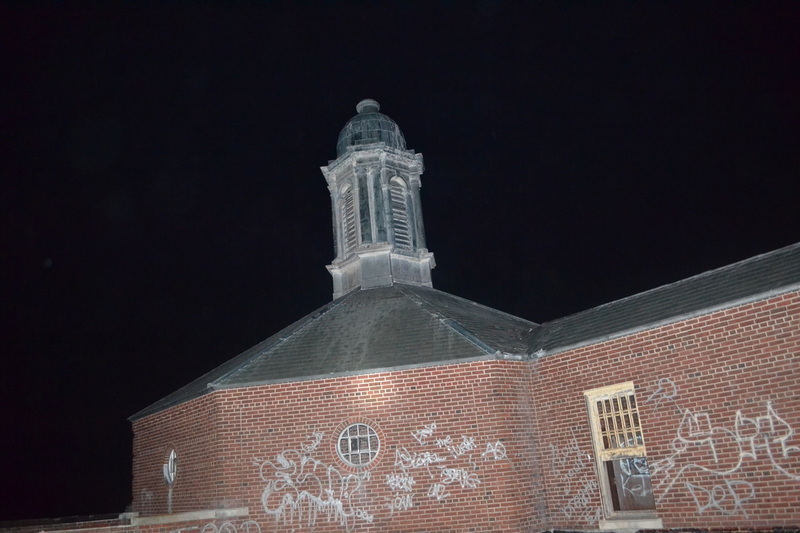 Although, it is currently abandoned, it still has an active alarm system on the highest section of its rooftop, which is known as "The Cube." This building, which was better known as Building A, was built from 1893-1897 along the main boulevard. 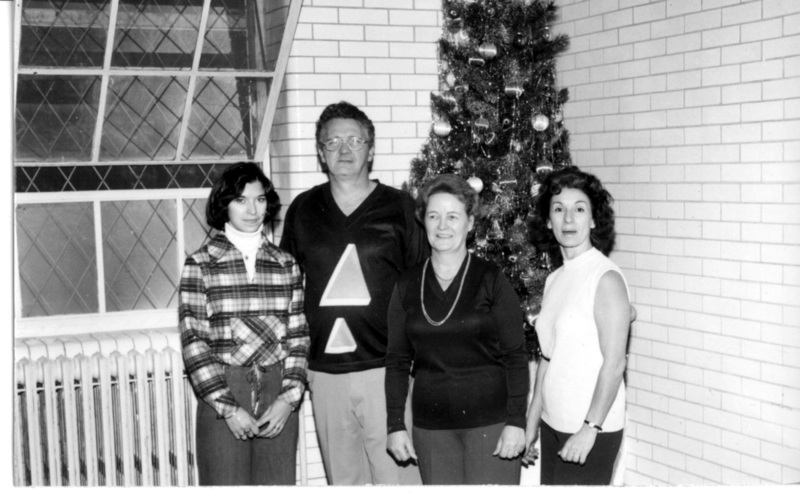 It took over as the administration building soon after it was built. 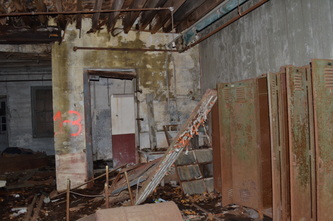 Wards 1-4 & the telephone operators were located in this building. This building was demolished in the mid-1970s. 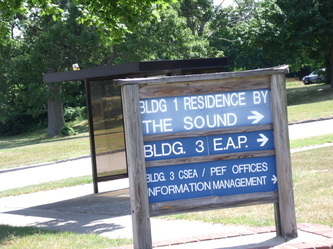 This was also known as Building B. 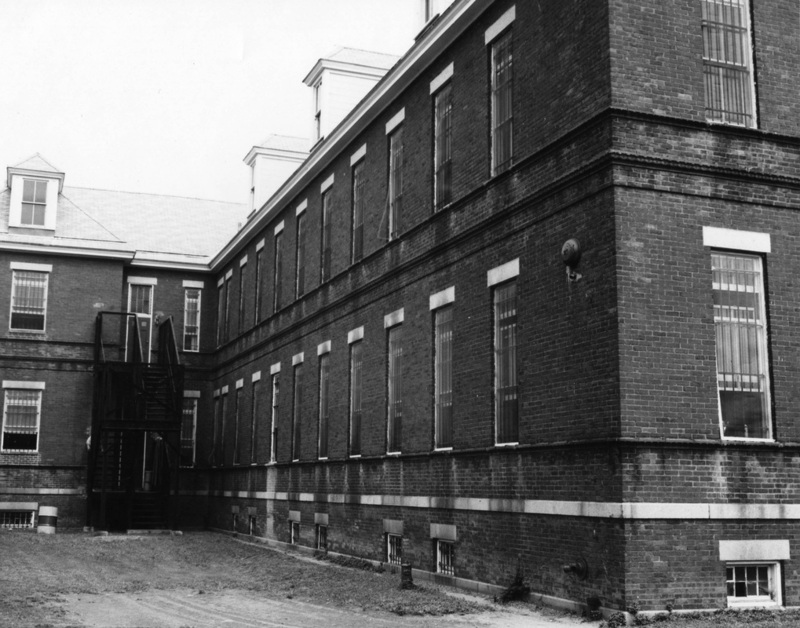 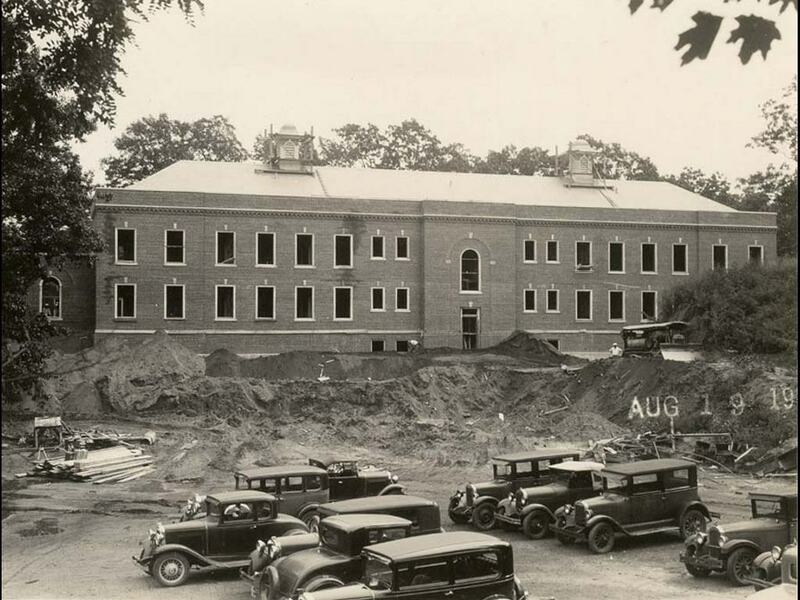 It served as the medical & surgical building for the hospital, until the 1930s when Building 136 was built. Building B stood next to Building A & was built between 1893-1897. 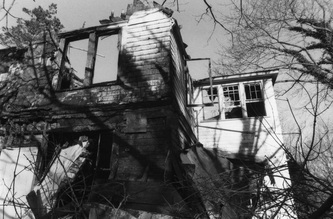 It was demolished during the 1970s. 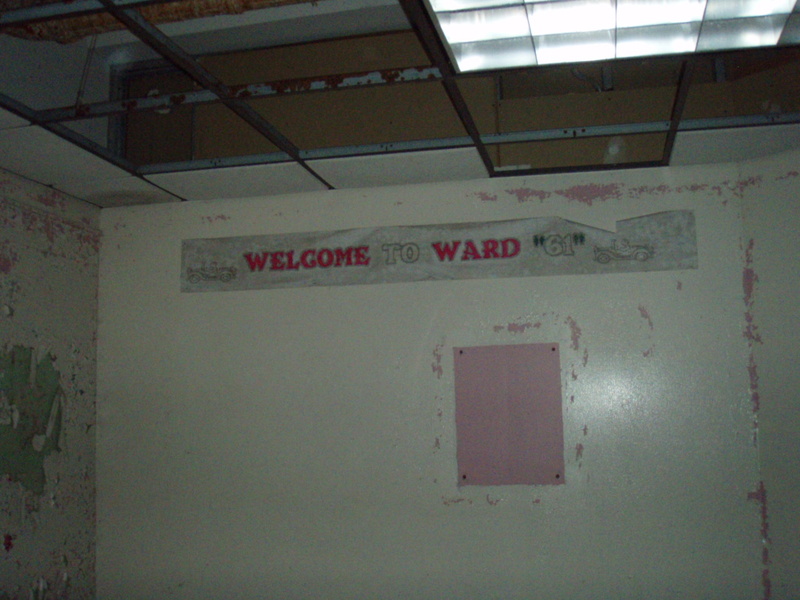 While it was still in use, it housed wards 5-8. 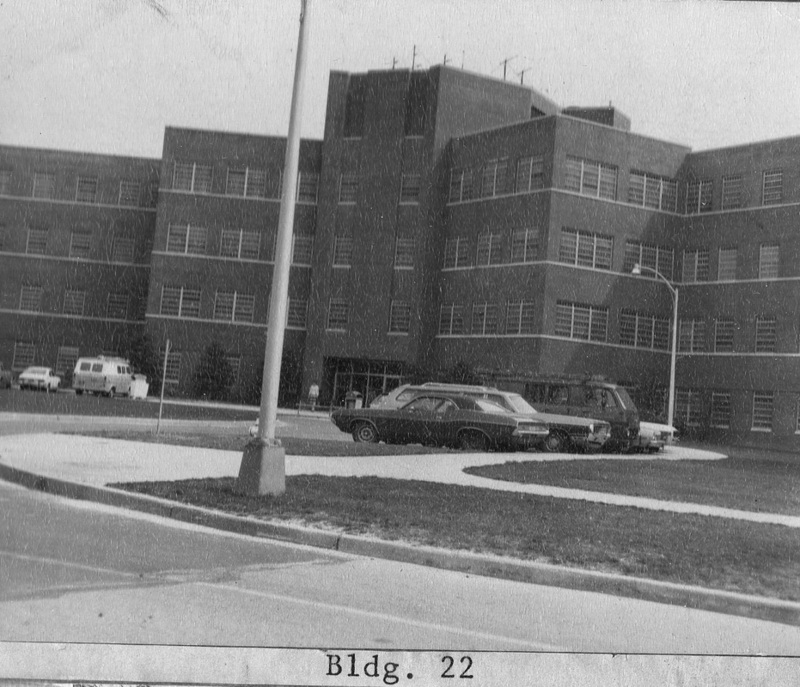 This building was also known as Building D & it housed wards 13-16. 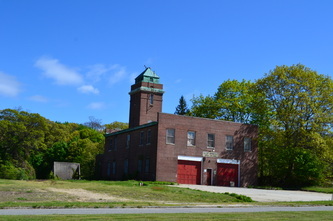 It was built from 1893-1897 across from the firehouse. 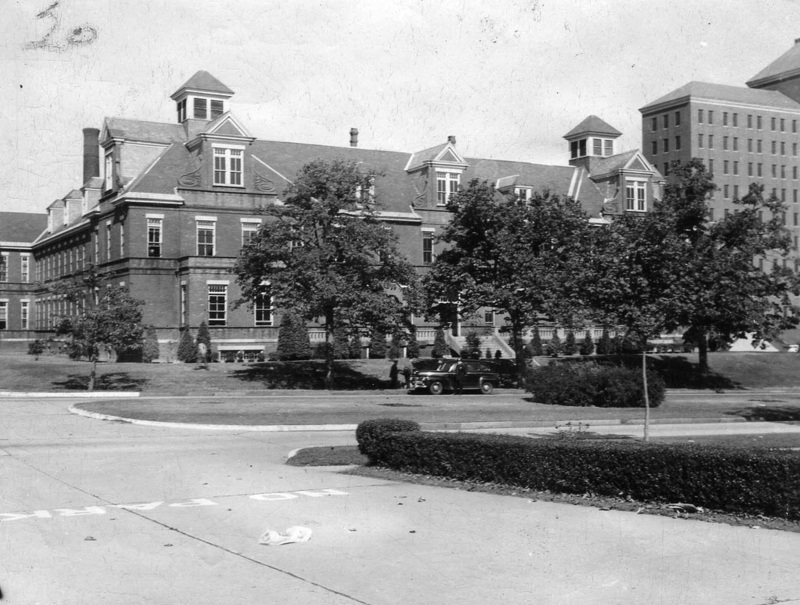 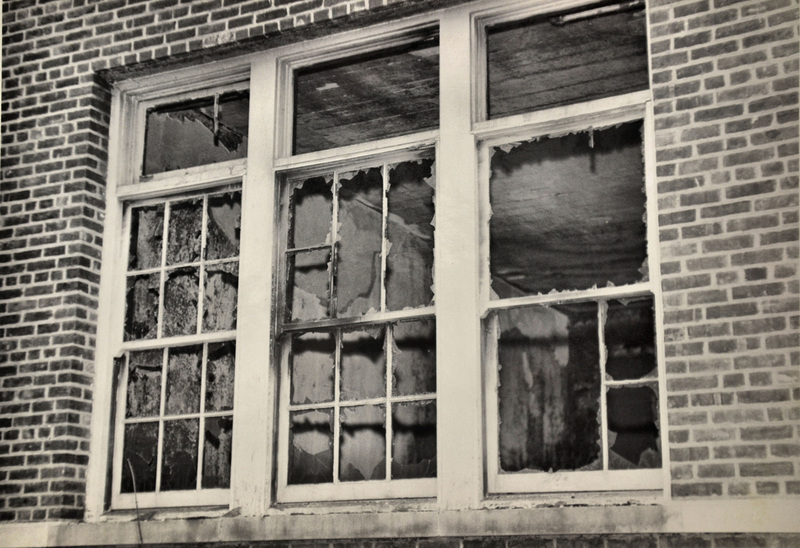 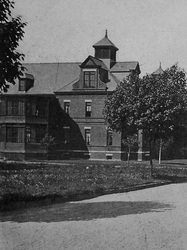 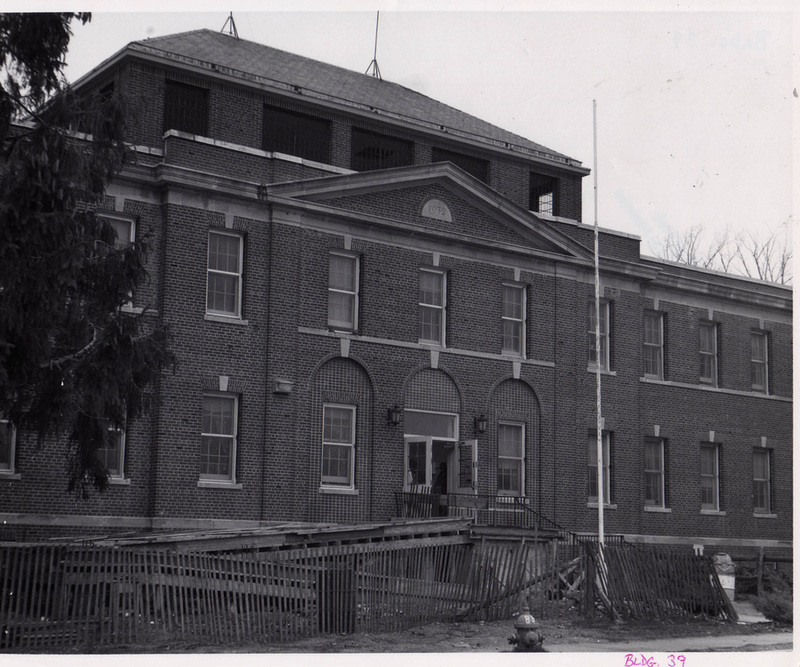 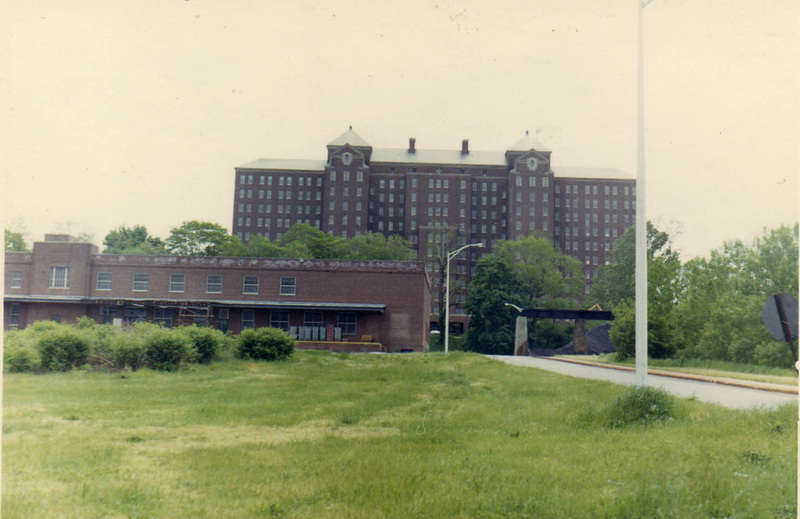 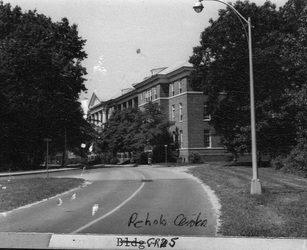 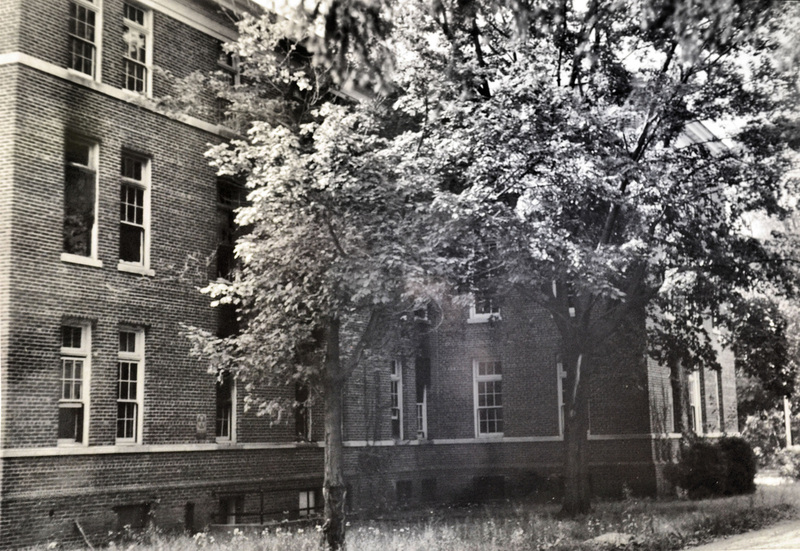 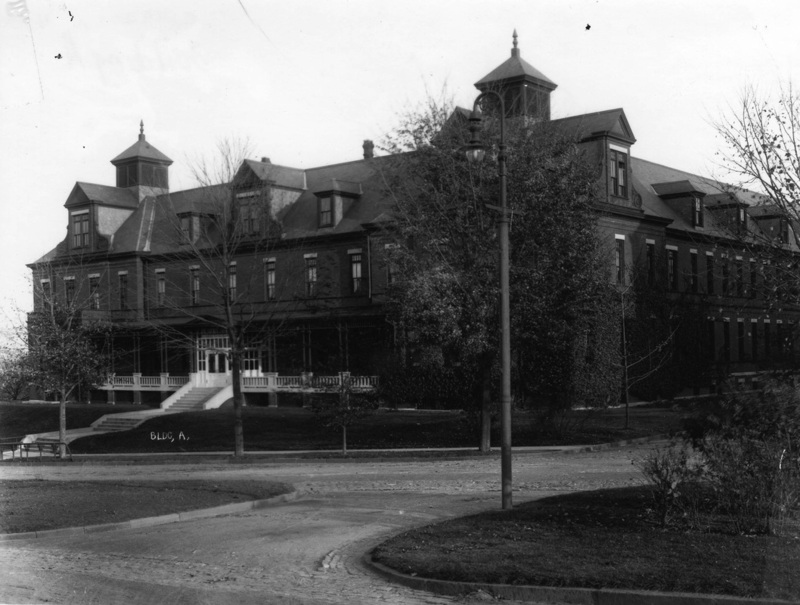 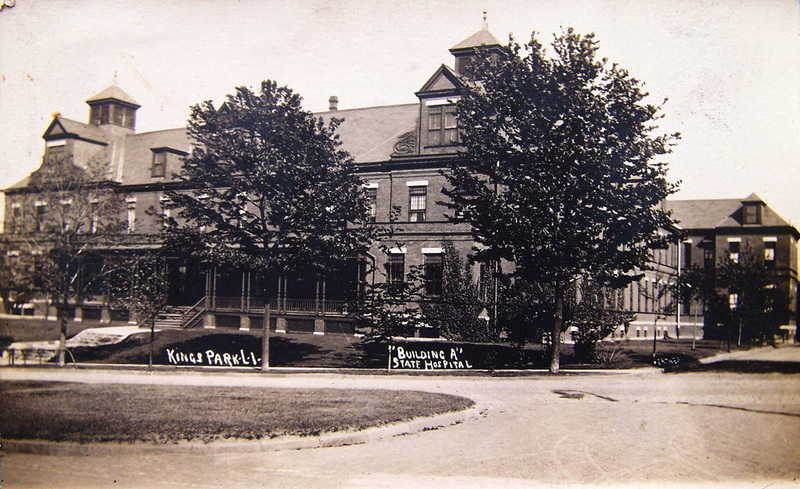 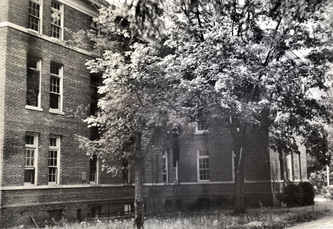 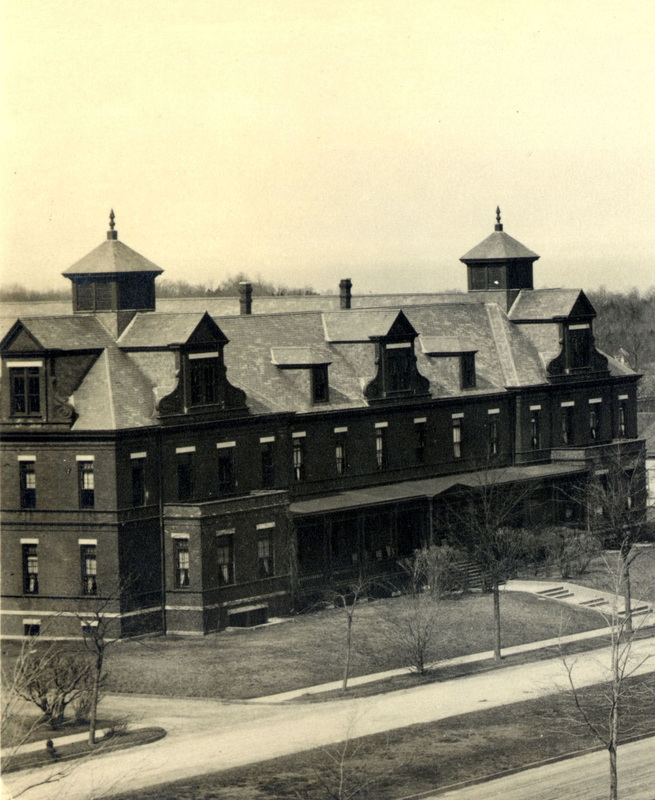 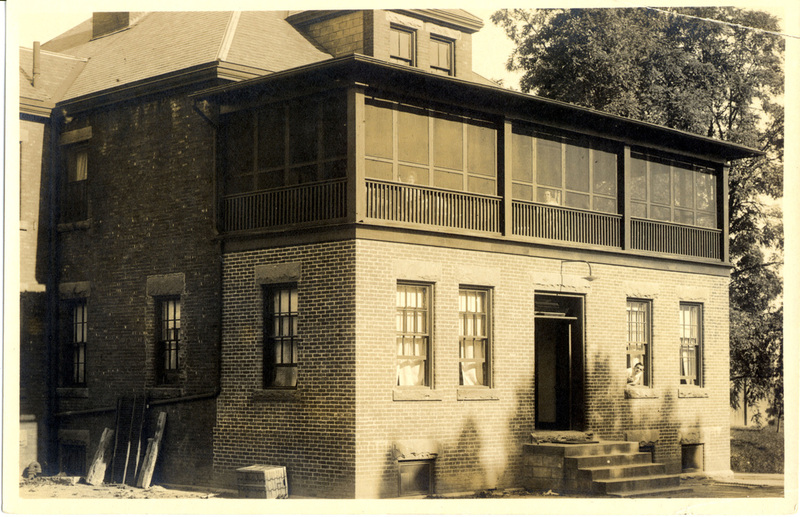 It was razed in the 1970s, along with Buildings B & C.
This building, which was built between 1893-1897, stood next to Building 93 & was known as Building C. It housed wards 9-12 & was the original location of the hospital's nursing school, before Macy Hall was built. 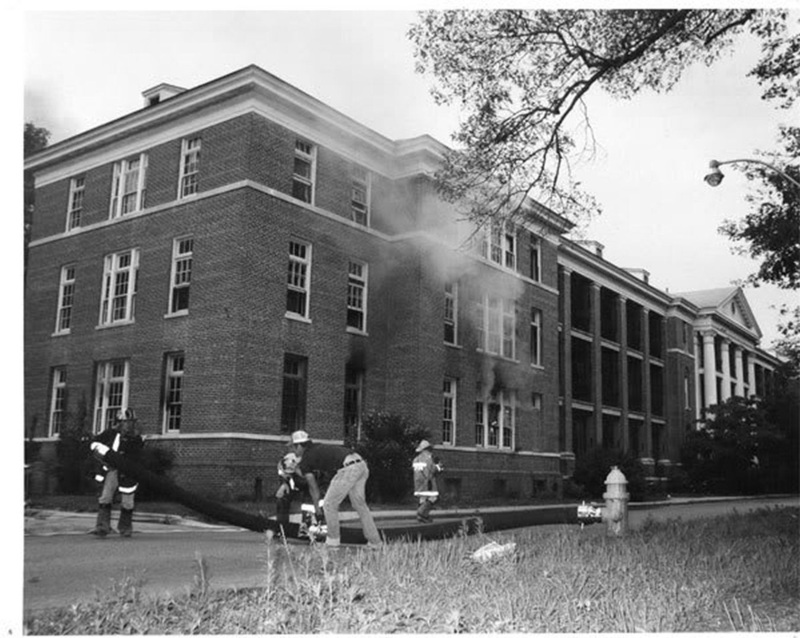 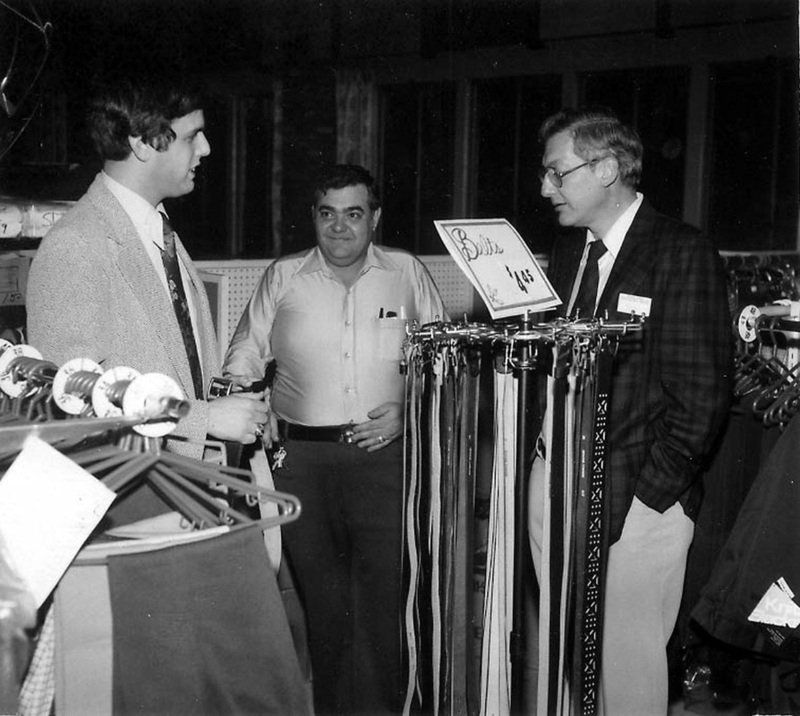 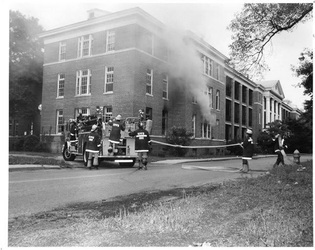 Building C was razed during the 1970s. 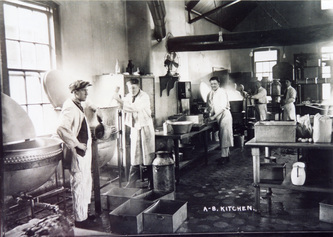 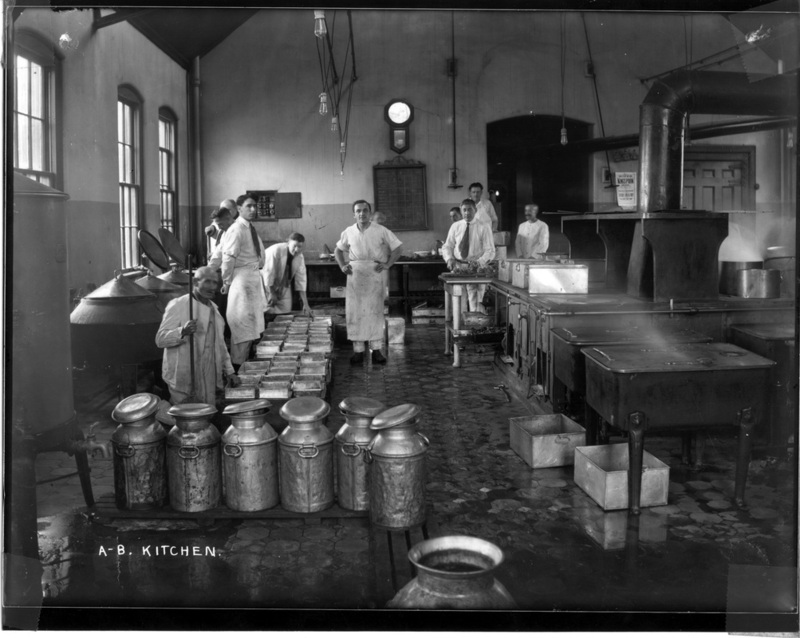 This was the kitchen to Buildings C & D. It was built from 1895-1897 behind those buildings. 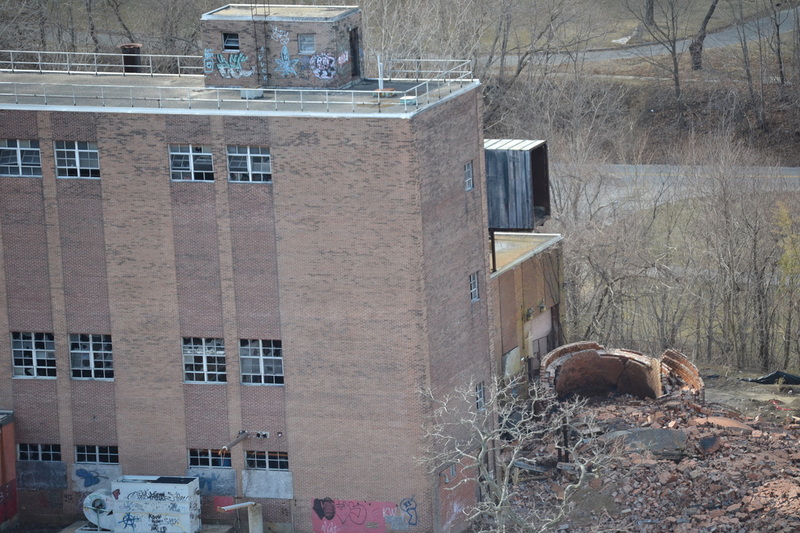 At some point in the late 1950s, it slid down the hill it was built upon and fell towards the power plant area. 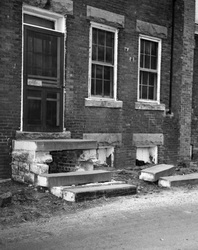 The rubble was removed during the 1960s. 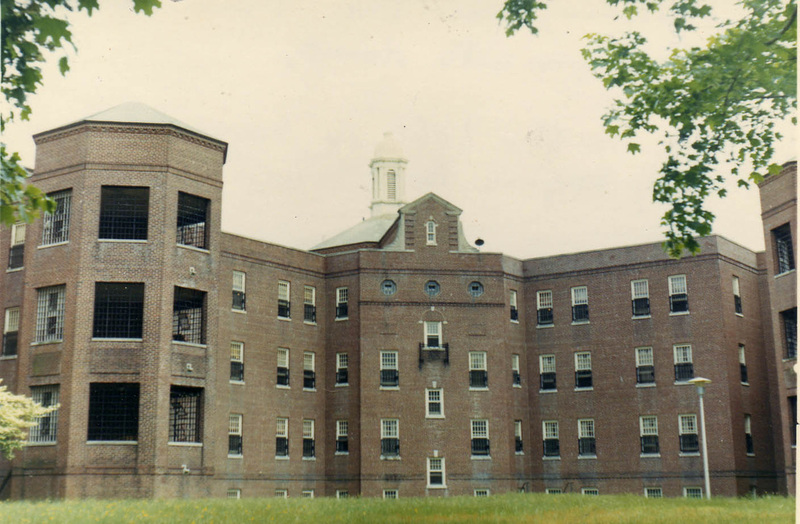 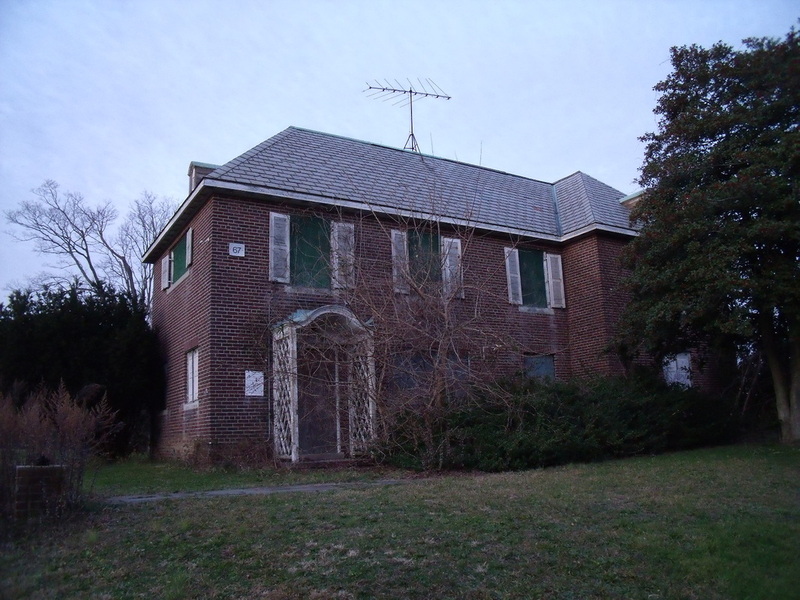 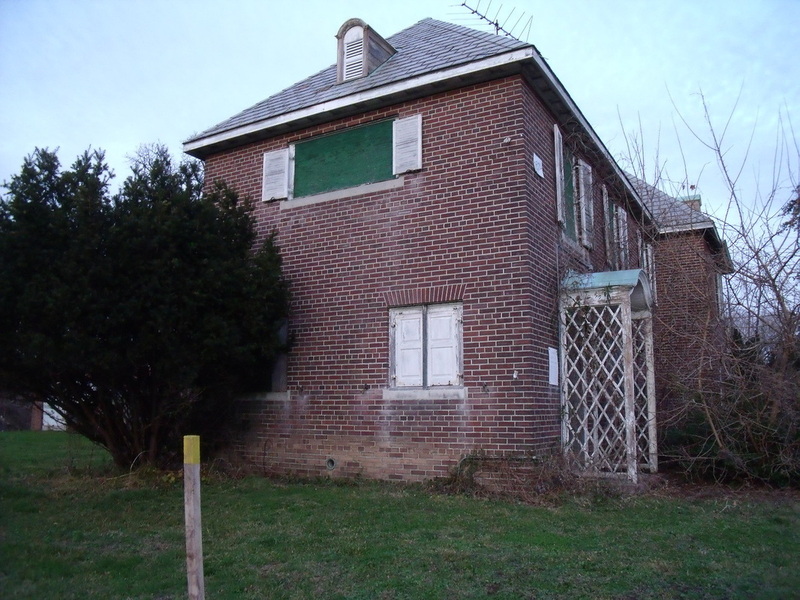 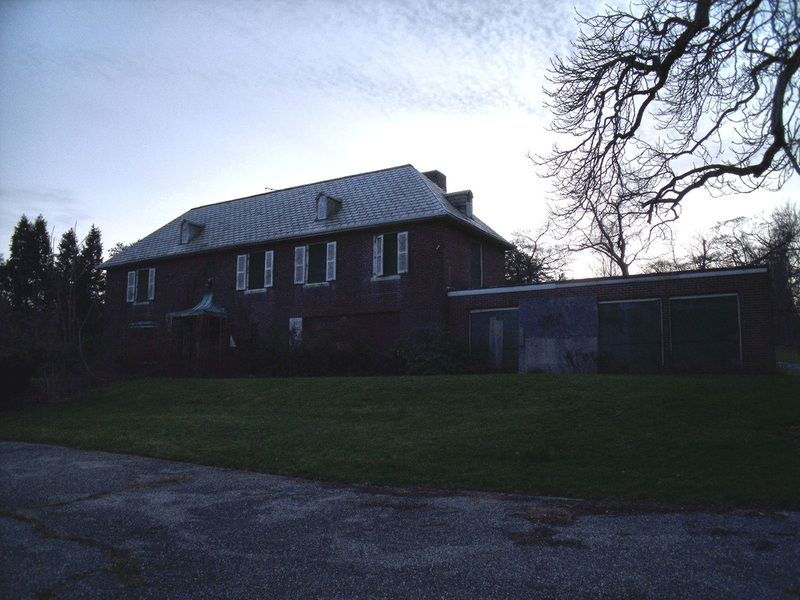 Wisteria House was built in 1939 & was the building, where the criminally insane male patients were housed in wards 60-65. 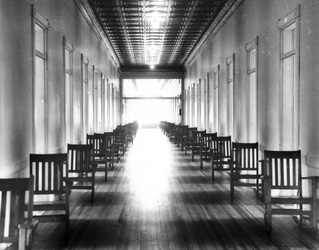 Their heads were kept closely shaven to distinguish them from the other patients. 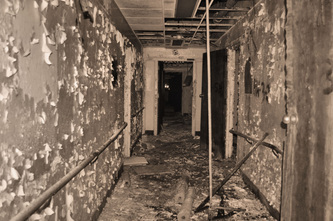 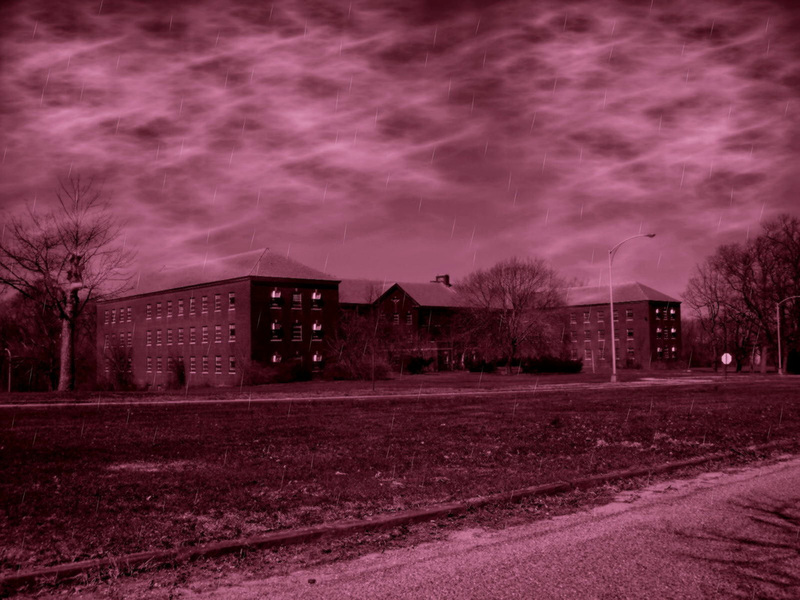 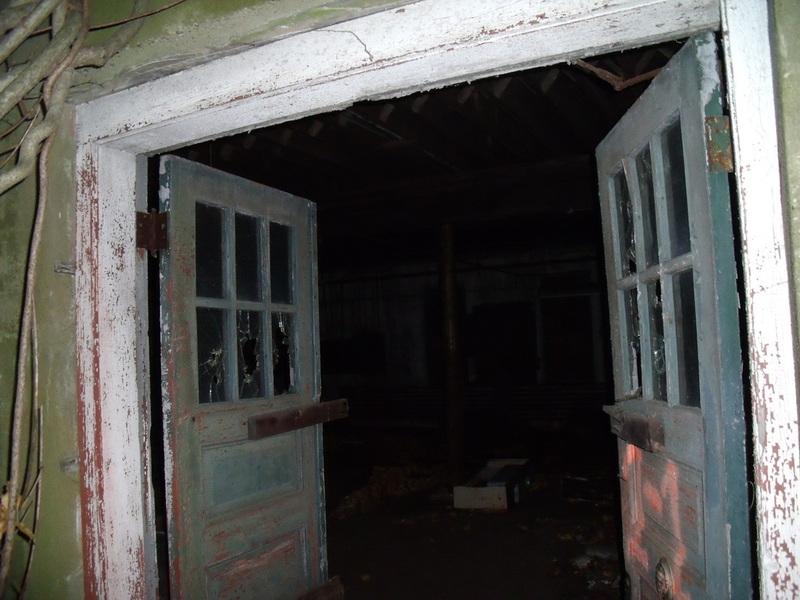 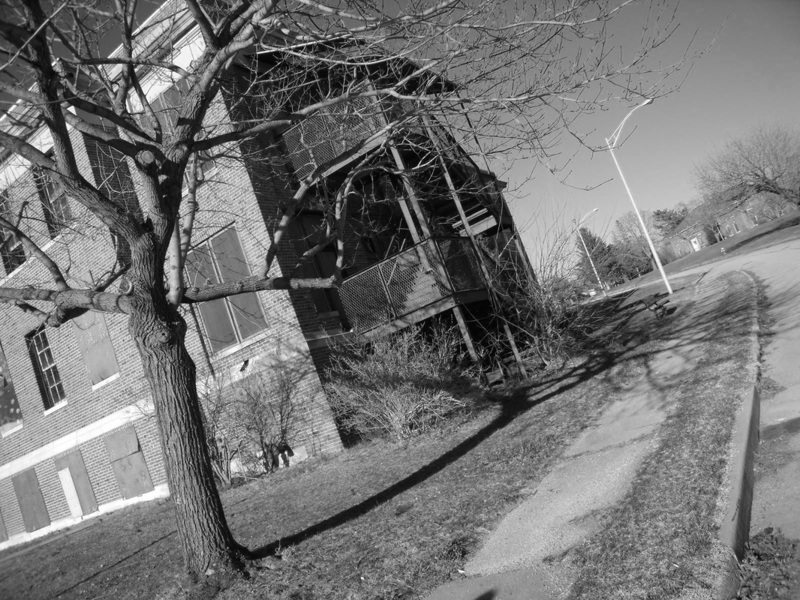 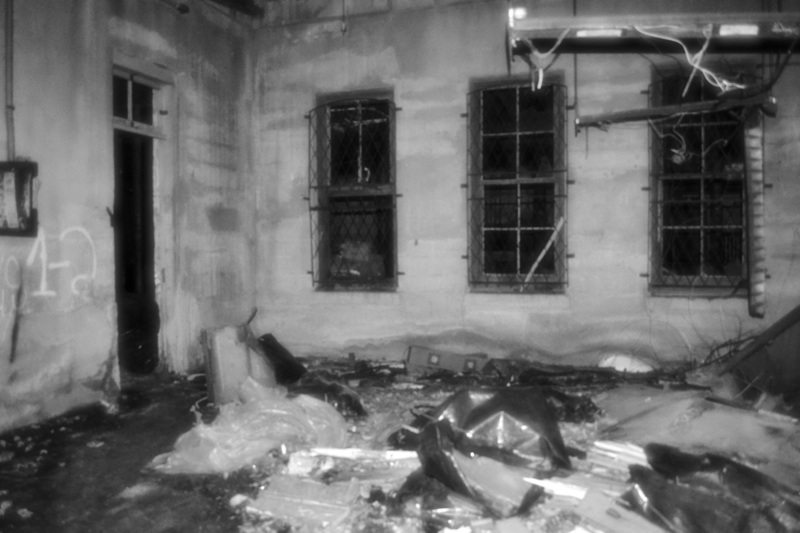 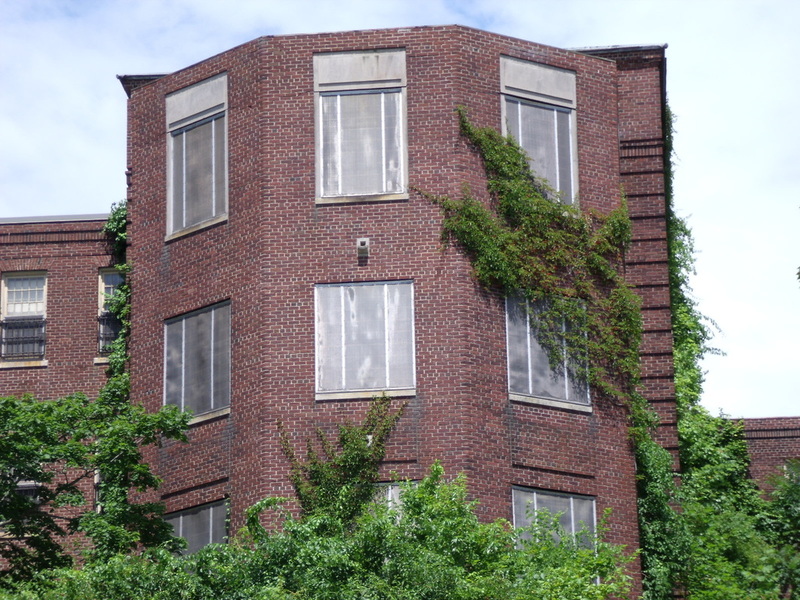 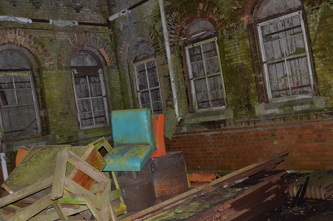 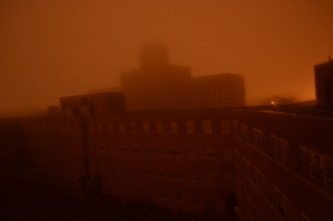 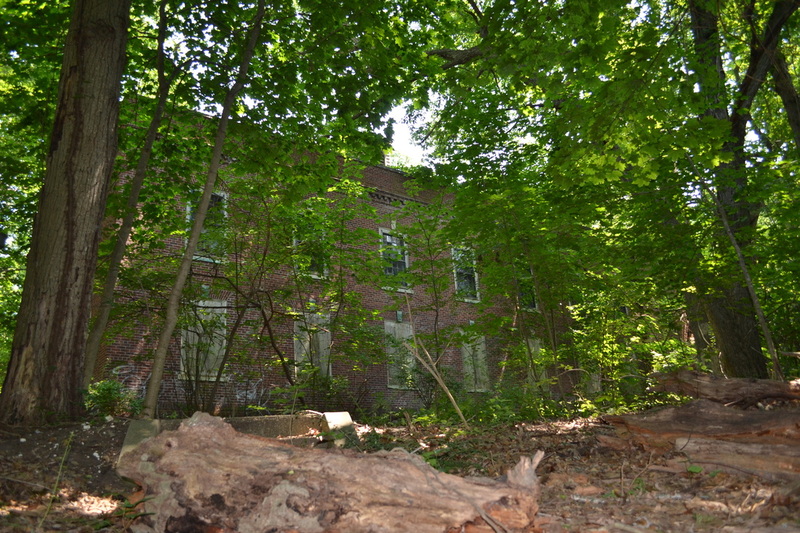 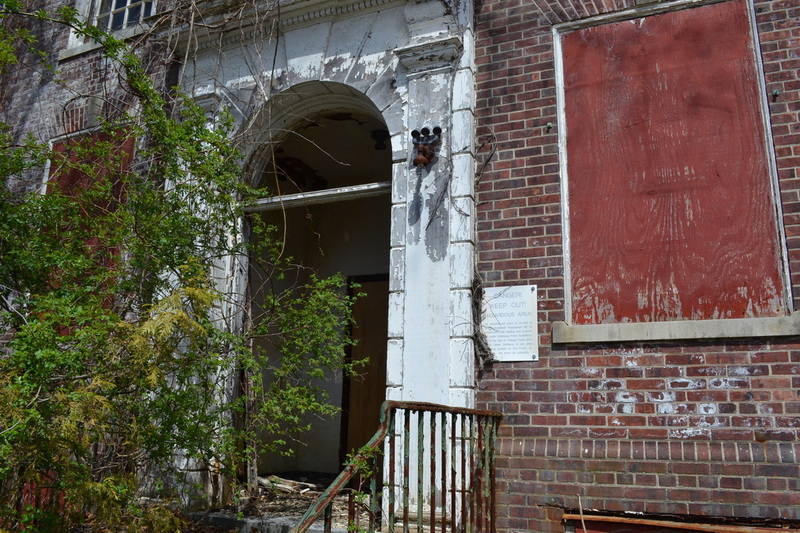 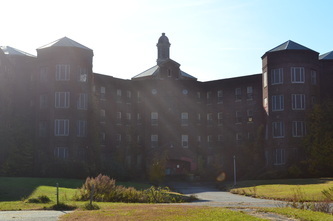 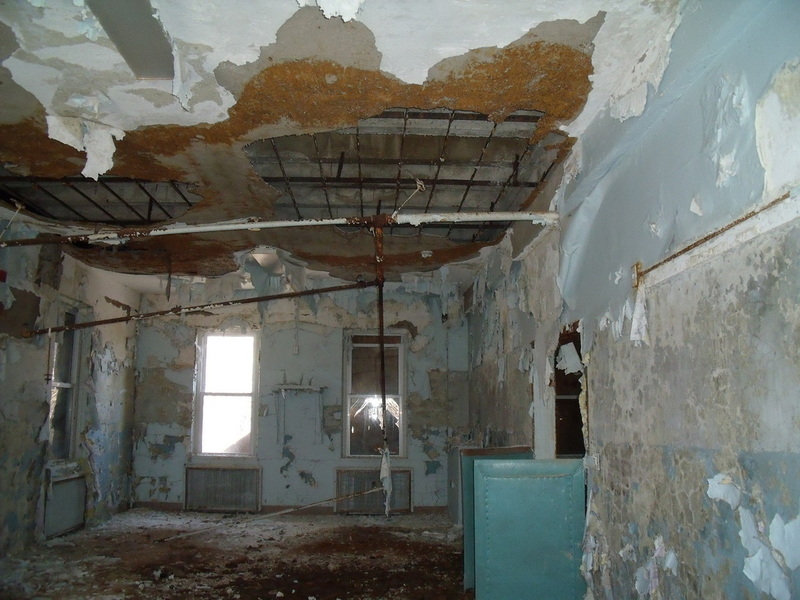 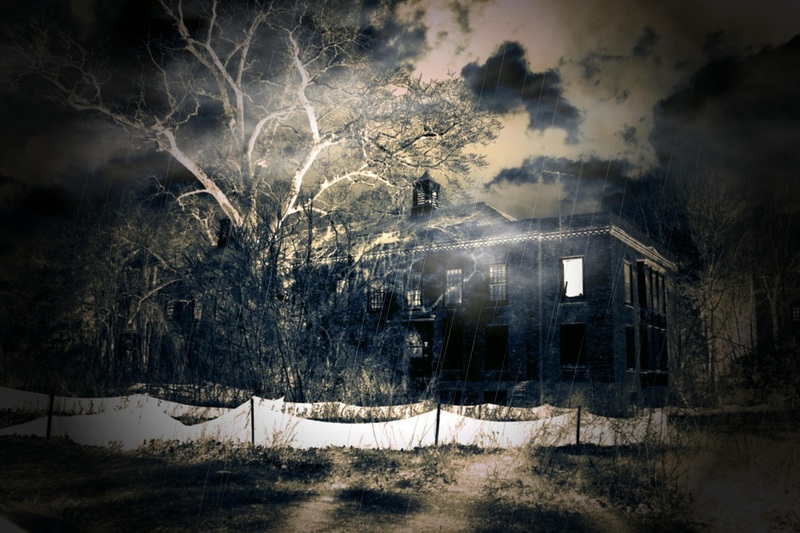 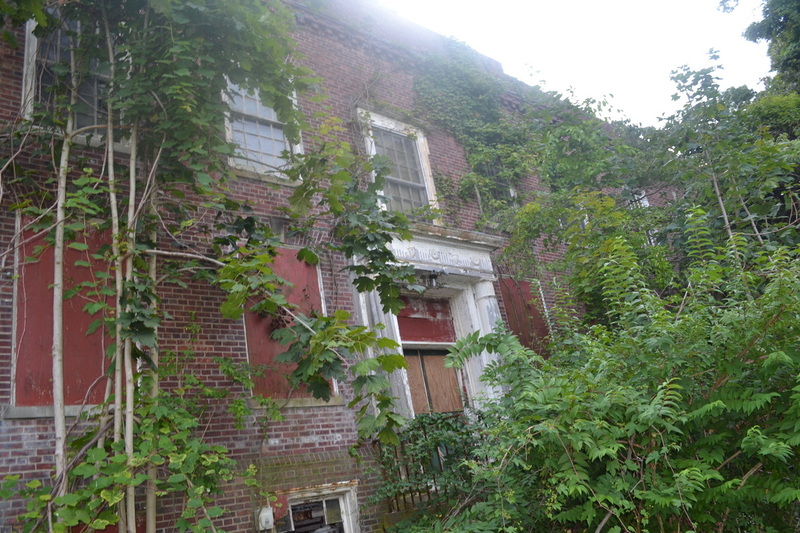 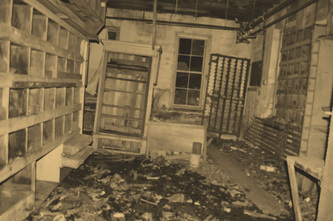 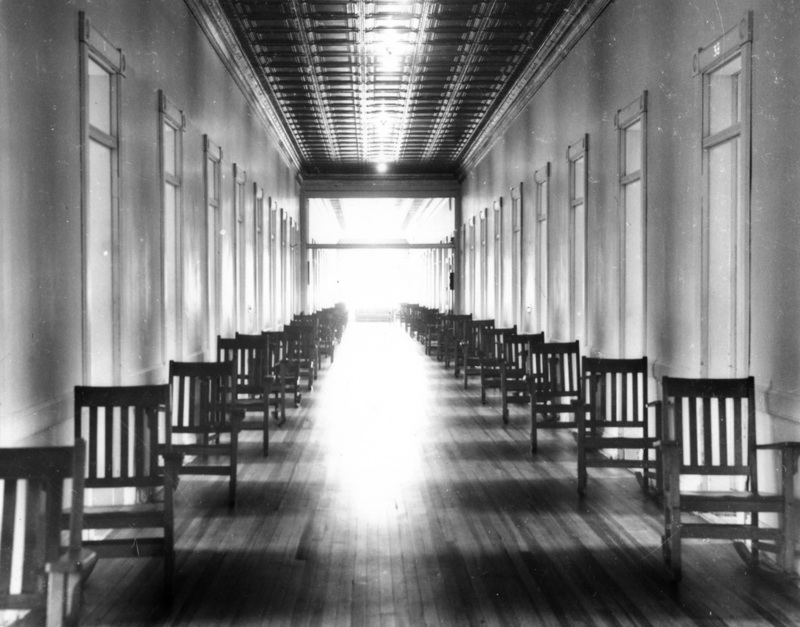 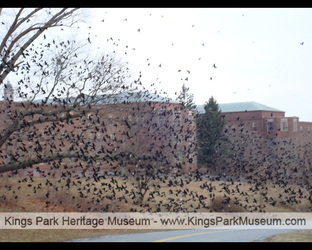 It is said this building is haunted by the tortured spirits of those former patients. 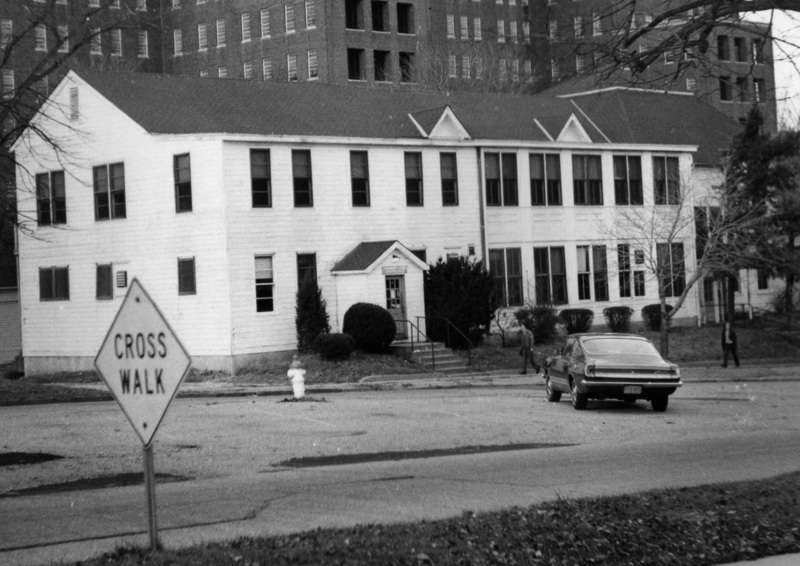 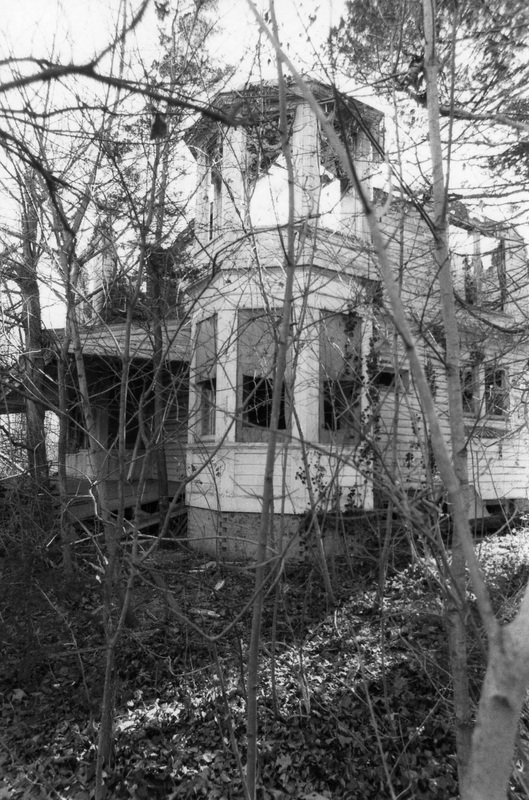 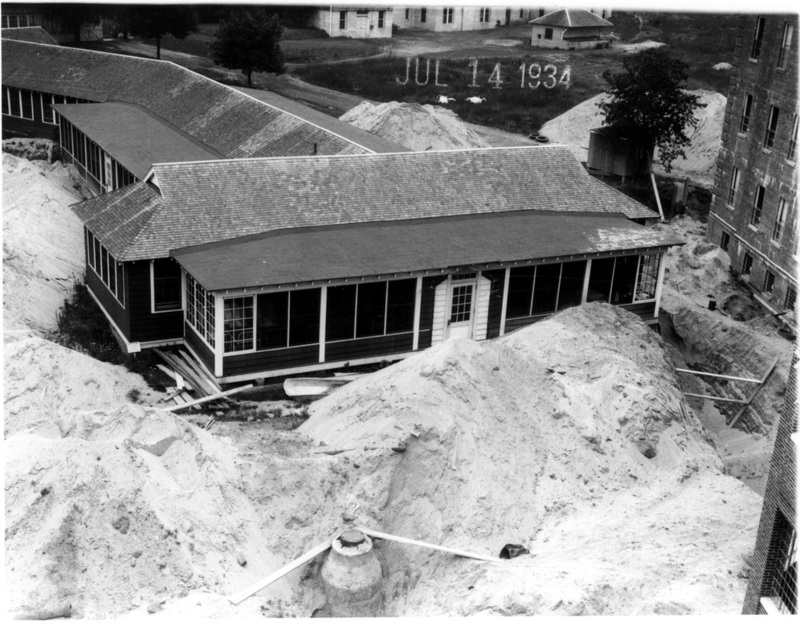 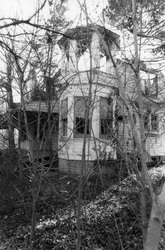 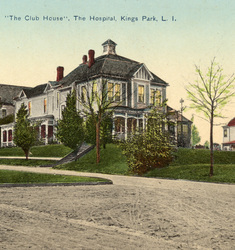 Wisteria House is still standing across from Building 1 on Kings Park Boulevard, although its connection to the underground tunnel system was sealed long before the hospital closed down. 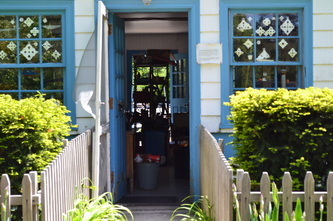 This was a tool house built during the time of the original cottages in the late 1800s. 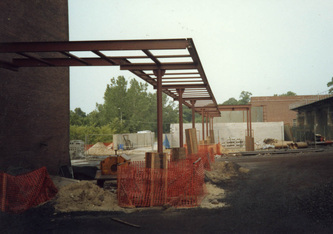 It stood behind where Building 93 now stands. 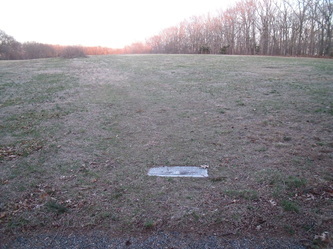 Memorial plaque located at the start of the Hike & Bike Trail at Flynn Road near Old Dock Road. 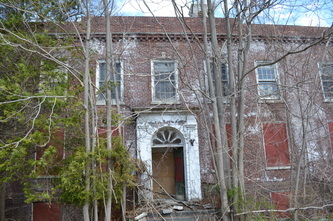 This was actually a series of cottages built in 1939, which housed doctors. 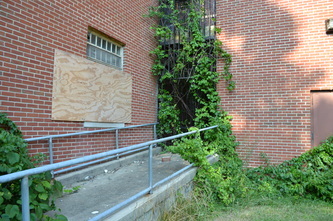 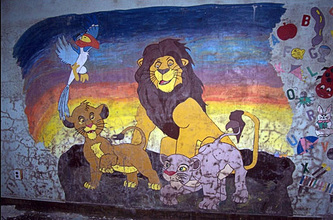 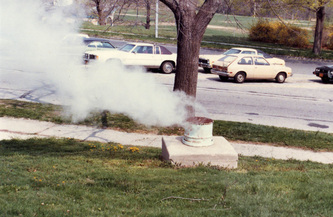 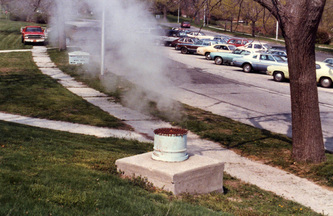 It was located behind Macy Hall. 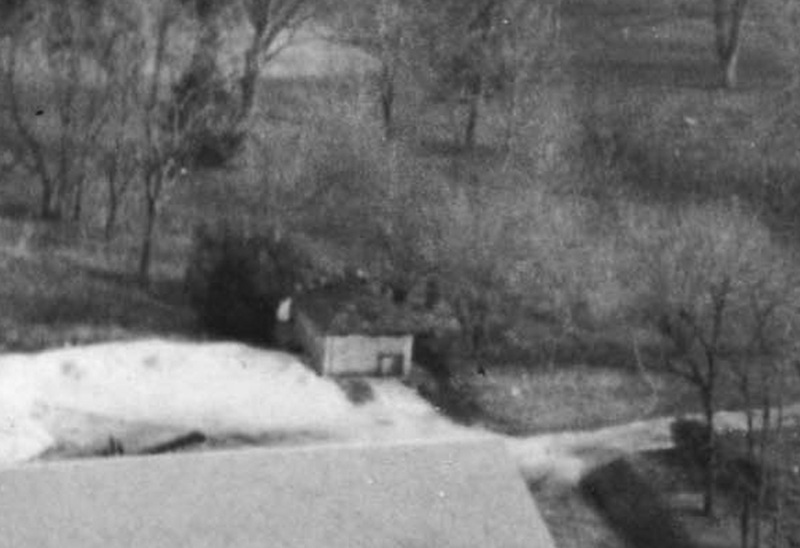 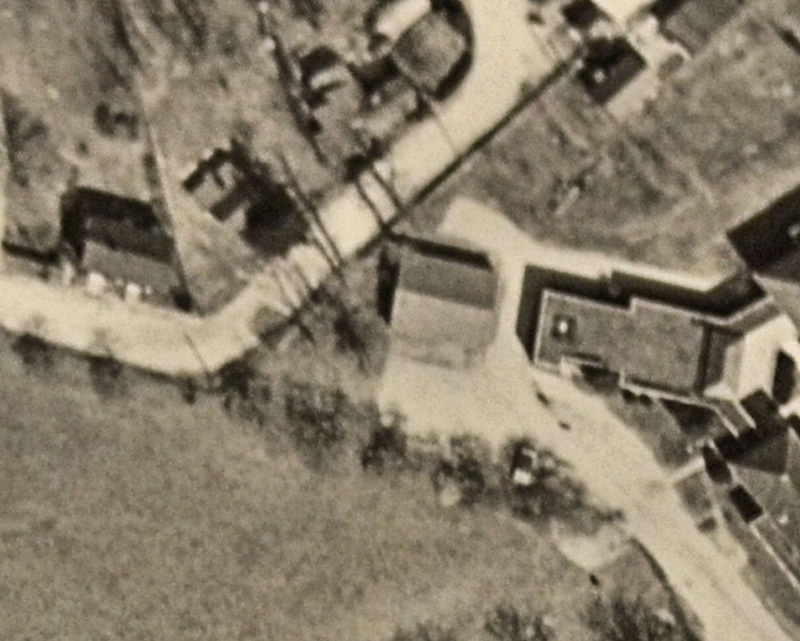 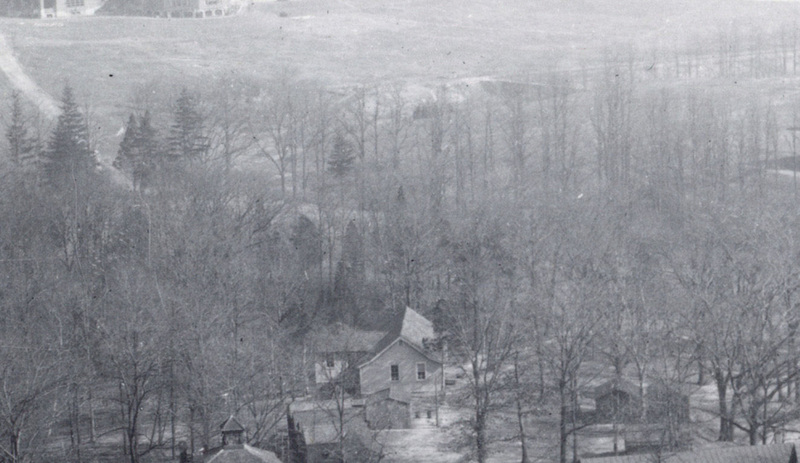 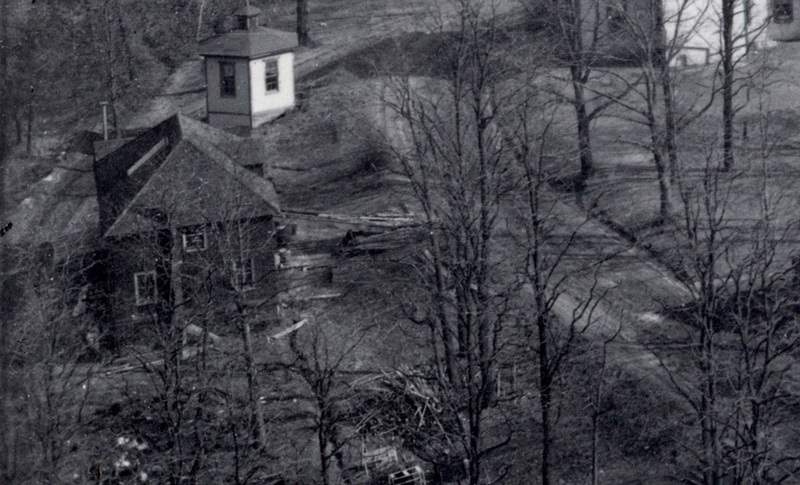 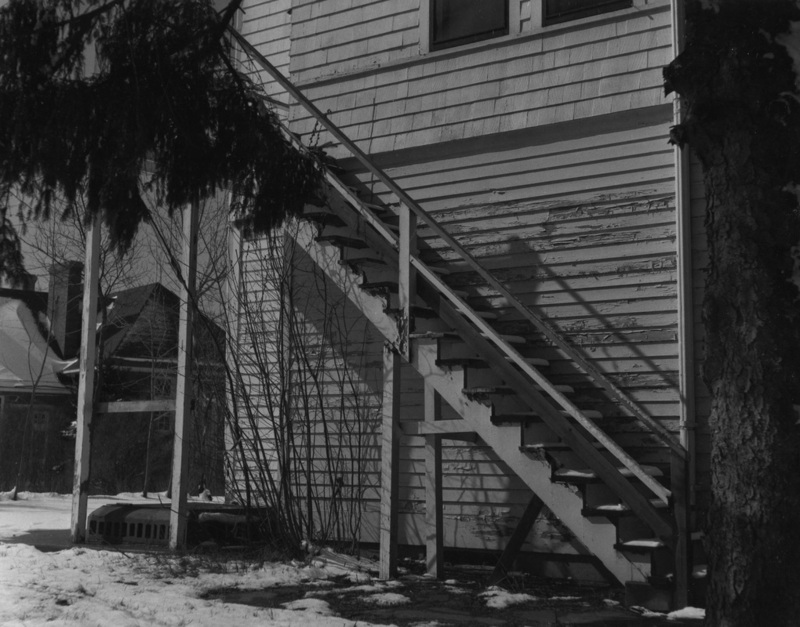 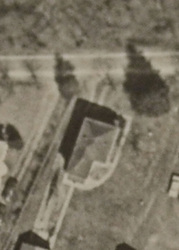 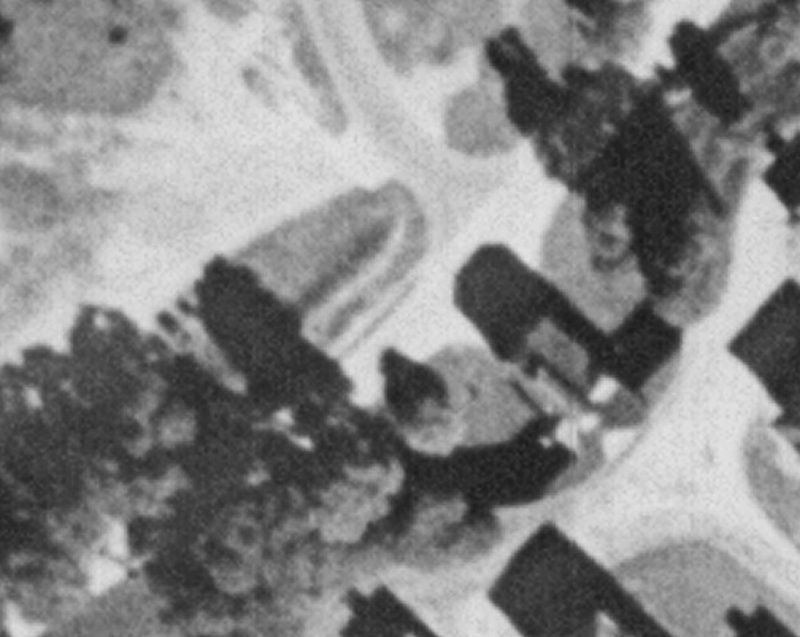 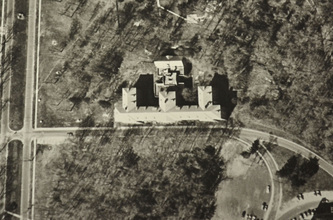 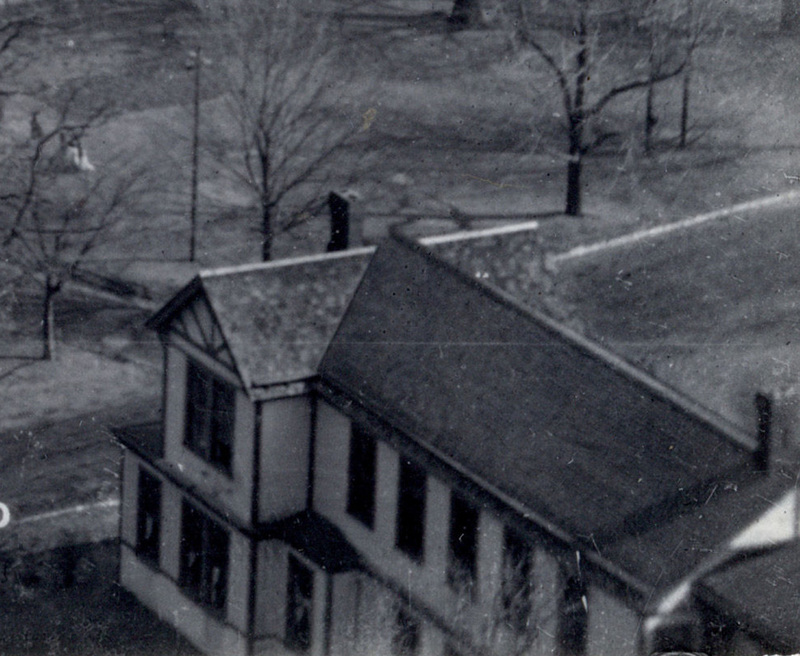 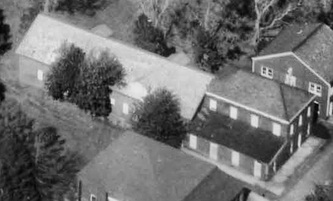 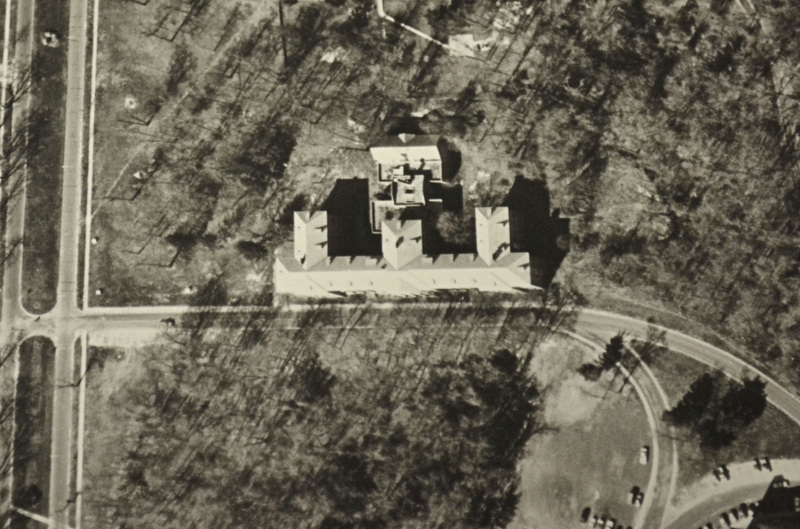 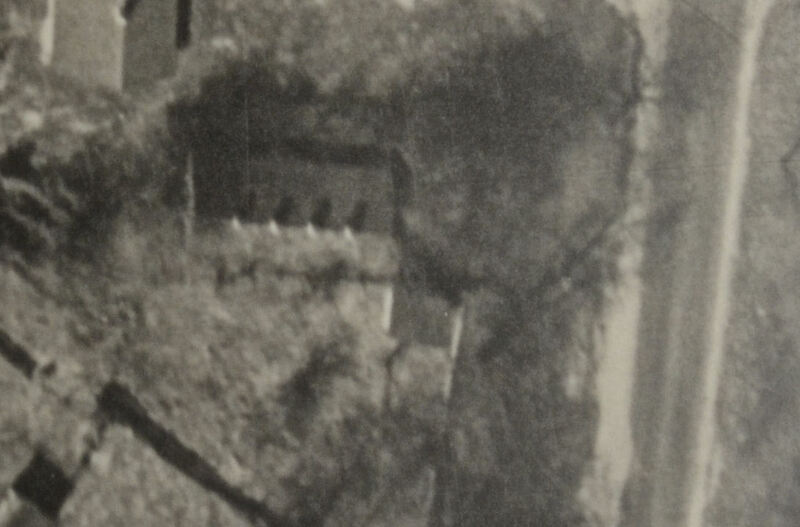 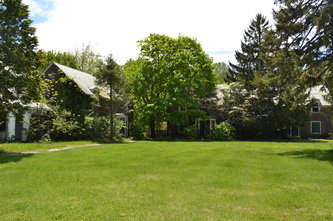 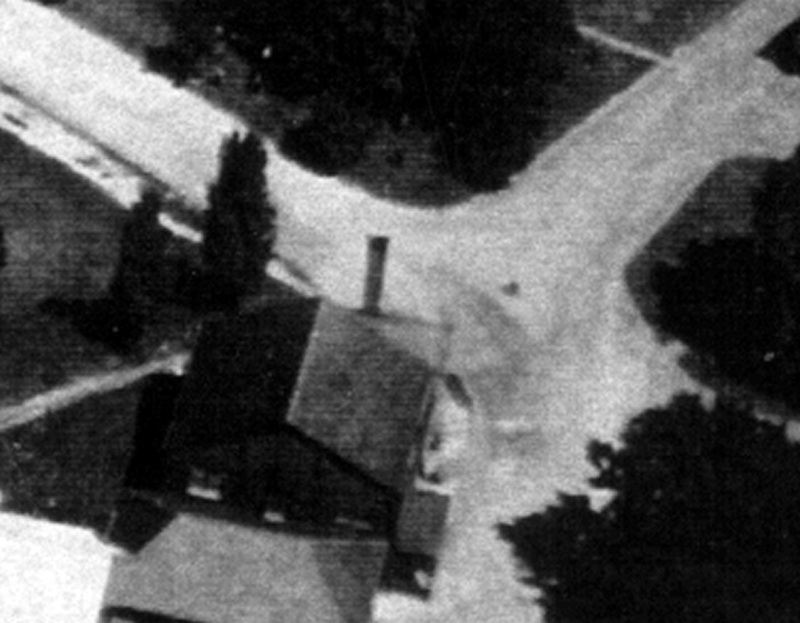 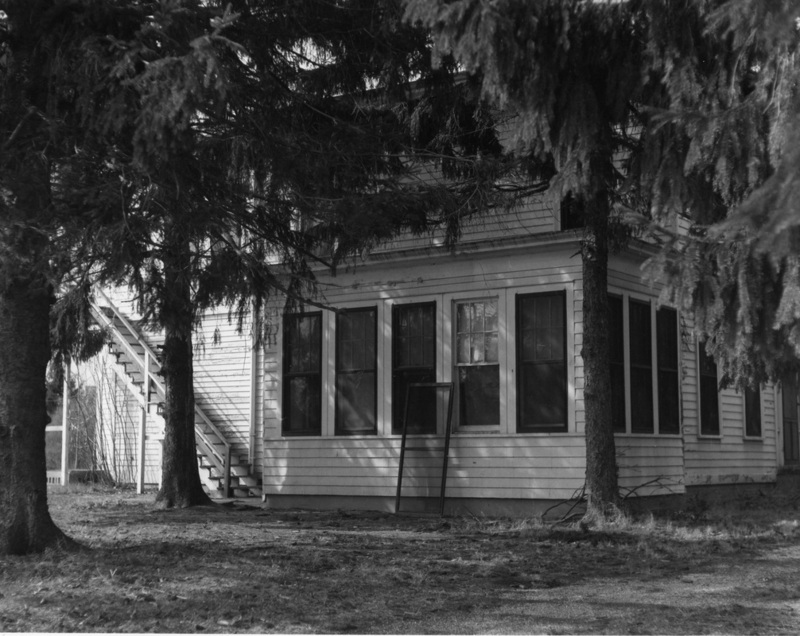 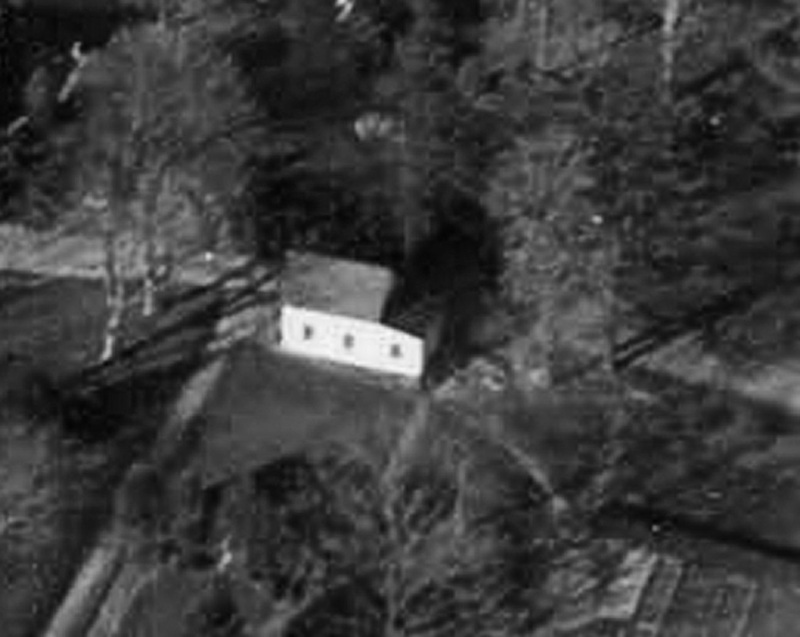 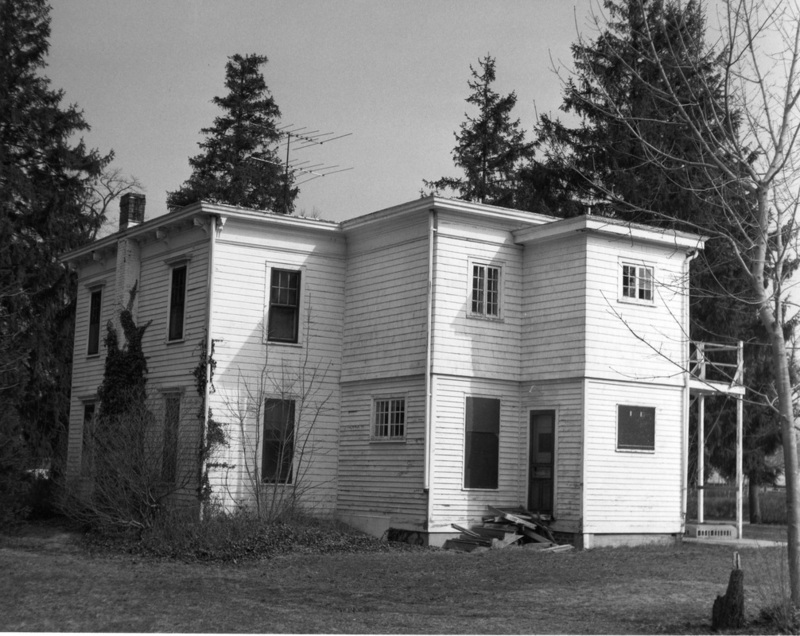 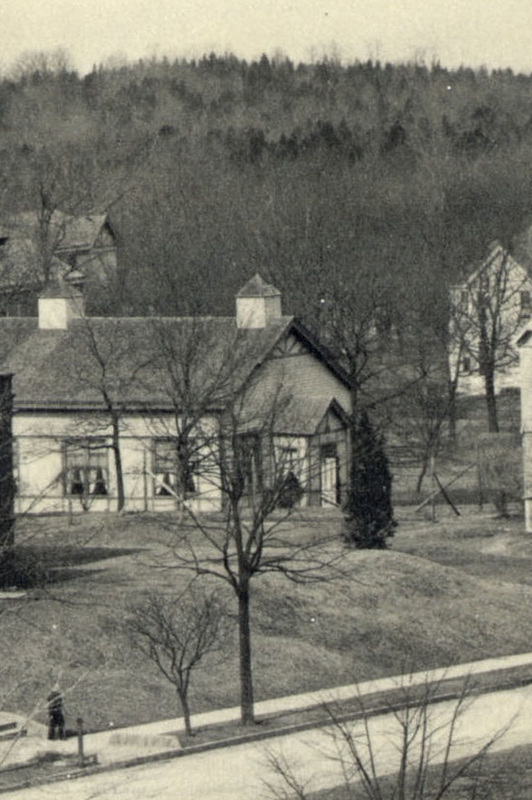 This series of doctors' cottages built in 1939 were connected to each other & sat upon a hill near Macy Hall. 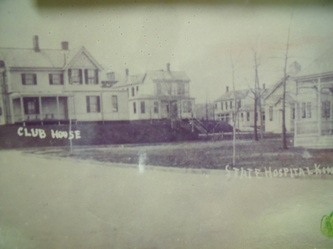 This was one of the original cottages of the hospital when it first opened in the late 1880s. 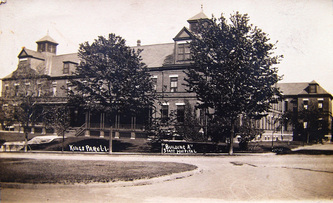 It was built between 1887-1889 & was home to ward 26. 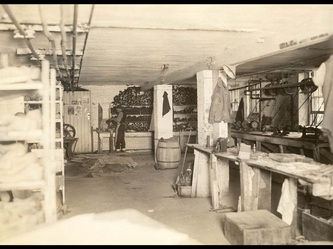 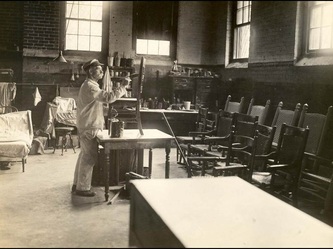 It later became the tinsmith & paint shop. 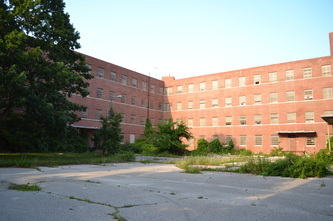 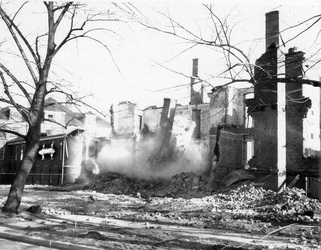 Building 44 was built on the same site, after it was demolished. 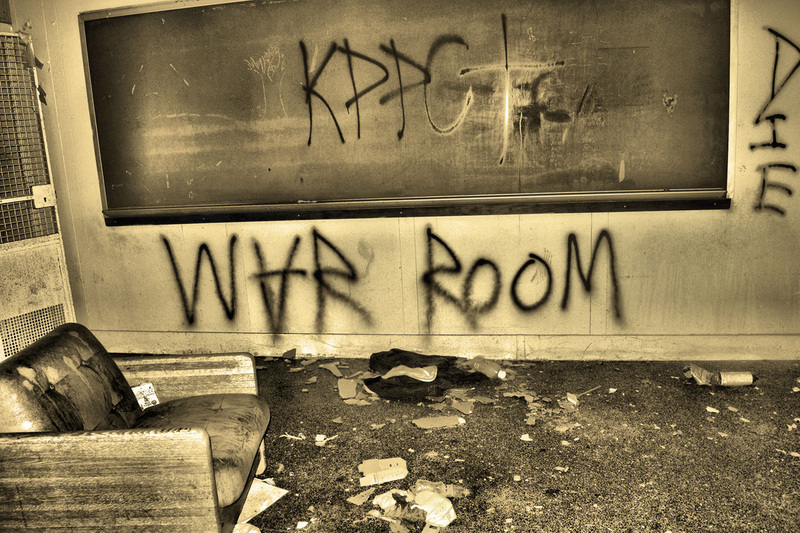 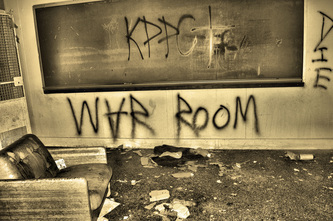 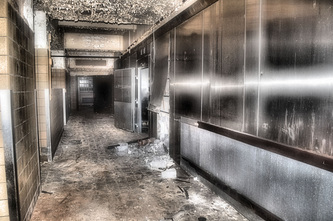 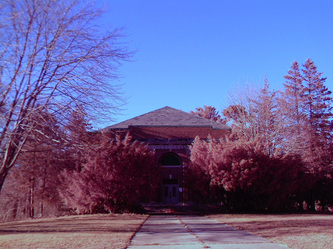 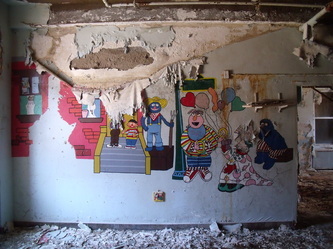 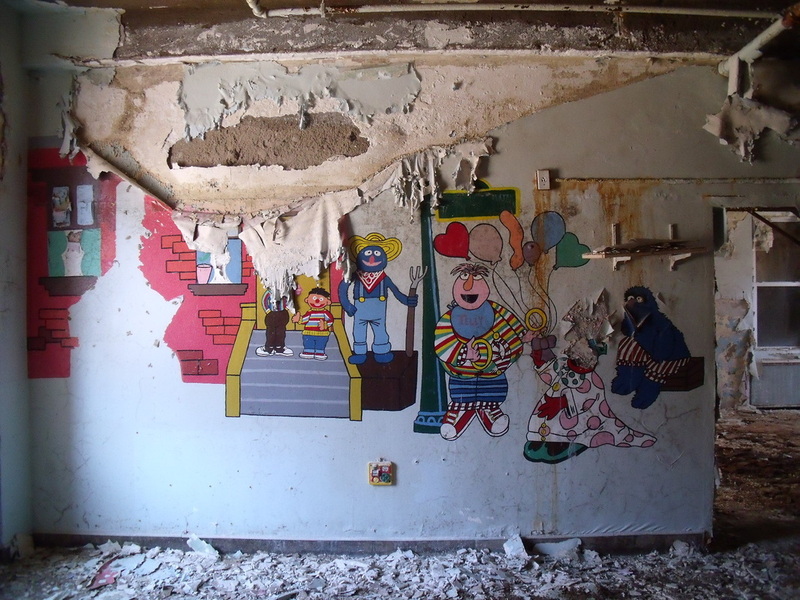 This was one of the very last patient buildings to be used before the hospital closed in 1996. 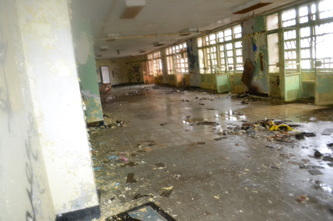 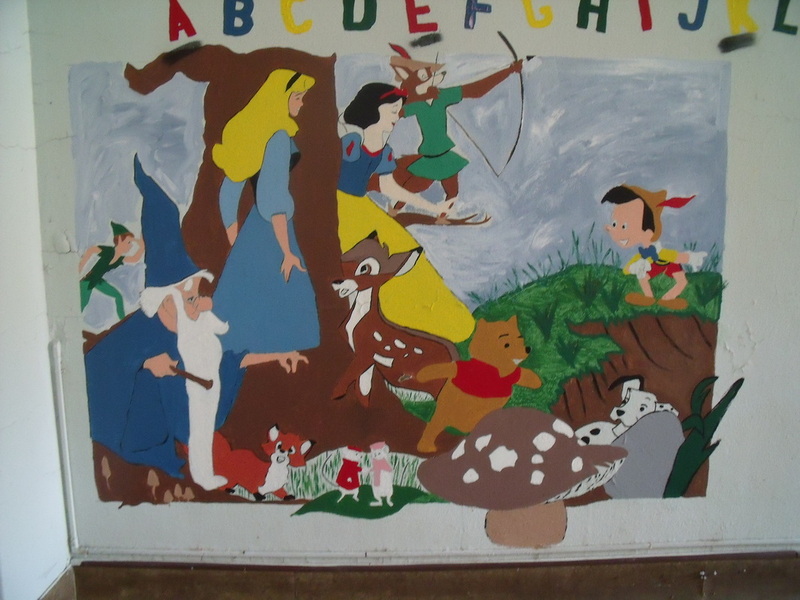 It was built between 1957-1967 & housed wards 201-214. 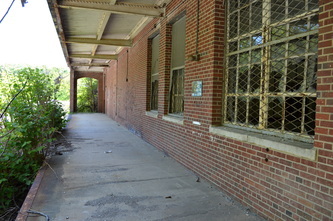 A breezeway corridor connects it to Buildings 22 & the medical center, Building 7. 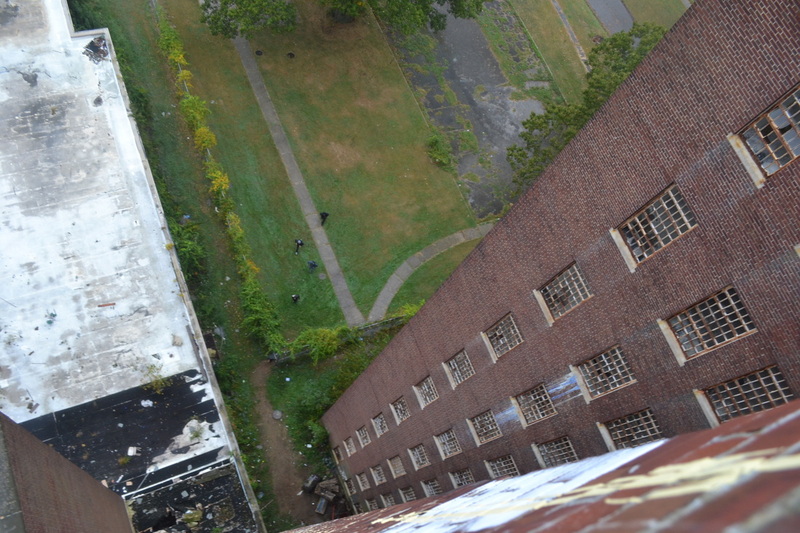 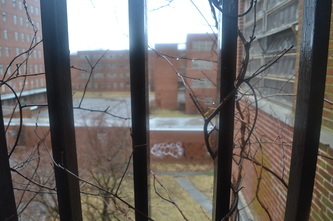 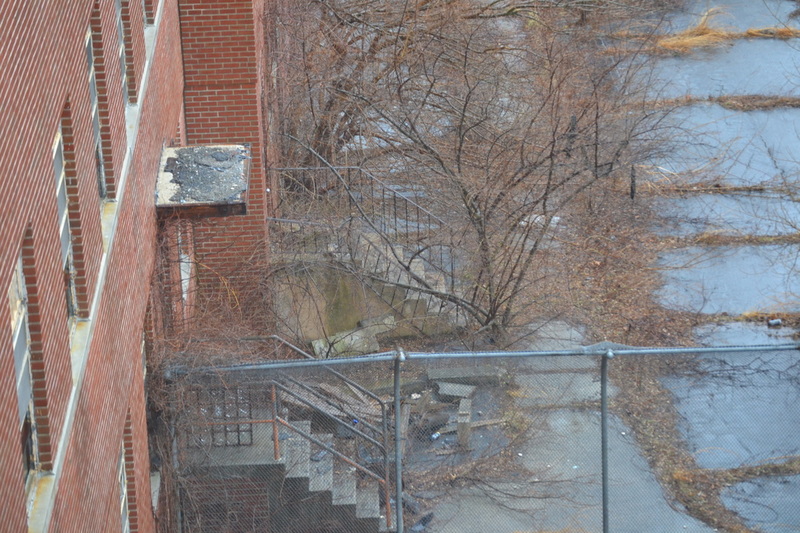 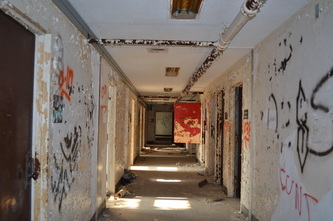 Some of the more violent patients were housed here on the upper floors. 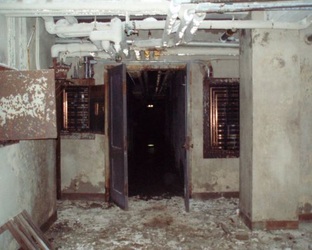 The underground steam tunnels reach their end beneath this building with the next nearest building access being the basement of Building 7. 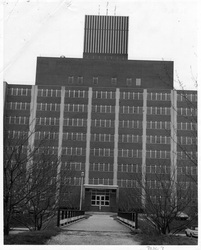 This building is very similar in design to its sister, Building 21. 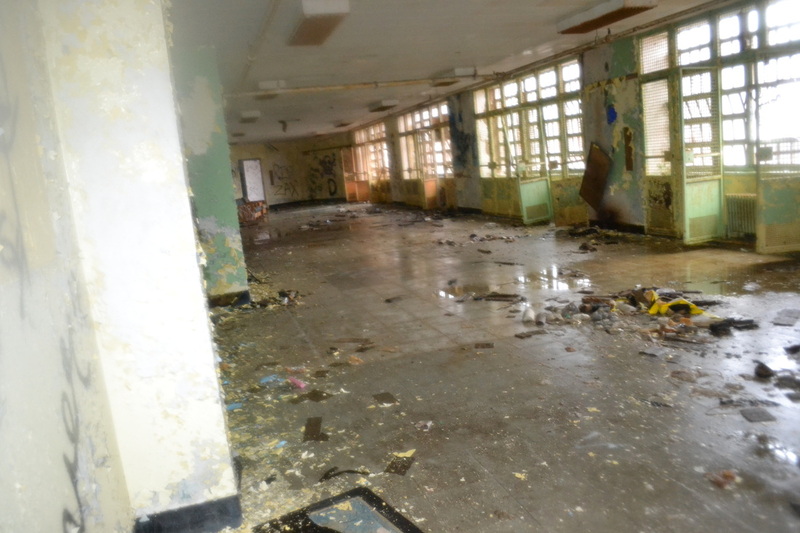 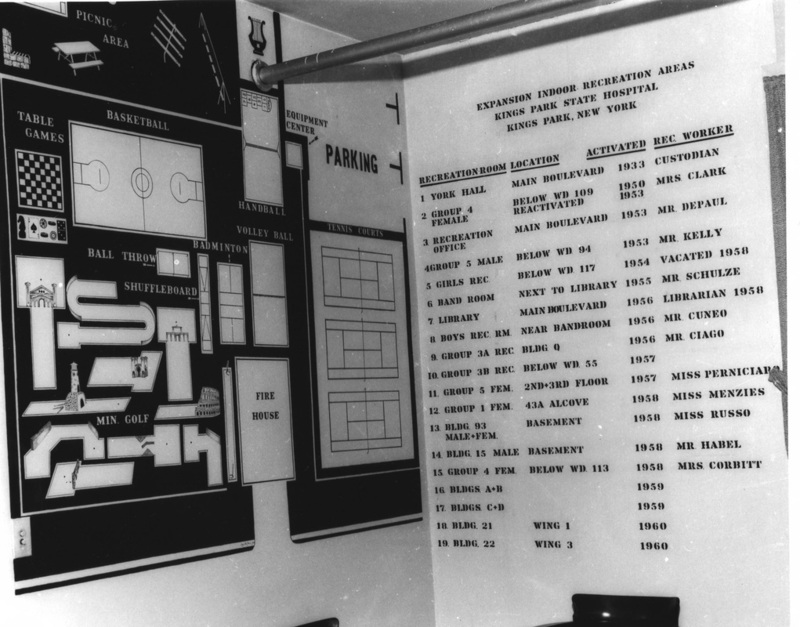 It was also built from 1957-1967 & housed wards 215-228. 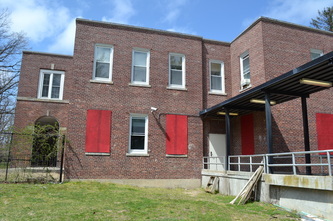 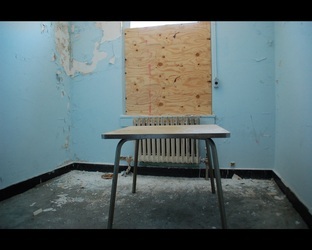 This is where the Adolescent Unit was moved to from Group 2. 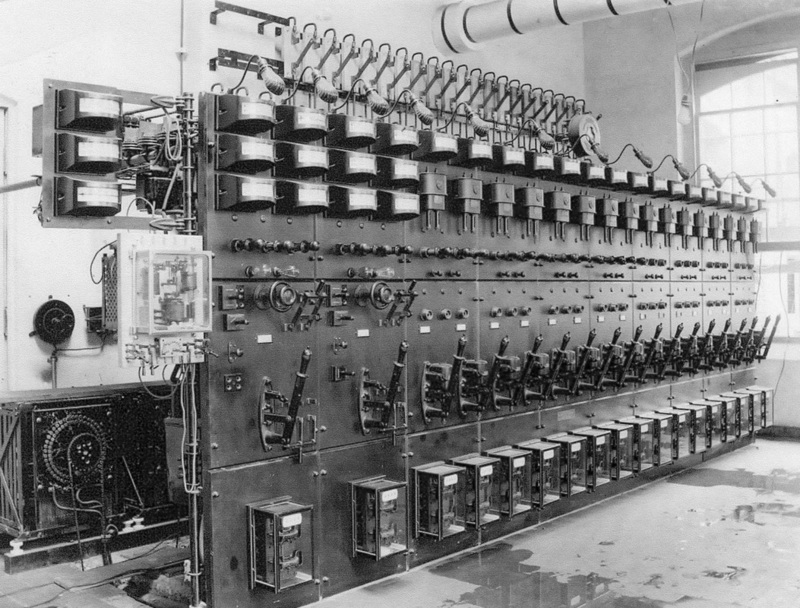 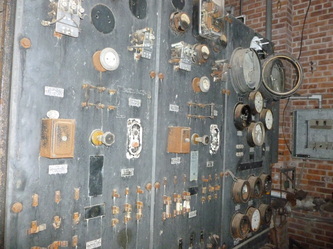 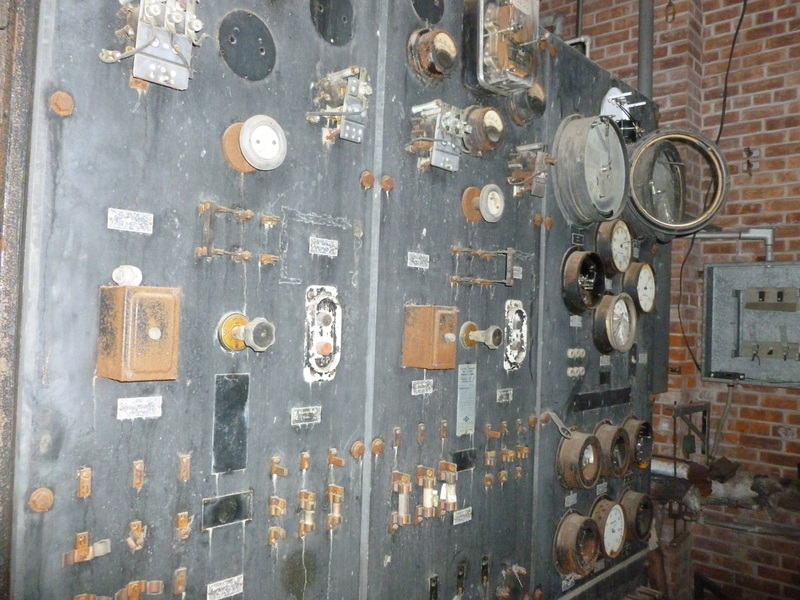 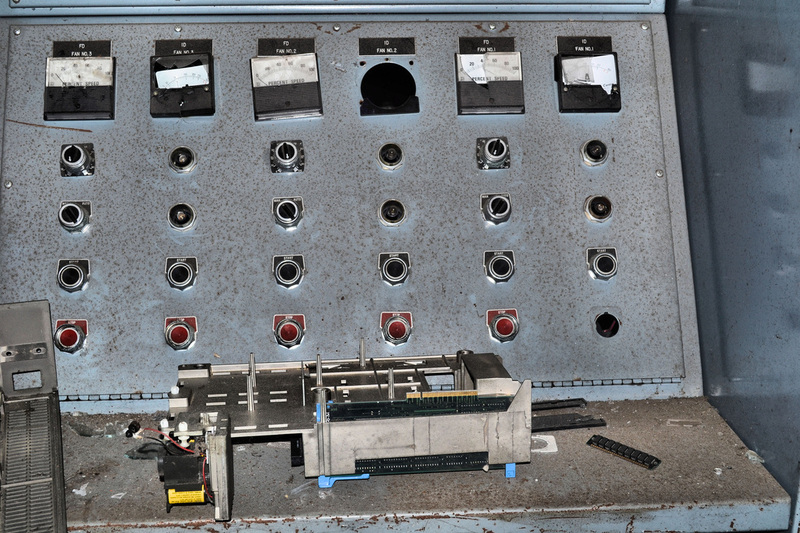 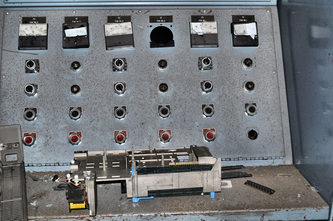 The telephone switchboard was also moved here from Building A. 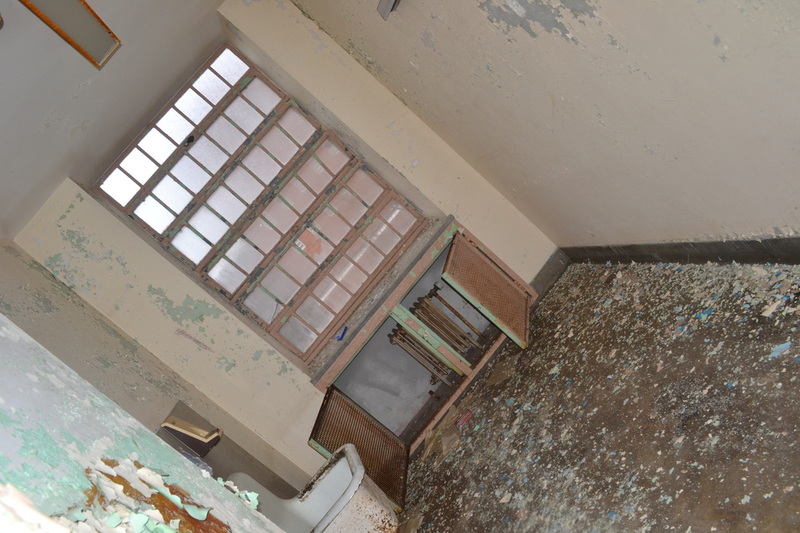 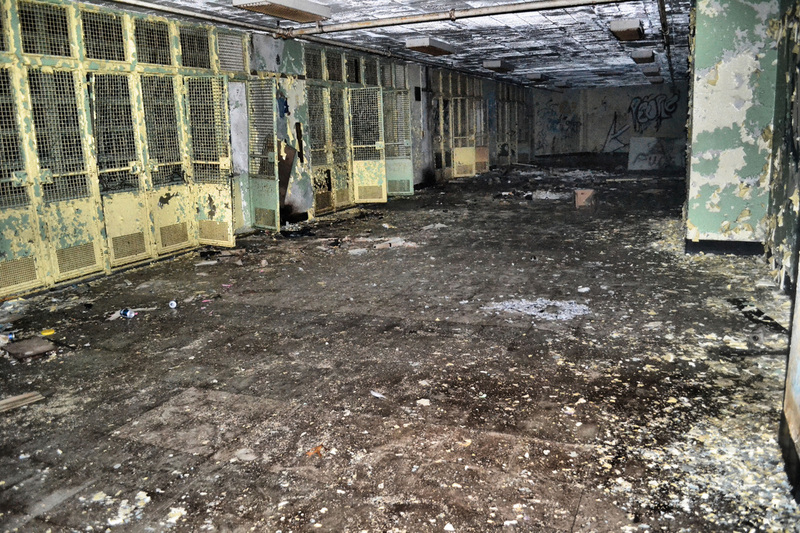 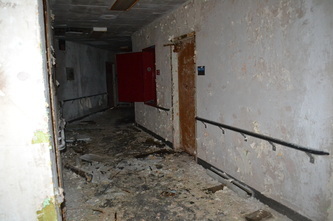 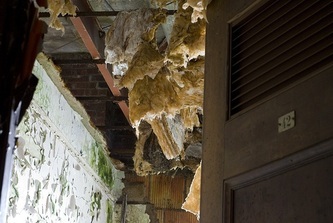 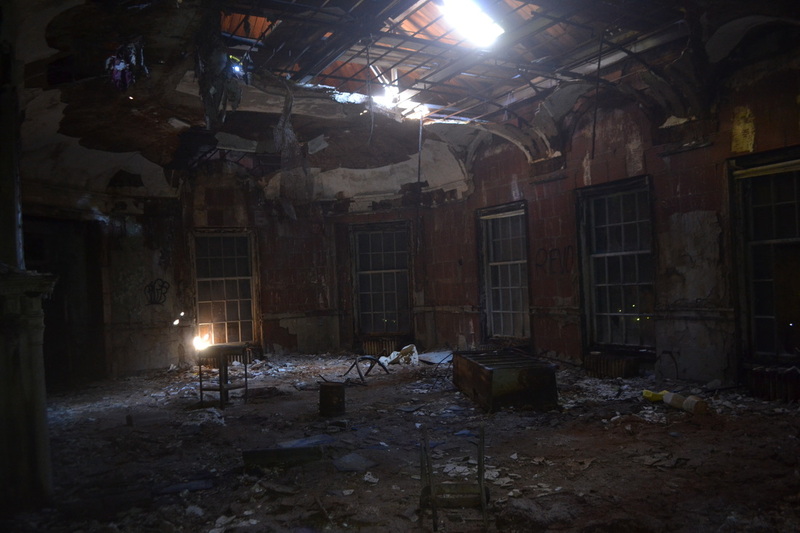 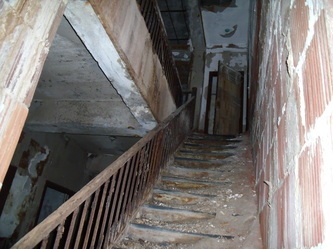 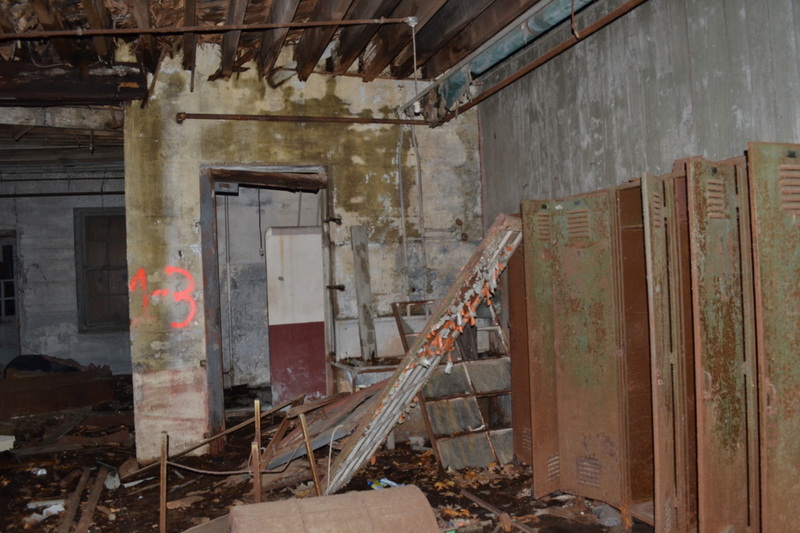 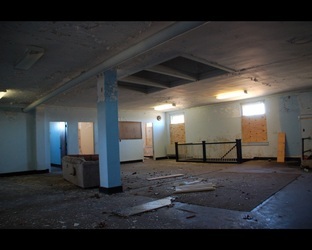 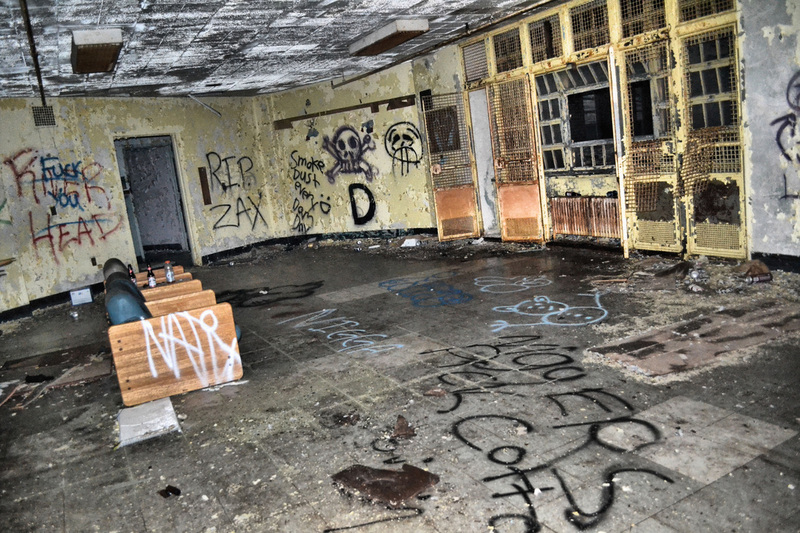 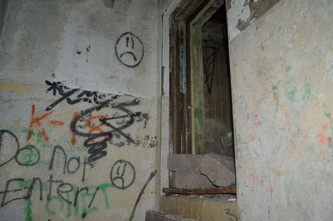 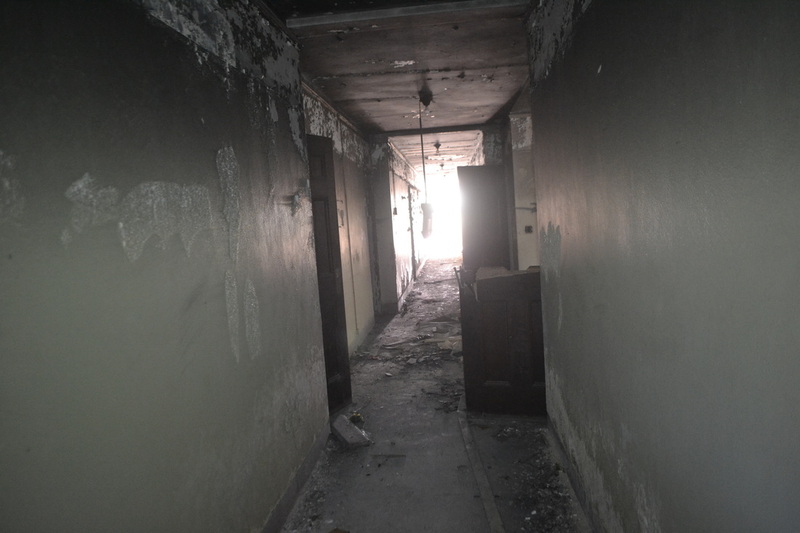 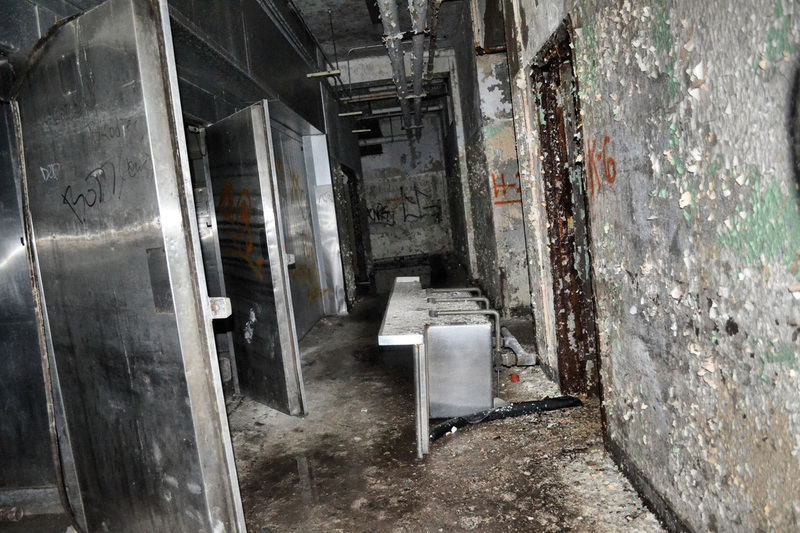 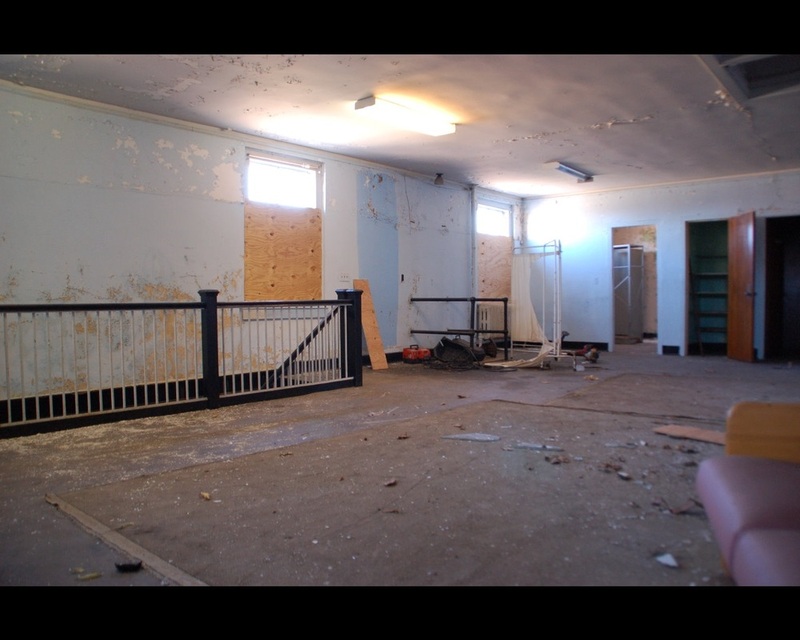 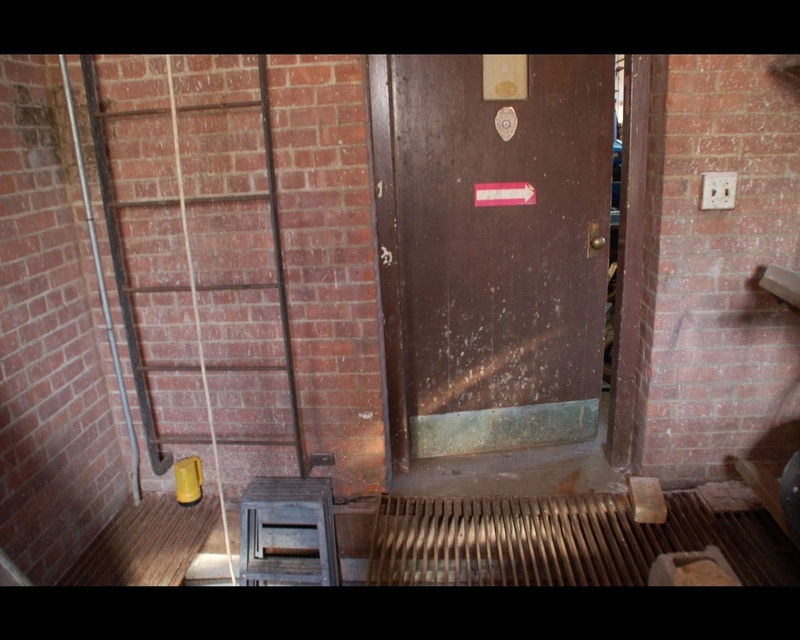 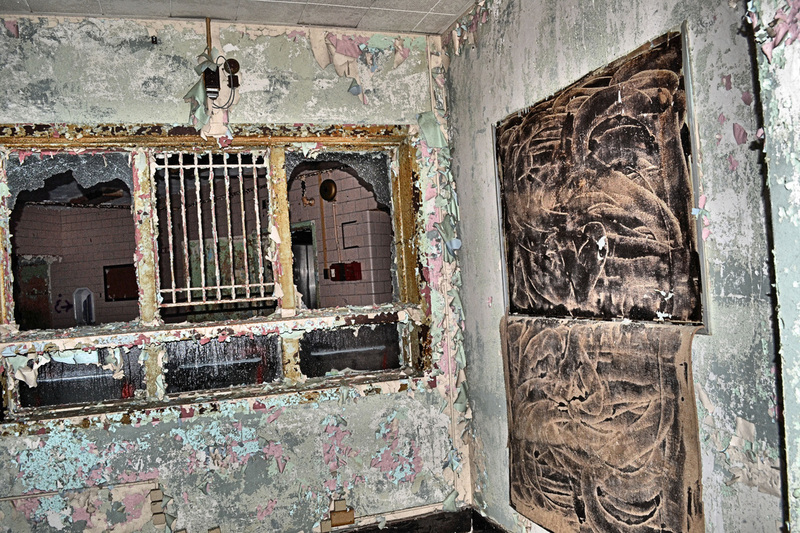 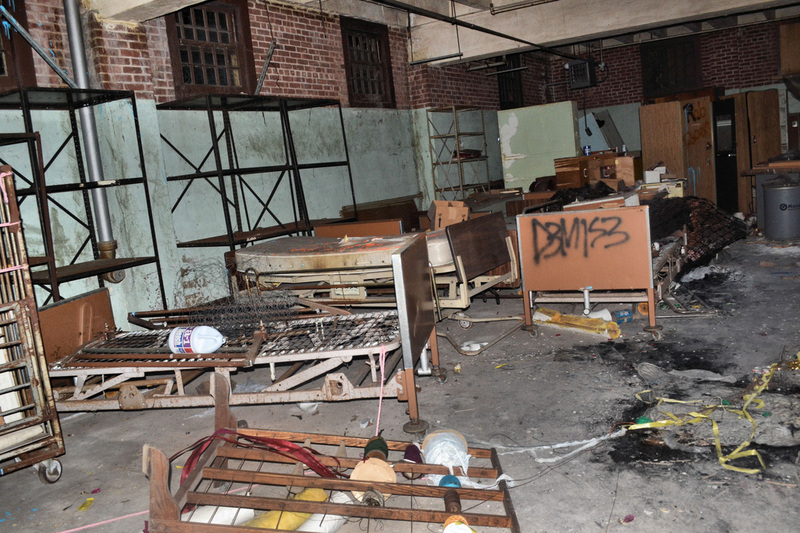 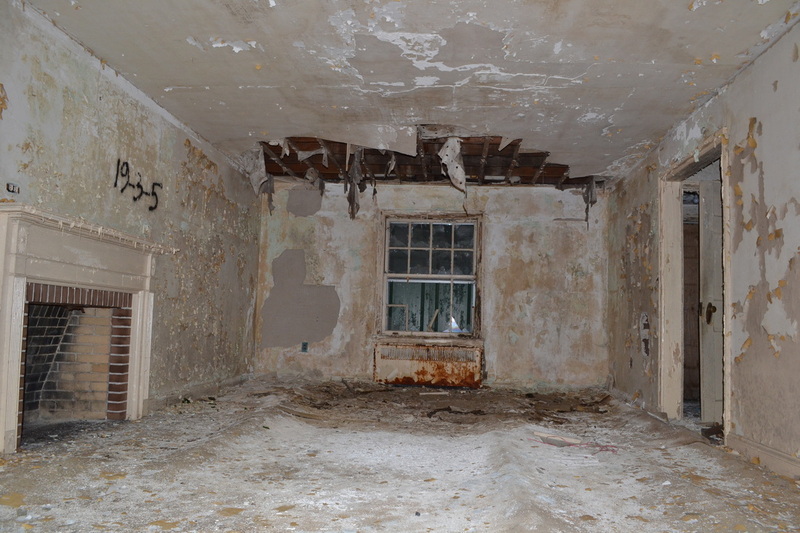 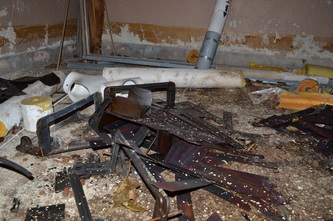 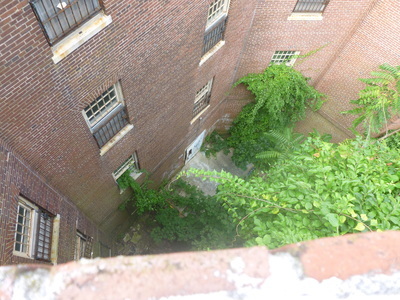 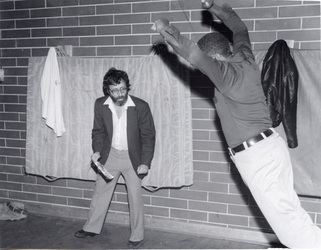 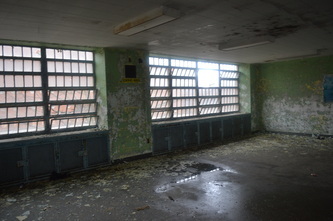 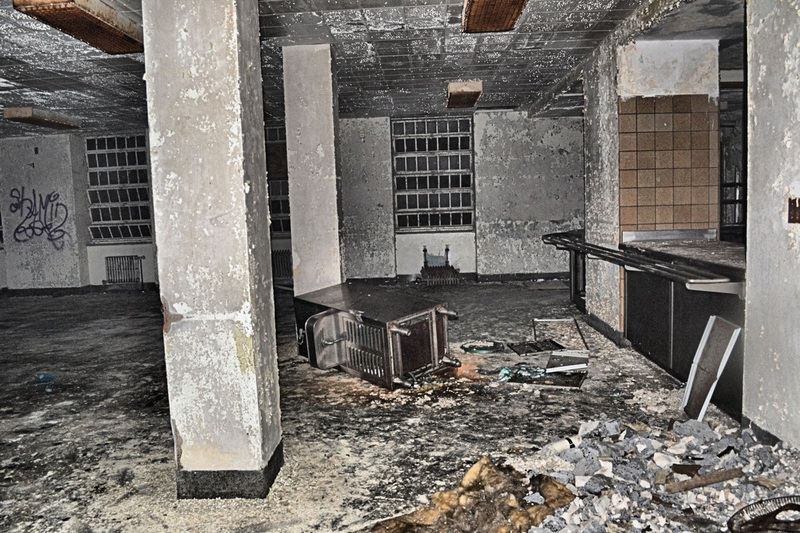 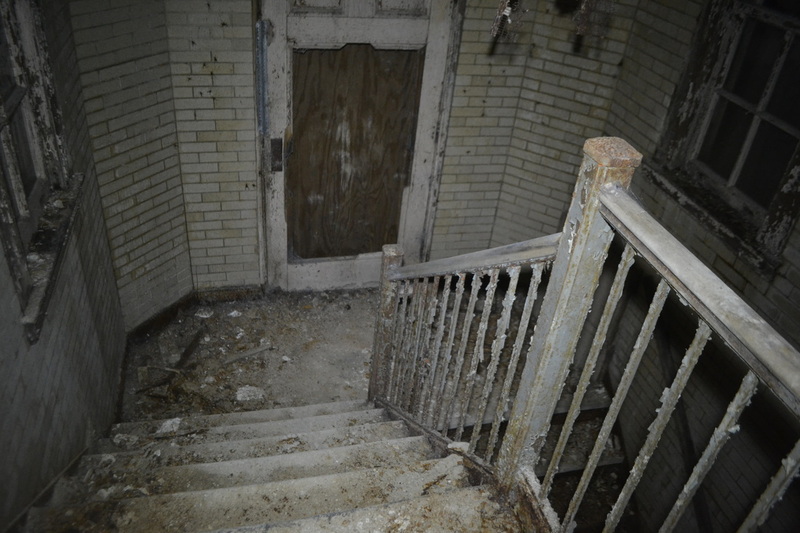 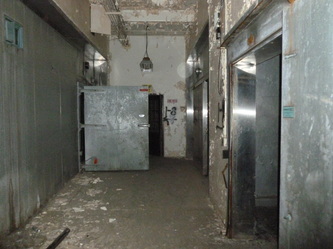 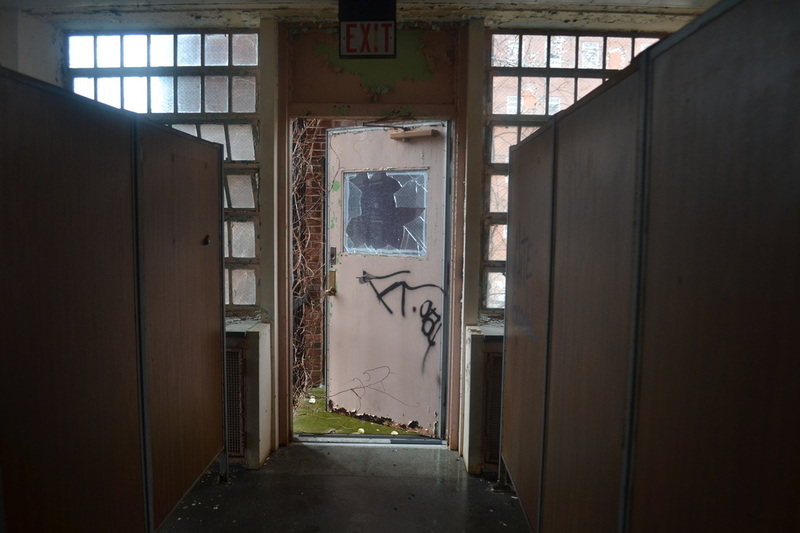 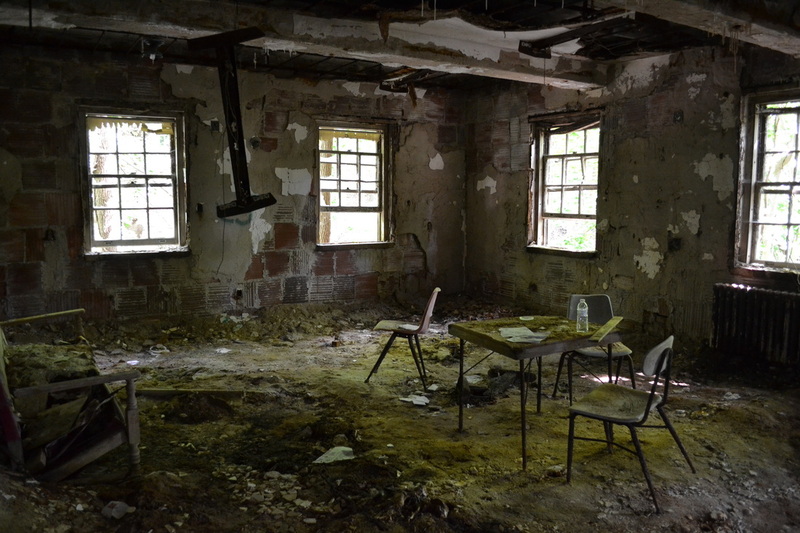 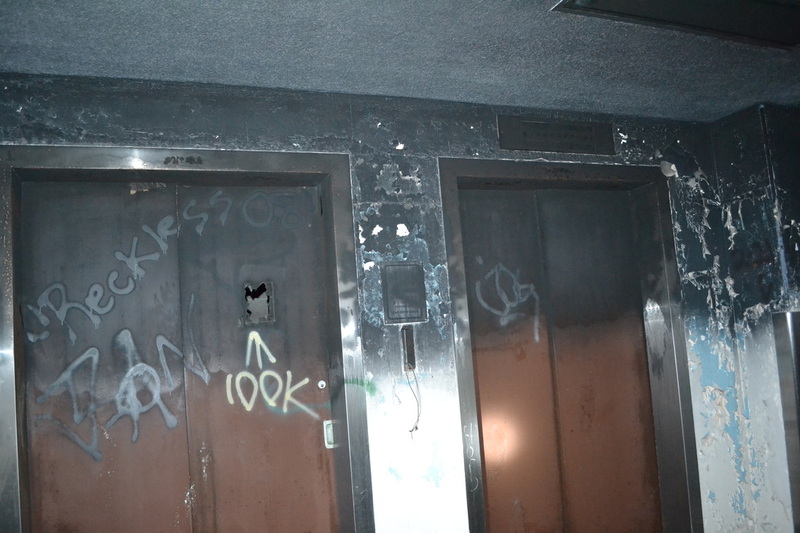 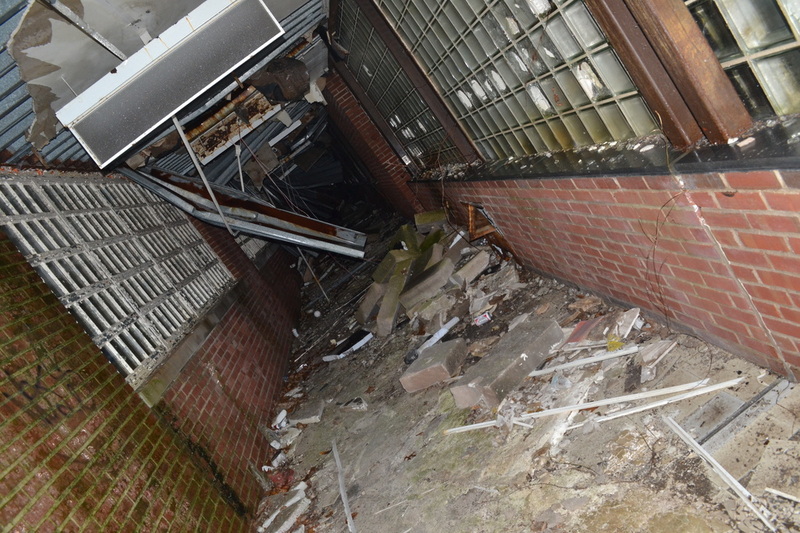 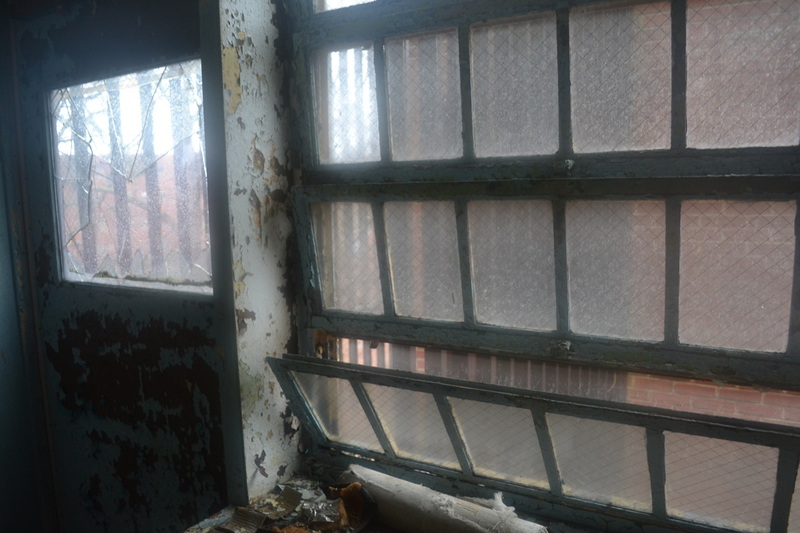 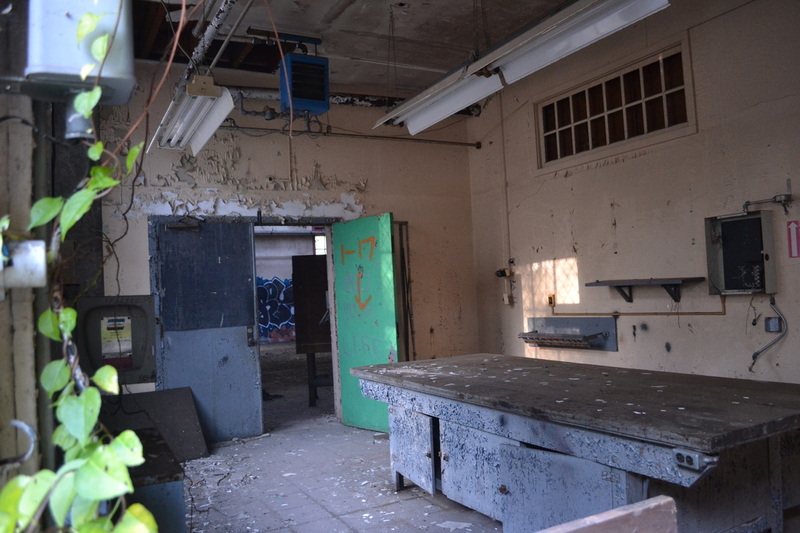 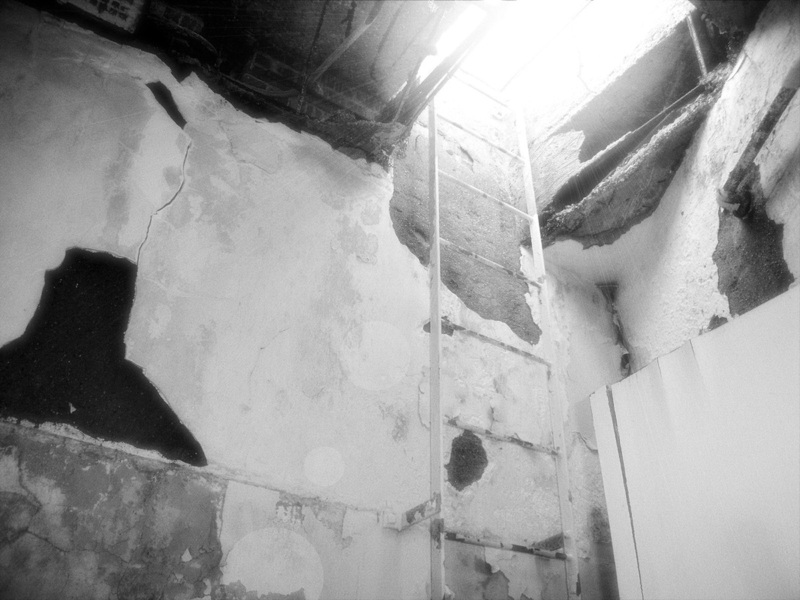 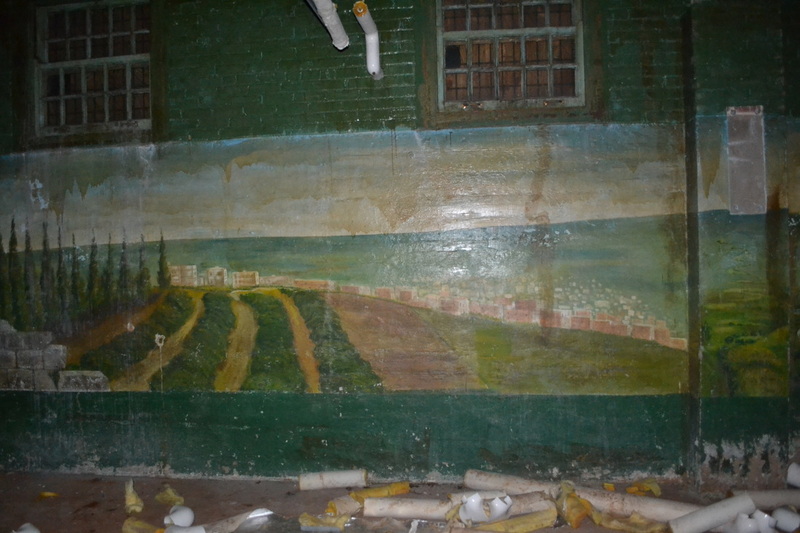 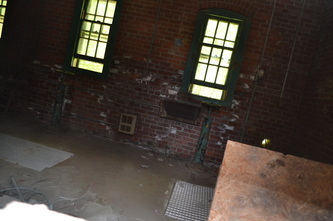 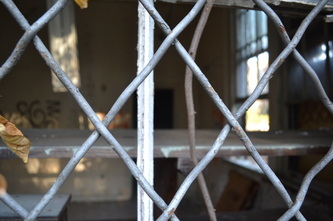 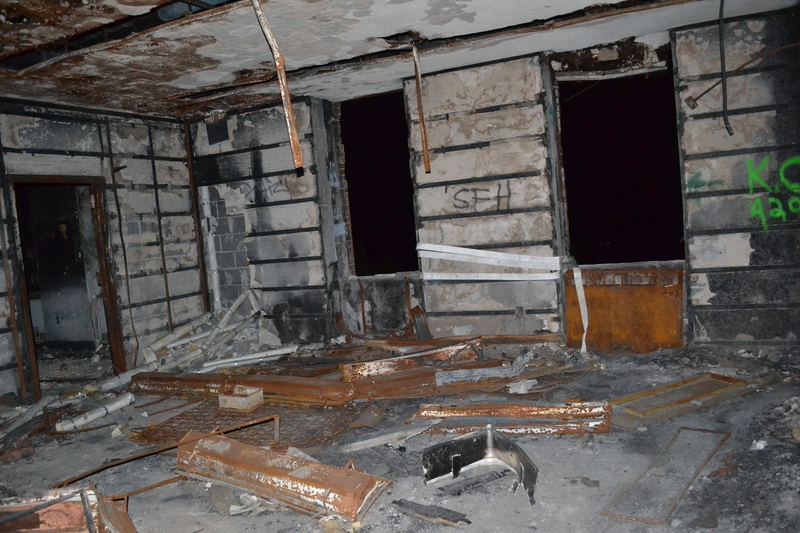 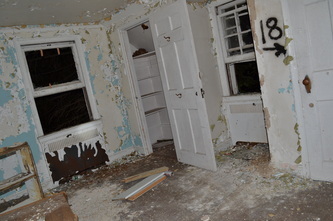 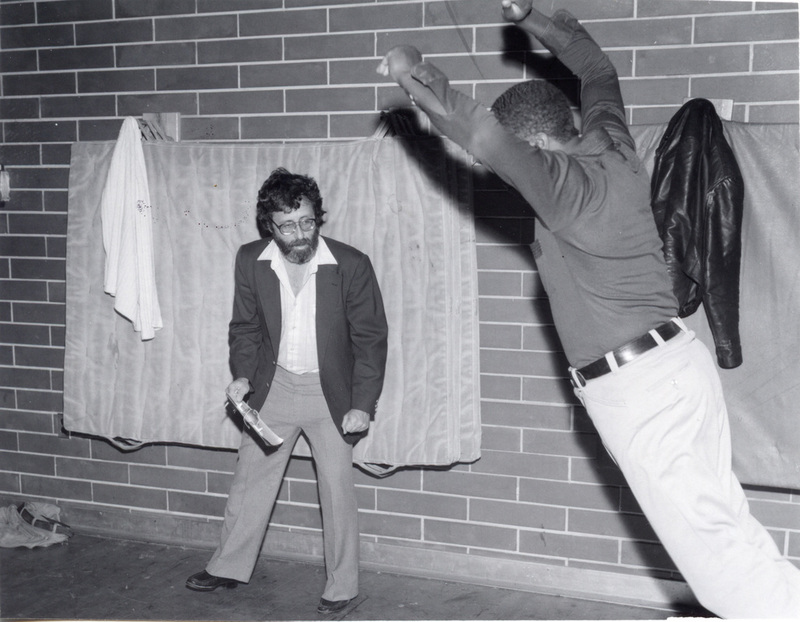 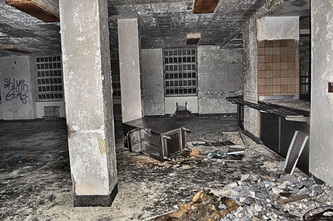 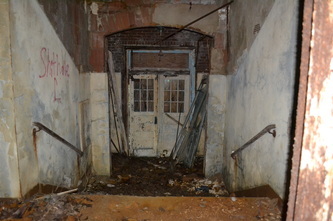 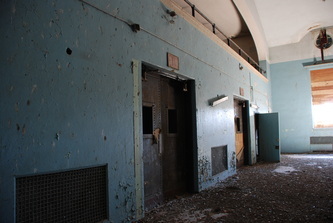 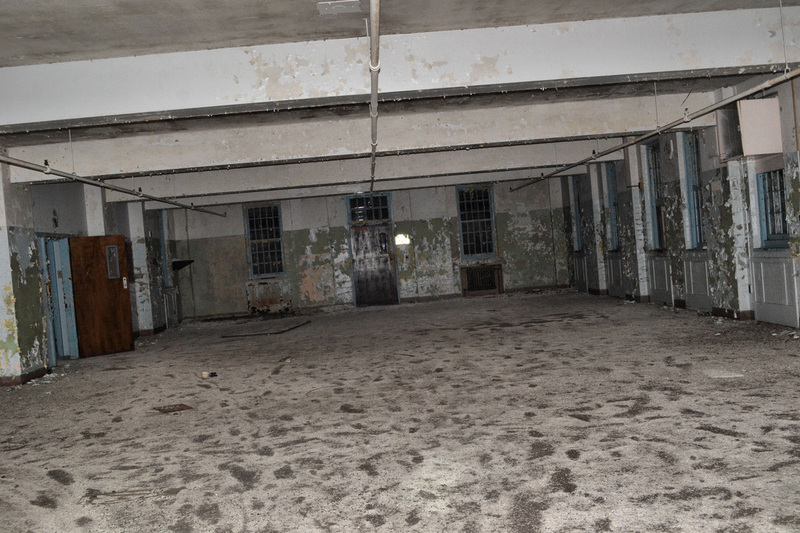 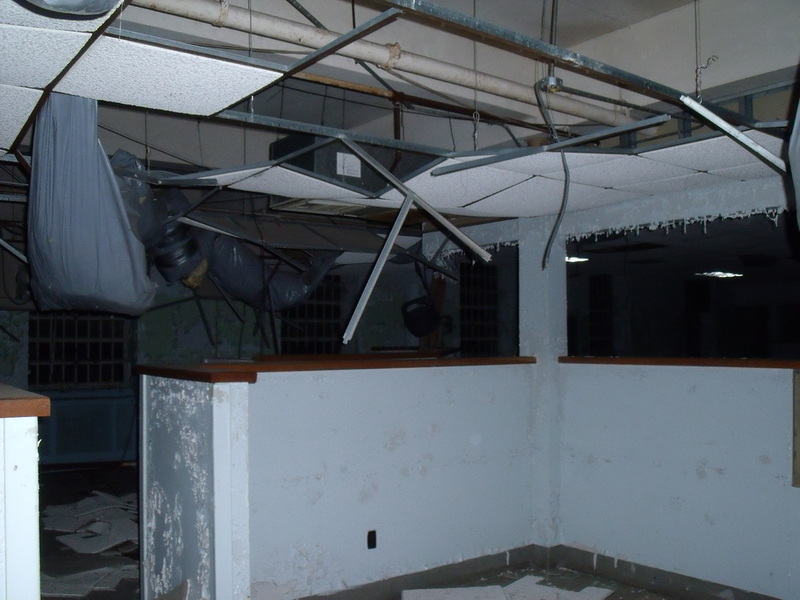 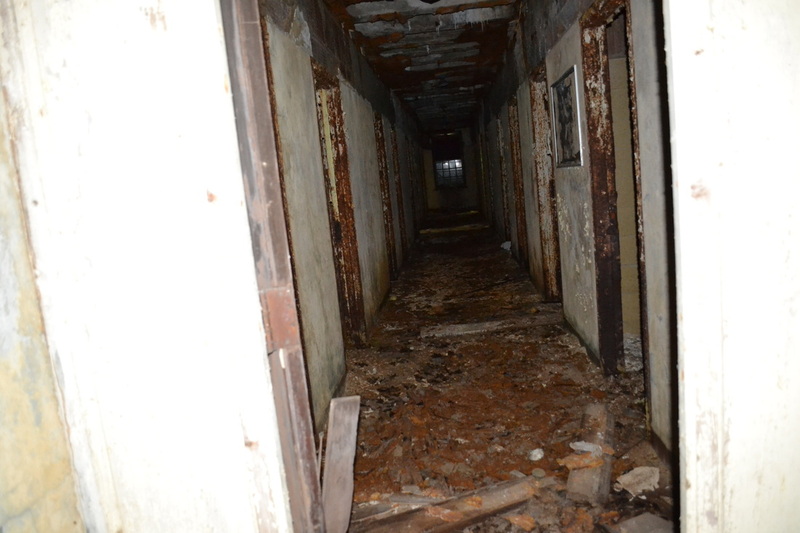 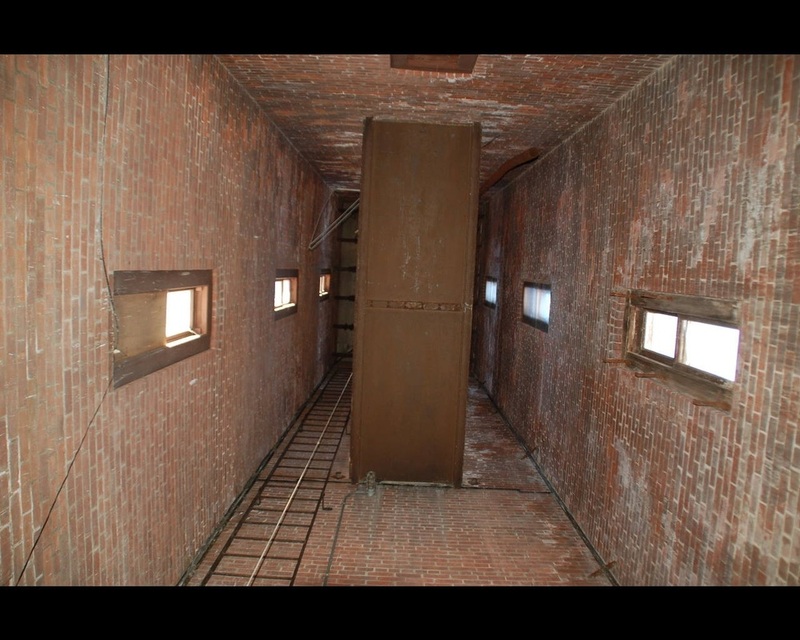 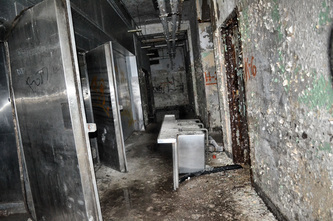 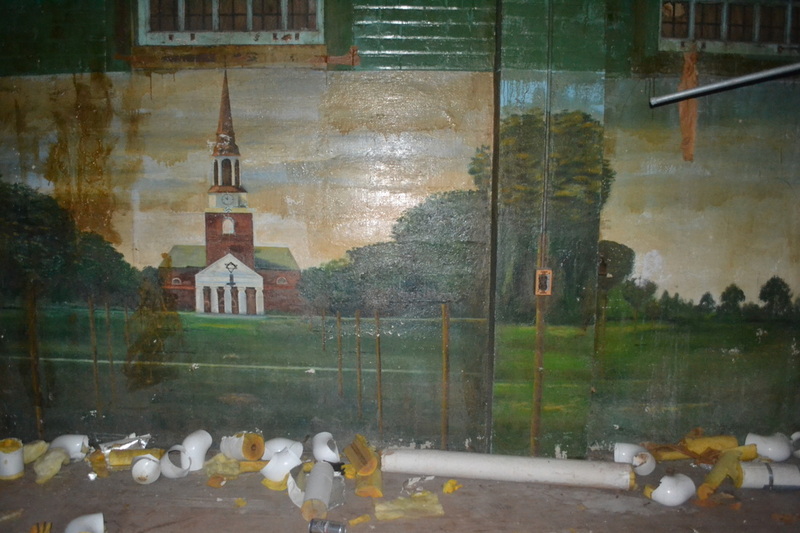 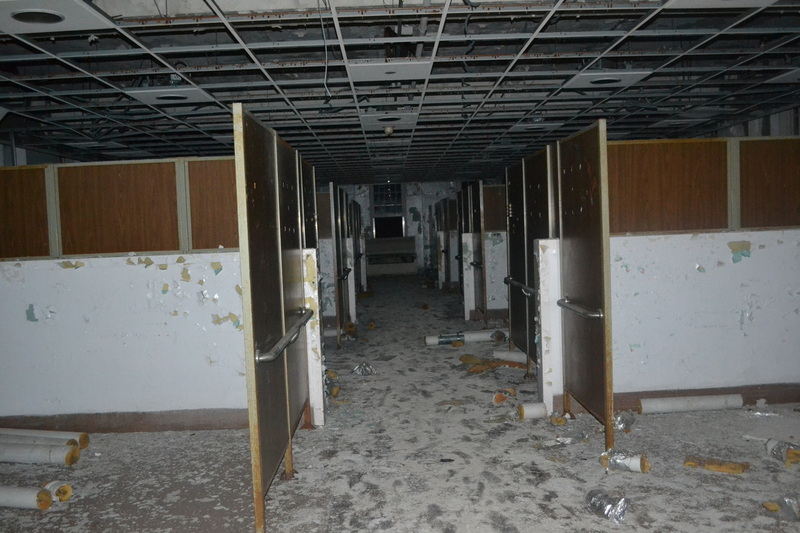 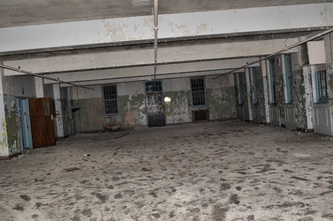 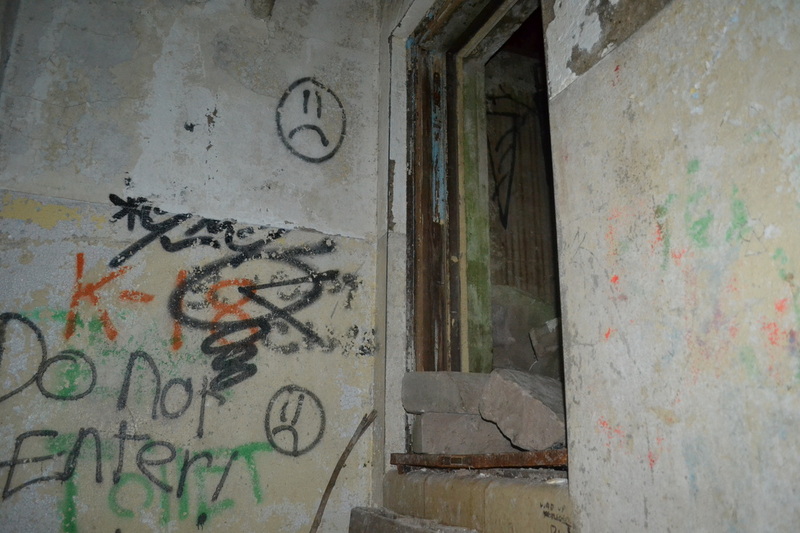 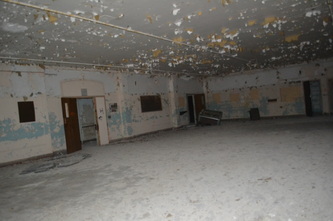 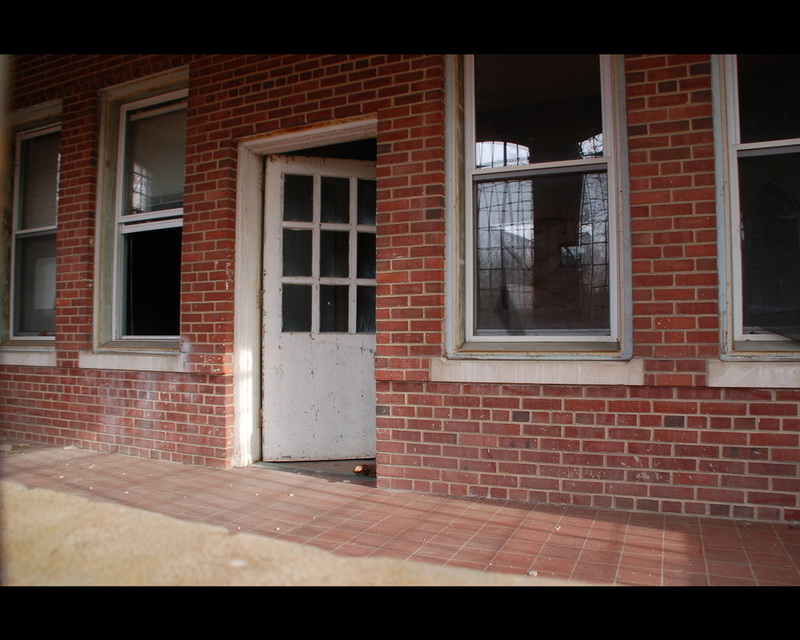 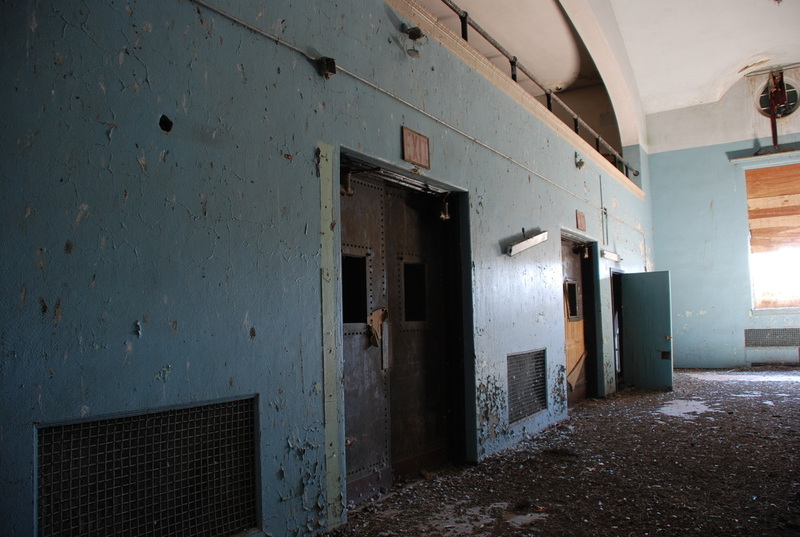 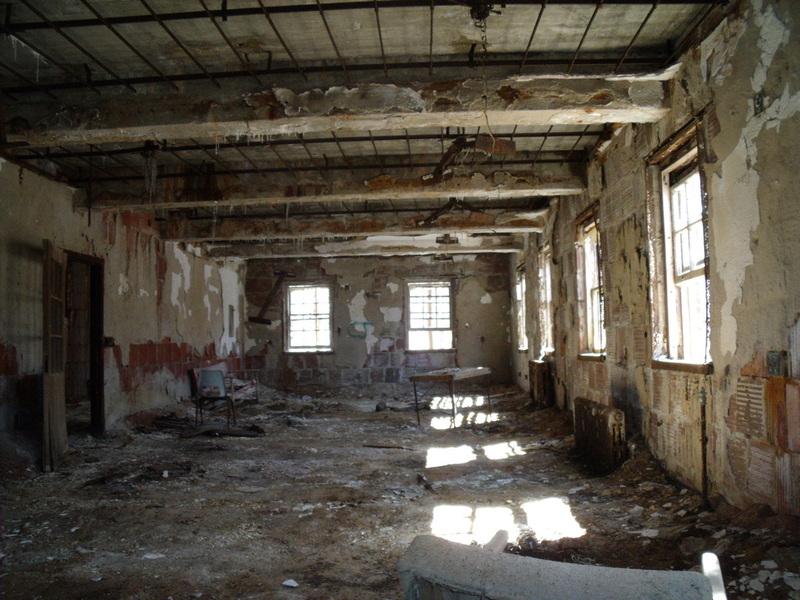 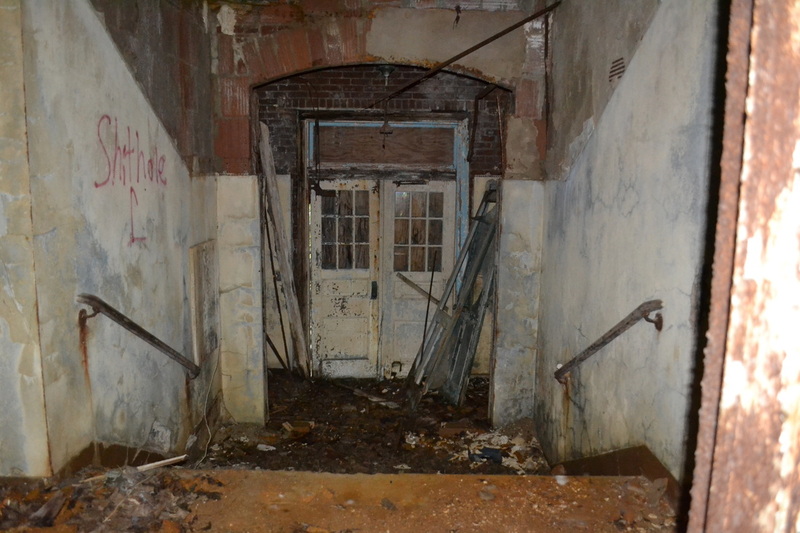 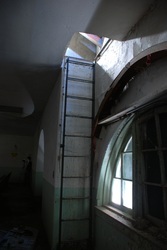 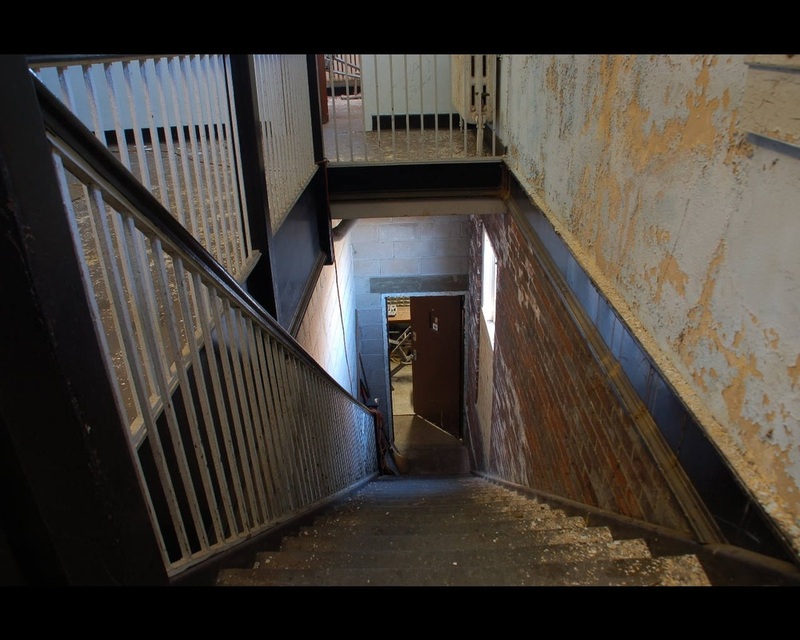 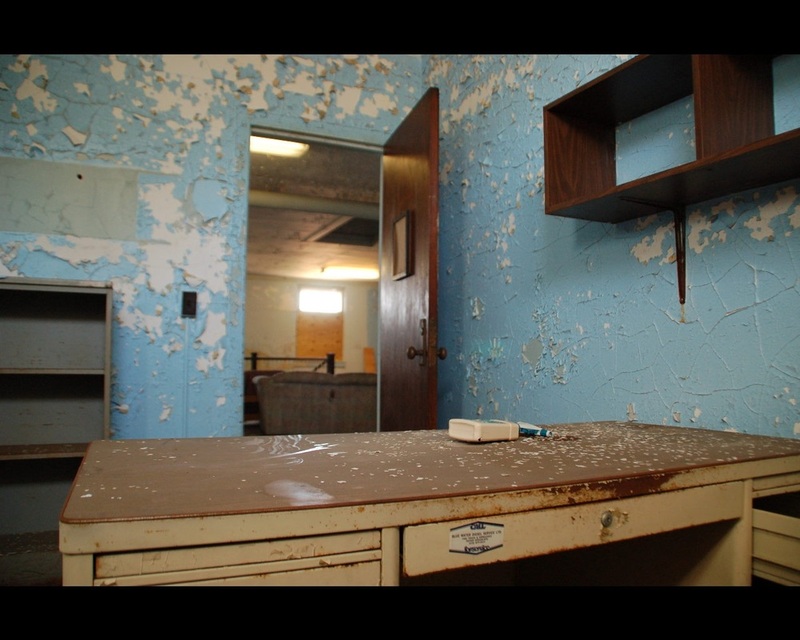 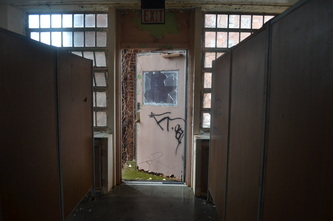 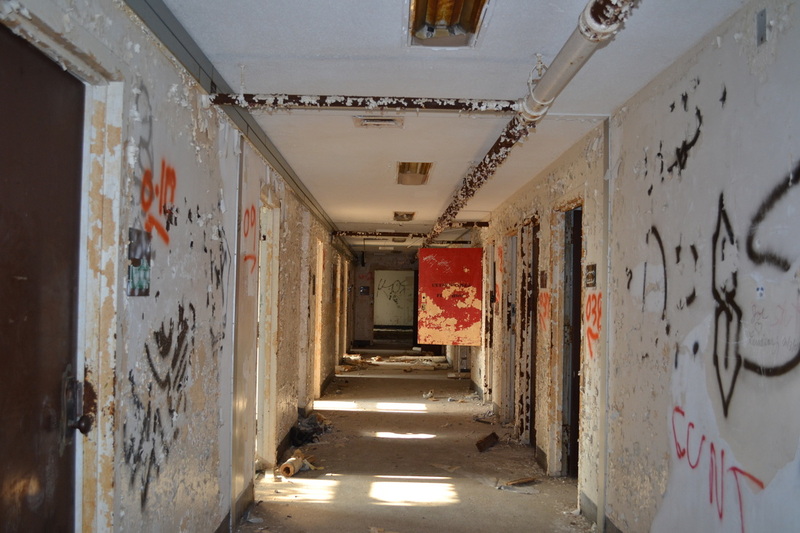 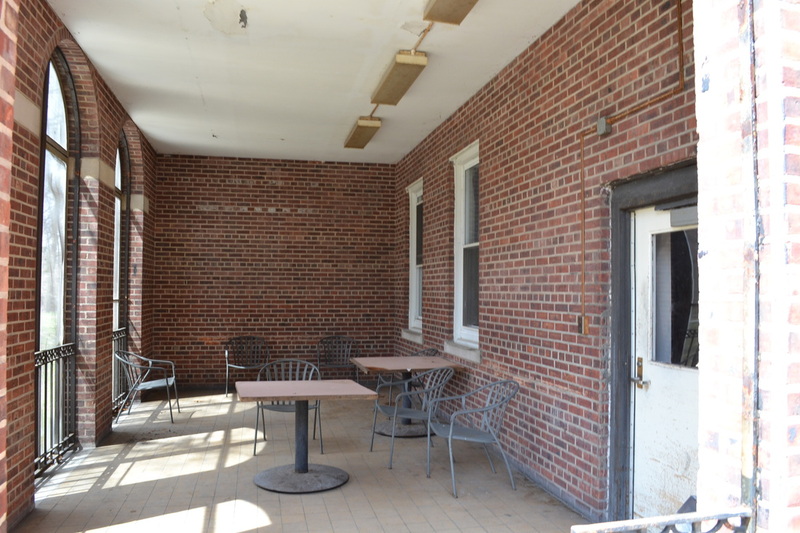 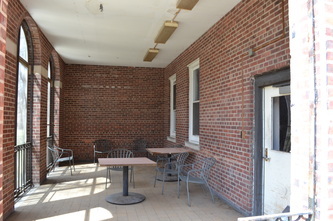 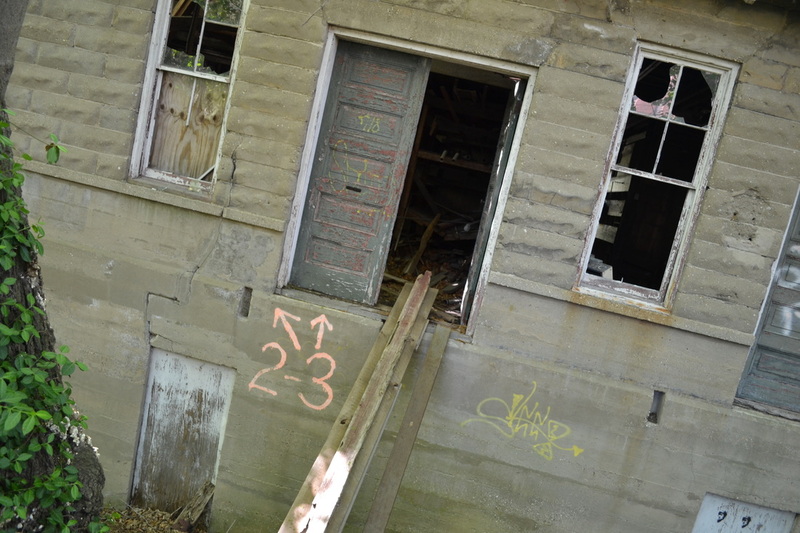 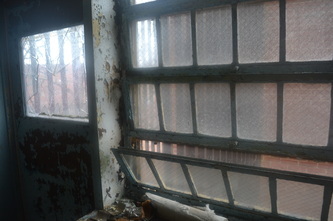 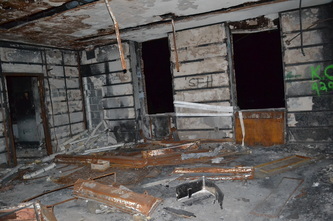 On the fourth floor was a section set aside for mentally ill prisoners in the custody of the Sheriff's Department. There was also a ward for the elderly on the fourth floor. 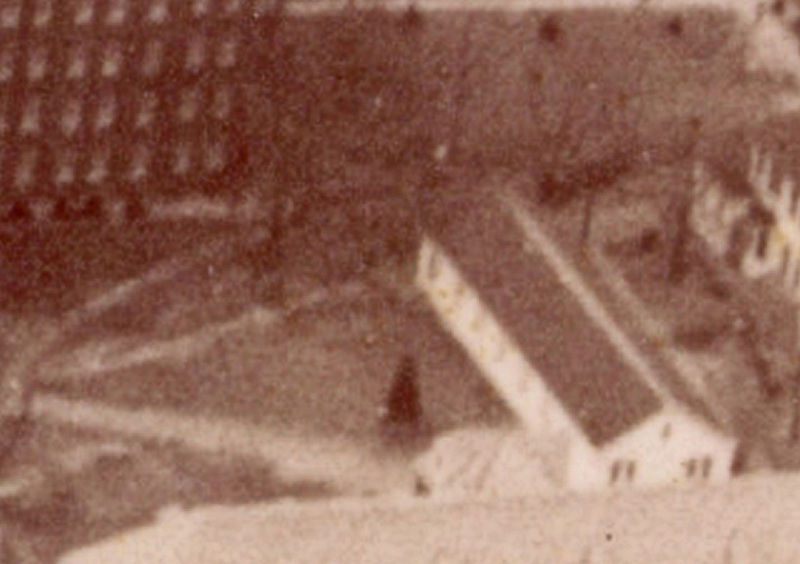 This original cottage was home to the steward of the hospital. 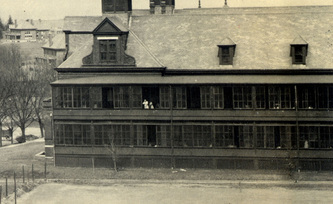 It was built from 1887-1889 & located directly across from Building A. 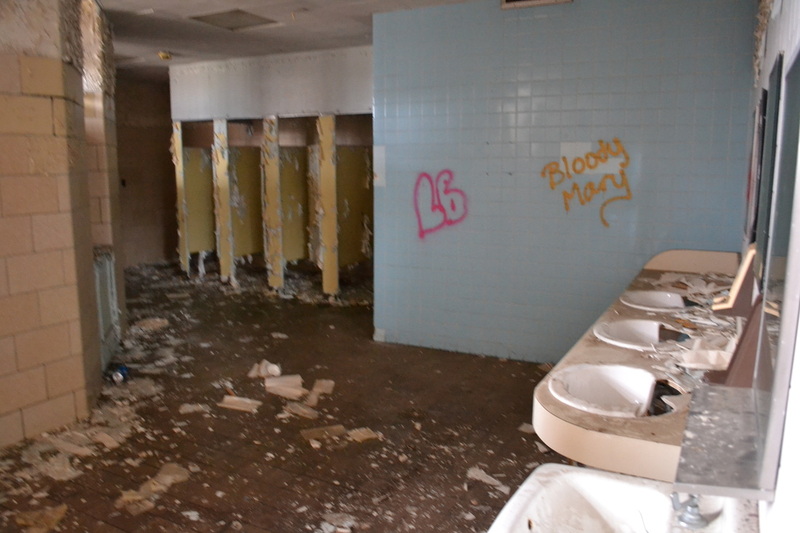 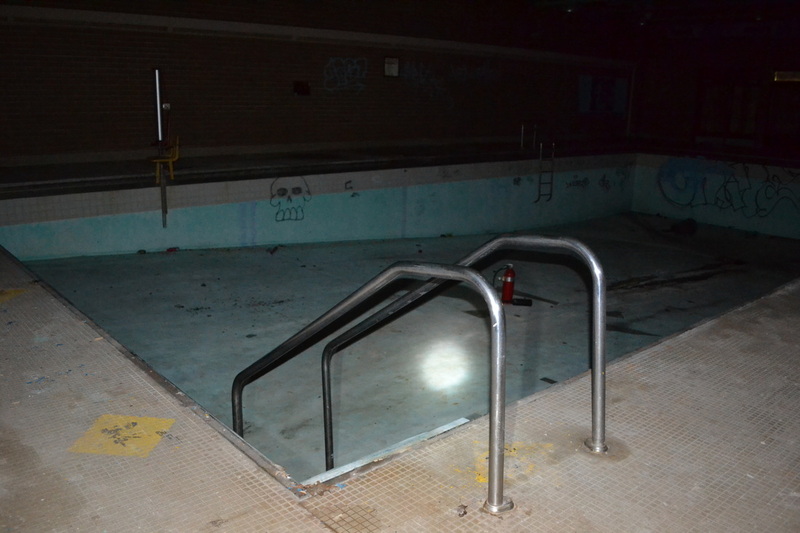 Many years after it was demolished, it's number was reused for the recreation center. 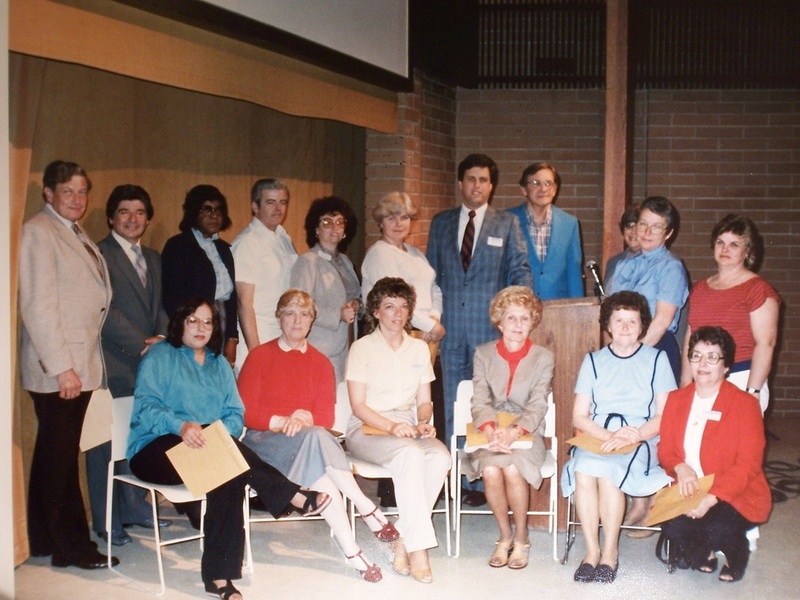 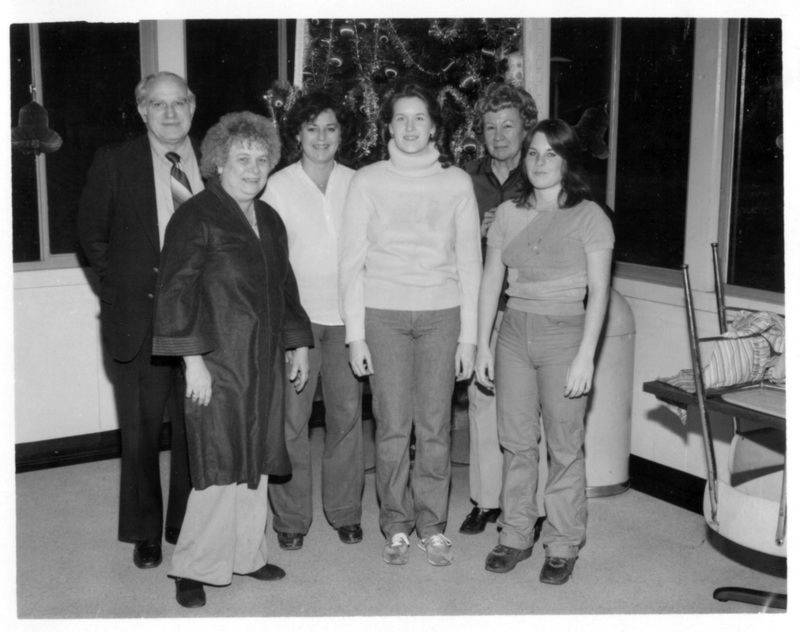 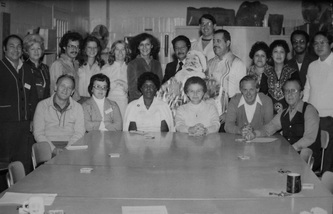 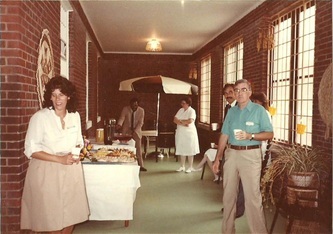 Built between 1969-1970, this recreation center was named after one of the hospital's last medical director, Dr. Charles Buckman. 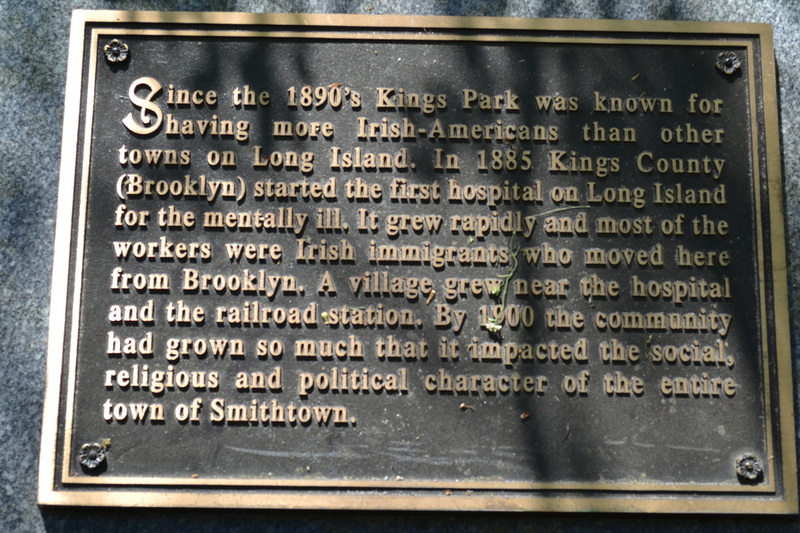 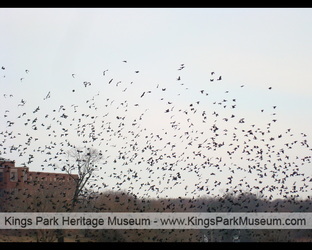 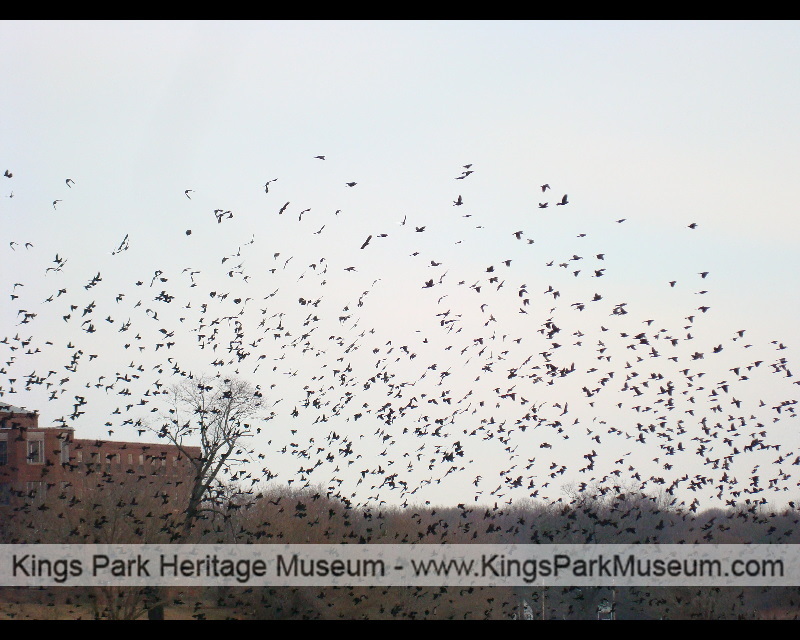 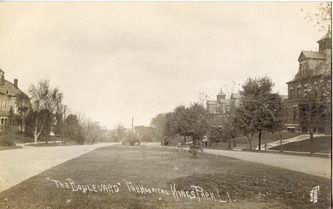 It was located on Kings Park Boulevard. 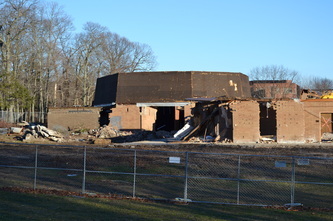 It was demolished from the end of 2012 to early 2013. 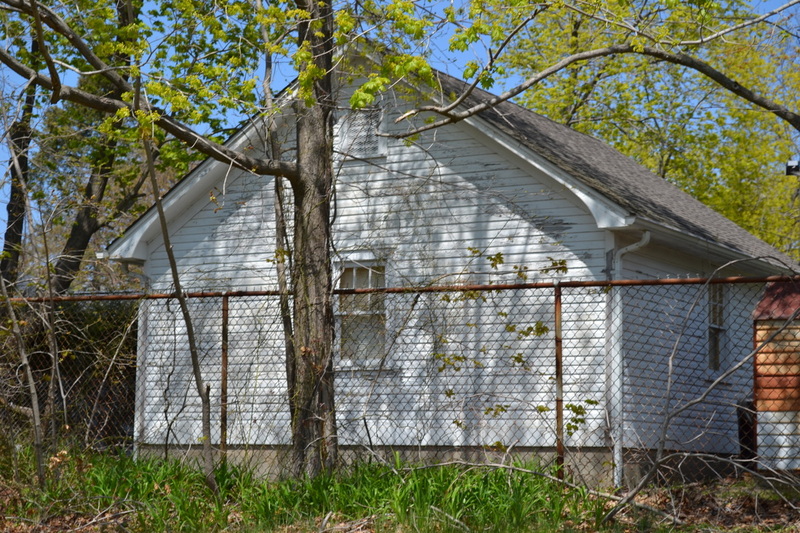 This was one of the original female cottages built between 1887-1889. 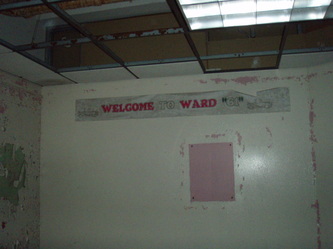 It was home to ward 24. 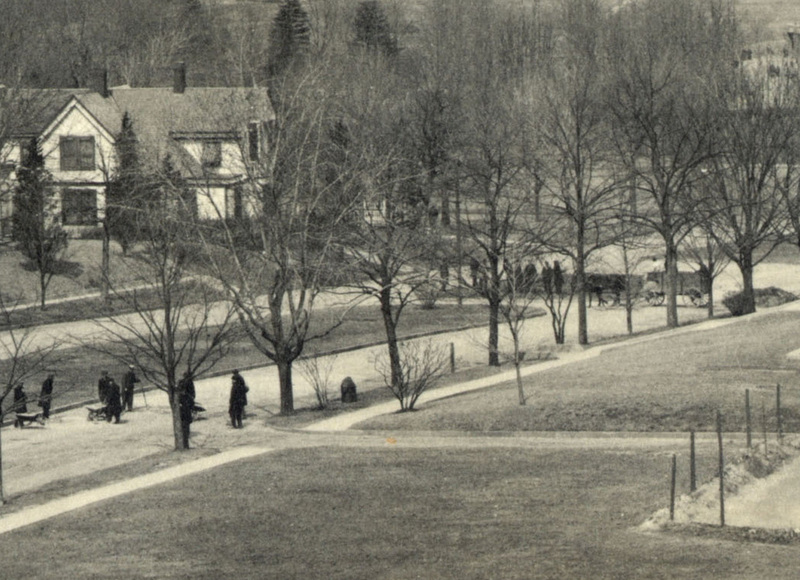 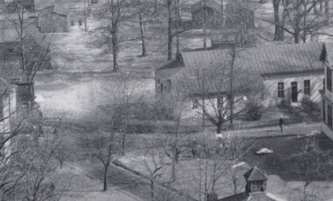 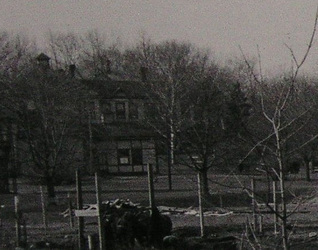 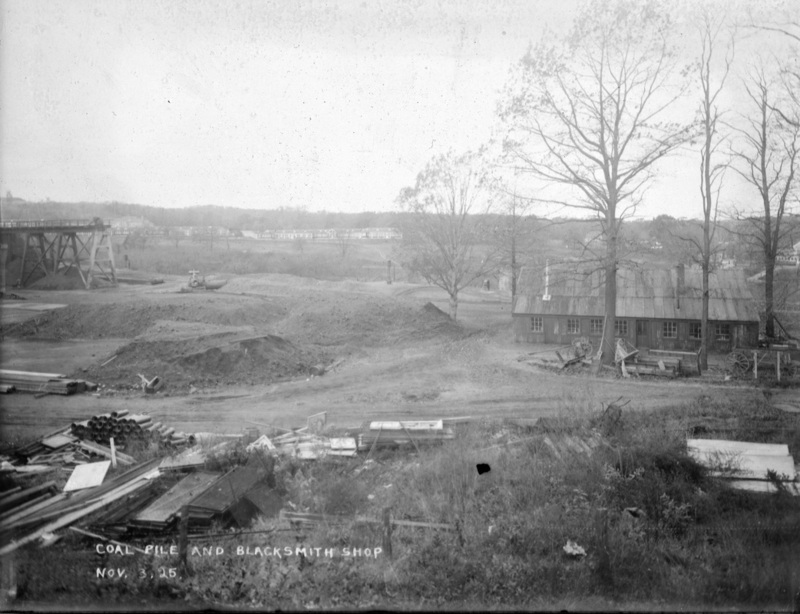 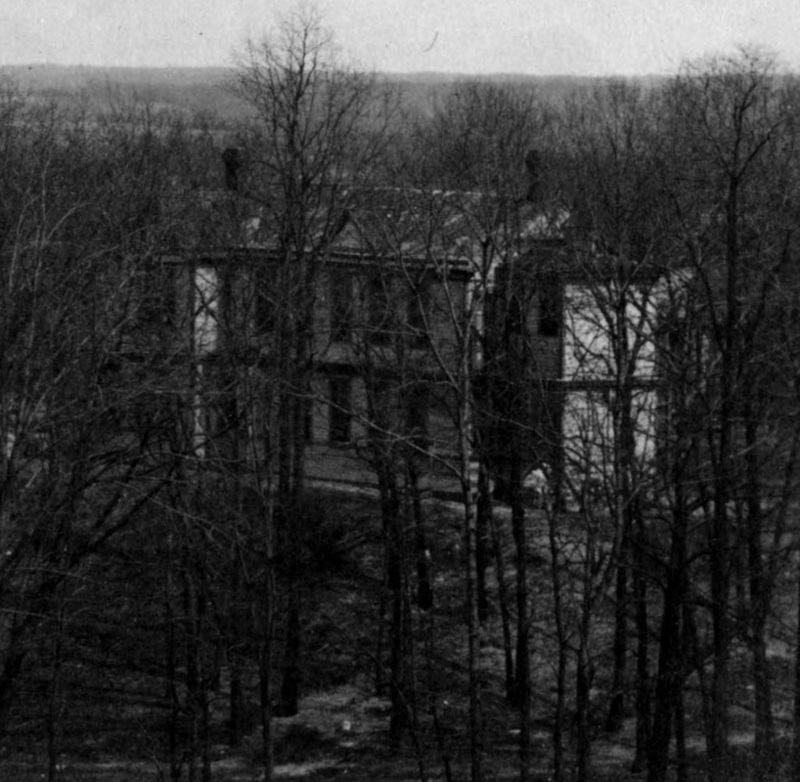 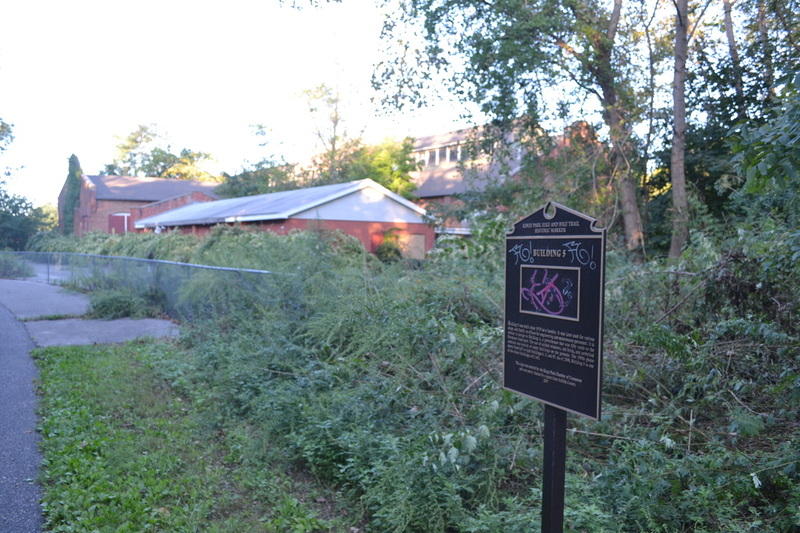 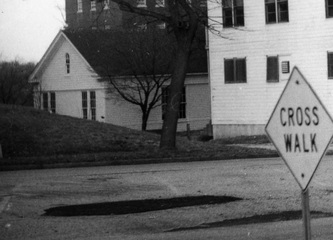 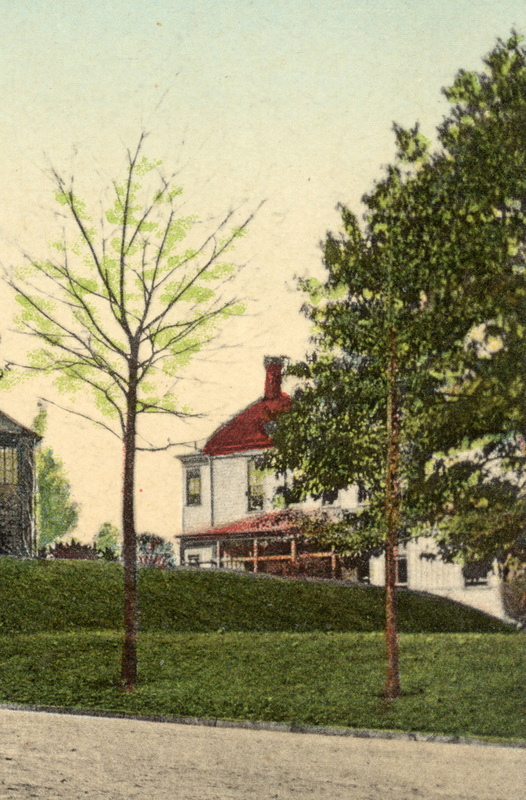 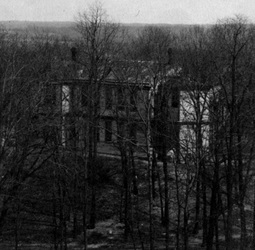 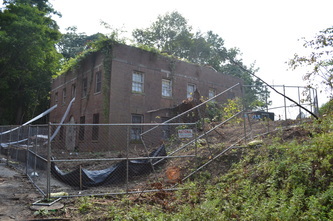 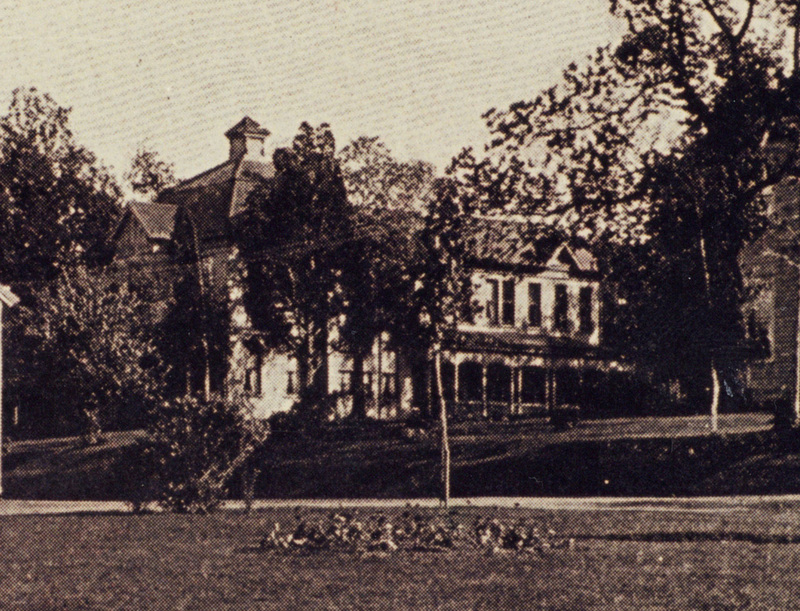 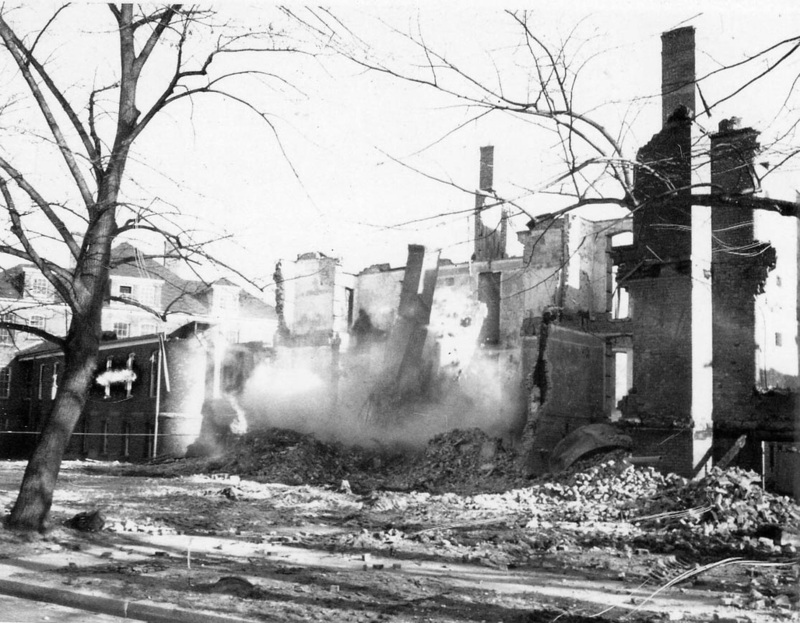 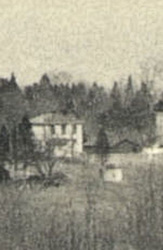 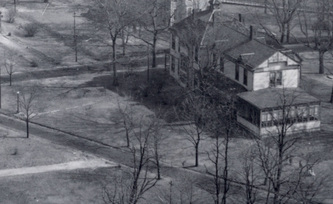 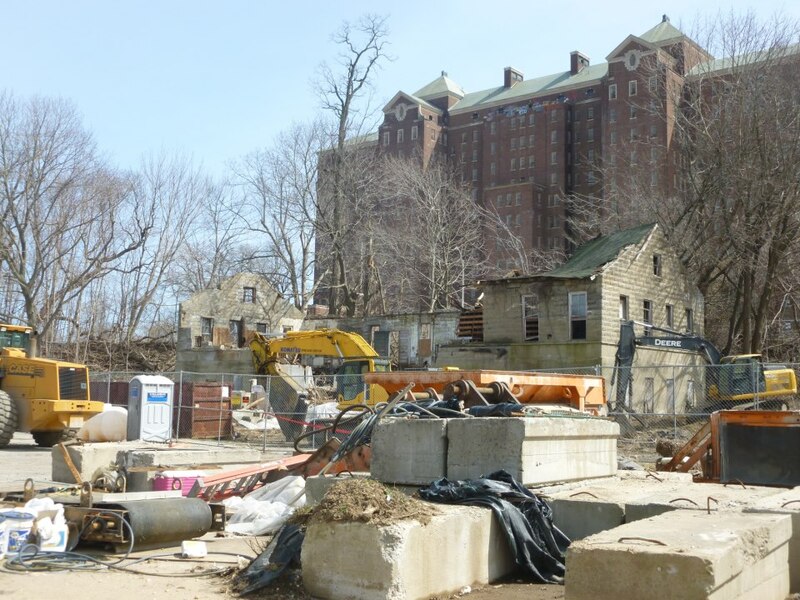 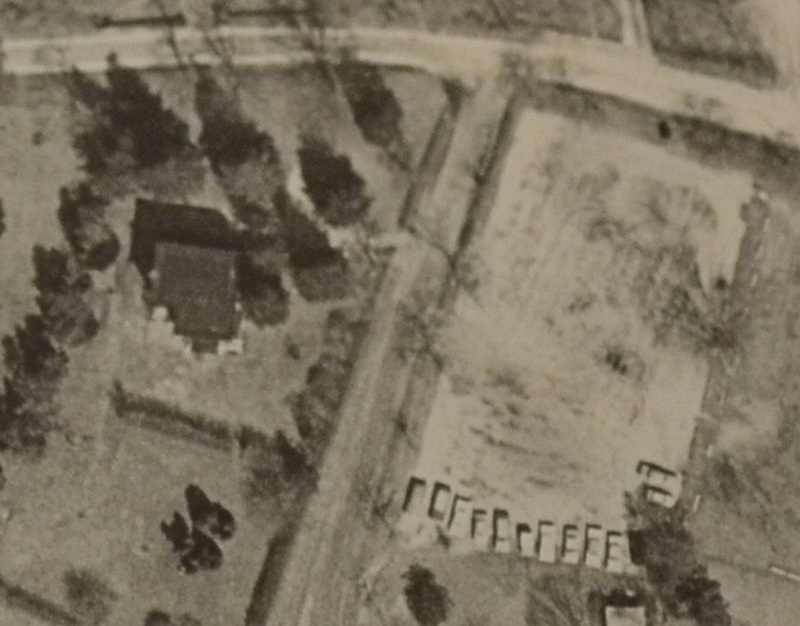 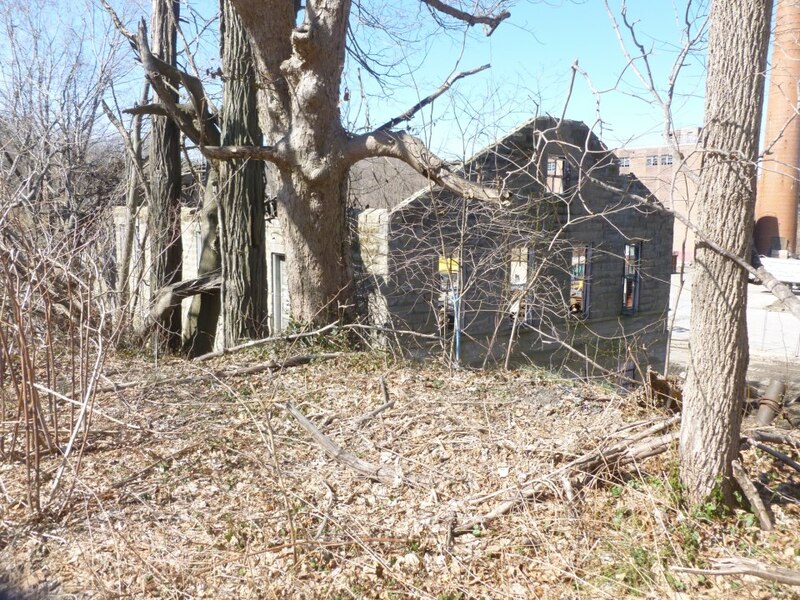 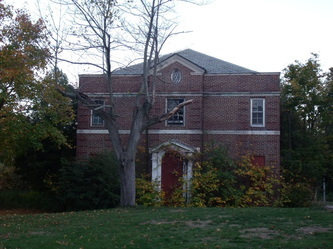 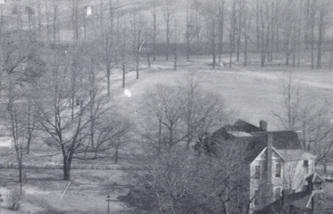 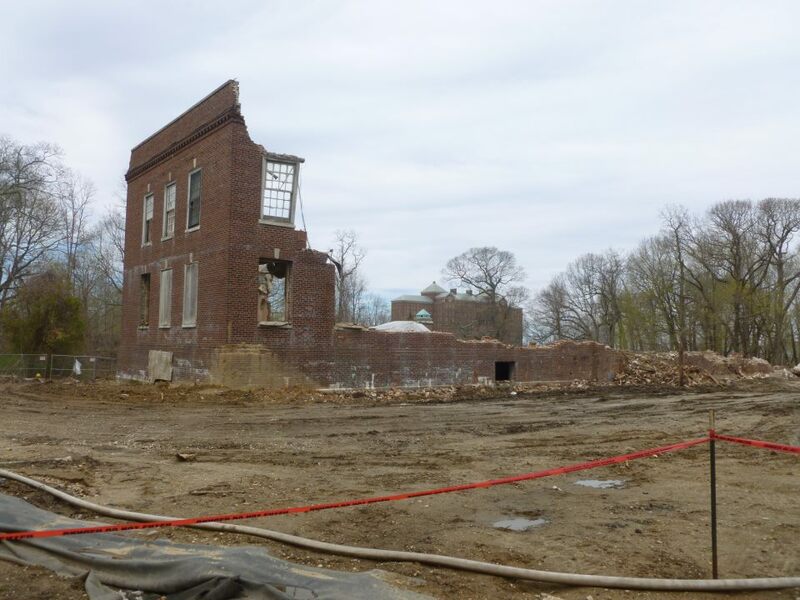 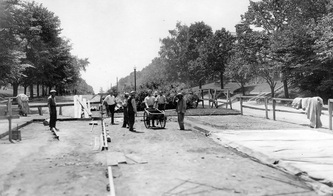 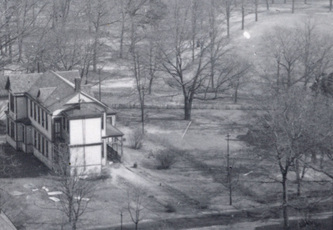 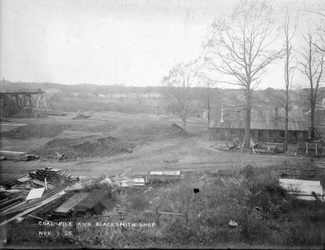 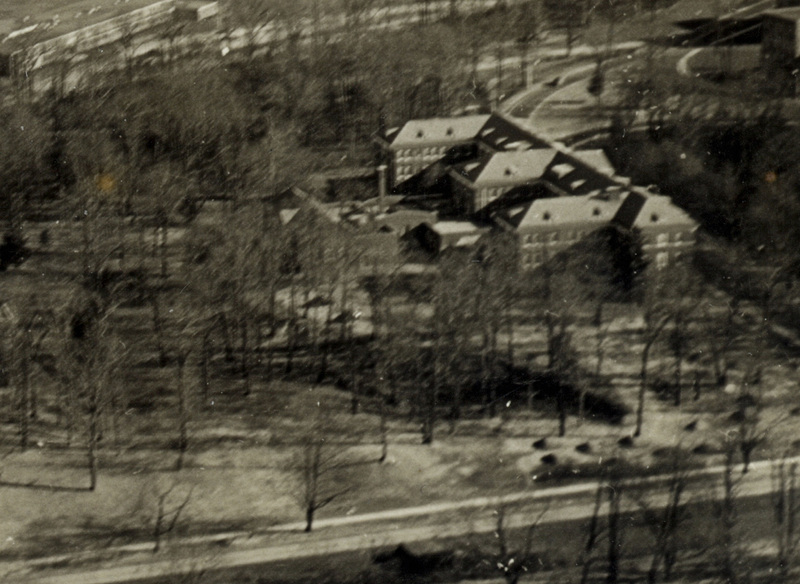 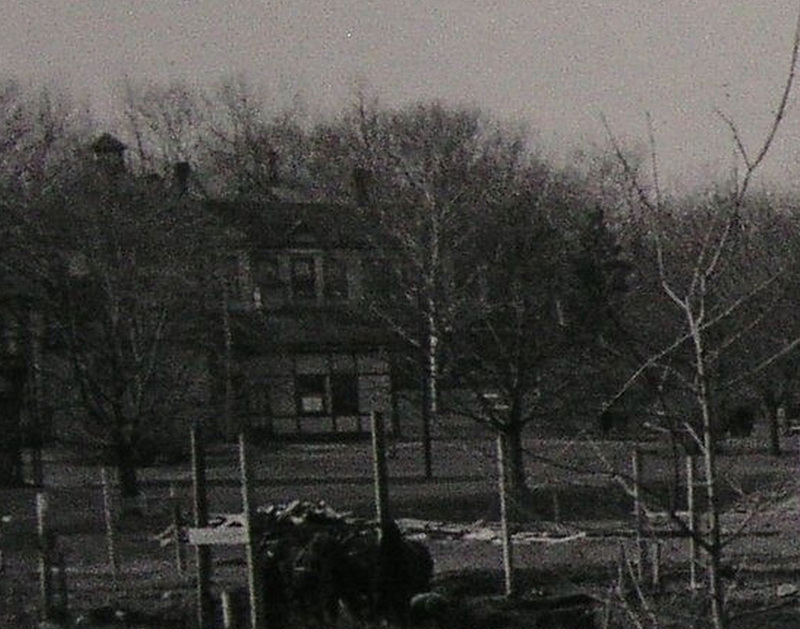 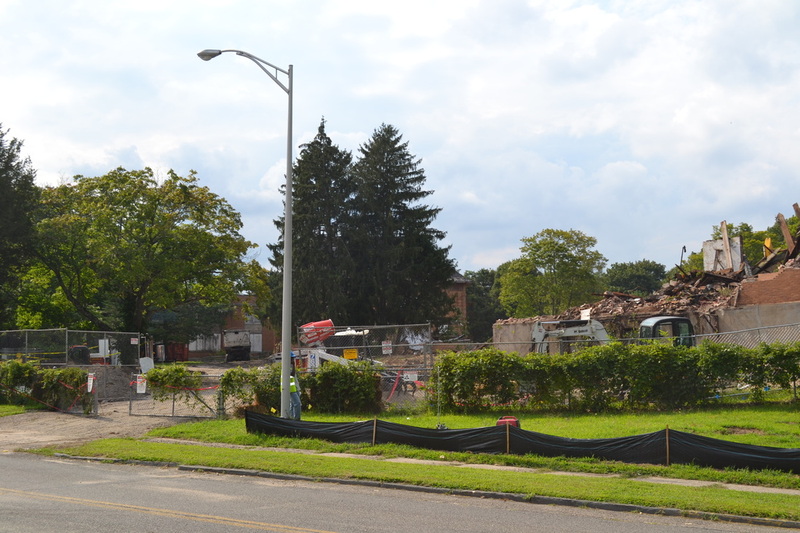 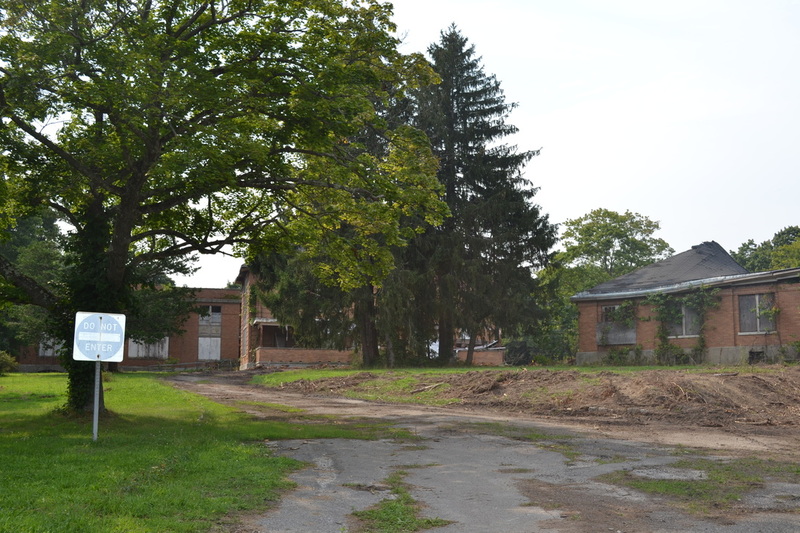 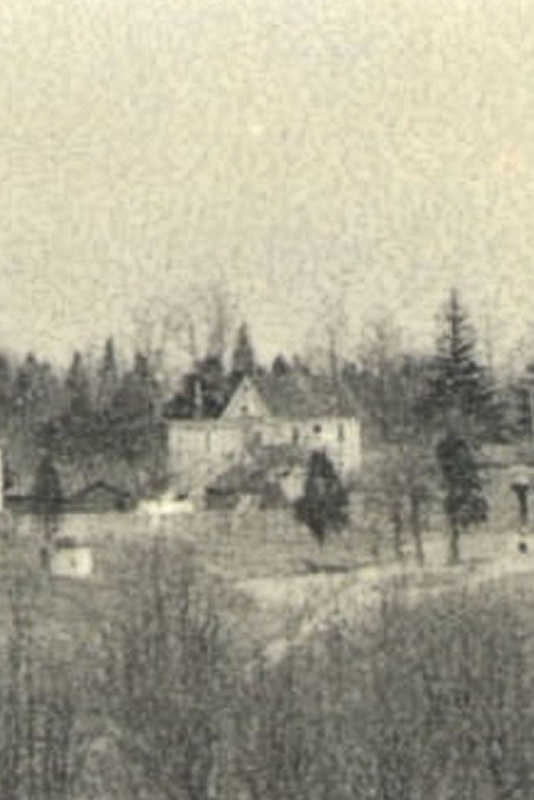 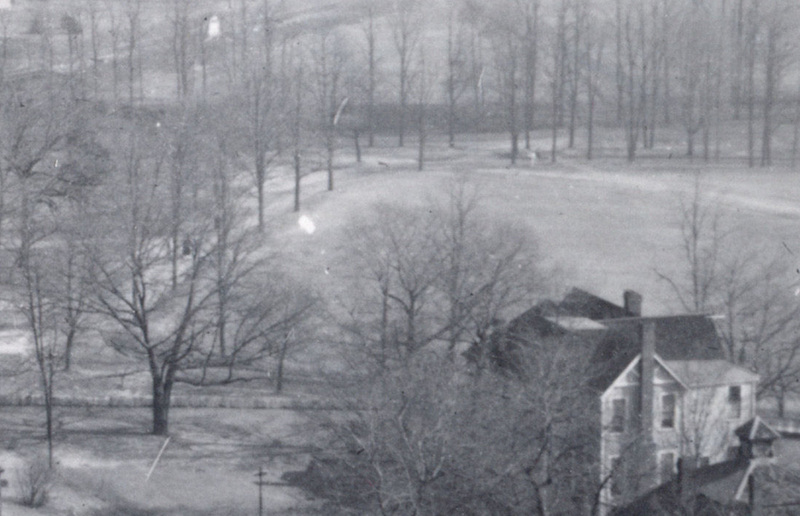 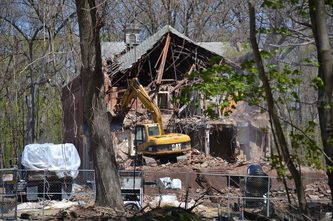 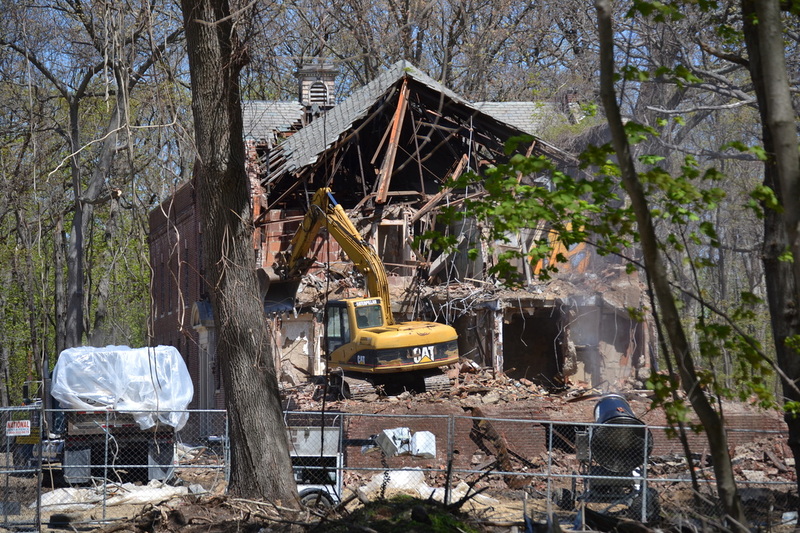 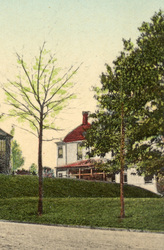 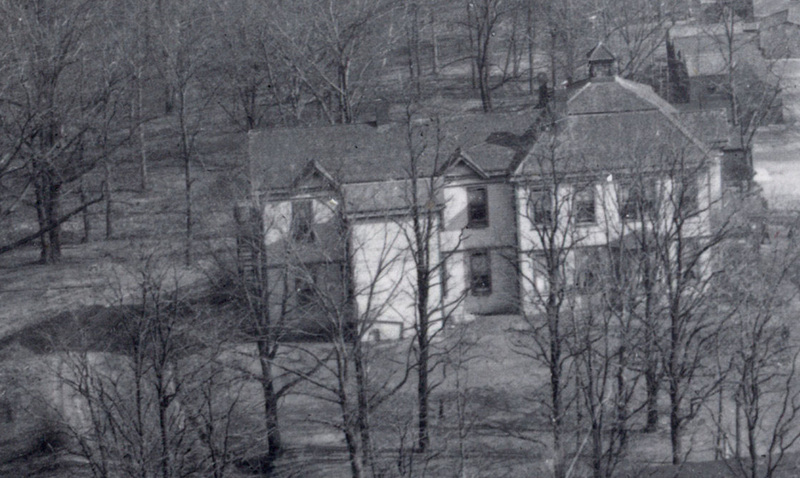 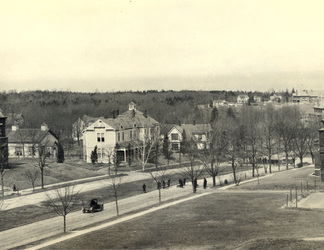 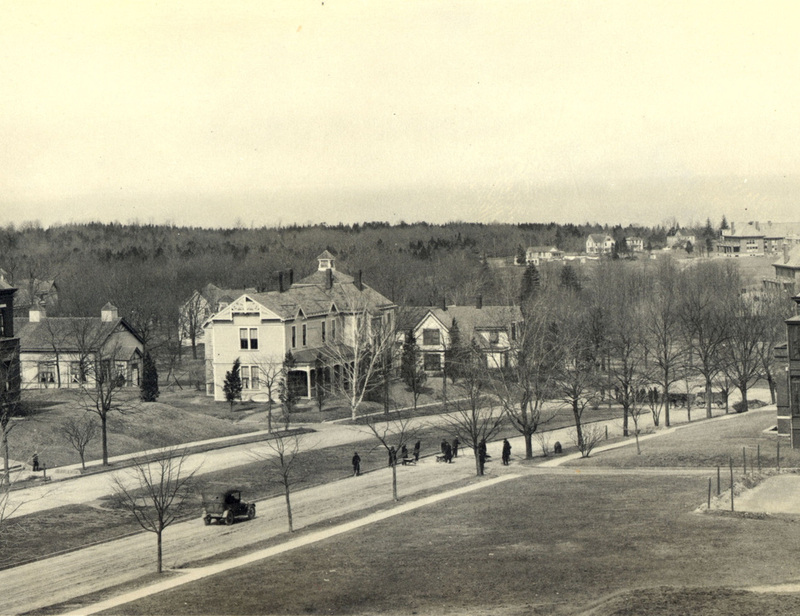 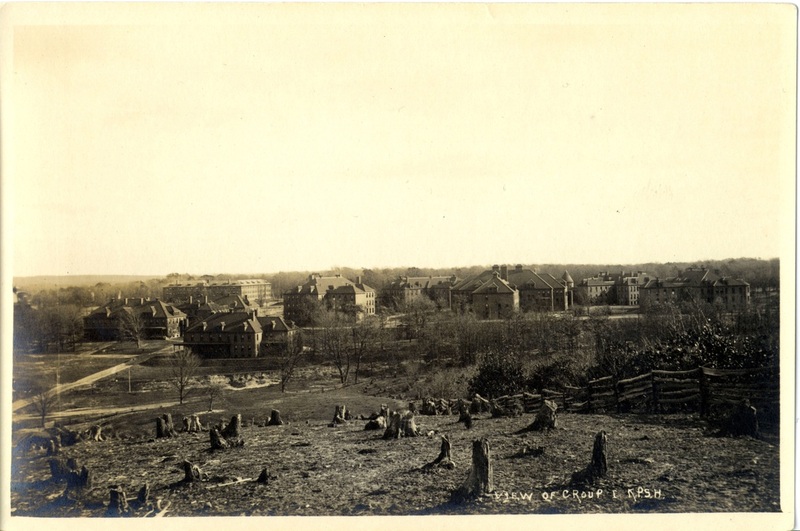 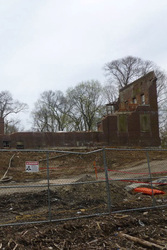 It was demolished to make room for the doctors' cottages that were built behind Macy Hall. 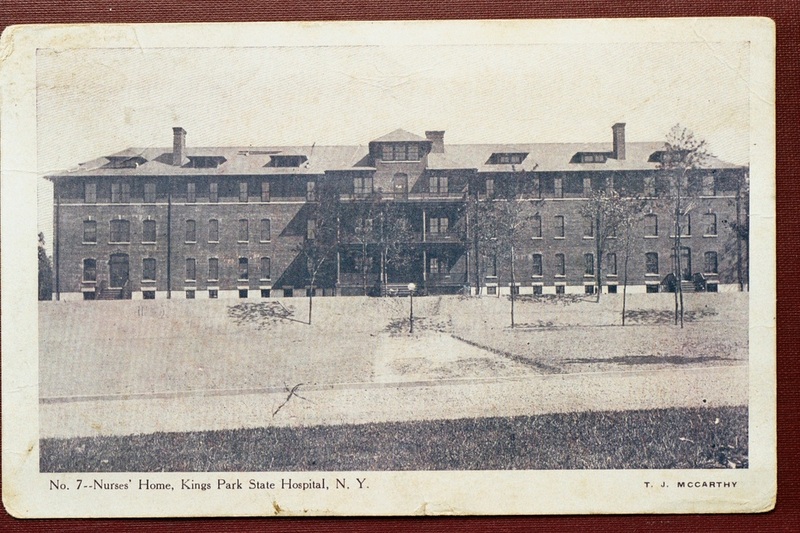 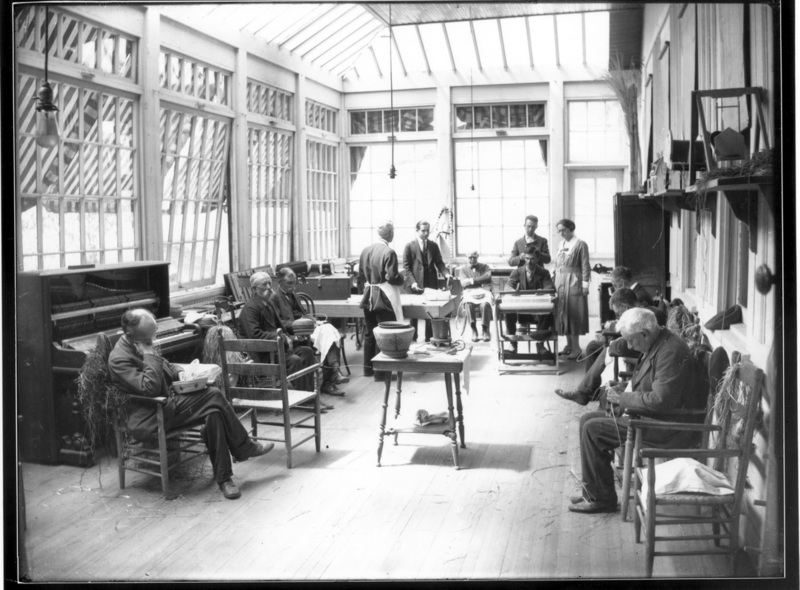 The pest house was built between 1887-1889 & used to house patients that were quarantined. 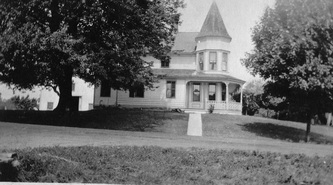 It was located next to Tiffany Field & demolished long ago. 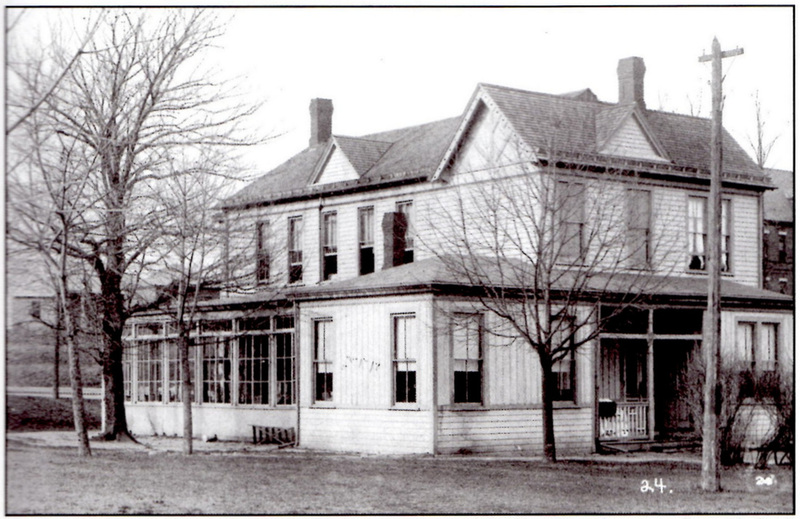 This was one of the original male cottages built from 1887-1889 & it housed ward 26. Built in 1896, this structure was eventually removed to make room for Building 94. 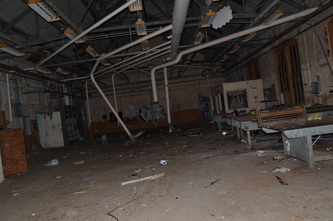 This was the last power plant the hospital had, which was built from 1964-1968. 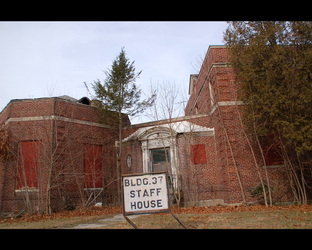 It was shut down in 1996 when the hospital closed. 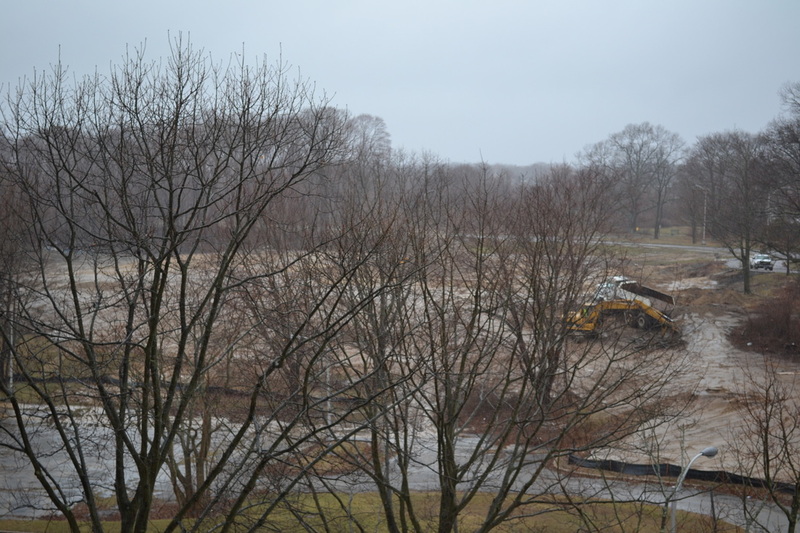 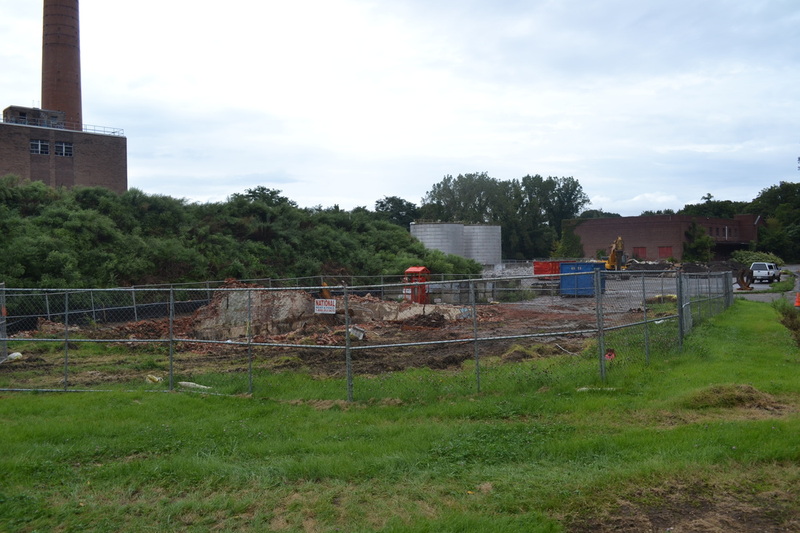 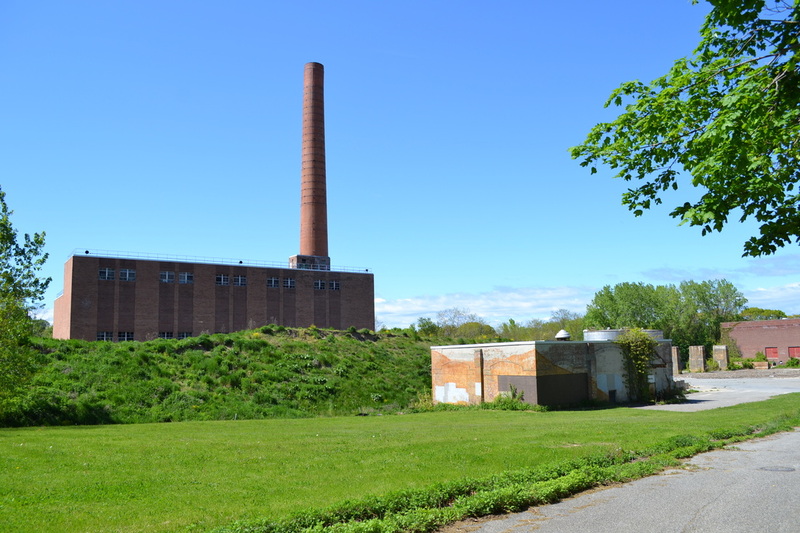 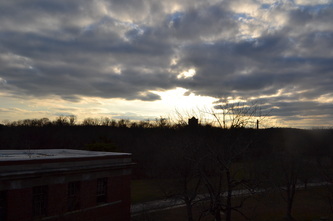 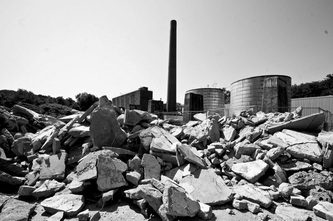 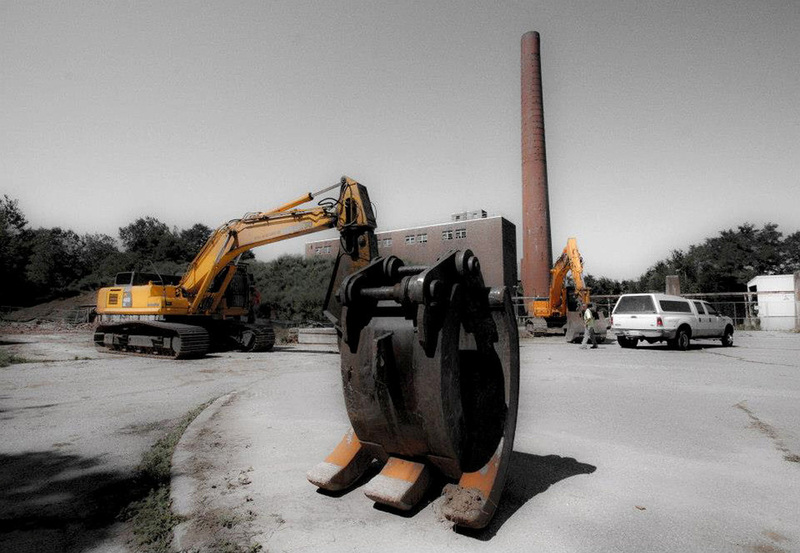 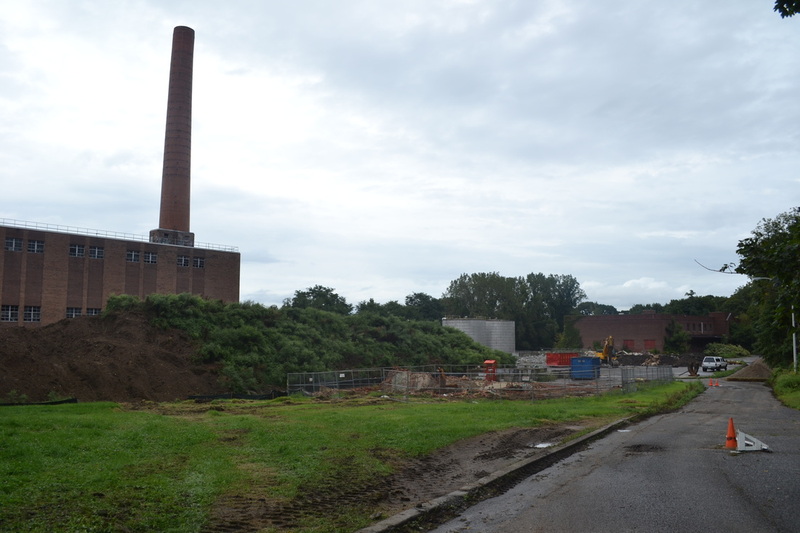 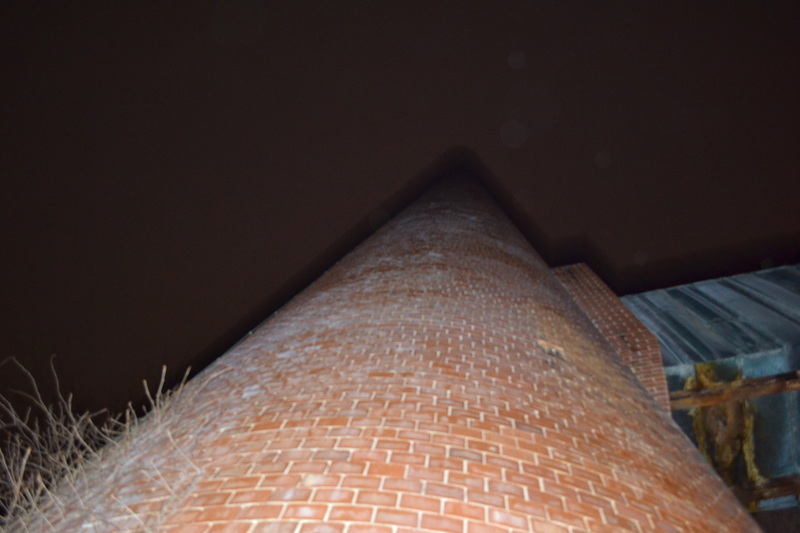 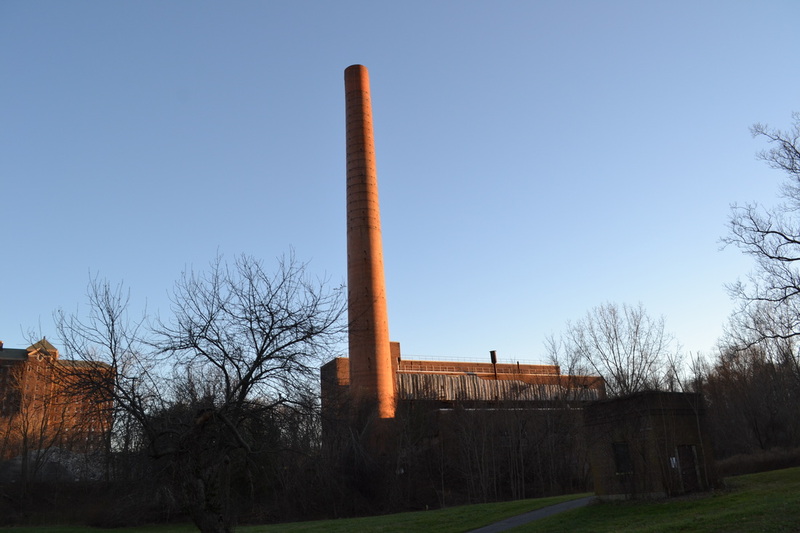 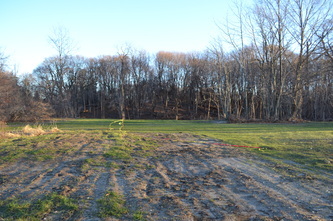 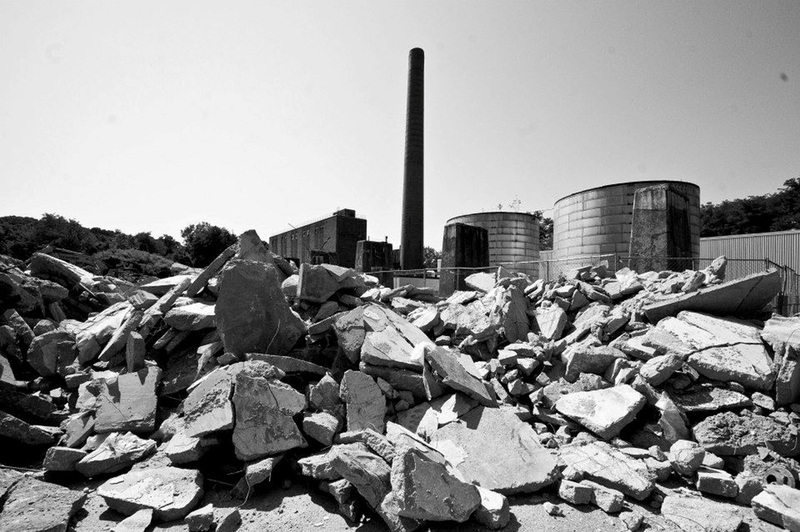 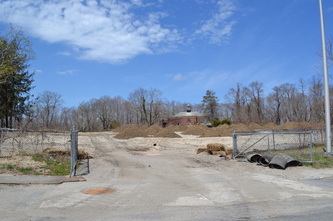 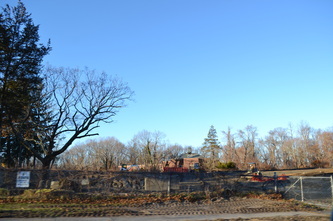 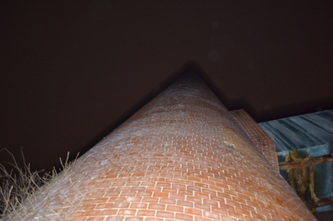 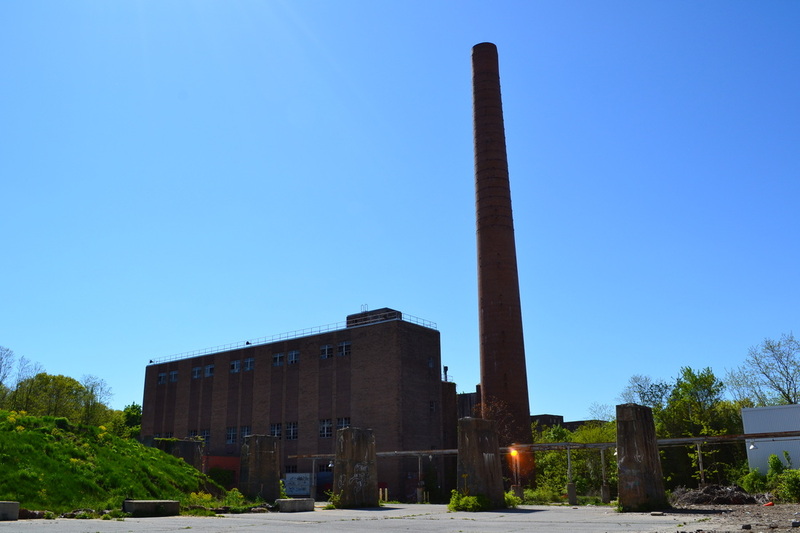 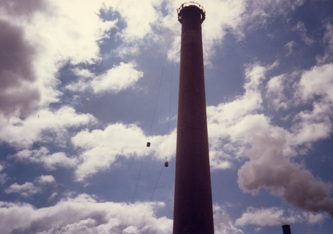 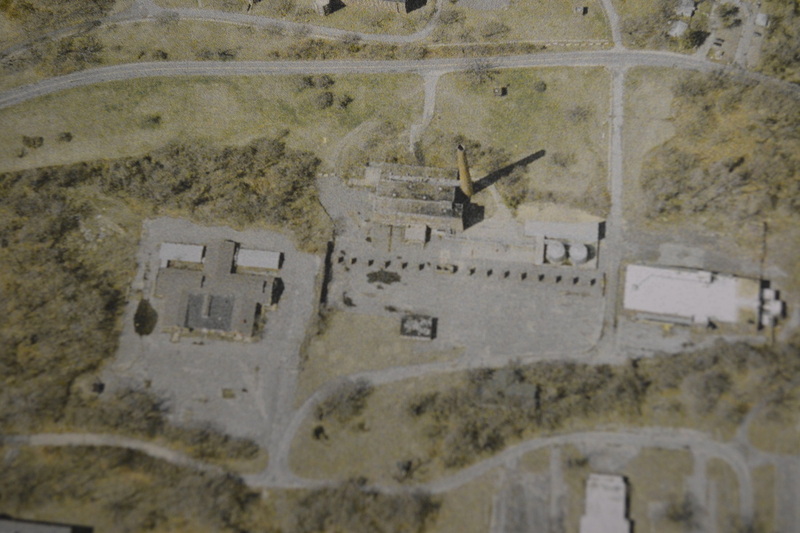 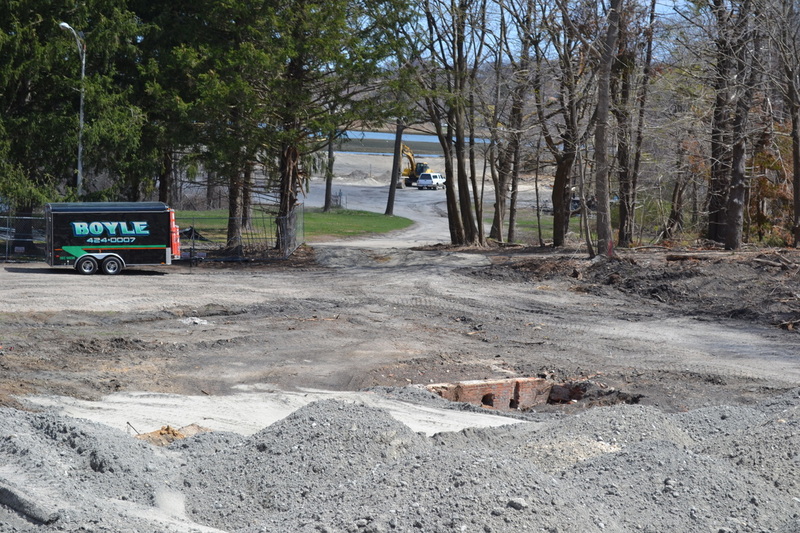 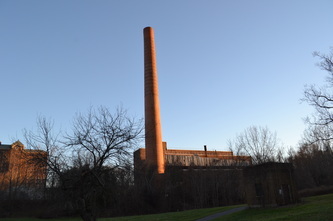 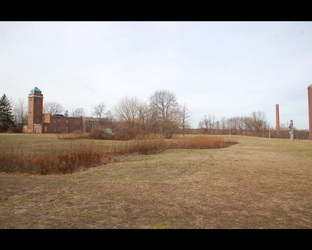 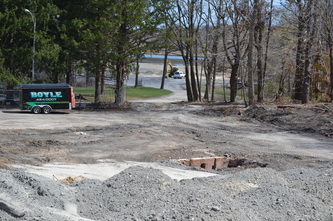 The smokestack & surrounding area was demolished at the end of 2012 into the beginning of 2013. 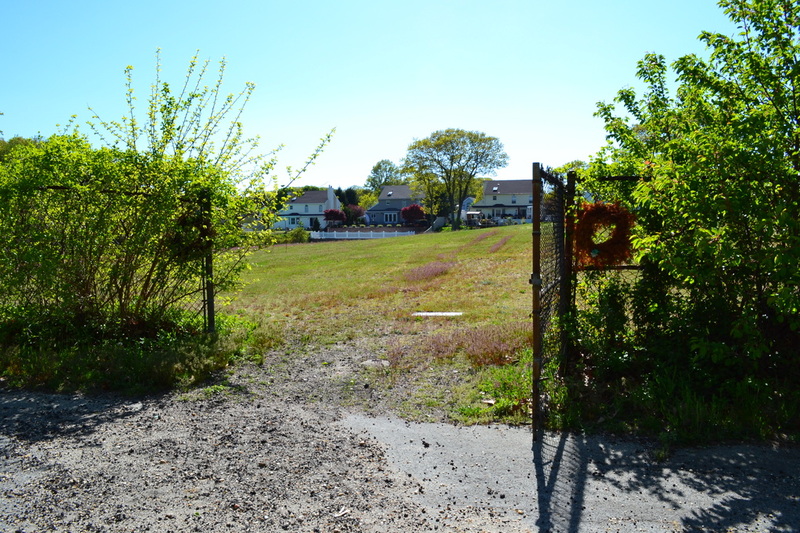 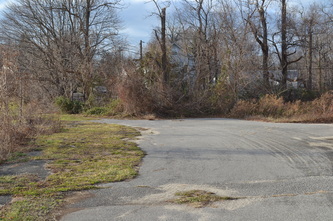 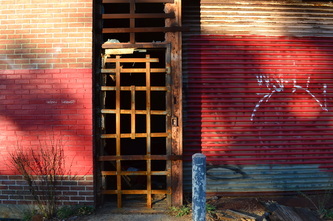 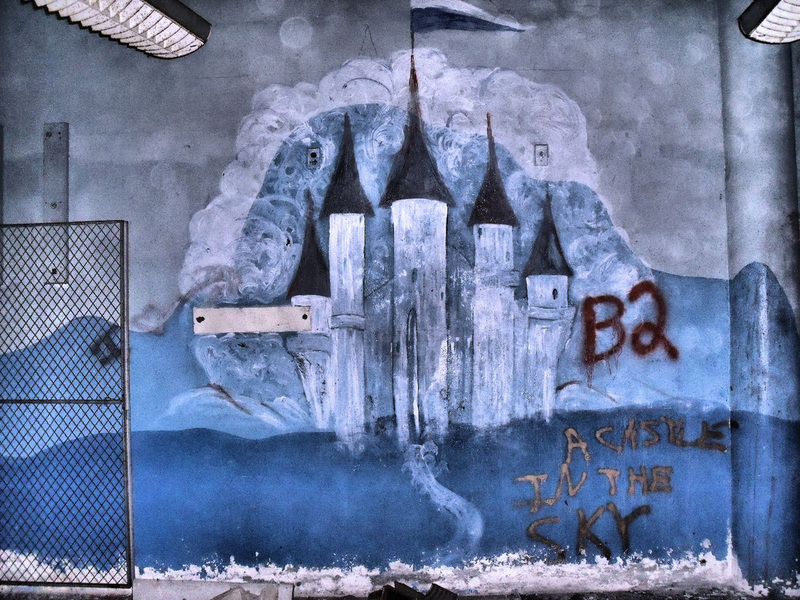 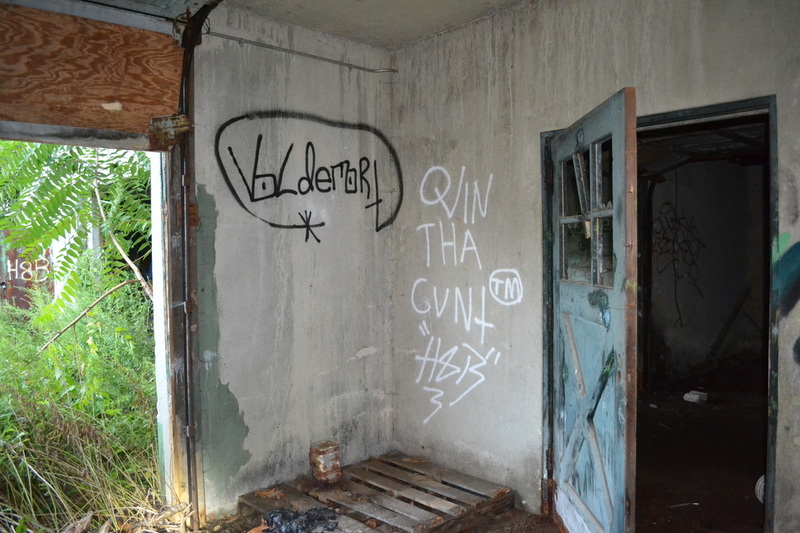 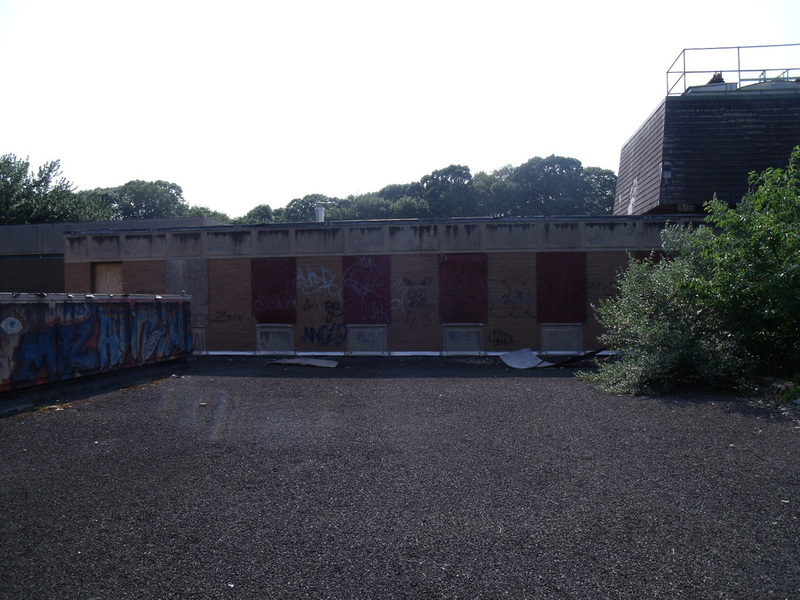 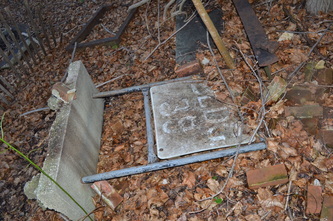 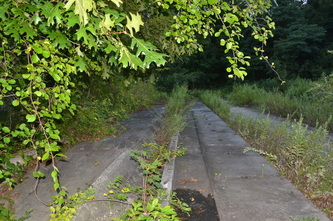 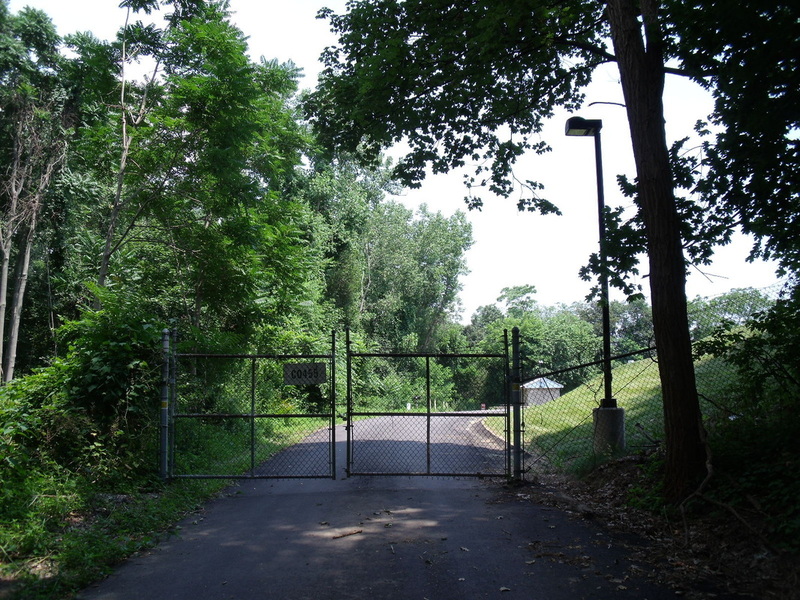 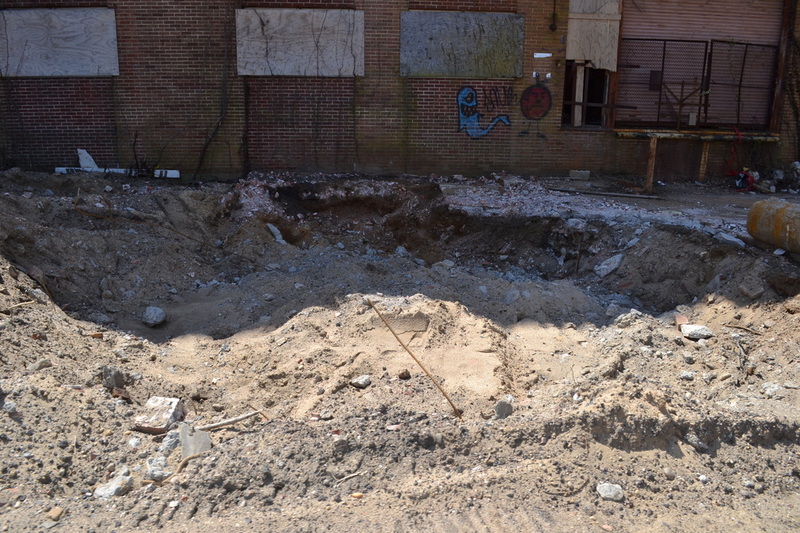 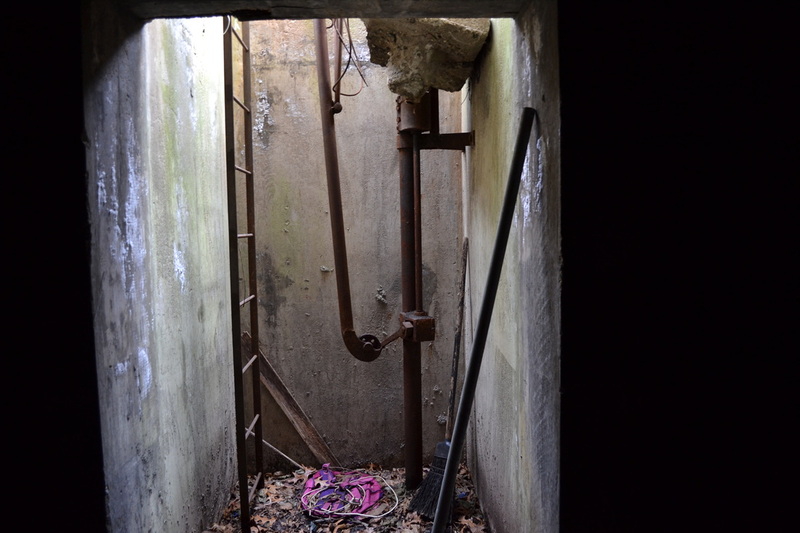 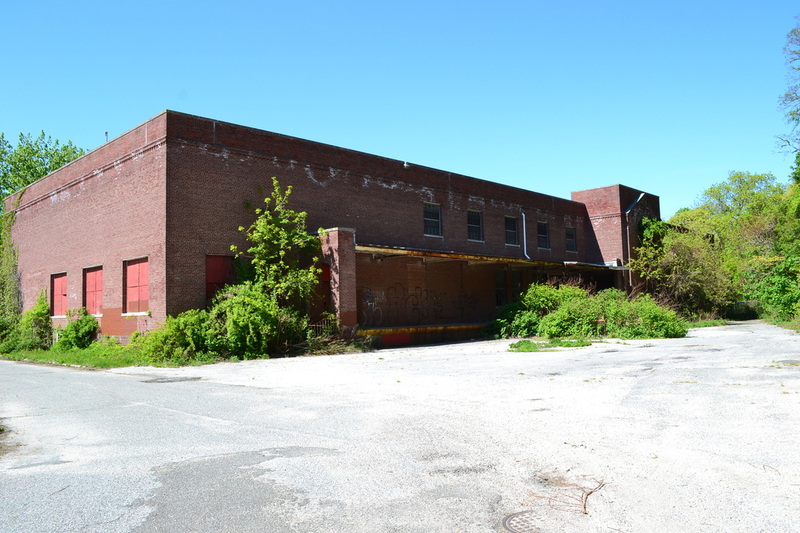 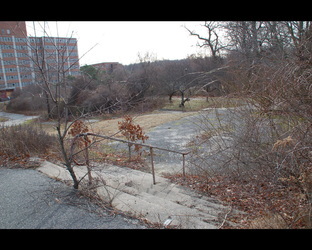 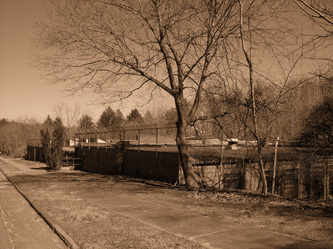 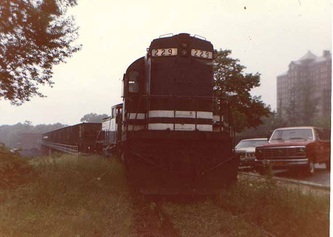 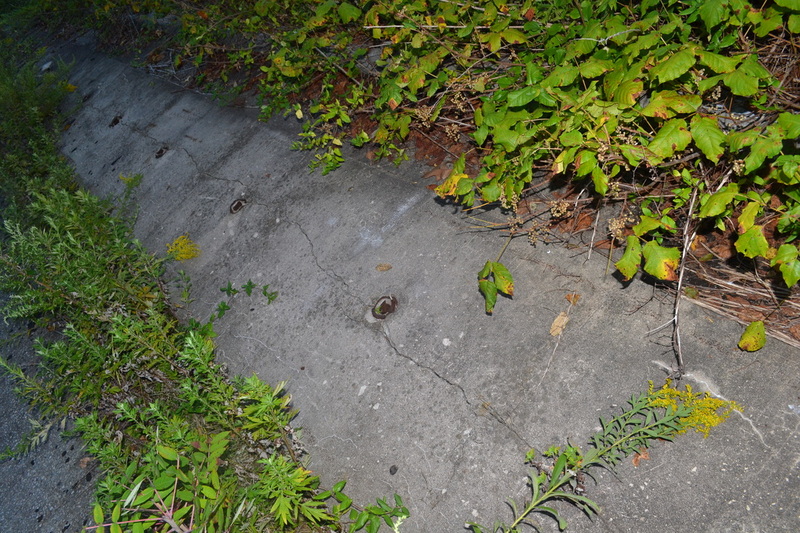 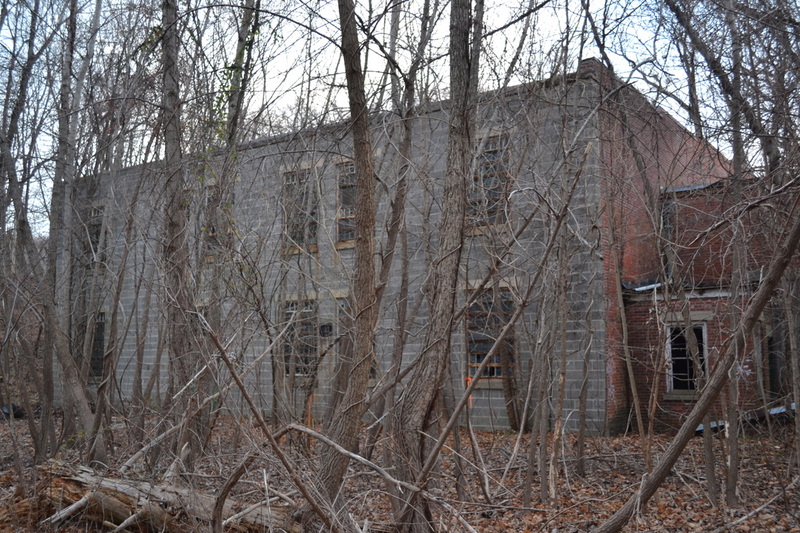 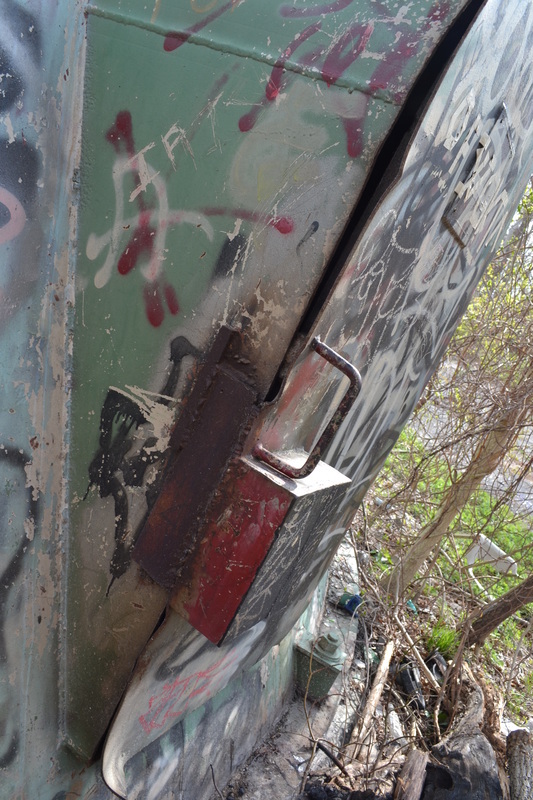 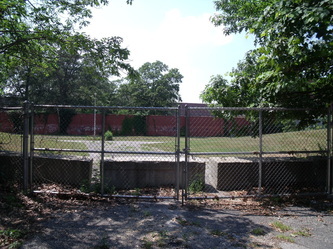 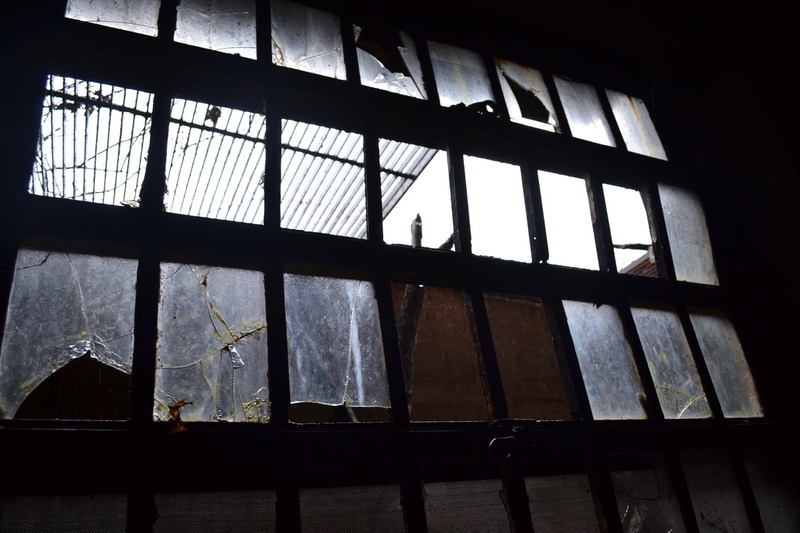 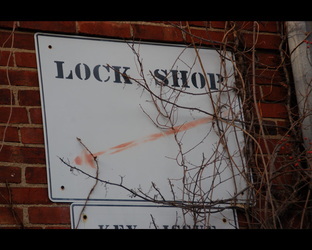 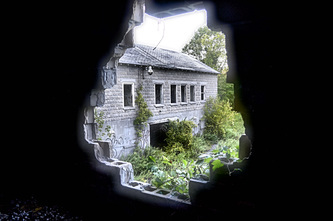 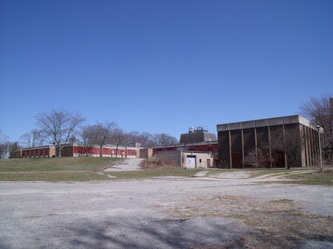 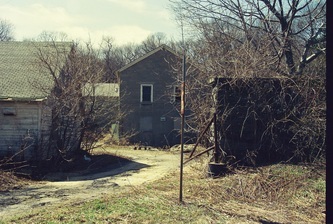 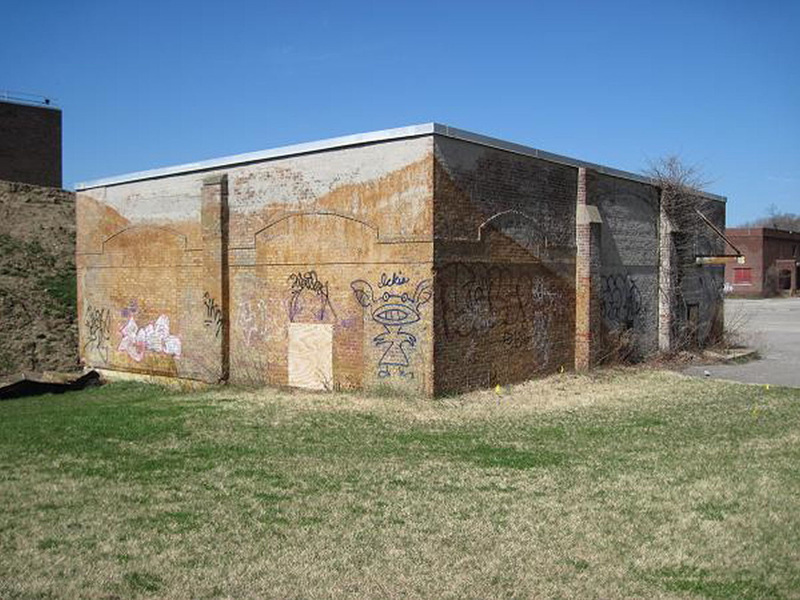 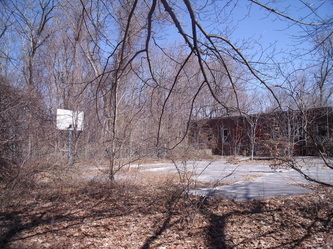 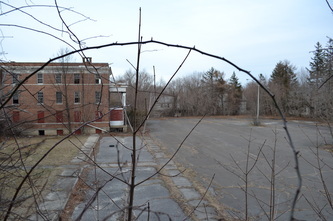 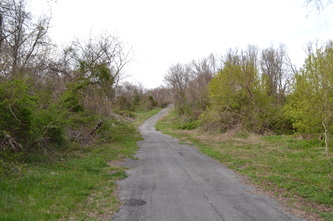 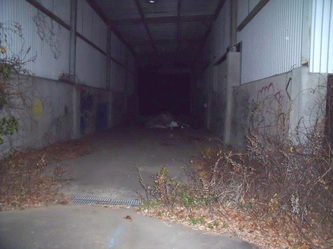 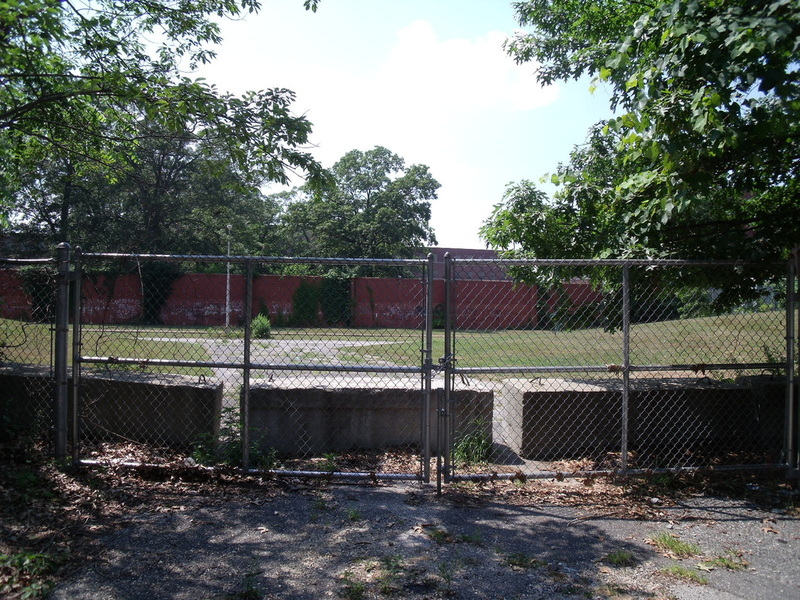 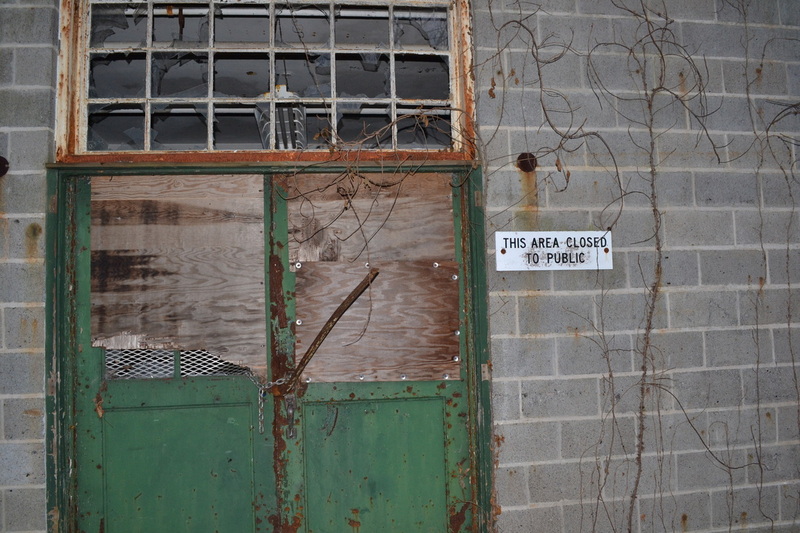 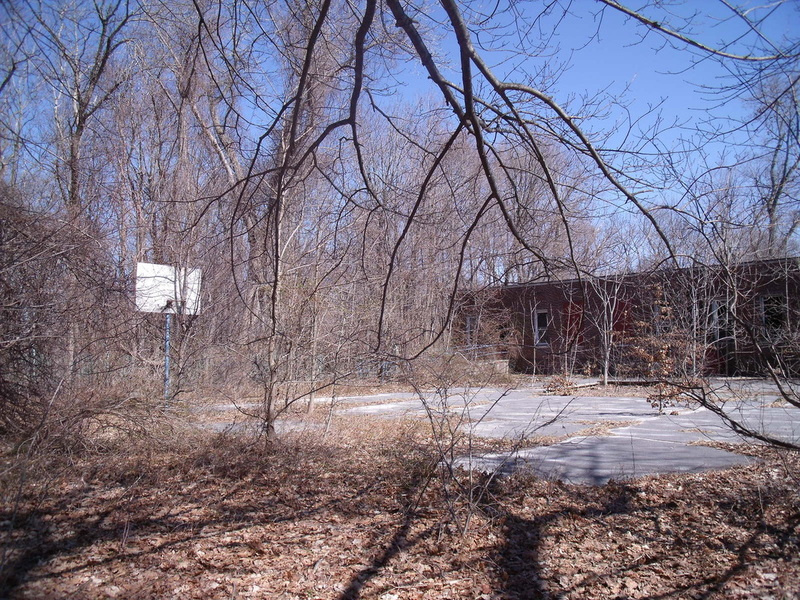 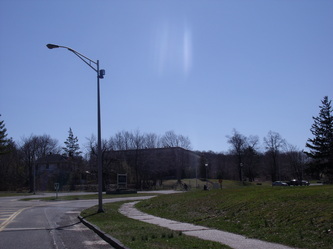 It is located on Old Dock Road across from the abandoned buildings of Group 4, which connect to it via the underground tunnel system. 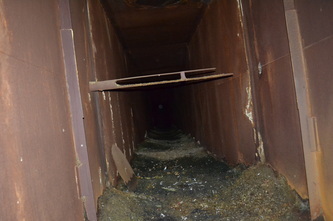 Another tunnel used to connect it to Building 6, but that was sealed when Building 6 was demolished in 2012. 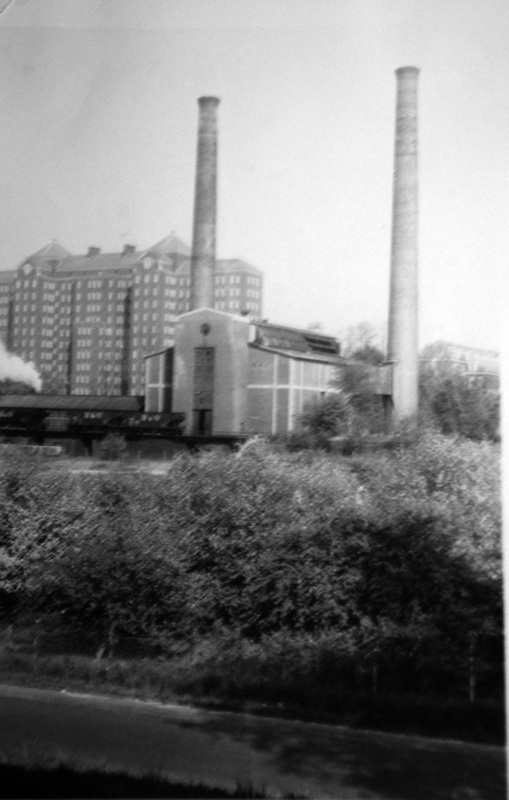 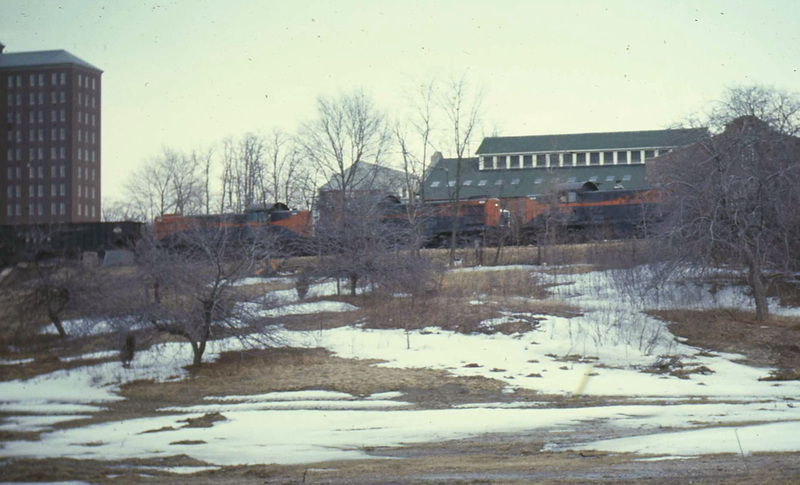 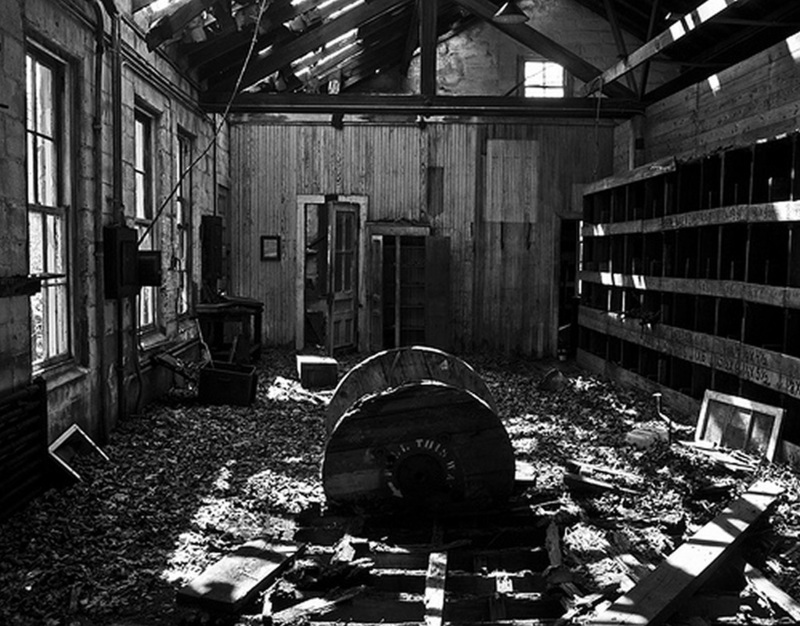 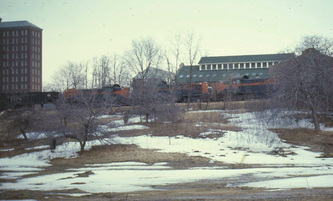 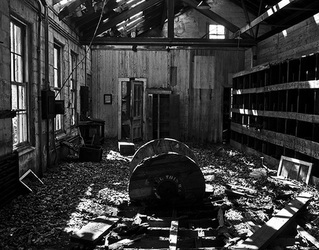 This 1965 photo is one of the few rare shots of the lumber storage shed, which was located in the power plant area. 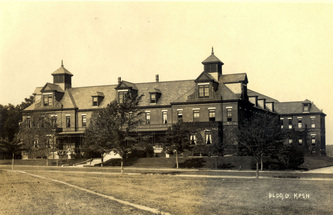 It was built in the 1890s and demolished in the 1960s. This old cottage was built from 1926-1929 & was used as a bowling alley. 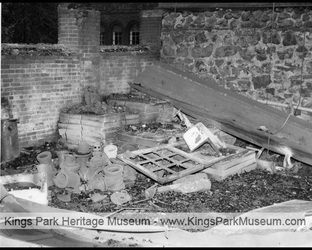 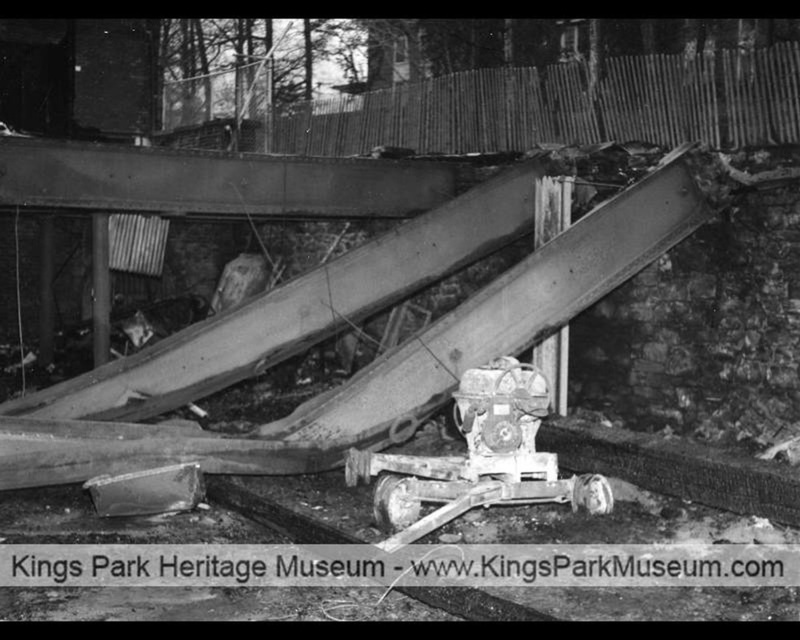 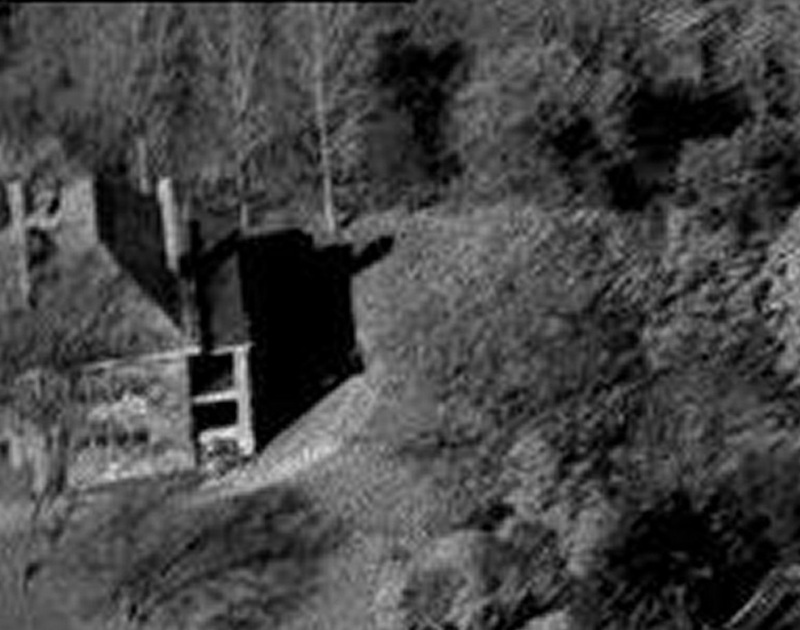 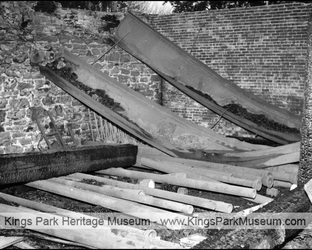 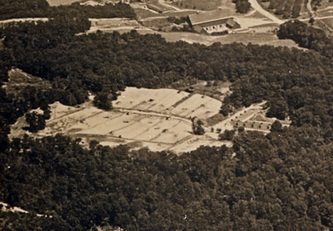 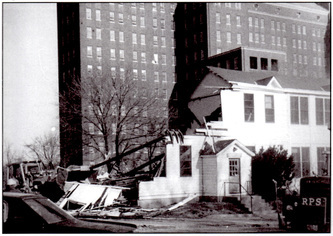 It was located directly behind the club house & demolished at the same time as that house in 1975. 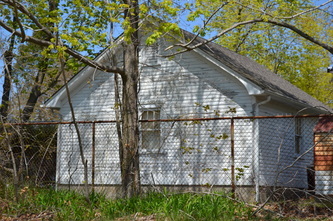 This was one of the original male cottages, built from 1895-1896. 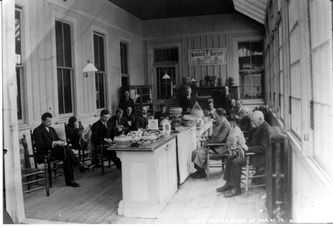 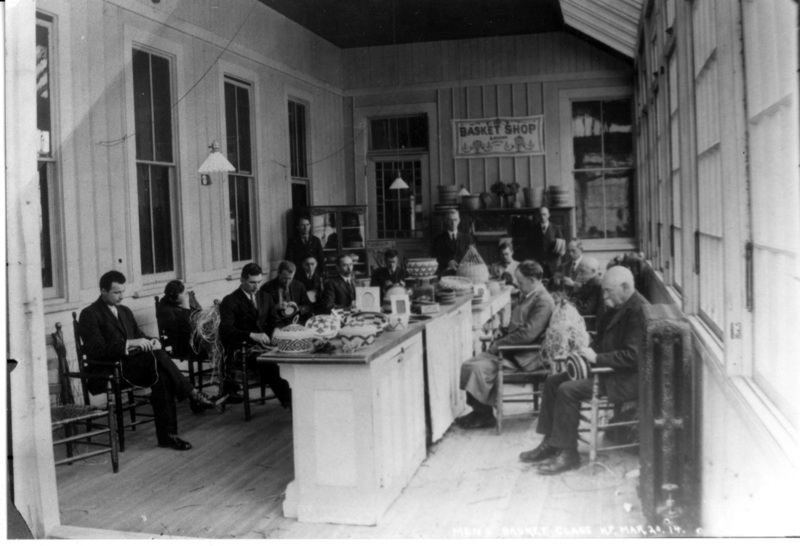 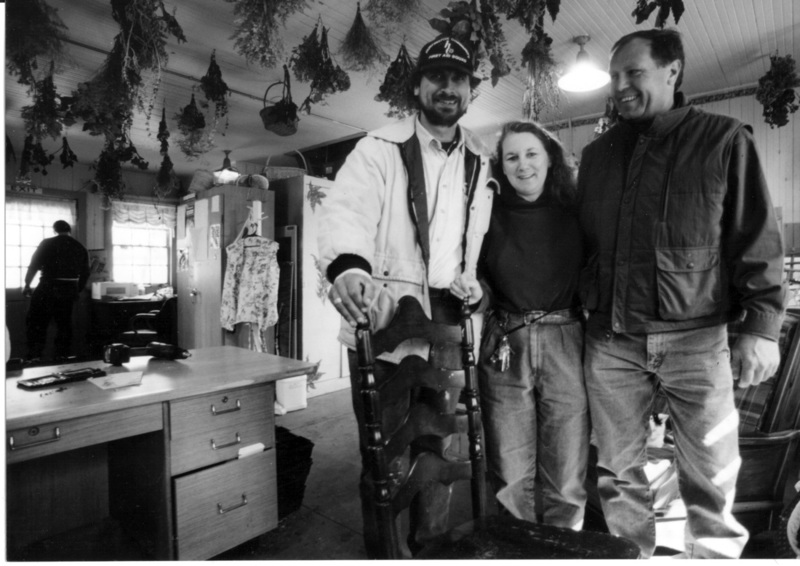 It became the Employee's Club House & Community Store. 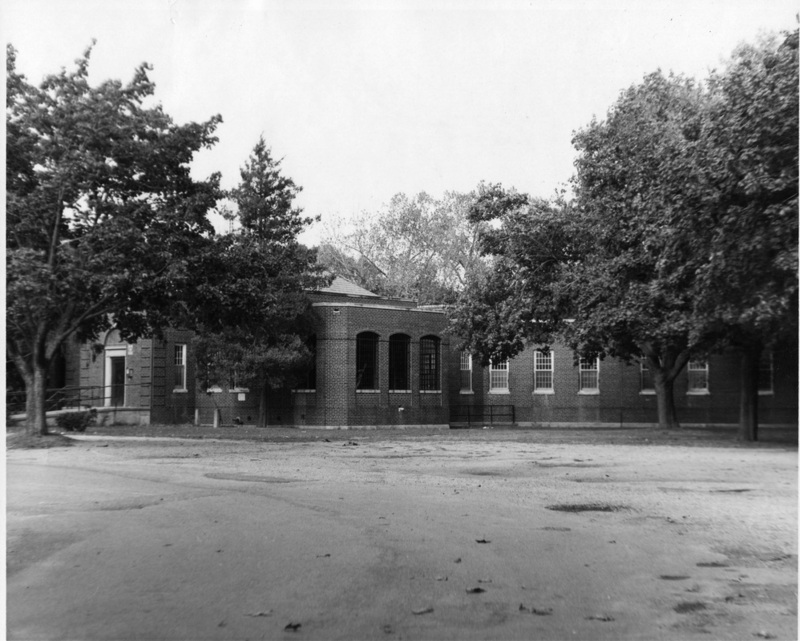 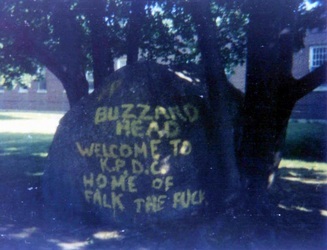 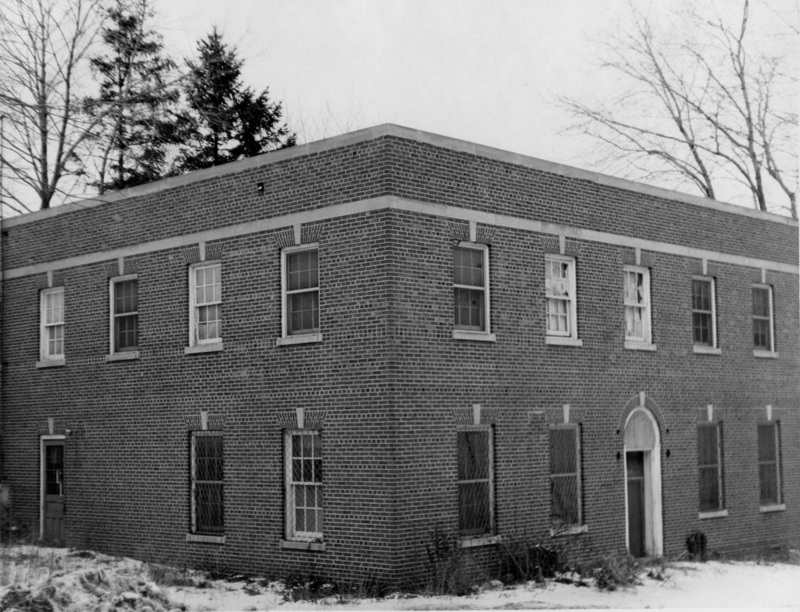 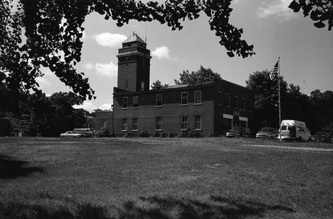 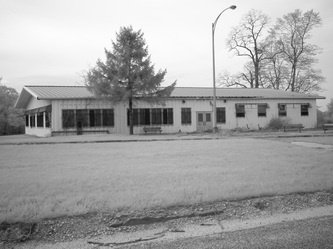 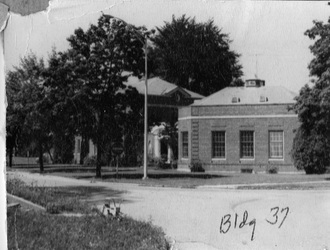 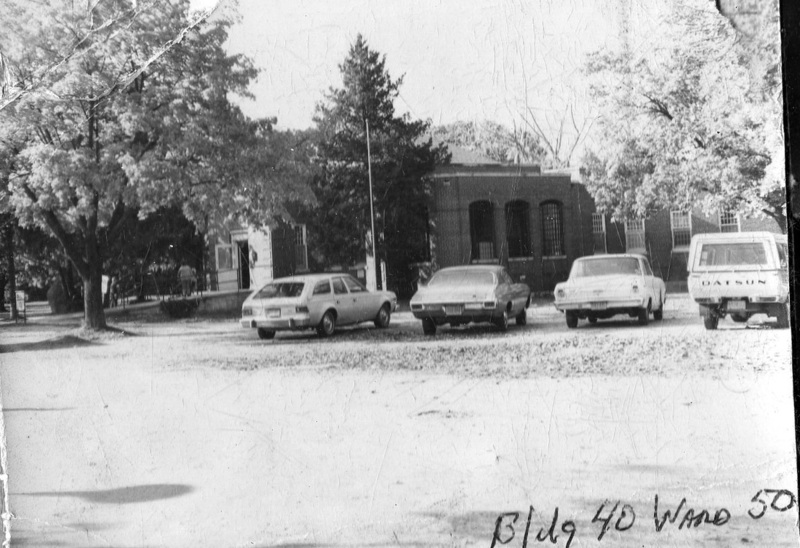 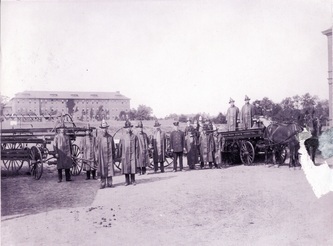 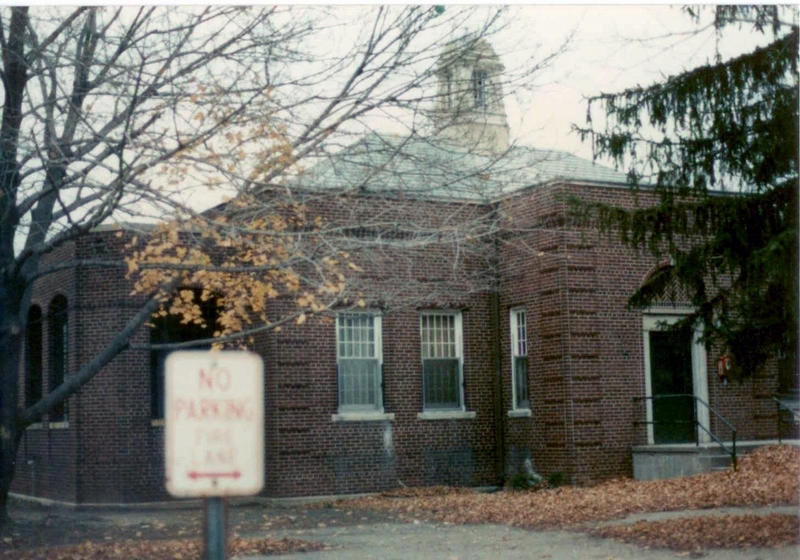 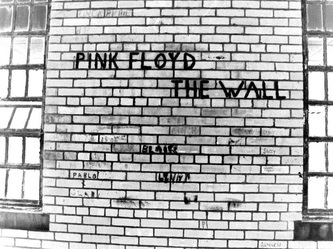 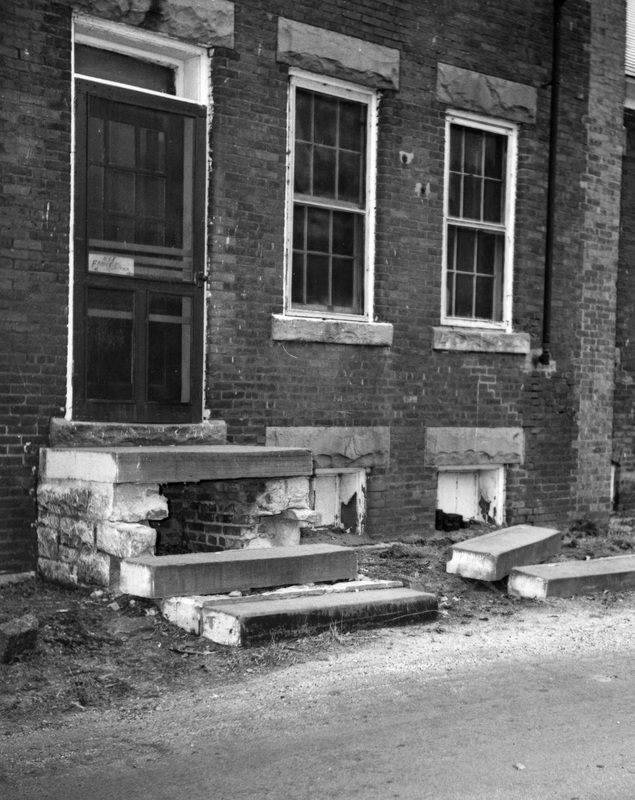 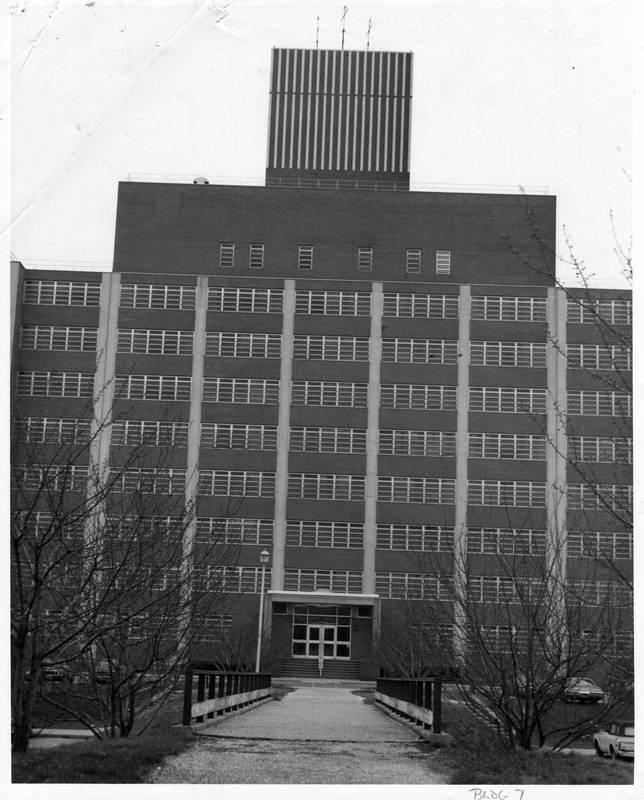 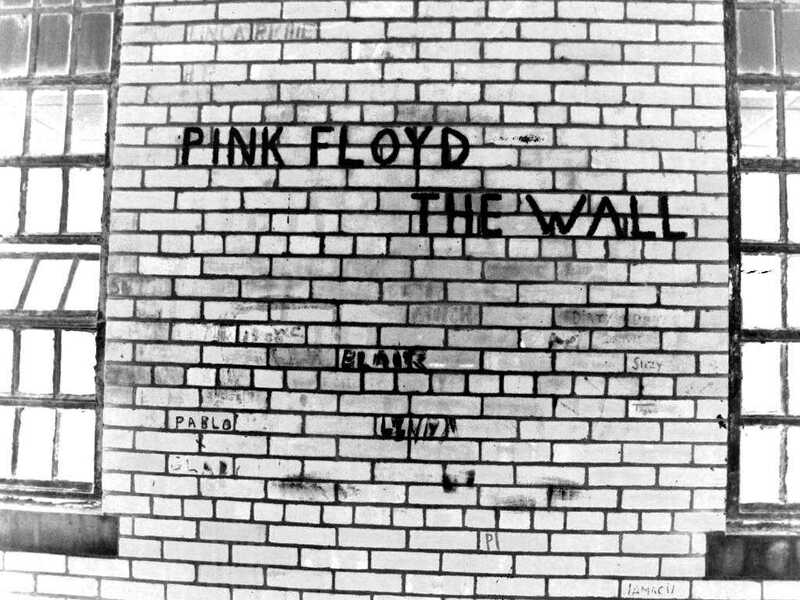 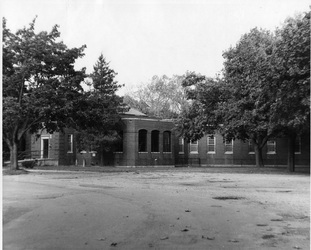 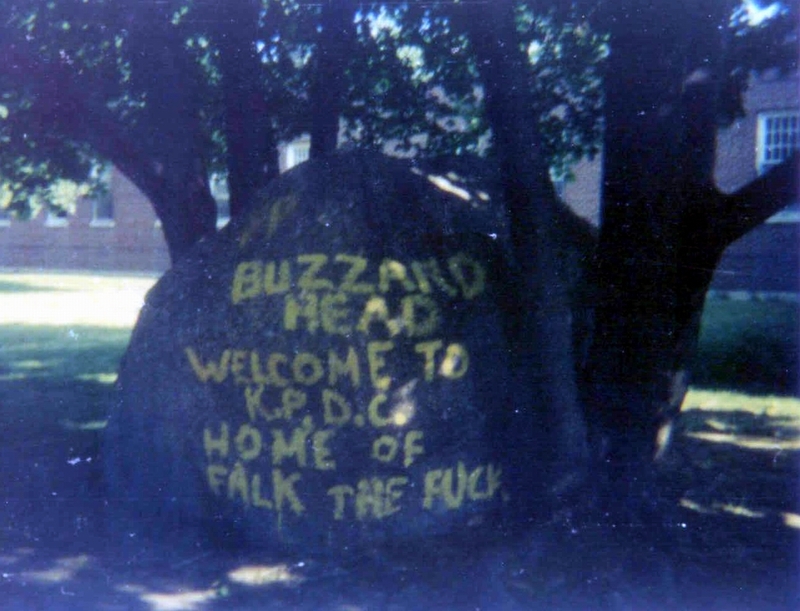 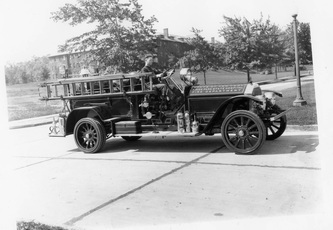 It stood in front of Building 93 & was demolished in the 1975 along with Building 31. 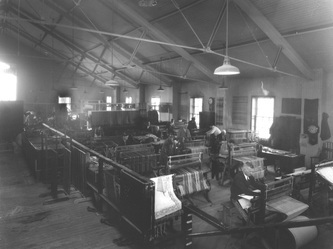 This was the original laundry building built from 1887-1889. 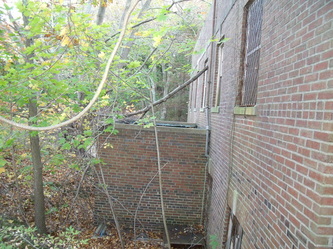 It was located across from the buildings of Group 2. 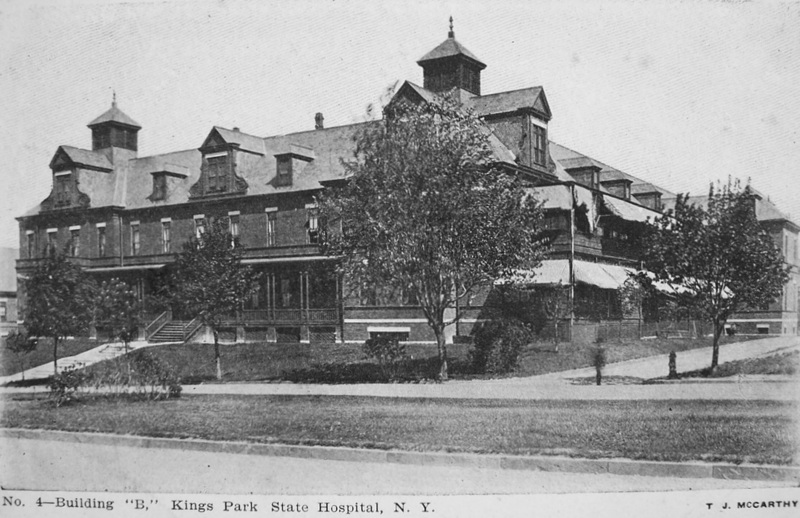 In 1906 it was badly damaged by a fire. 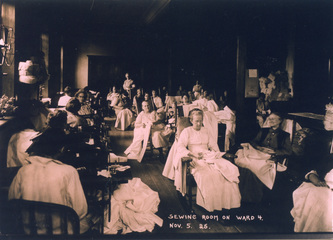 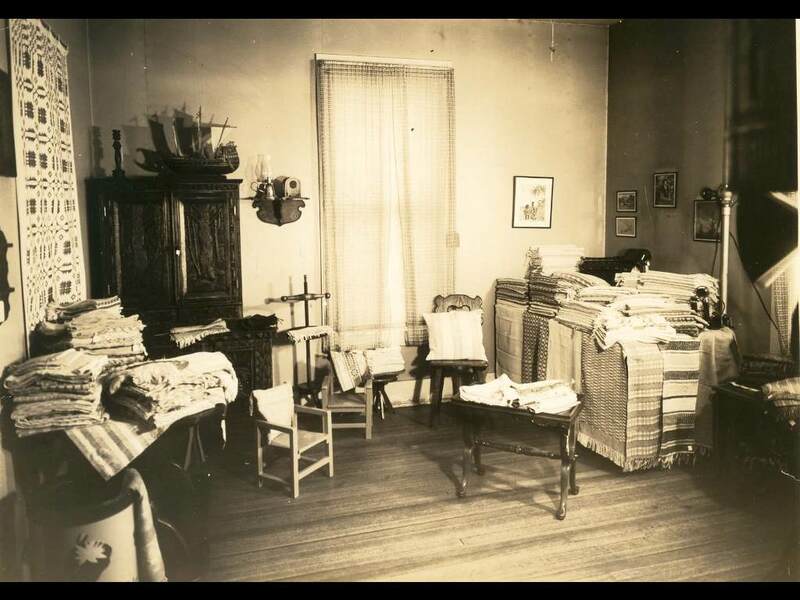 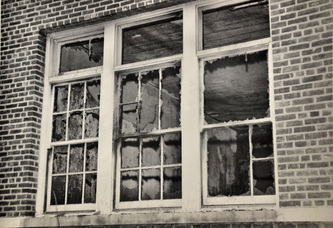 After it was no longer used as a laundry, it was used to house patients. 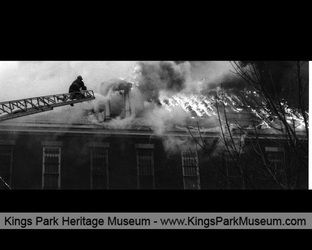 In 1911, the fire marshal ordered it to be closed down & it was eventually demolished in the late 1920s. 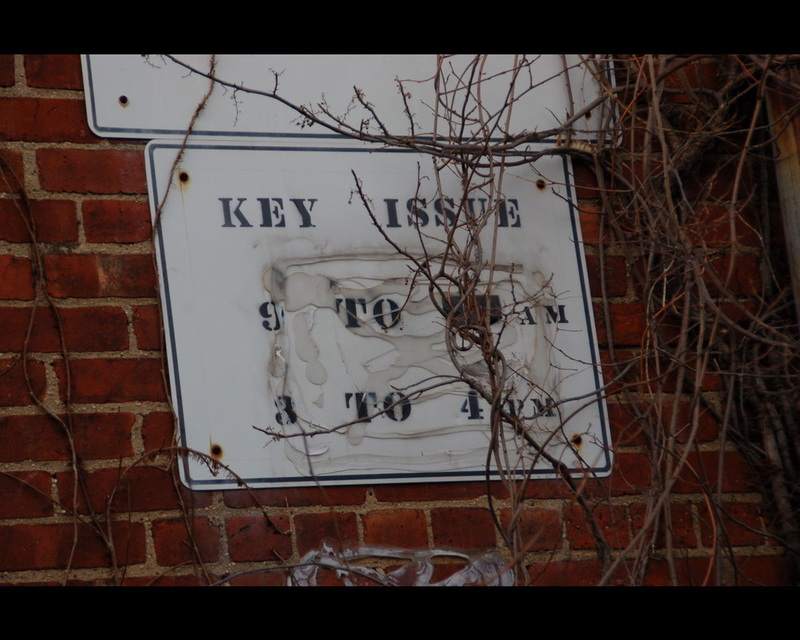 The head farmer's house also used this number designation, after it was no longer considered to be Building 48A. 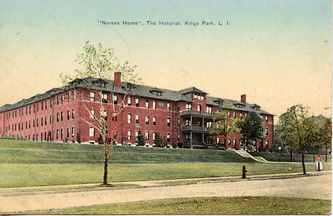 Built between 1903-1906, this large building was a residence for nurses. 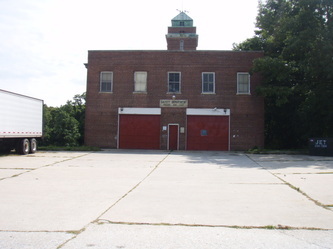 It stood between Building 1 & the firehouse. 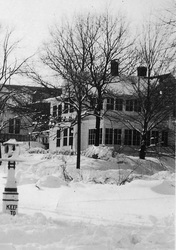 It was demolished in 1967. This building was built between 1931-1934 to house student nurses. It was better known as Home V. It stood next to Building 3 with its sister Building 36. 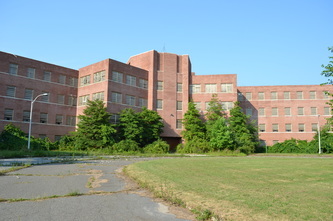 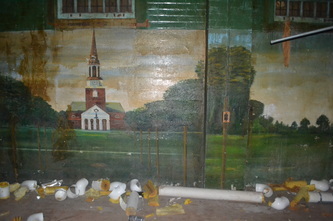 It was demolished in April of 2013. 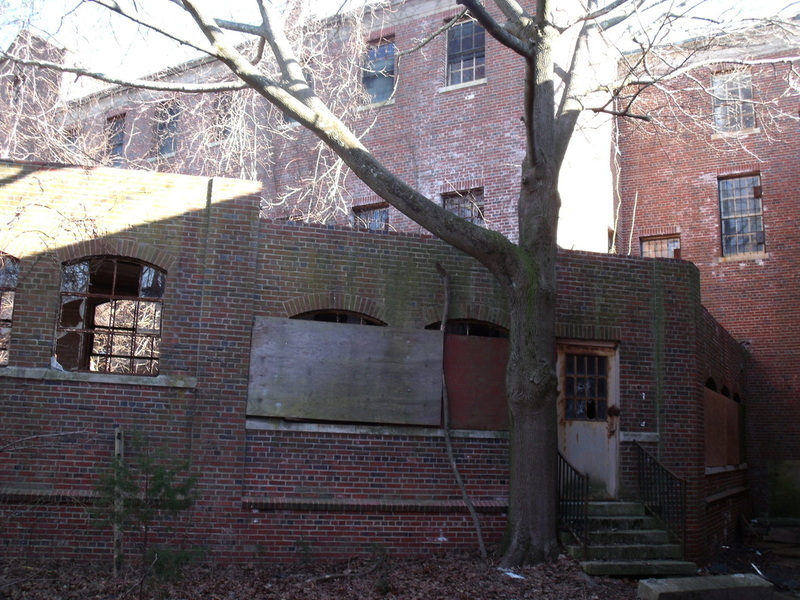 This building was built between 1931-1934 to house student nurses. 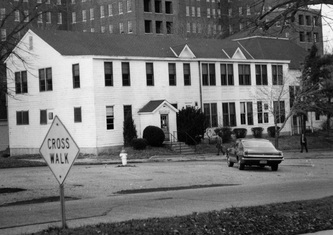 It was more commonly known as Home W & stood right next to Building 35. 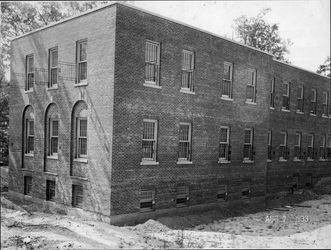 This building was built between 1931-1934 to house non-medical employees. It is located behind Building 90 aka Macy Hall. 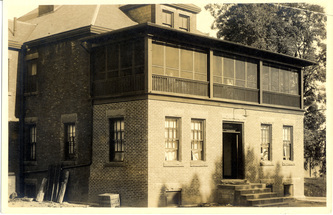 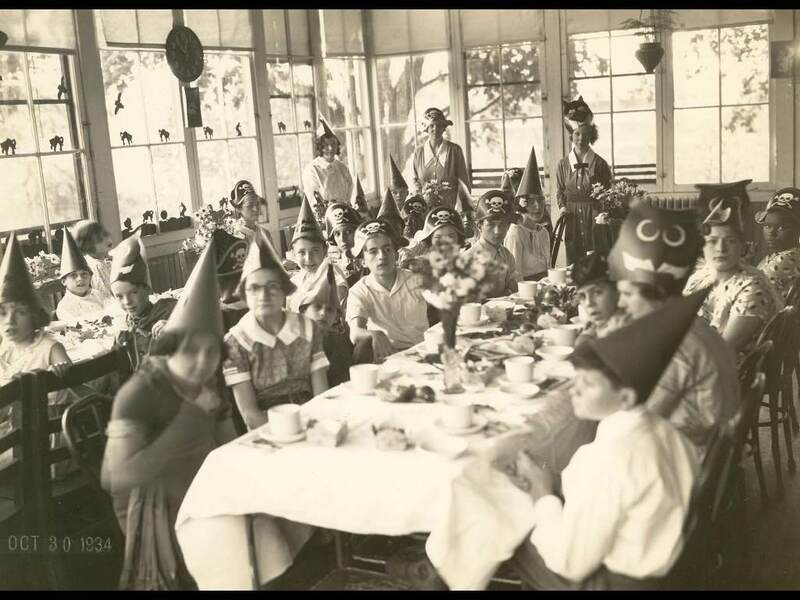 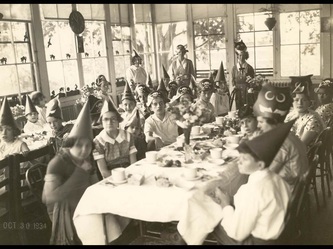 Built between 1890-1892, this building served as the kitchen & dining hall for Buildings A & B. It stood behind them & was demolished during the 1970s. 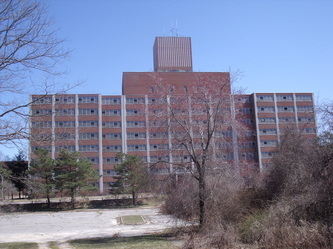 This building was part of the Veterans' Memorial Hospital Unit. It was built in 1932. 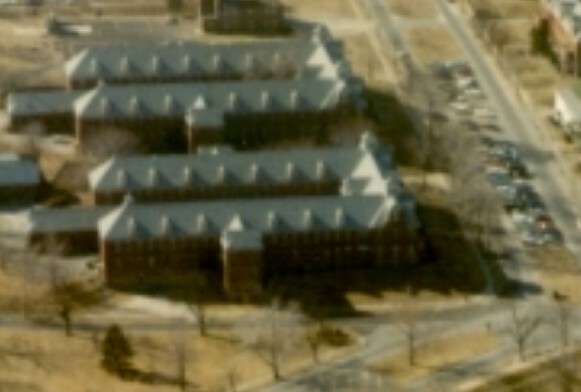 Few people know this, but it was originally numbered as Building 141 & for some reason it was renumbered as Building 39. 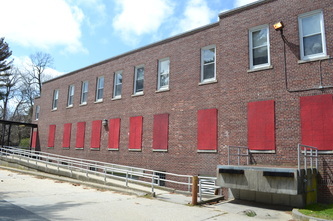 To see more photos on this building, go to Building 141. 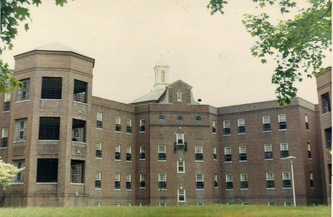 This building was built in 1932 as an addition to the Group 2 buildings, which housed the Adolescent Unit at the time. 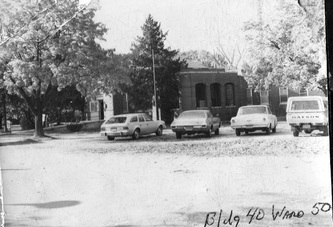 The new addition became ward 50, but was later used as a daycare center, & then as the main offices for the group. Building 41 was built from 1931-1932 & housed wards 101-108 & wards 123-128. 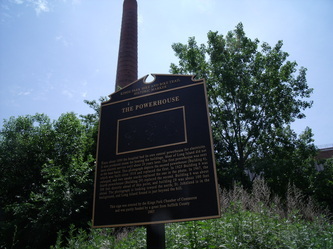 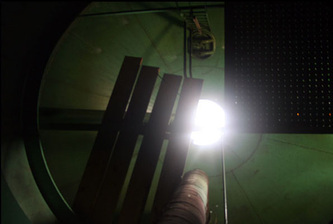 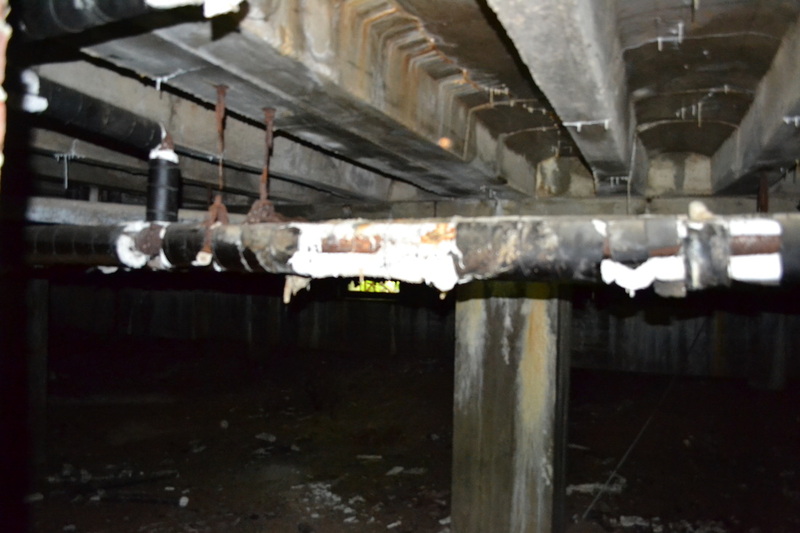 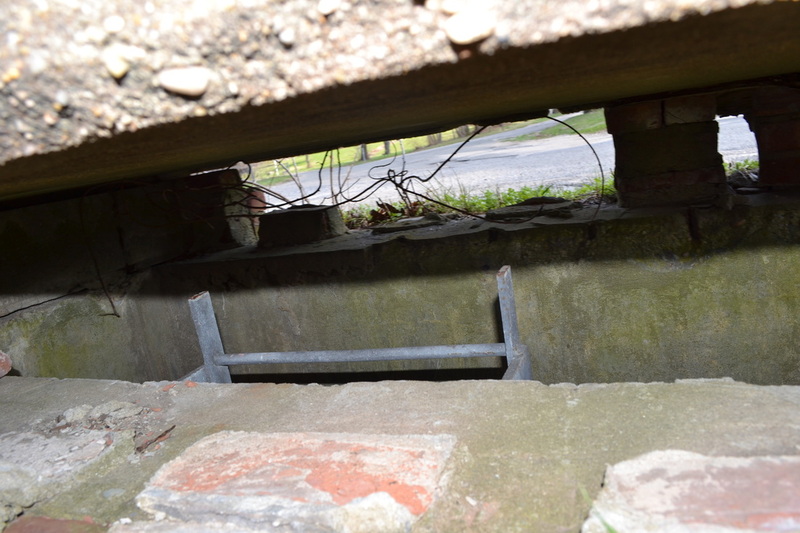 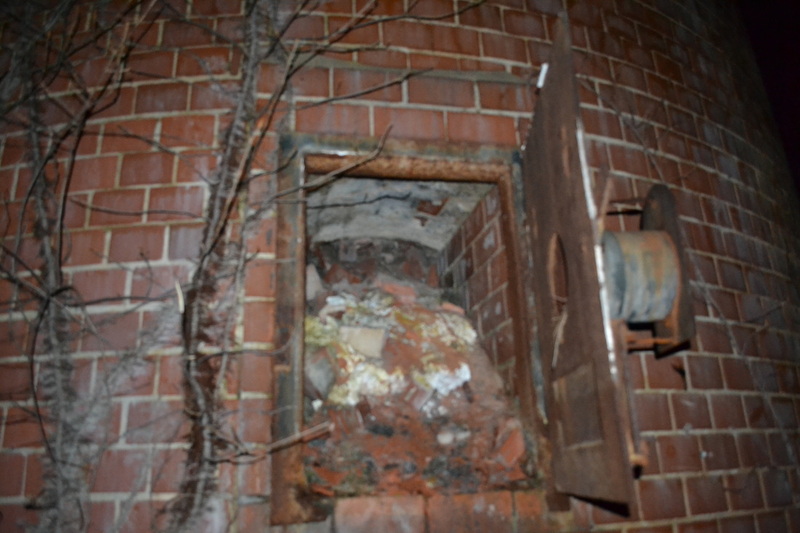 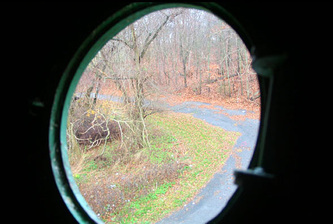 It is located on Old Dock Road & connected to the power plant via the underground tunnel system. 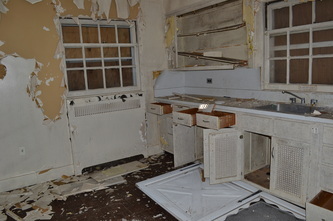 This building was built from 1931-1932 & used as the kitchen & dining hall for Group 4. 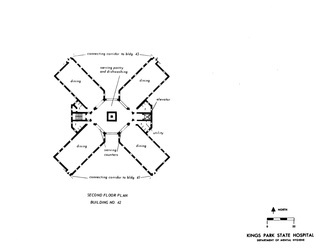 It is located at the center of the group. 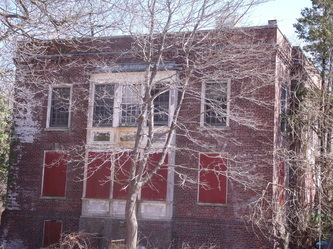 Built from 1932-1933, this building housed wards 109-122. 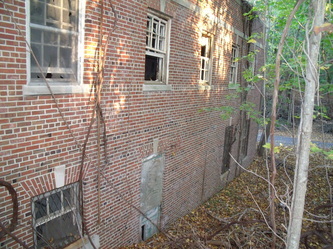 The cemetery tombstones were made in the basement of this building, which is located at the rear of the group. 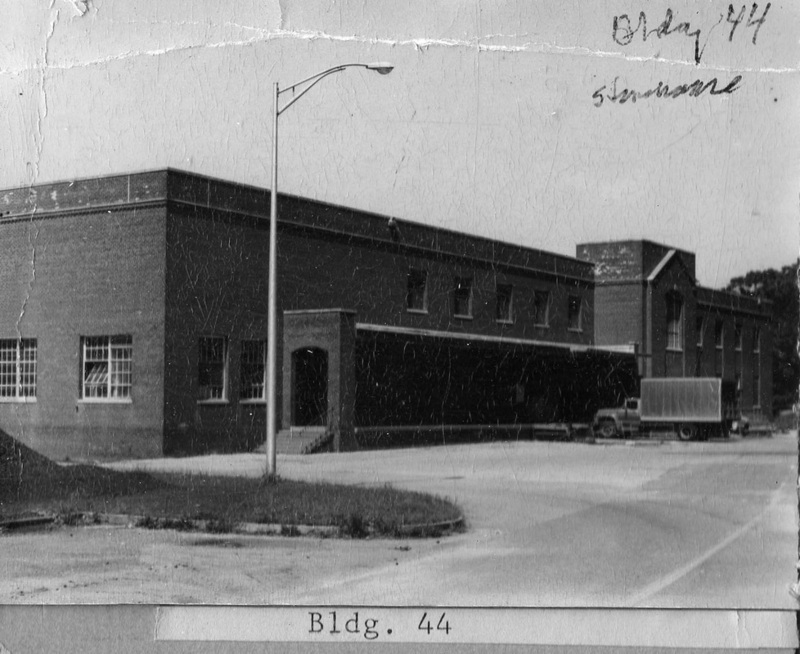 This building was built from 1934-1936 & basically served as a warehouse & bakery. 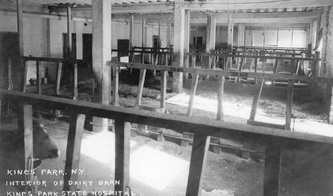 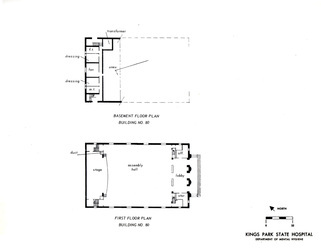 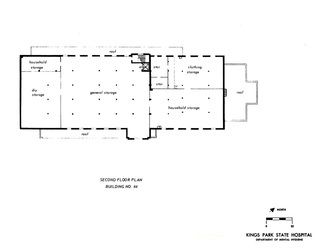 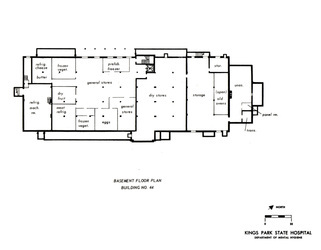 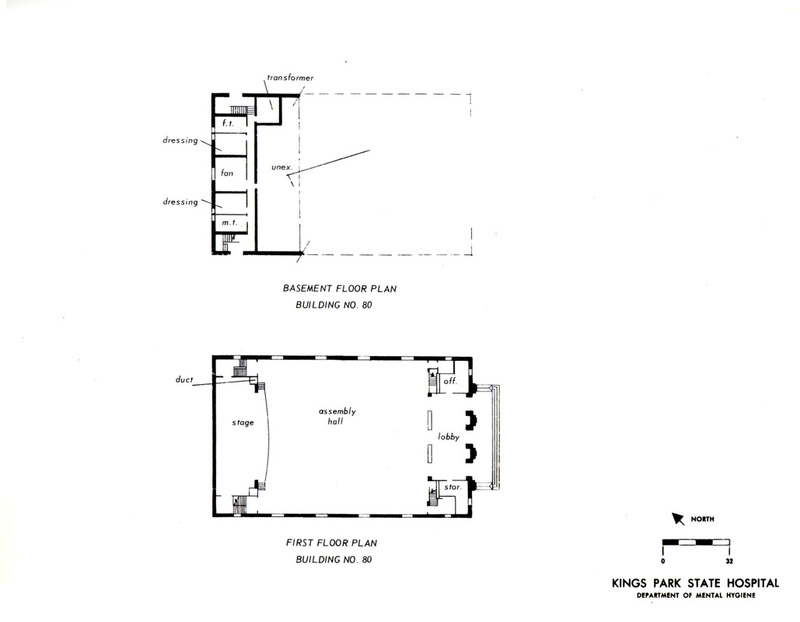 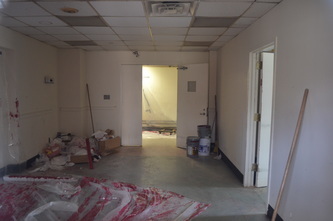 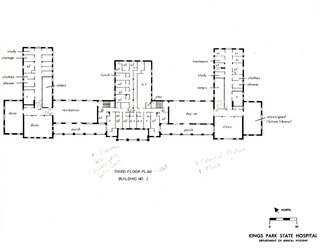 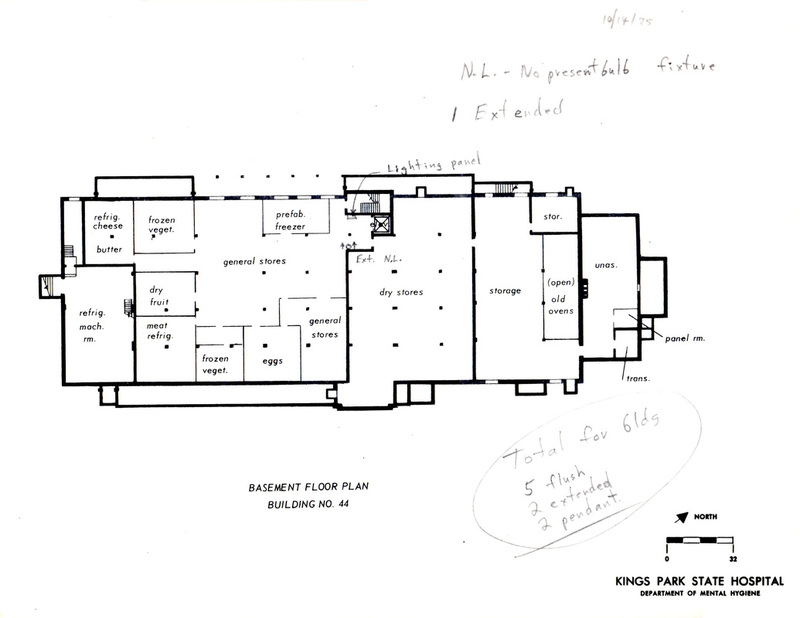 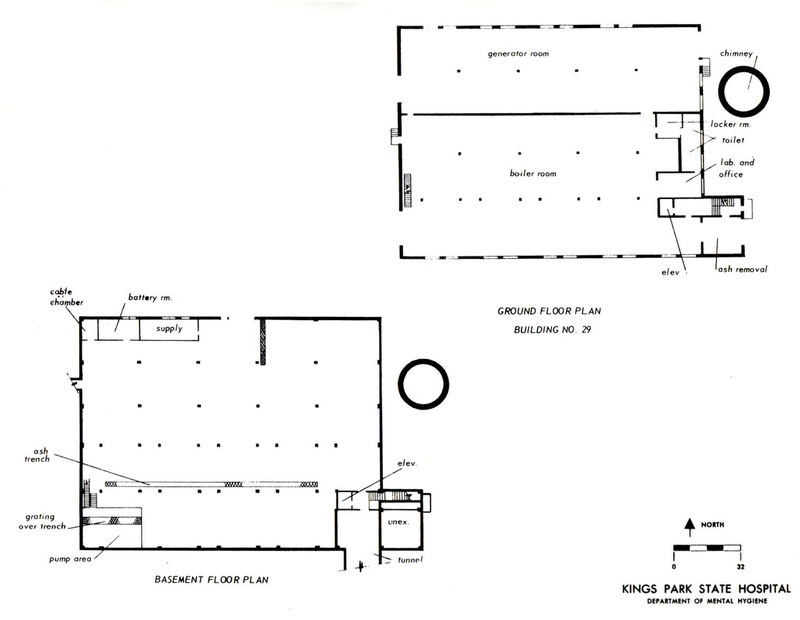 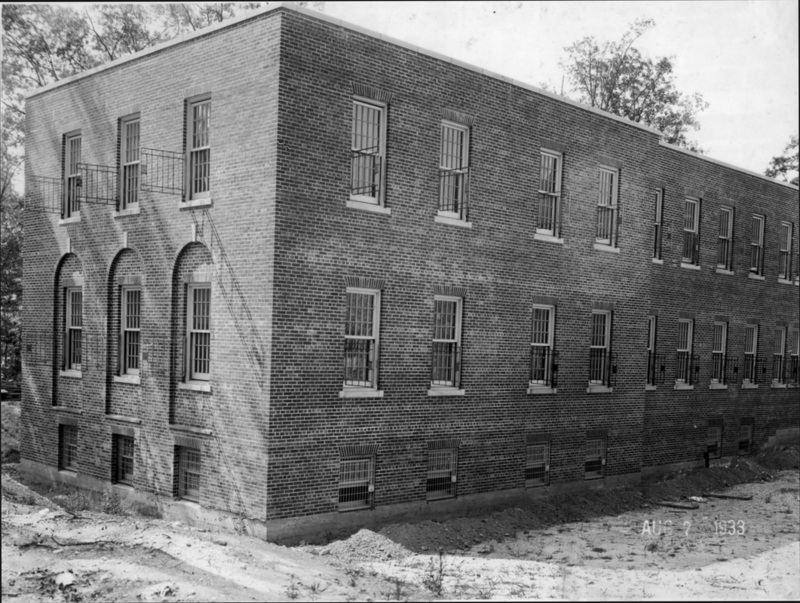 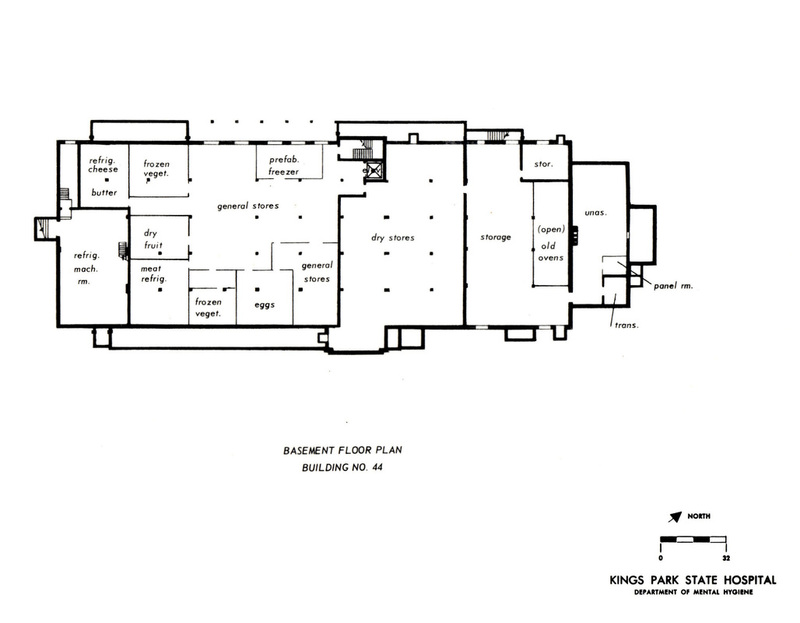 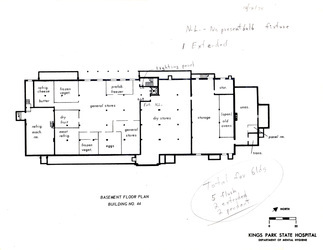 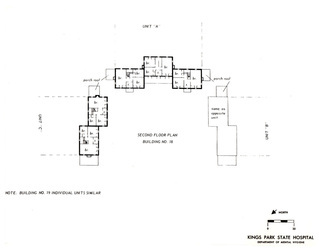 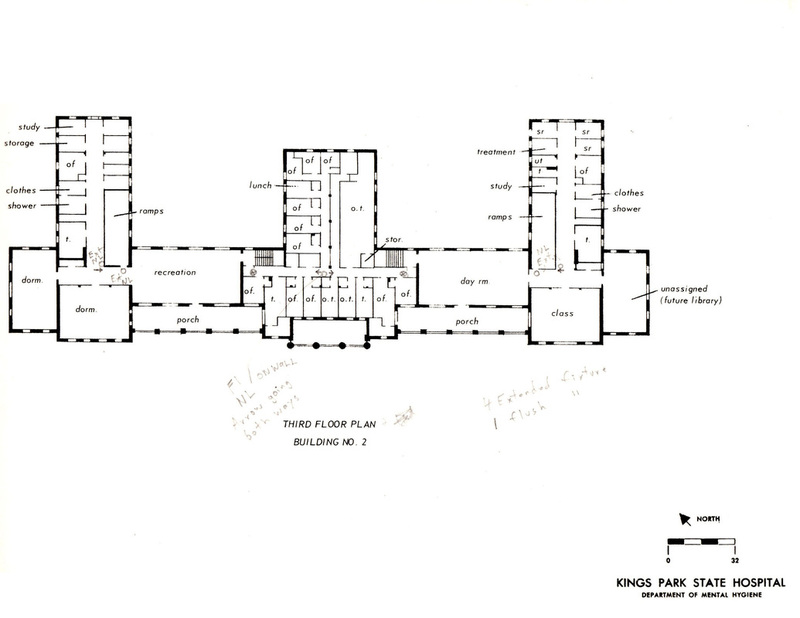 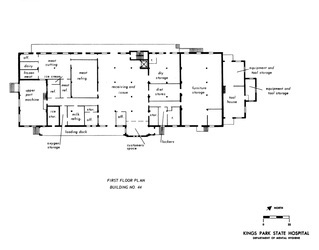 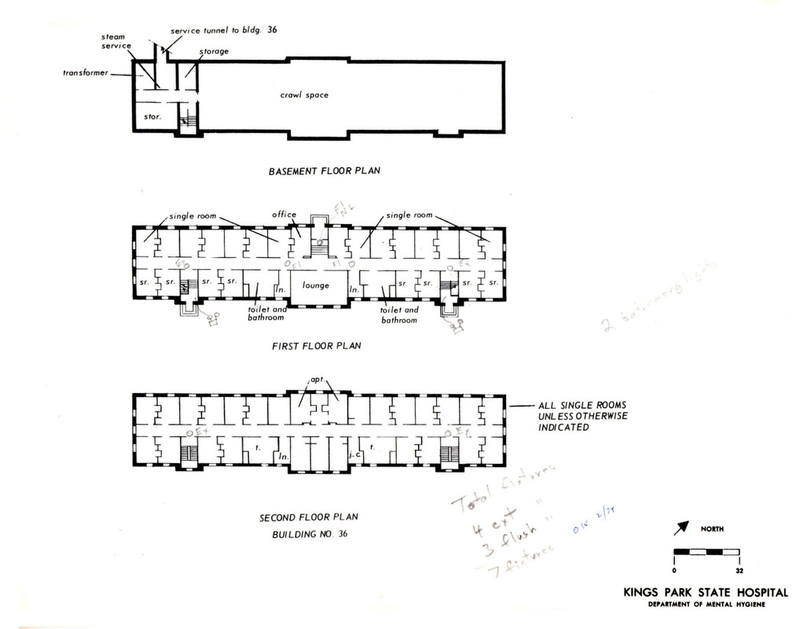 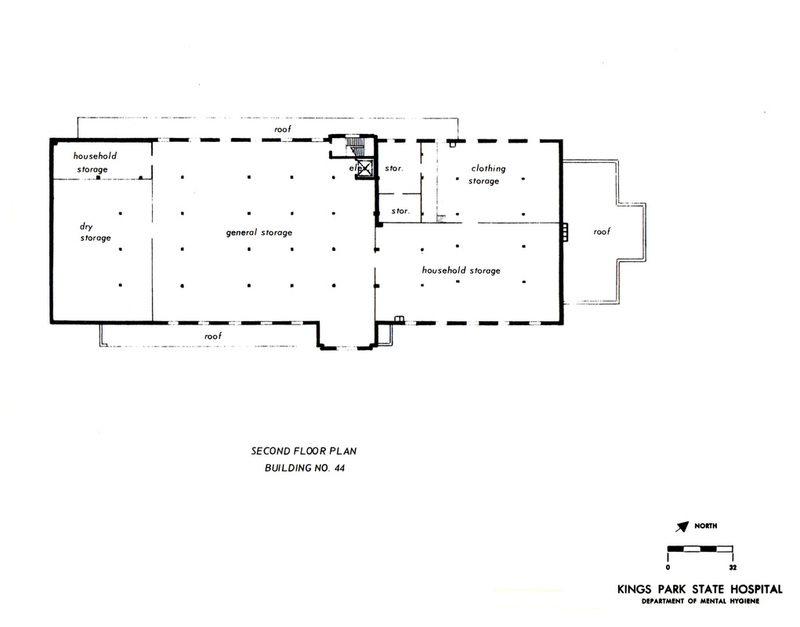 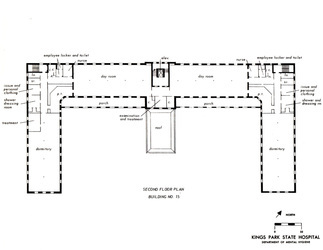 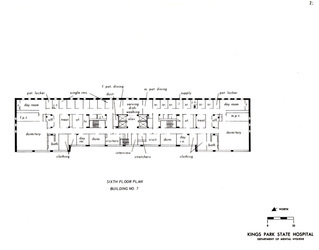 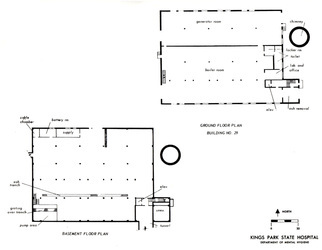 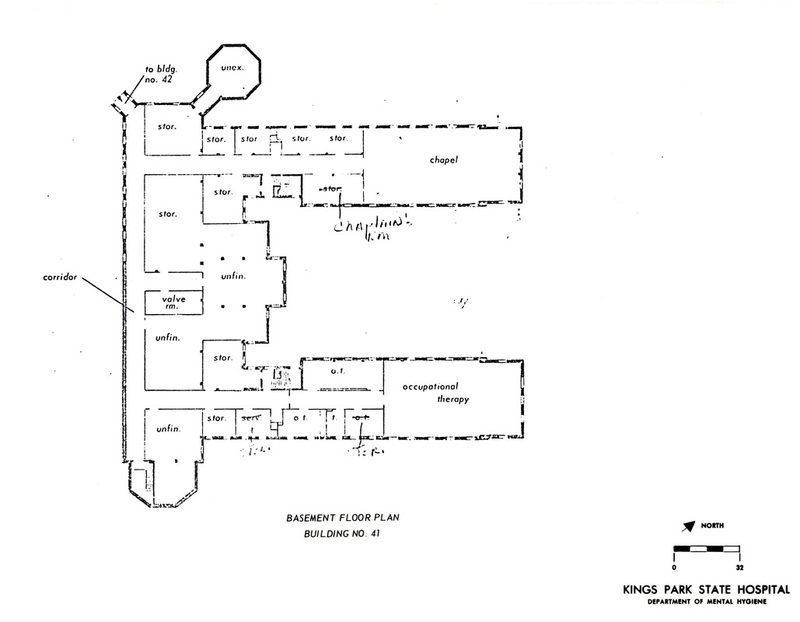 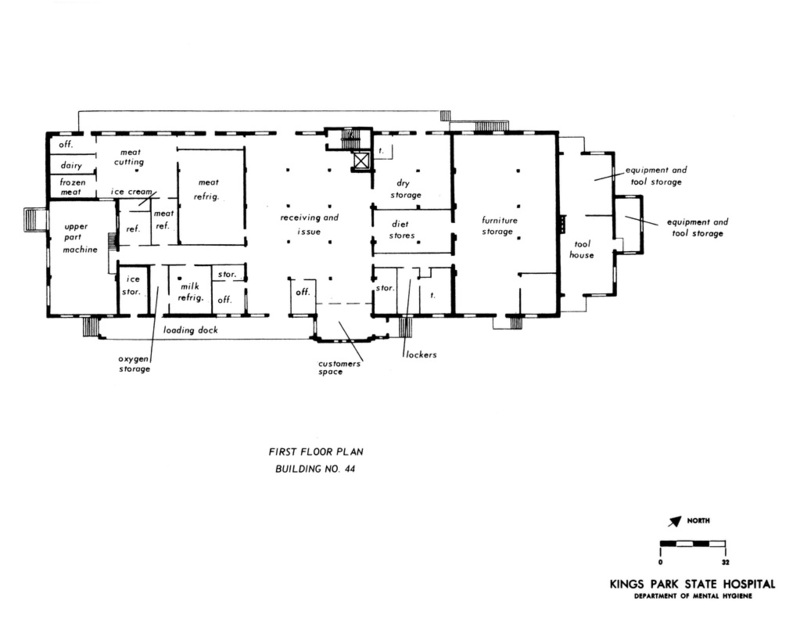 One room on the first floor was also used temporarily as a morgue prior to the construction of Building 7. 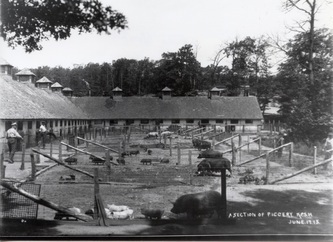 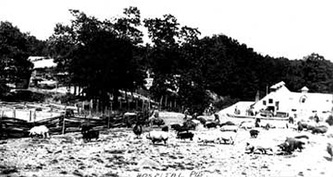 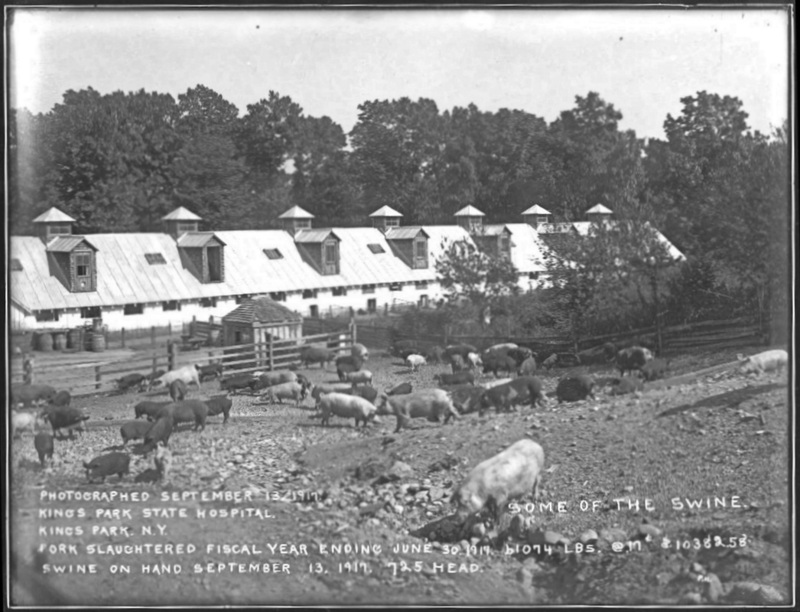 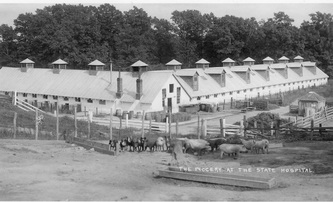 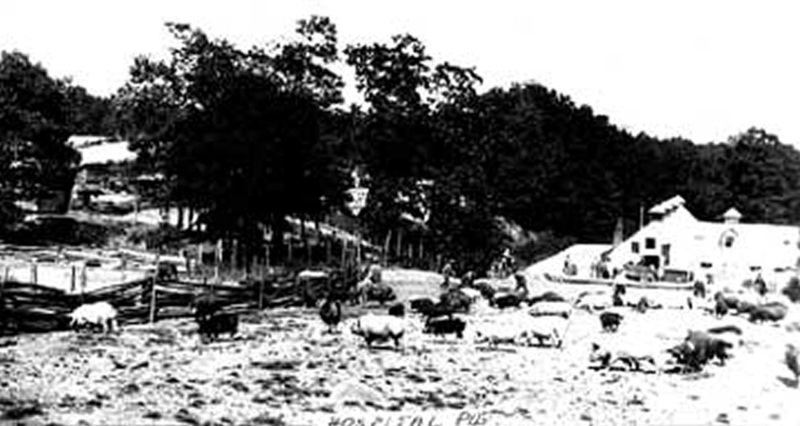 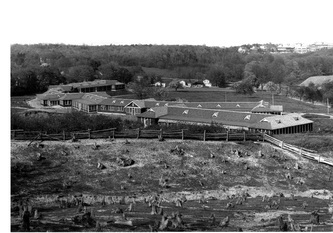 The original piggery was built from 1913-1915. 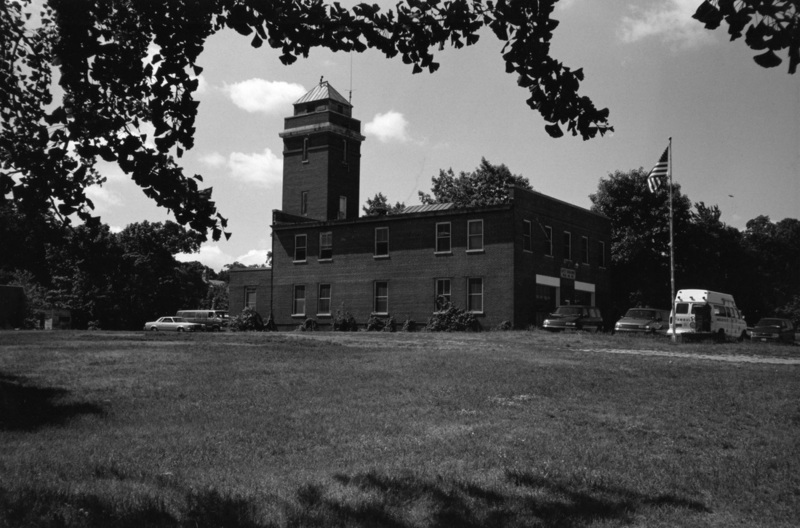 It was demolished during the 1960s & its number designation was reused for the water tower, which was built nearby. 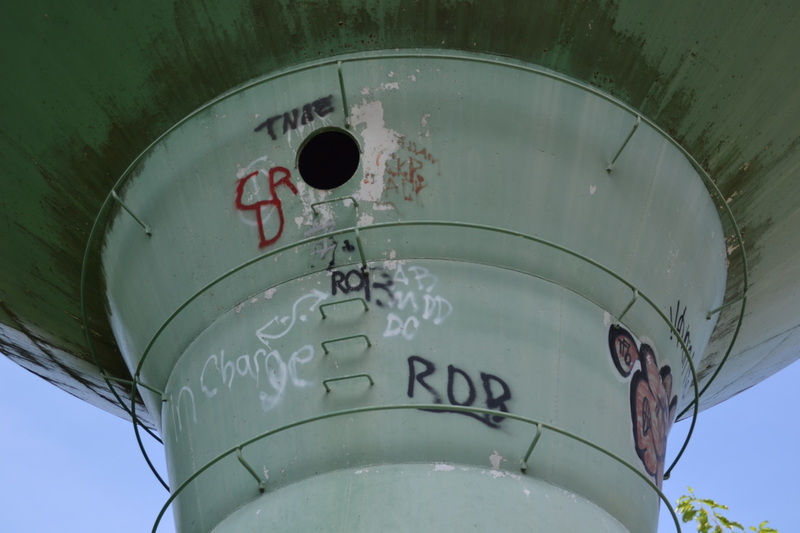 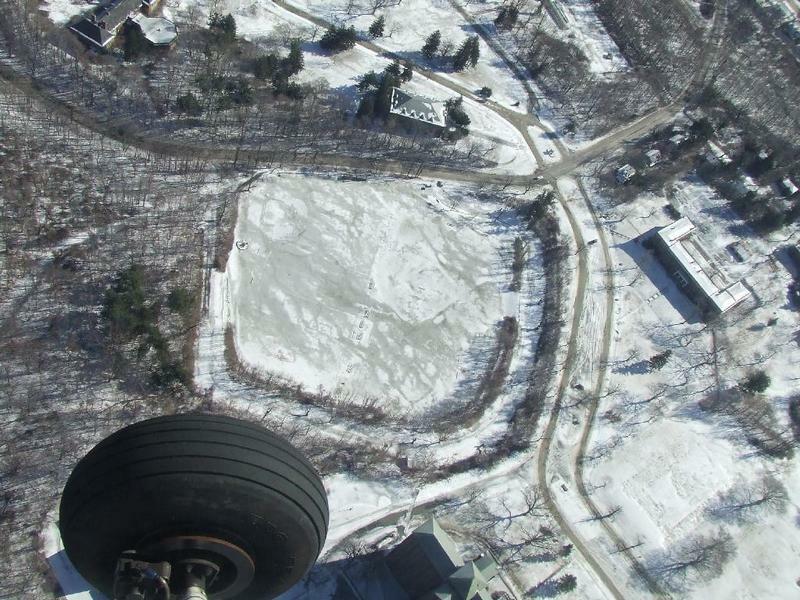 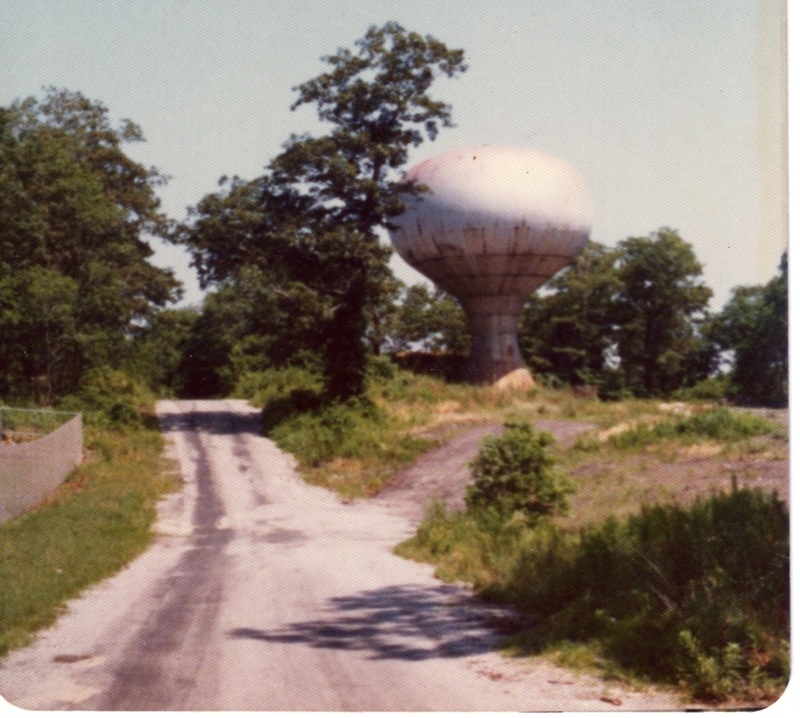 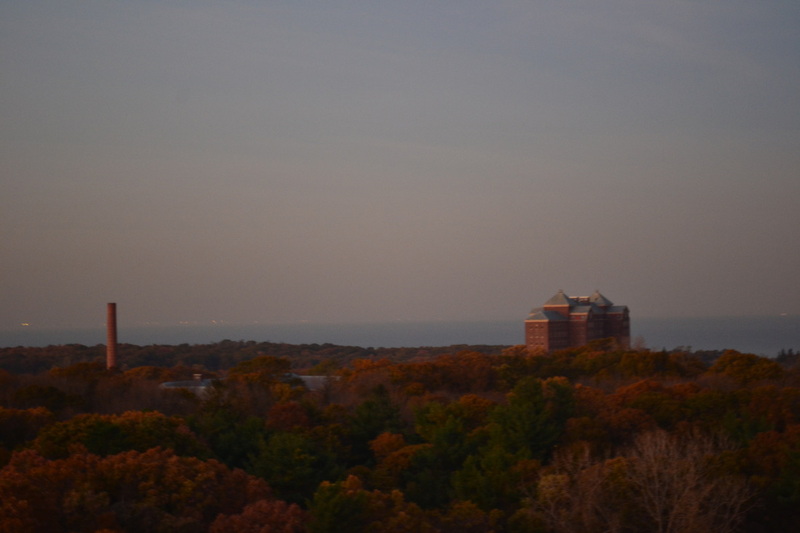 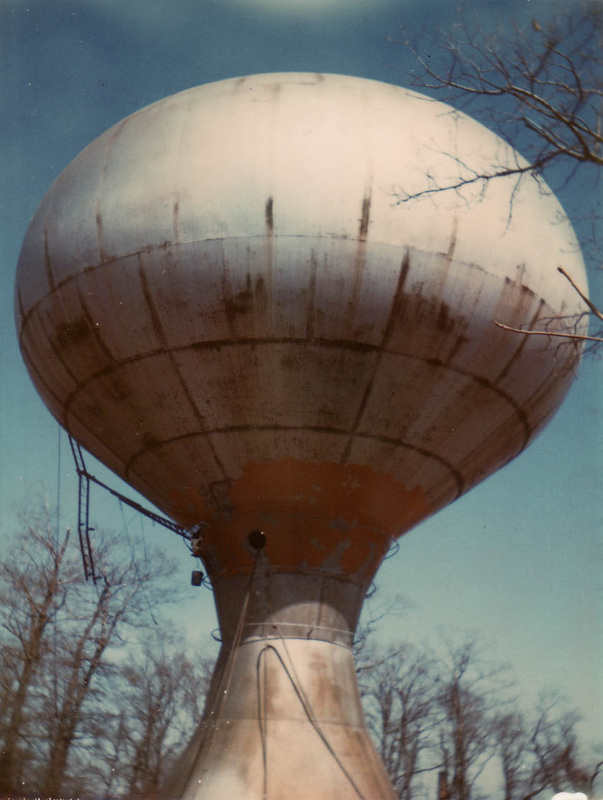 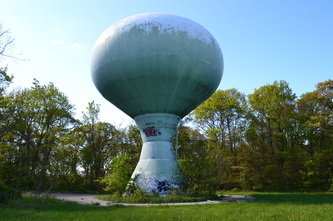 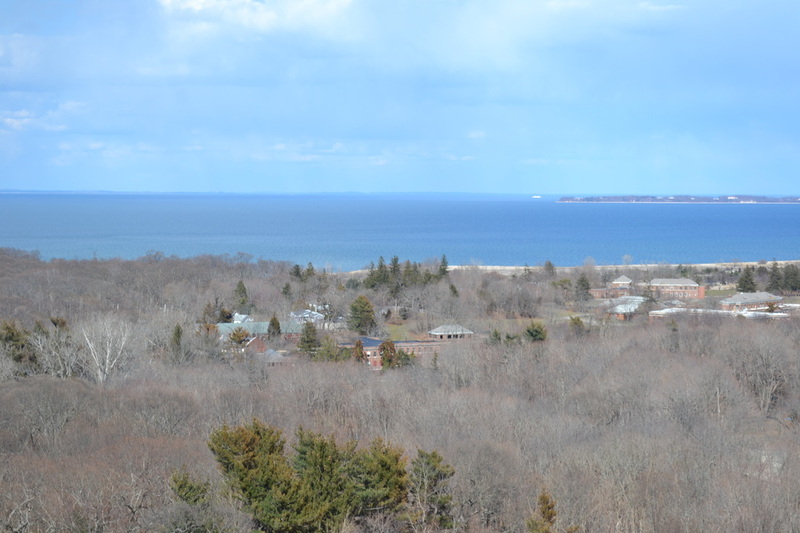 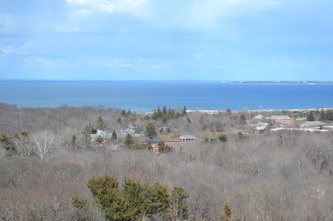 Built between 1957-1960 atop a hill, this water tower had a capacity of 500,000 gallons of water. 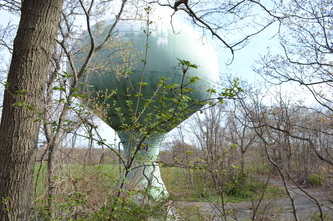 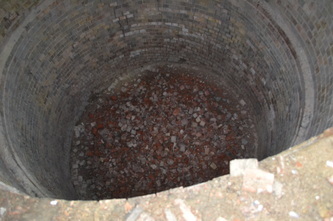 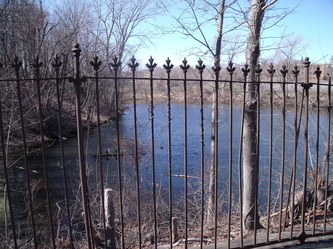 It replaced the old reservoir, which was located right next to it. 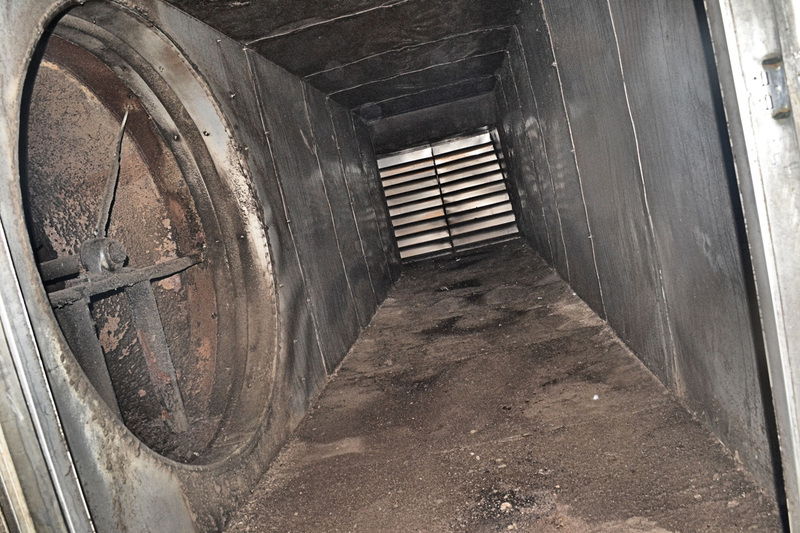 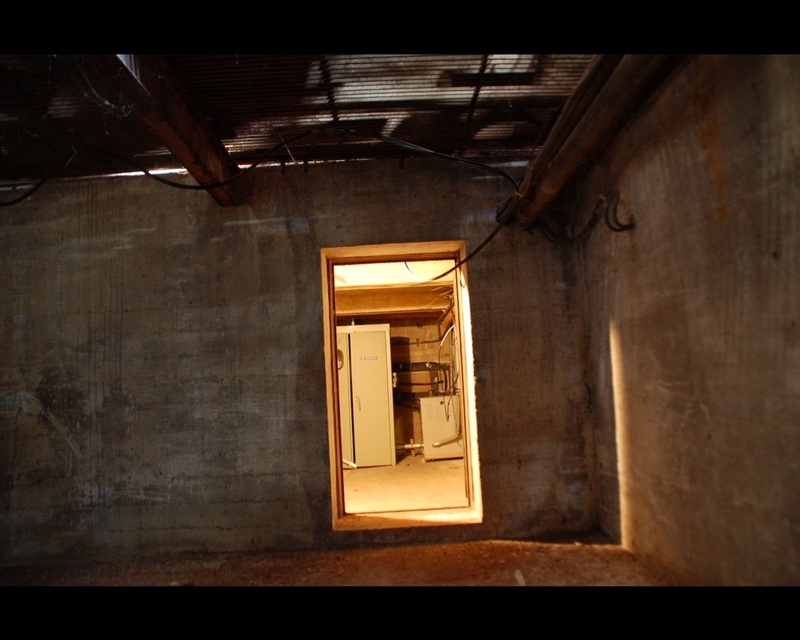 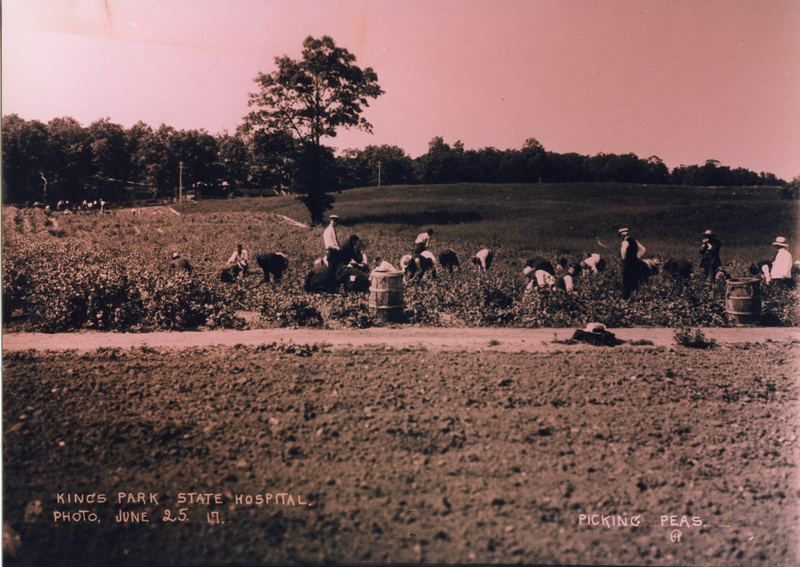 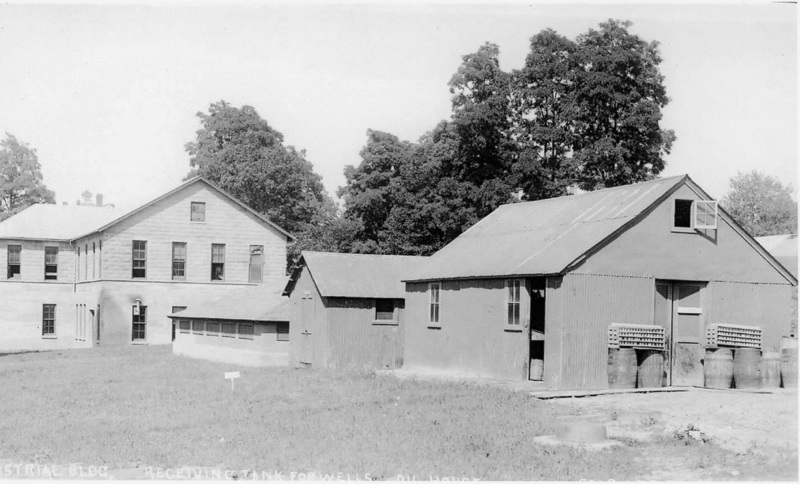 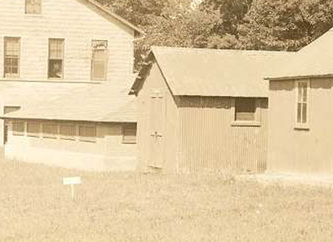 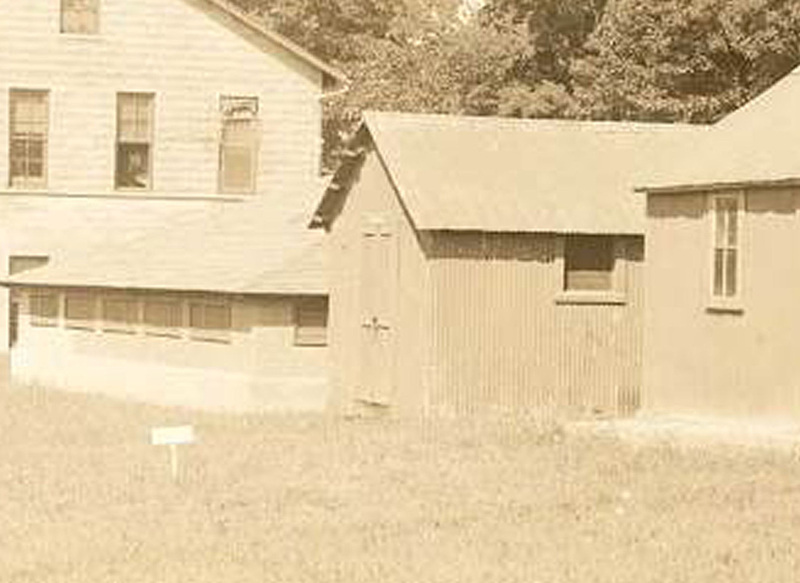 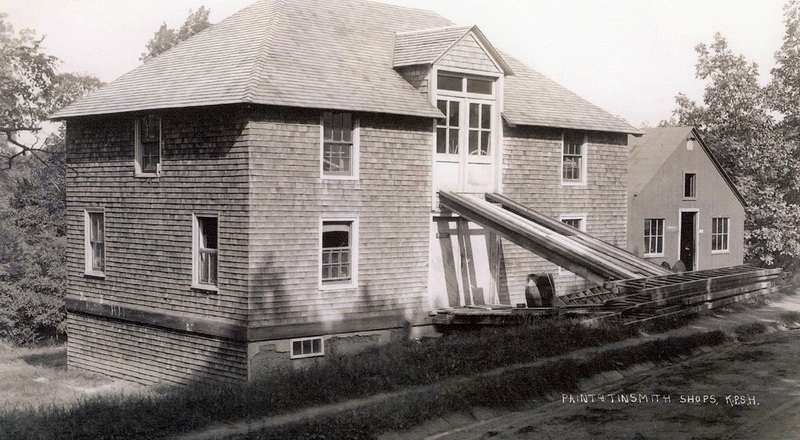 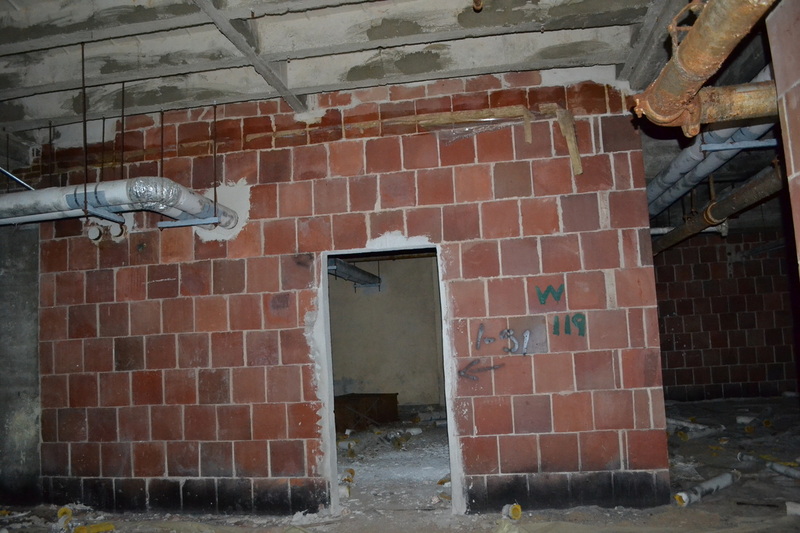 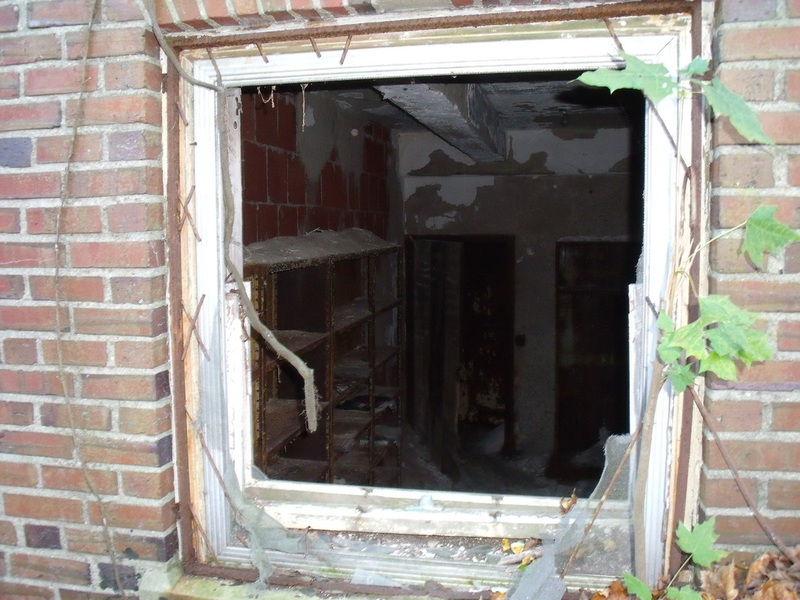 The root cellar was the first farm building at the hospital & was built in 1917. 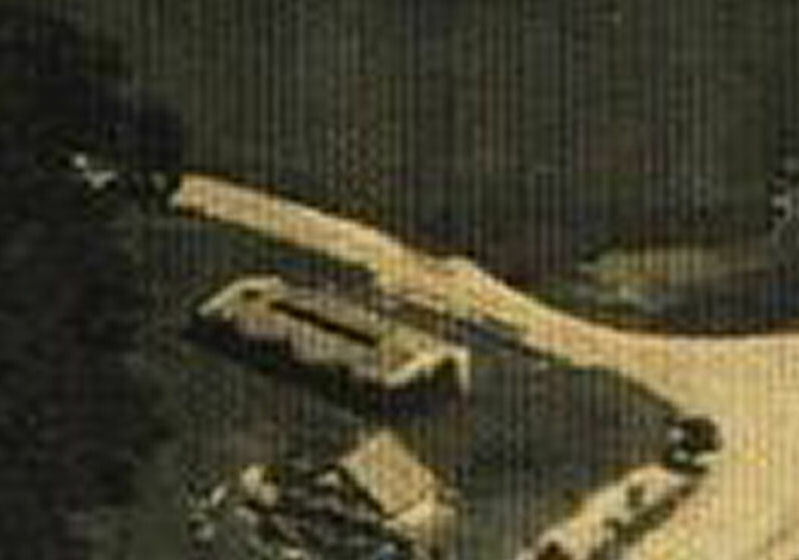 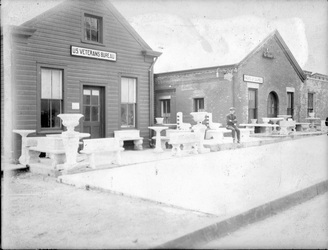 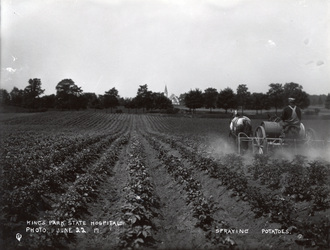 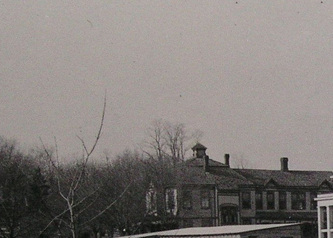 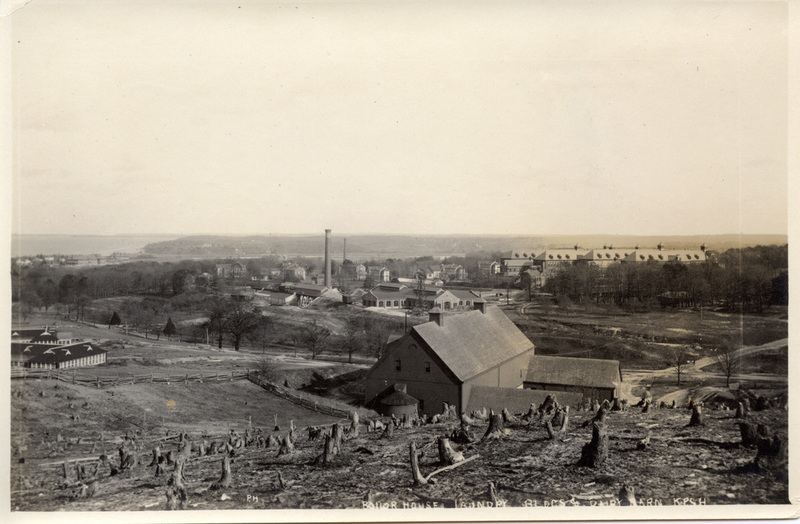 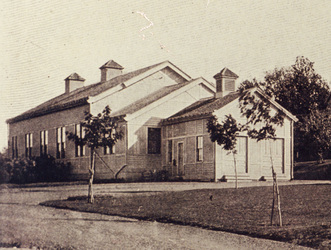 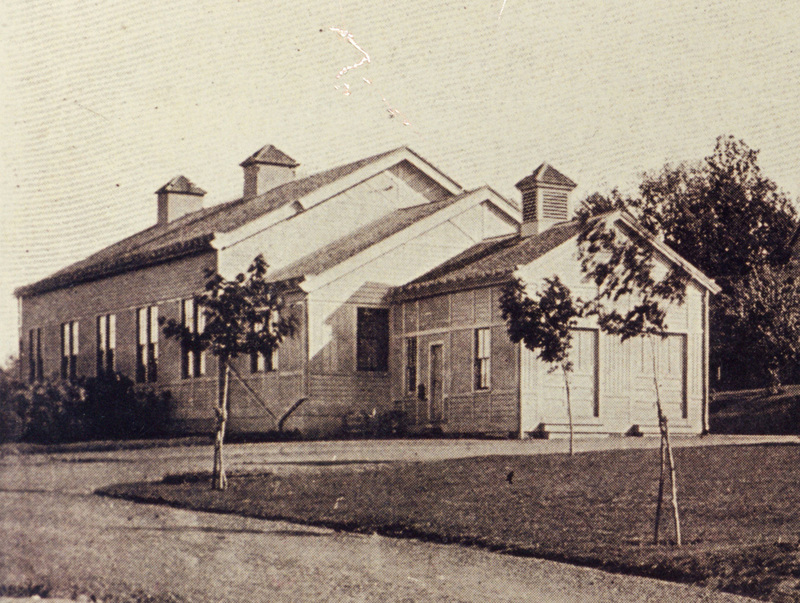 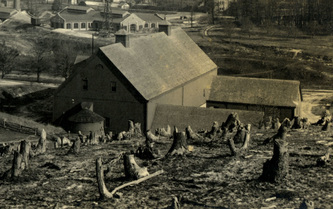 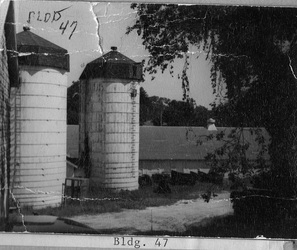 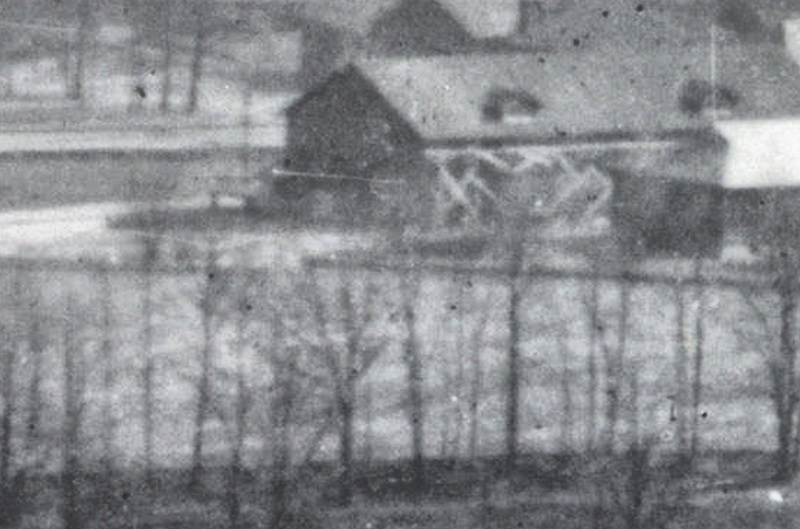 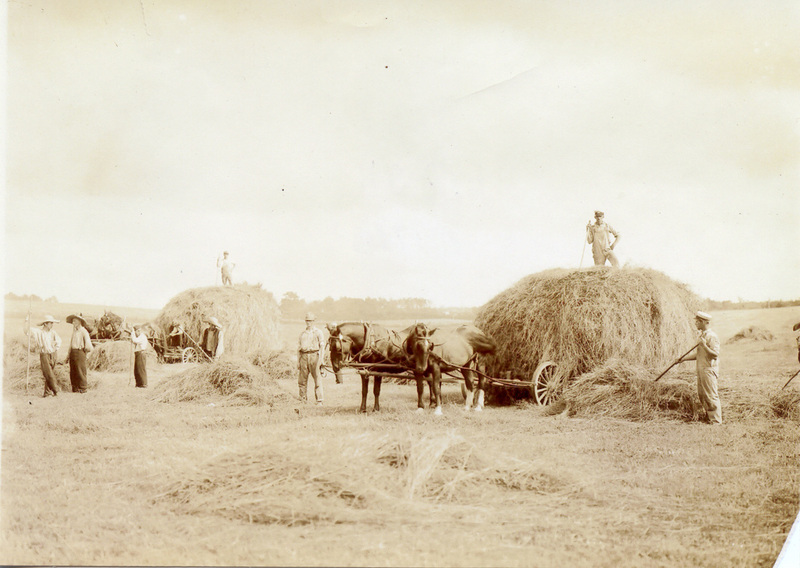 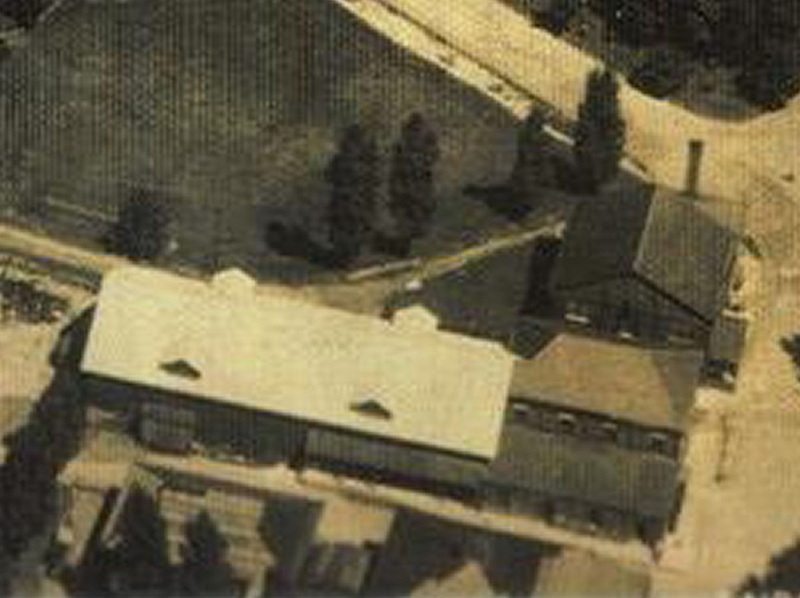 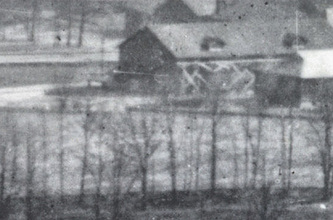 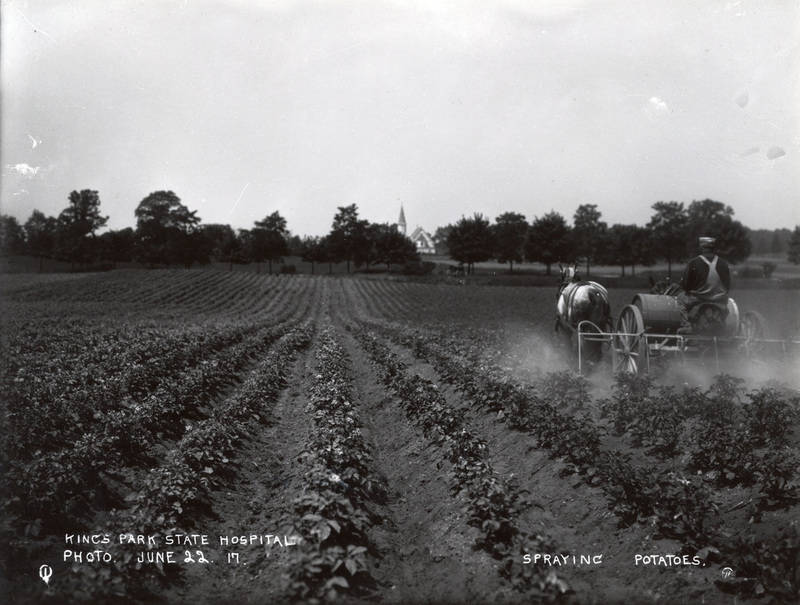 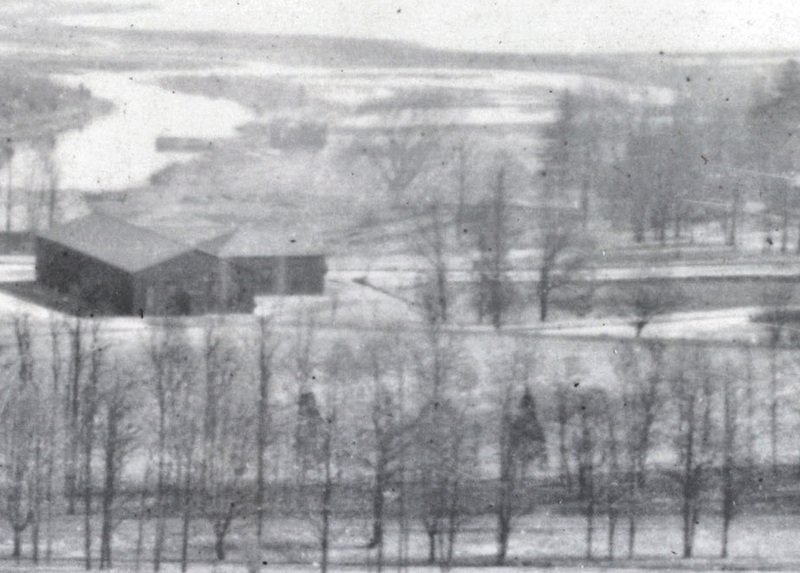 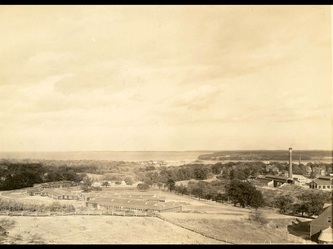 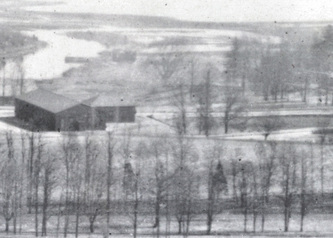 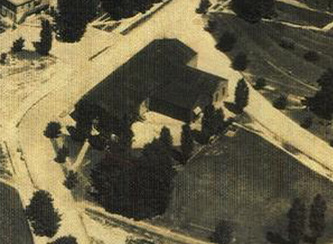 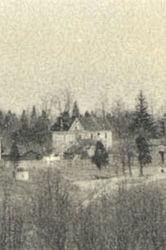 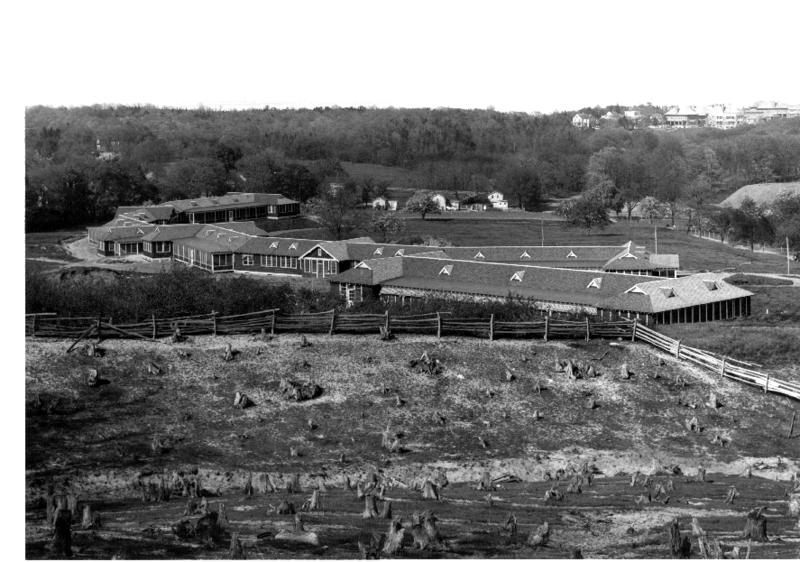 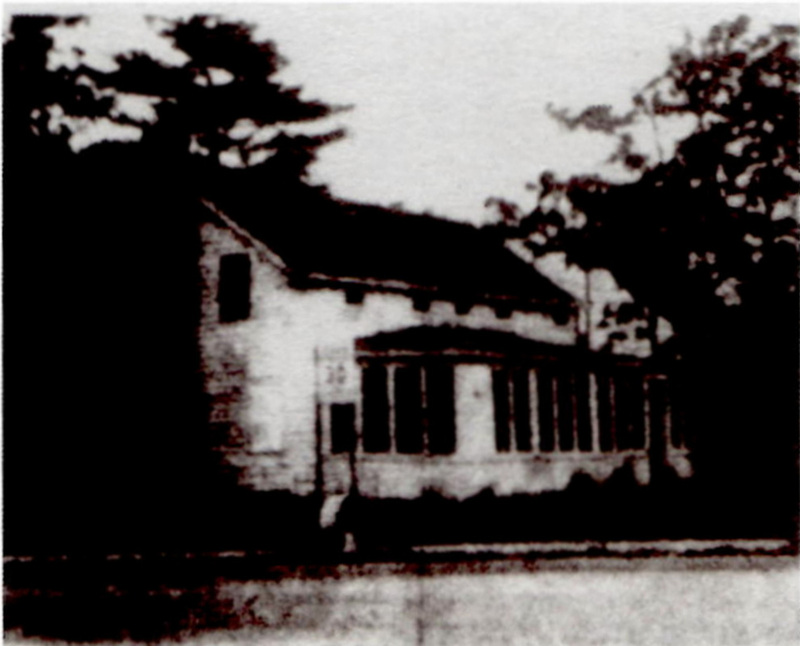 It was demolished prior to 1941 & replaced by the dairy barn and maintenance barn. The slaughter house, which was actually Building 88 was renumbered as Building 46 mostly due to confusion by many, who believed them to be the same building. 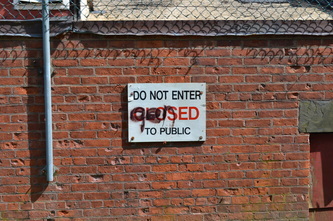 Obviously, they were not. 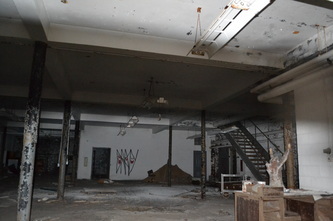 To see more photos go to Building 88. 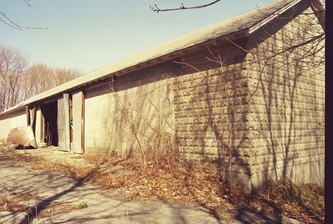 The dairy barn was built from 1940-1941. 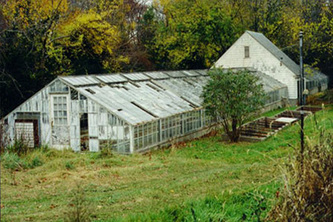 It was demolished in the 1990s decades after being abandoned. 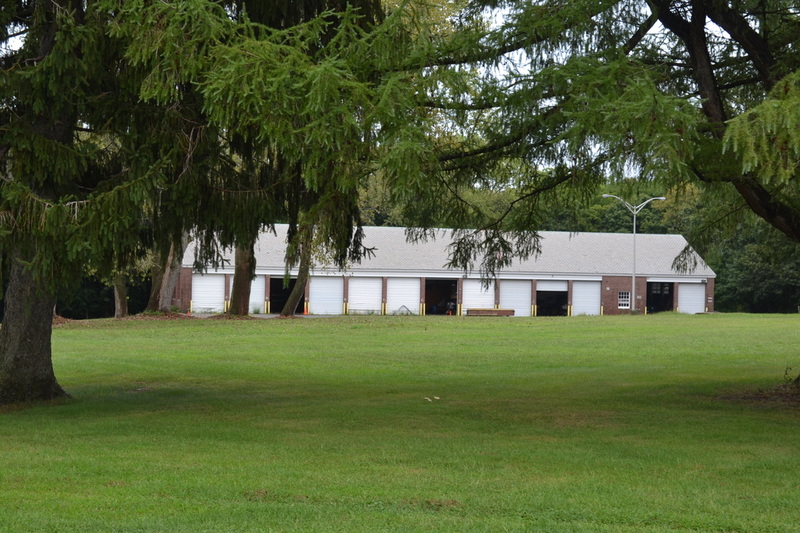 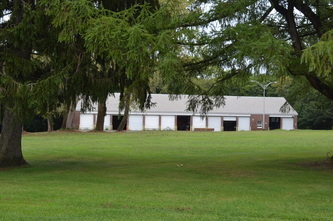 This building built between 1940-1943 originally served as a horse barn, but later became a maintenance building. It was demolished at the end of 2012. 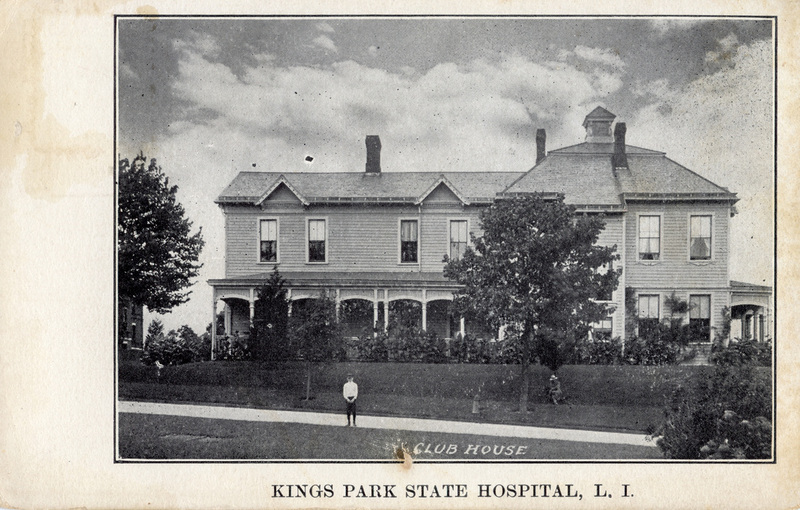 This house was built before the hospital was established & previously belonged to the Kelly family. It was constructed sometime between 1837-1858 along Route 25A. 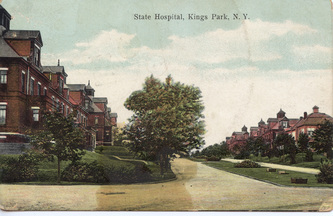 It was purchased by the state in 1885 when the land was acquired to build the hospital. 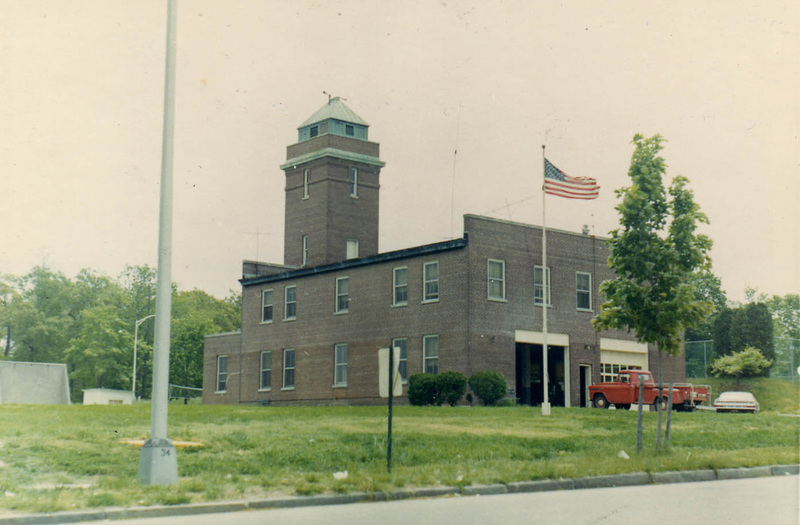 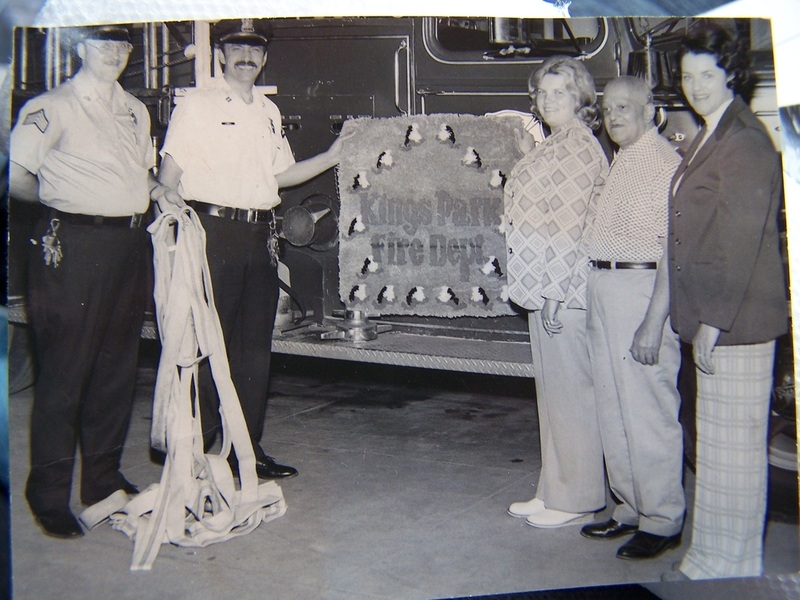 It was later renumbered as Building 33 & used for fire practice in 1964. This was one of the original cottages built between 1890-1892, near the female cottages behind Macy Hall. 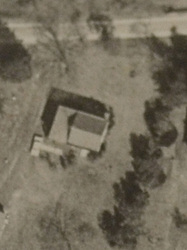 In 1951 it was converted into a 2-family home with a basement & attic. 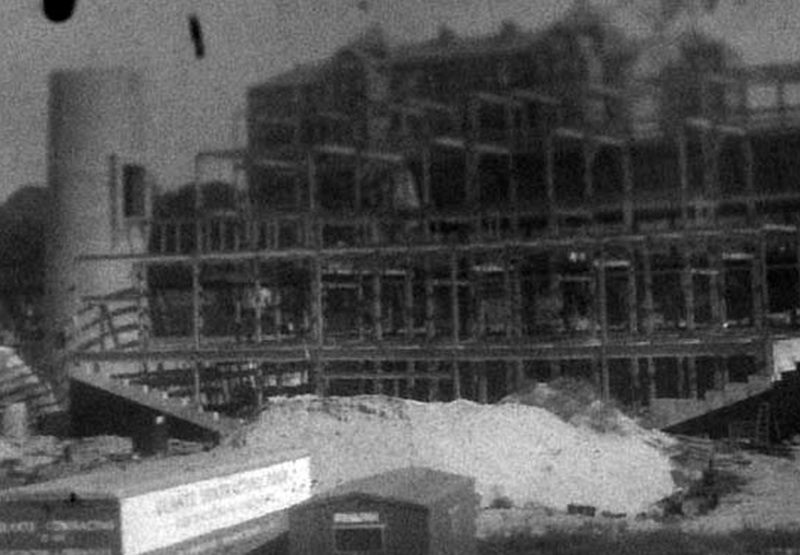 It was destroyed by a fire in 2000 & demolished about a year later. 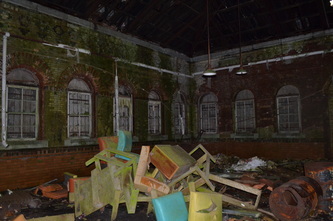 Built between 1890-1892, this was a dining hall for hospital employees. 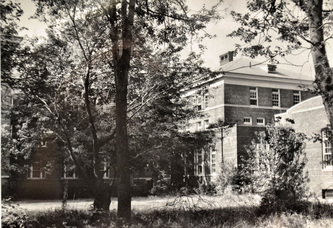 It was demolished in 1968. 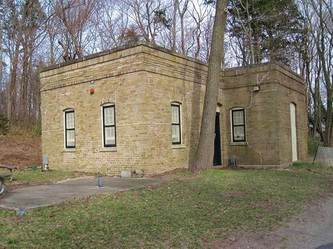 This storage house was built between 1890-1892 & was used as an ice house. It was attached to the former kitchen, Building 52. 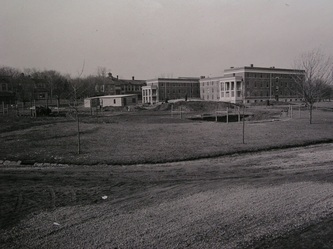 It was demolished in 1967. 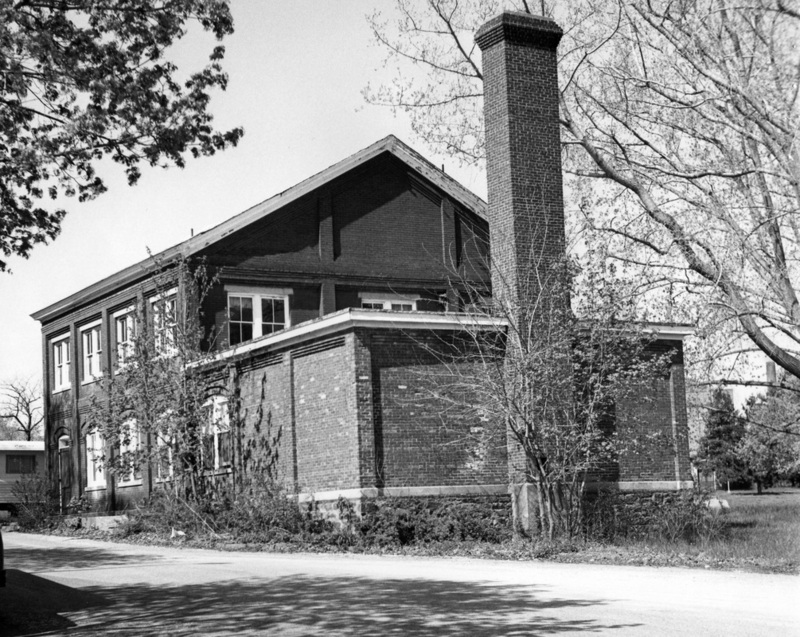 Built between 1890-1892, this house served as a bakery, until it was replaced by Building 44 & converted into a schoolhouse during the 1950s. 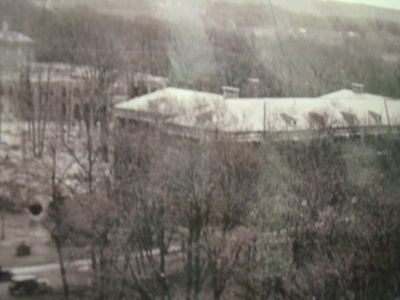 It was torn down in the 1970s. 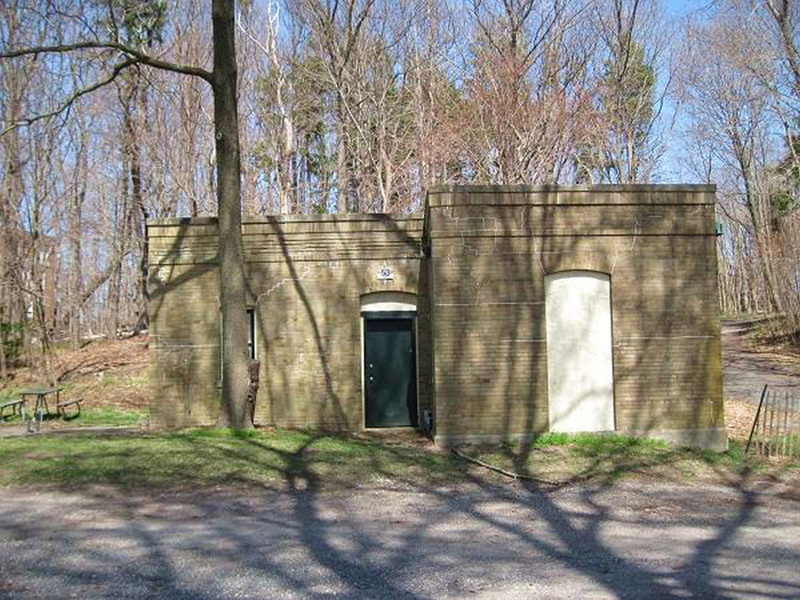 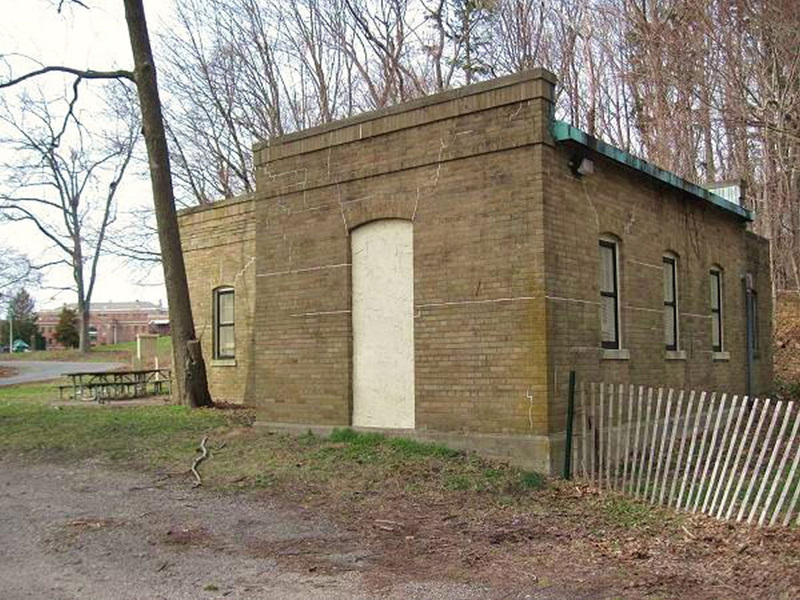 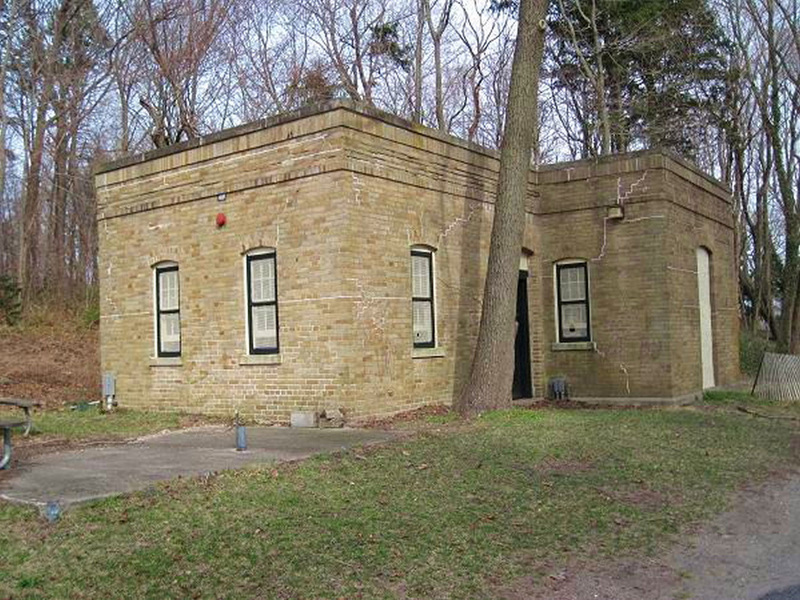 This structure was built in 1930 as a sewage pump house. 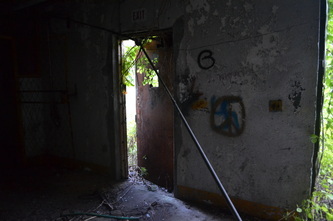 This was the number designation for the original 3 buildings of Group 2, built between 1912-1915. 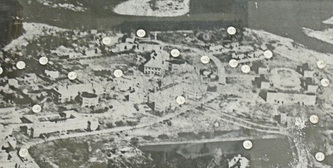 They were Buildings 122-124, all of which are now demolished. 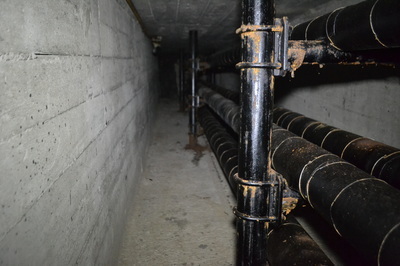 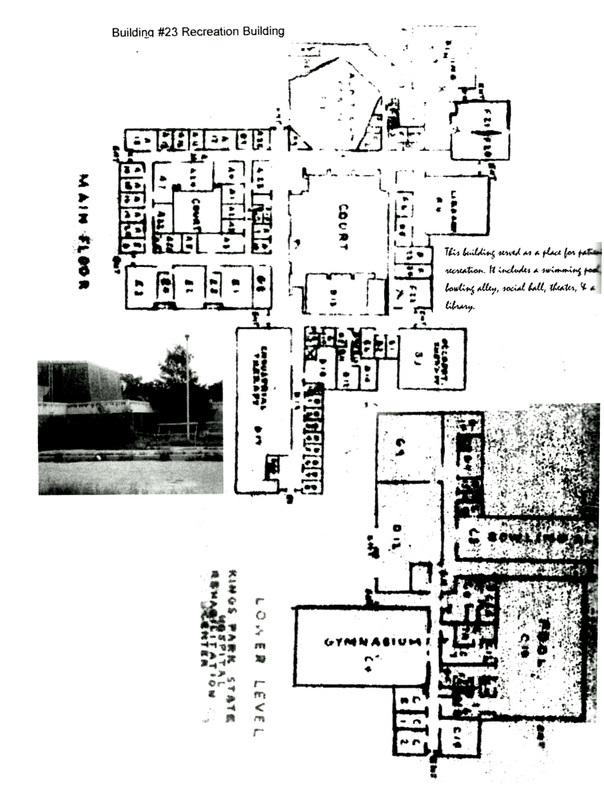 Each building was connected to each other through the underground tunnel system. 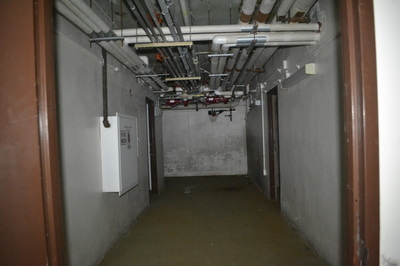 For more photos refer to Buildings 122-124. 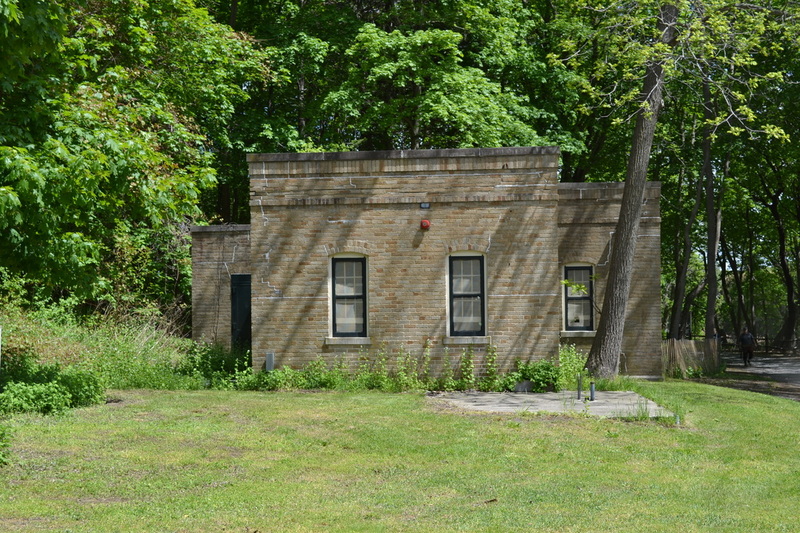 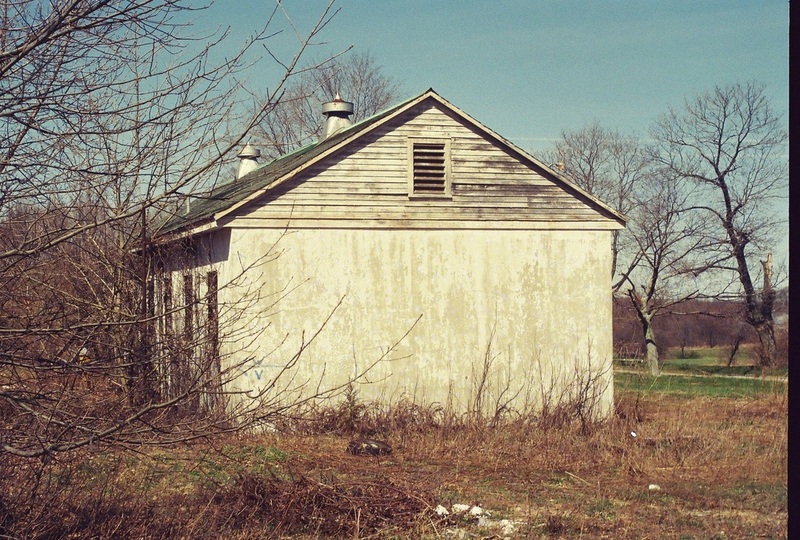 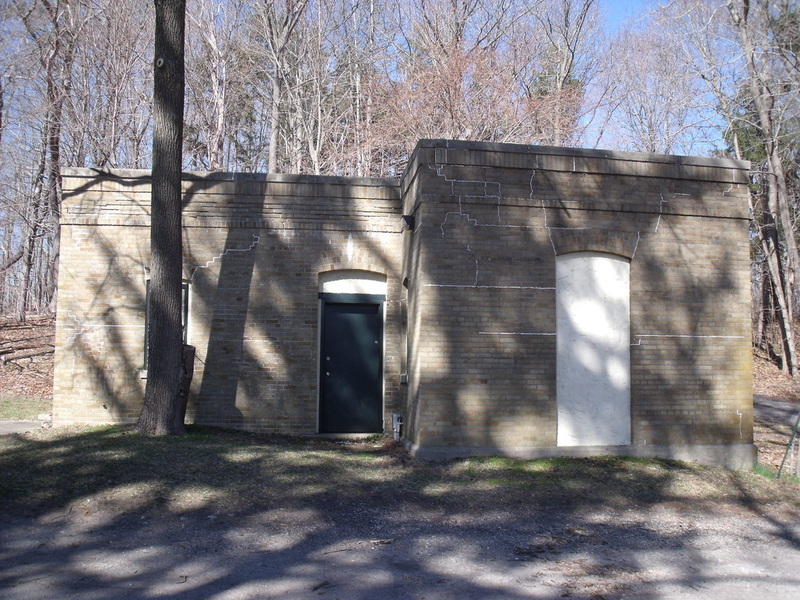 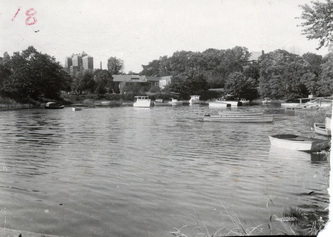 This was the boathouse built in 1920 near the canal, which became the boat basin that exists today as part of the Nissequogue River State Park. 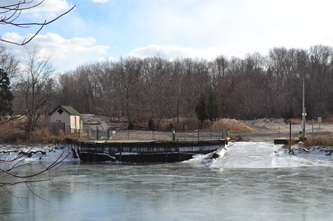 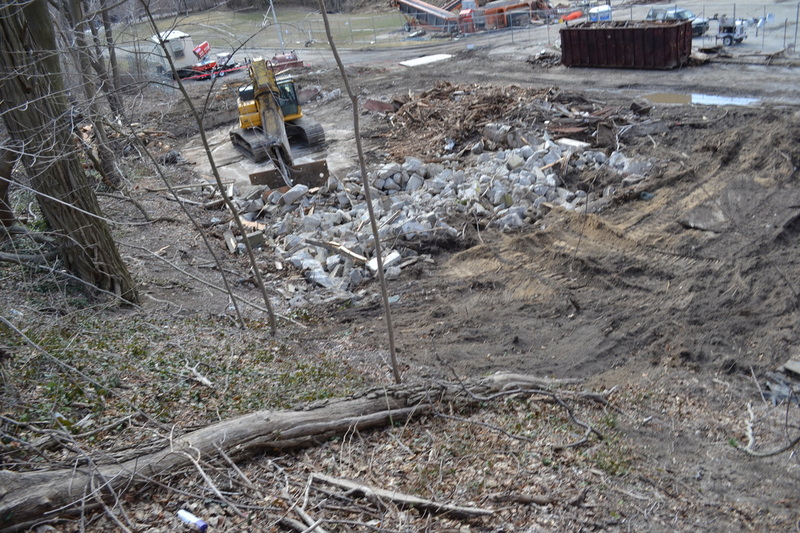 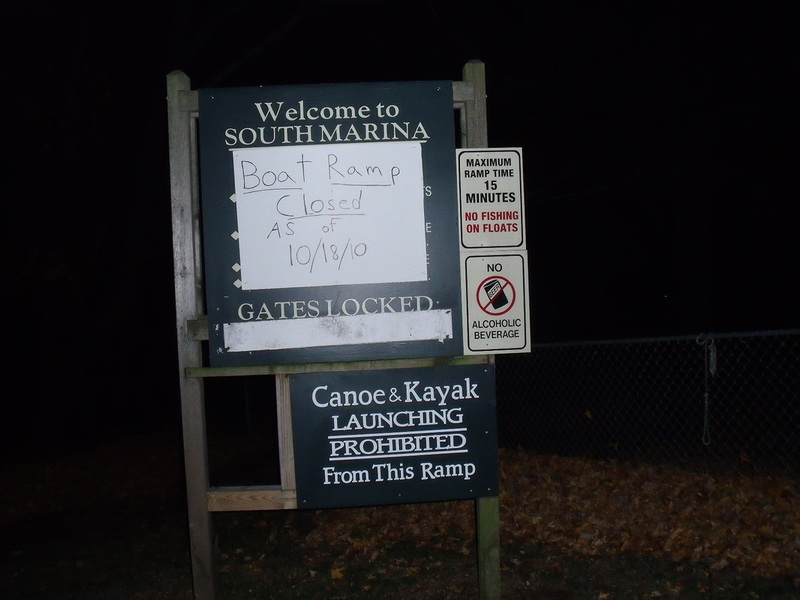 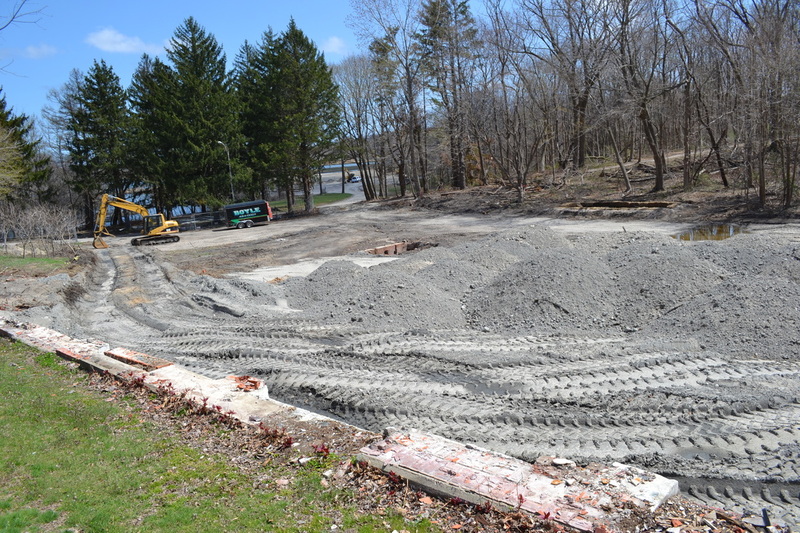 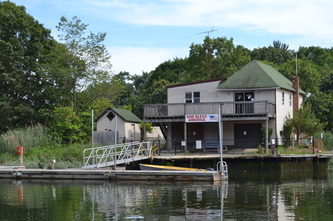 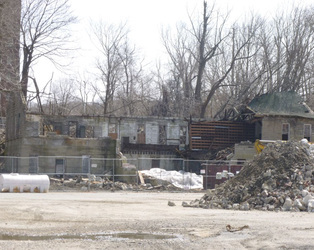 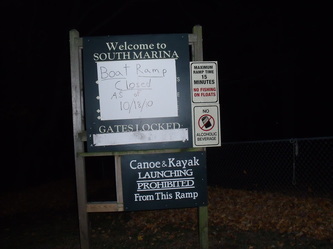 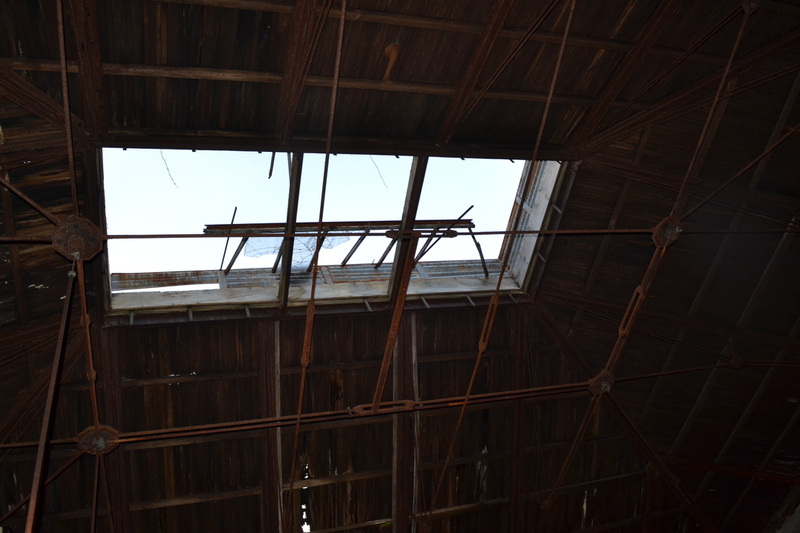 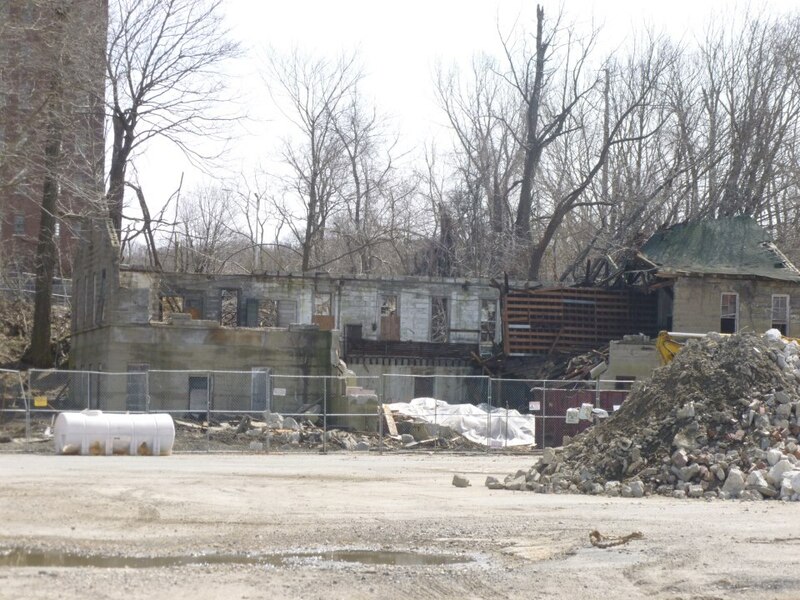 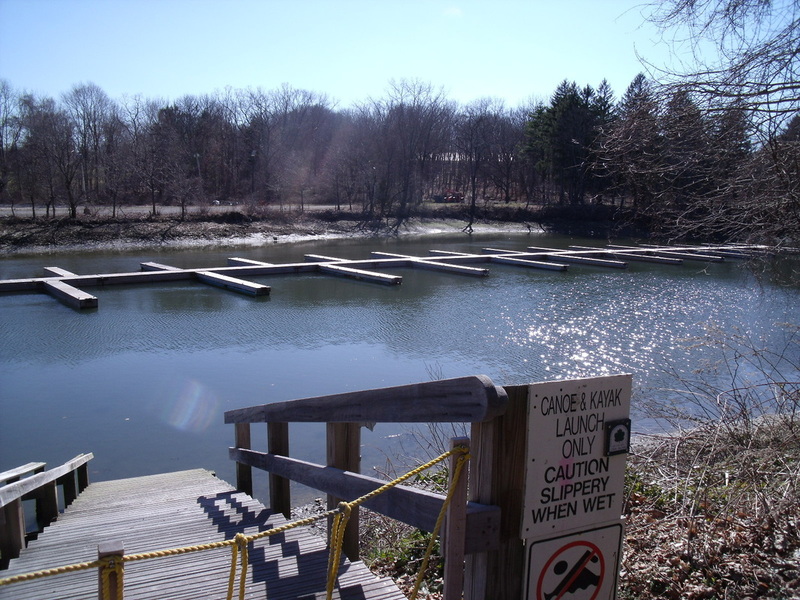 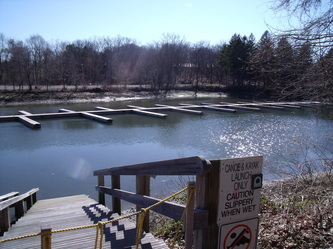 Unfortunately, the boathouse was demolished in January of 2013. 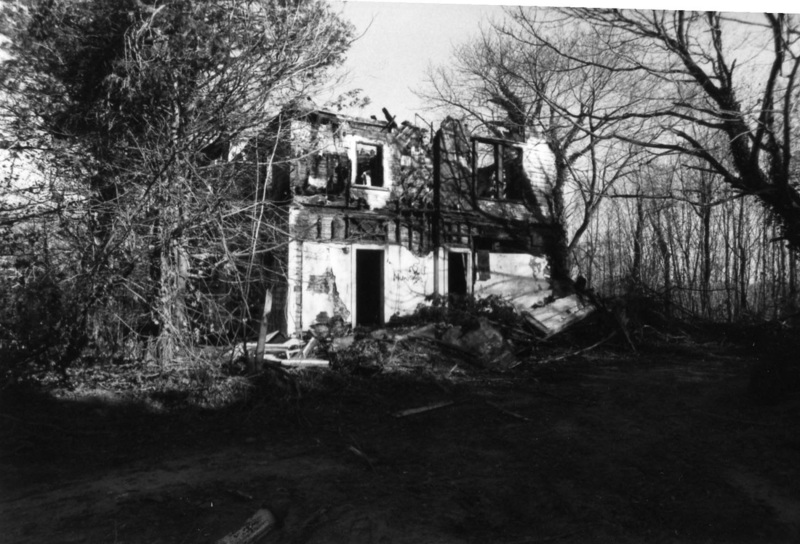 The first Building 56 was the house belonging to the Assistant Steward, which was built during the early 1900s & demolished in the 1940s. This was one of the last structures to be added to the hospital & was built between 1972-1973. 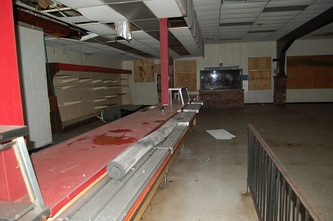 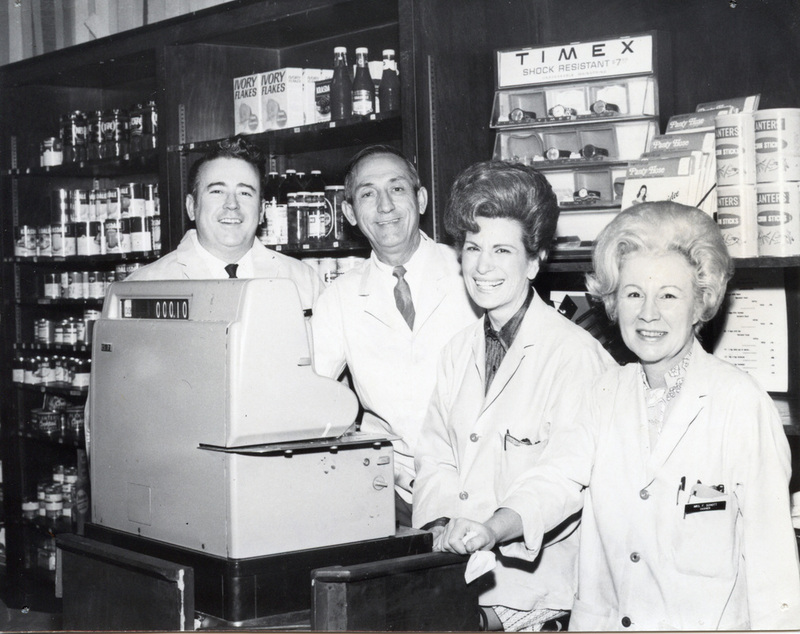 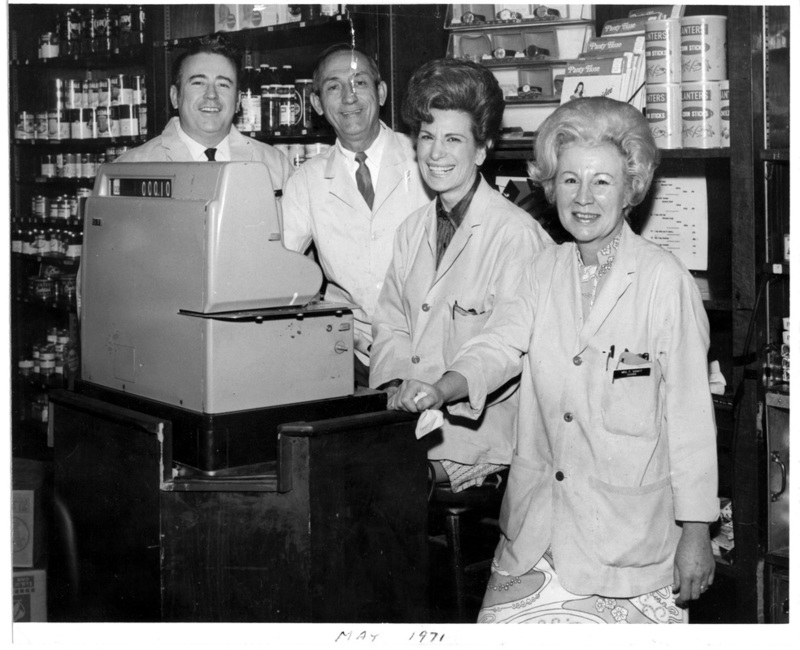 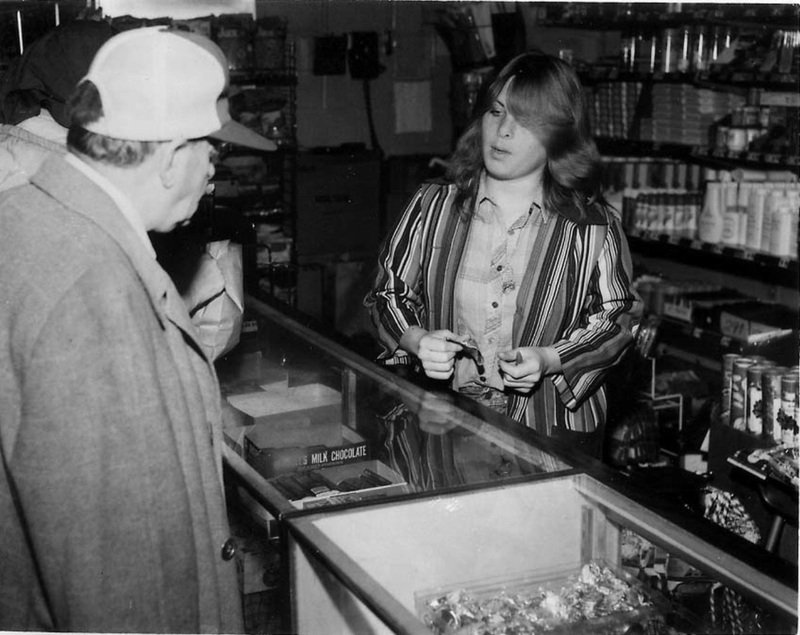 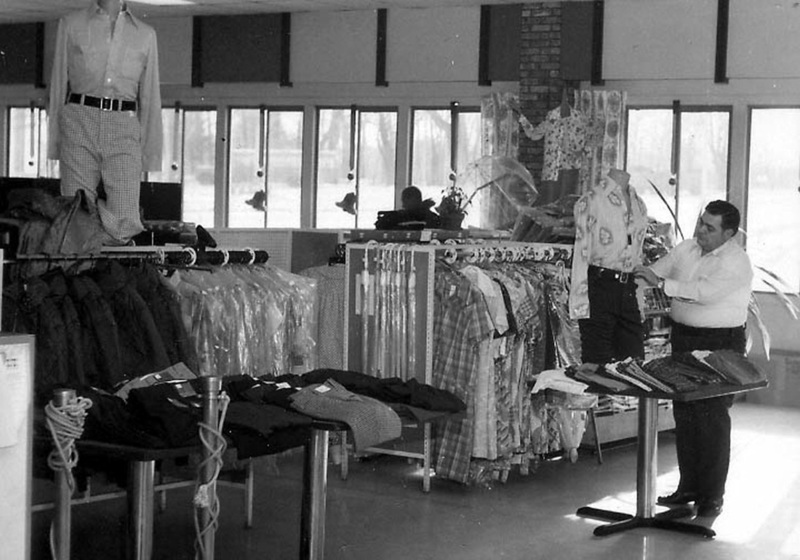 It served as the community store & was known as Cafe 56. 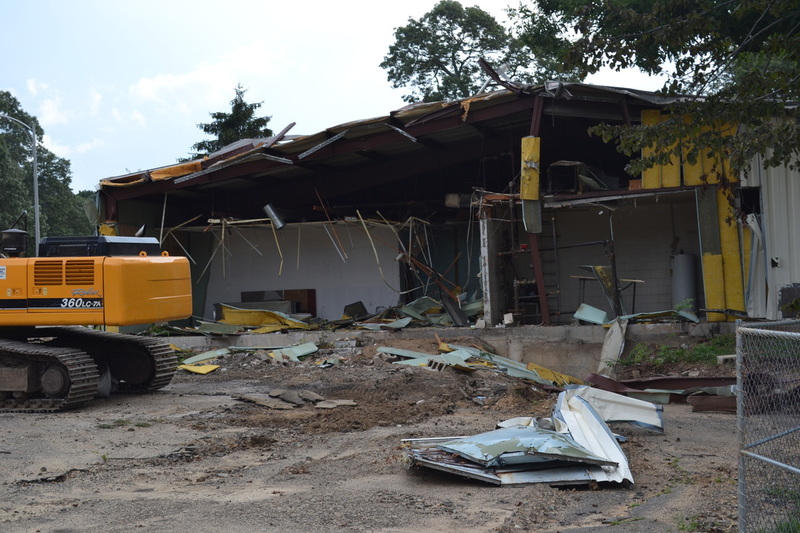 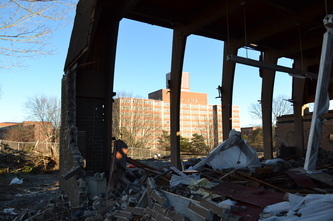 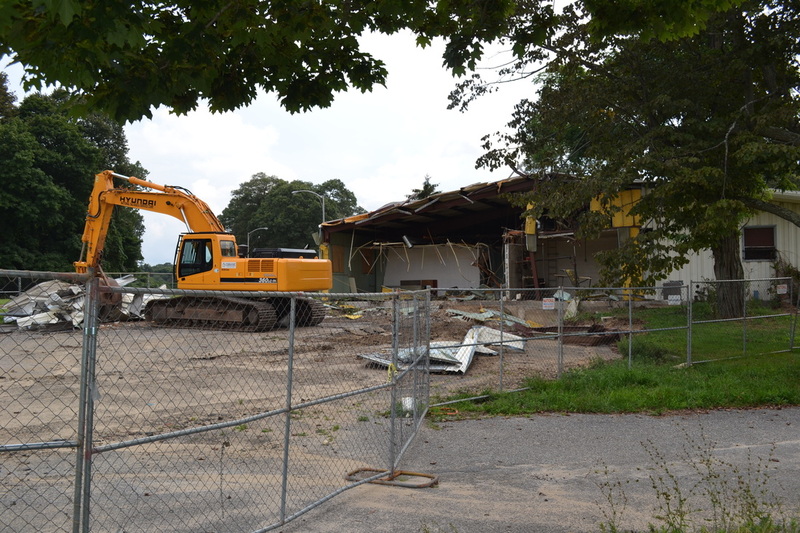 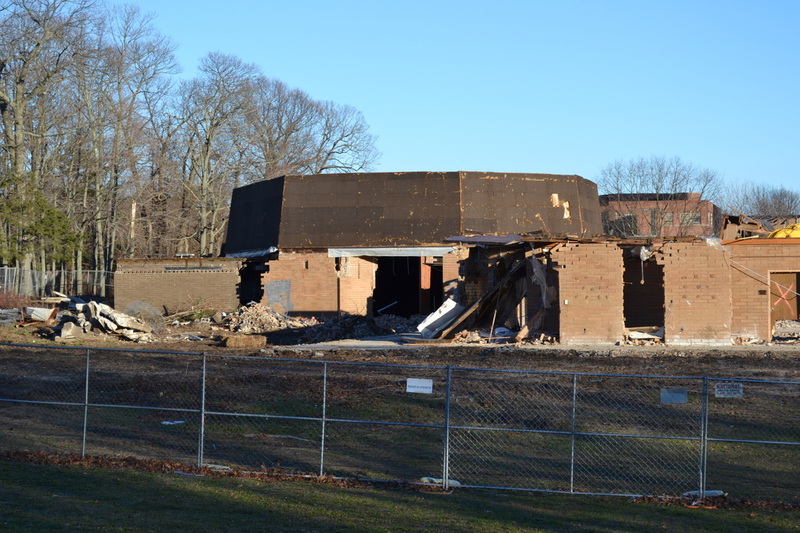 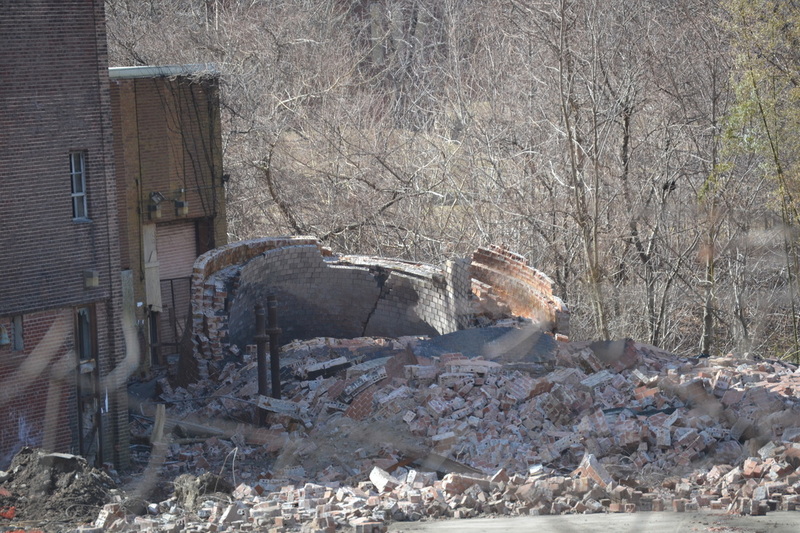 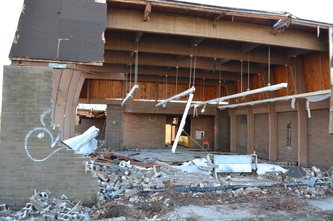 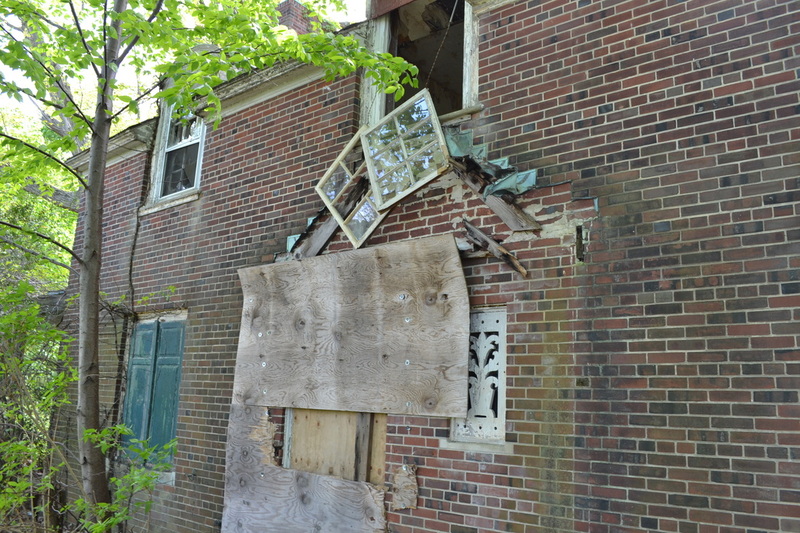 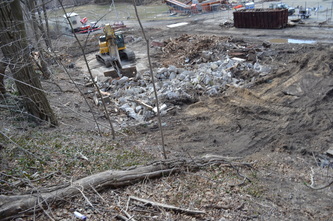 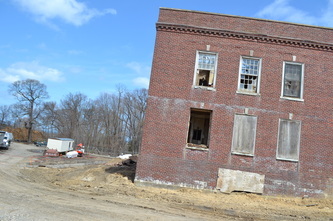 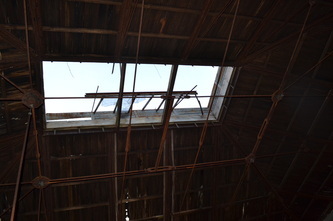 It was also one of the first buildings to be demolished in the summer of 2012. 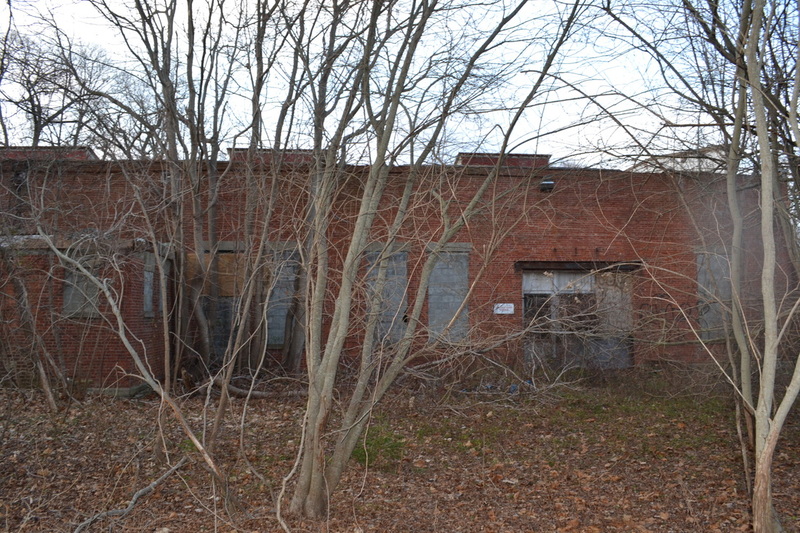 This building built in 1911 was the electrical & plumbing repair shop. It was pretty much closed down by the 1970s & remained abandoned until it was demolished in early 2013. 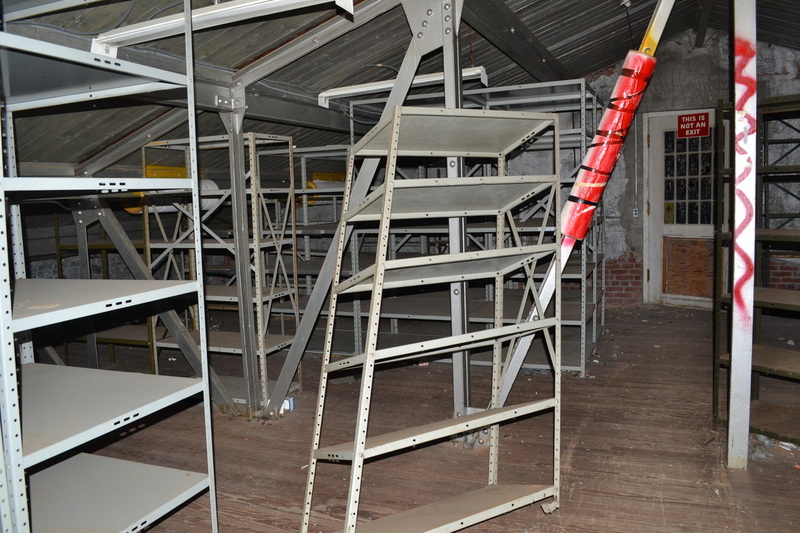 This storage warehouse, which was built in the 1890s, had many uses in its day. 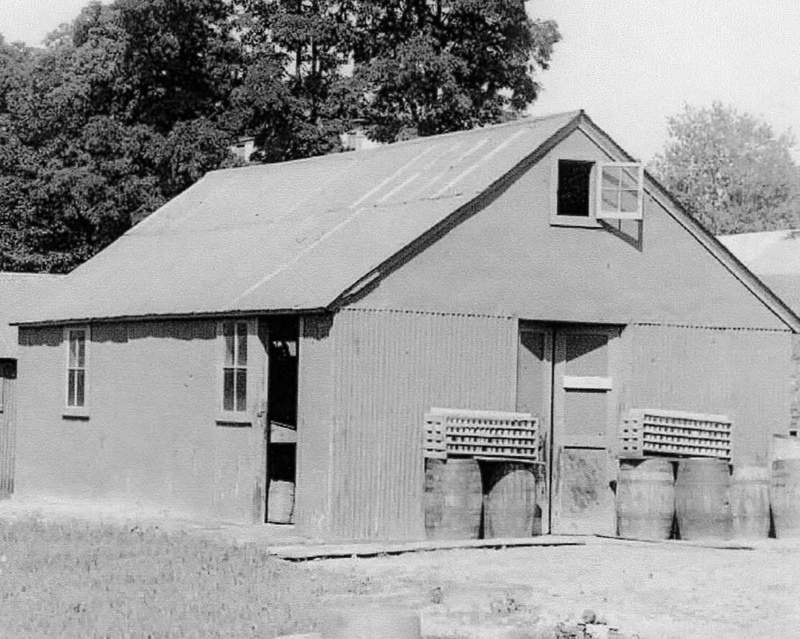 It started out as an ice house, but then was converted into the pickle house. 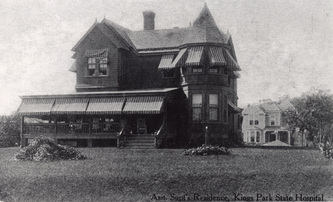 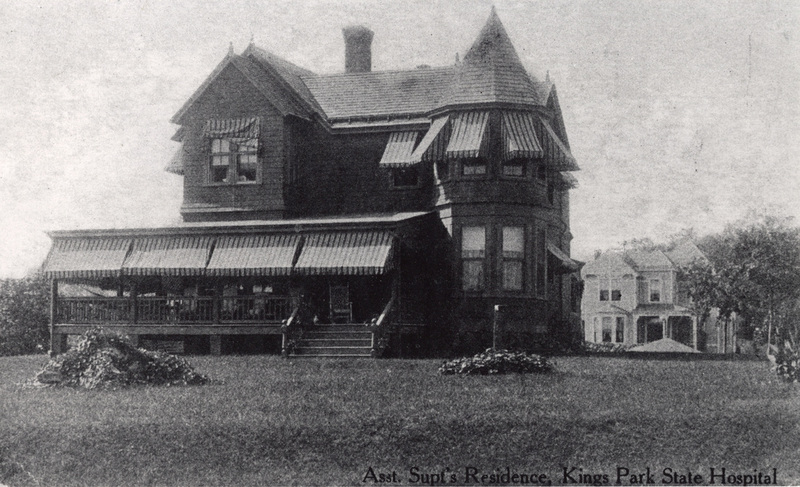 Afterwards, it was used as the sauerkraut house, until it was demolished in the 1960s. 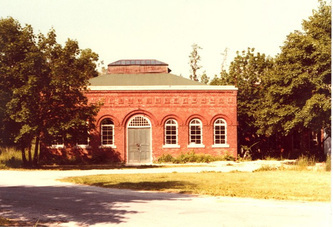 Built between 1890-1892 this structure served as the original power plant for the hospital, until it was replaced by Building 6. 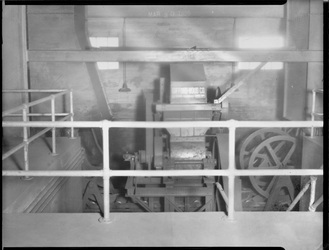 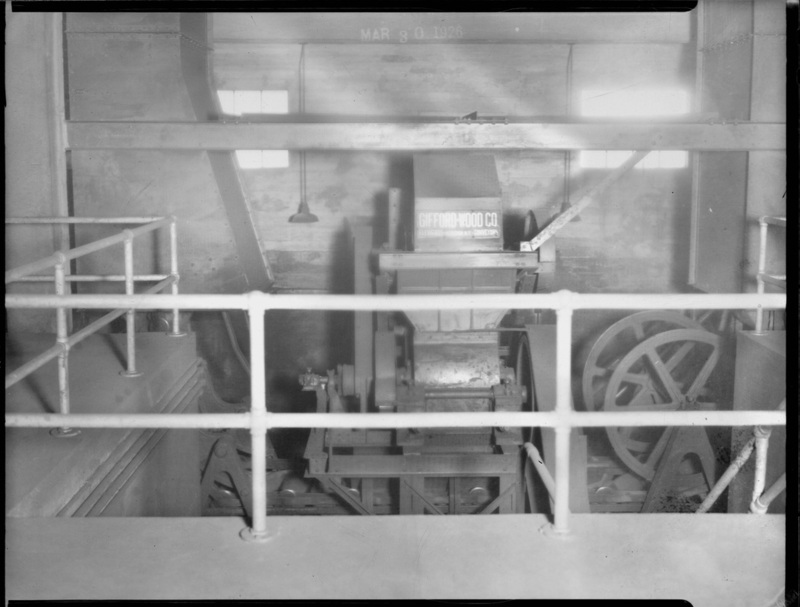 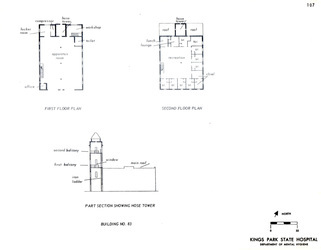 In 1947 a concrete building was added to replace its original wooden engine house. In 1958 it was converted into a mattress & tin shop. 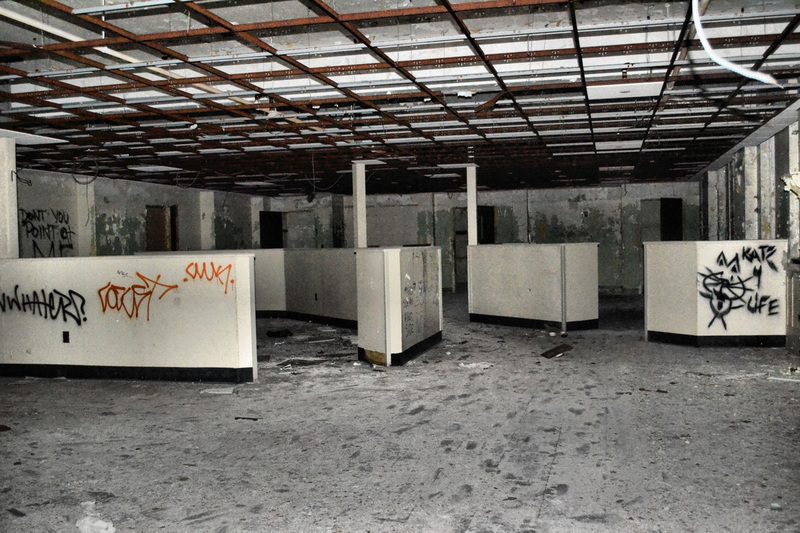 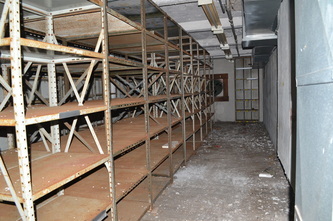 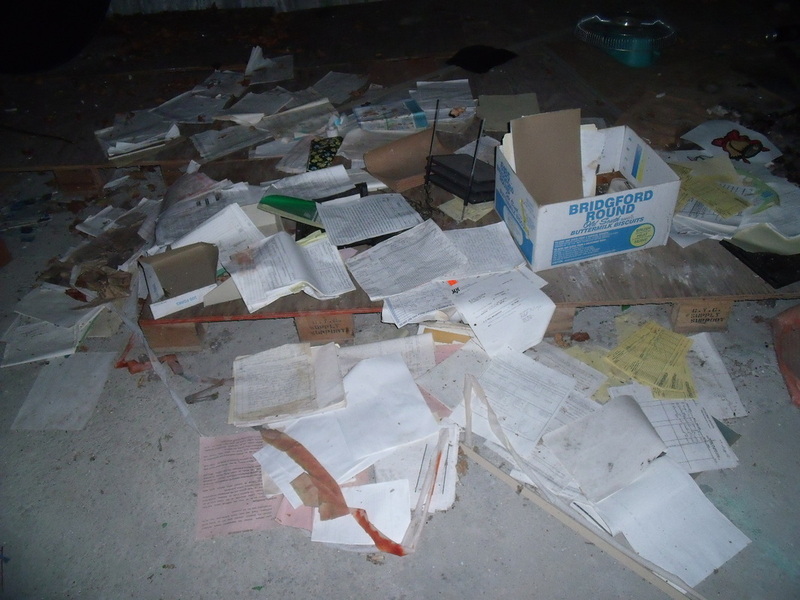 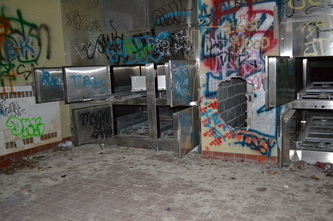 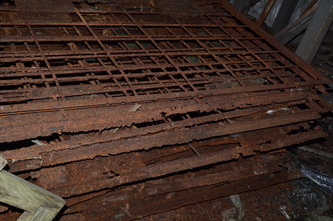 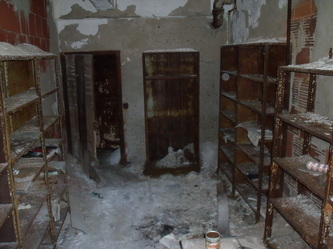 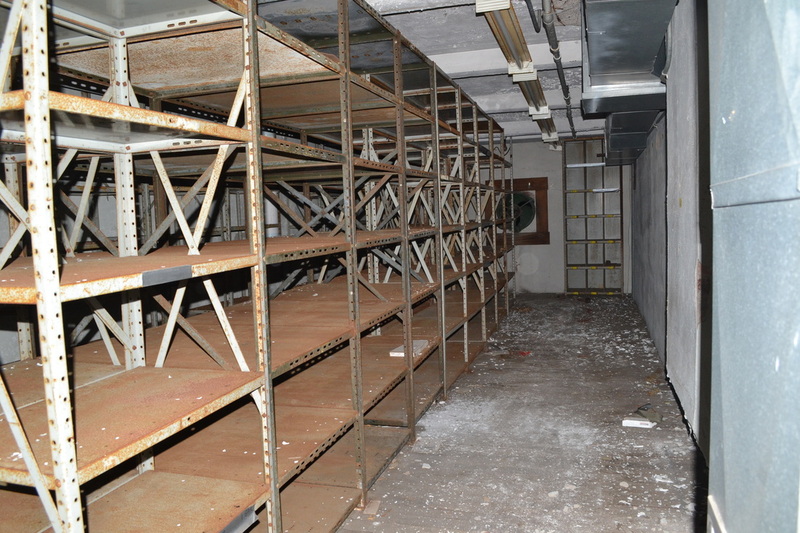 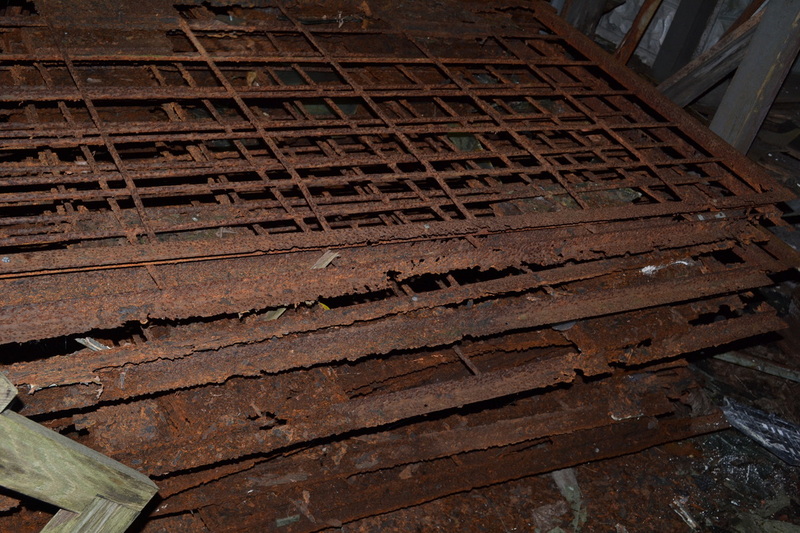 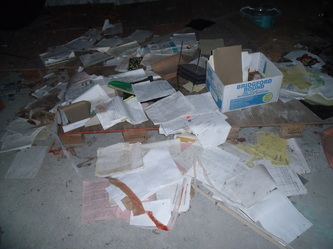 It was later used to store medical records before being abandoned. 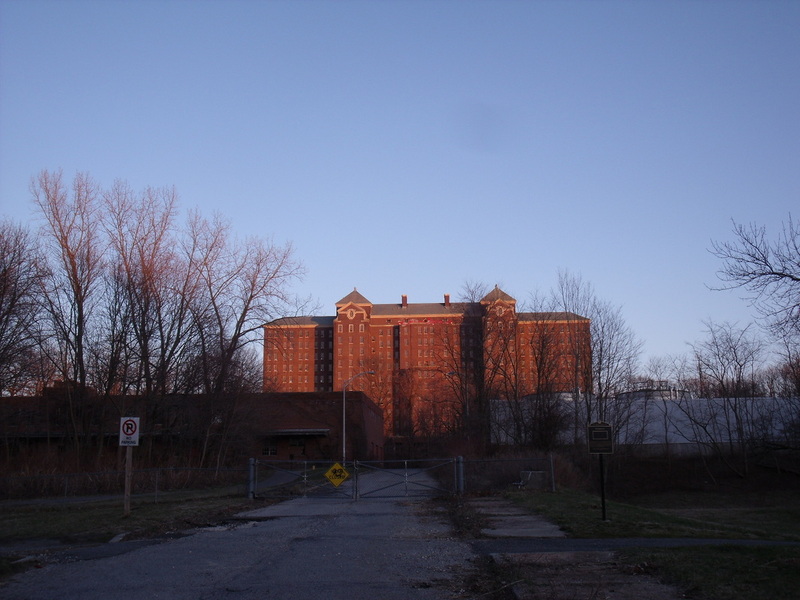 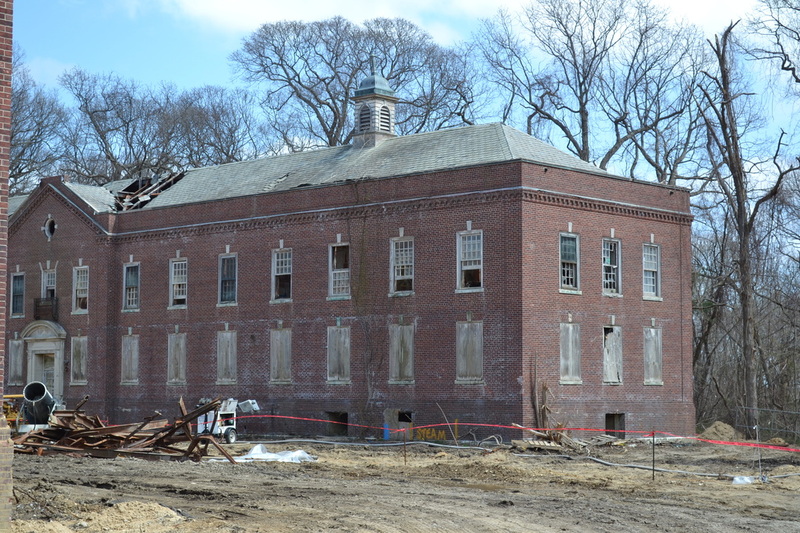 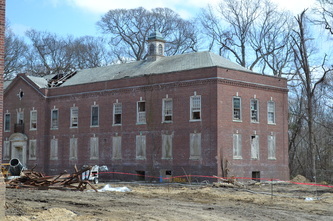 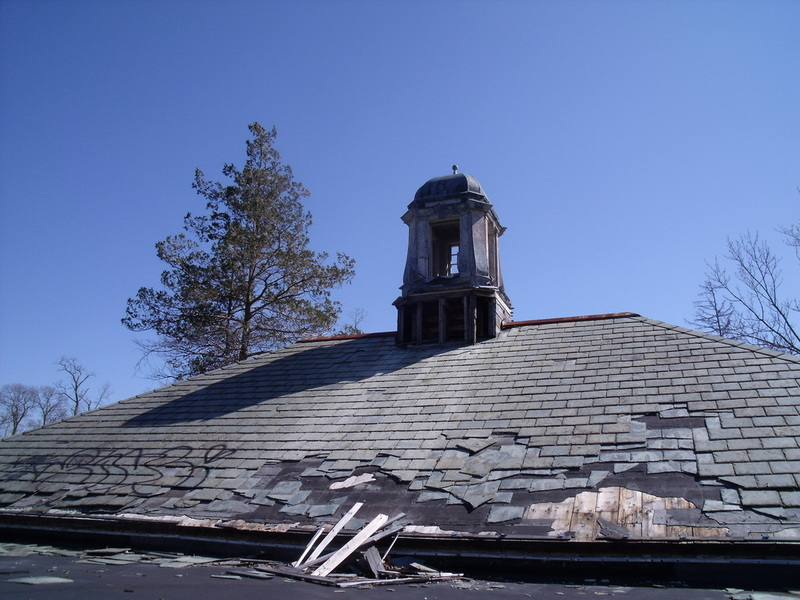 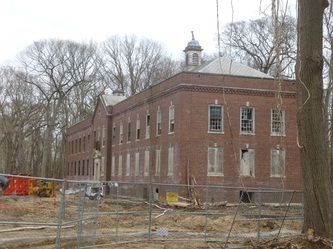 It was finally demolished in 2013 along with Building 60 making them the last of the structures from the 1800s to go. 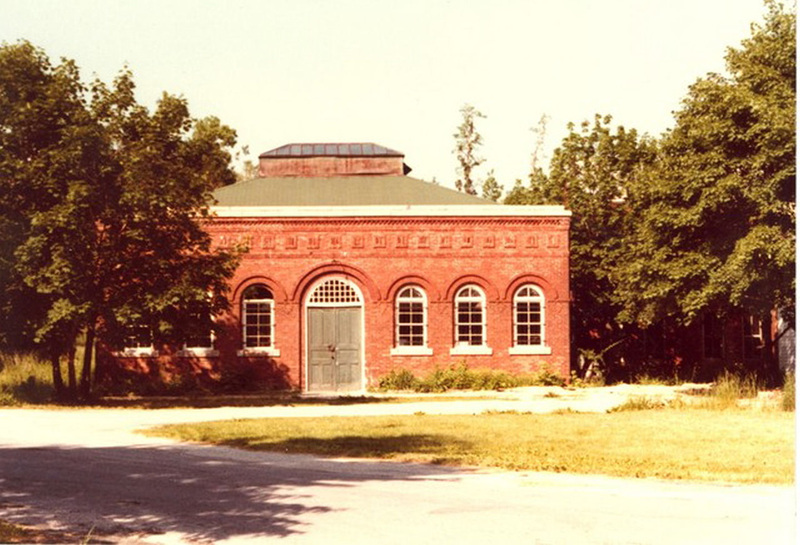 This building was built between 1890-1892 & was originally used as a water pumping station. 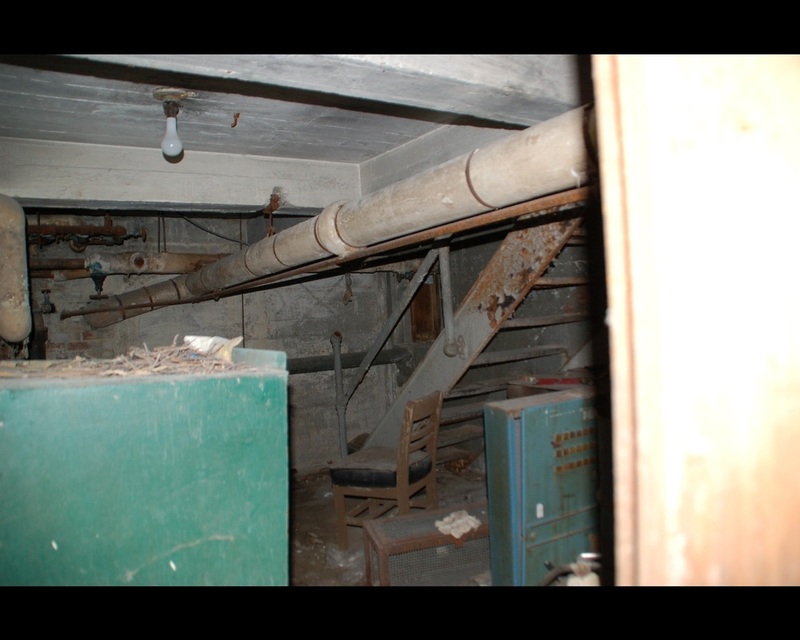 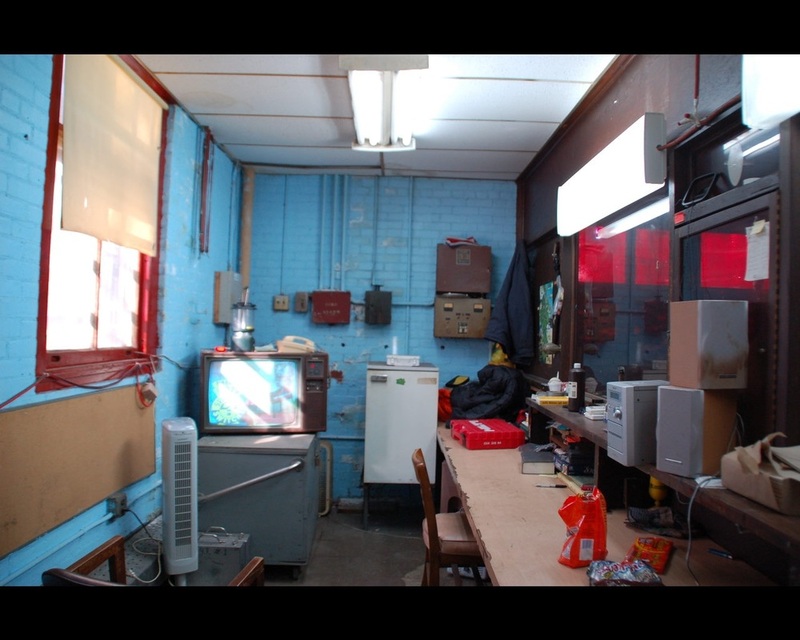 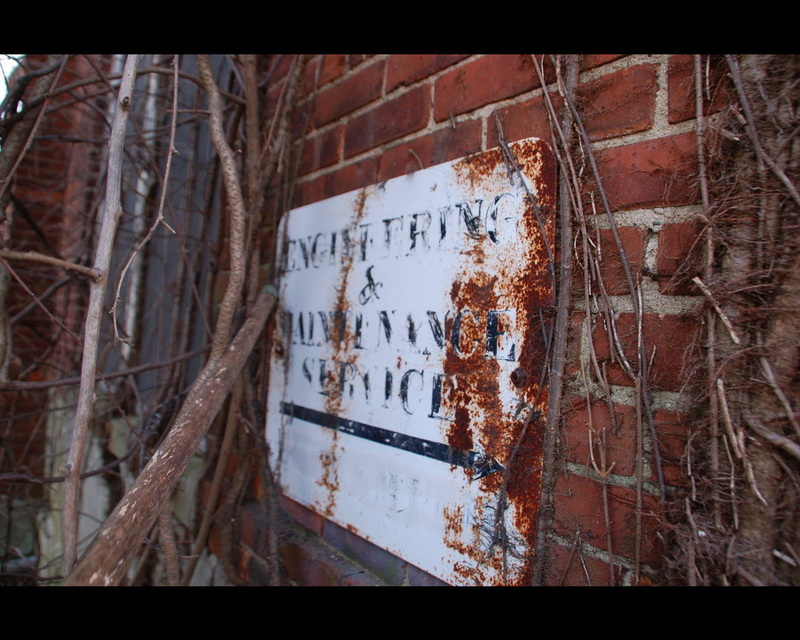 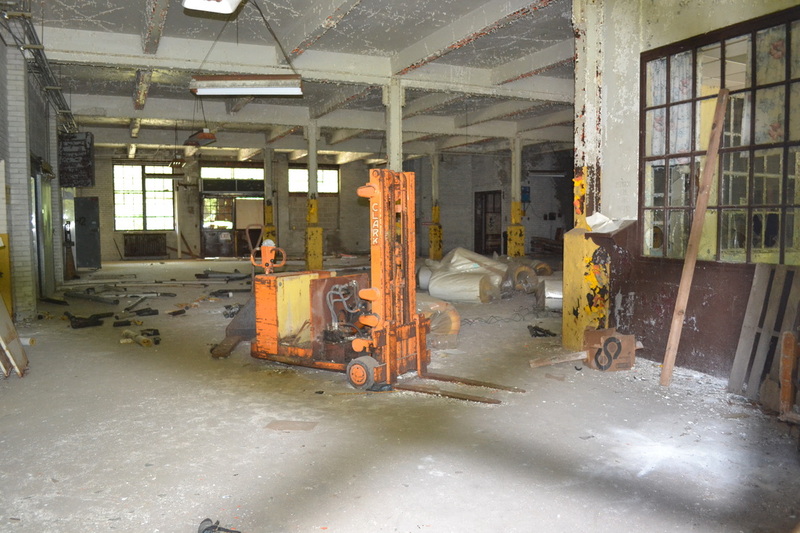 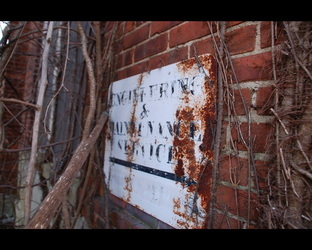 In 1940 it was converted into a cement/metal shop & used for occupational therapy. 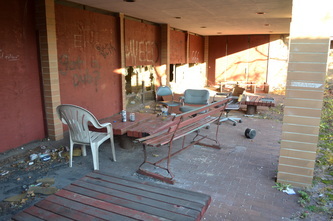 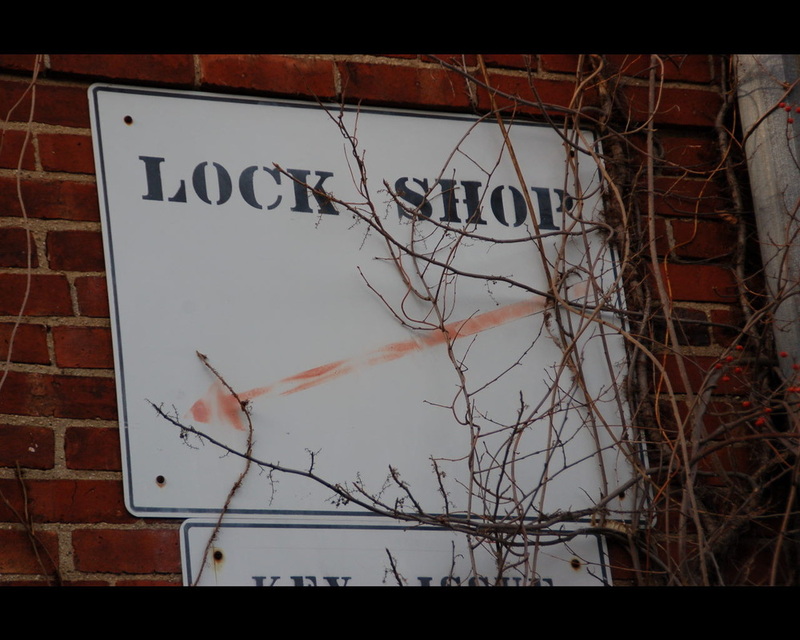 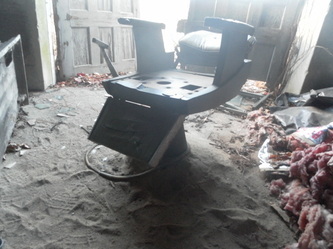 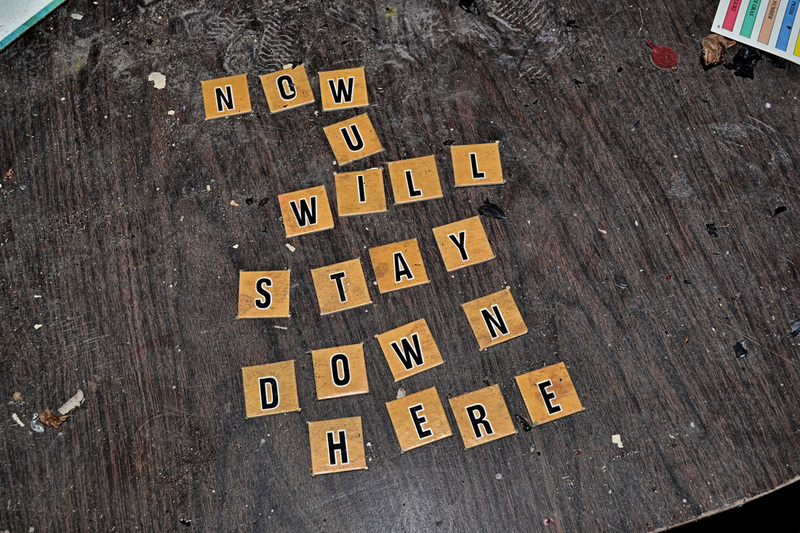 It was also used as a shoe repair shop & a furniture shop before it was abandoned. 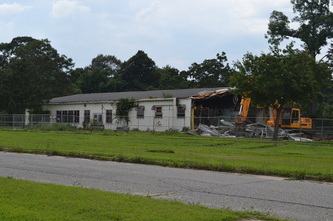 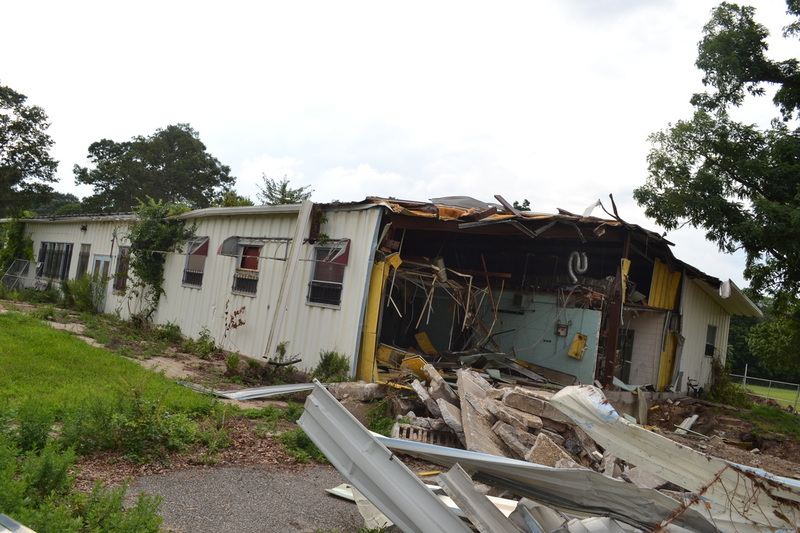 It was demolished with its neighbor, Building 59, in March of 2013. 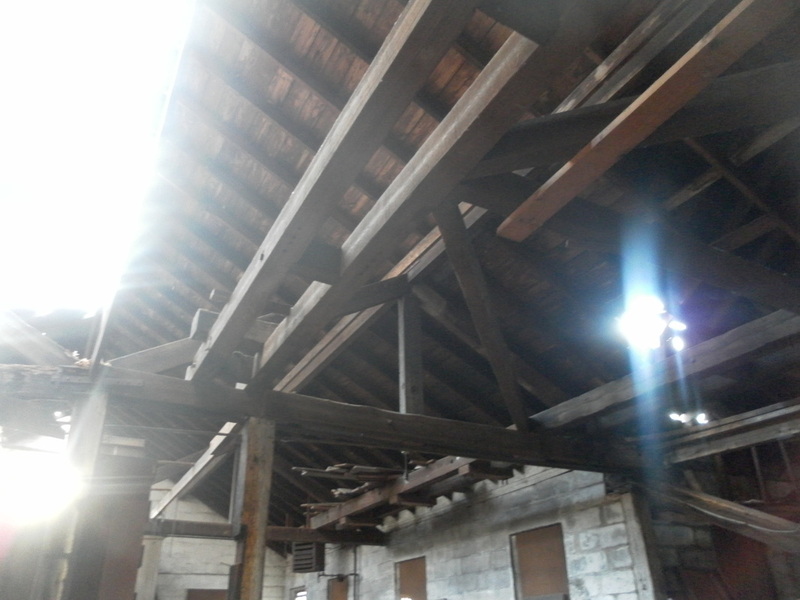 This structure was built between 1890-1892 to serve as a barn for wagons, & then for trucks. 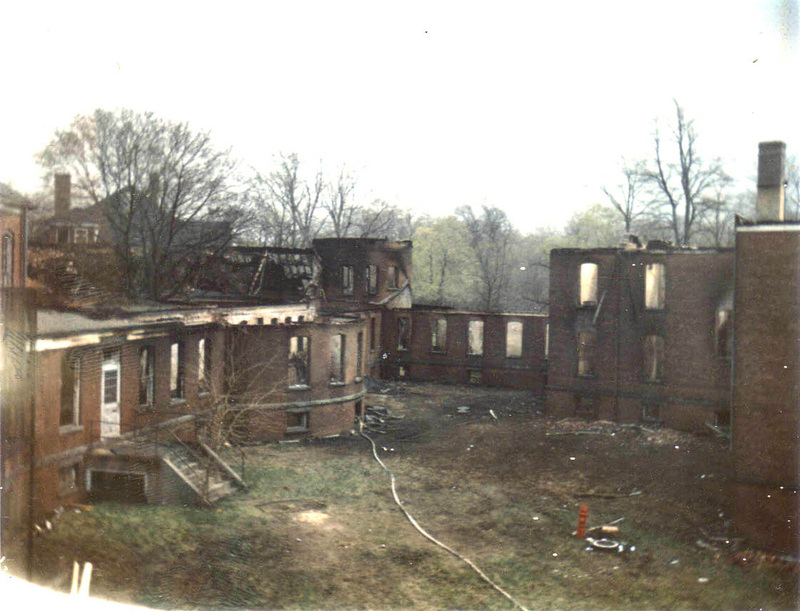 It was badly damaged in the 1970s by a fire & only the foundation remained, until it was removed in 2013 with Buildings 59 & 60. 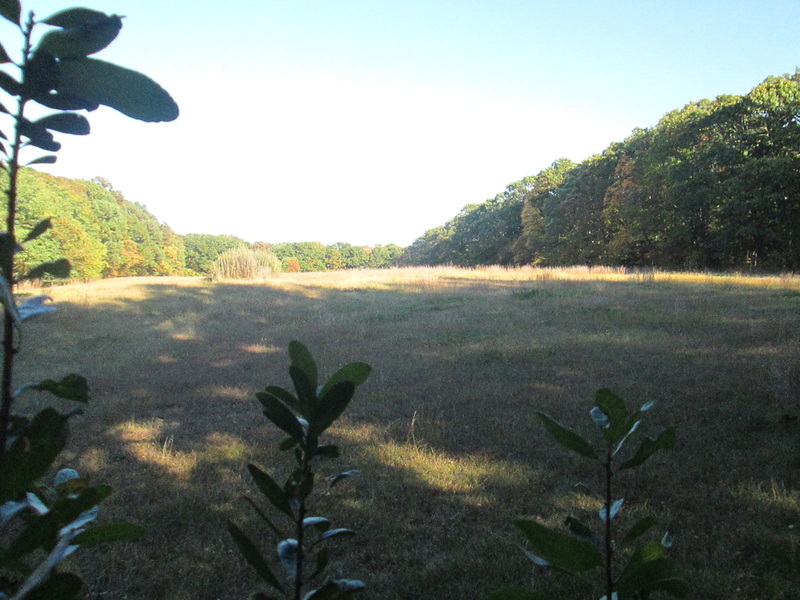 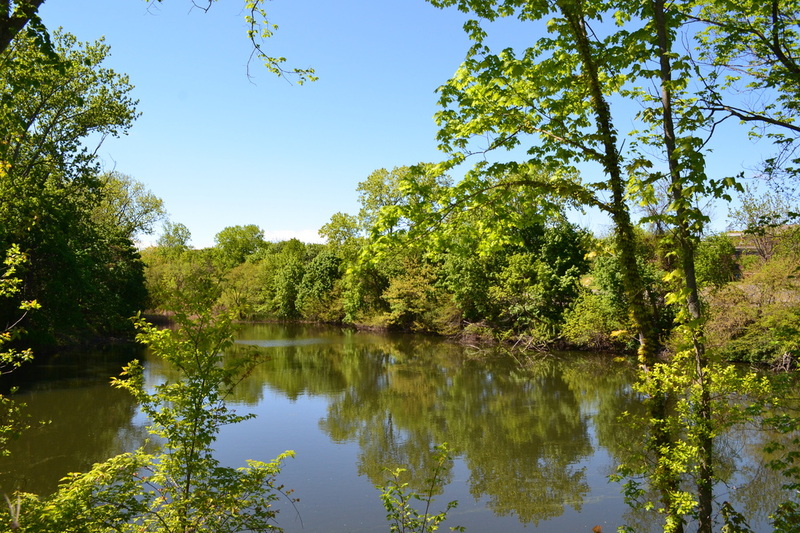 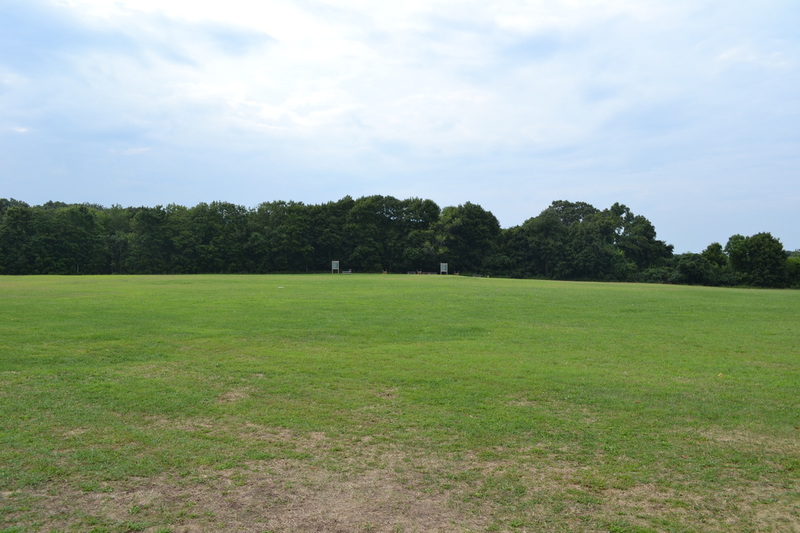 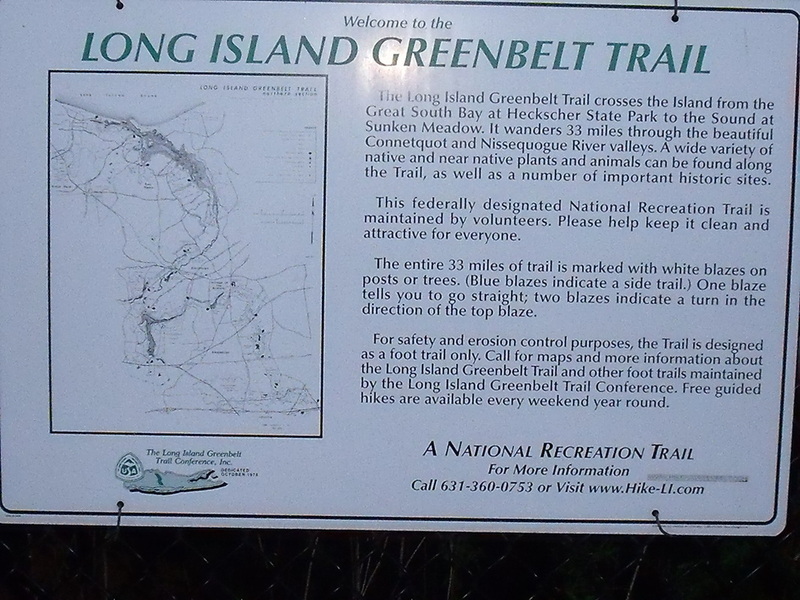 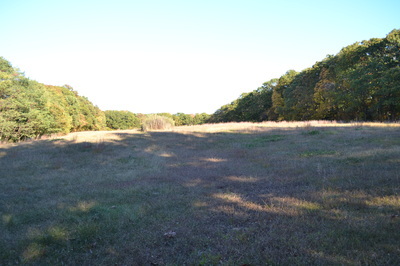 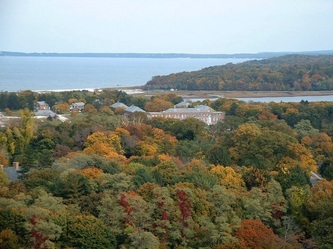 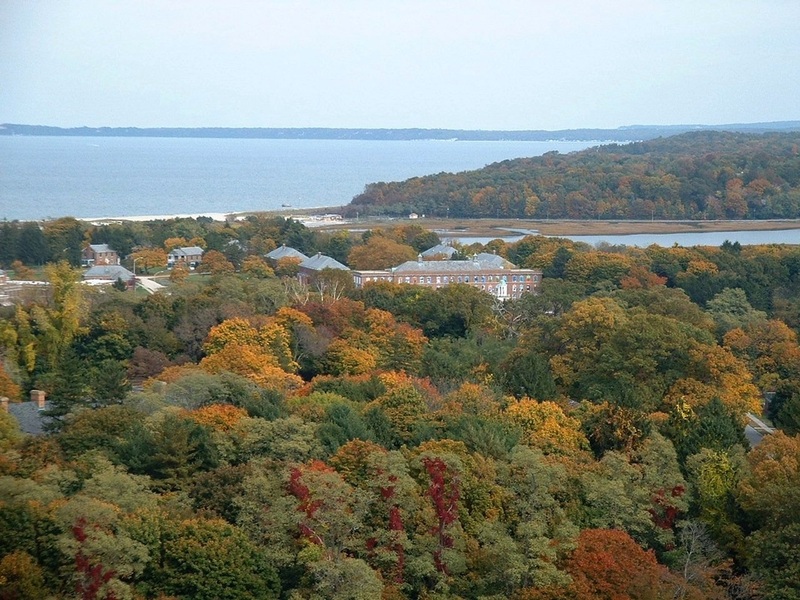 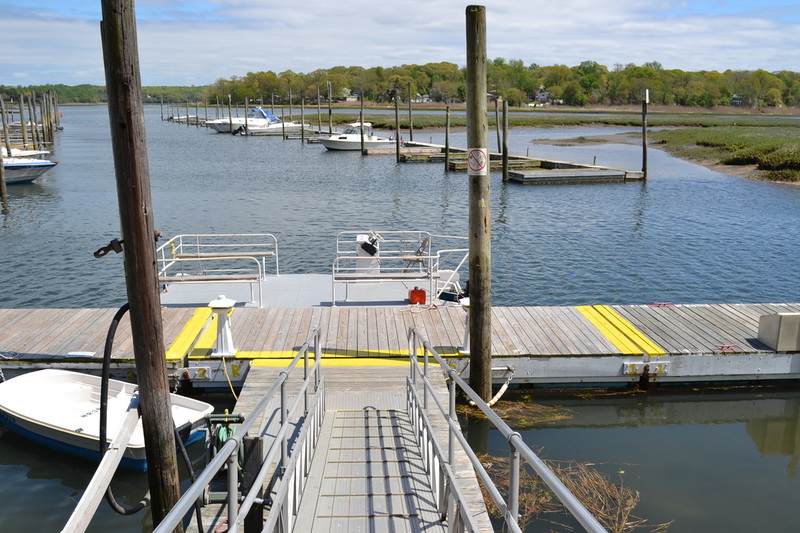 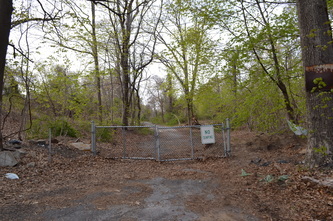 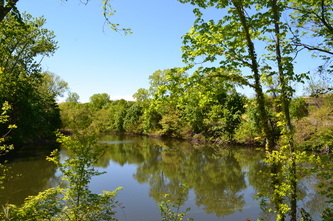 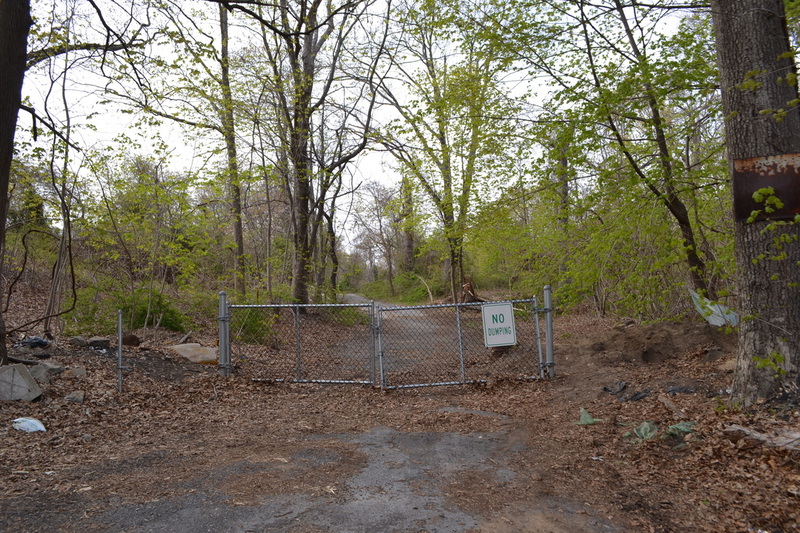 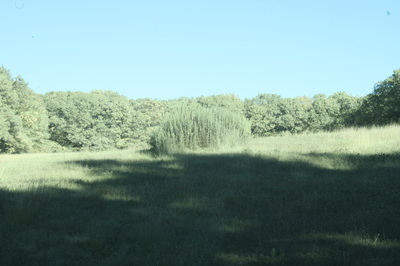 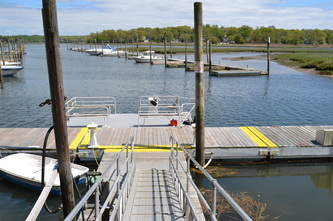 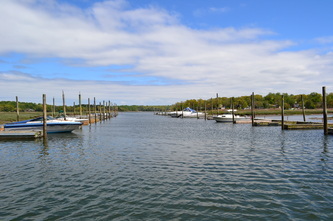 There are several hiking trails located on the old hospital grounds that are a part of the Nissequogue River State Park, such as the Long Island Greenbelt Trail. Built during the 1890s this was a stable used for horses & wagons. 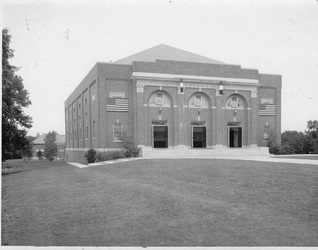 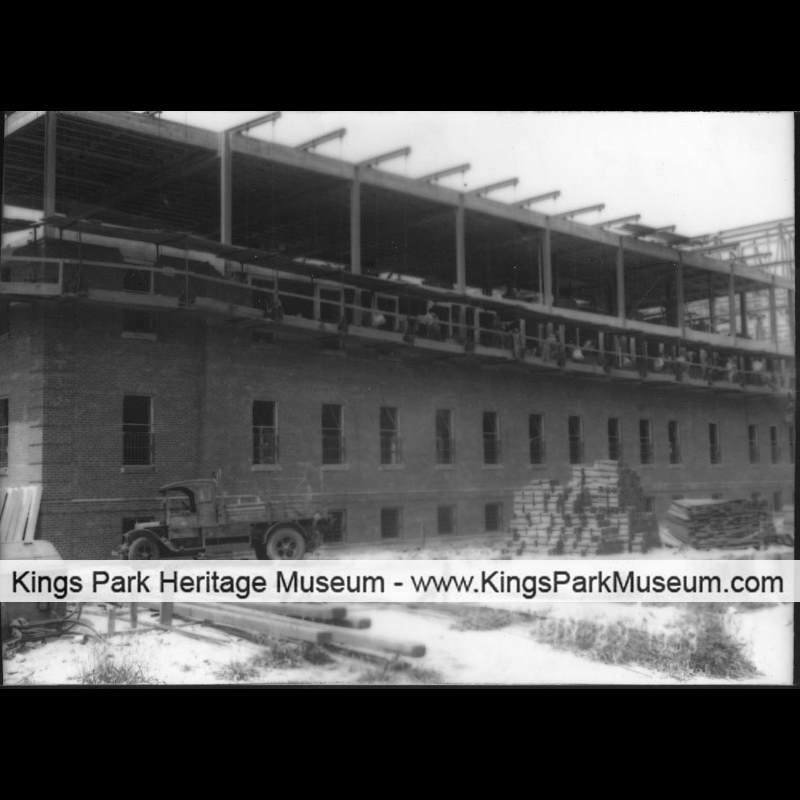 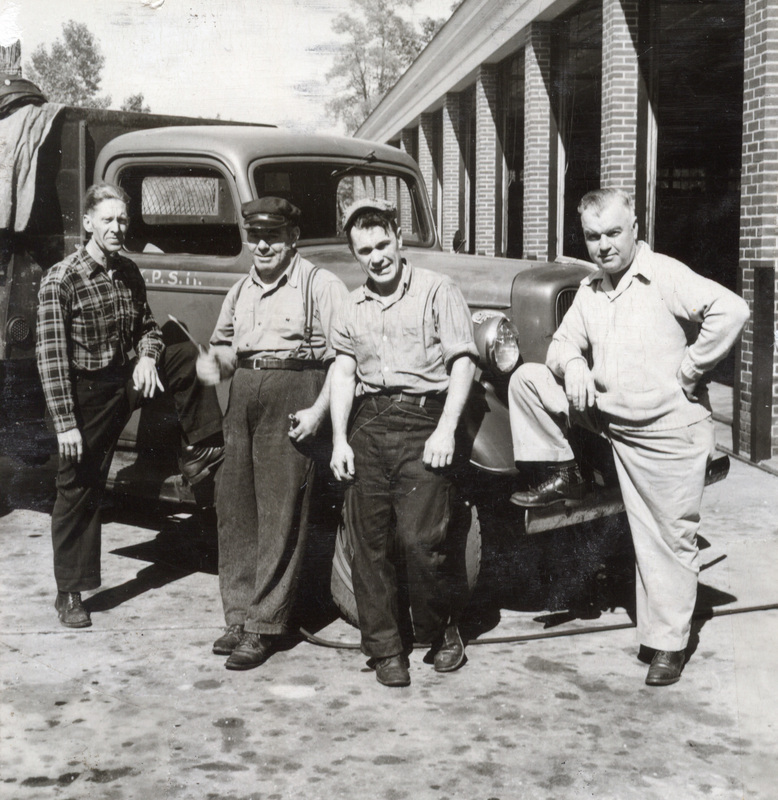 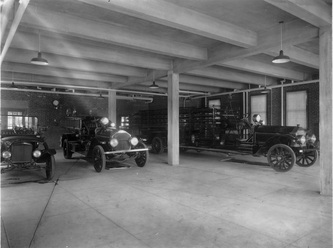 It was demolished in the 1930s & replaced by the current truck garage. This is a truck garage that was built in 1939. 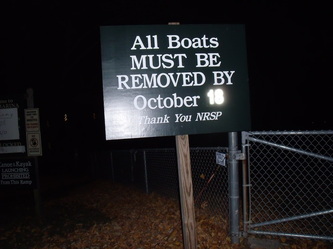 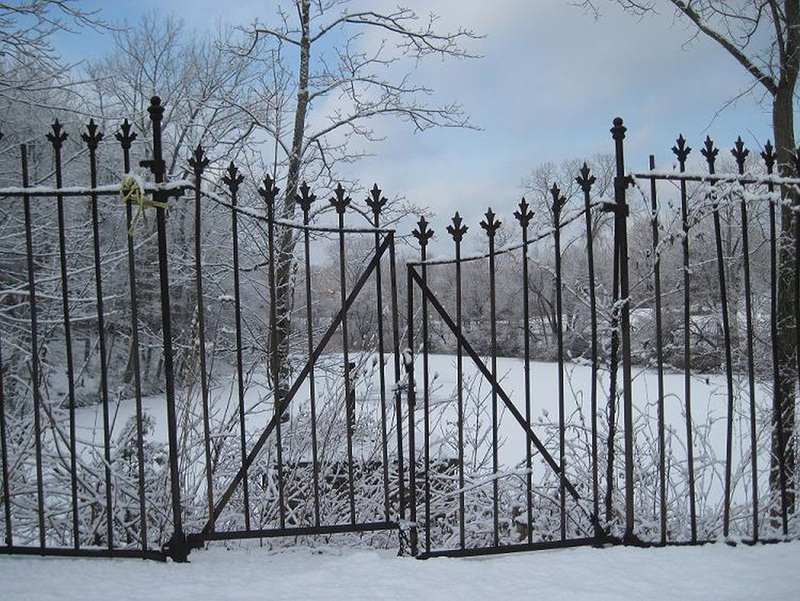 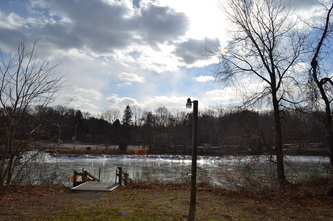 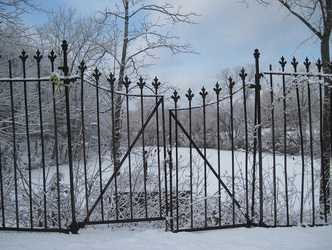 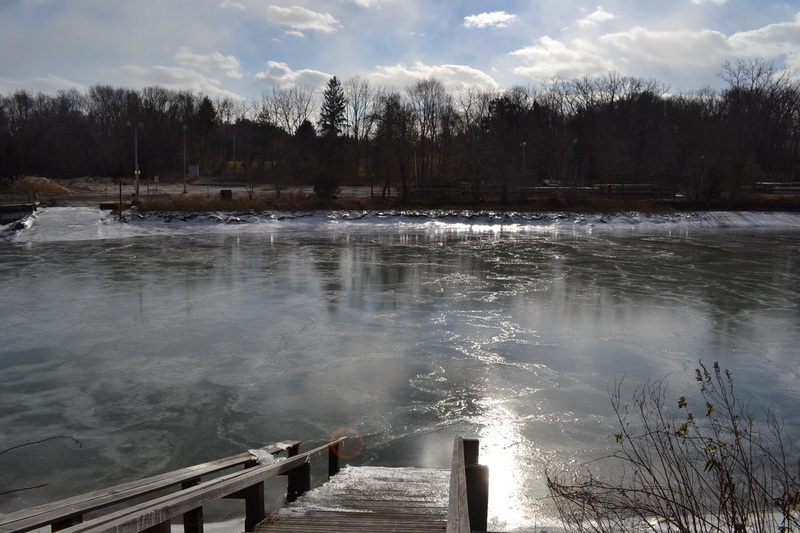 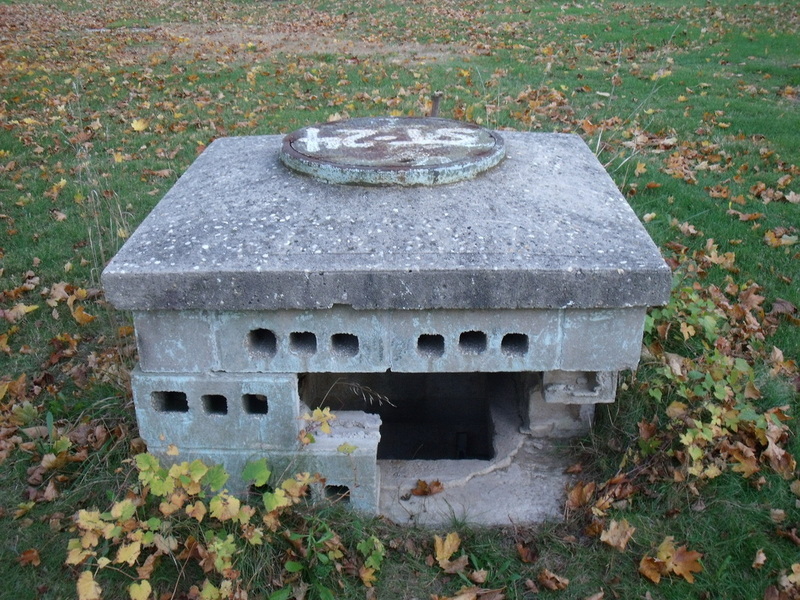 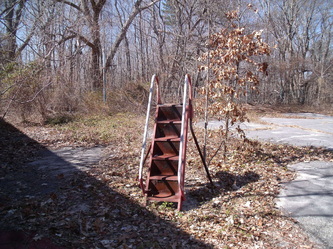 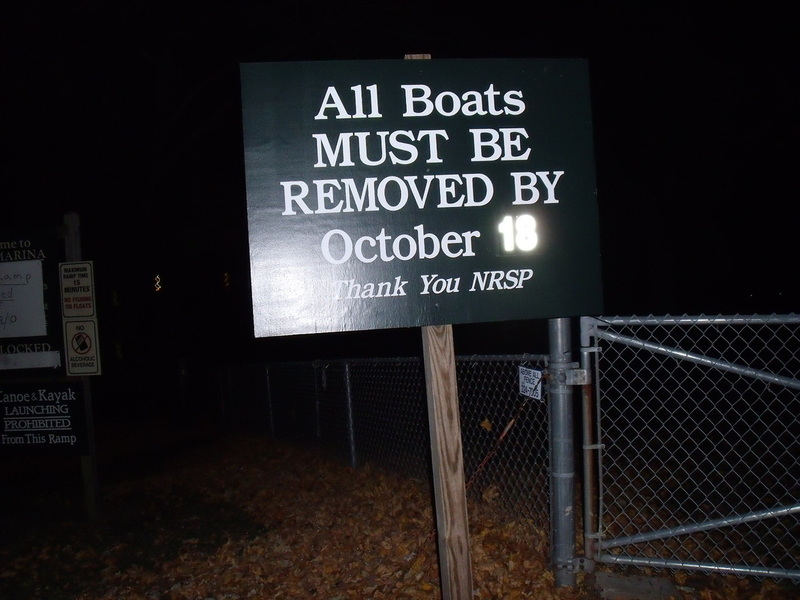 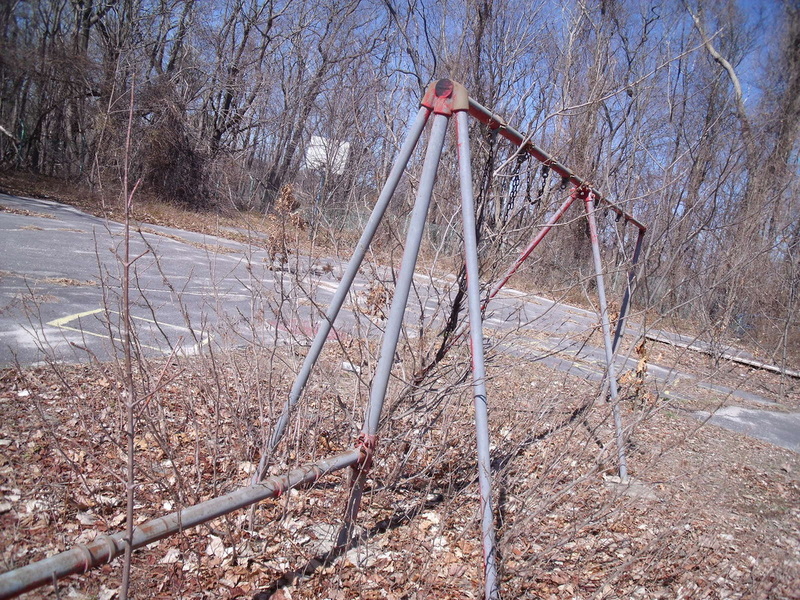 It is still used today by the Nissequogue River State Park. 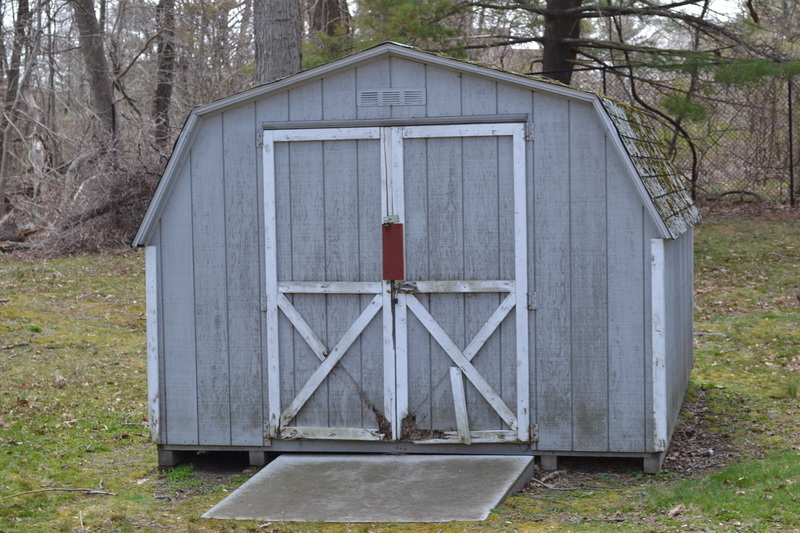 This was a small storage shed built in the early 1900s, which was located between Buildings 62 & 64. 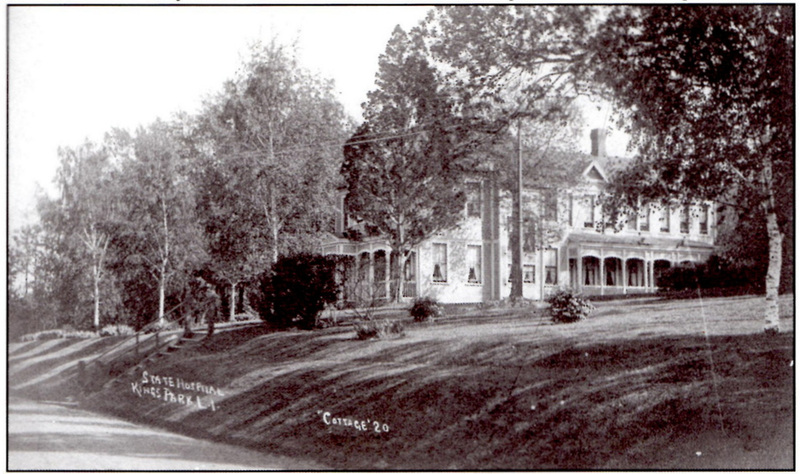 It was demolished prior to 1957. 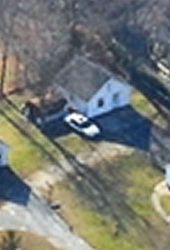 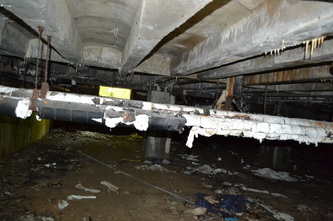 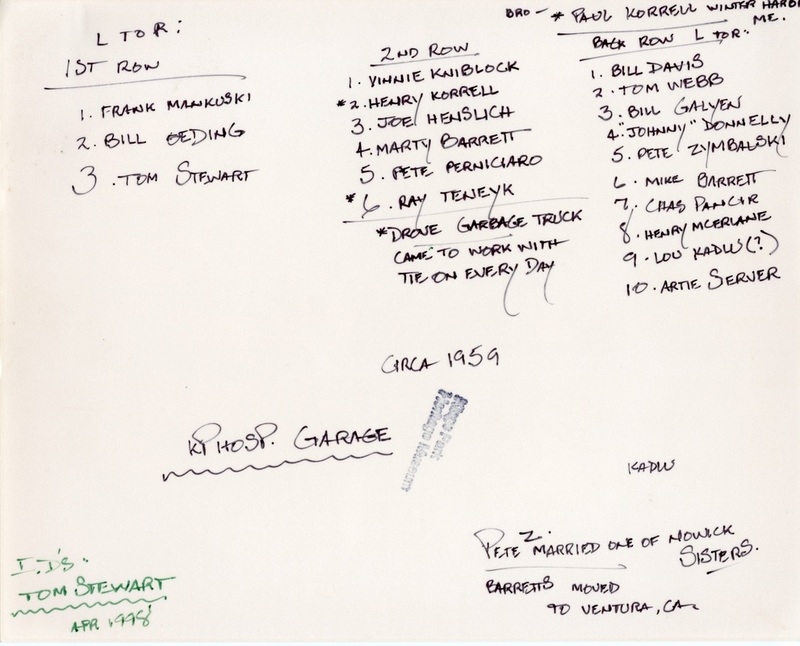 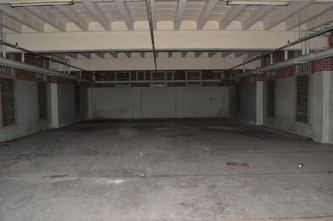 This was another garage, which was used by supervisors of the truck garage. It was built from 1912-1915 & demolished sometime after the 1950s. 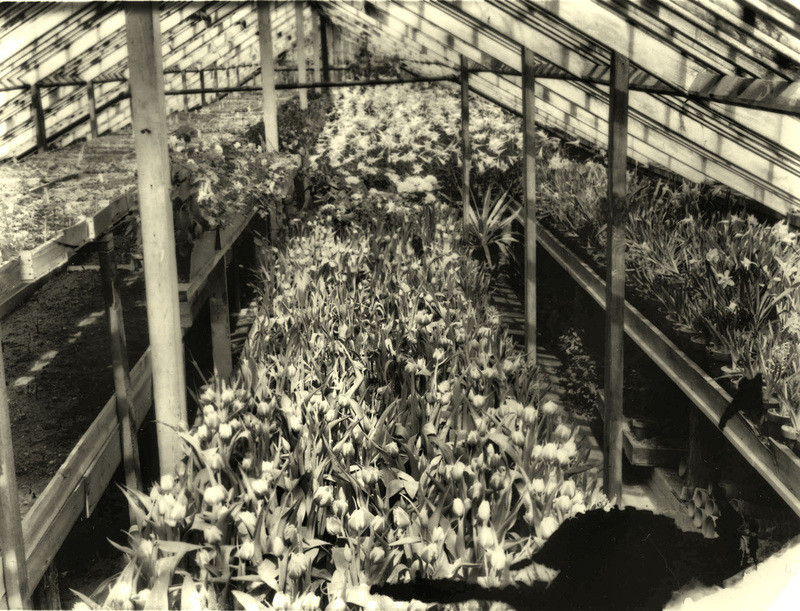 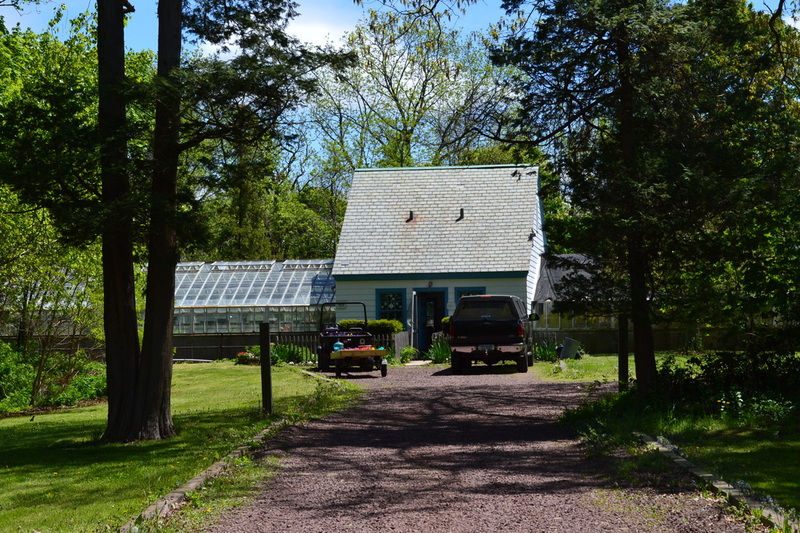 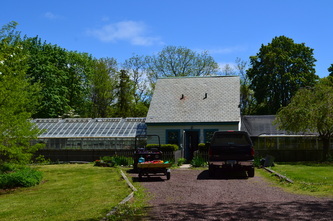 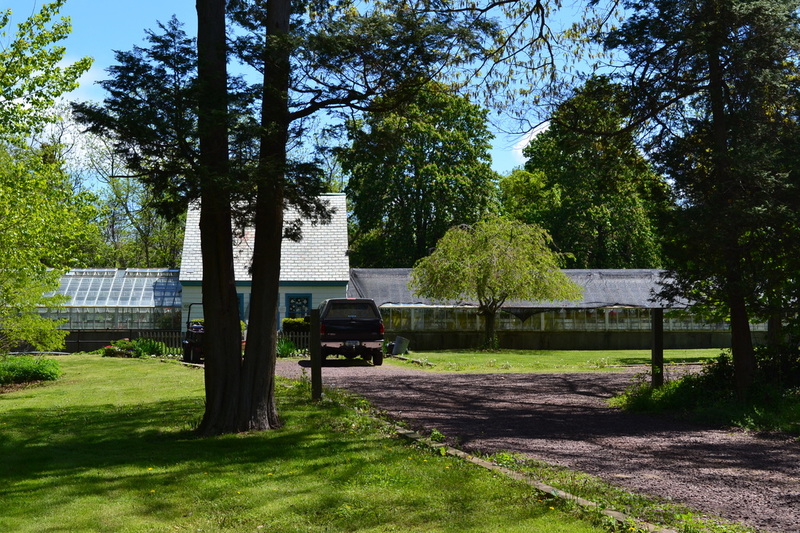 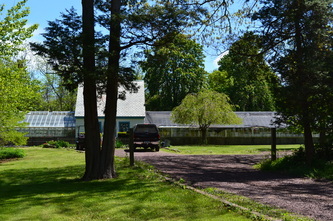 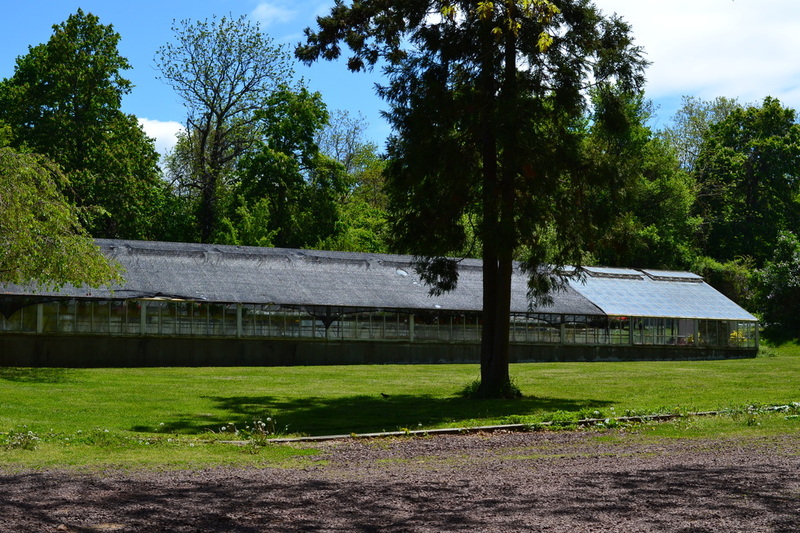 This was the second propagation house, which was built in 1939. 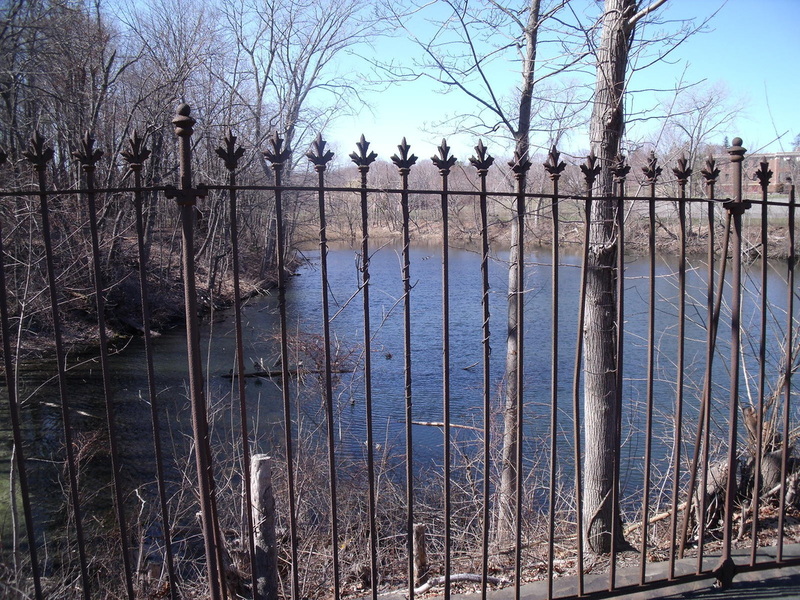 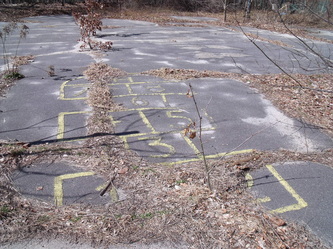 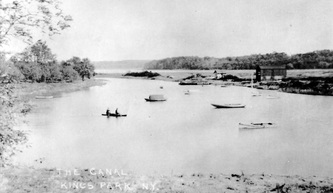 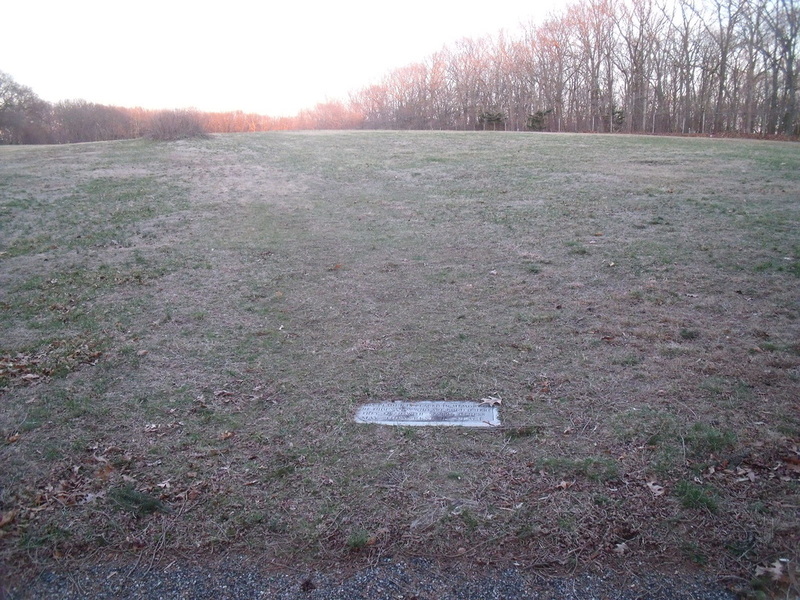 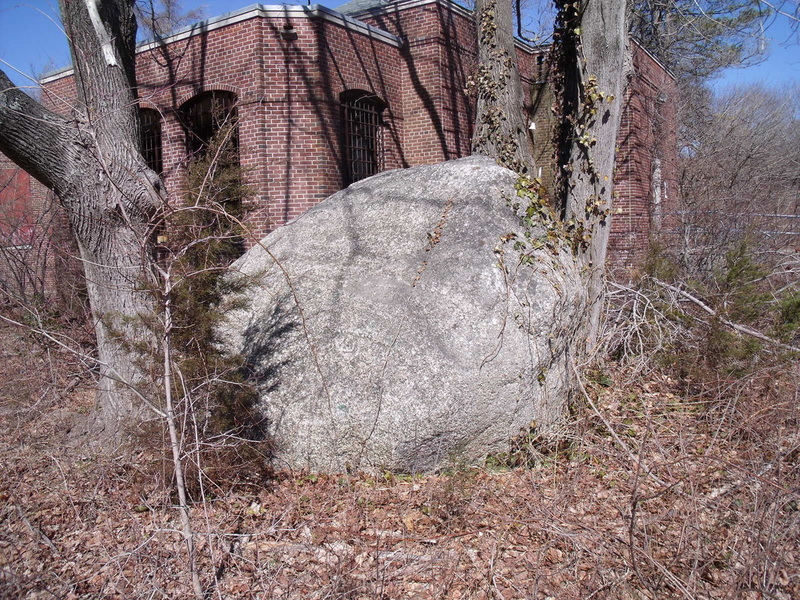 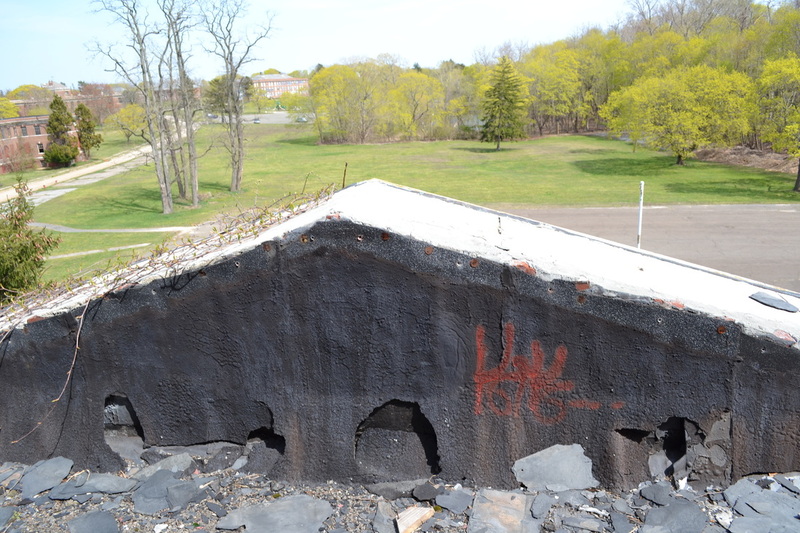 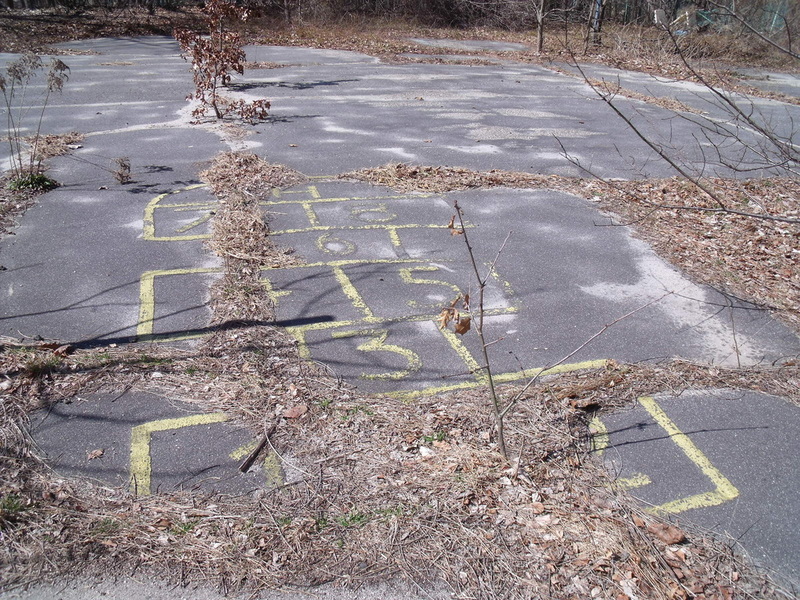 It still exists today as a part of the Nissequogue River State Park. 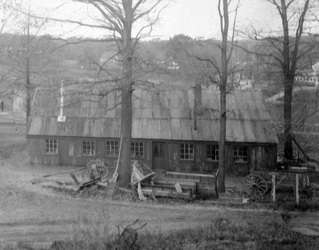 The original blacksmith shop was built in 1924 & located near the male cottages & power plant area. 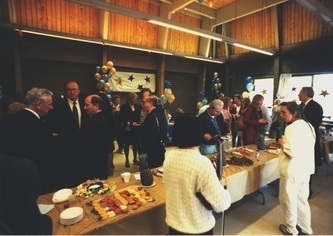 It was replaced by a new building & designated as Building 86. 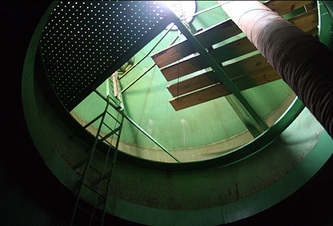 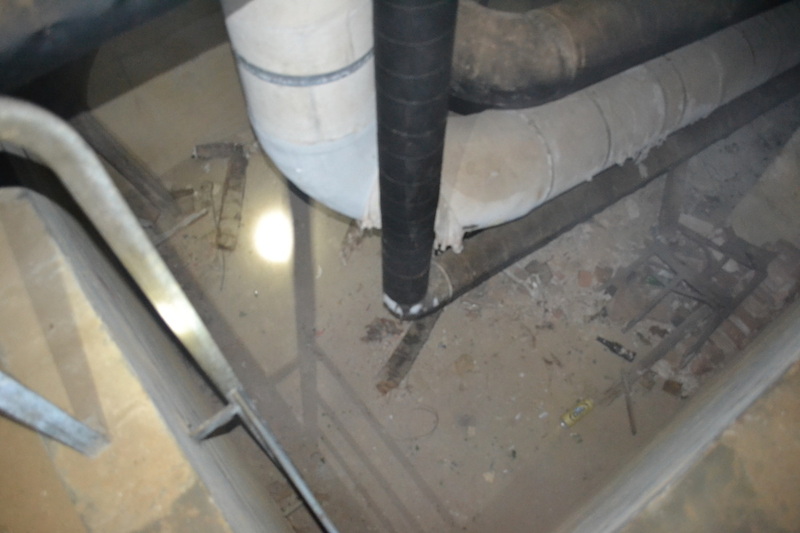 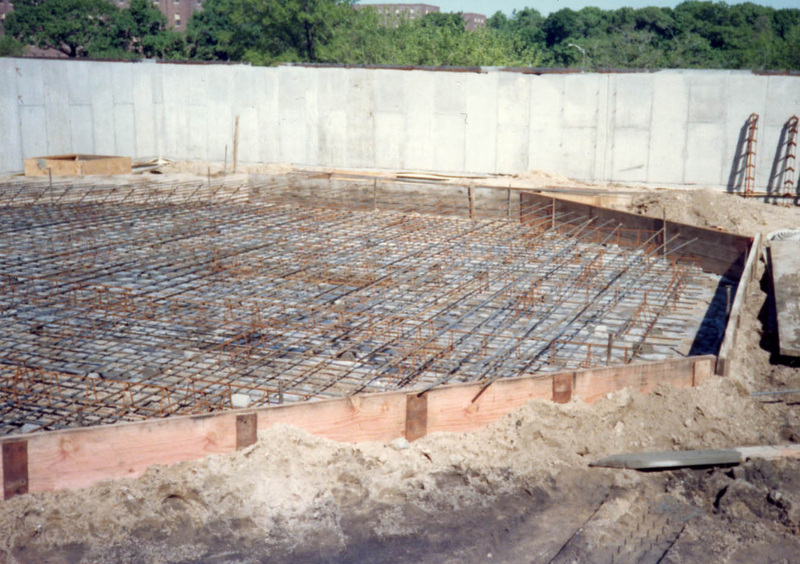 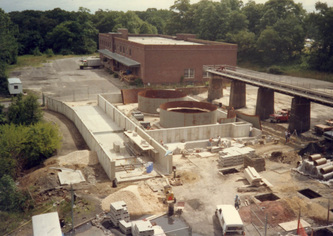 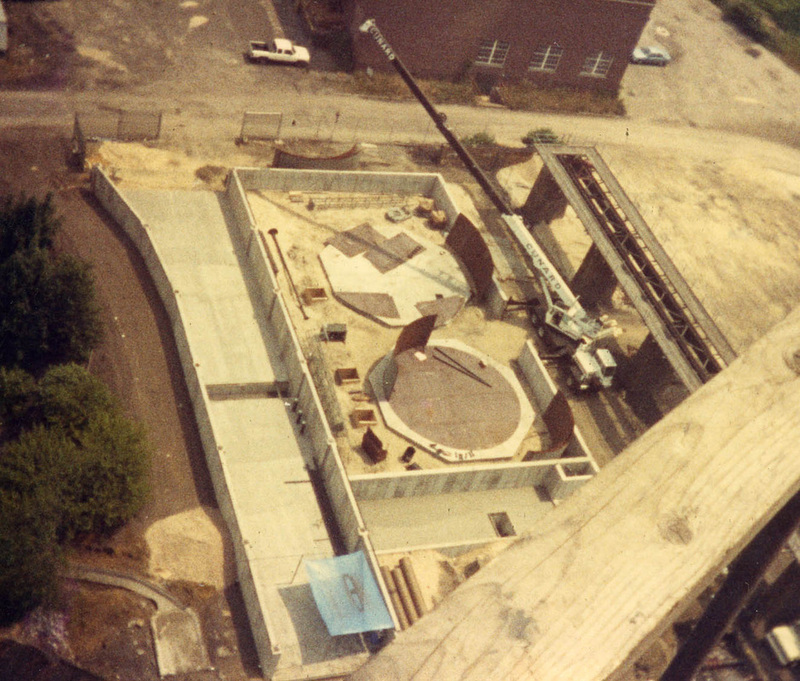 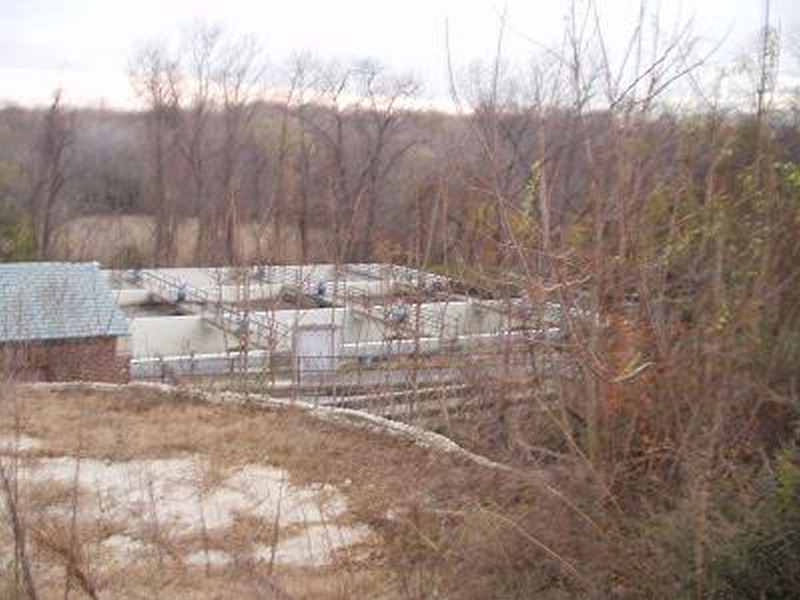 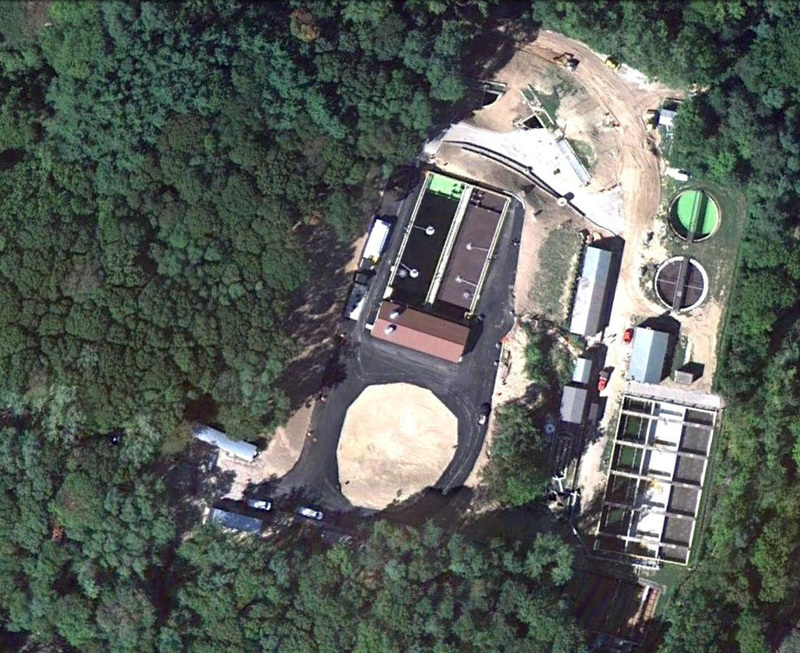 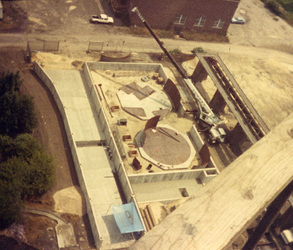 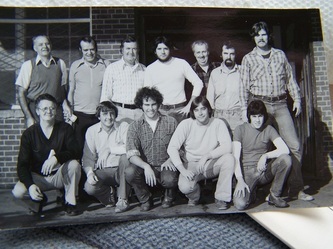 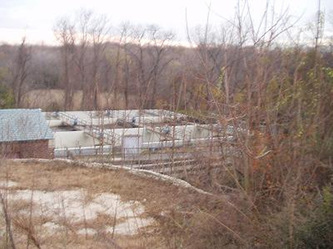 Building 66 then became the sewage treatment plant. 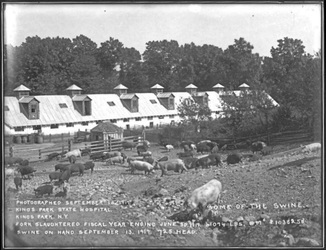 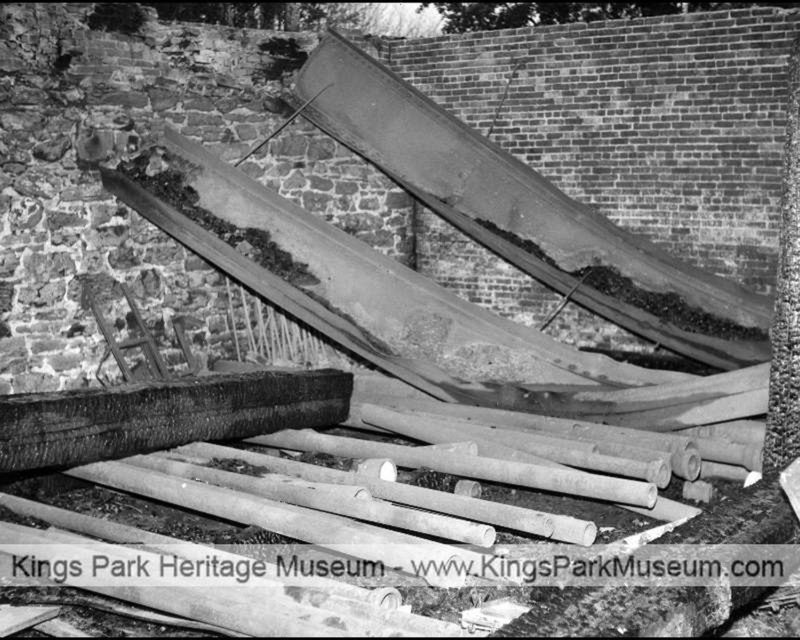 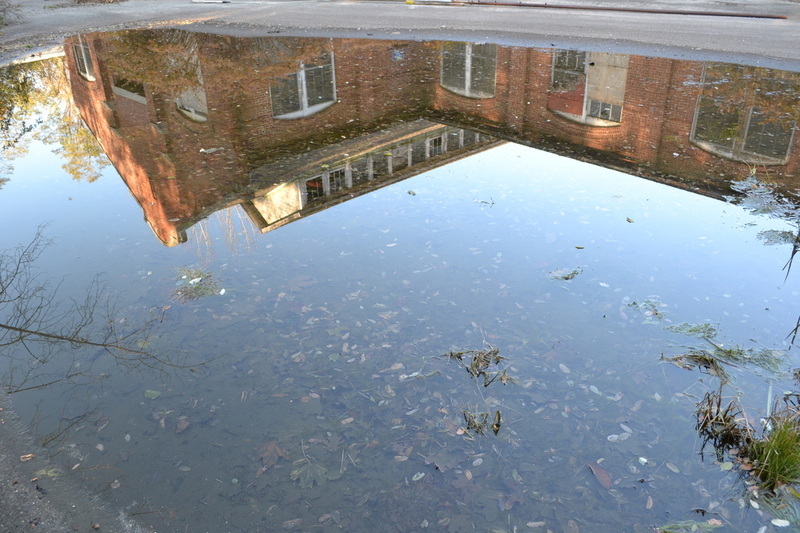 In the early years of the hospital, this was only a series of sewage hot beds located near the canal. It was later relocated to its current location. The main structure was built in 1935 with additions in 1939. 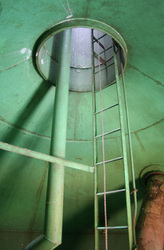 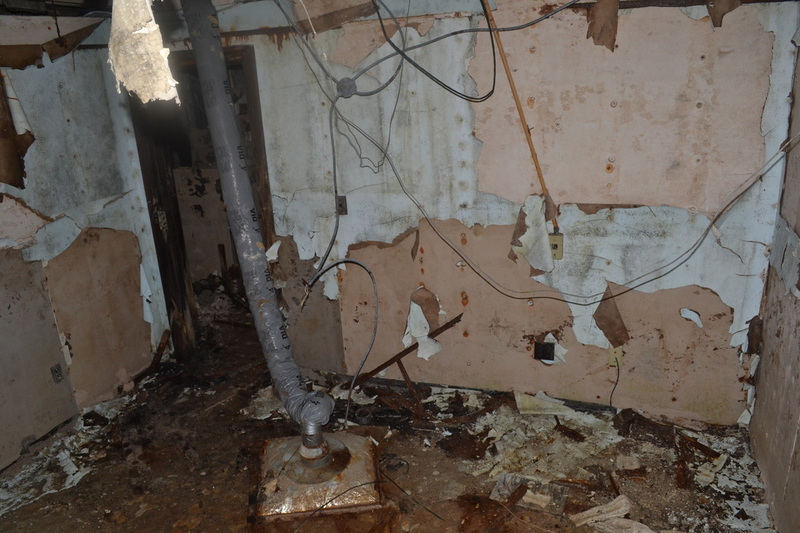 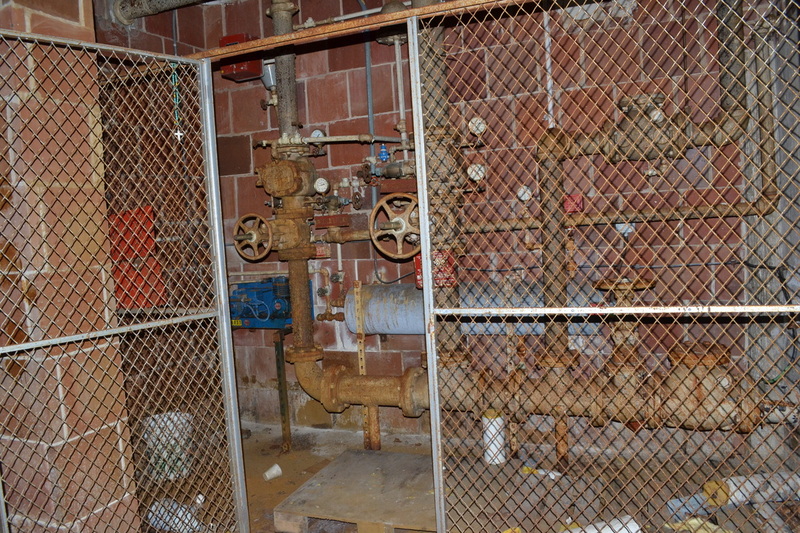 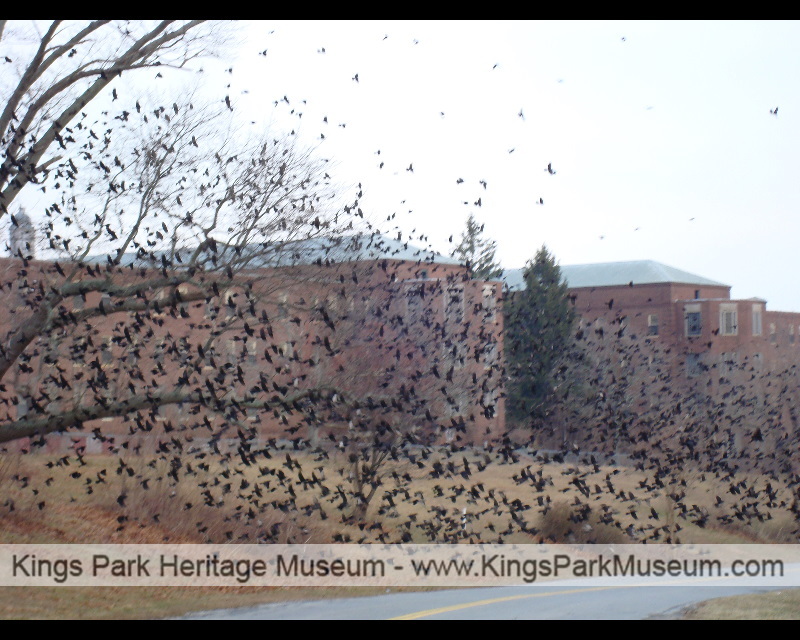 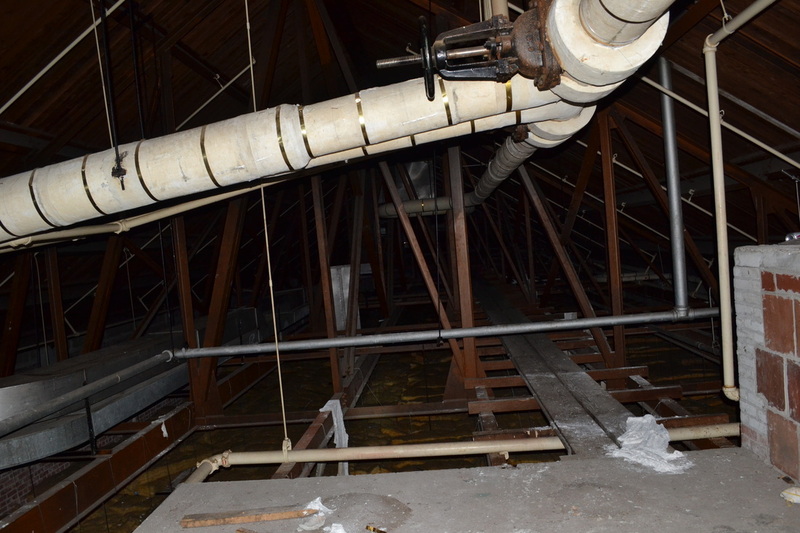 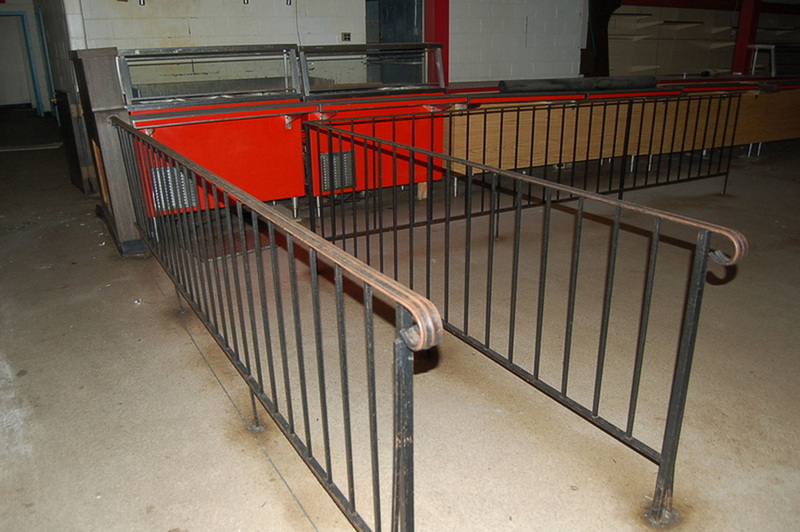 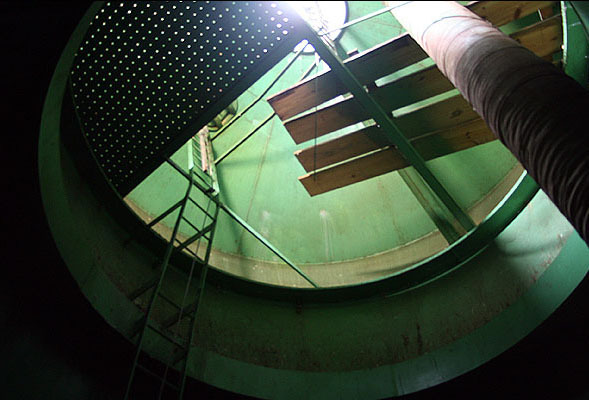 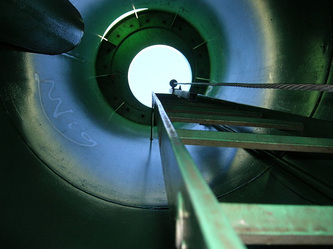 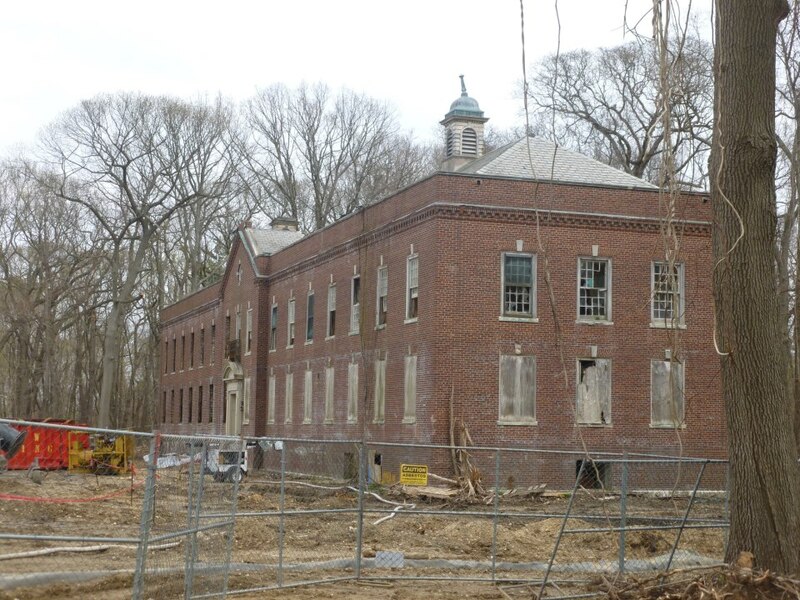 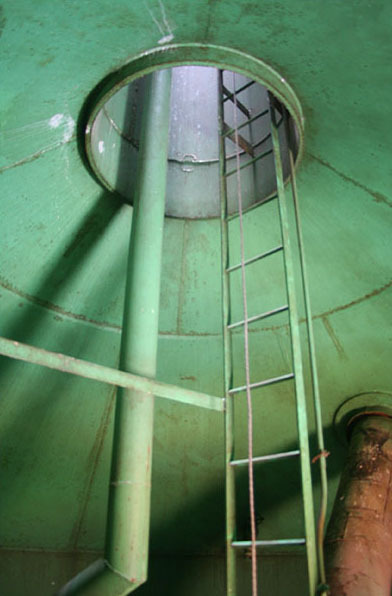 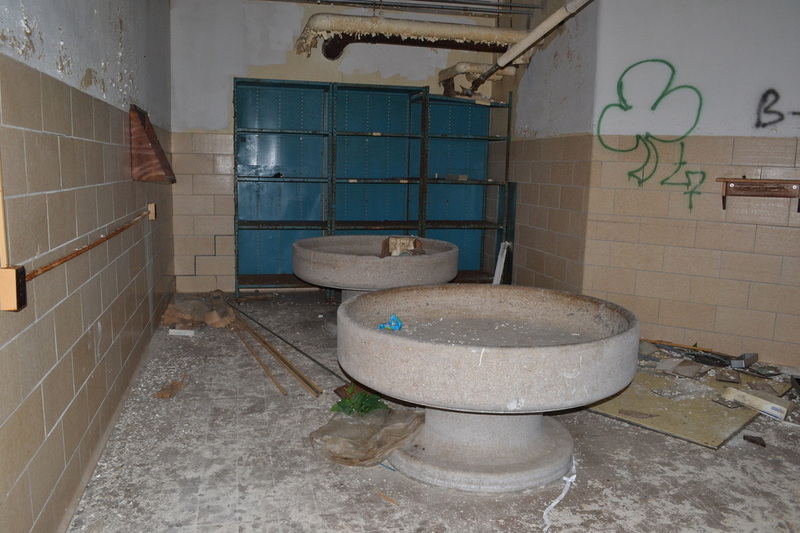 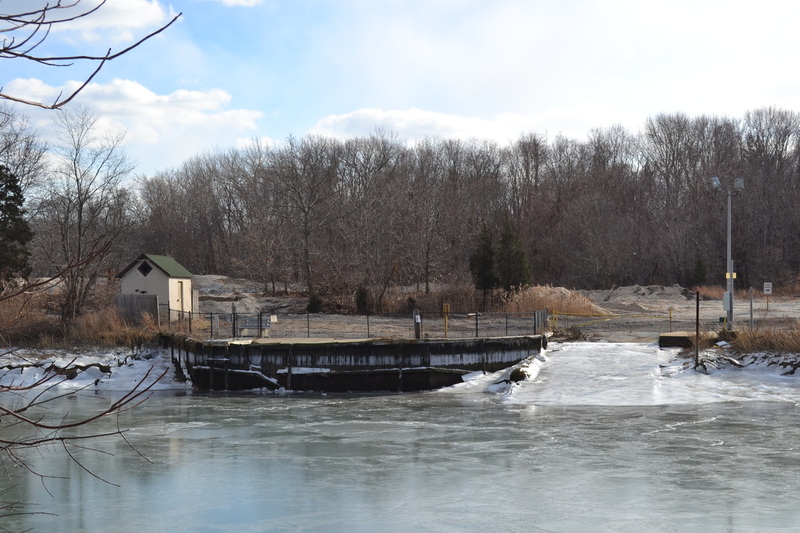 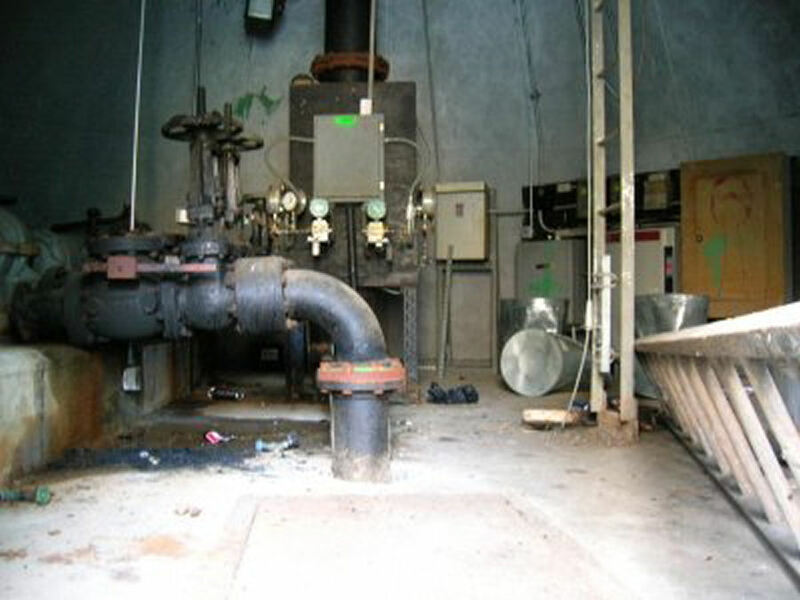 It was rehabilitated in 1960 & served as the hospital's sewage treatment plant. It was later renumbered as Building 72. 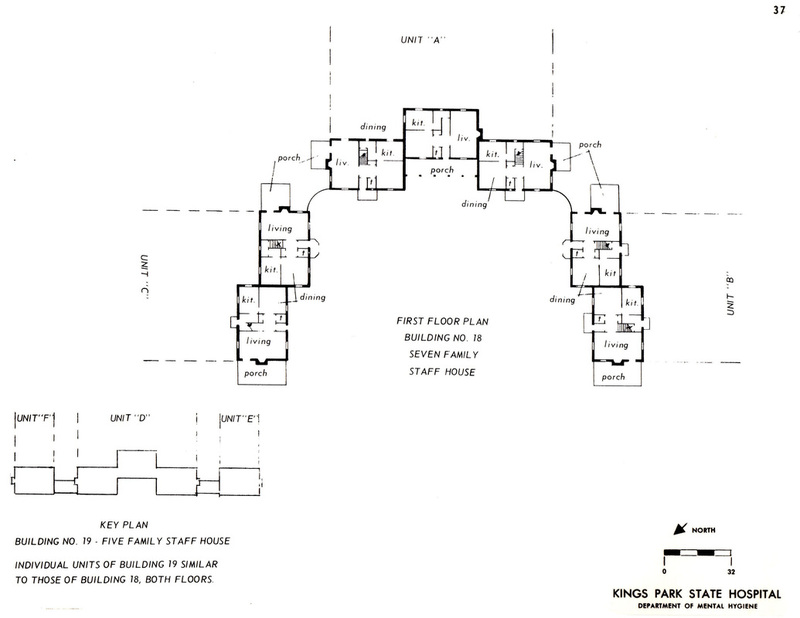 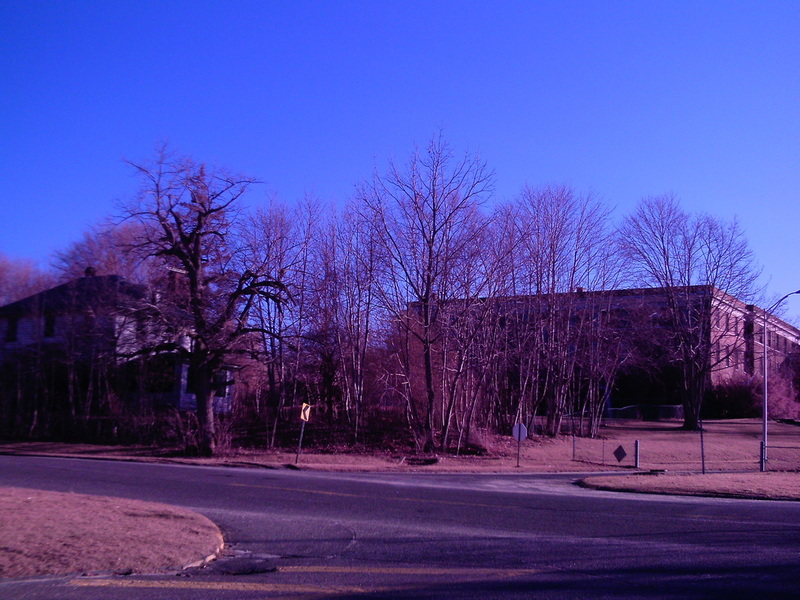 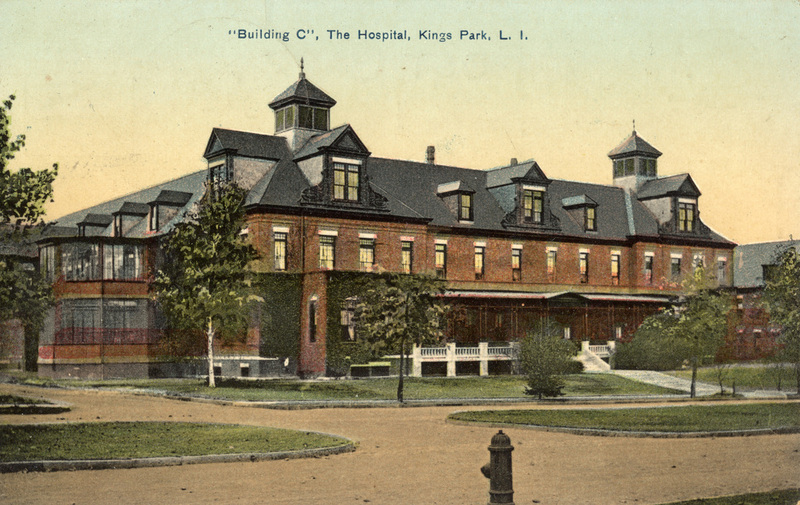 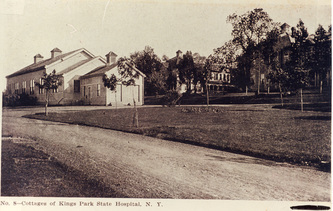 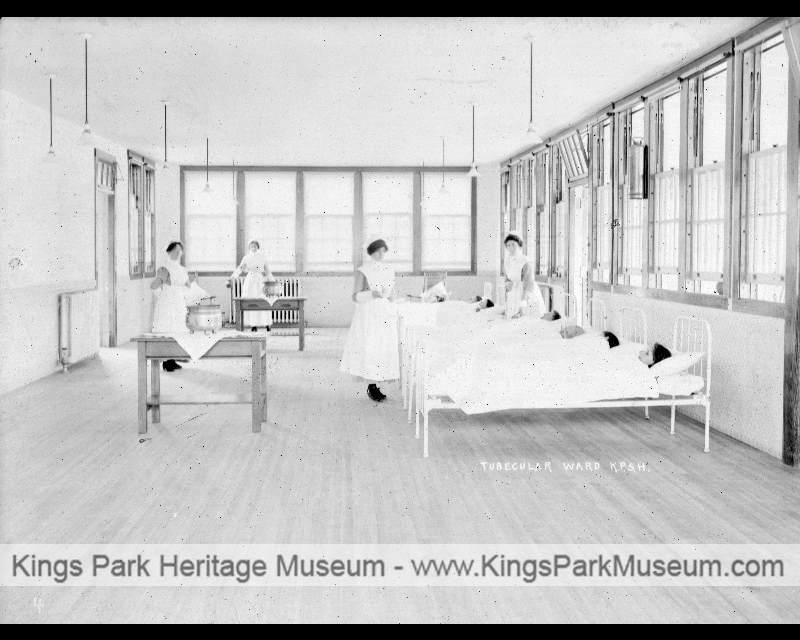 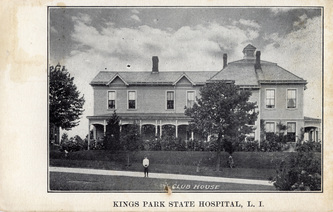 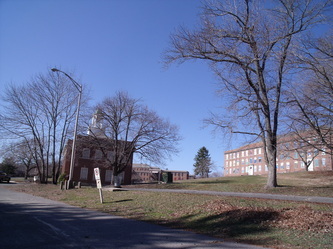 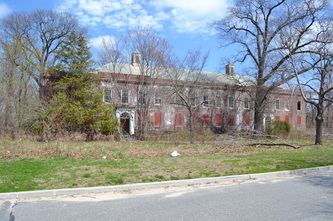 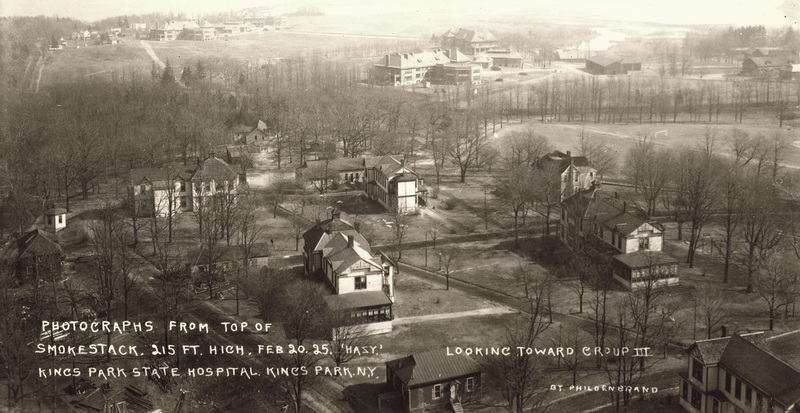 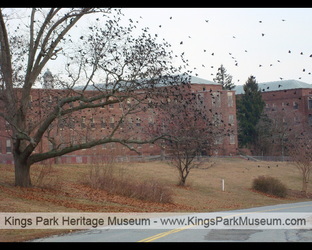 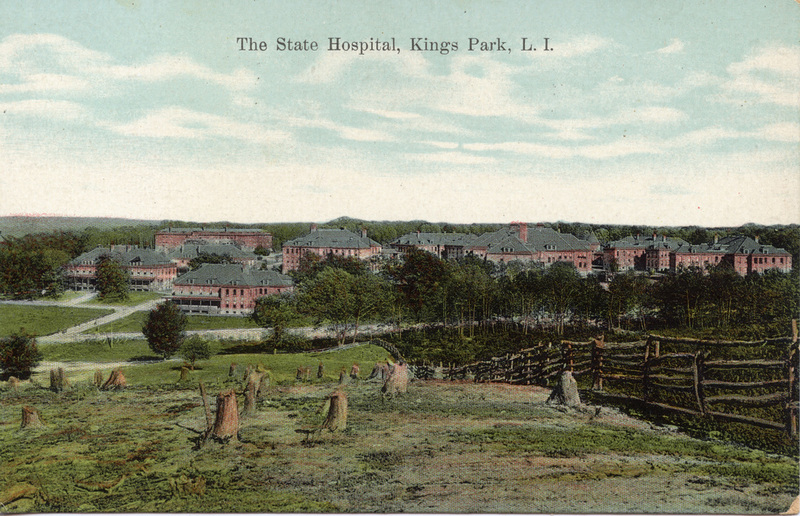 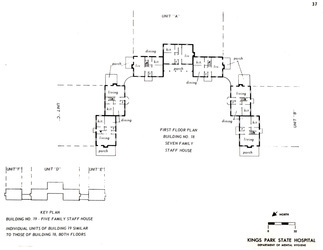 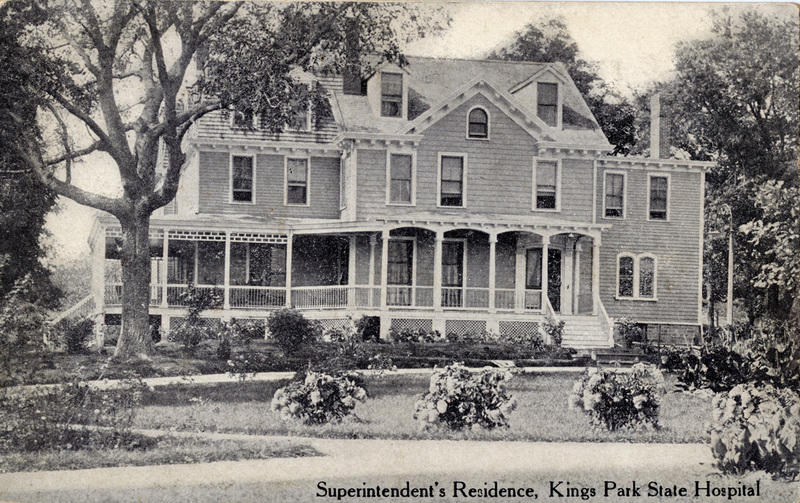 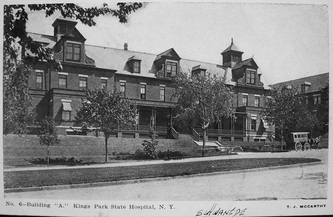 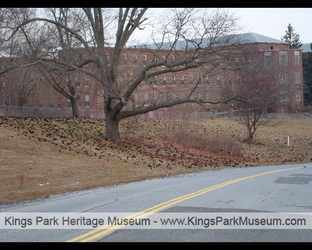 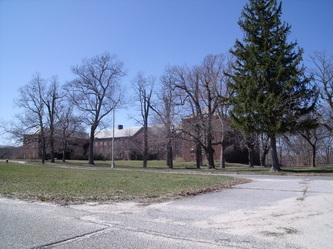 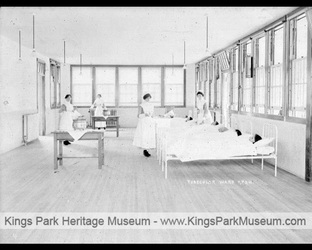 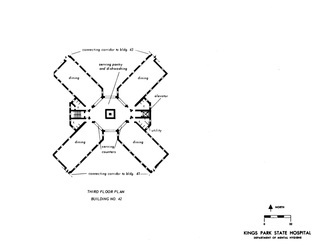 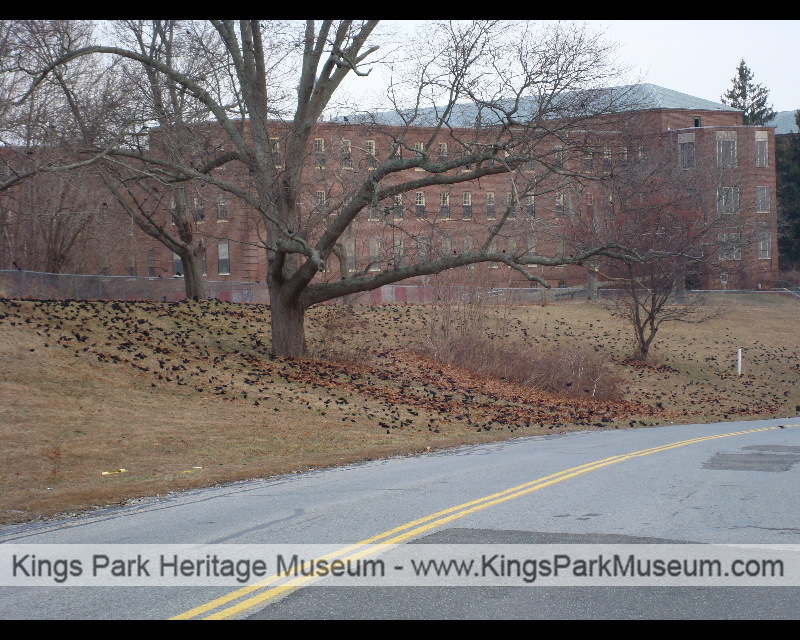 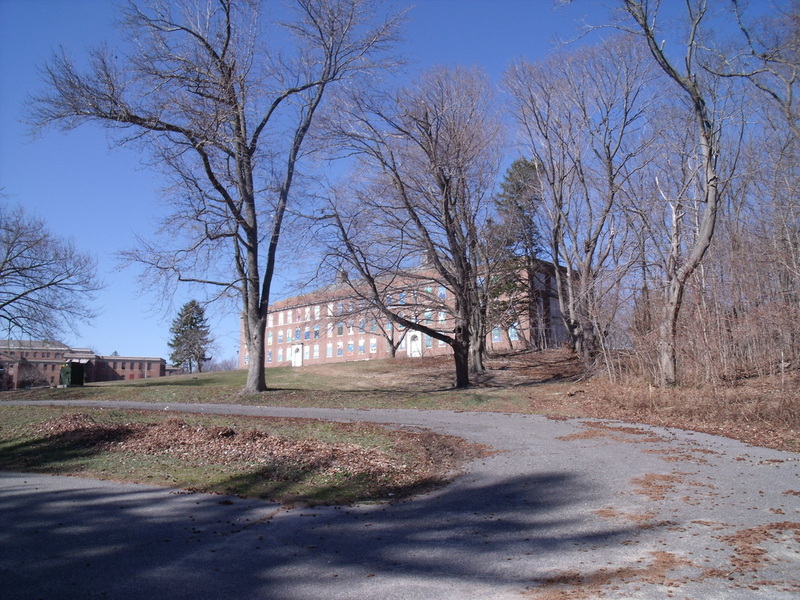 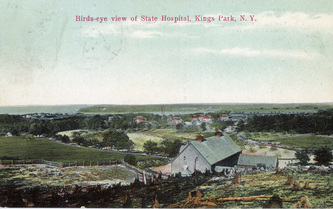 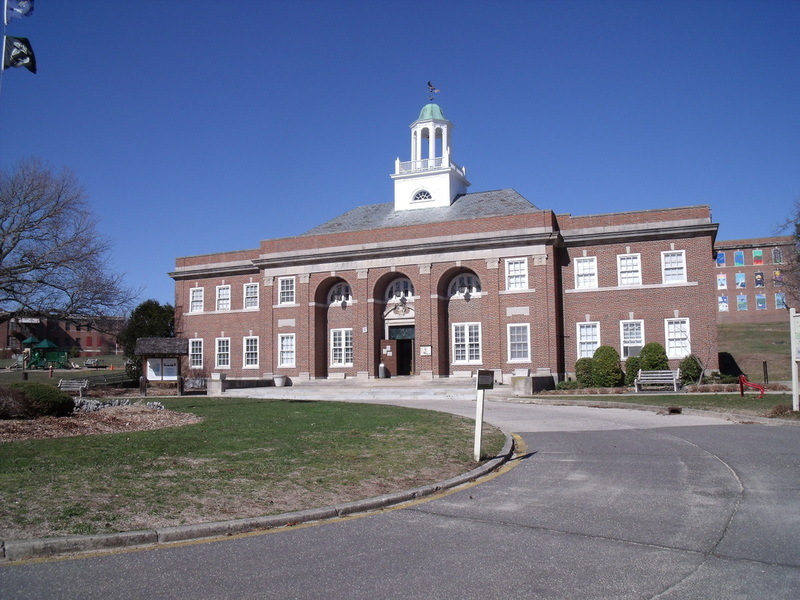 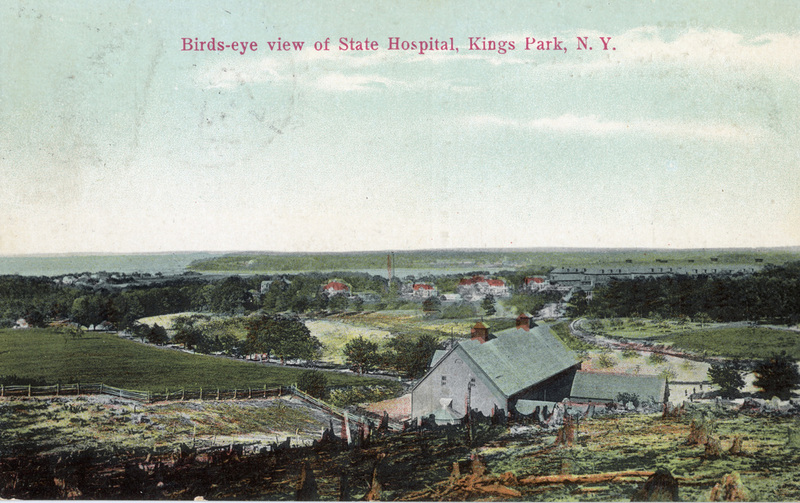 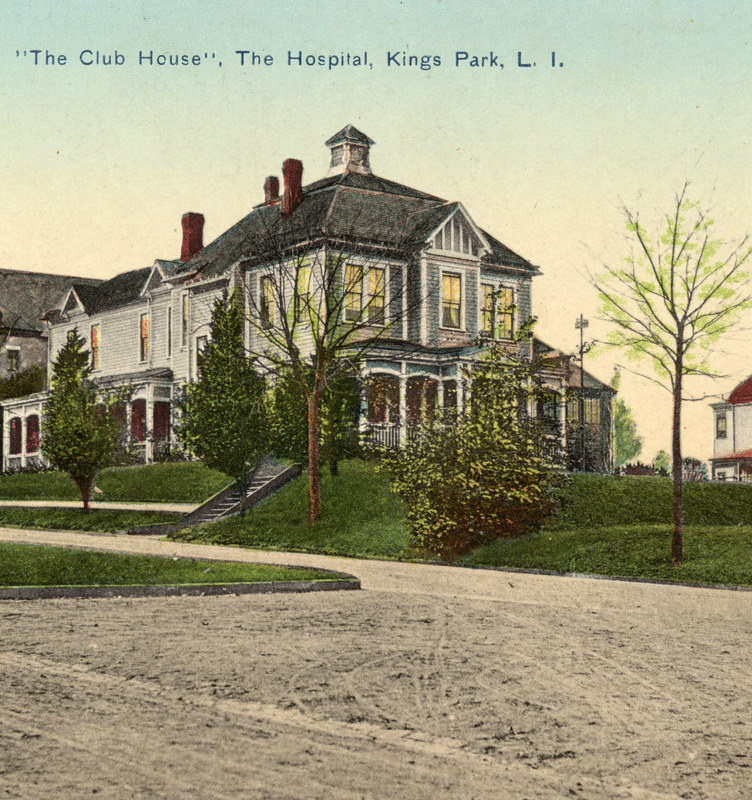 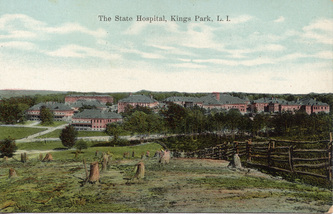 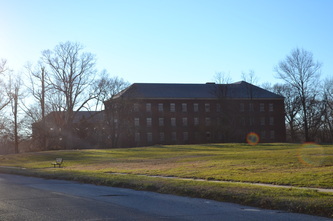 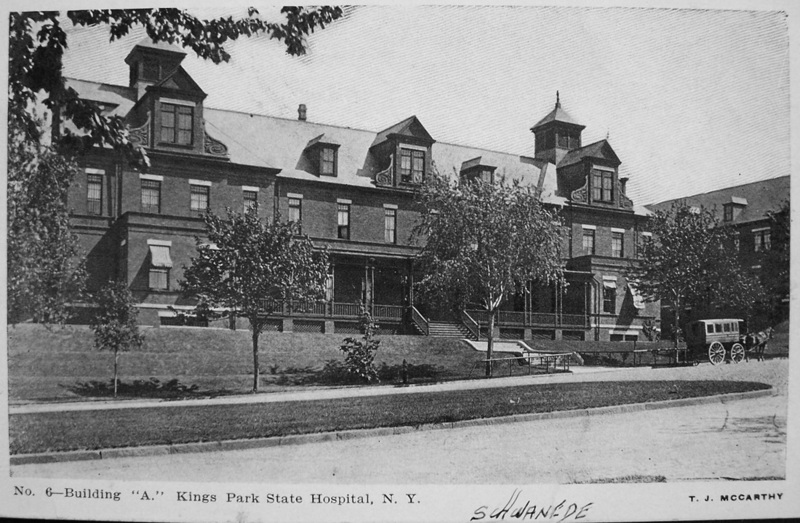 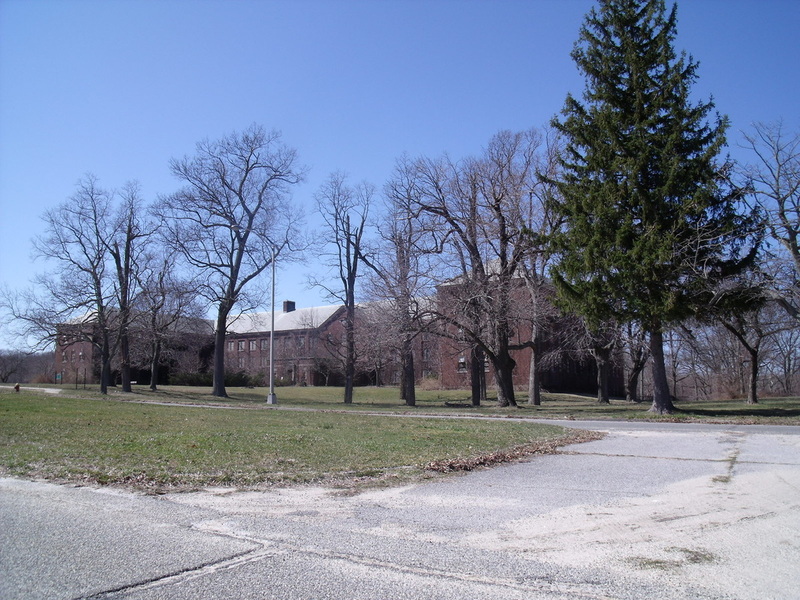 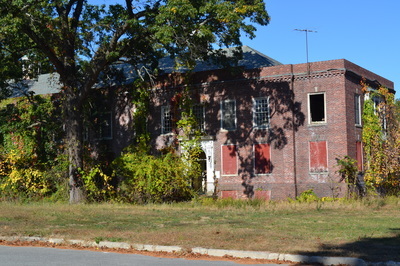 After the closing of the hospital, it was utilized by the town of Kings Park. 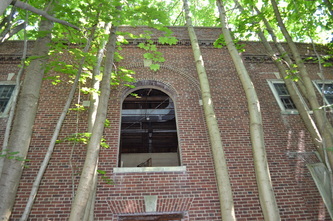 The original structure was replaced by a newer one sometime around 2004, which is still operational today. The original Building 67 was built during the late 1800s on the same exact site as the current one. 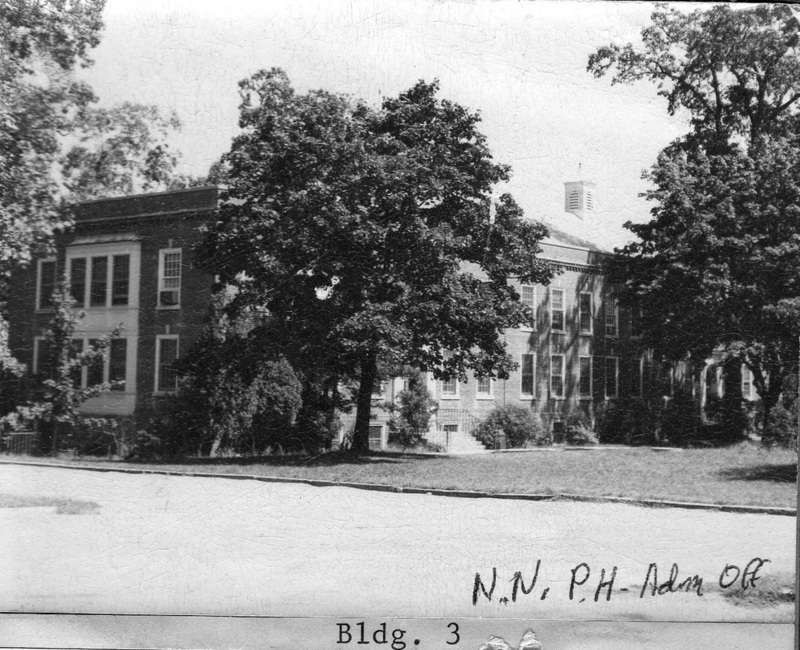 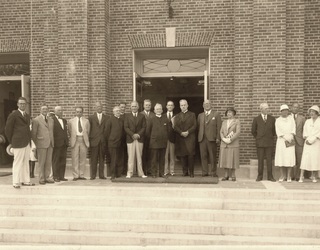 At some point in the late 1930s it was demolished & replaced by the current Building 67. 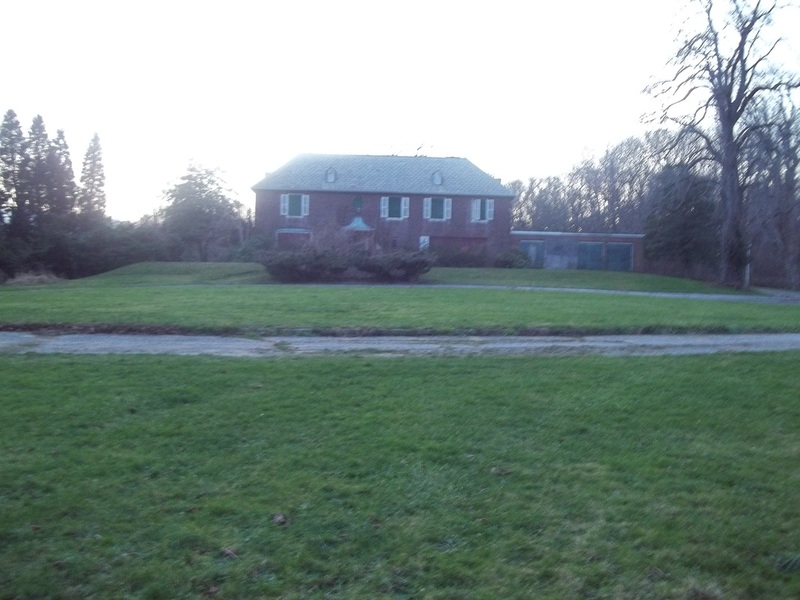 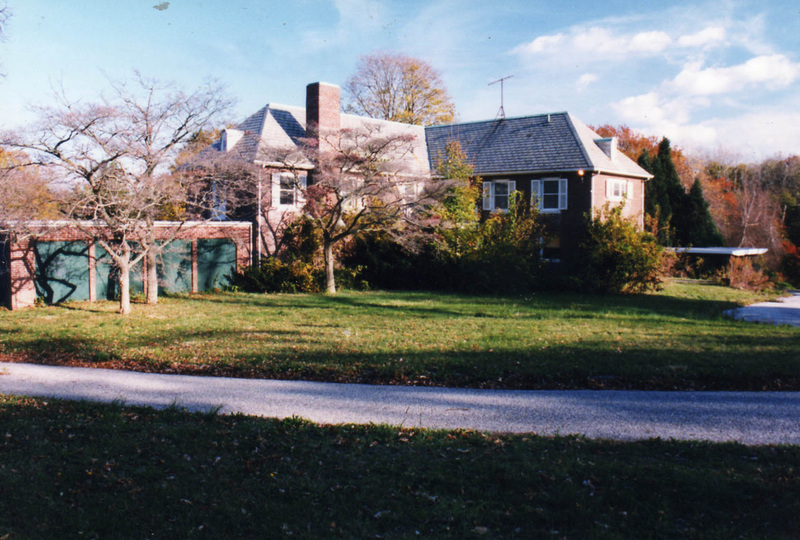 Built from 1939-1940 this spacious house served as the home to the Senior Director of the hospital. 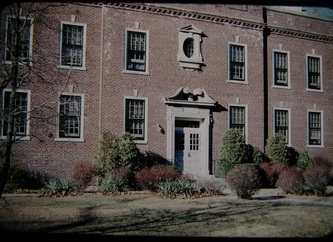 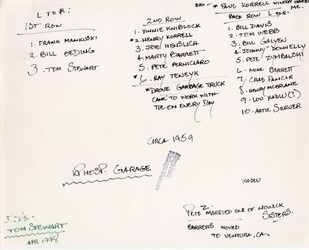 Throughout the years, it housed several different directors. 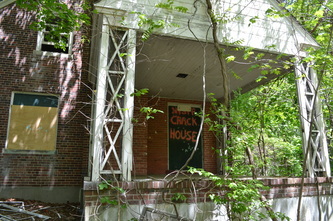 The last director to reside here was Dr. Charles Buckman, during the 1970s. 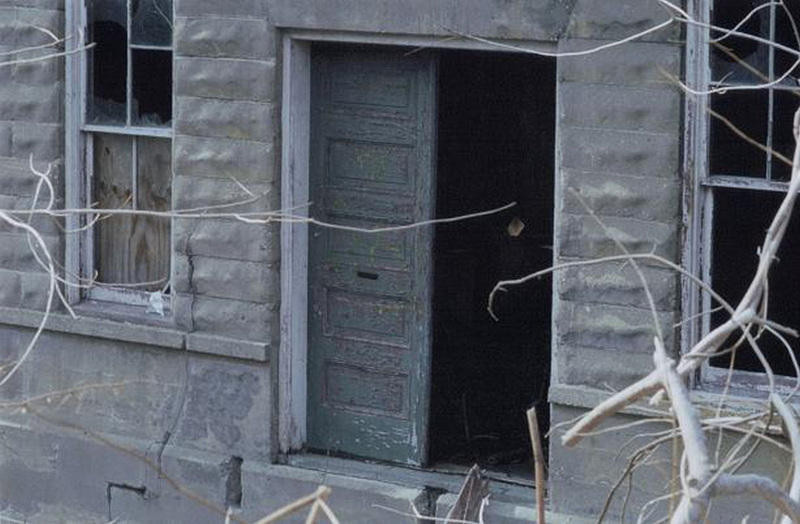 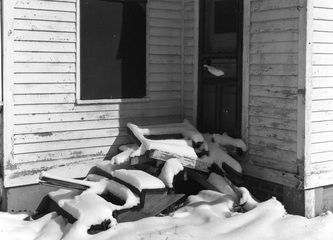 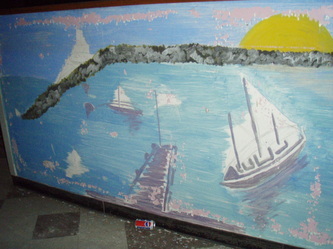 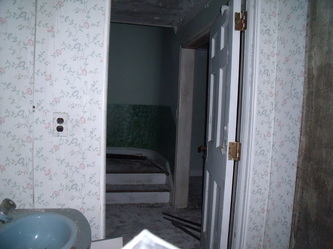 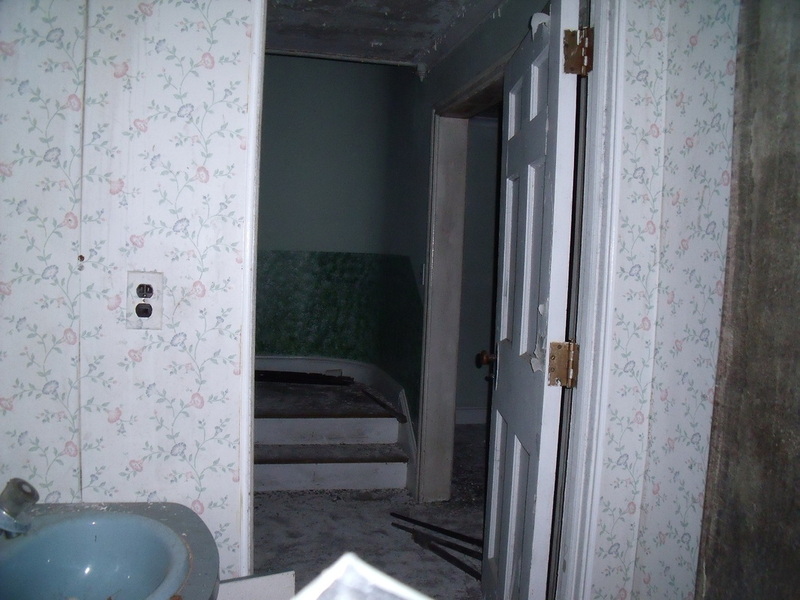 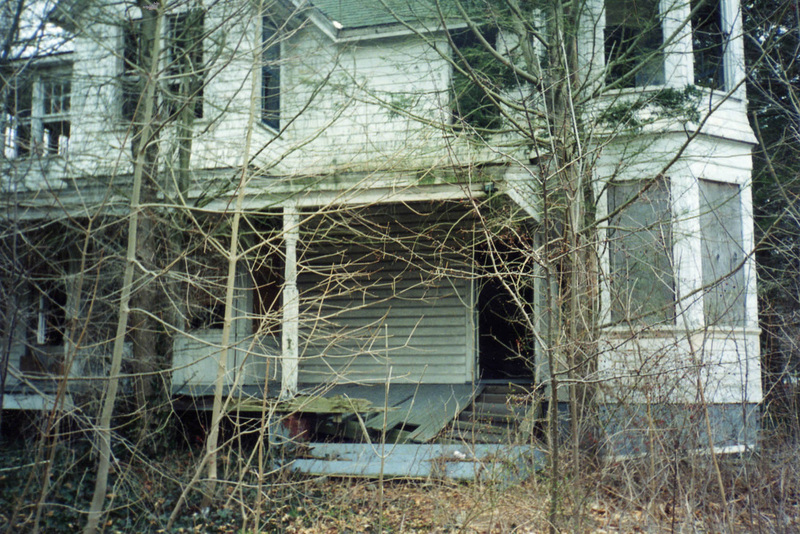 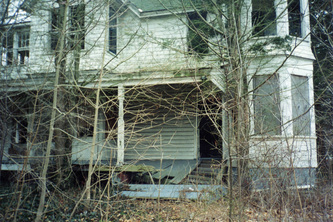 After he moved out it was abandoned & boarded up, which is how it remains to this day. 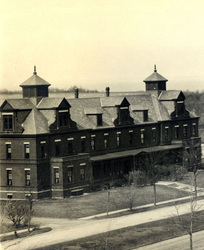 The original Building 68 was built from 1890-1892. 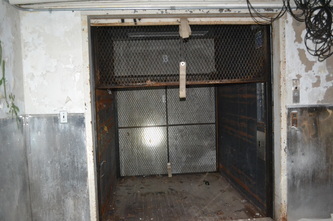 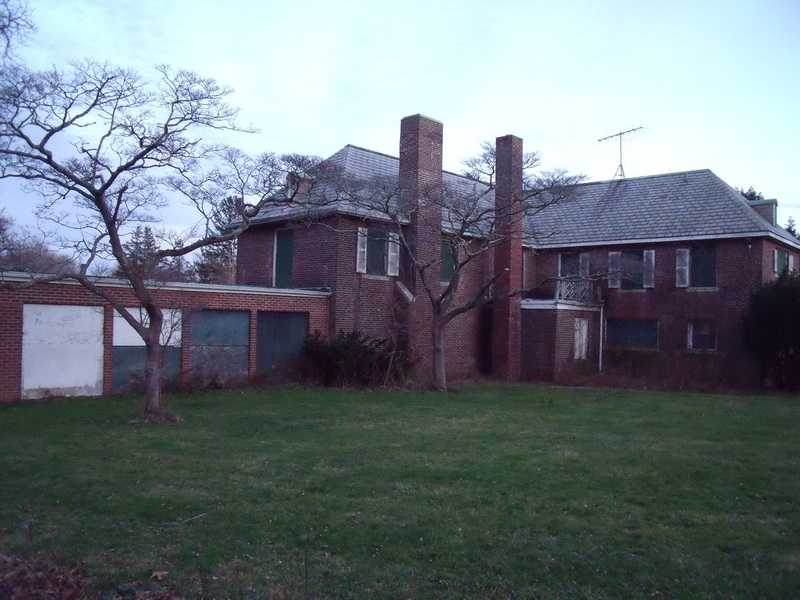 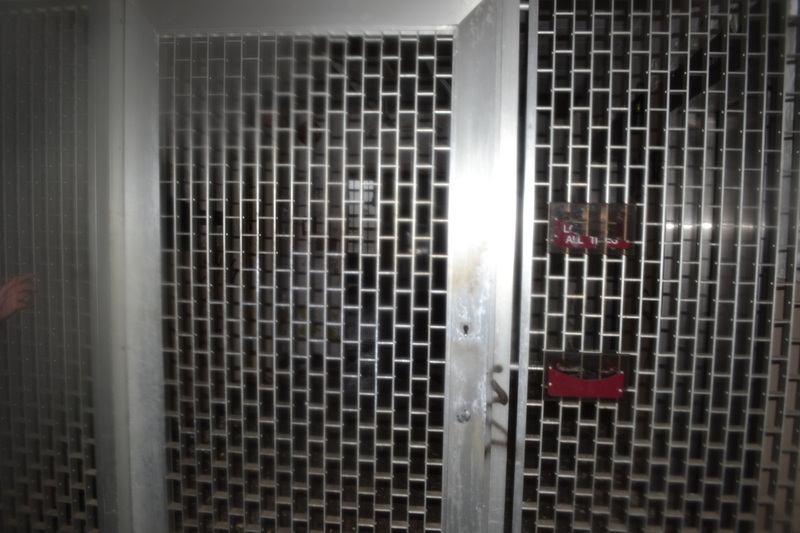 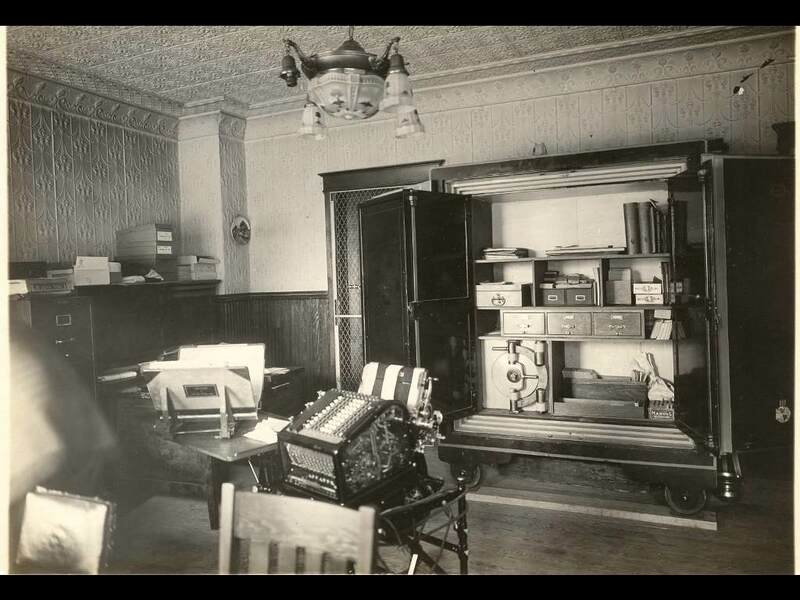 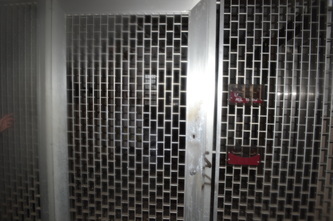 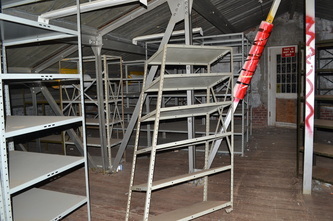 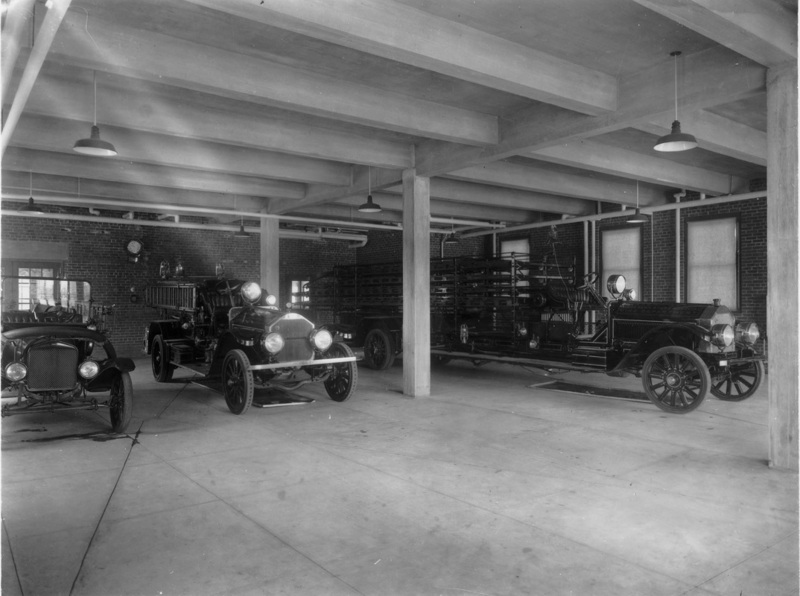 It was used as a personal garage for the hospital's superintendent. 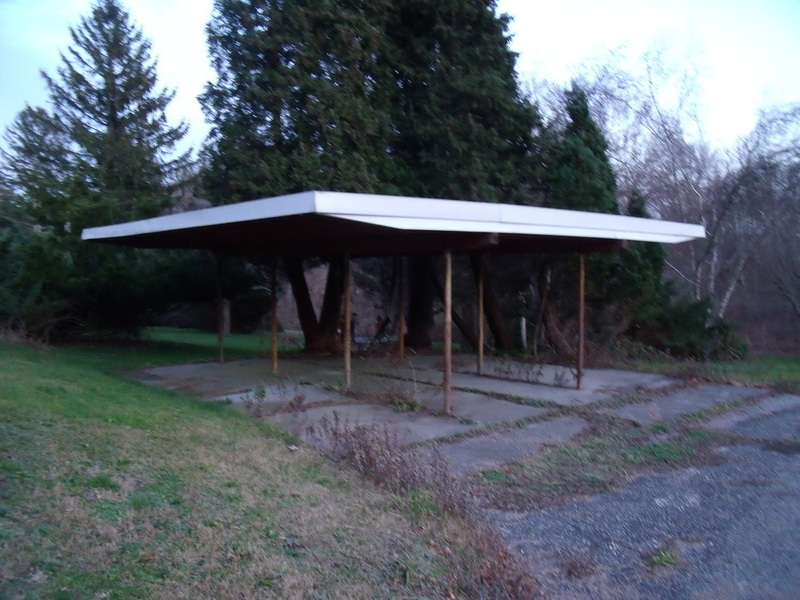 Sadly, there are no known photos of this actual structure. 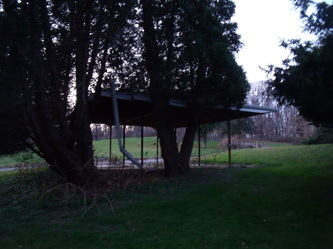 At some point, it was eventually demolished & replaced by this current structure. 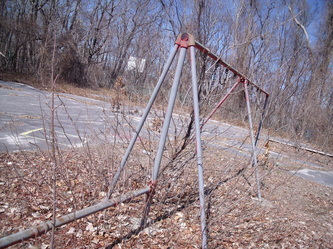 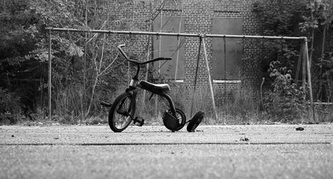 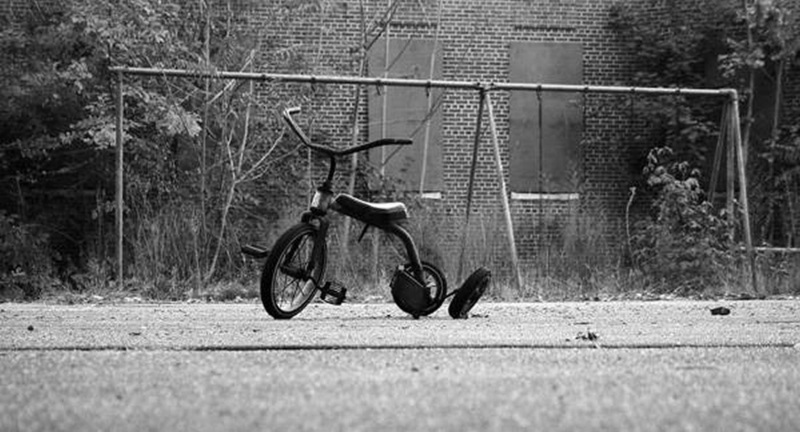 While it is still standing, it remains unused by anyone. 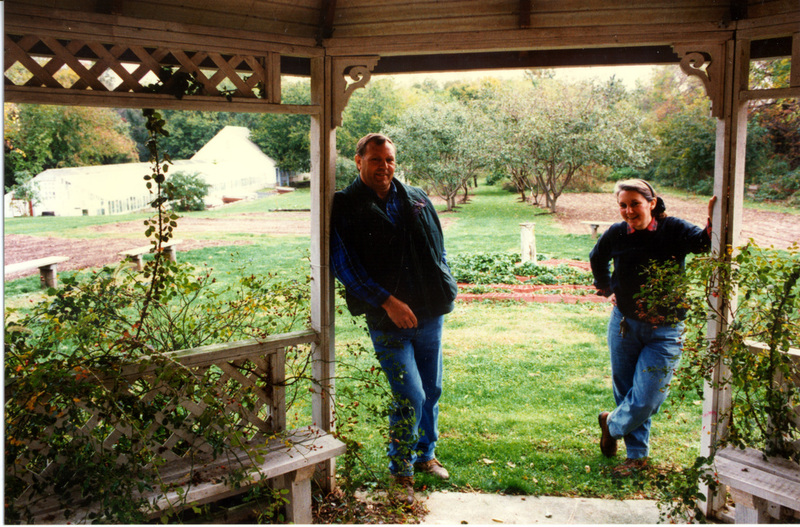 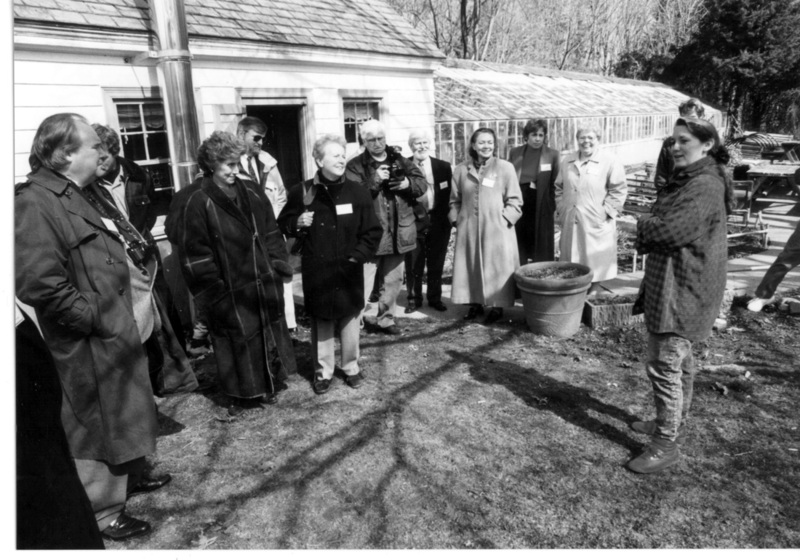 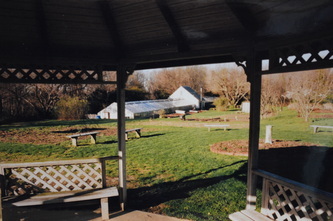 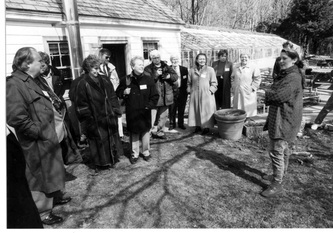 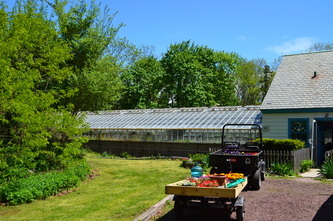 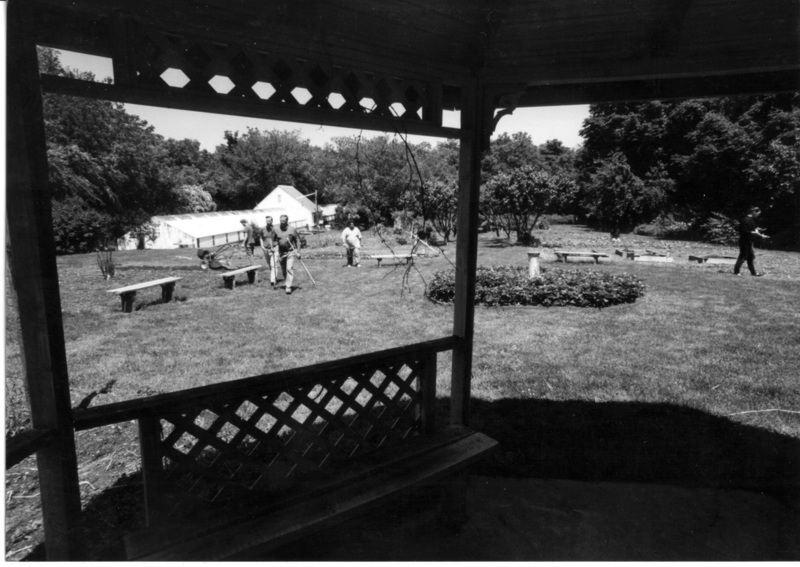 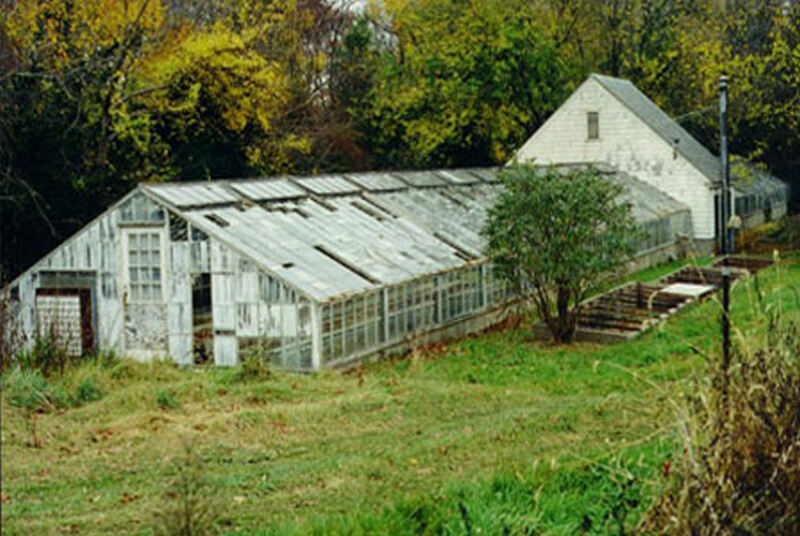 This was the first greenhouse, which was built in 1922 not too far from the superintendent's house. After being abandoned, it was destroyed by a fire many years ago. 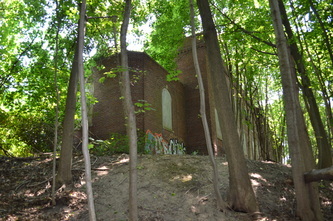 It's original location has since been swallowed up by the trees in the area. 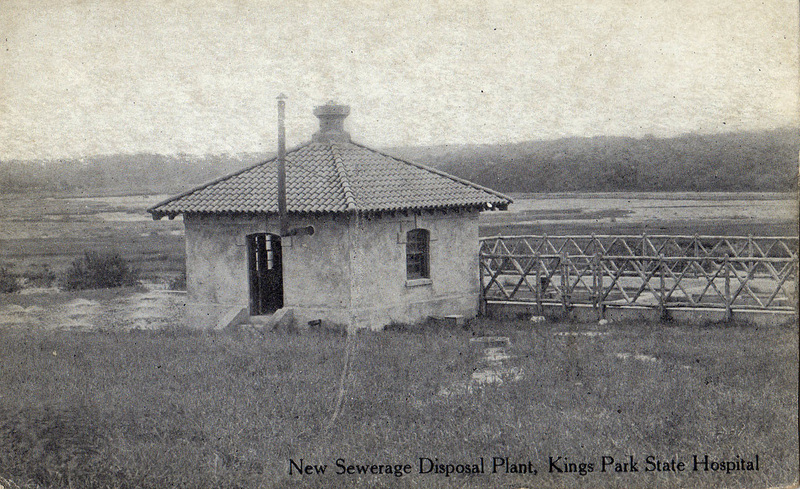 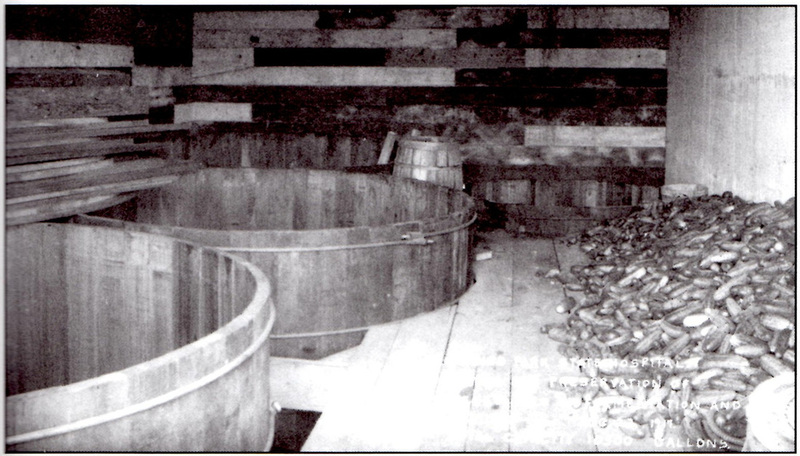 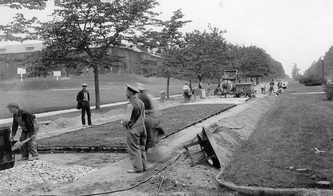 This was actually a series of sewage hot beds built near the Superintendent's house in 1922. 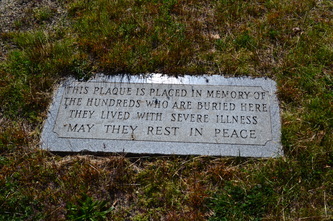 They were destroyed by fire long ago. 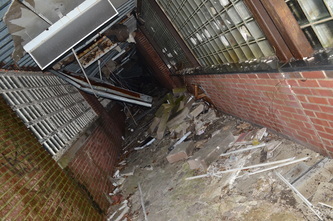 This was a 6-car staff garage located behind Building 135. It was built in 1928, but it was destroyed by fire some time ago. 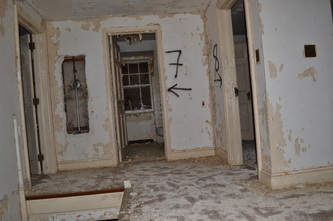 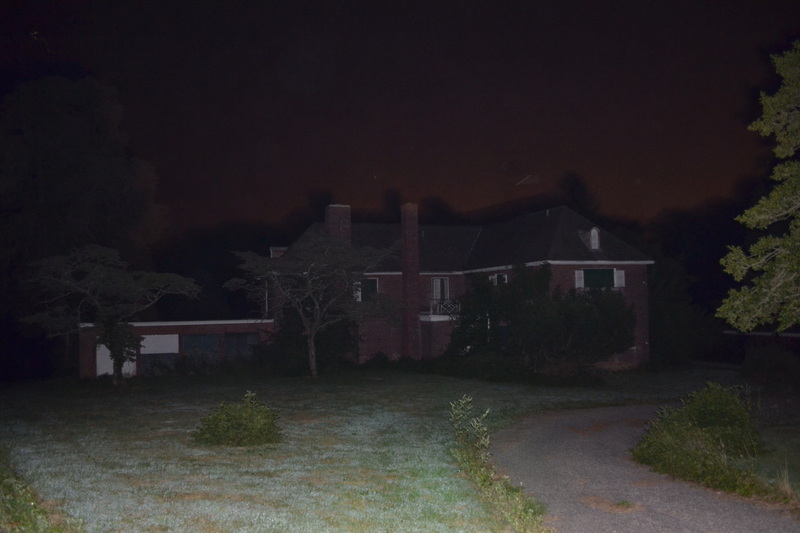 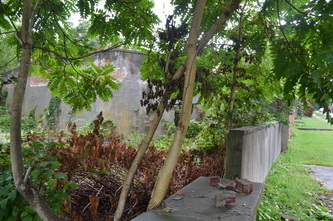 There was another Building 71 before this, which was located next to the Senior Director's Mansion. 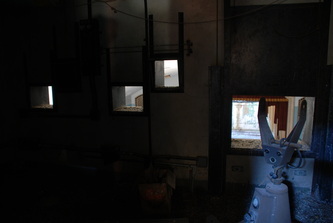 It was used as a hen house. 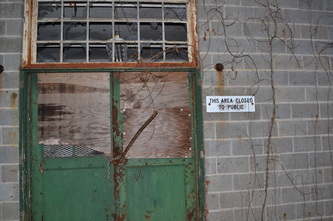 No photos are available. 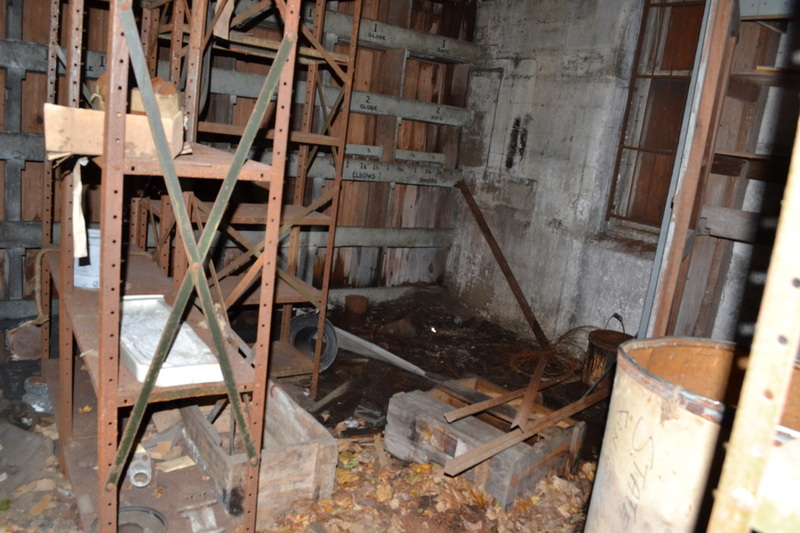 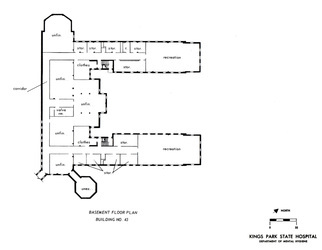 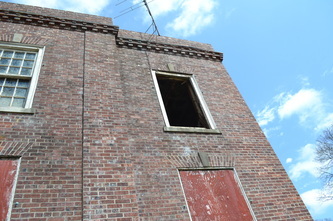 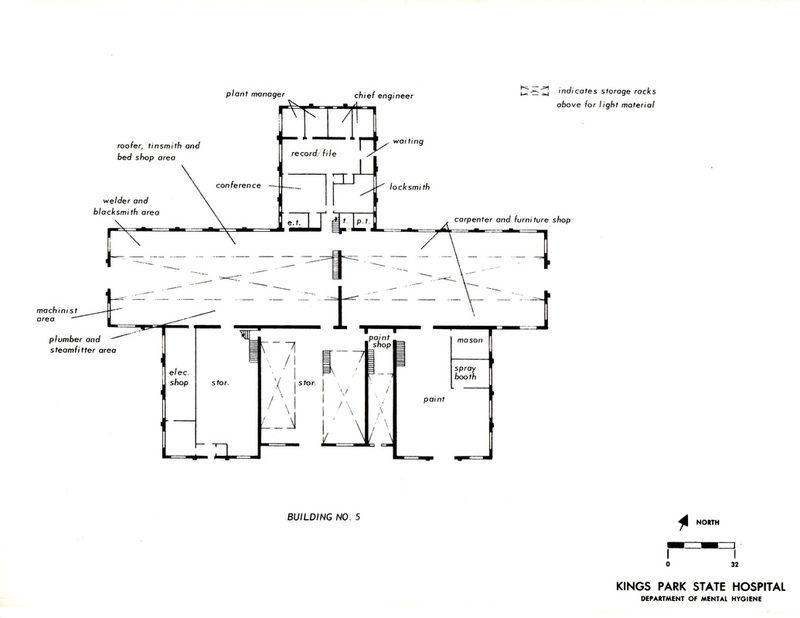 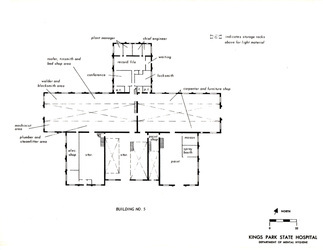 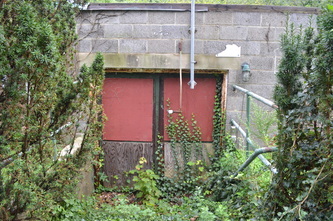 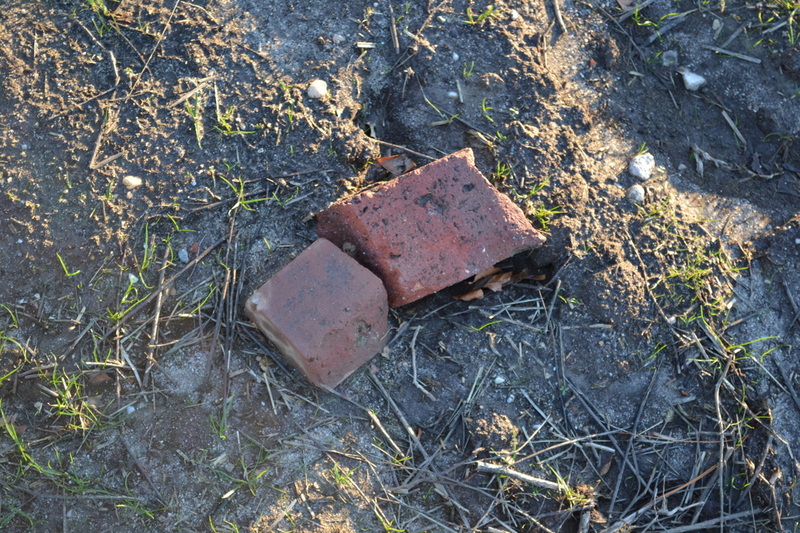 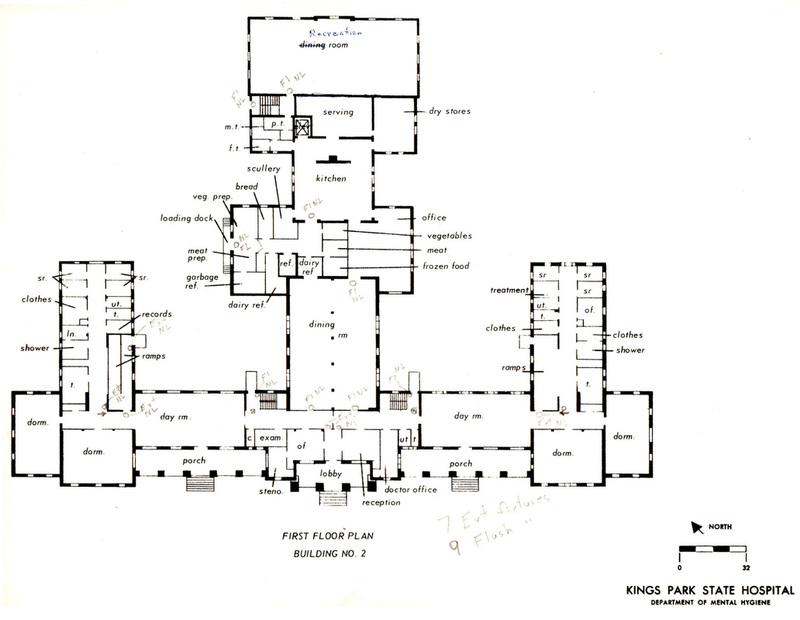 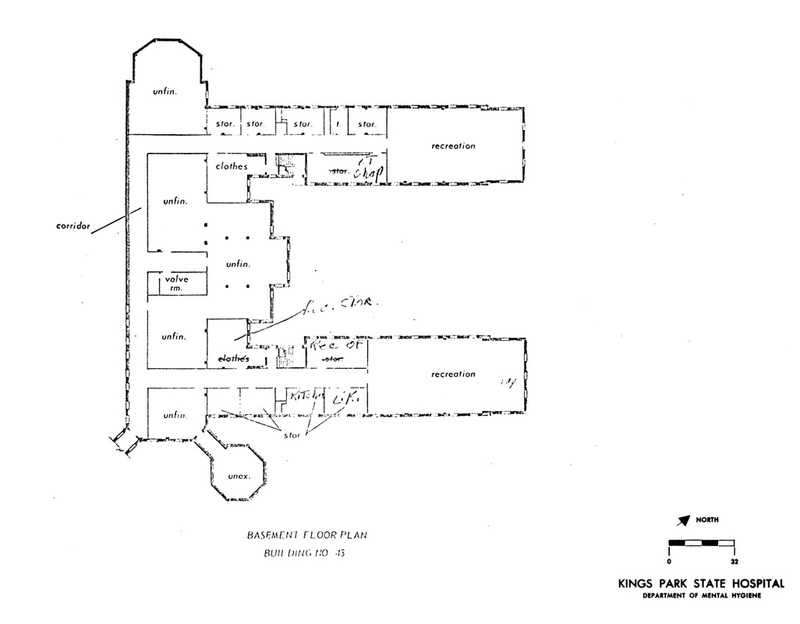 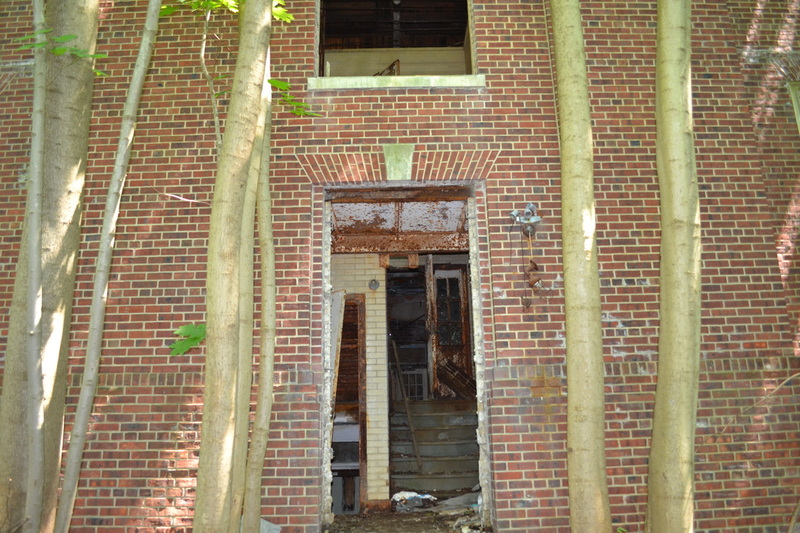 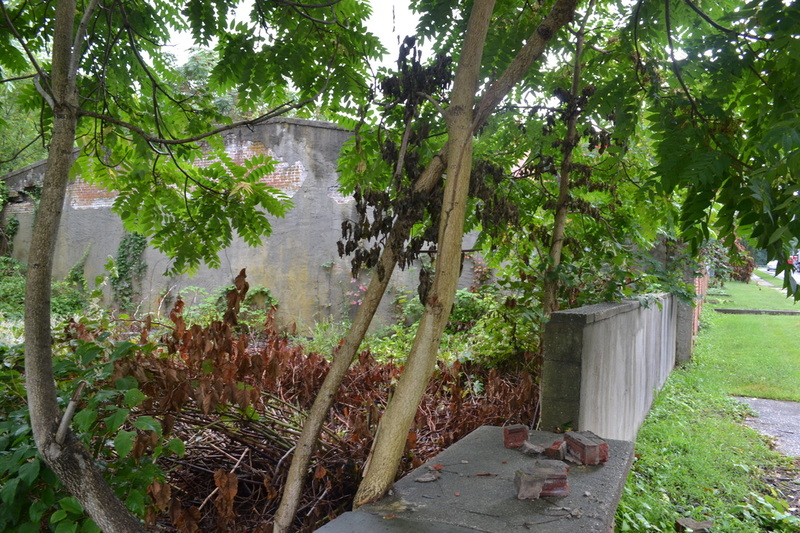 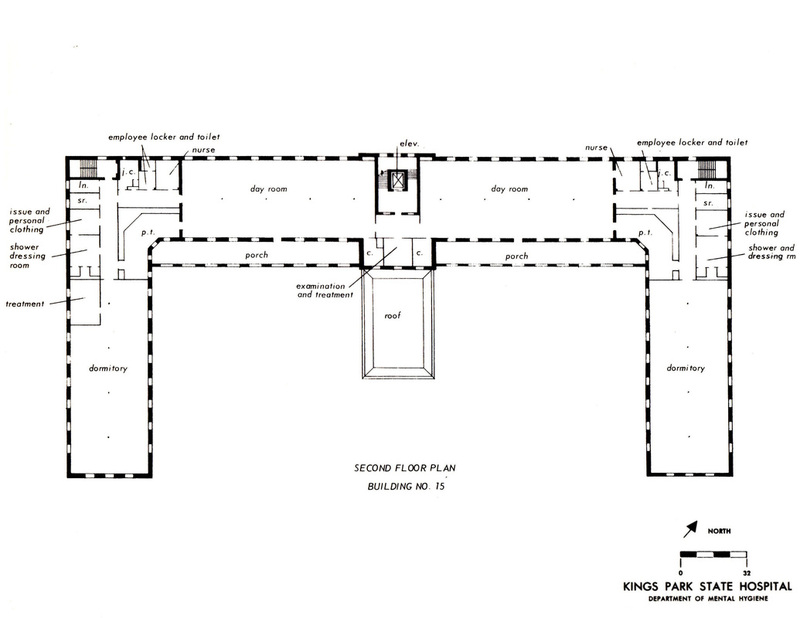 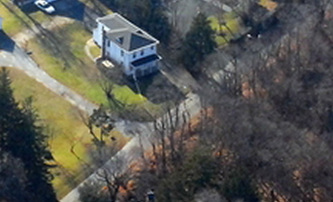 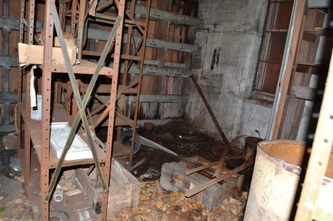 Building 72 was a small tool shed built long ago near the Senior Director's Mansion. 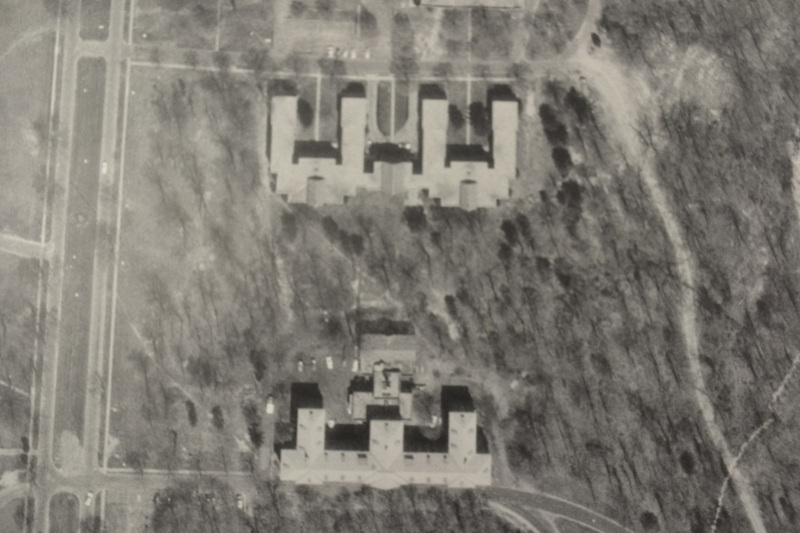 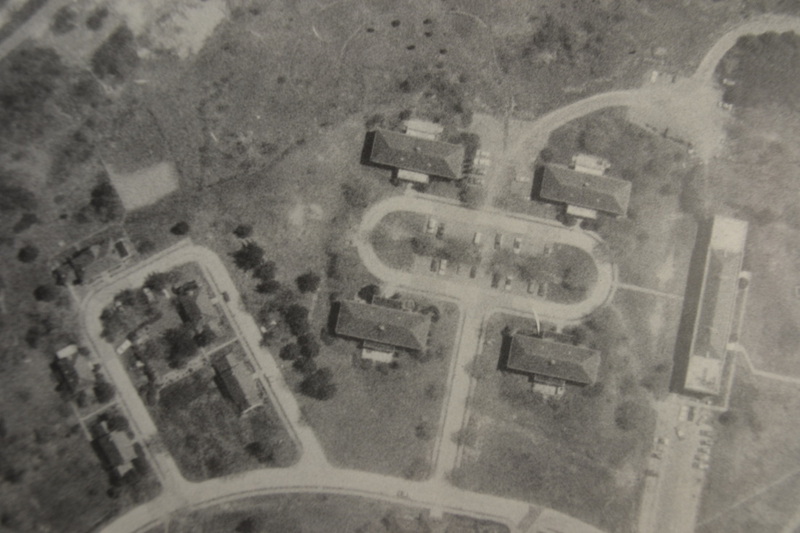 These were the buildings of the Veterans' Memorial Hospital Unit, which included the 3 older buildings of Group 3. 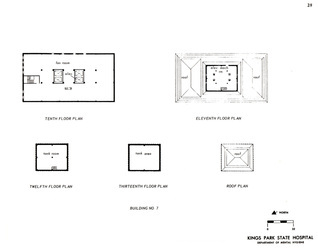 It consisted of Buildings 125-147, although there were no Buildings 145 or 146. 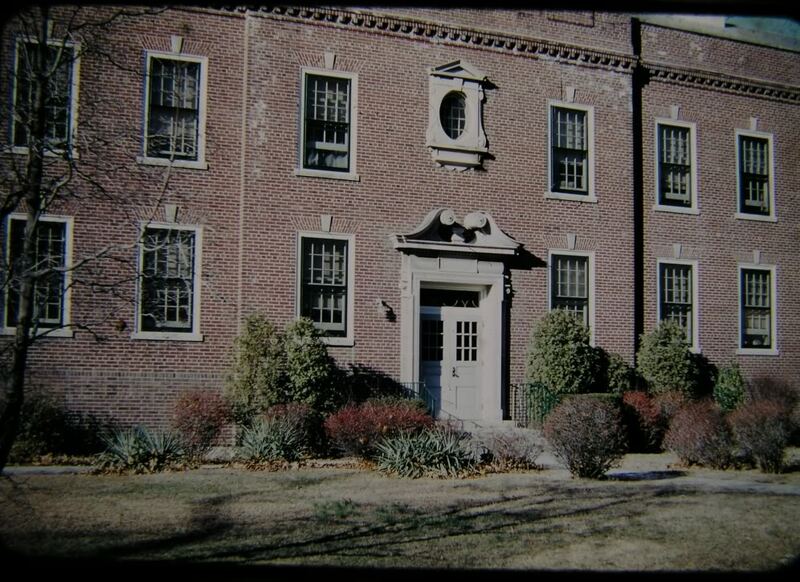 Most of the buildings were built from 1924-1933 with exception to the Group 3 buildings built between 1910-1912. 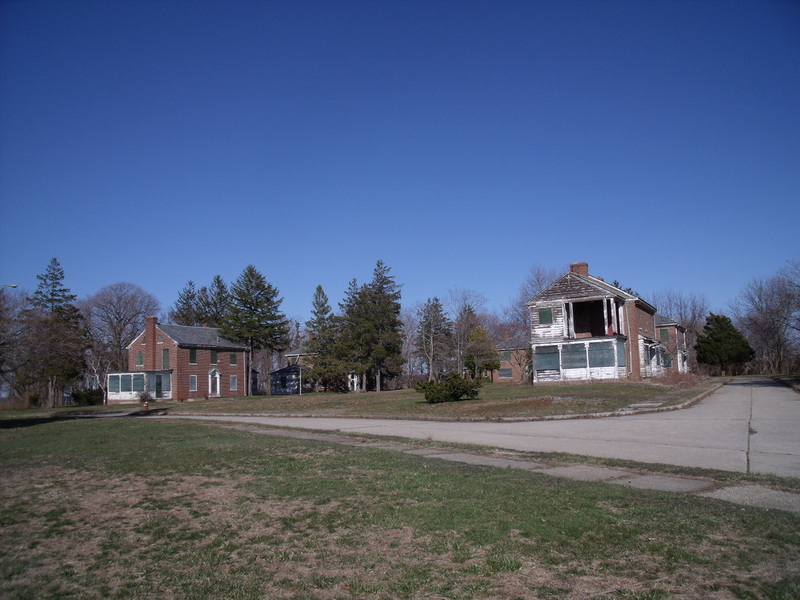 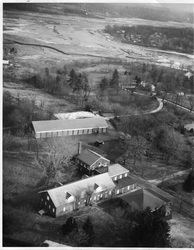 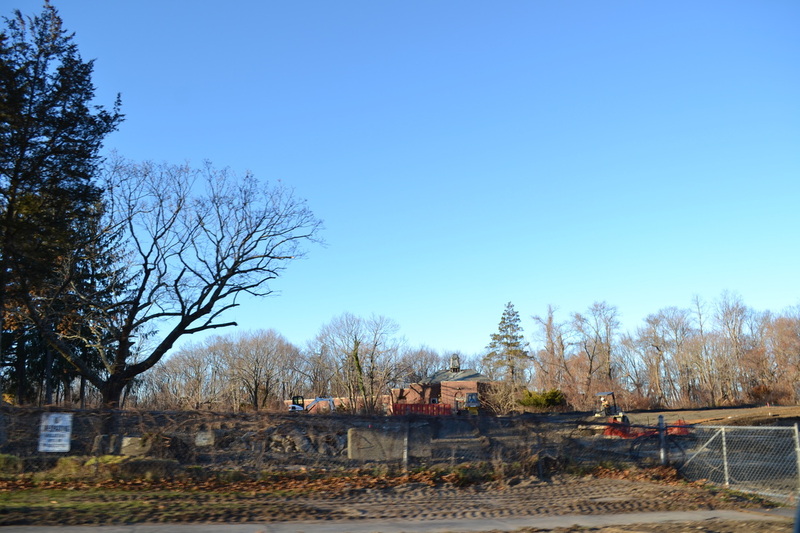 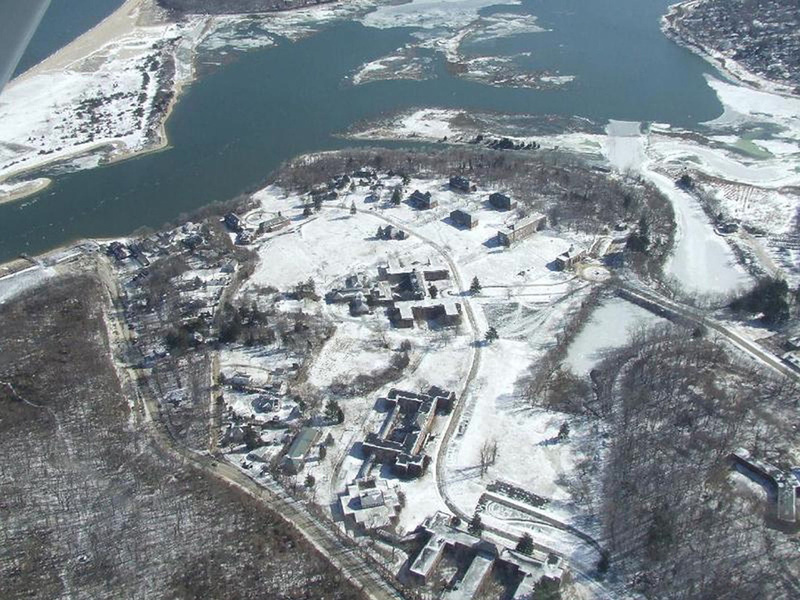 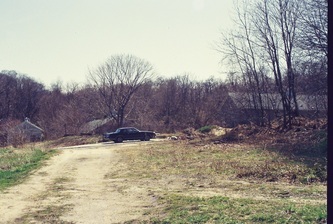 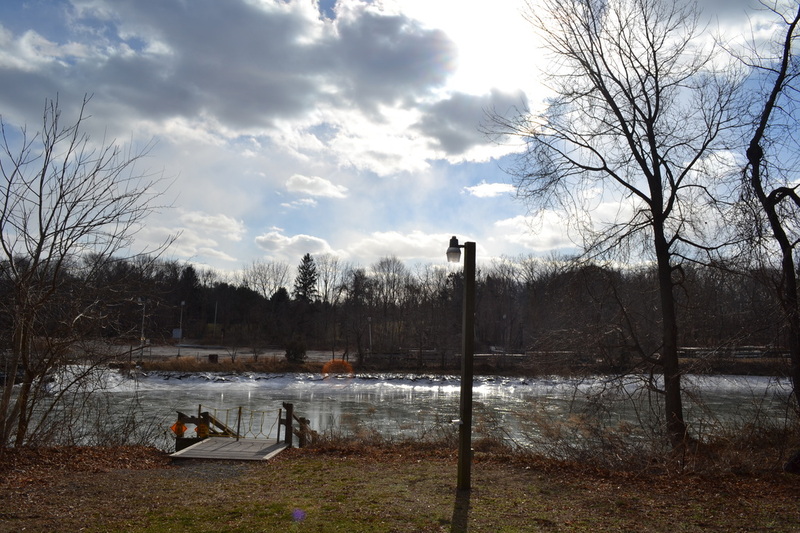 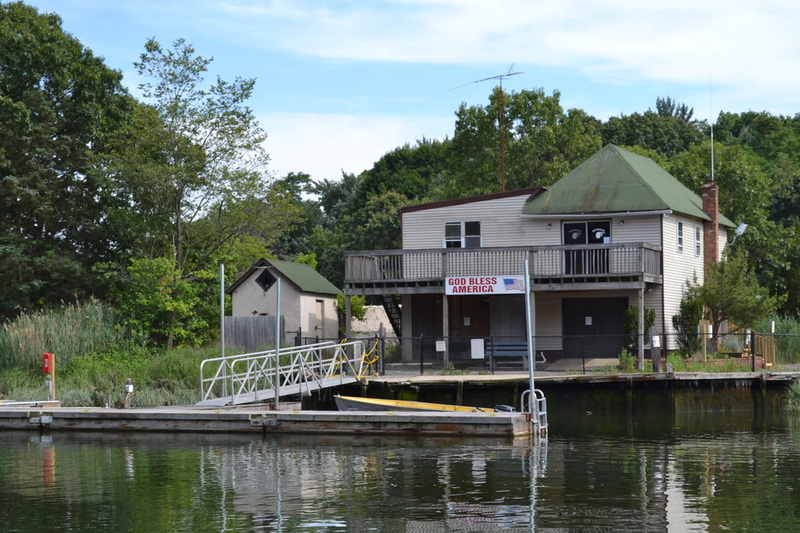 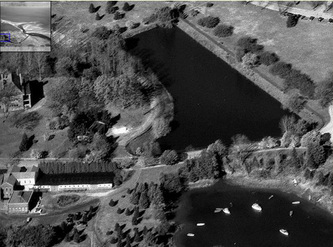 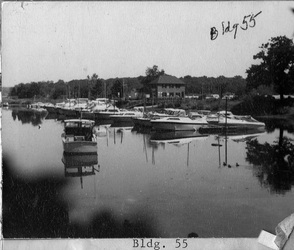 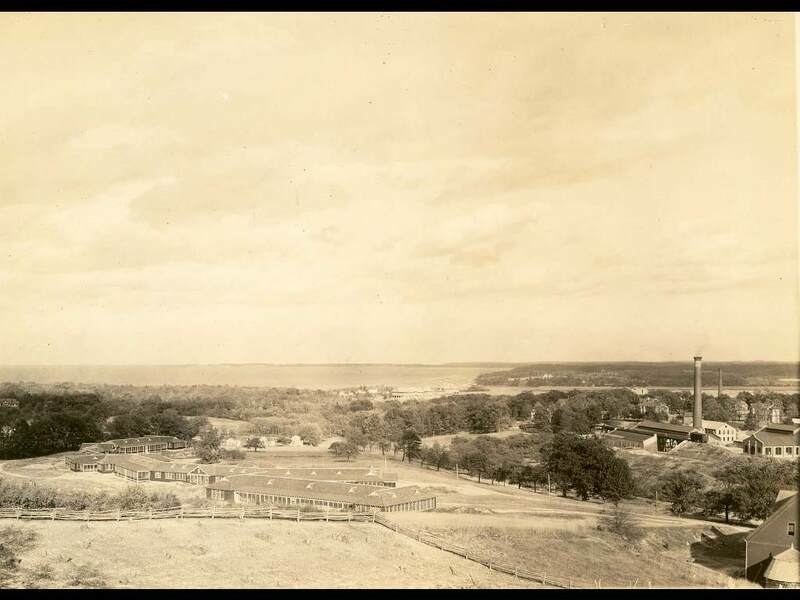 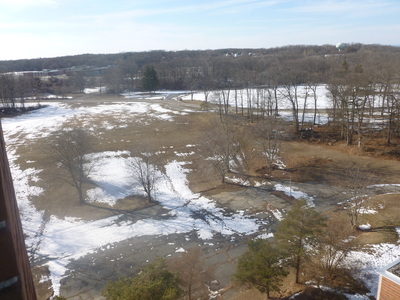 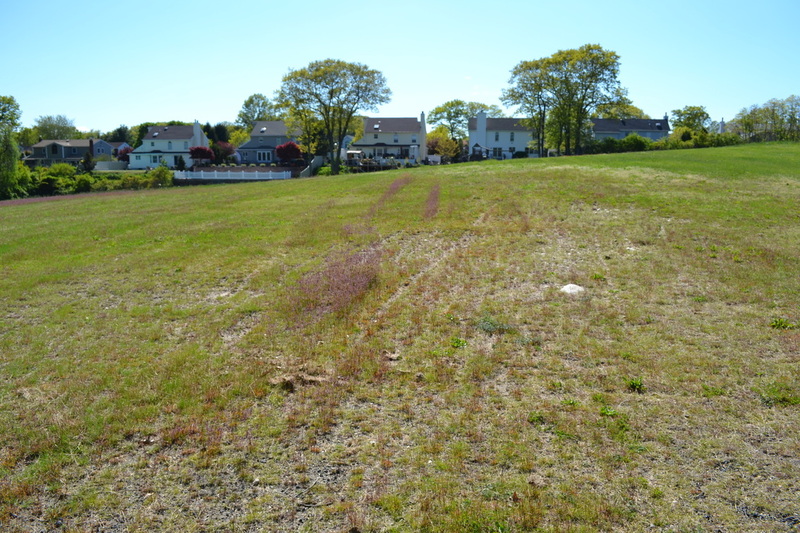 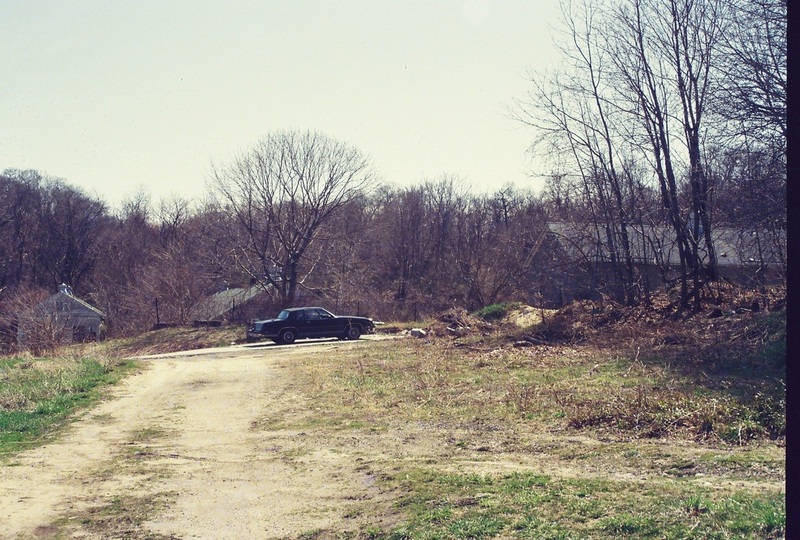 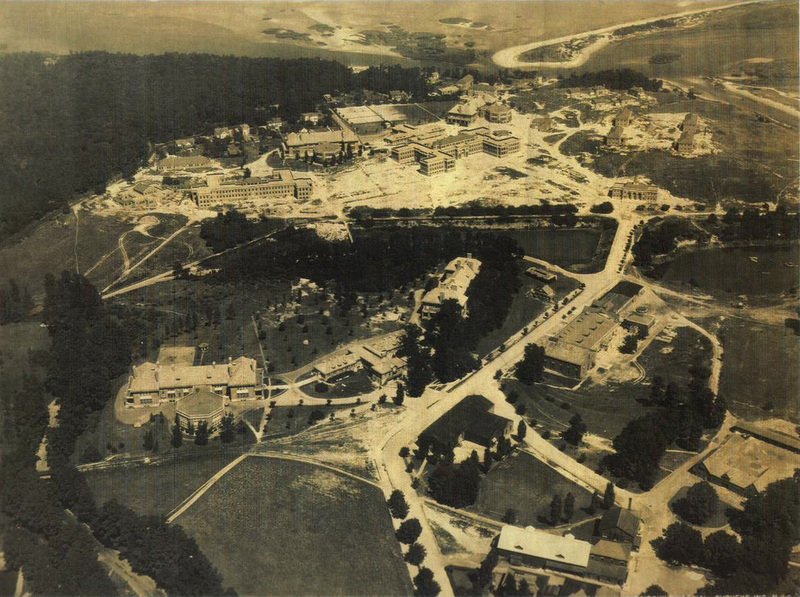 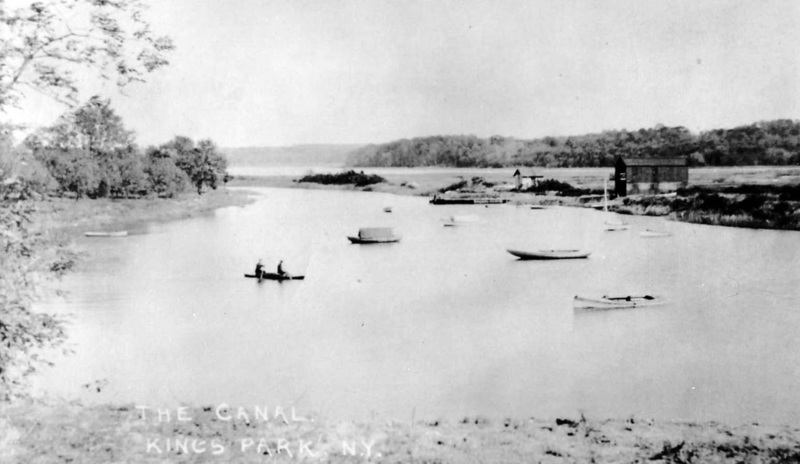 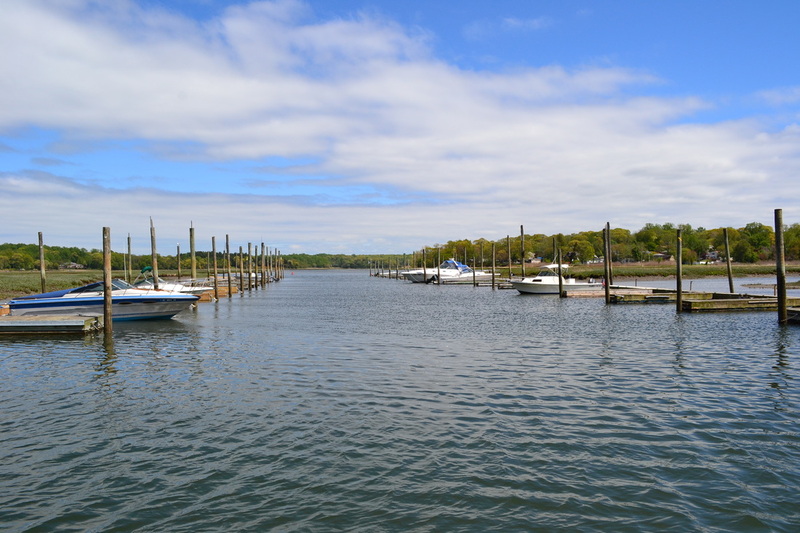 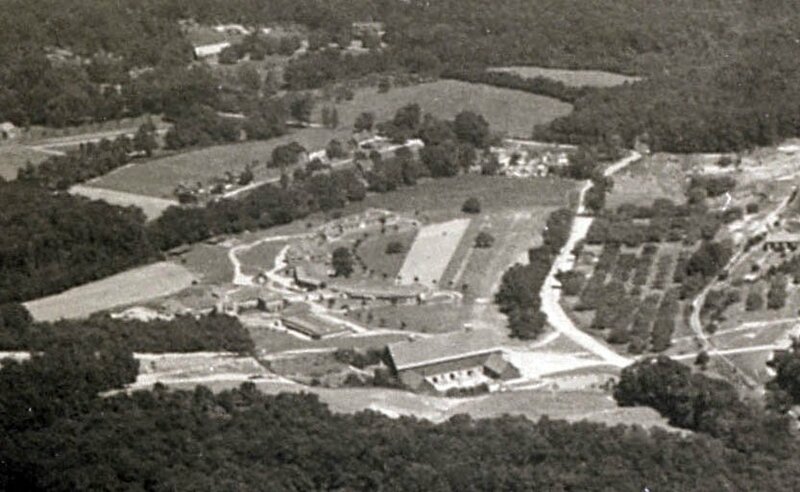 This group of buildings now lie in what has become the Nissequogue River State Park & is surrounded by such beautiful locations, such as the duck pond, the boat basin at the canal, & Kings Park Bluff. 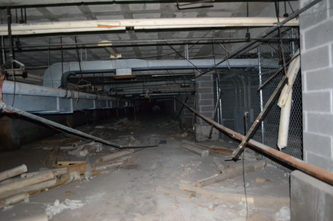 See more photos under each individual building. 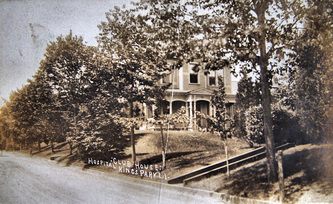 Built between 1890-1892 this house on Upper Dock Road served as the home of the Chief Engineer of the hospital. 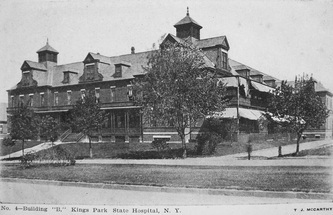 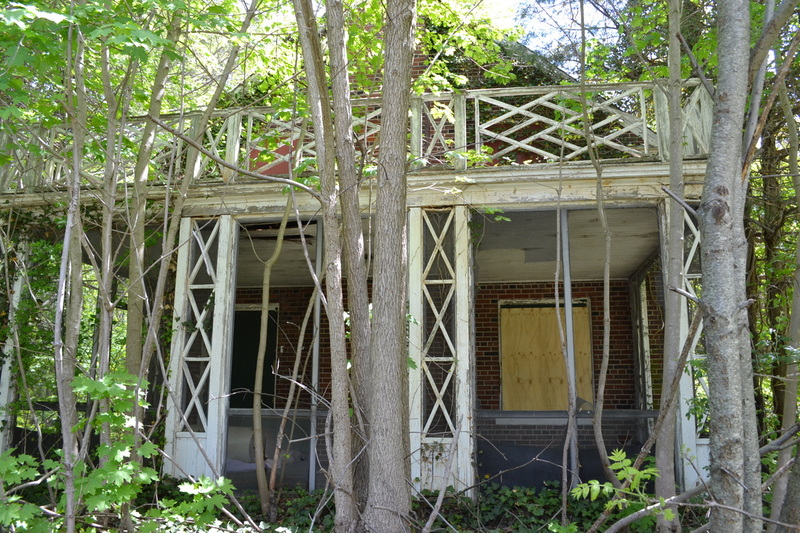 It is still standing today, but no longer belongs to the hospital. It is now a privately owned residence. 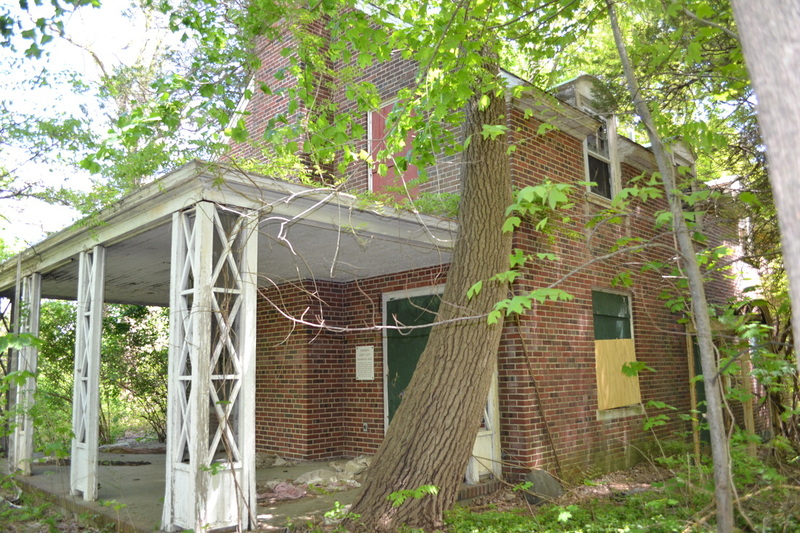 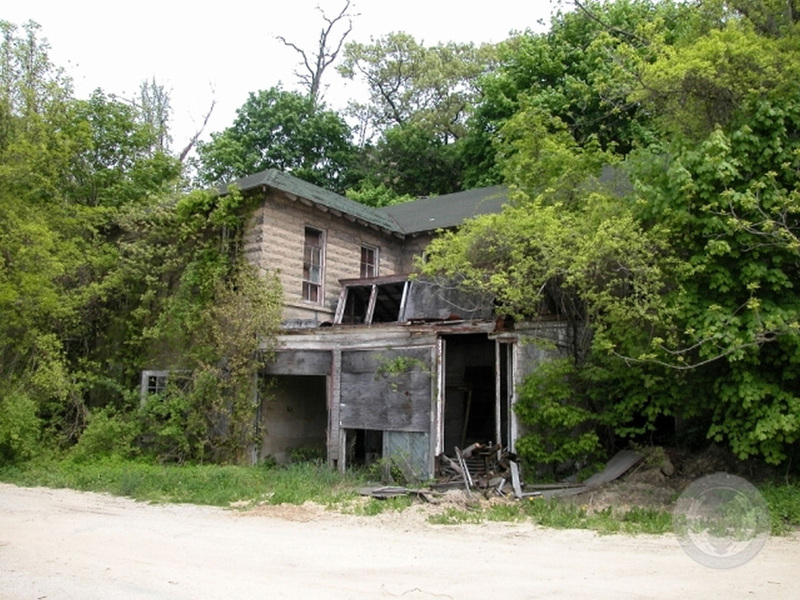 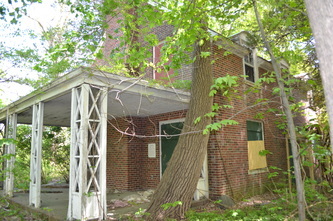 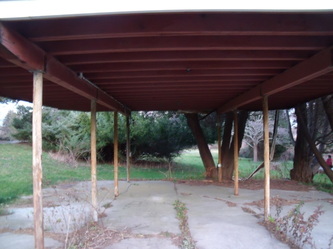 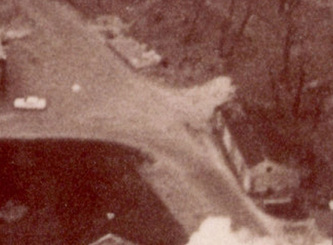 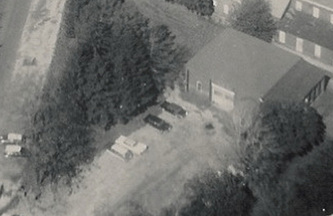 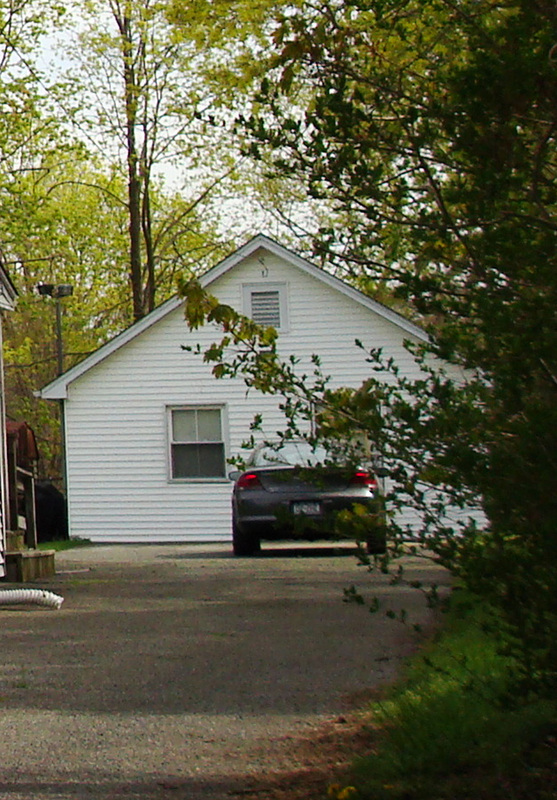 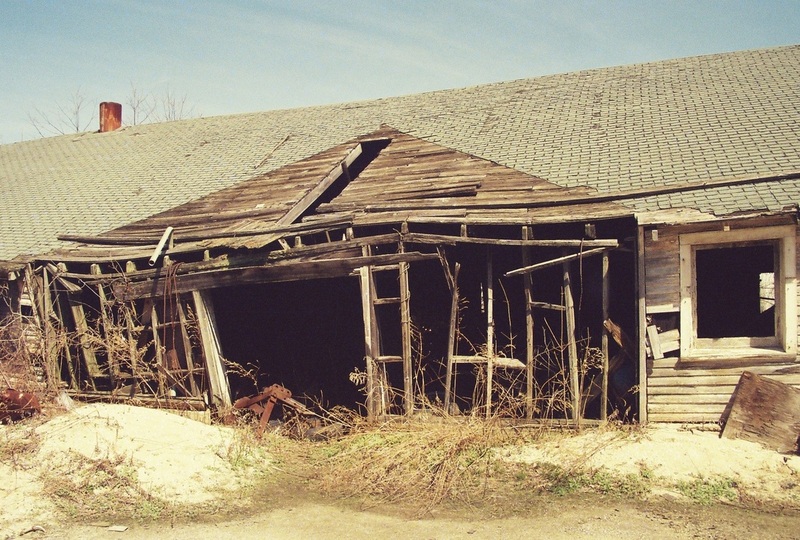 This is the garage for Building 74, which is still in use today as a residential garage for the very same house. It was built in 1938 & is located behind the main house. 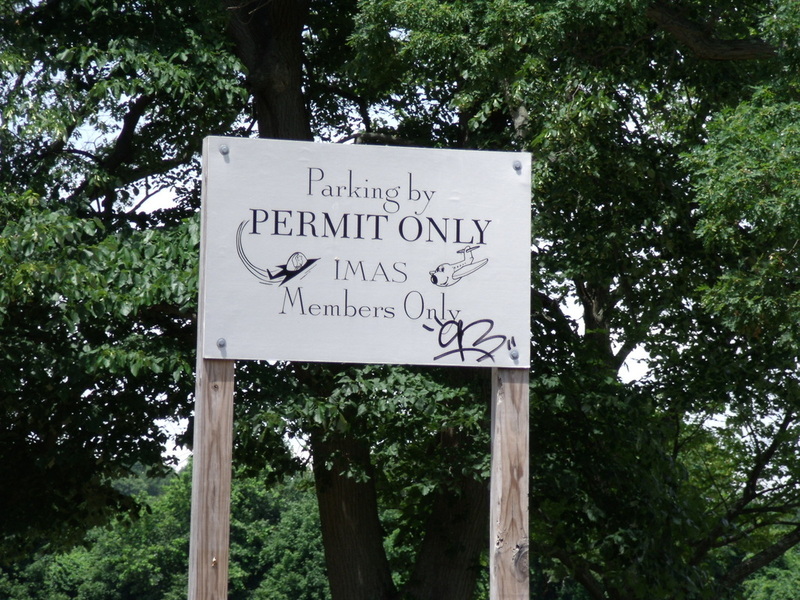 This sign was located near the former site of Cafe 56 on the main boulevard. 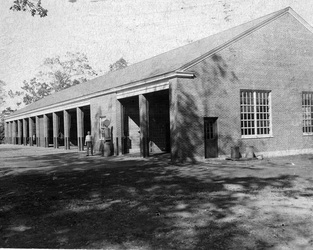 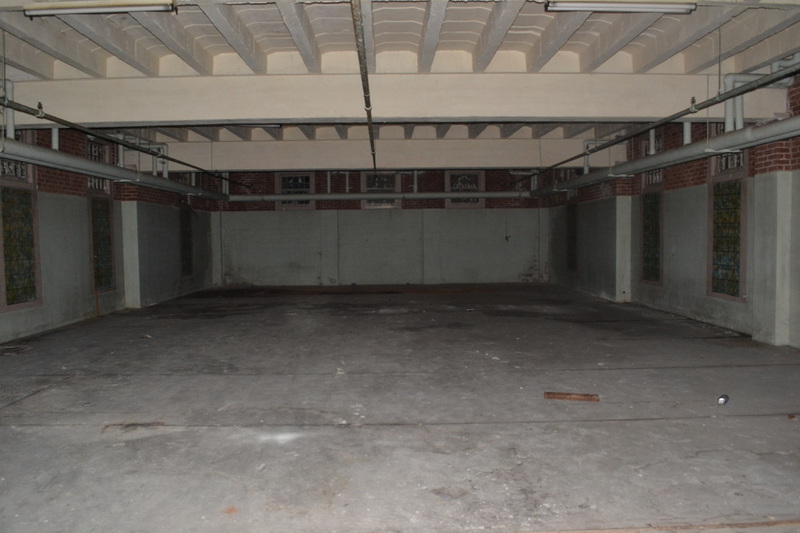 This was the garage used for Building 78, which was built in 1938. 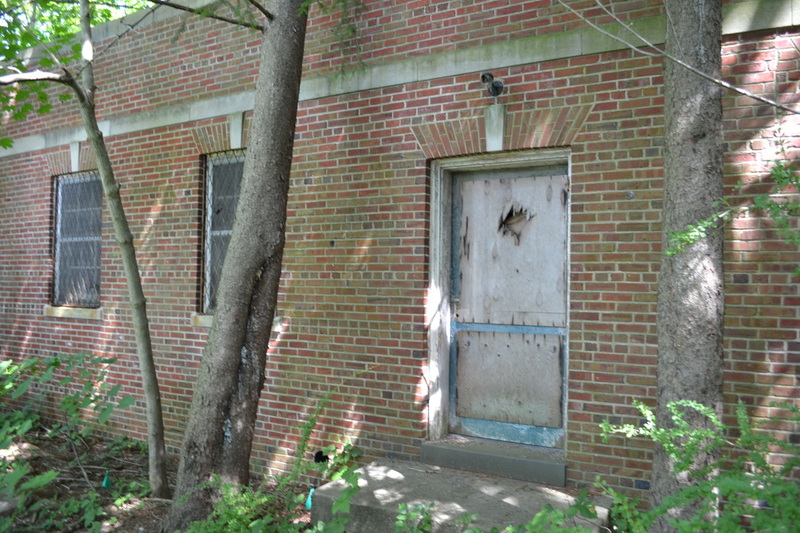 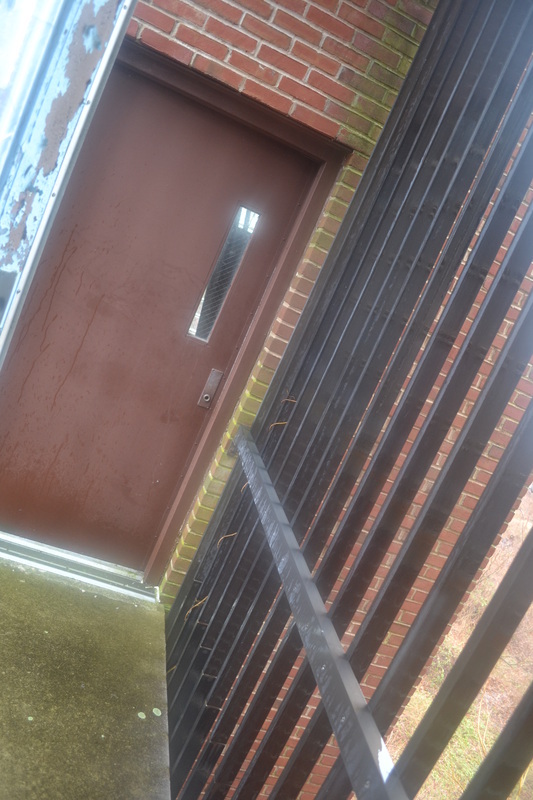 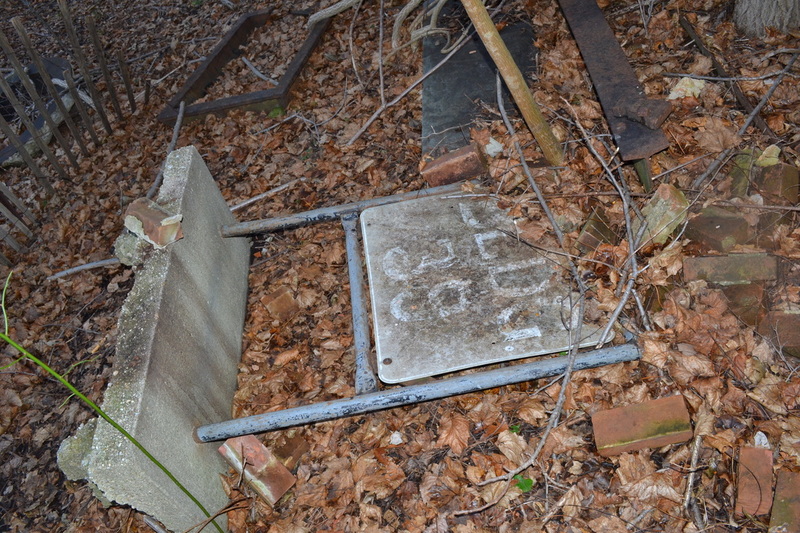 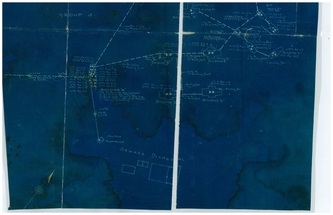 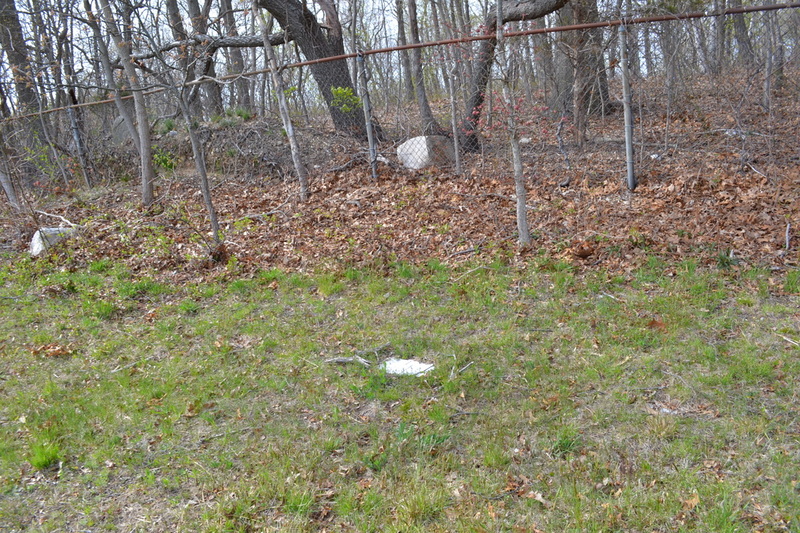 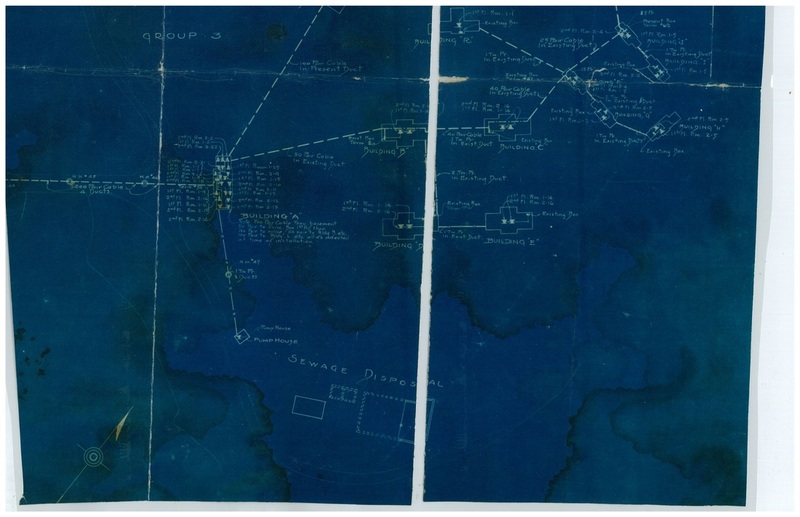 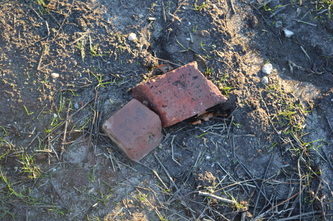 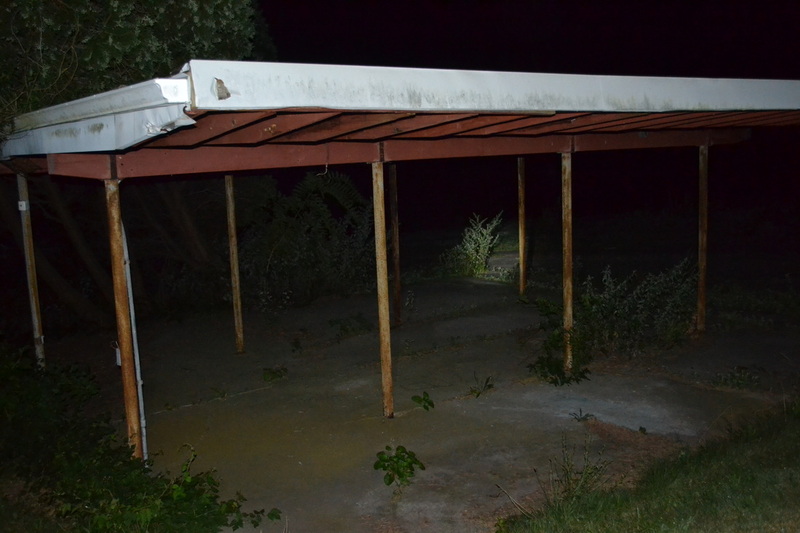 It was located behind Building 77, which was on Upper Dock Road not too far from the isolation building. 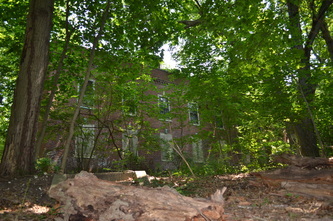 It still remains as a part of the privately owned residence, which was once Building 74. 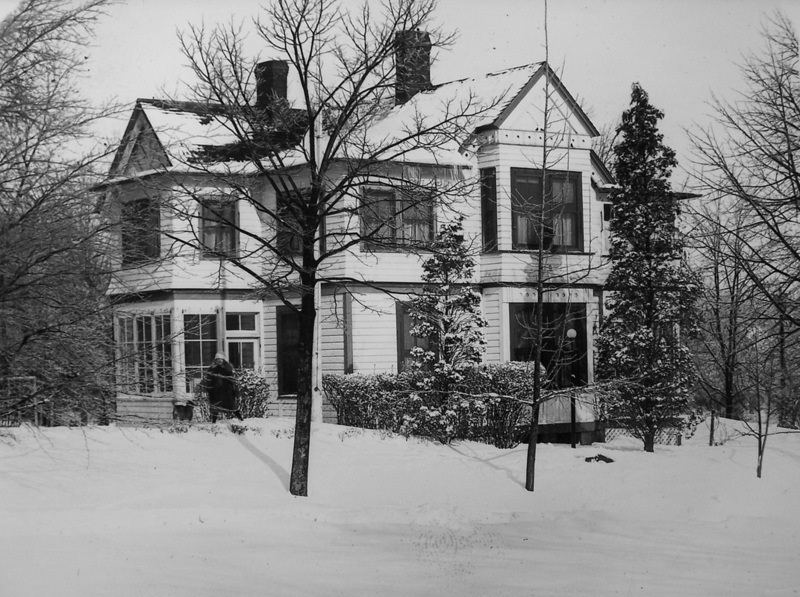 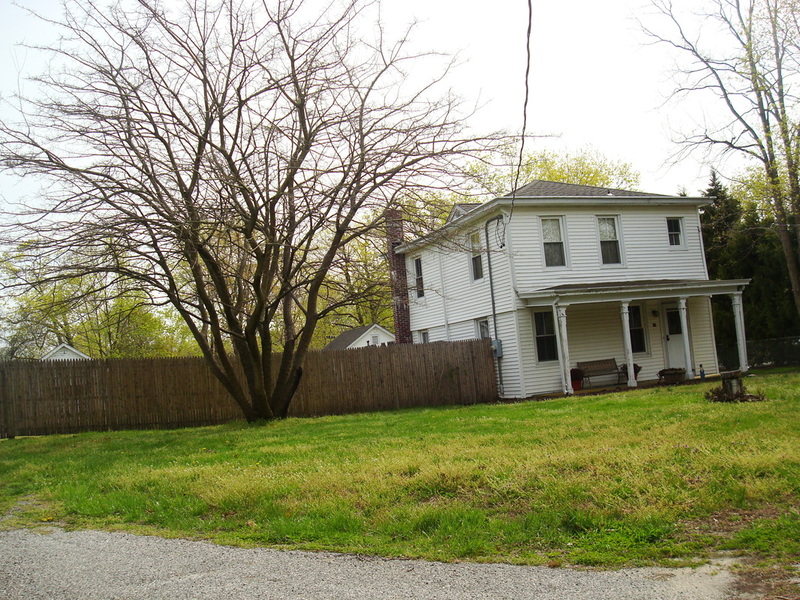 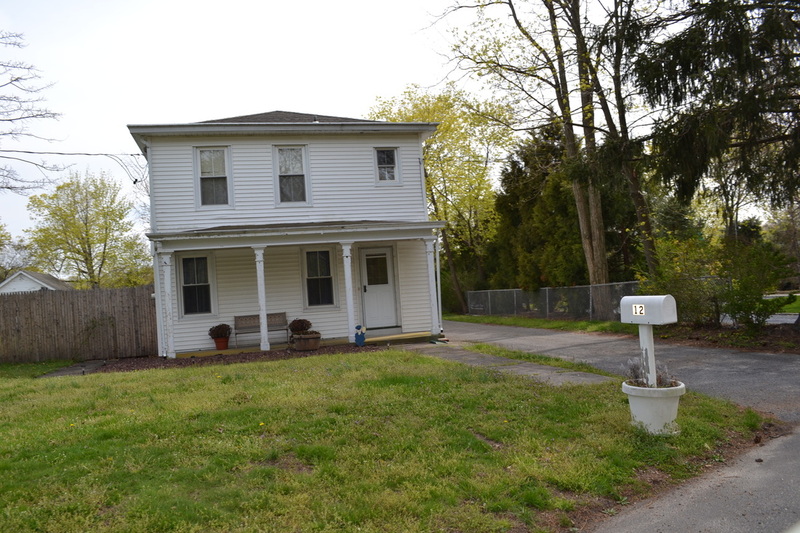 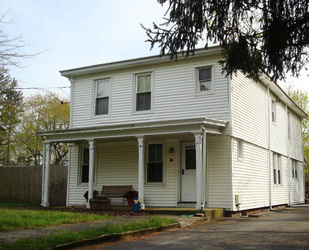 Built between 1890-1892 this 2-family house on Upper Dock Road served as home to the Master Mechanic of the hospital. 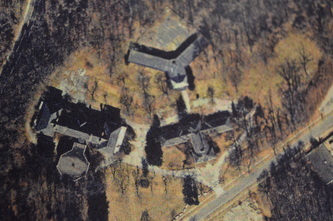 It was demolished during the 1990s. 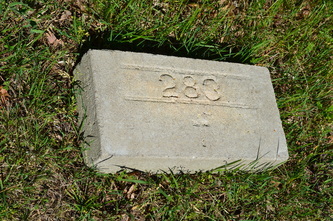 It was located between Buildings 74 & 78. 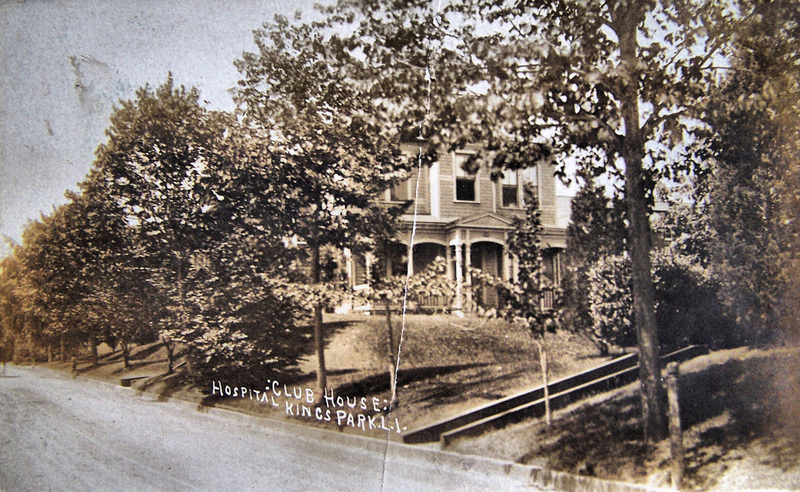 This 2-family house was built between 1890-1892 & was used by doctors of the hospital. 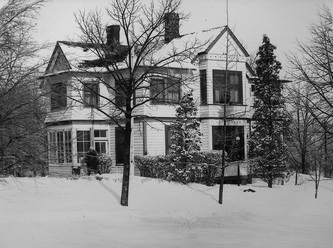 It received the nickname, "The White House" due to its color. 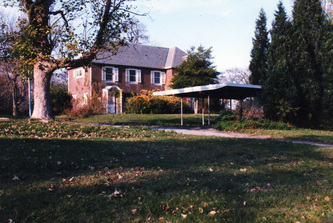 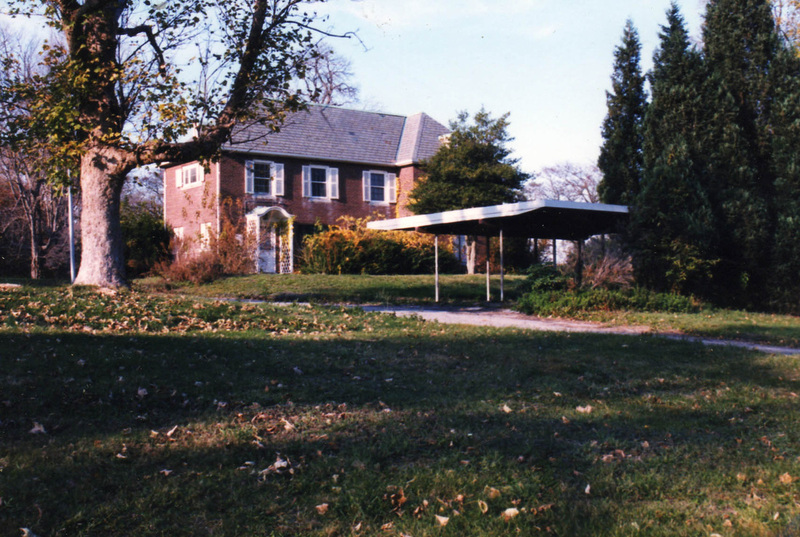 It was located next to Building 77 on Upper Dock Road, but was demolished during the 1990s. 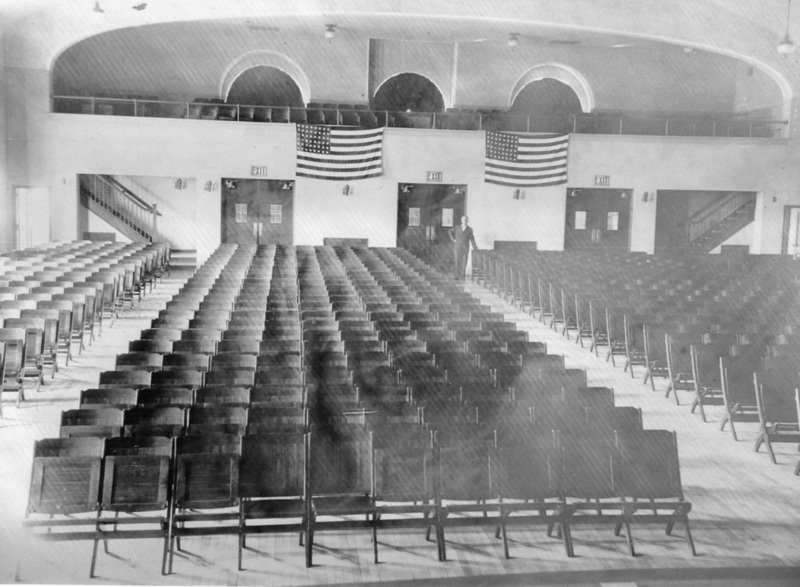 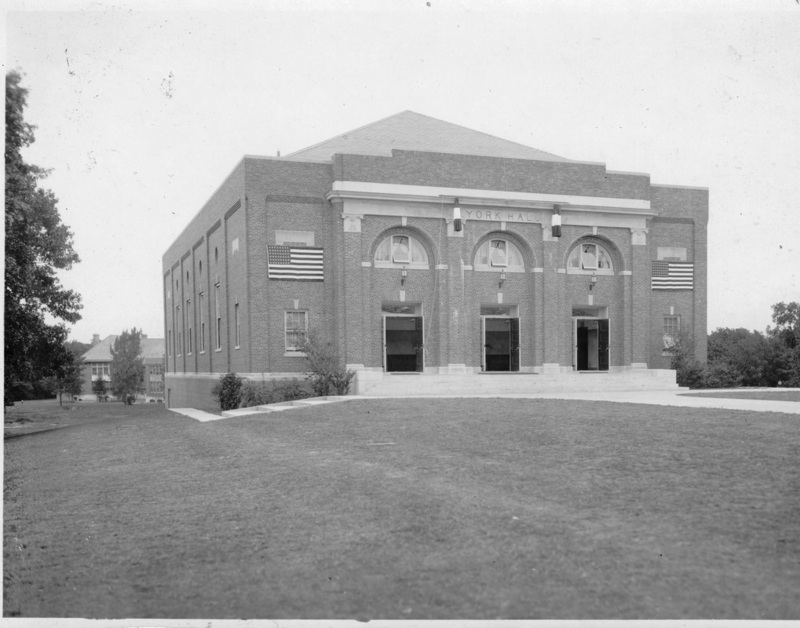 York Hall was built from 1928-1932. 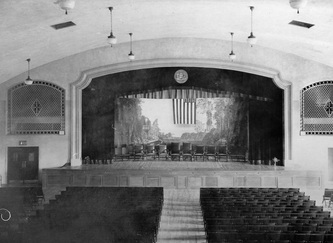 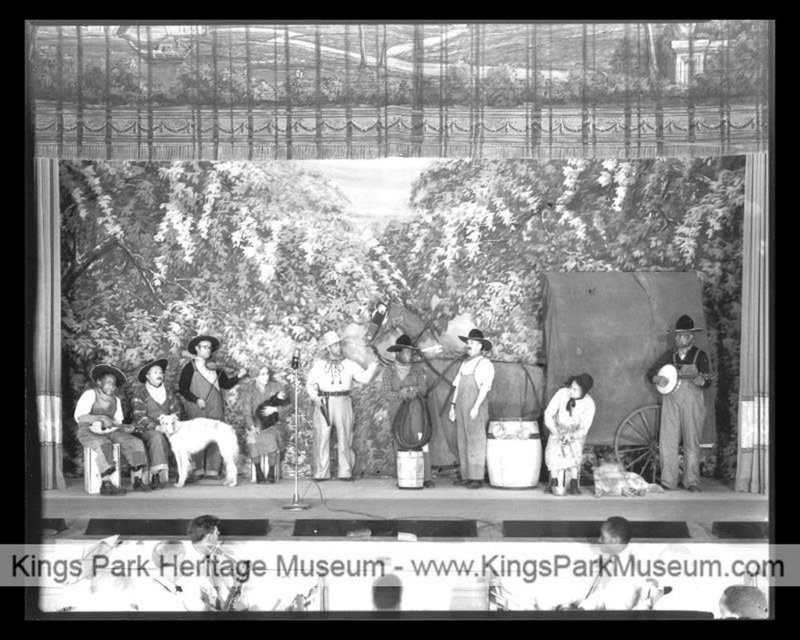 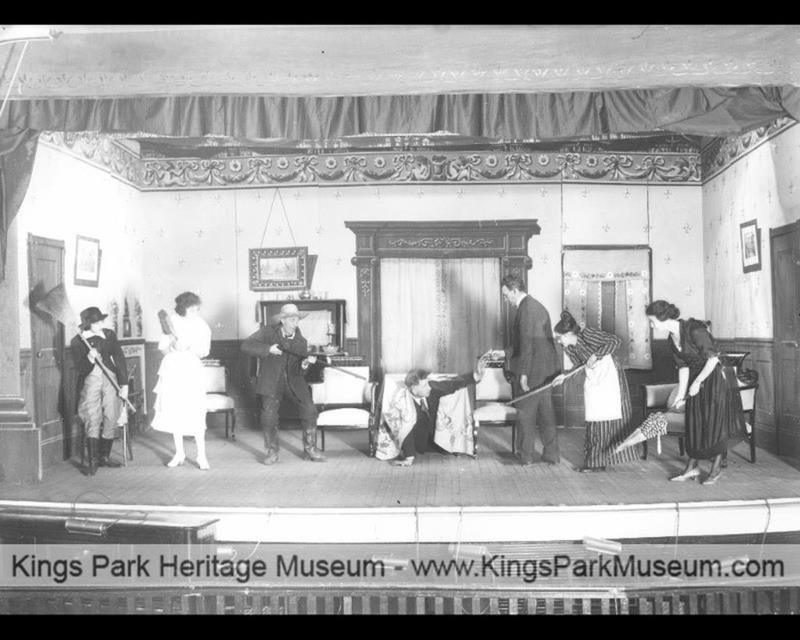 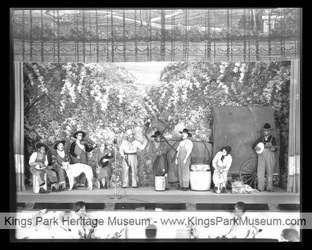 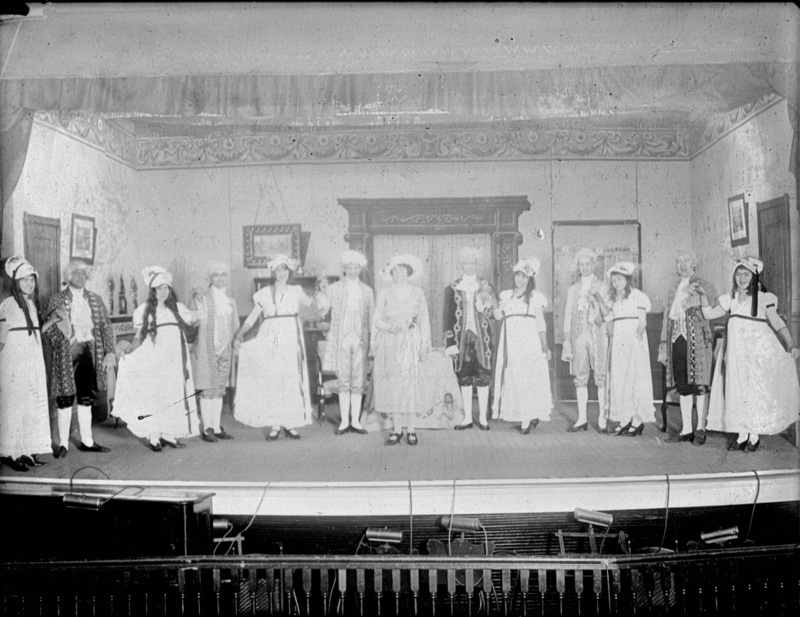 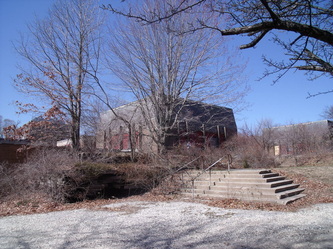 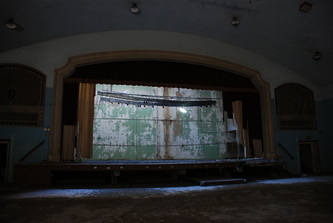 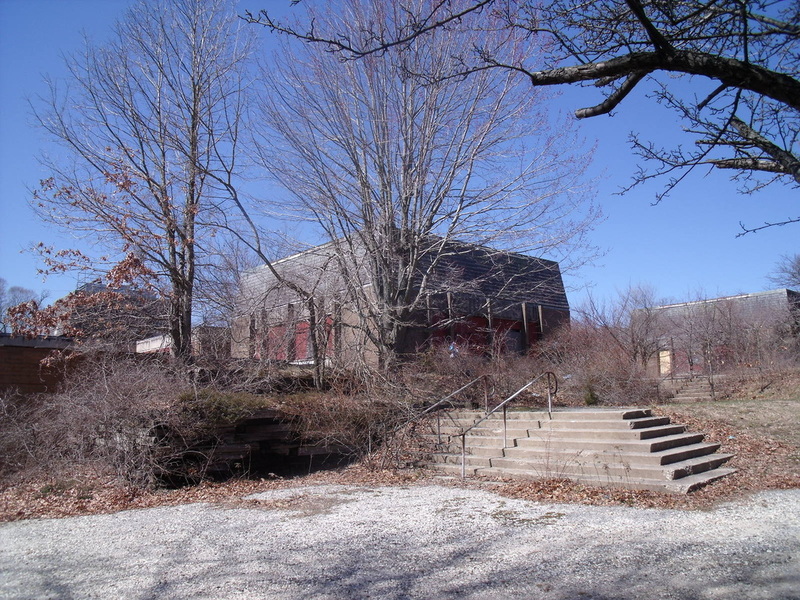 It was used as an assembly hall, where shows were performed. 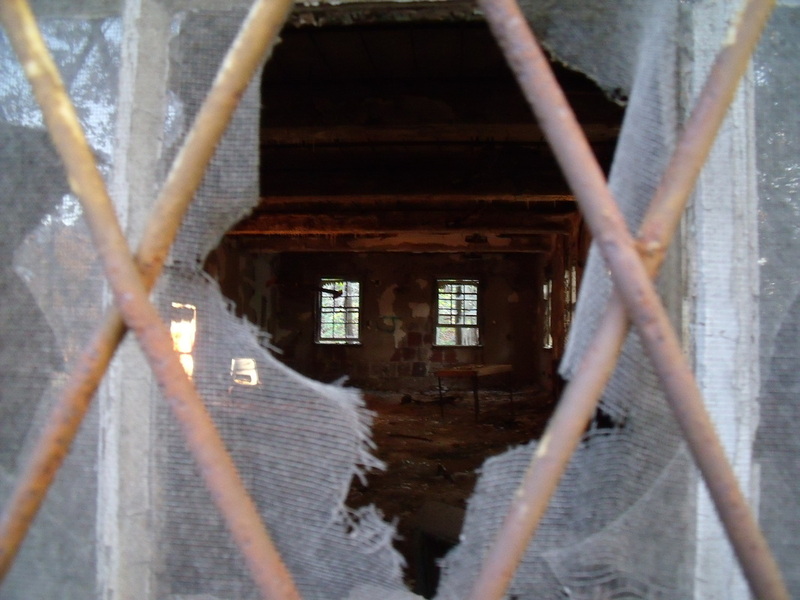 It also acted as a synagogue during religious Jewish ceremonies. 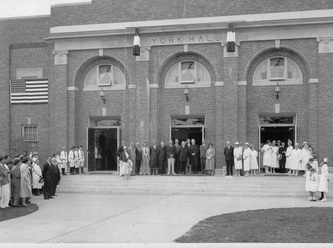 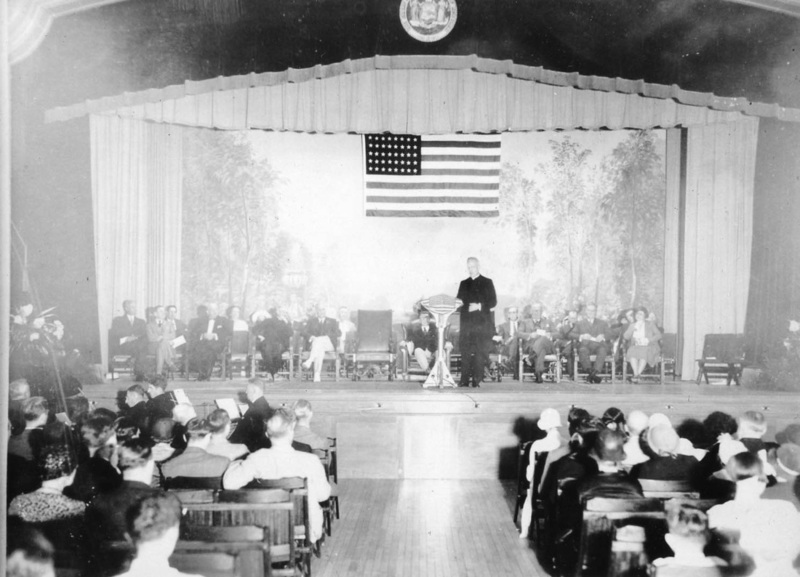 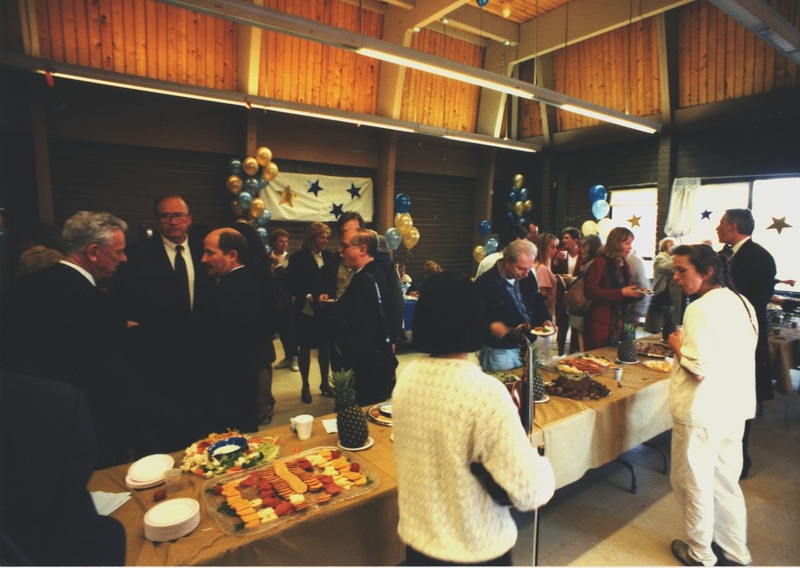 The hall was named after Reverend Monsignor John C. York, who served as a reverend at the hospital for 20 years. 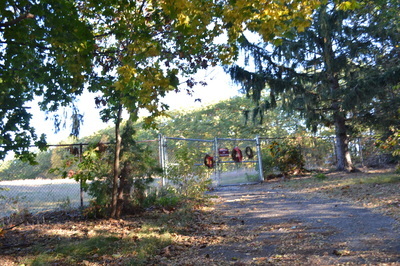 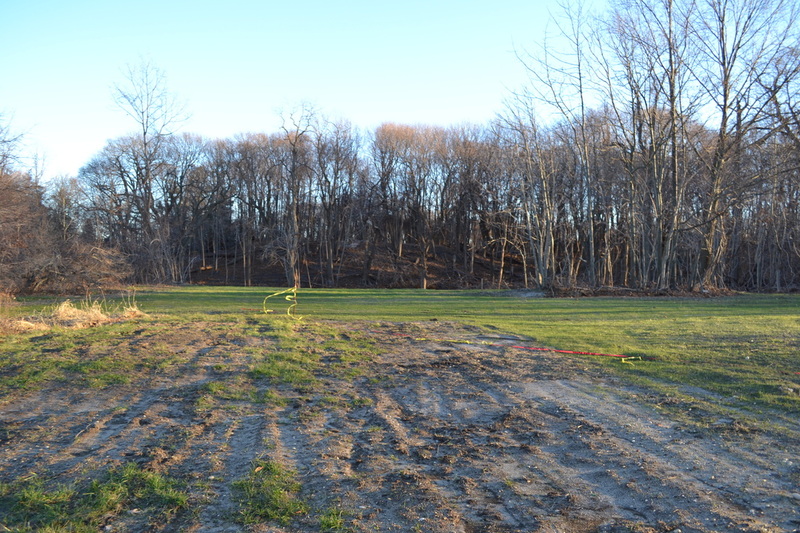 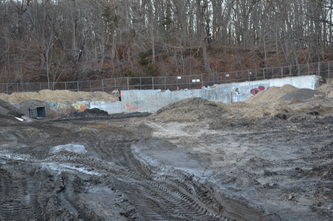 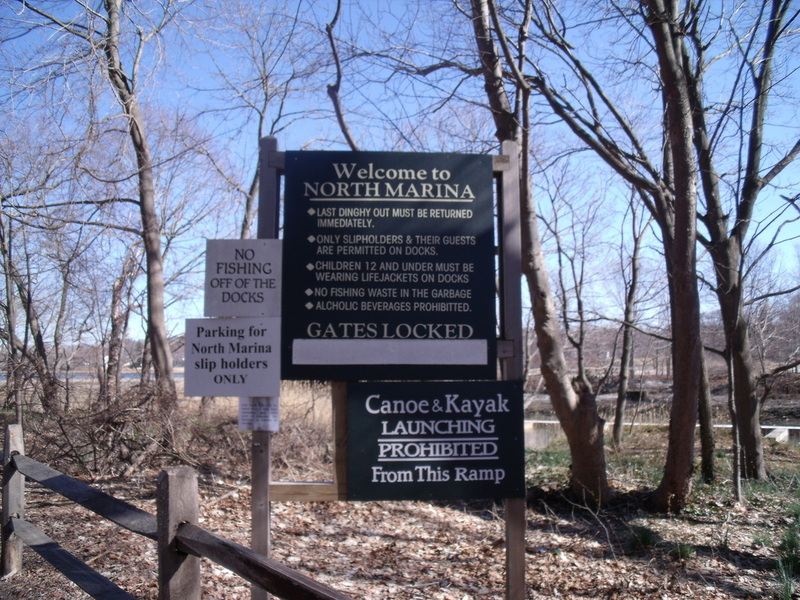 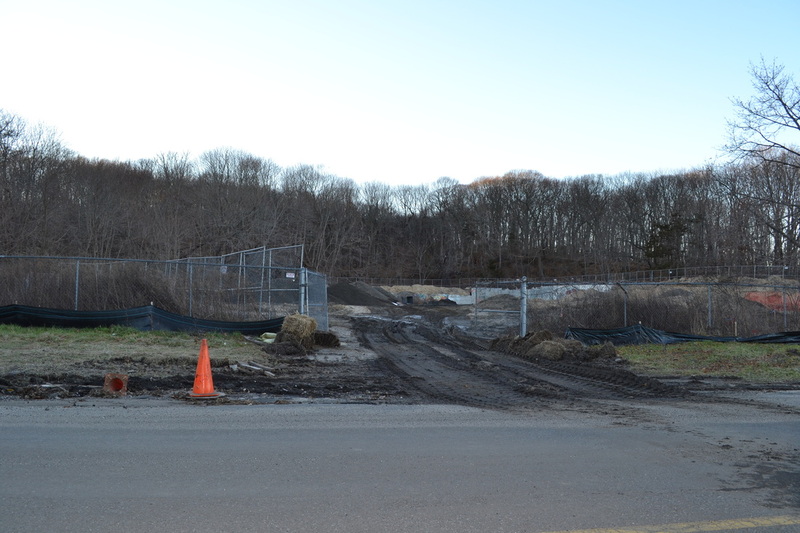 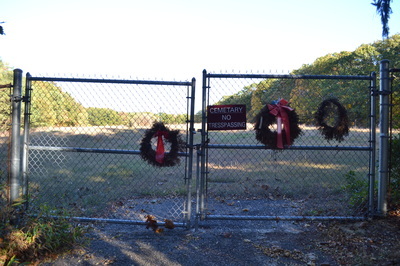 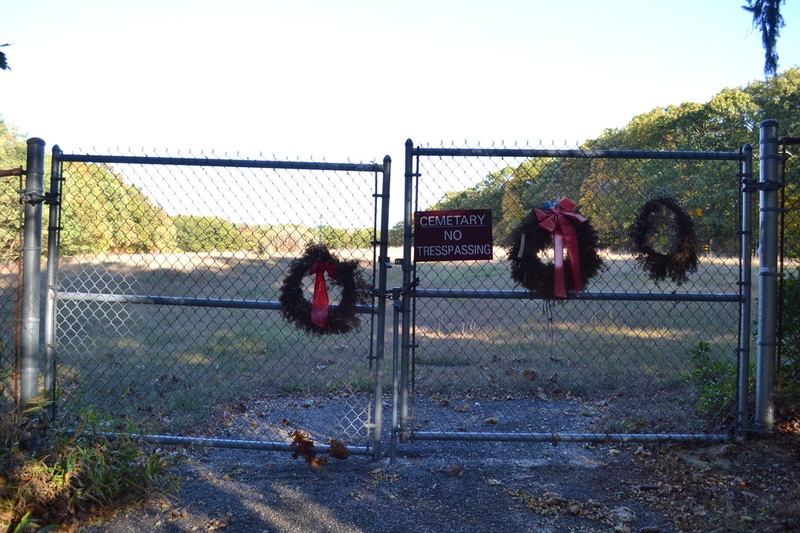 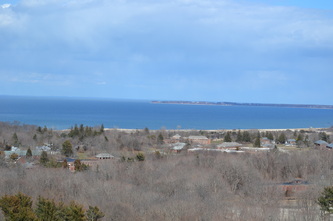 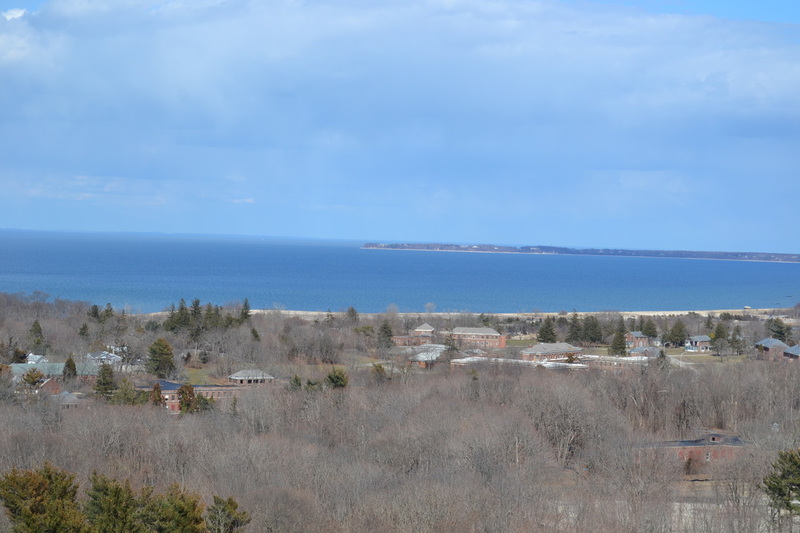 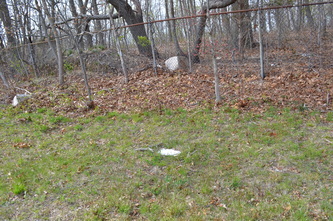 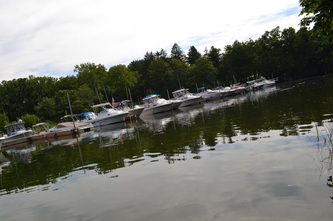 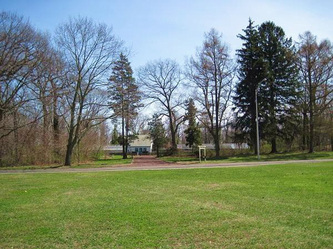 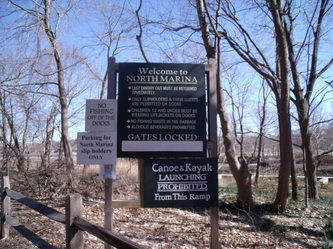 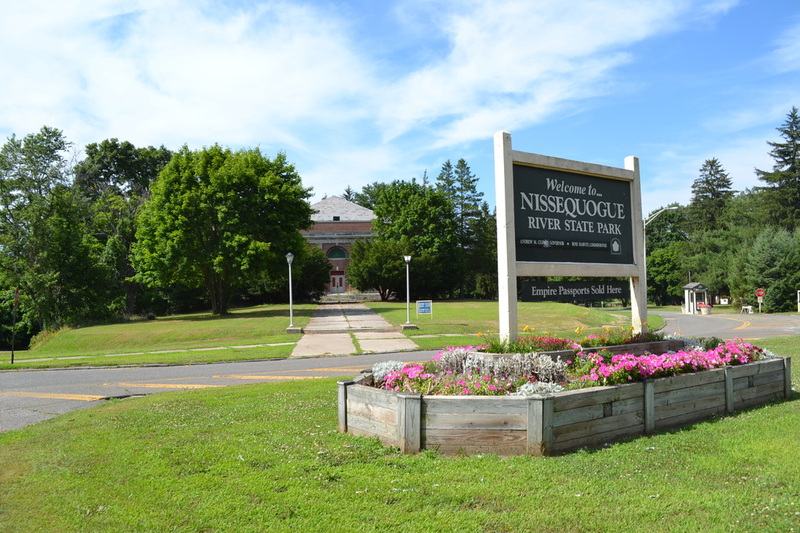 It is located where St. Johnland Road meets the main boulevard at the entrance to the Nissequogue River State Park. 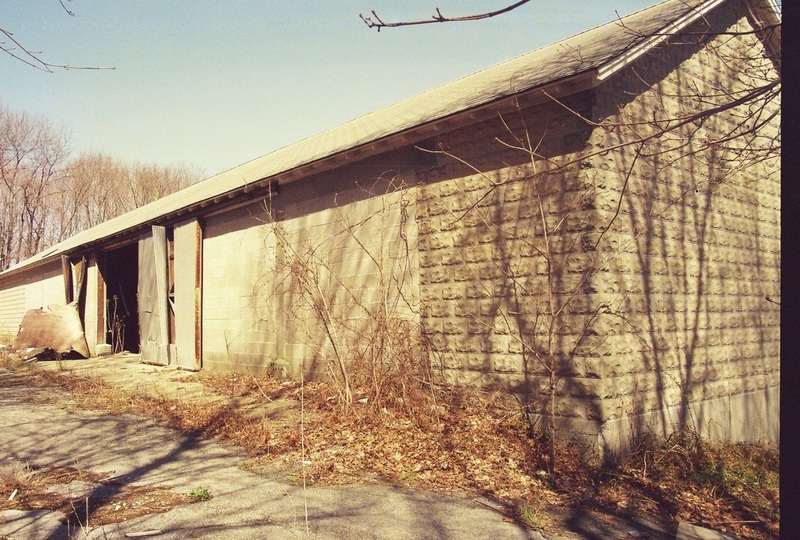 Built for the dairy farm between 1940-1941, this structure stood near Old Dock Road beside the dairy barn & slaughterhouse. It was removed between 1966-1967 leaving behind only a part of its foundation. This building was built between 1928-1930 & was used as the morgue. 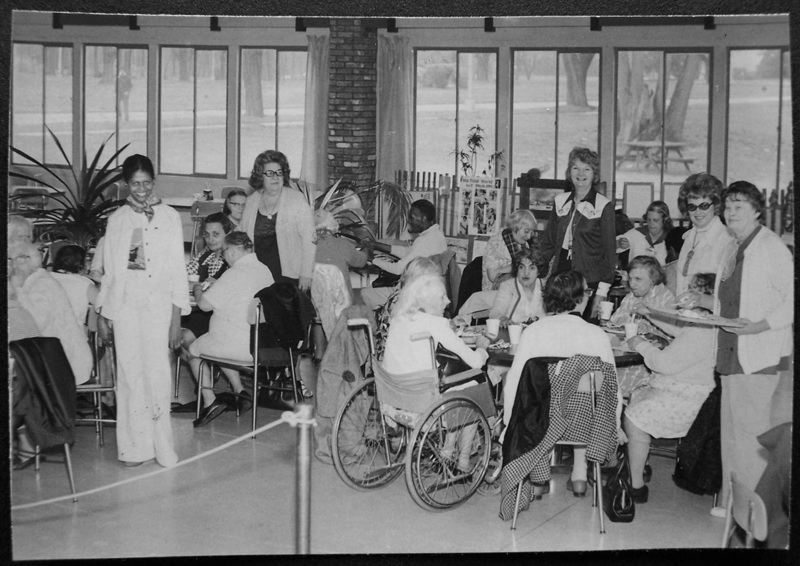 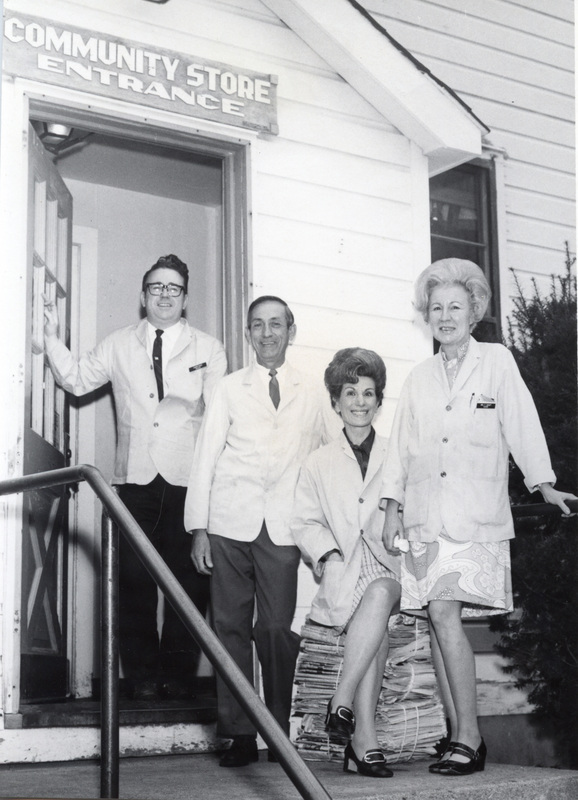 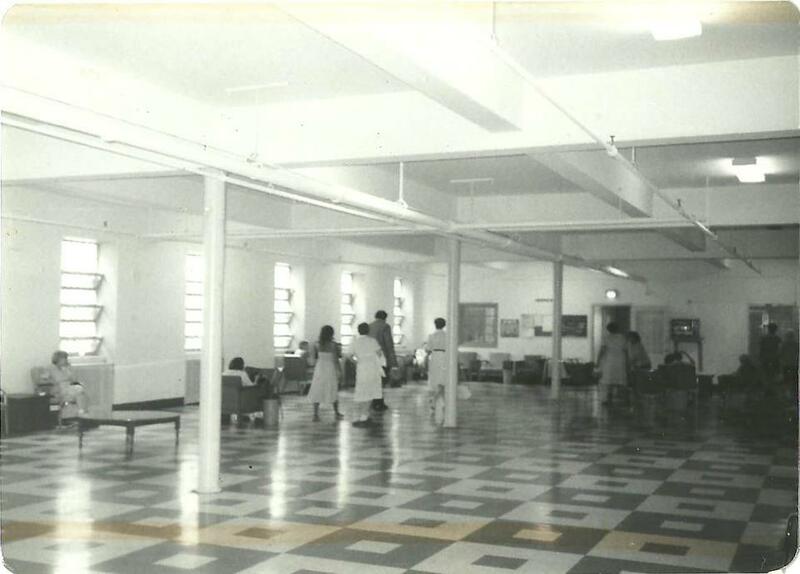 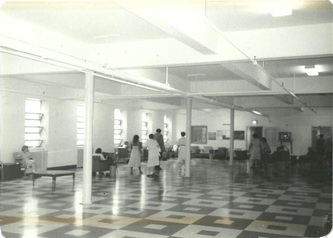 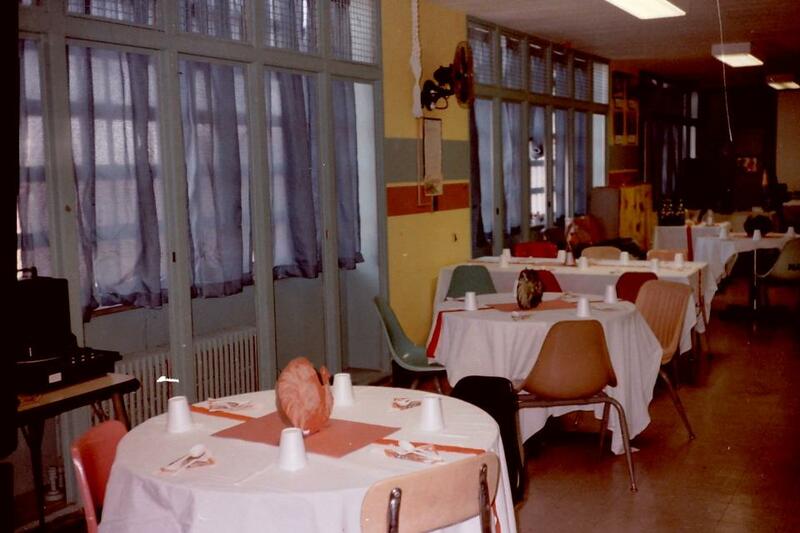 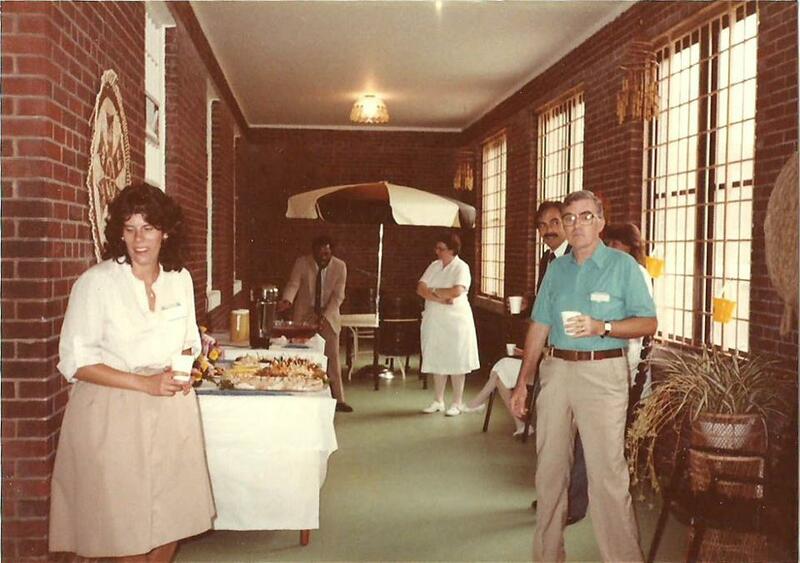 It was converted in 1966 into a lounge for the nurses. 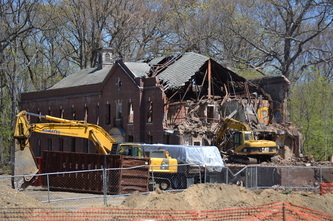 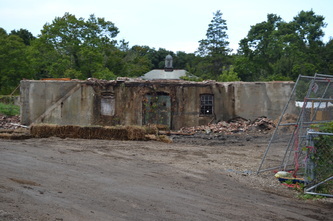 In the summer of 2012 it was one of the first buildings to be demolished, as a part of a demolition phase. 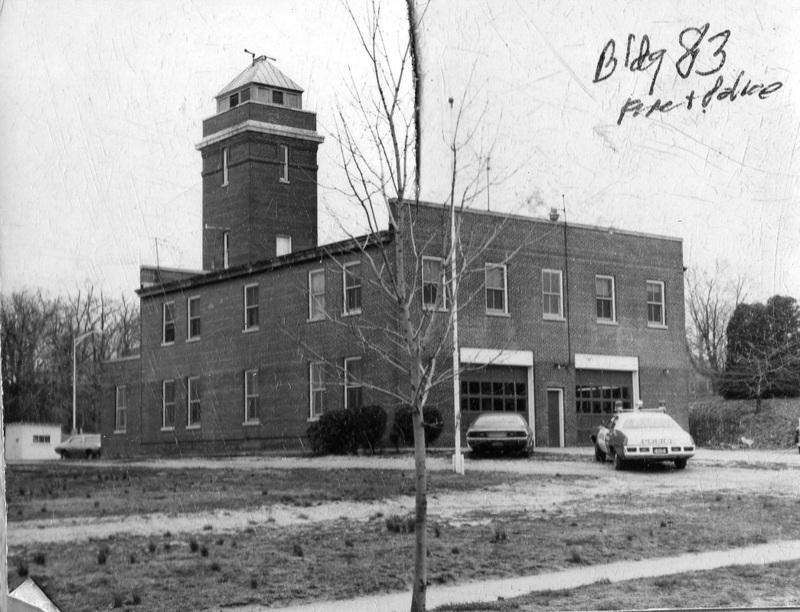 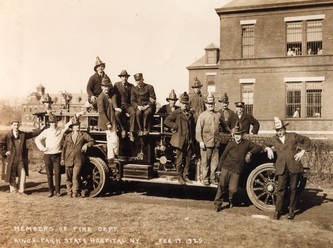 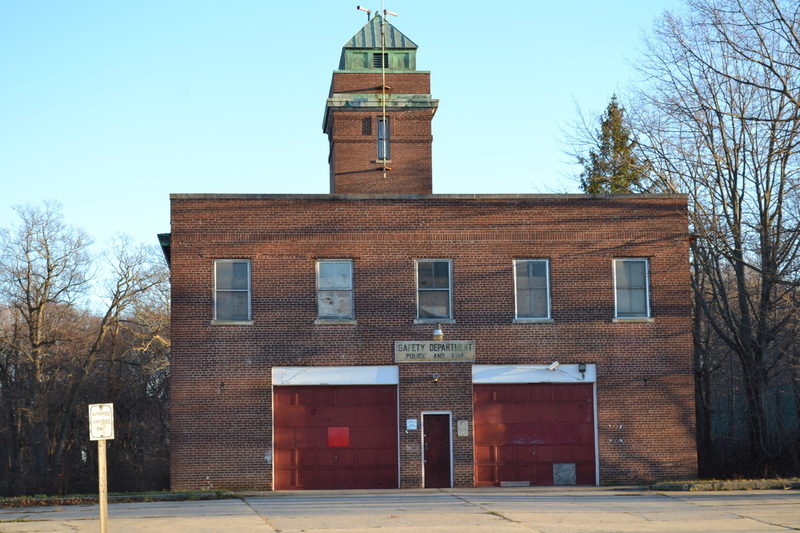 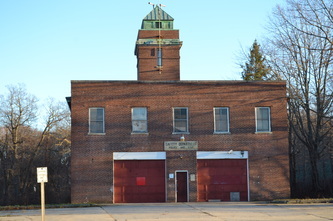 Built between 1924-1925 this was the firehouse & safety department, where hospital volunteers would work & reside. 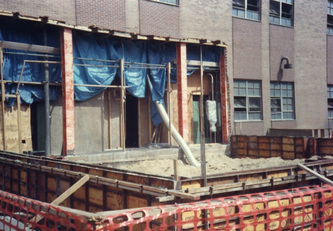 It replaced an old wooden garage that stood on the same site across from Building 15. 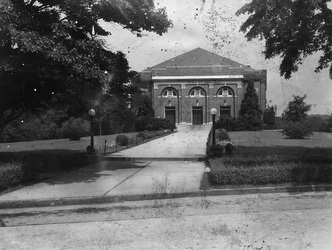 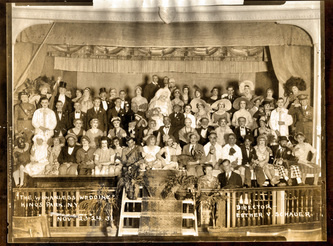 There are no photos available of that structure, as most of the early photos start from 1924. This was a boiler house with twin smokestacks built for the second power plant in 1924. 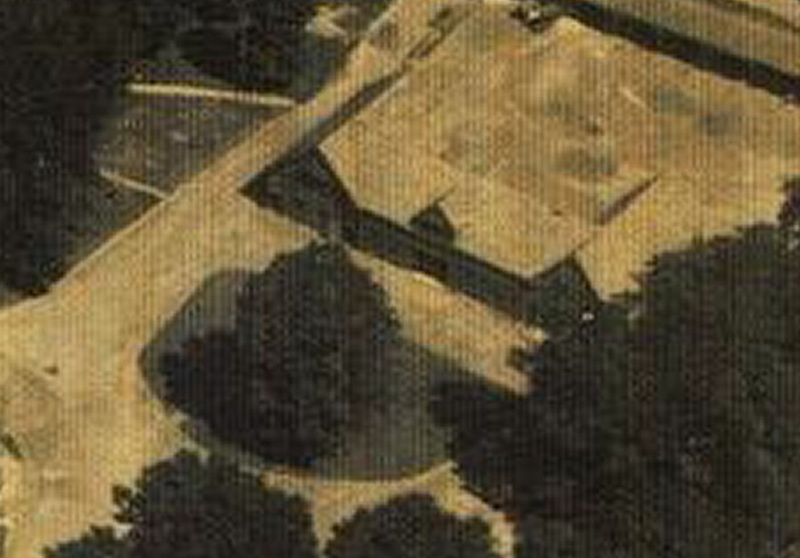 It was demolished in 1968 & the building number was reused for the 6 well houses that surround that same area.